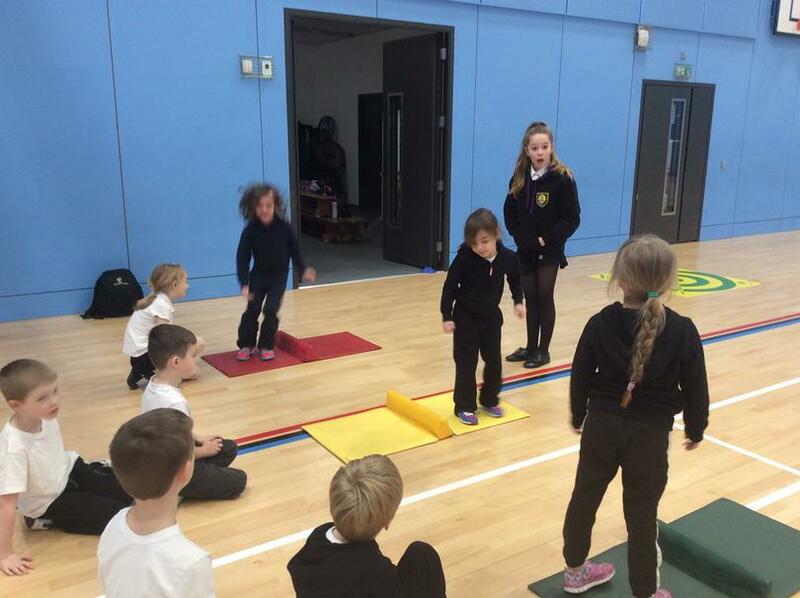 We aim to promote a Healthy Active Lifestyle by providing the children with a fun, stimulating and inclusive Physical Education. 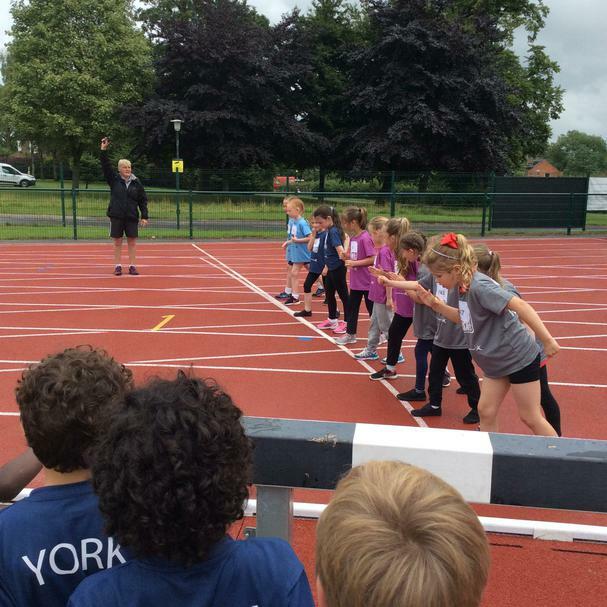 Our school will motivate children to participate enthusiastically and take pride in both their and others achievements whilst engaging in a range of School Sports and Skills. 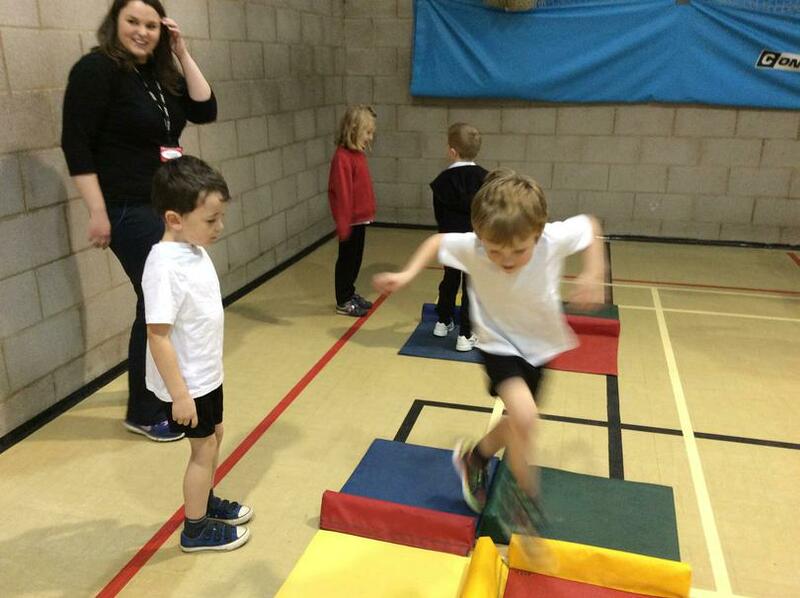 In this way, all children will aim high to reach their full potential and gain a ‘Flying Start’ at Saltergate Infant School. 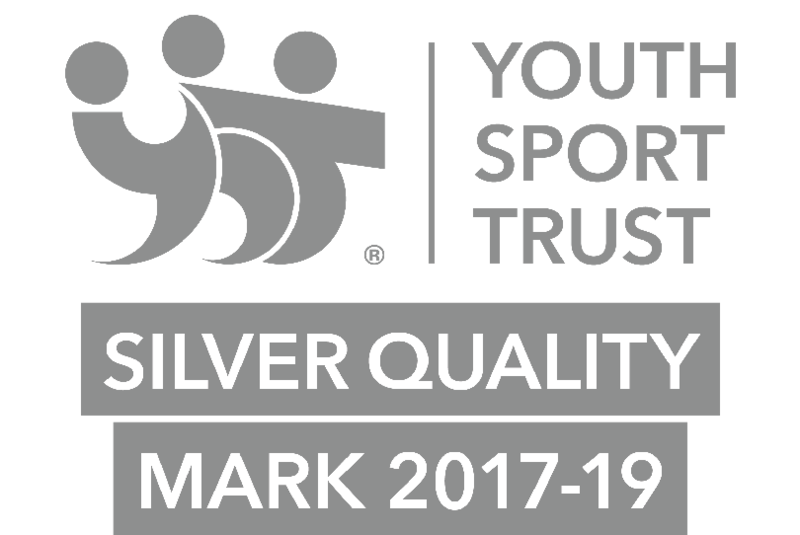 This is where you will find all of our information about the difference that the government’s sports funding has made to our children. 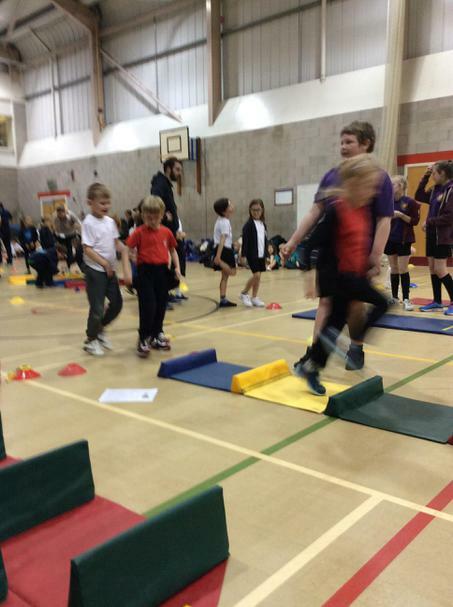 The information will be updated as we see the great effects of the sporting activities. 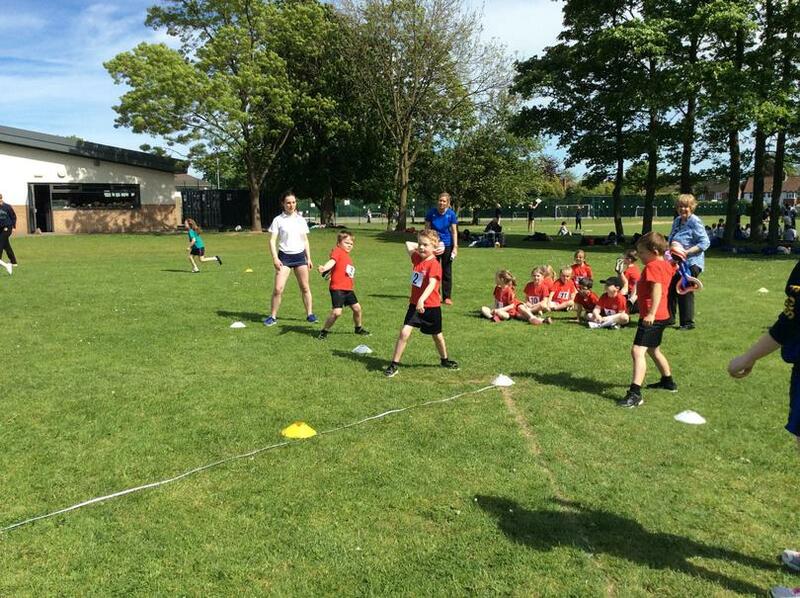 The top team from the feeder rounds progressed to the Harrogate finals held at Harrogate High School as part of the Harrogate Schools Sports Partnership. 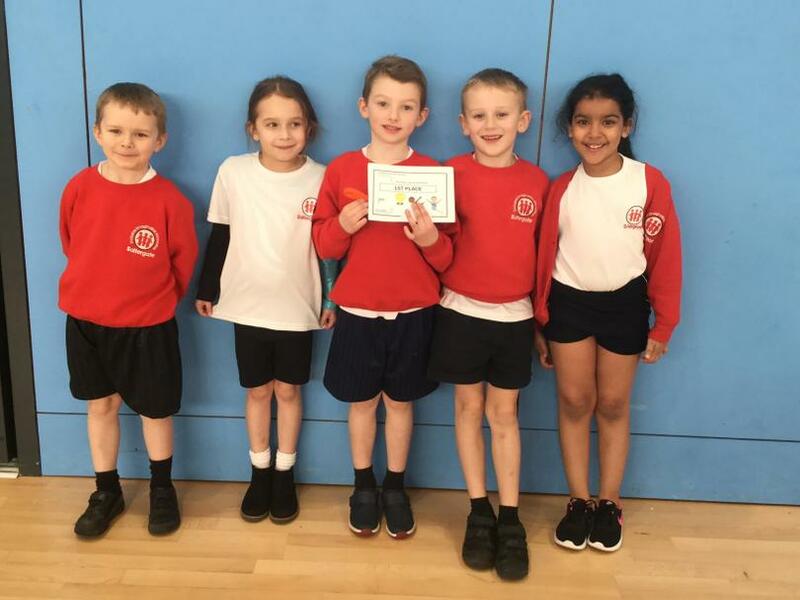 The children had honed their skills with extra practice to achieve outstanding performances resulting in the team winning the Harrogate finals. 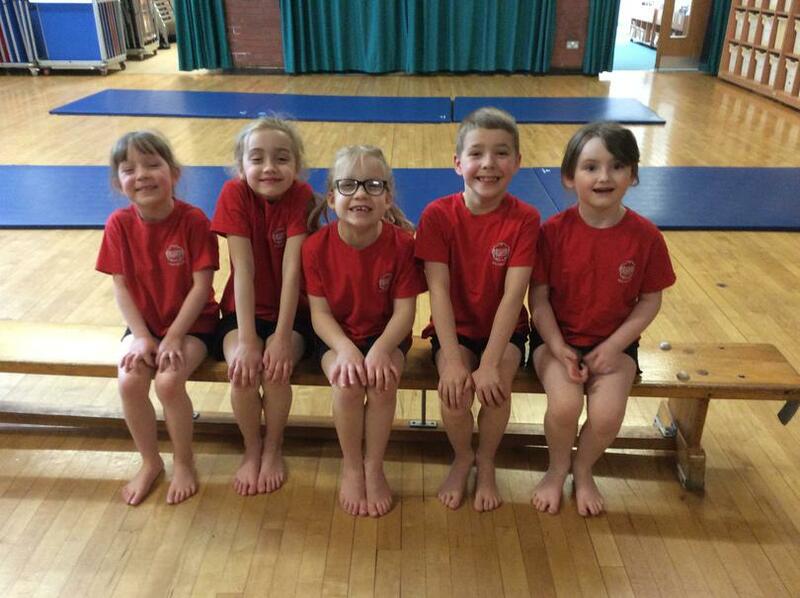 This means they are the best team throughout the Harrogate area. 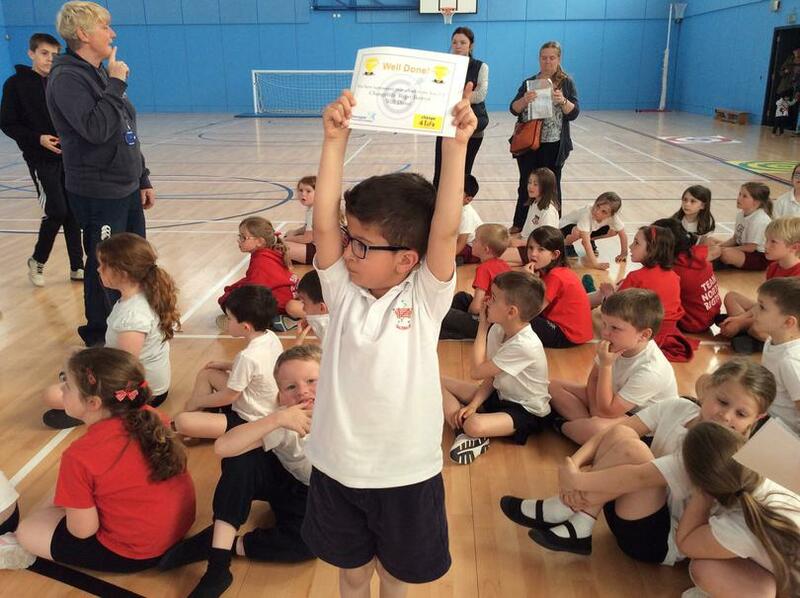 Well done to all the children, we are very proud of you. 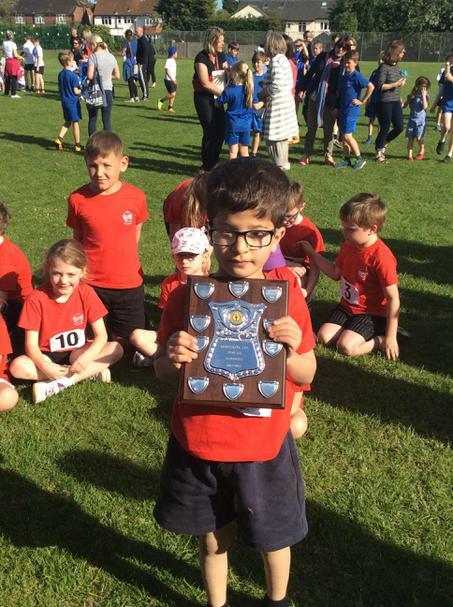 We look forward to receiving the trophy. 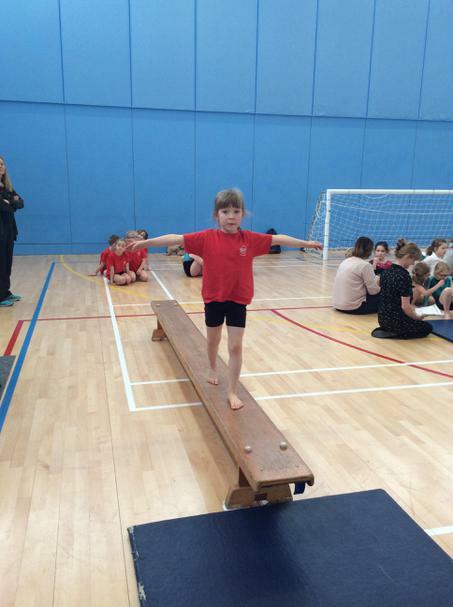 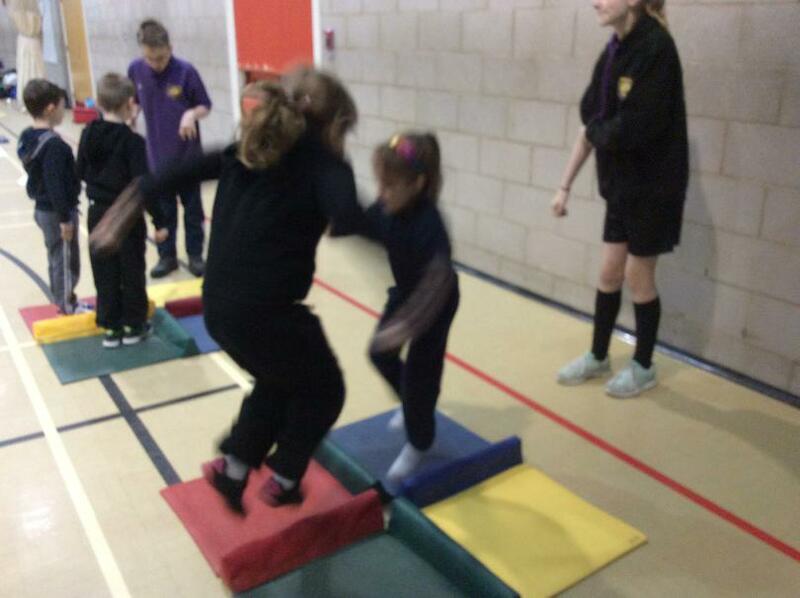 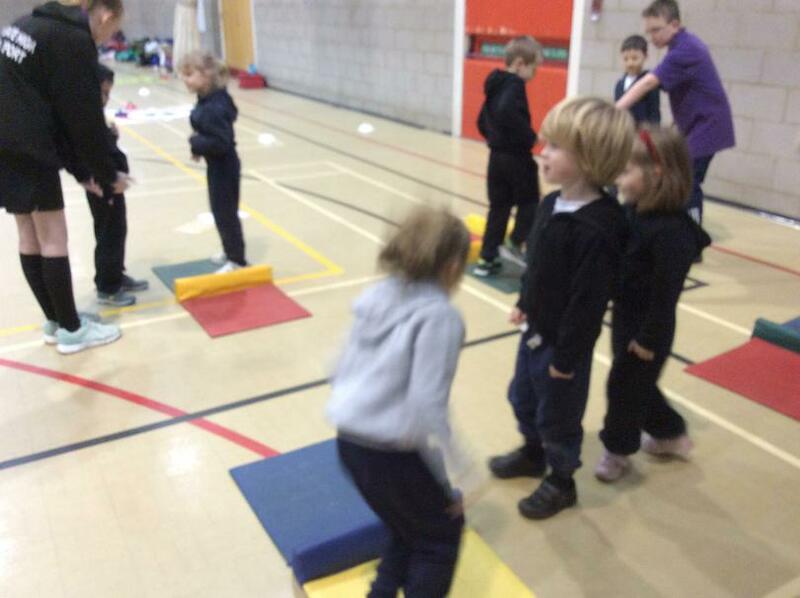 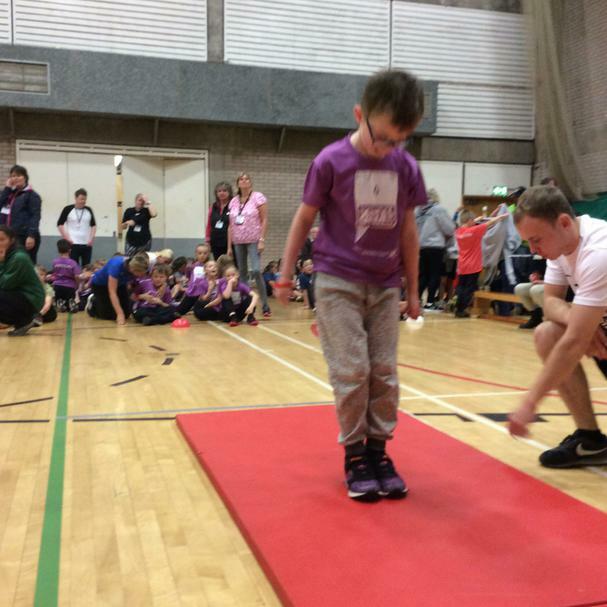 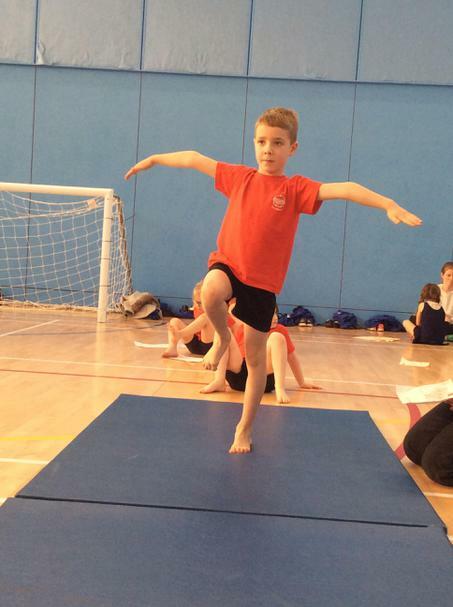 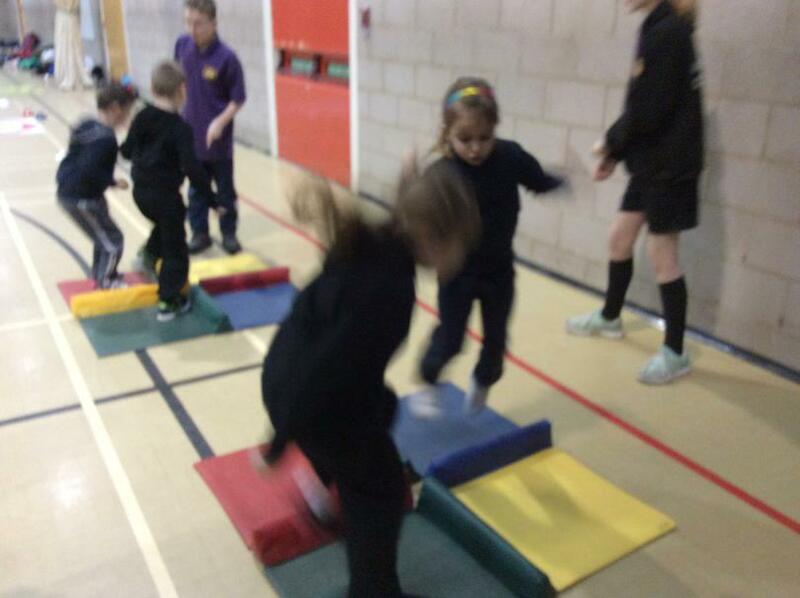 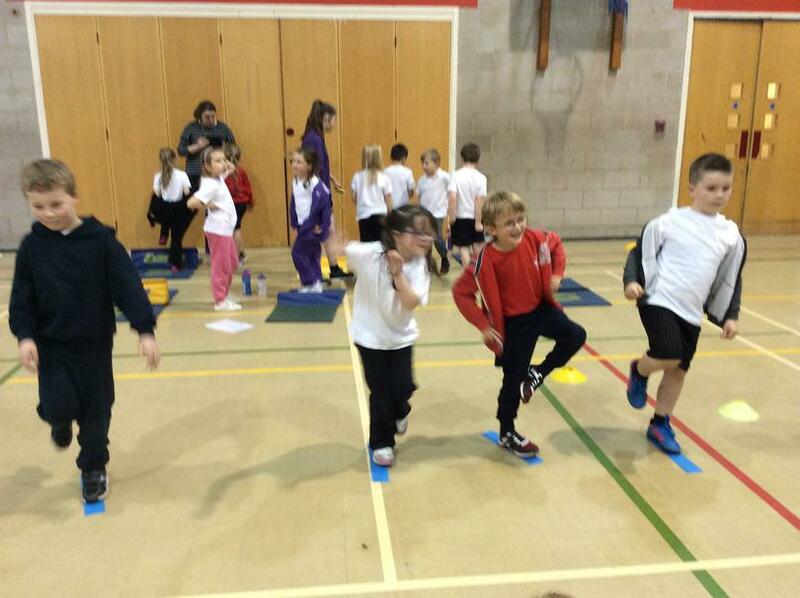 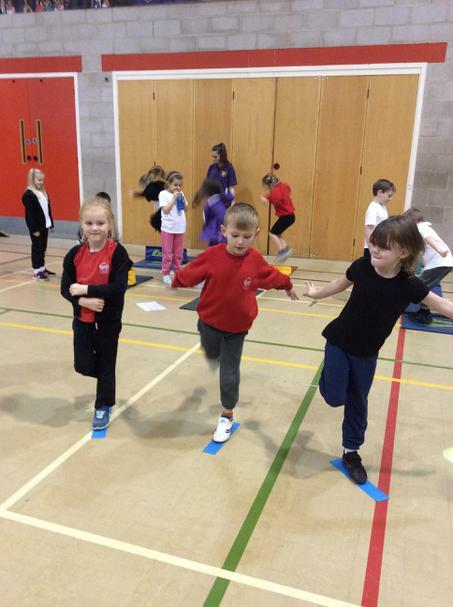 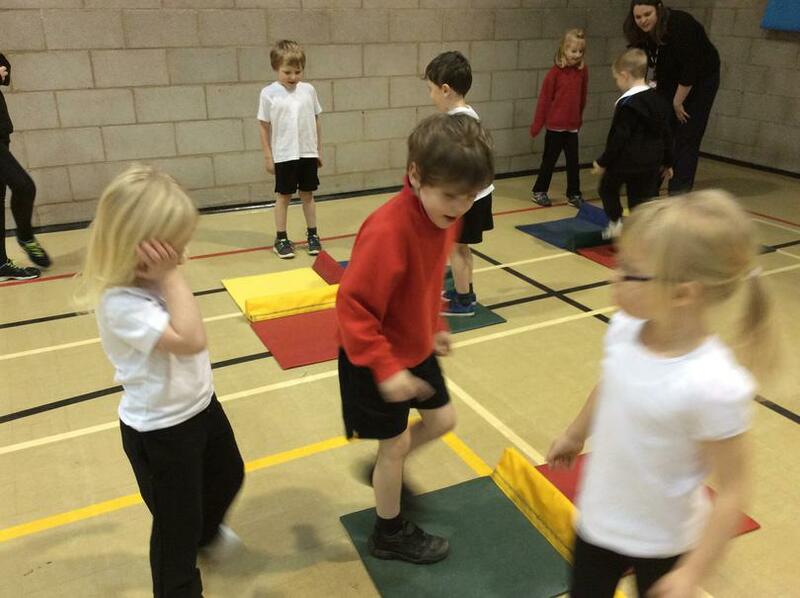 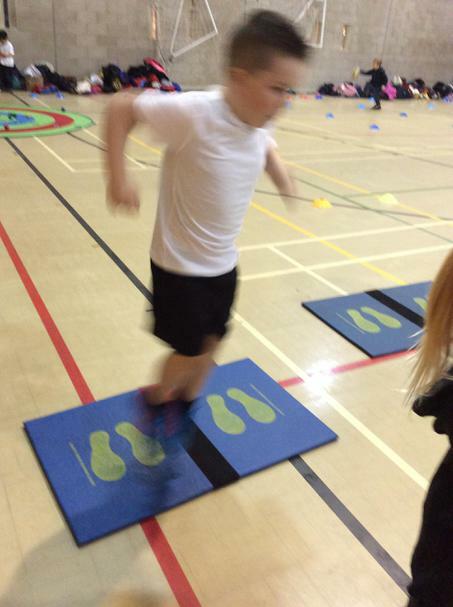 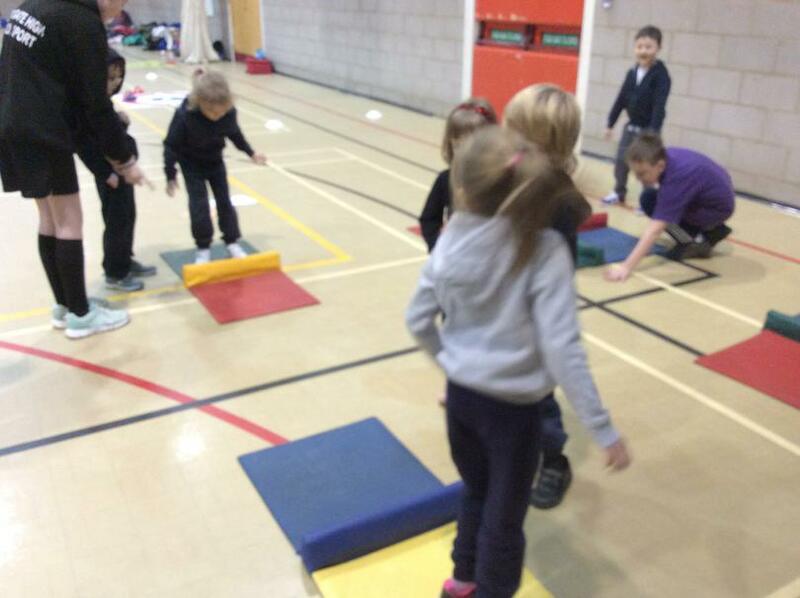 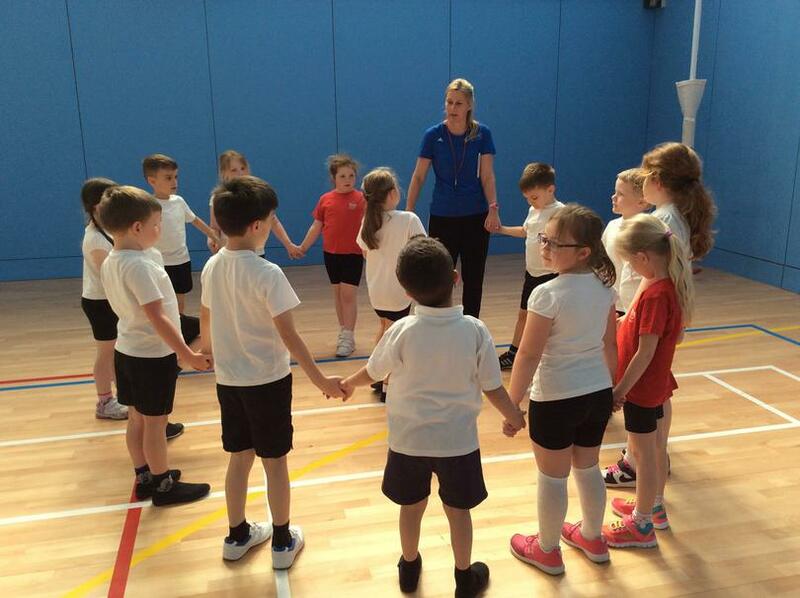 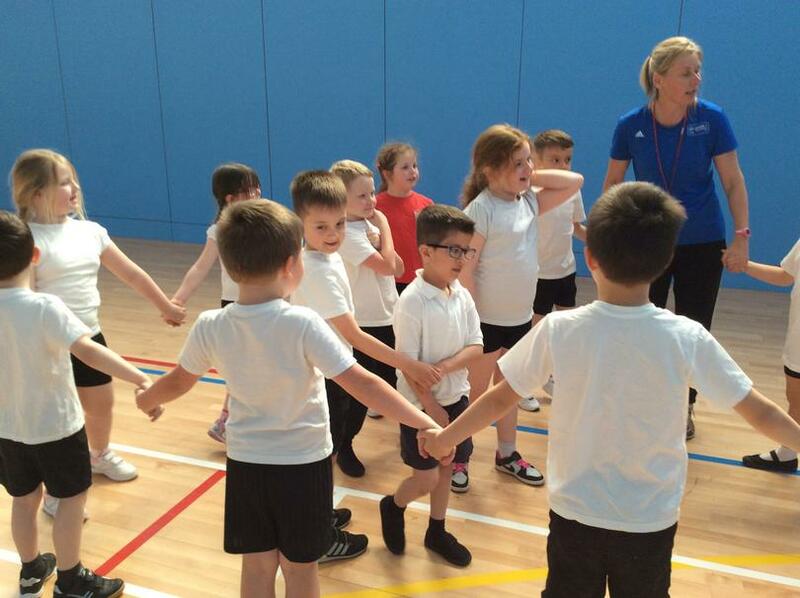 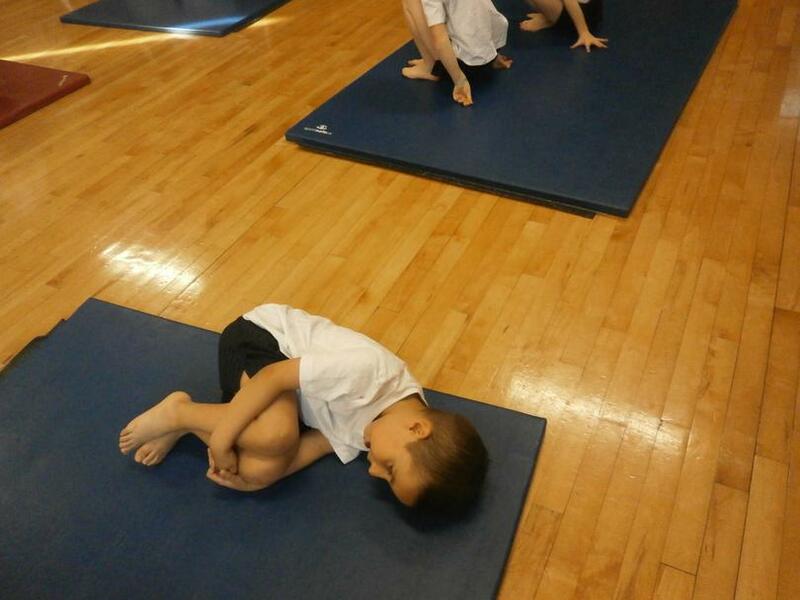 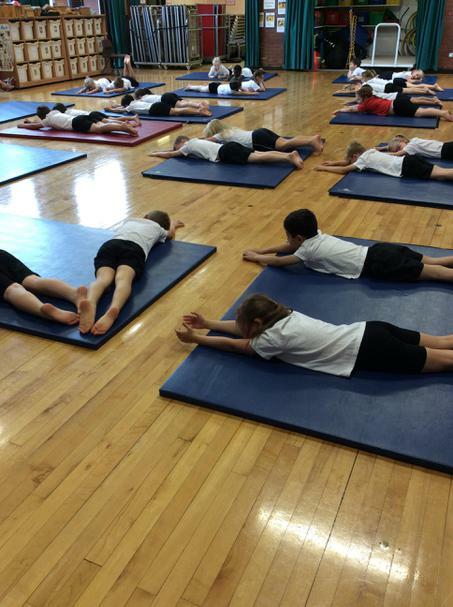 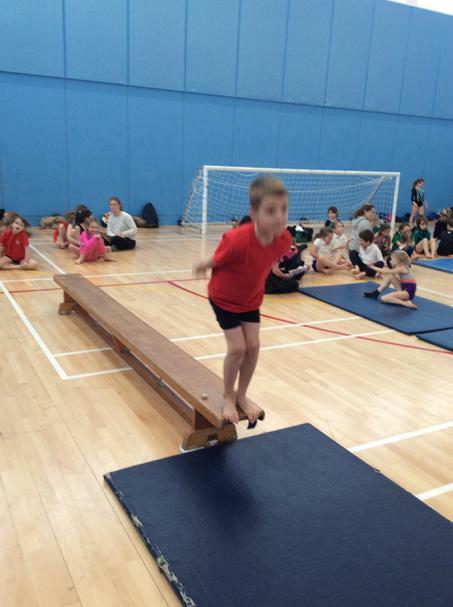 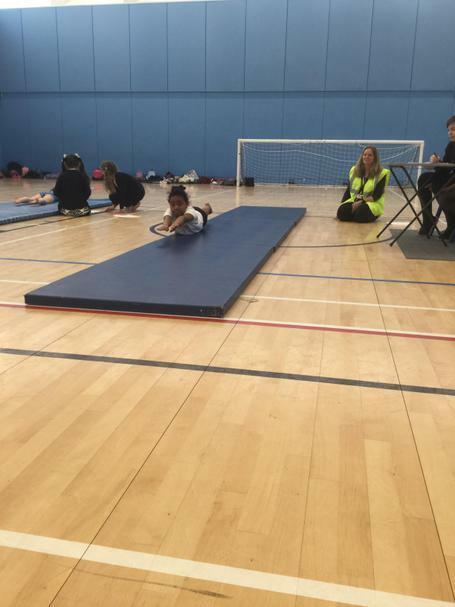 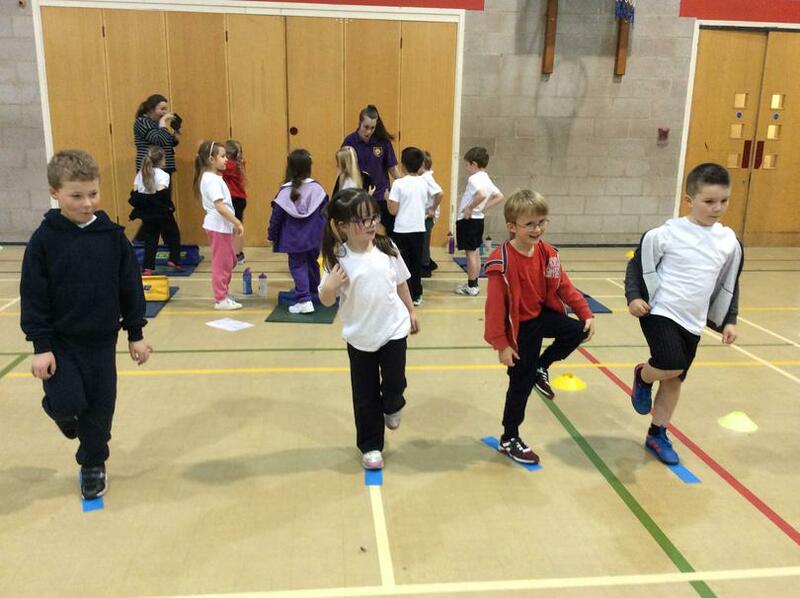 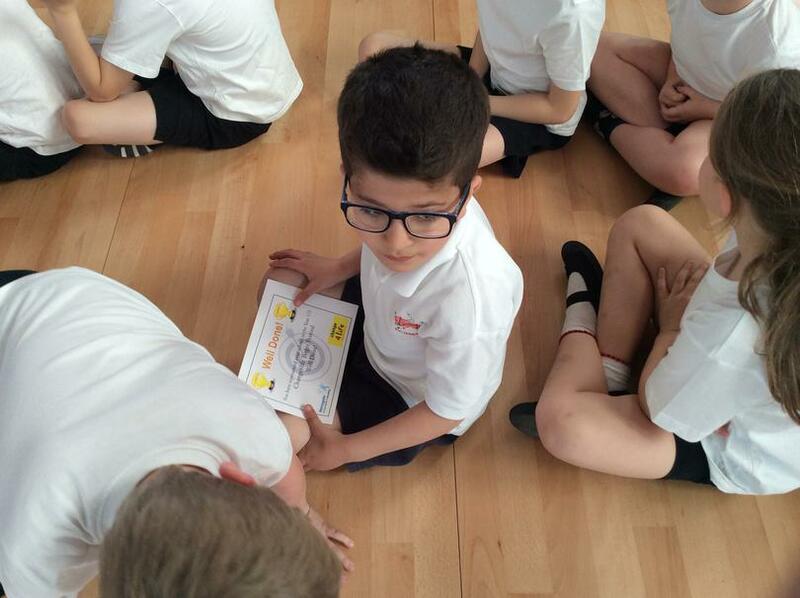 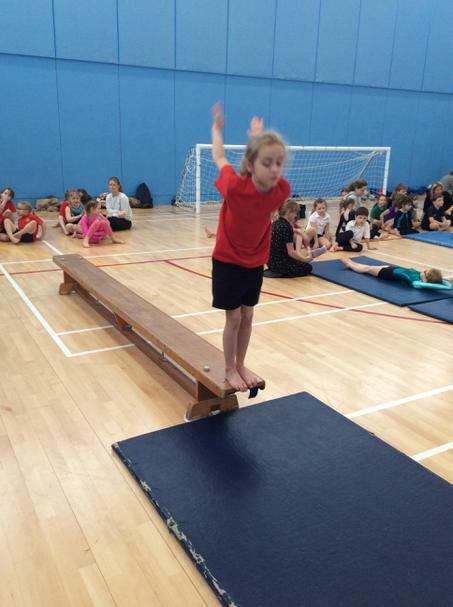 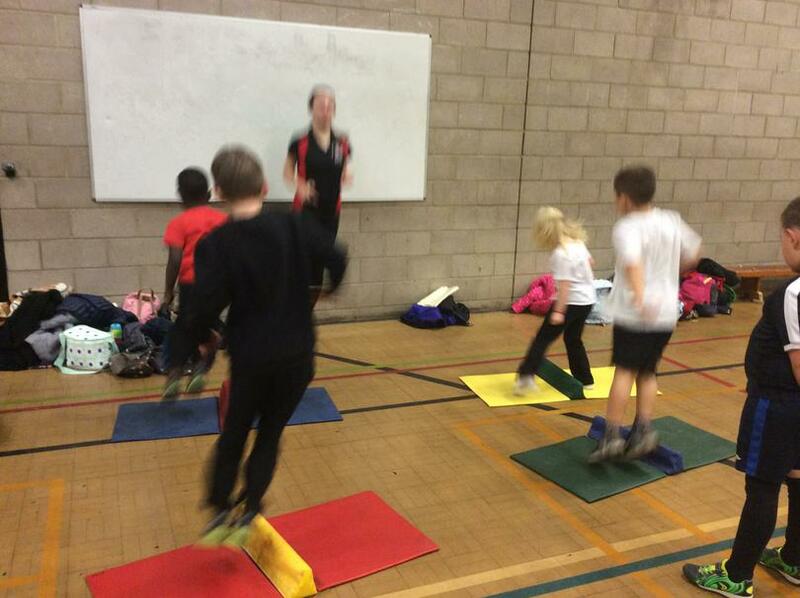 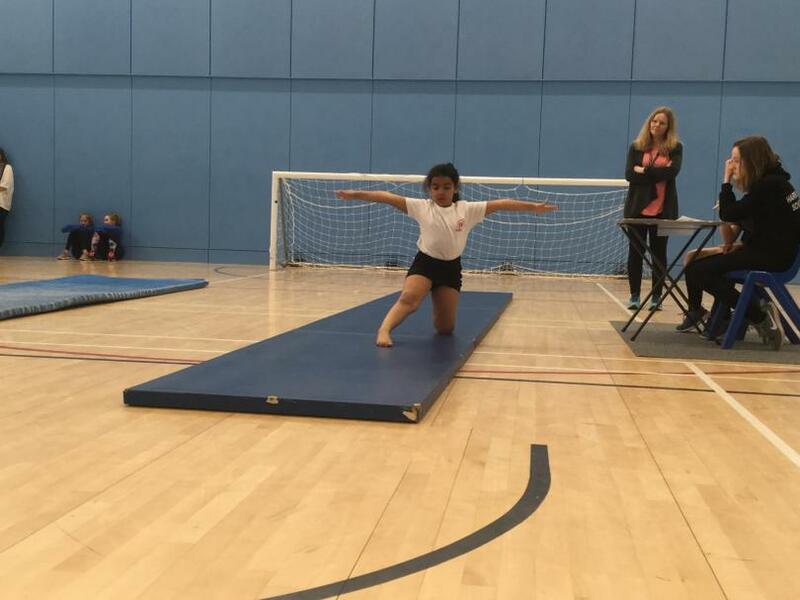 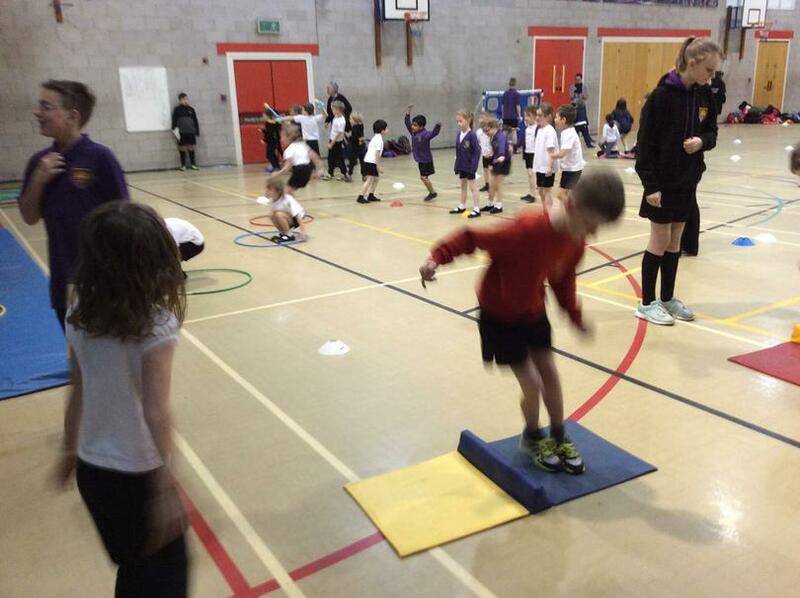 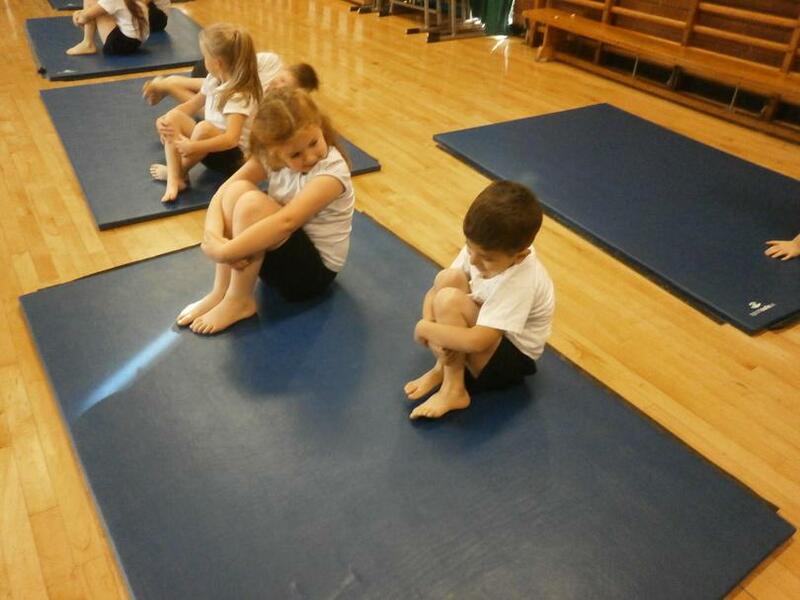 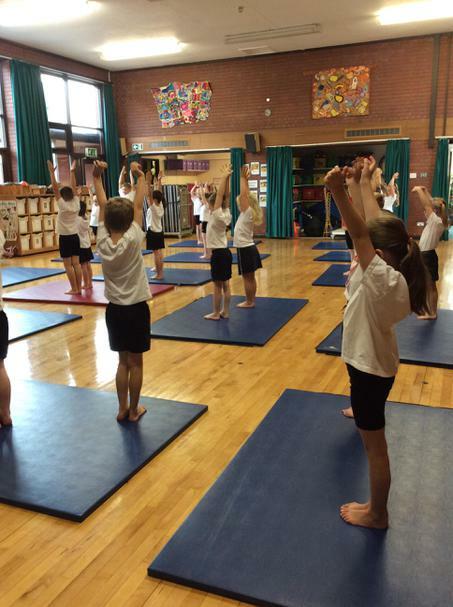 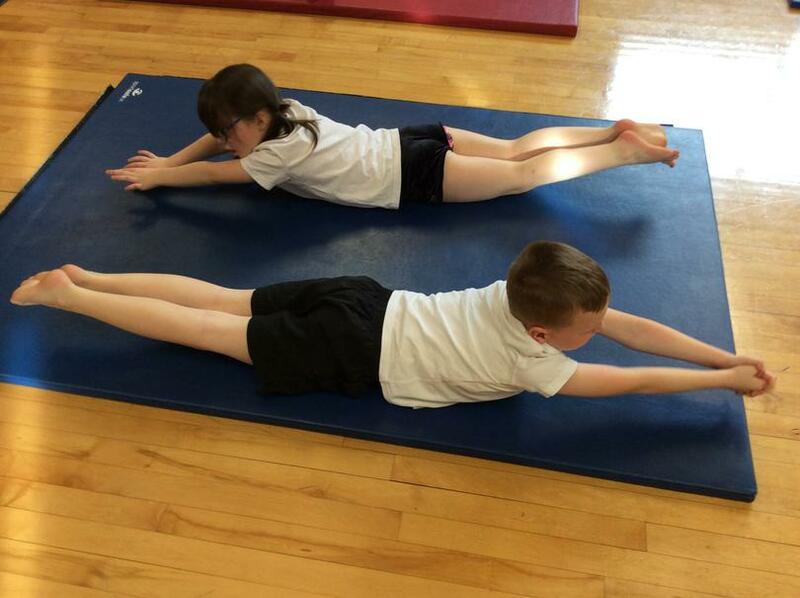 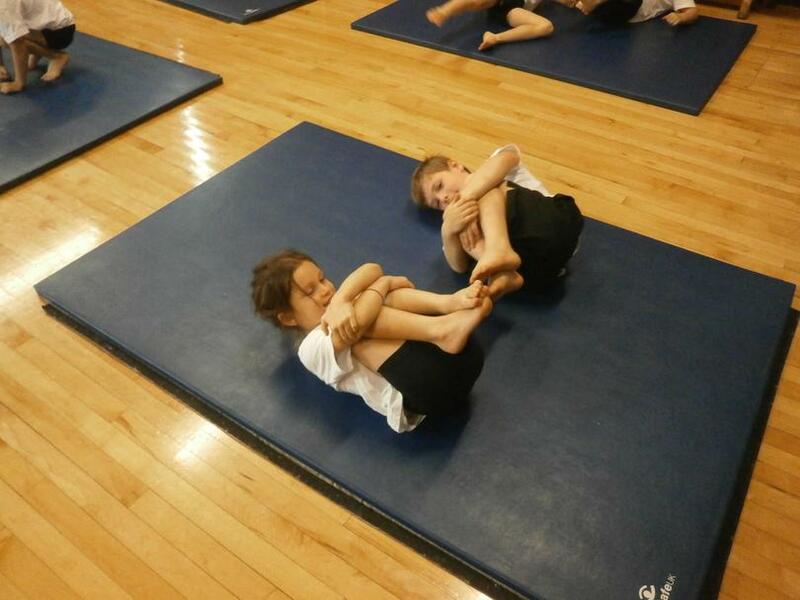 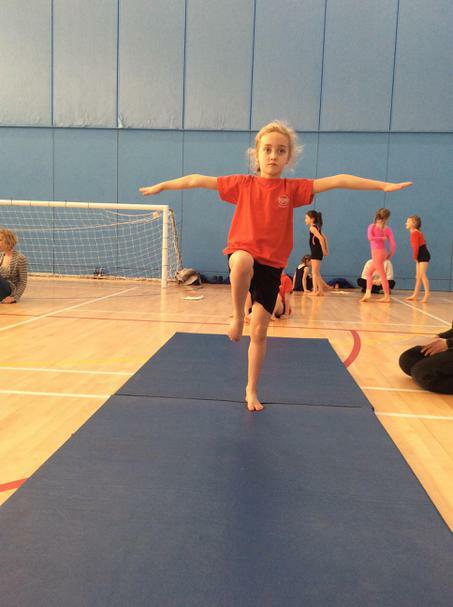 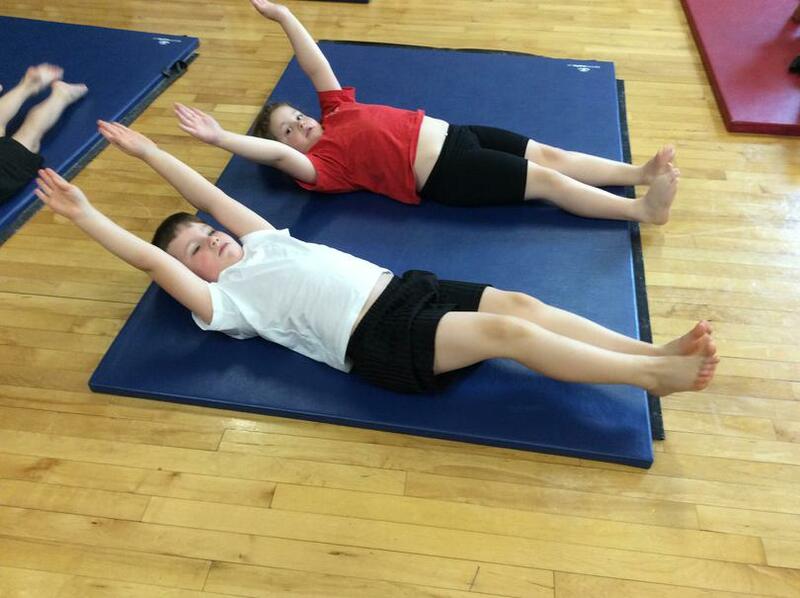 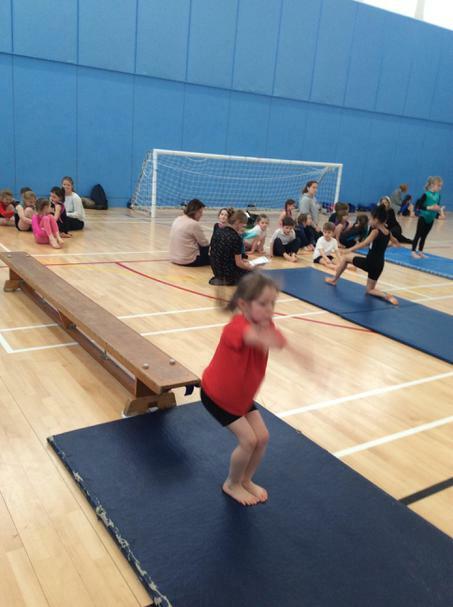 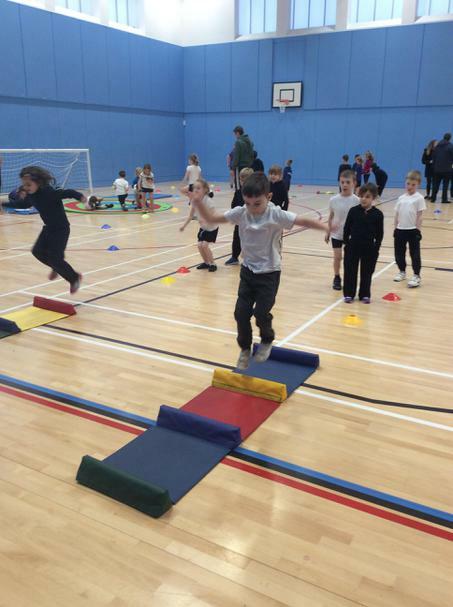 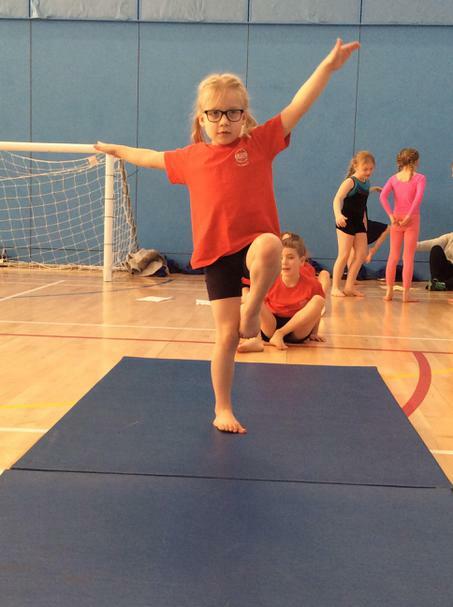 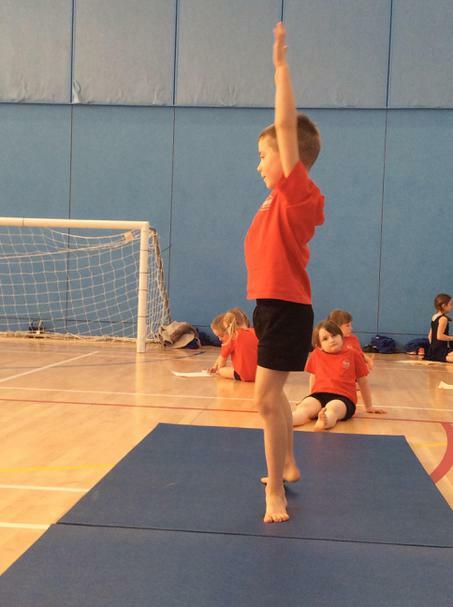 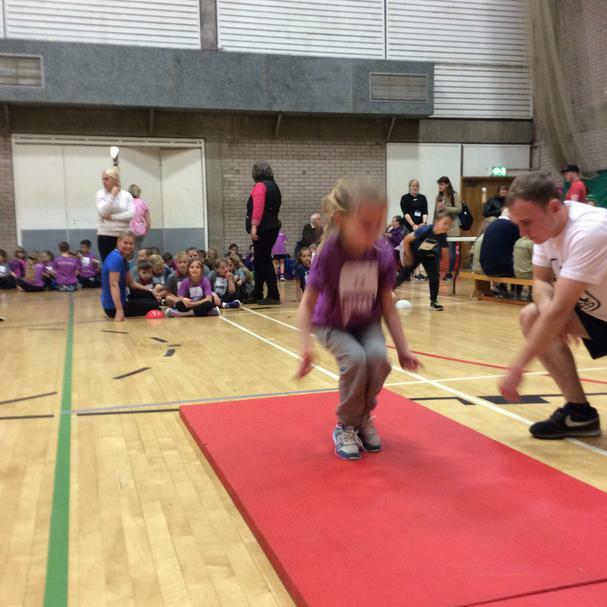 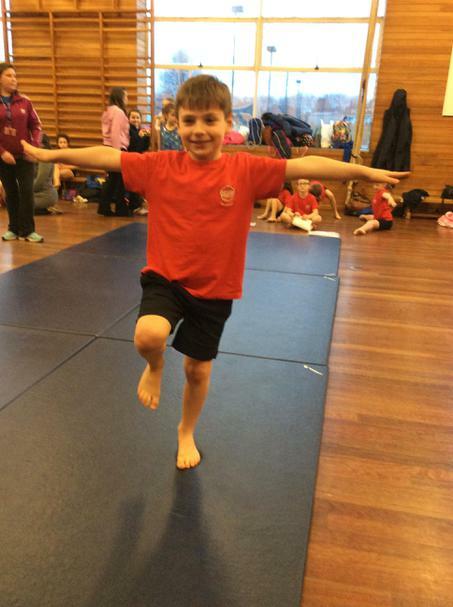 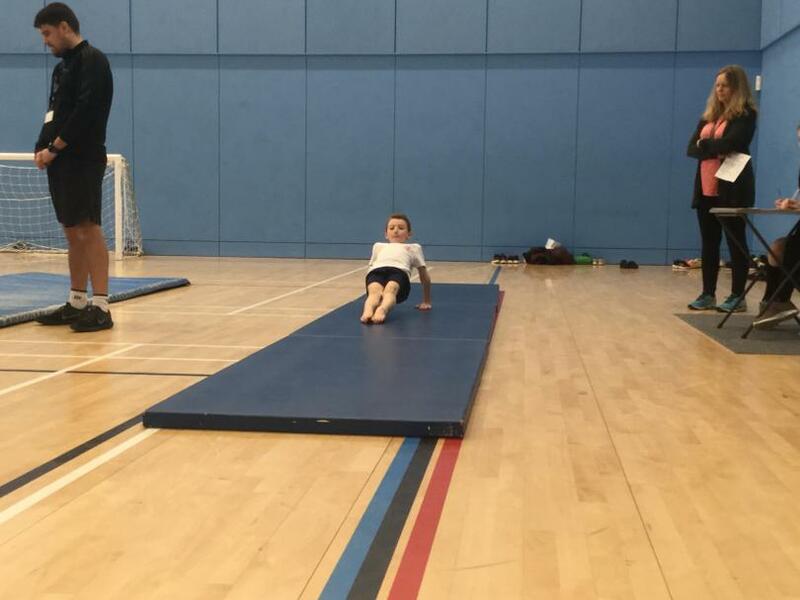 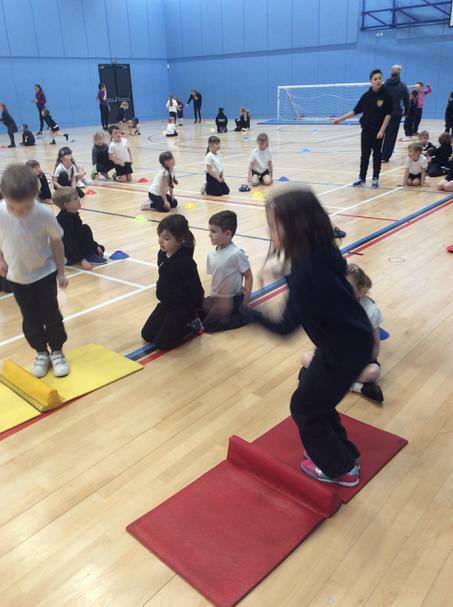 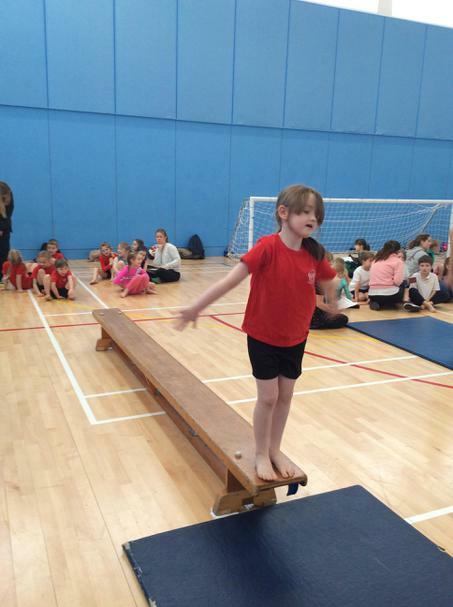 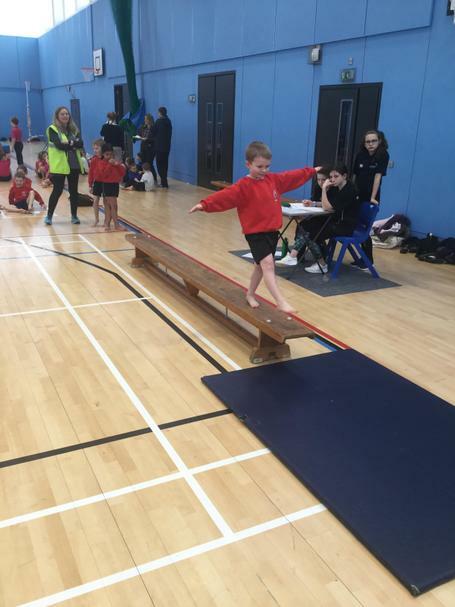 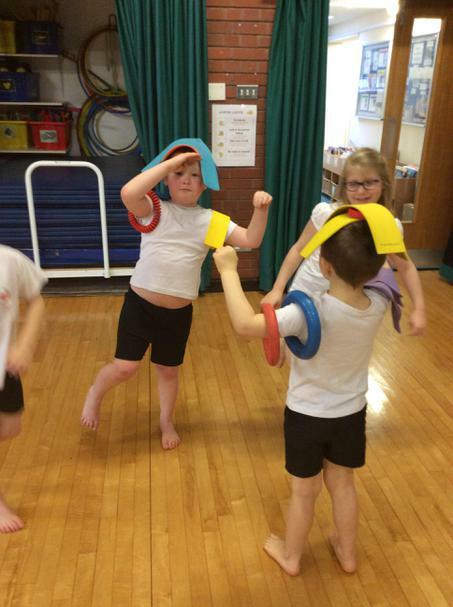 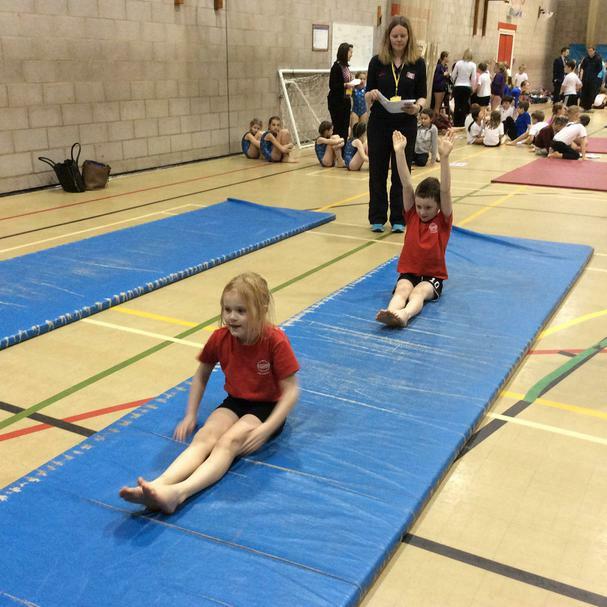 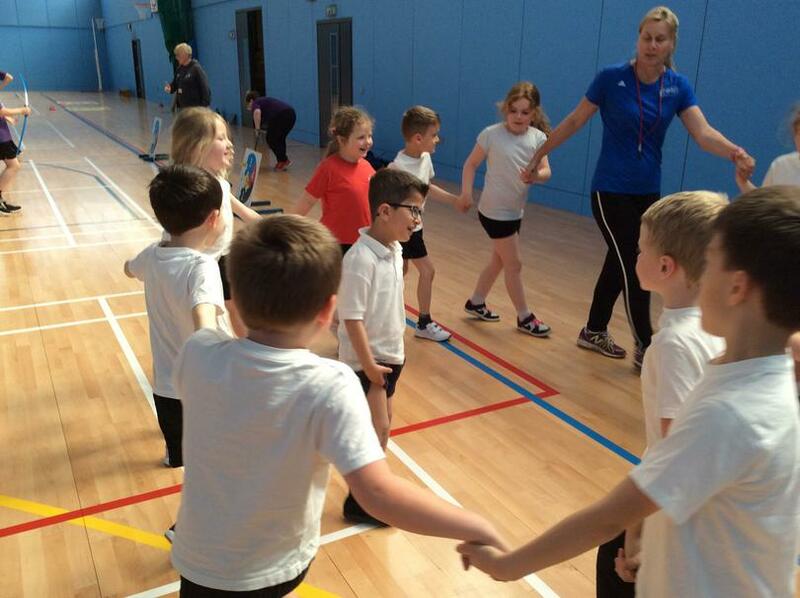 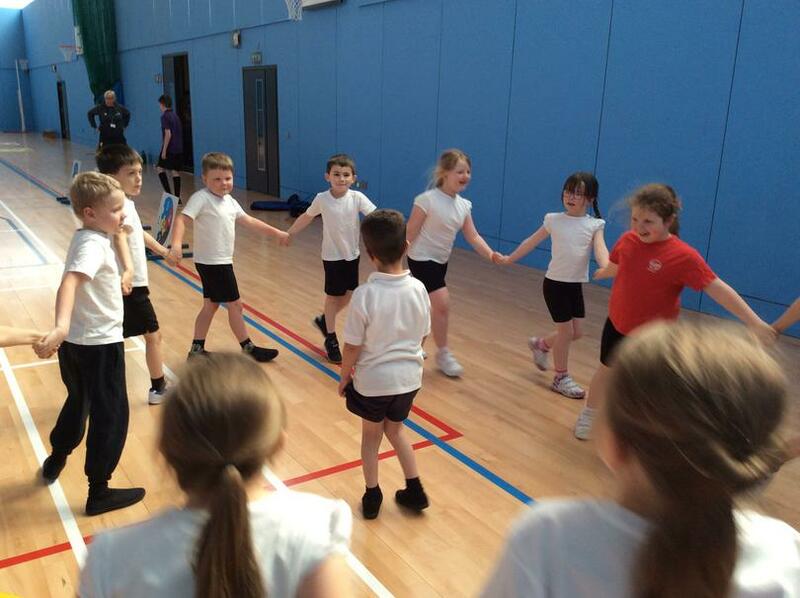 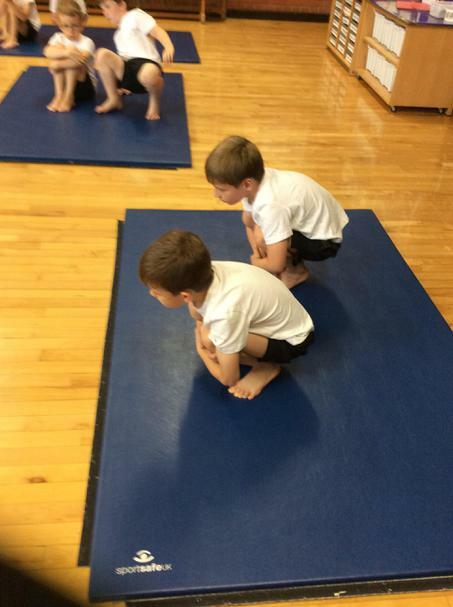 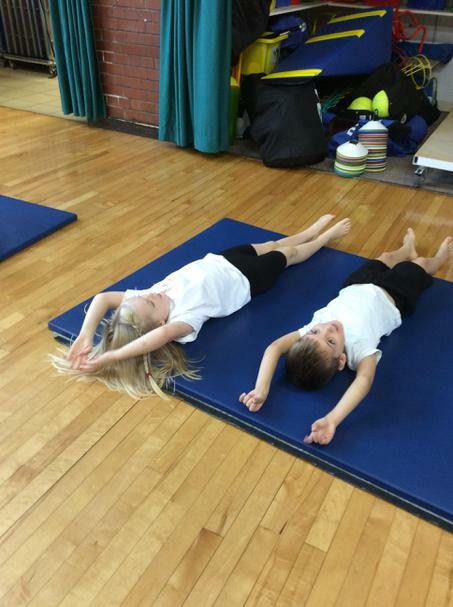 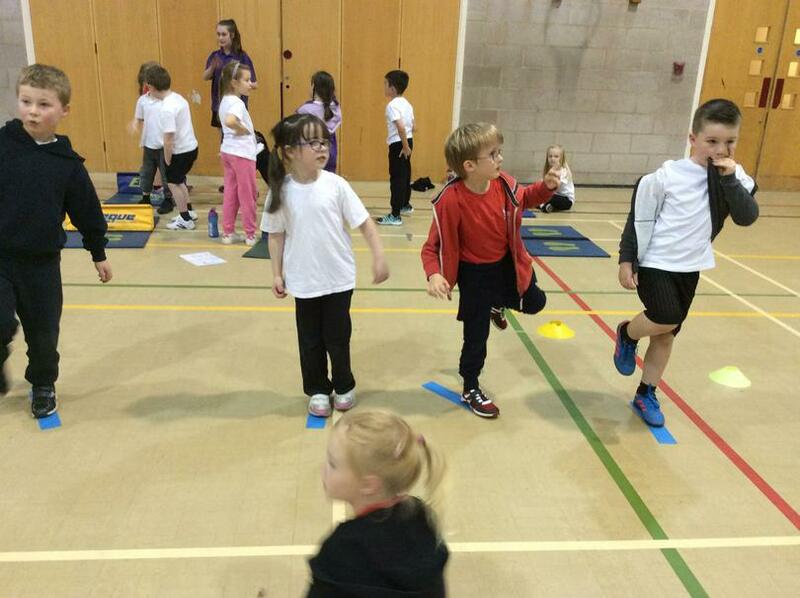 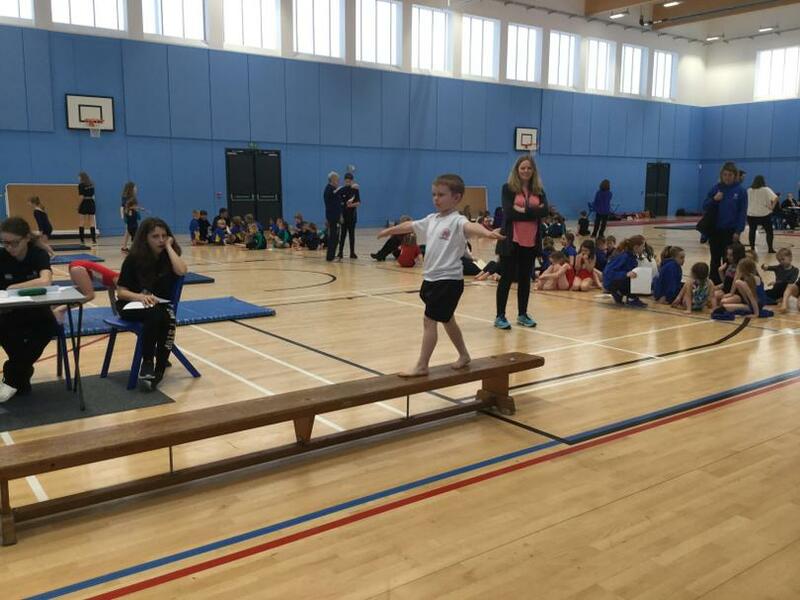 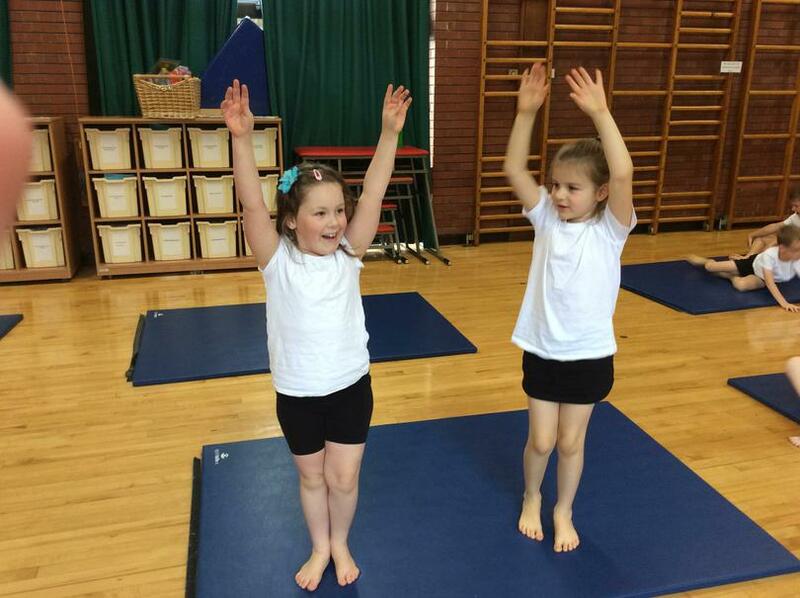 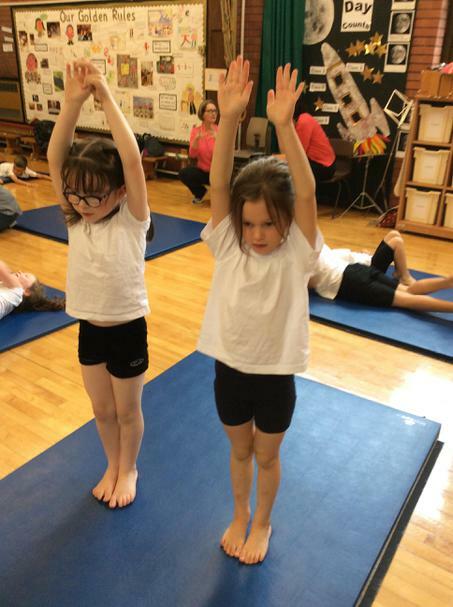 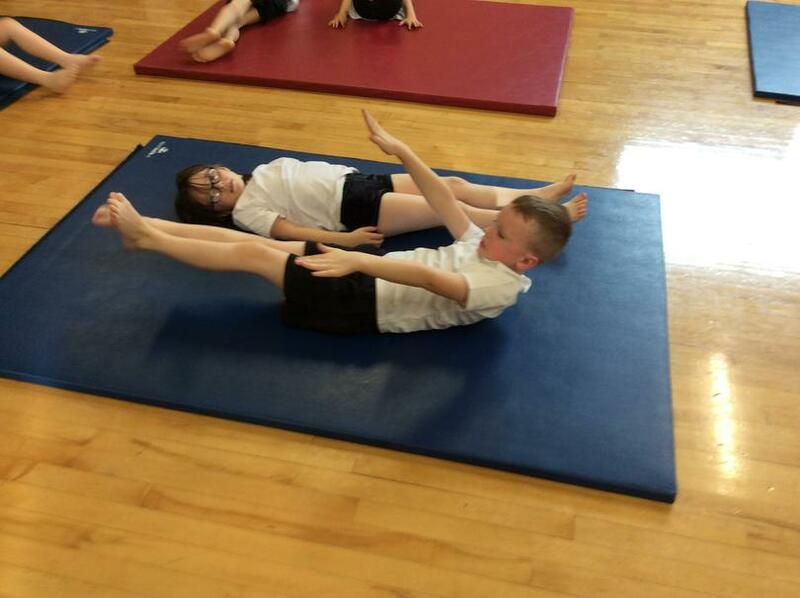 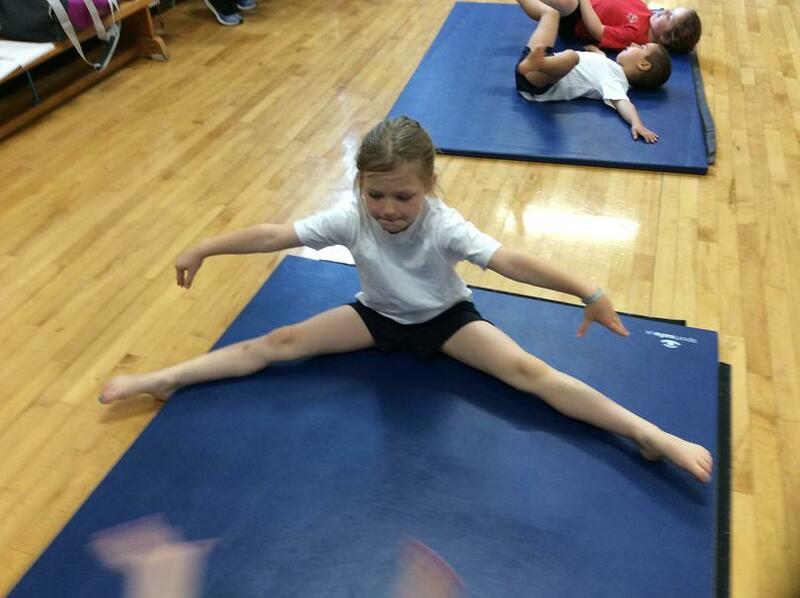 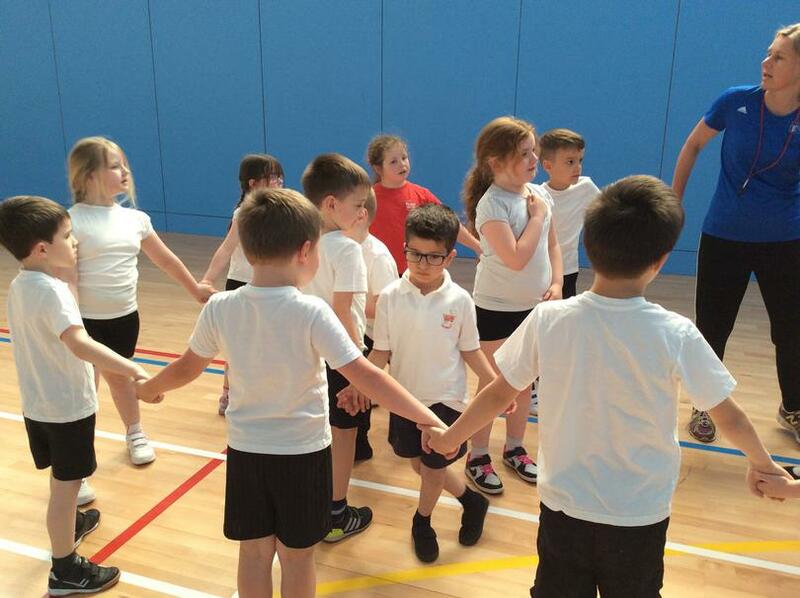 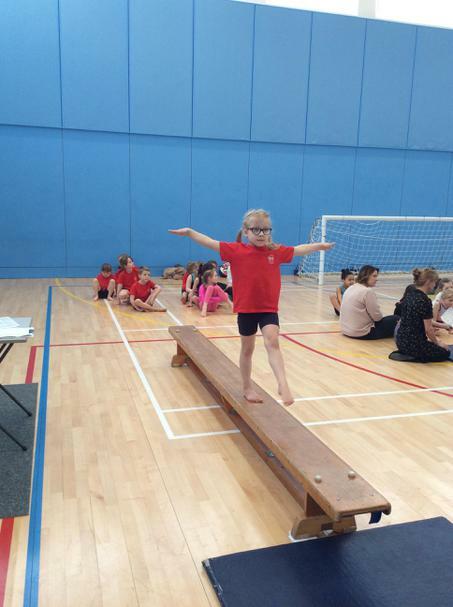 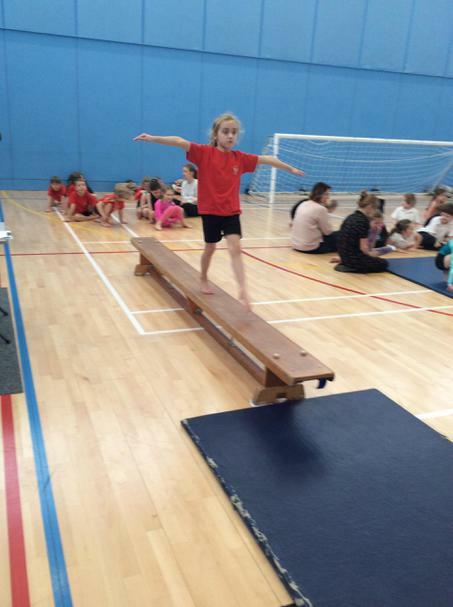 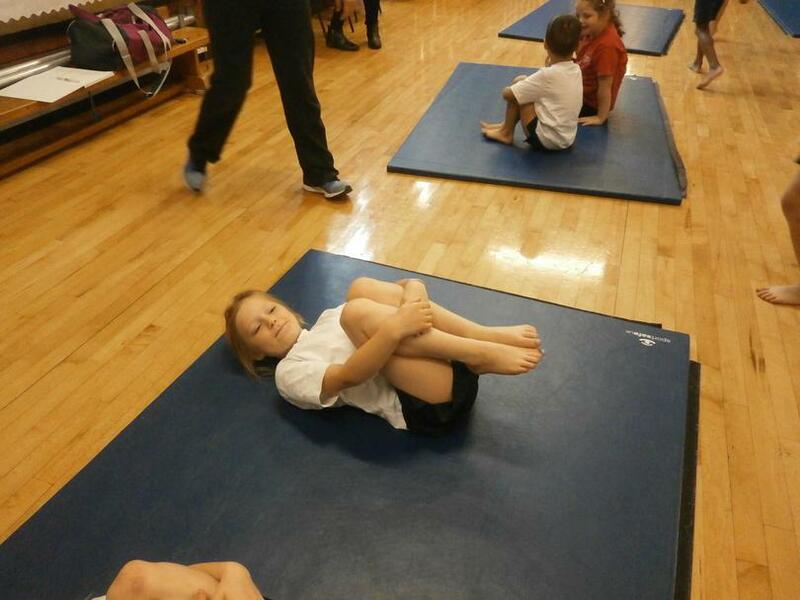 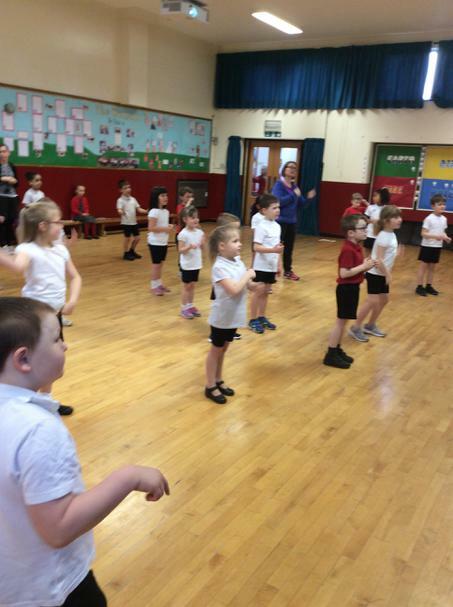 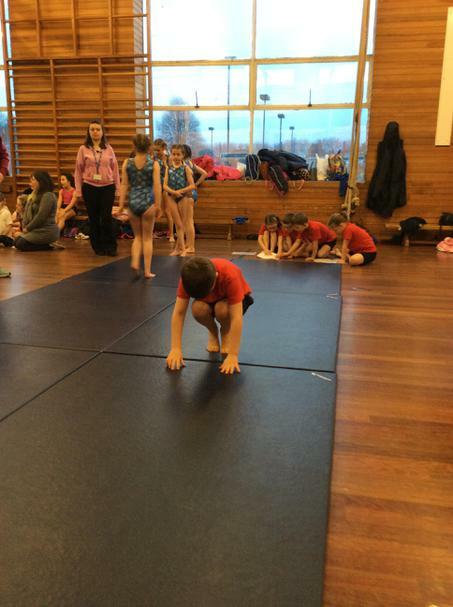 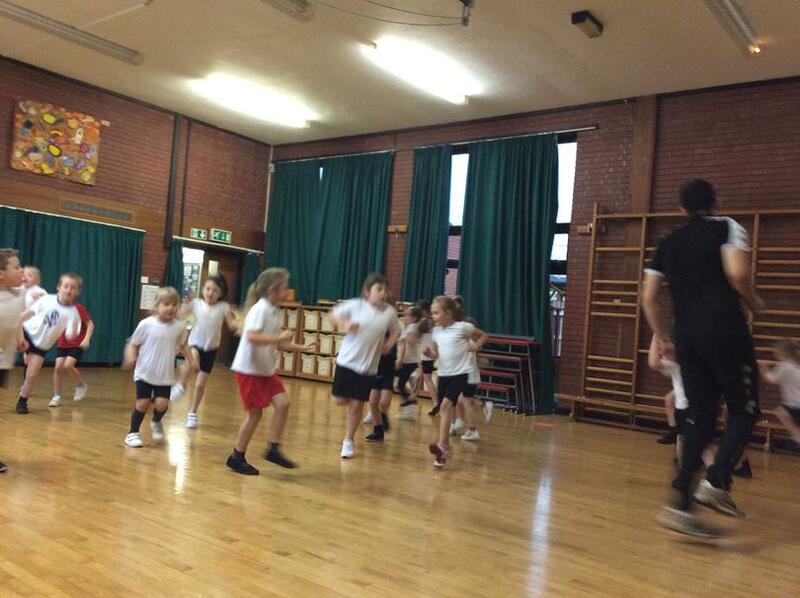 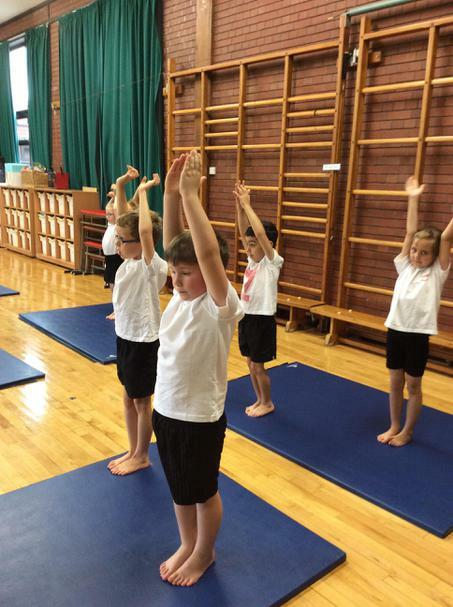 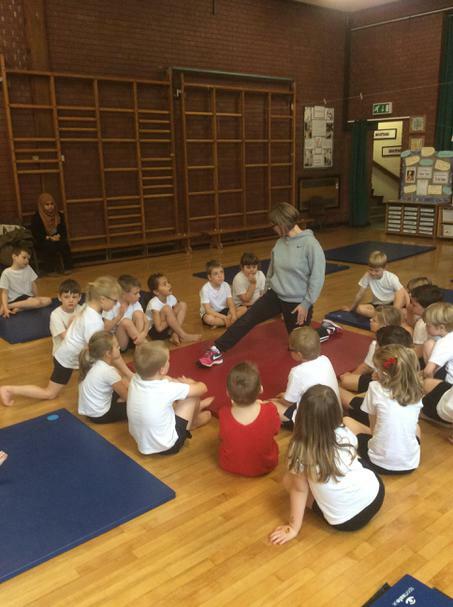 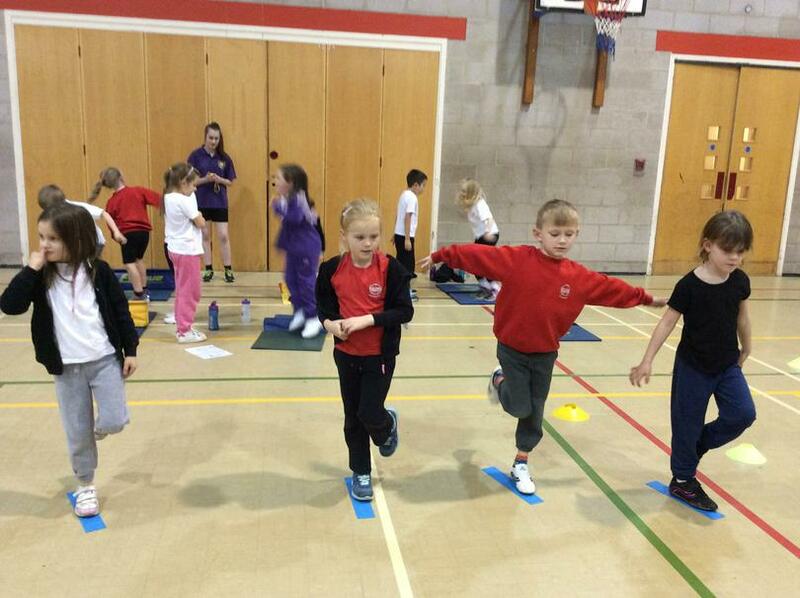 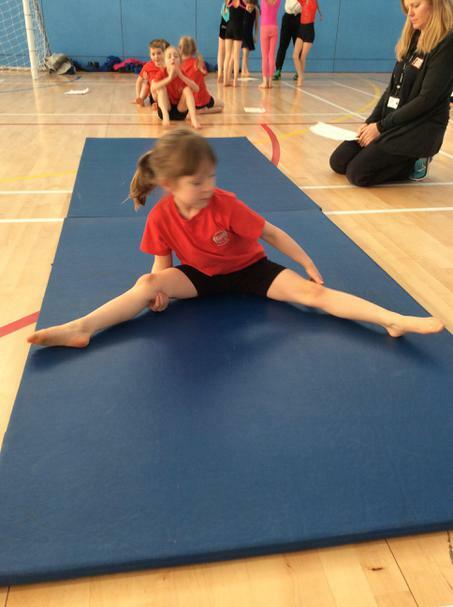 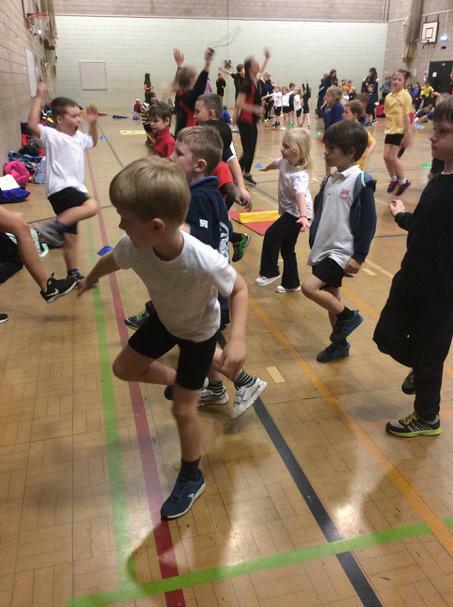 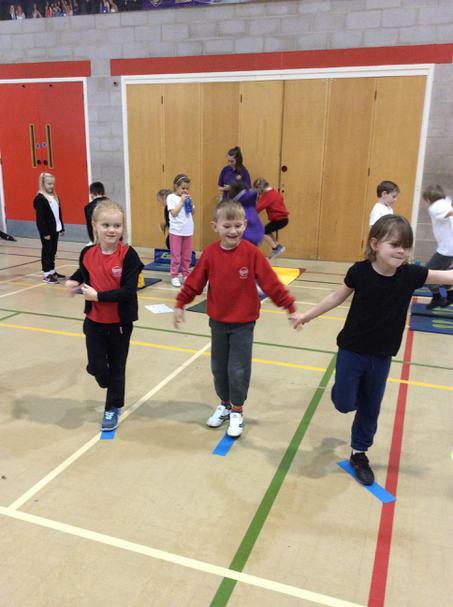 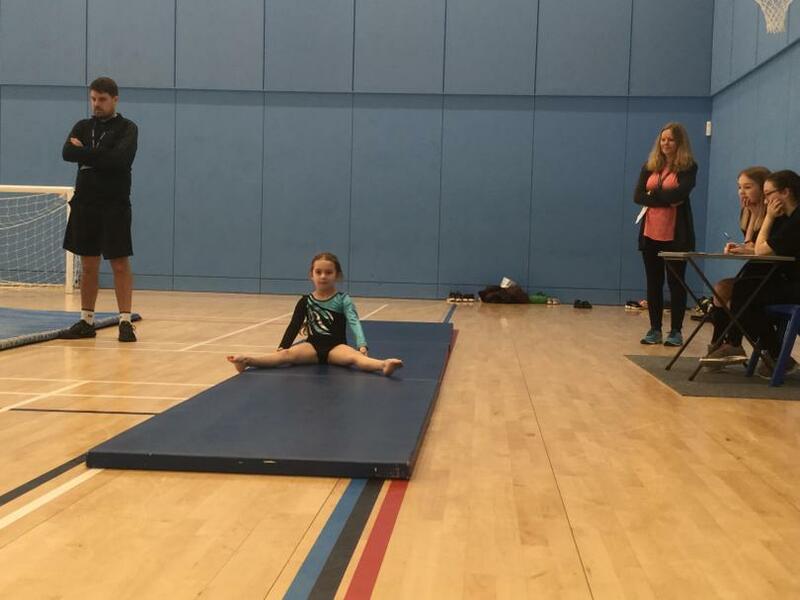 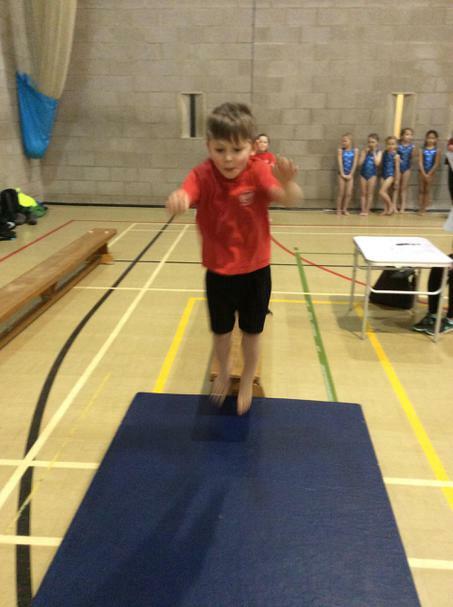 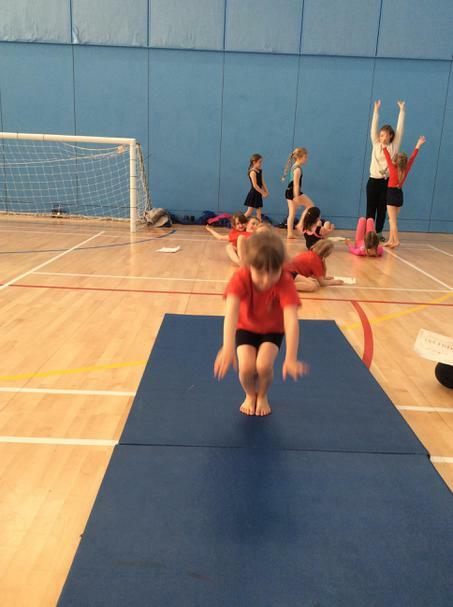 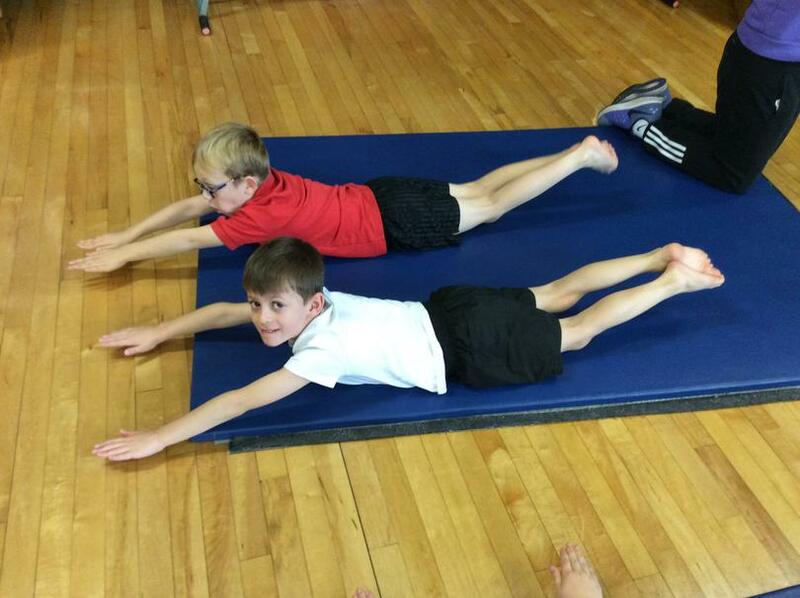 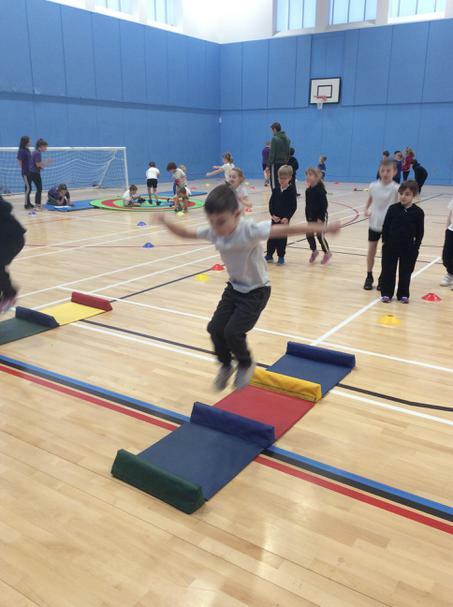 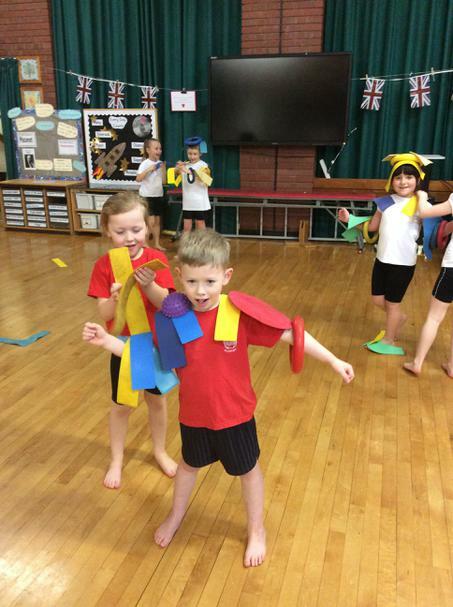 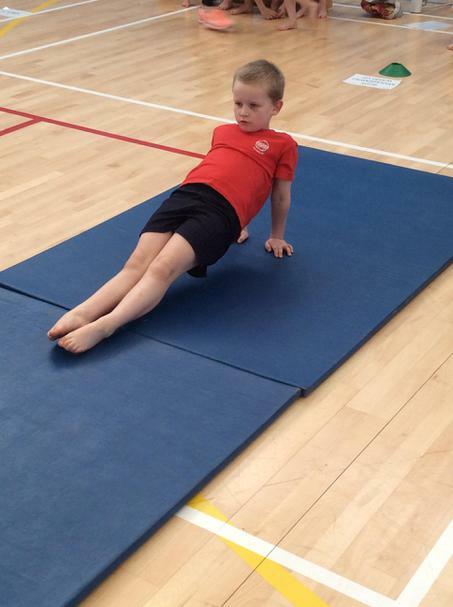 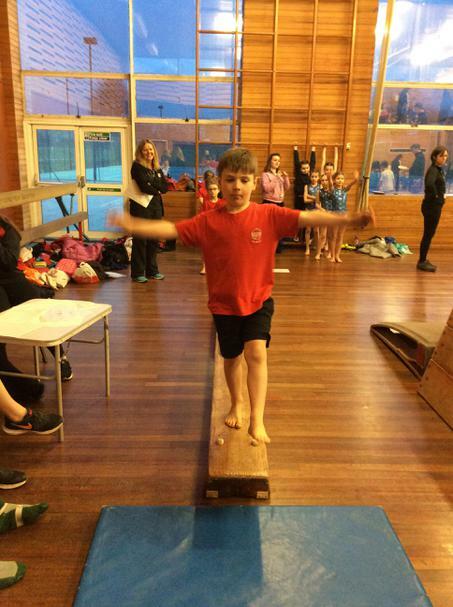 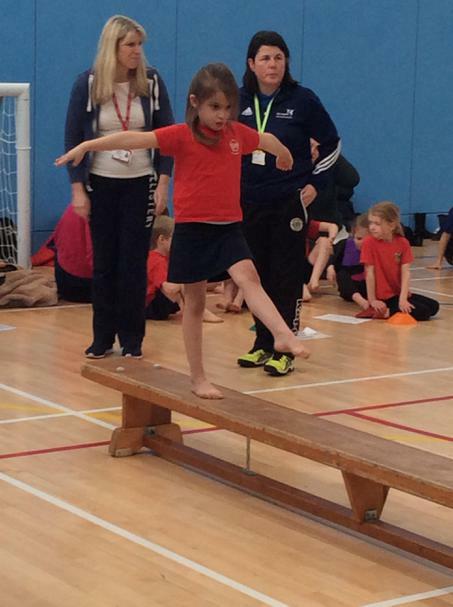 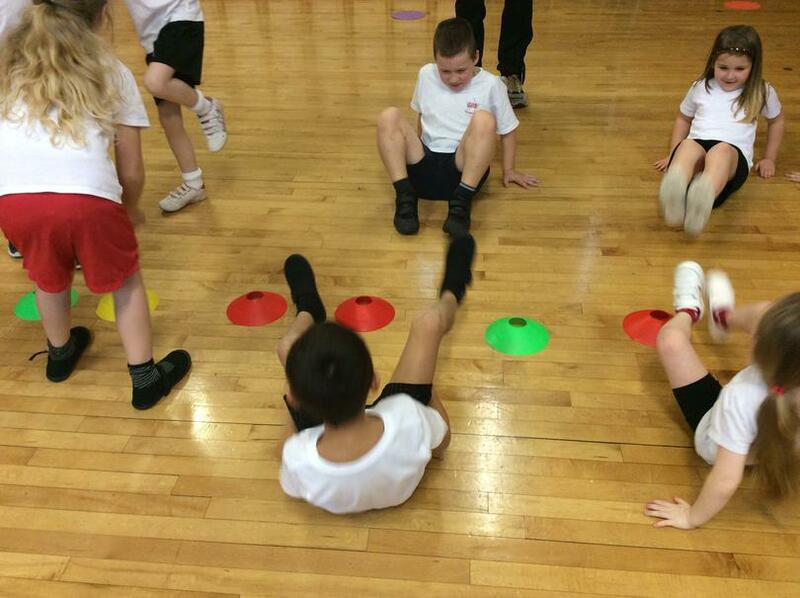 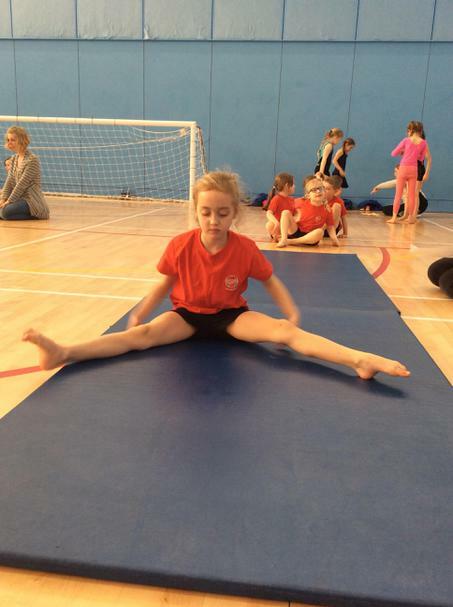 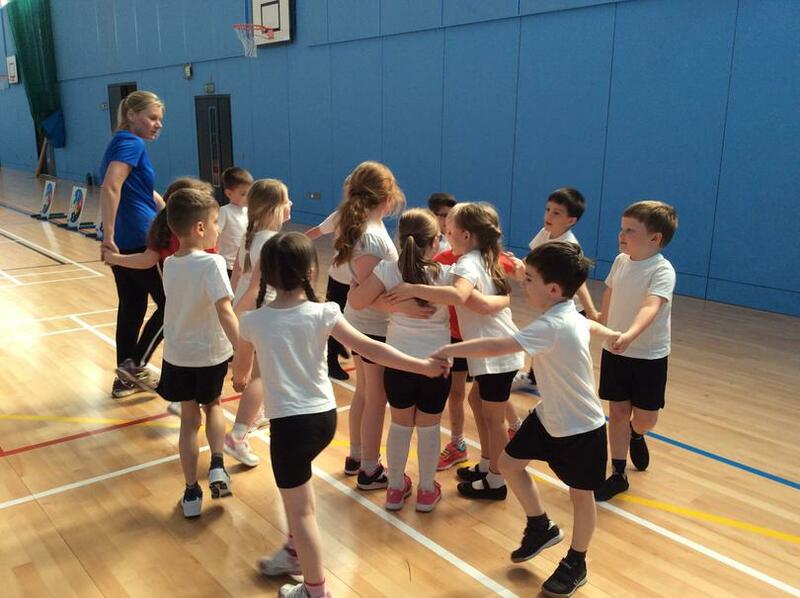 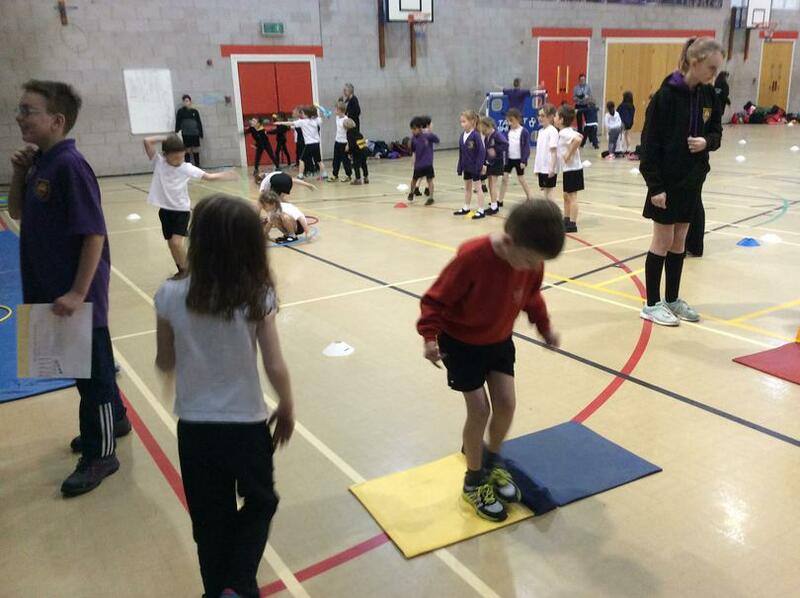 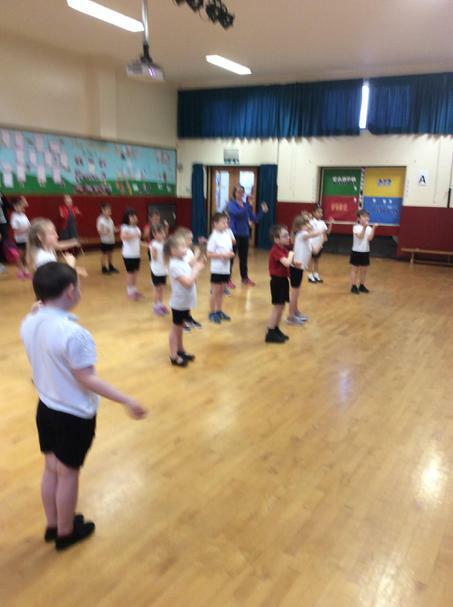 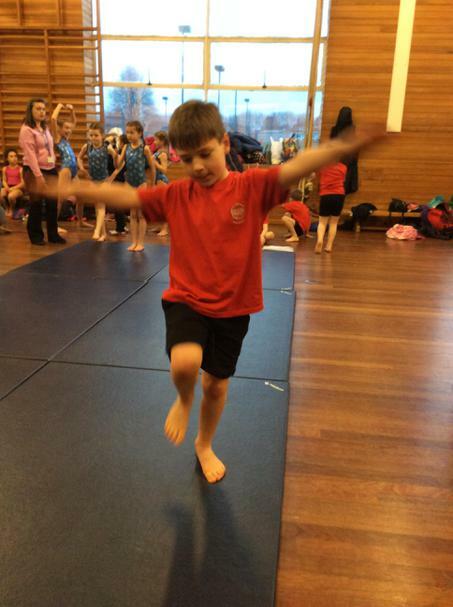 Children from Year 2 took part in a Gymnastics Key Steps Level 1 Competition held at Harrogate High School as part of the Harrogate Schools Sports Partnership. 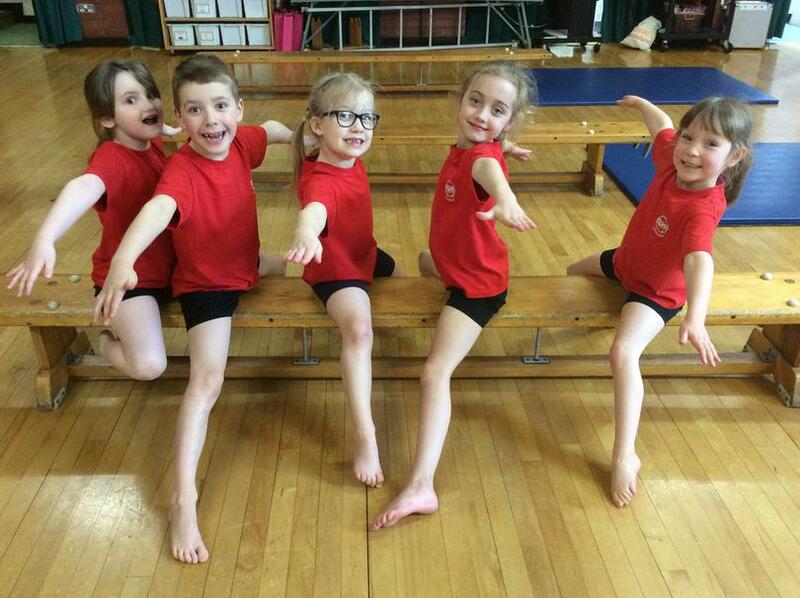 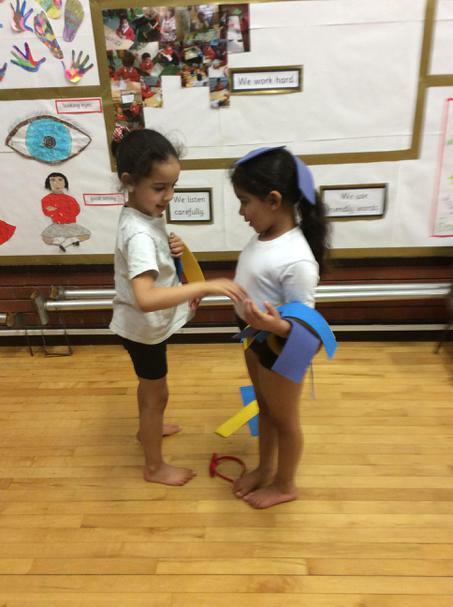 The children had worked hard to learn their routines and performed with skills and grace. 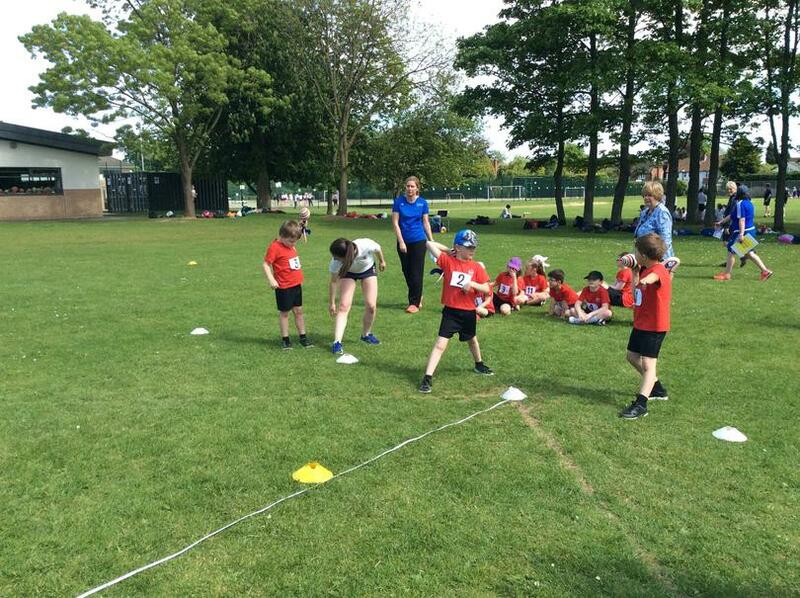 Both teams did exceptionally well finishing in 1st and 3rd place, meaning one team progressed to the Harrogate finals. 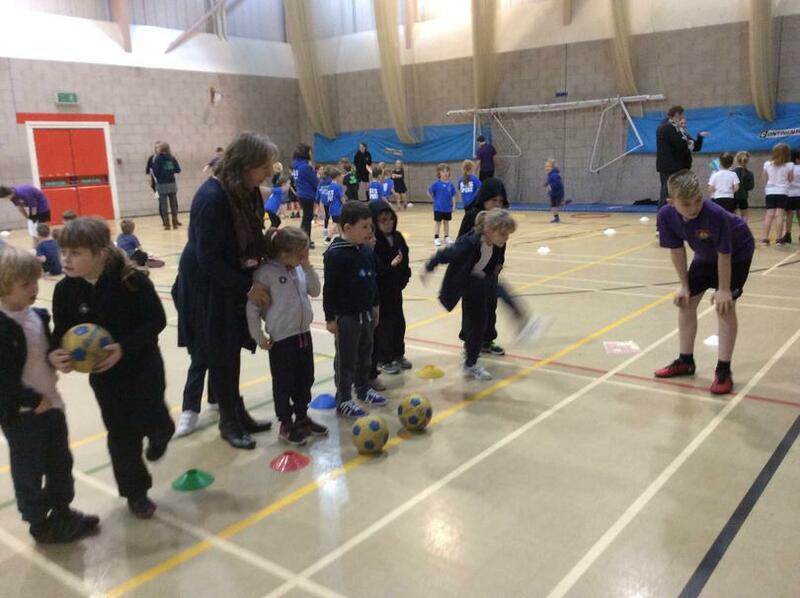 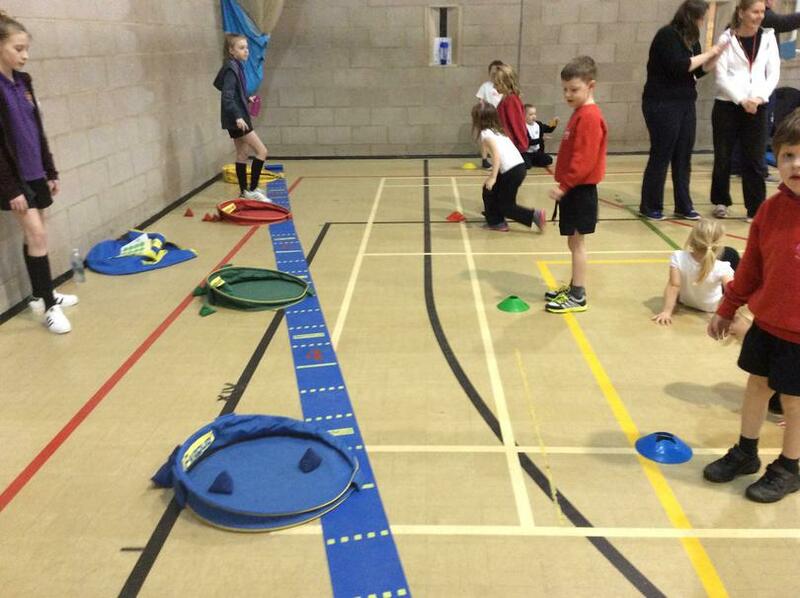 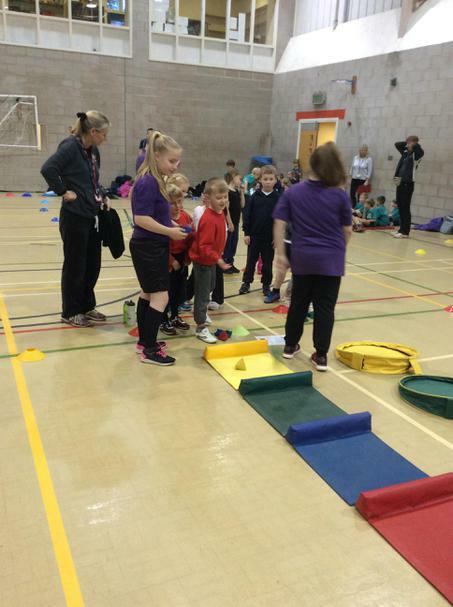 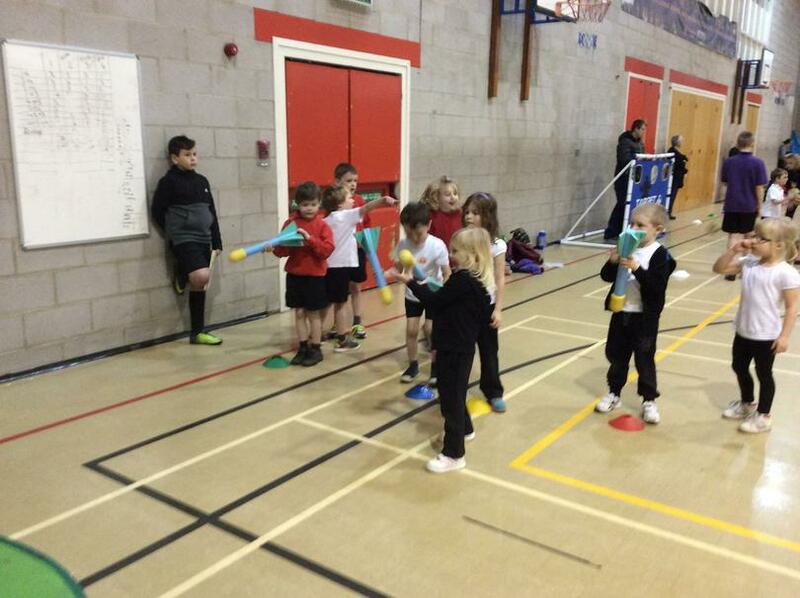 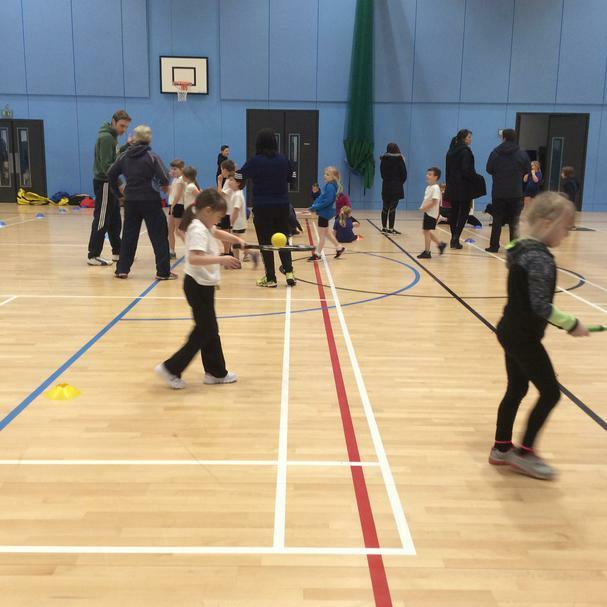 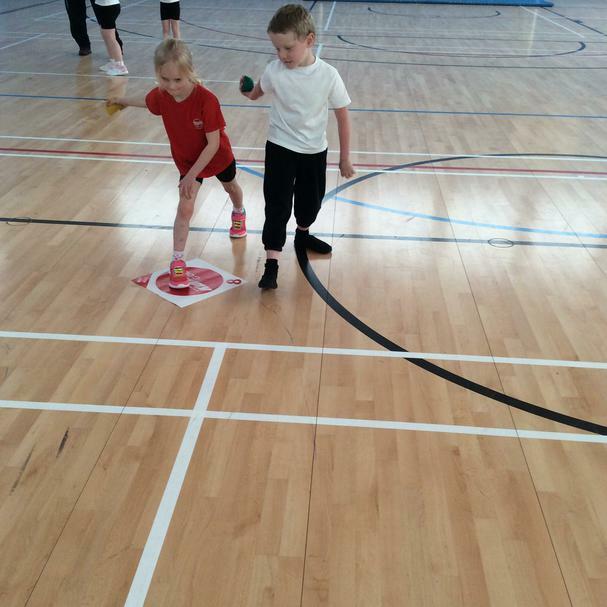 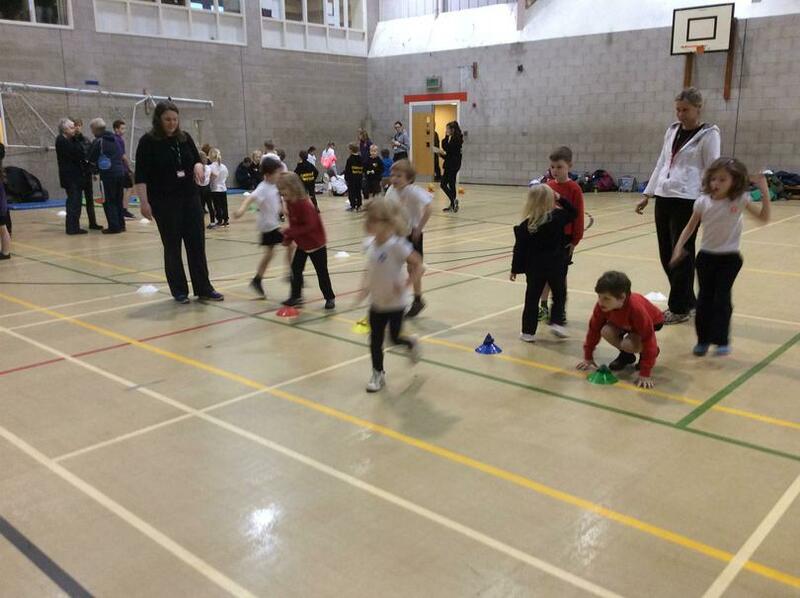 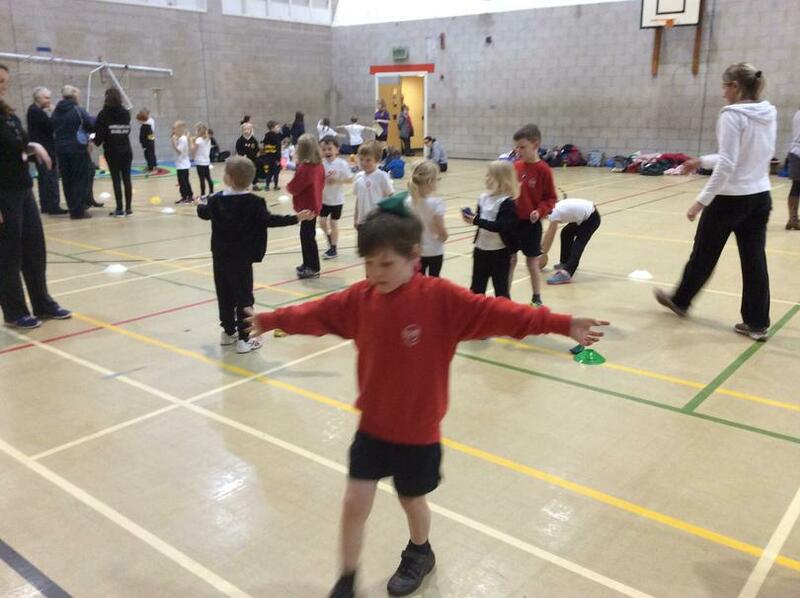 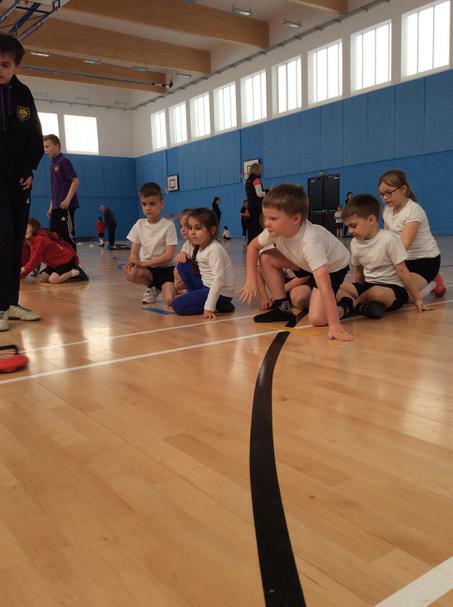 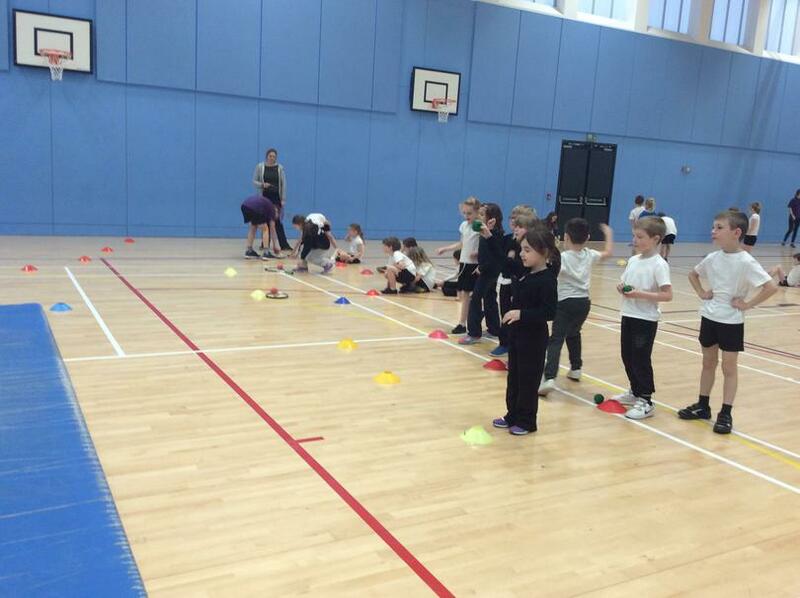 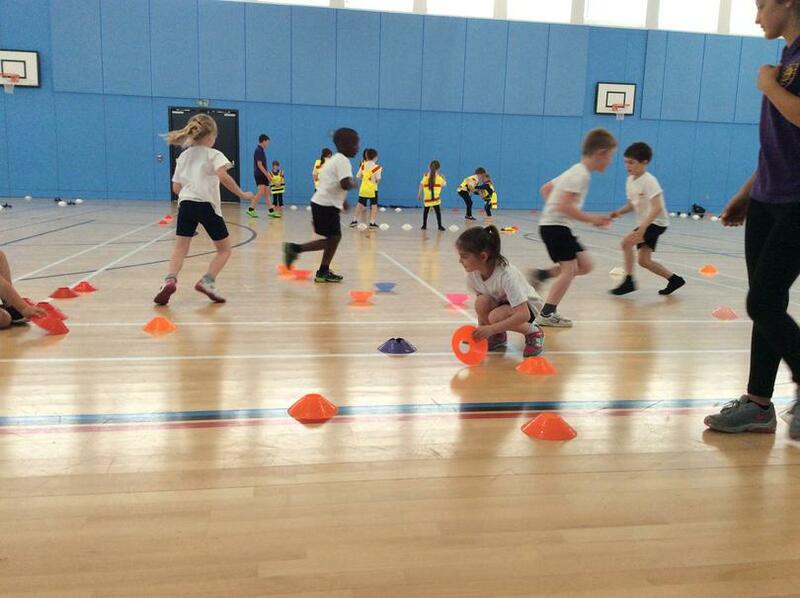 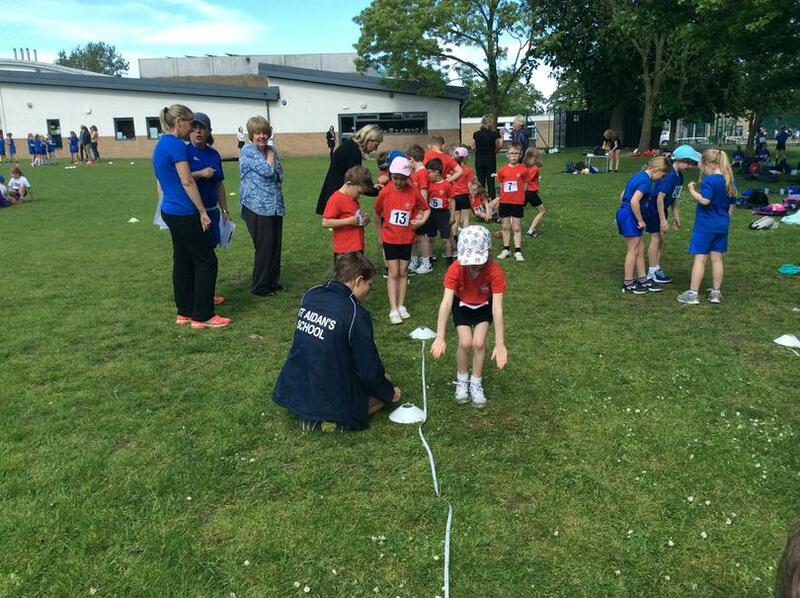 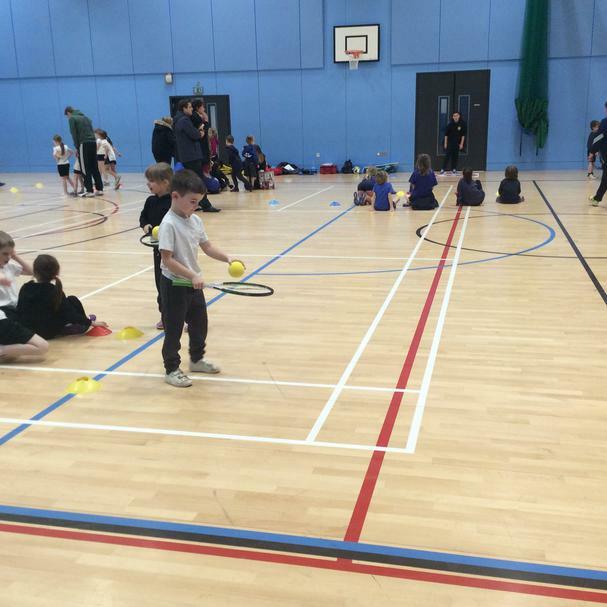 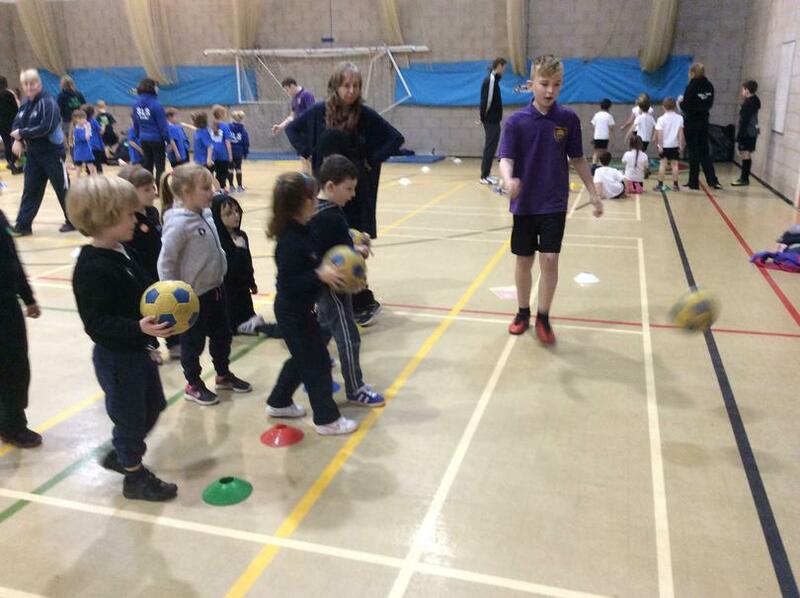 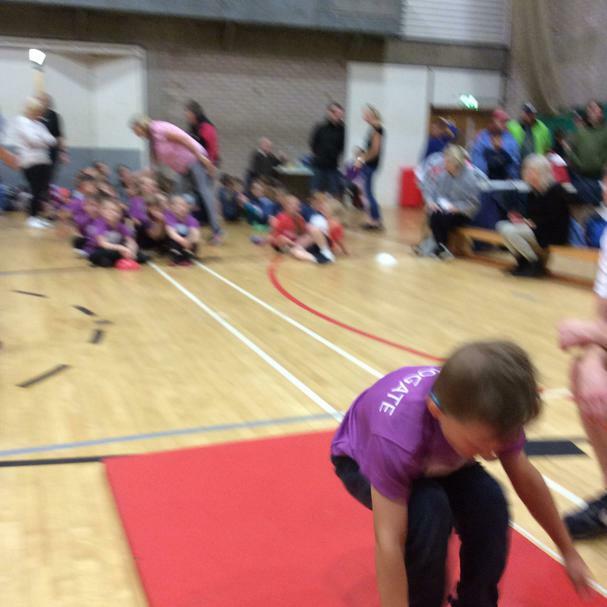 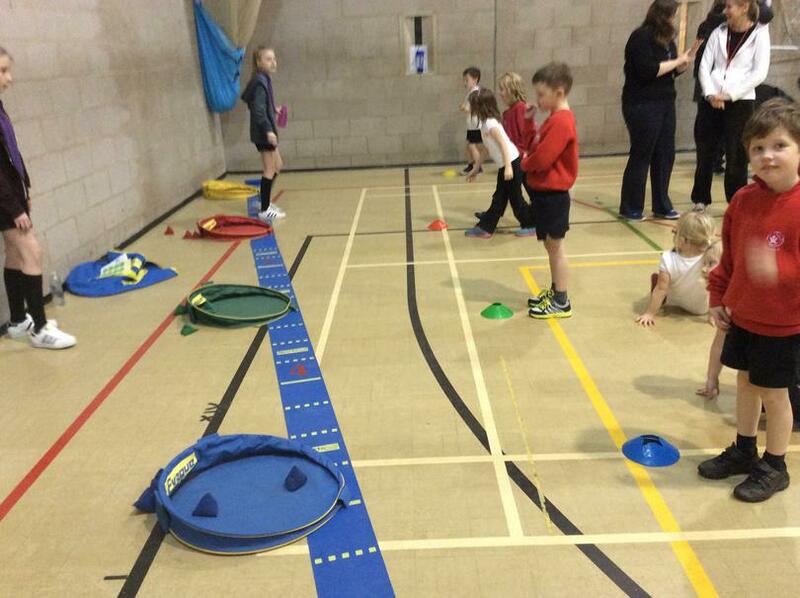 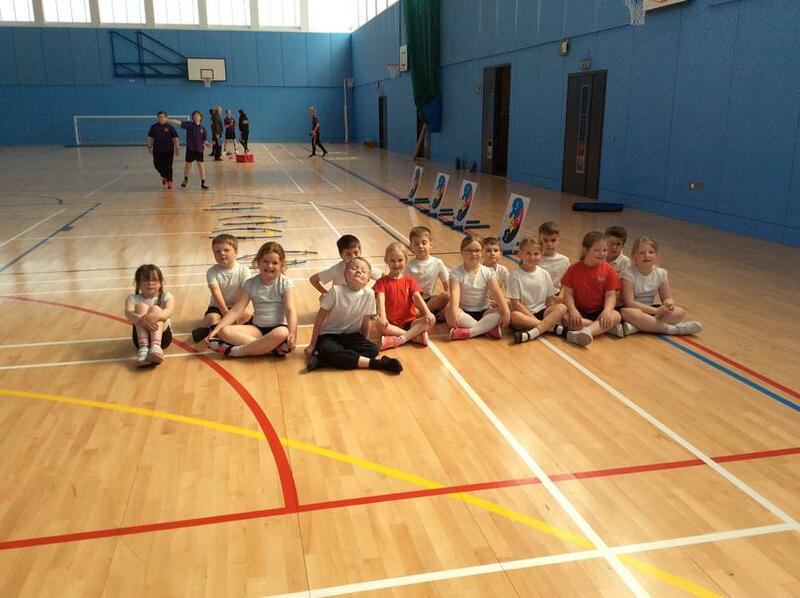 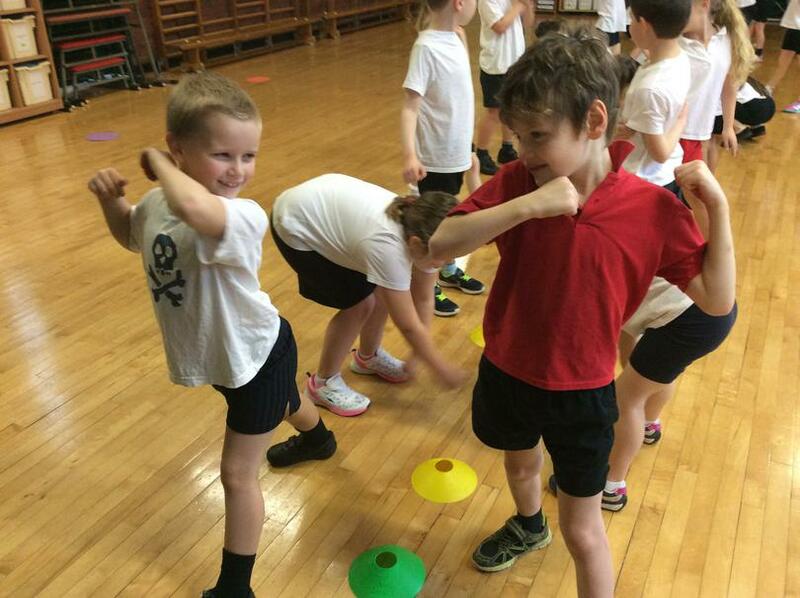 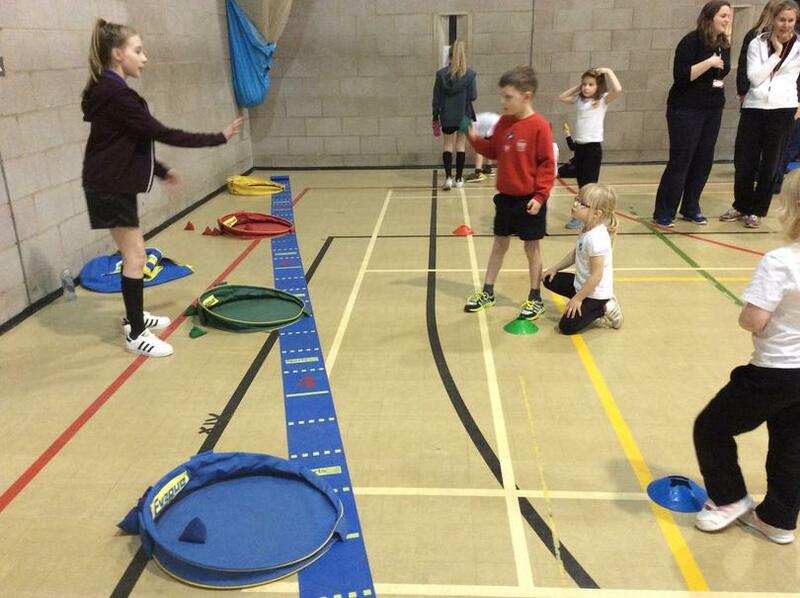 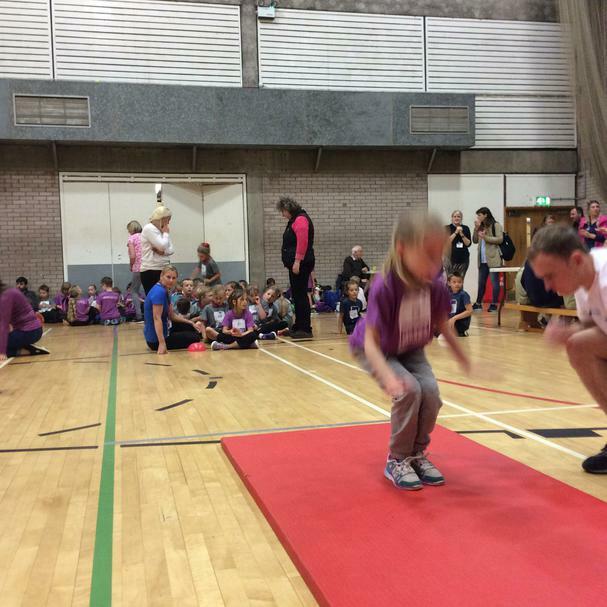 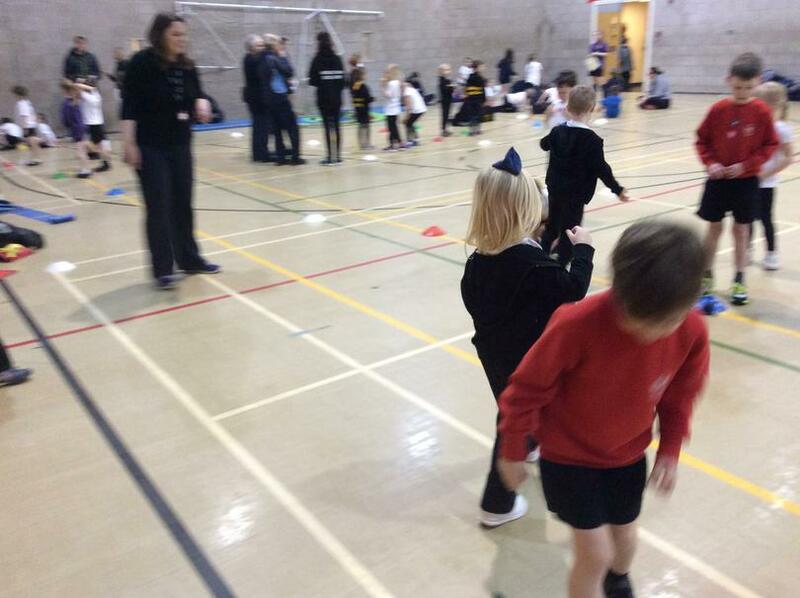 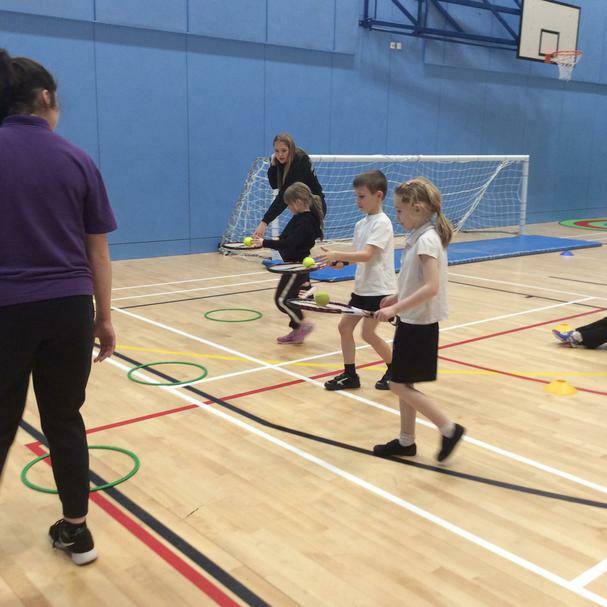 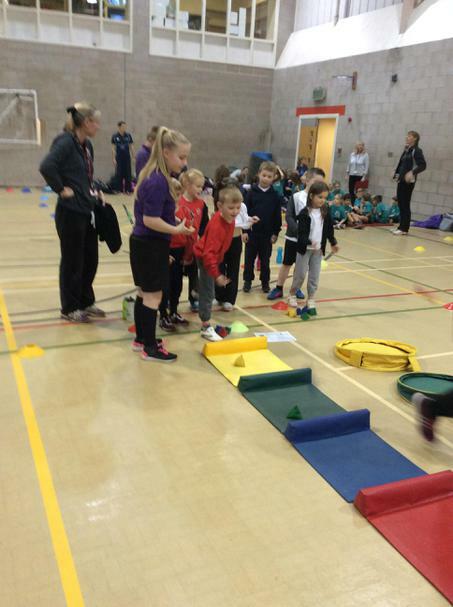 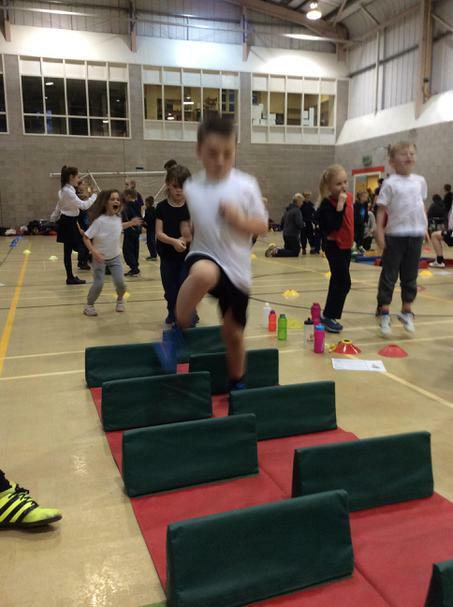 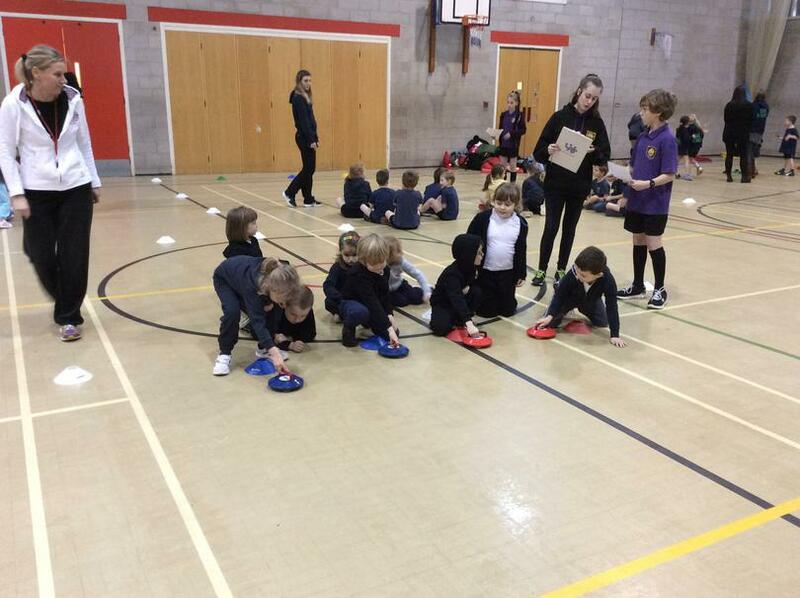 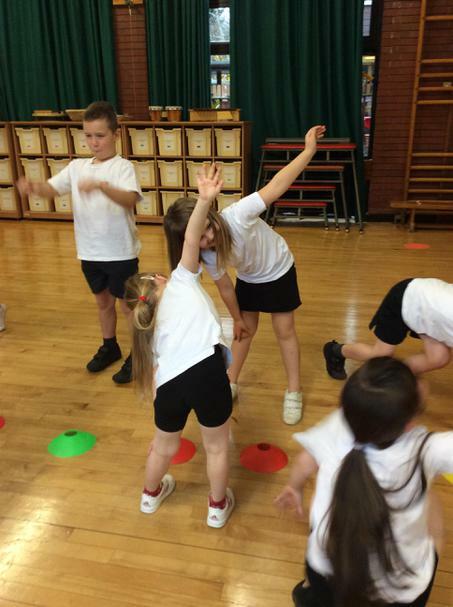 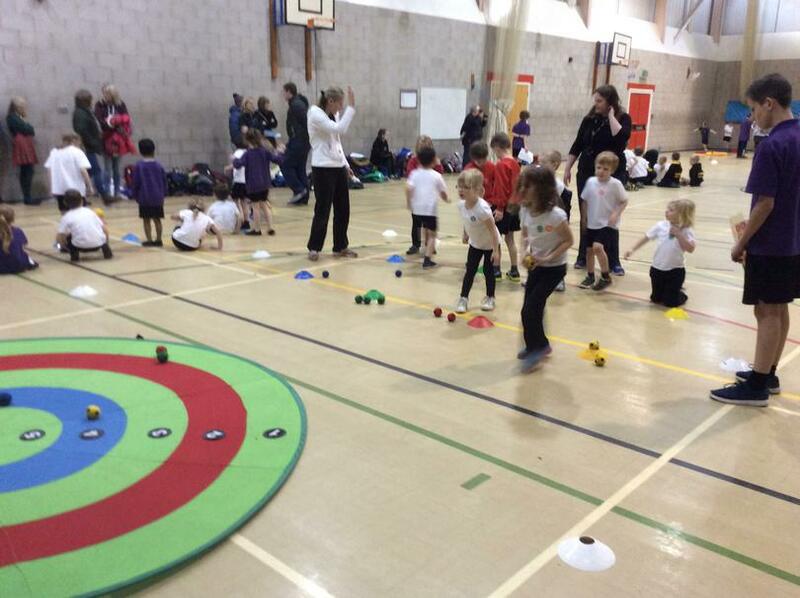 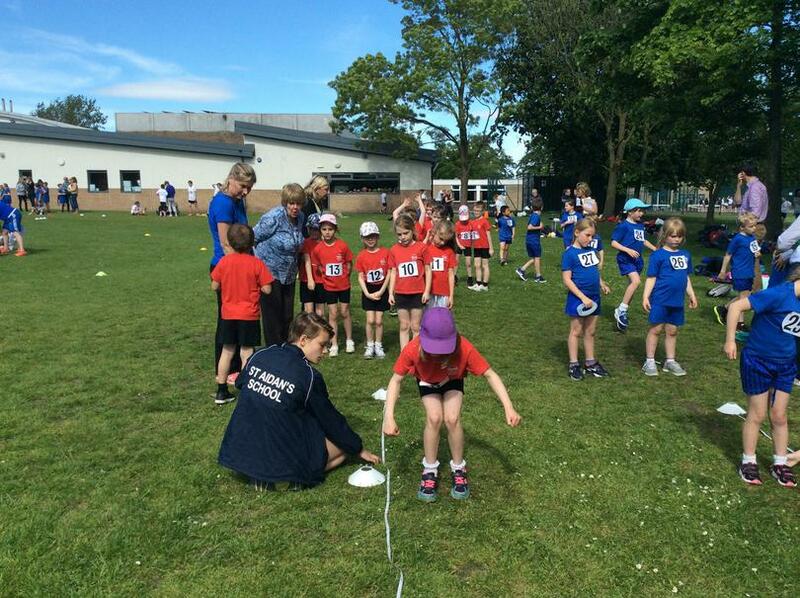 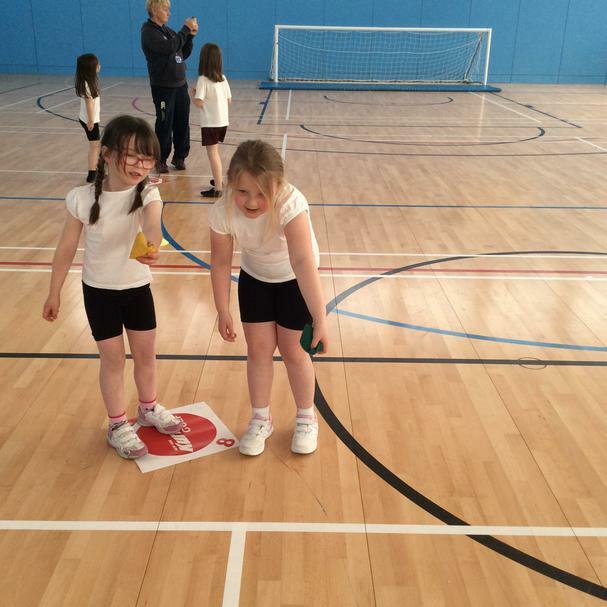 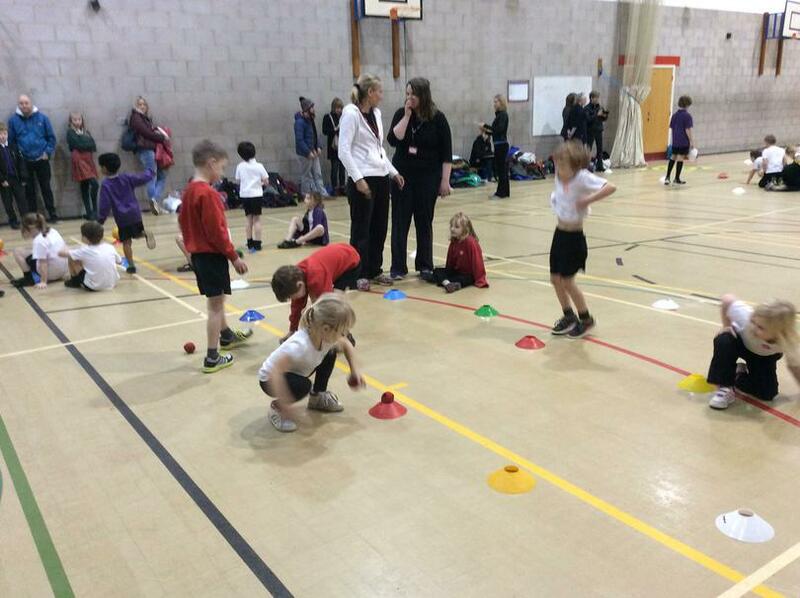 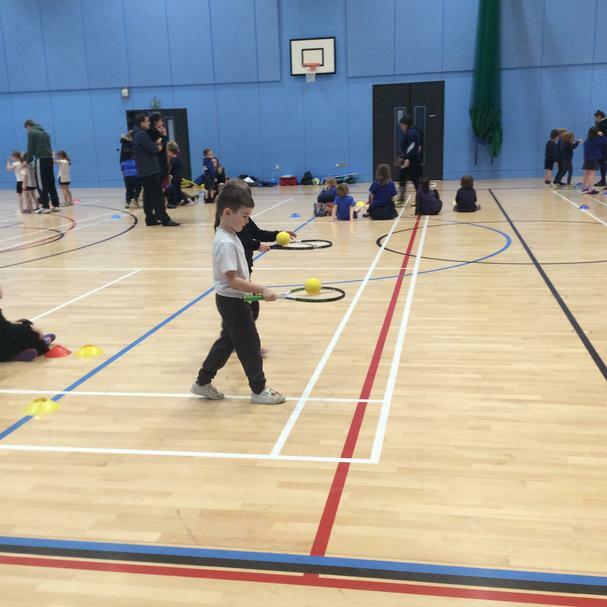 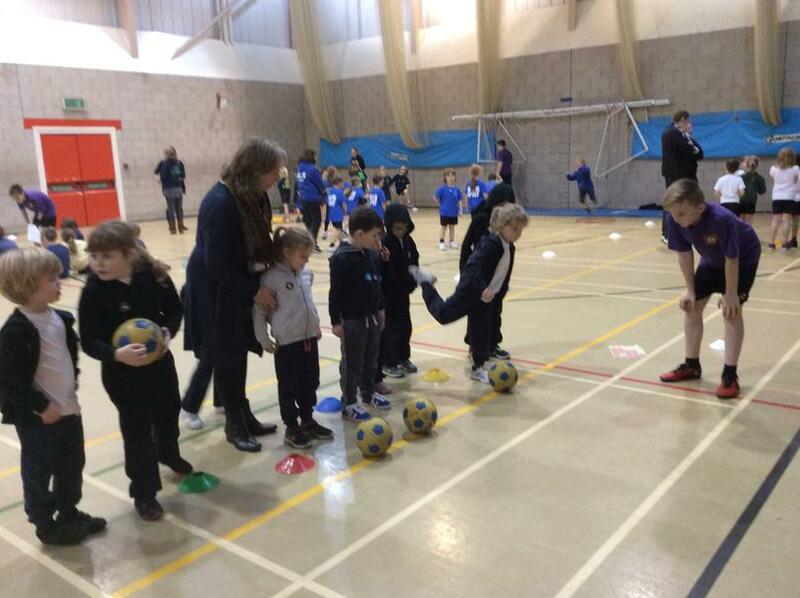 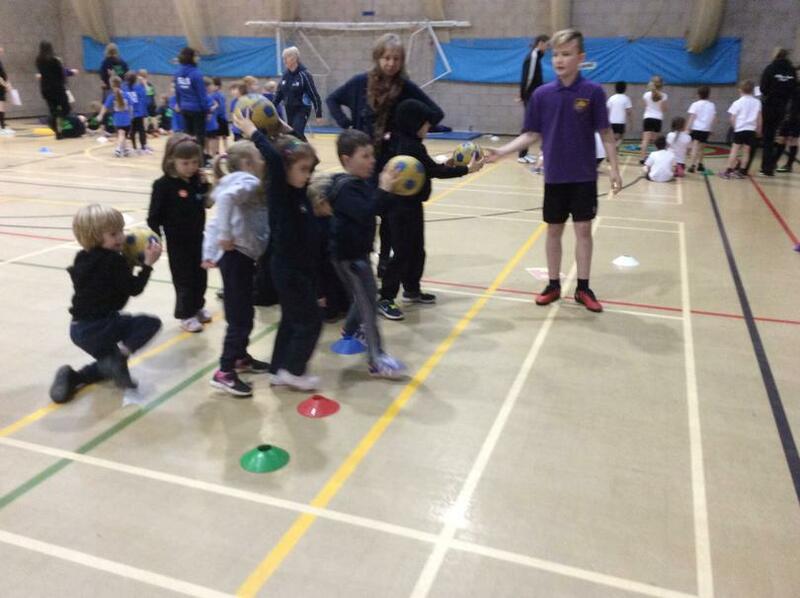 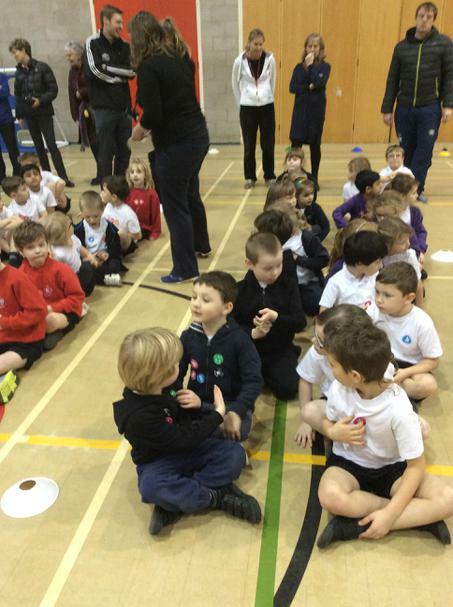 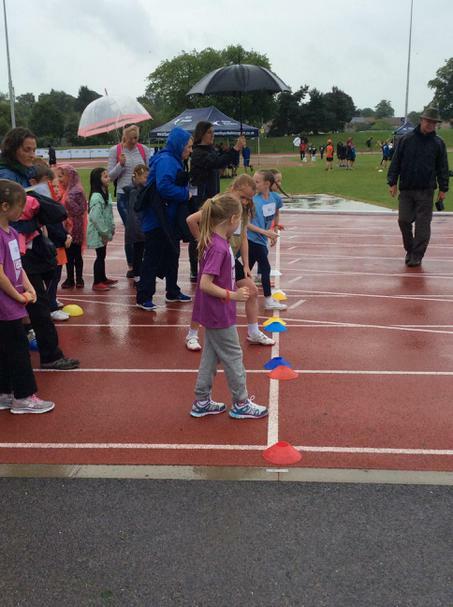 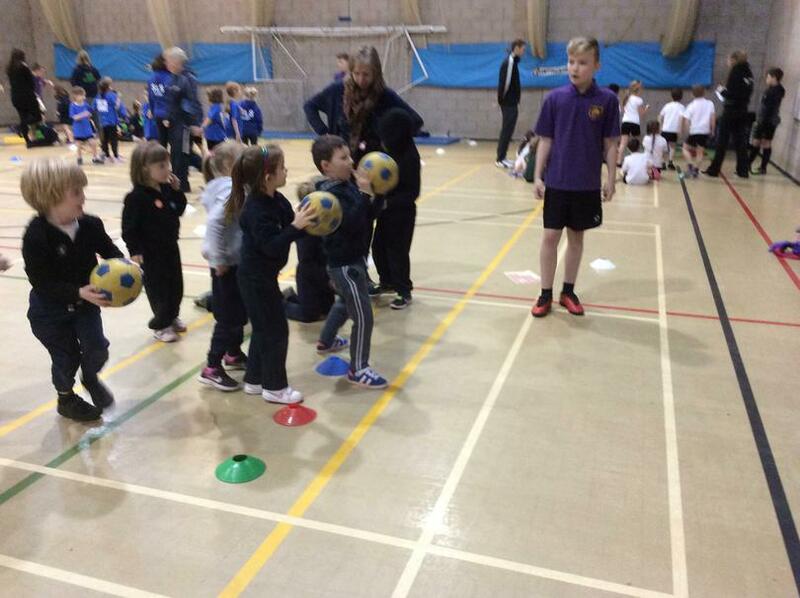 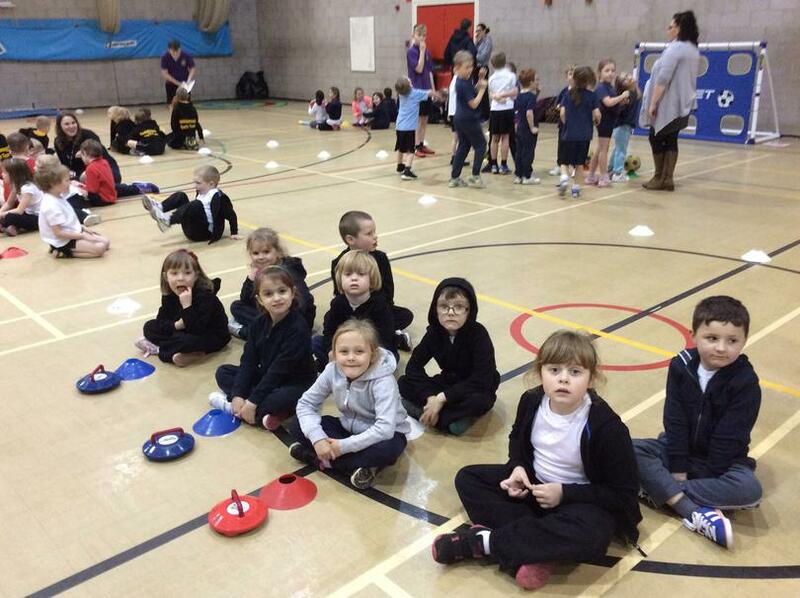 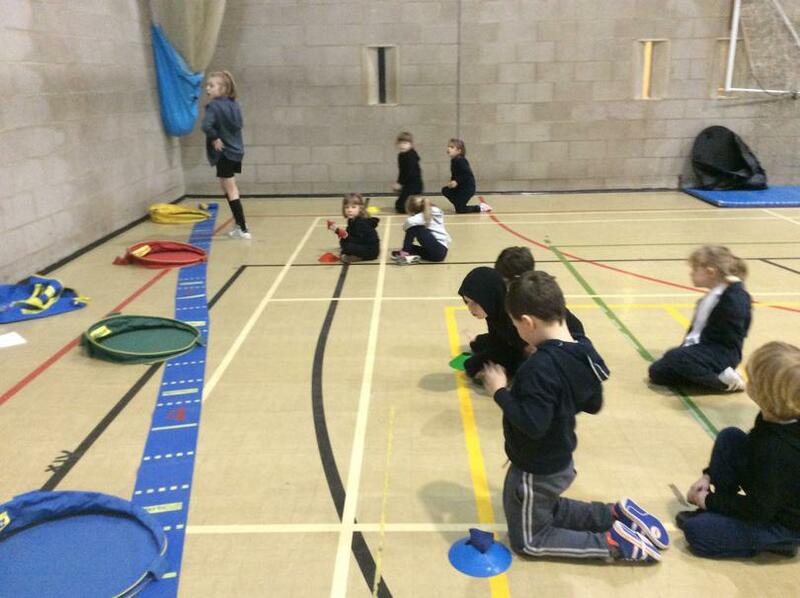 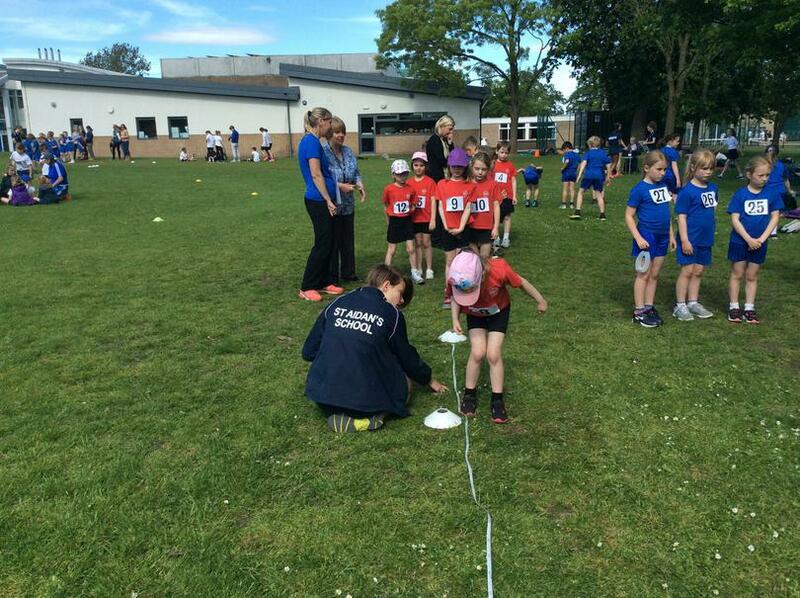 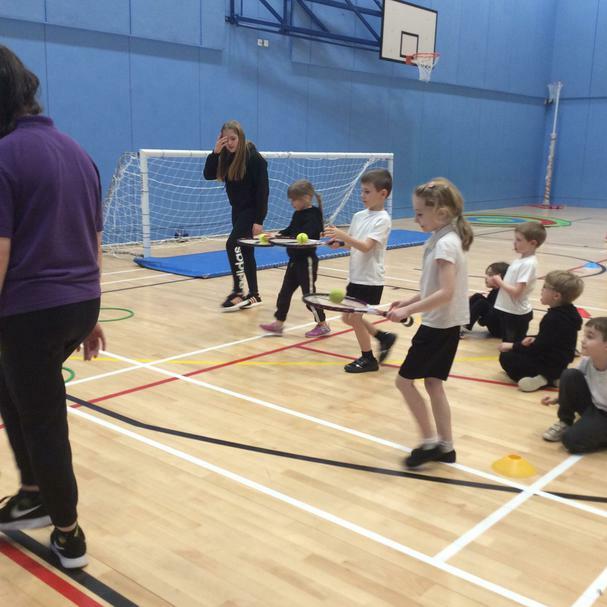 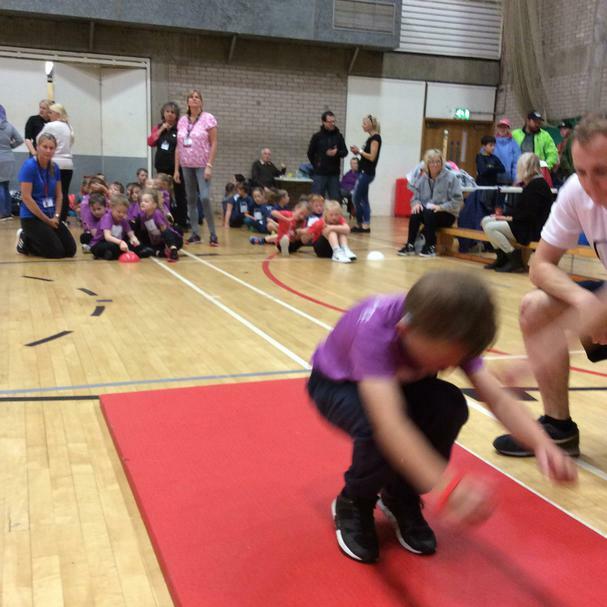 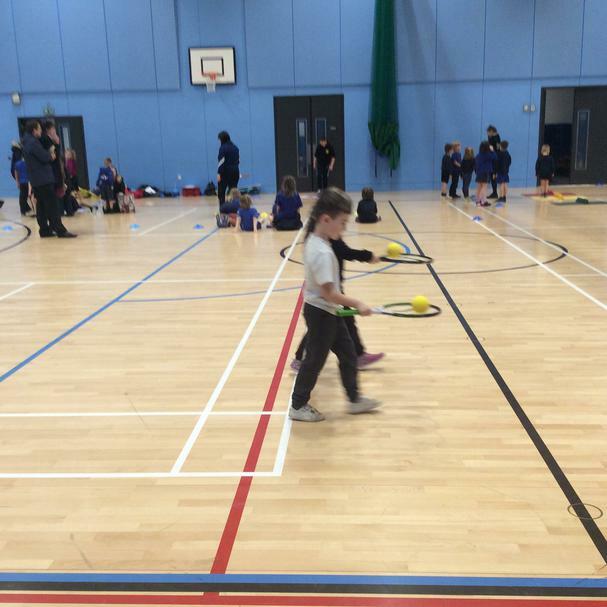 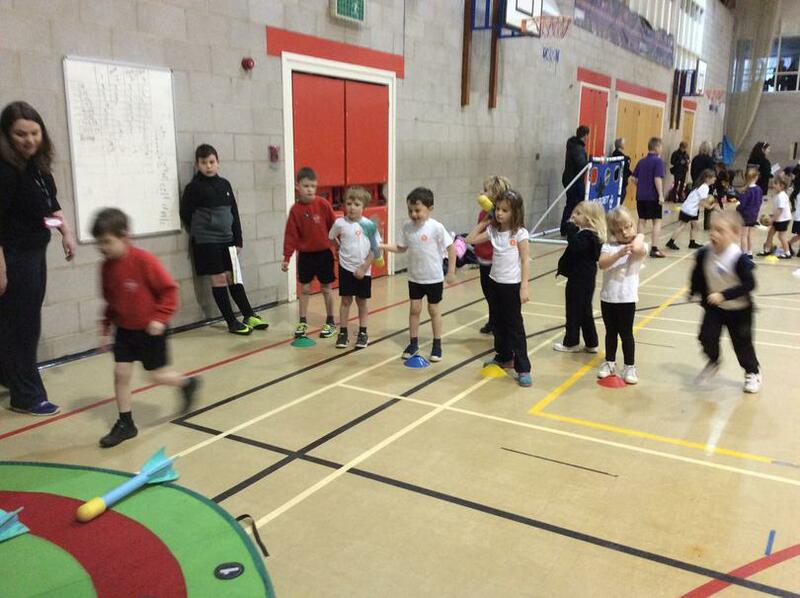 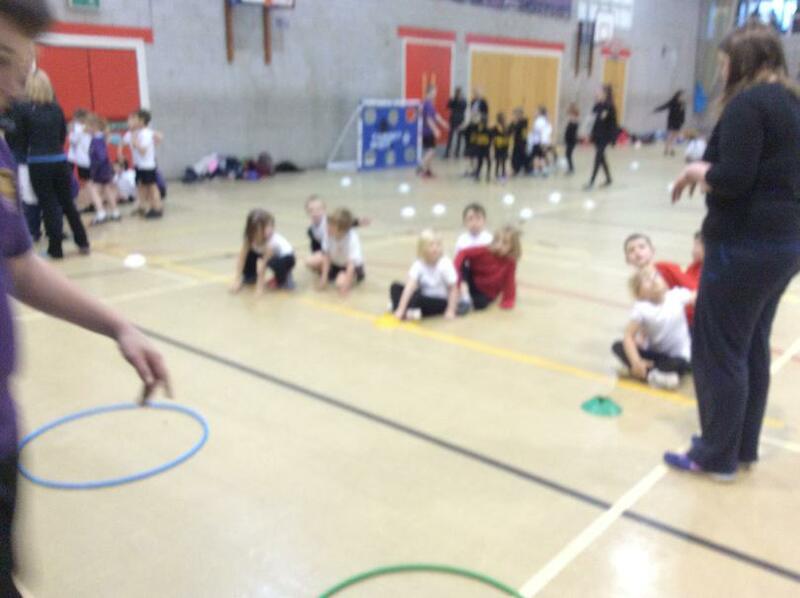 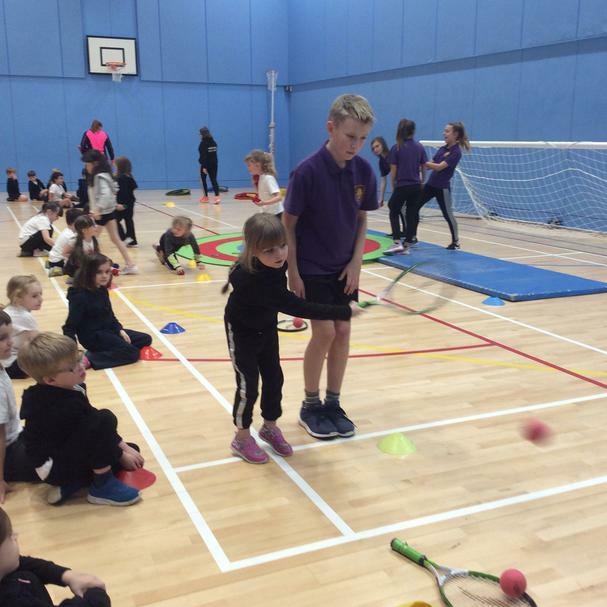 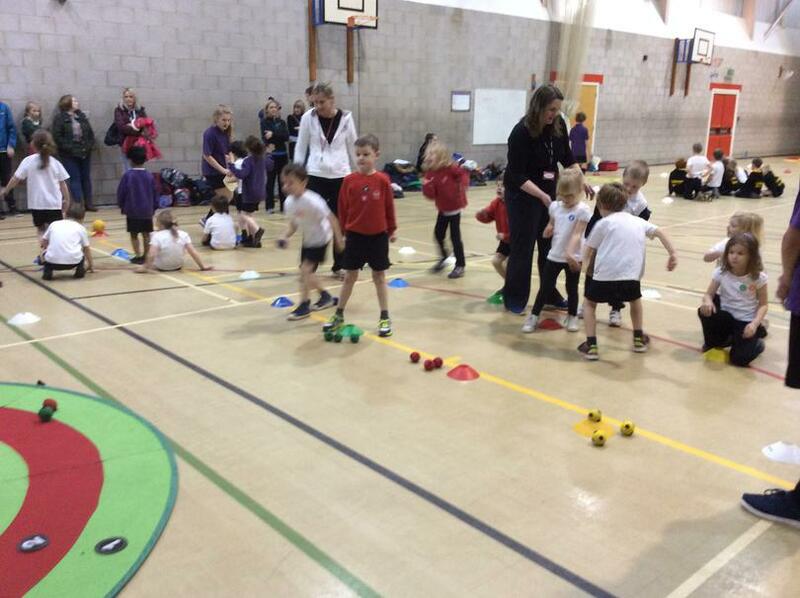 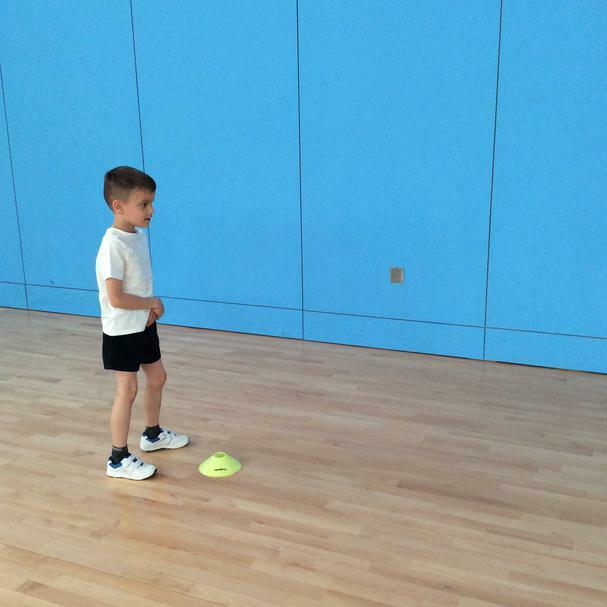 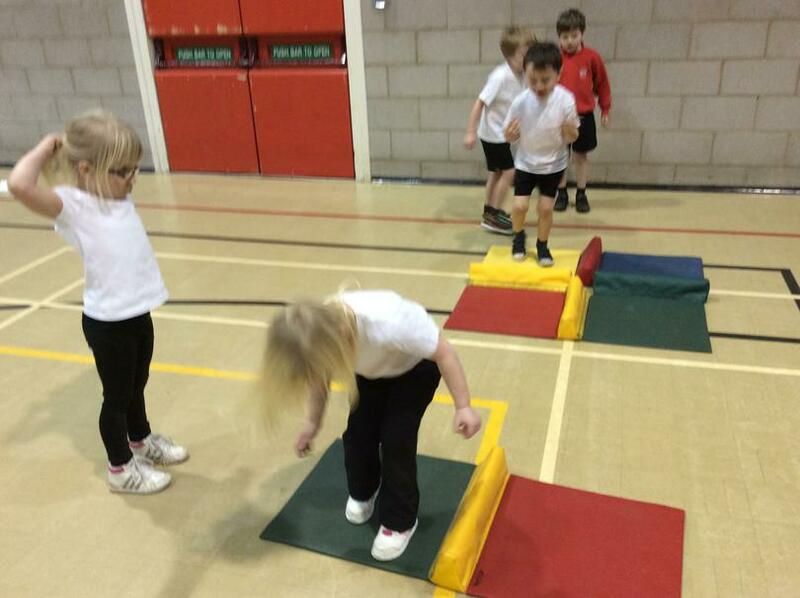 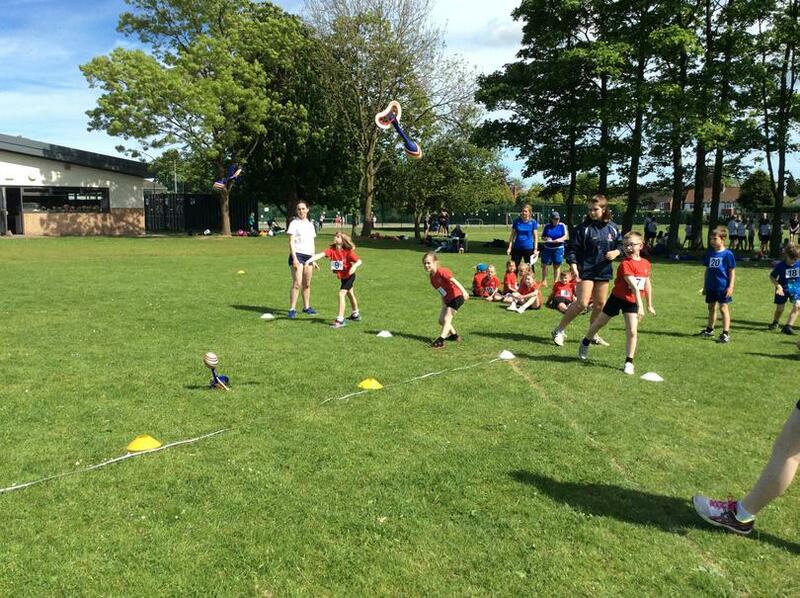 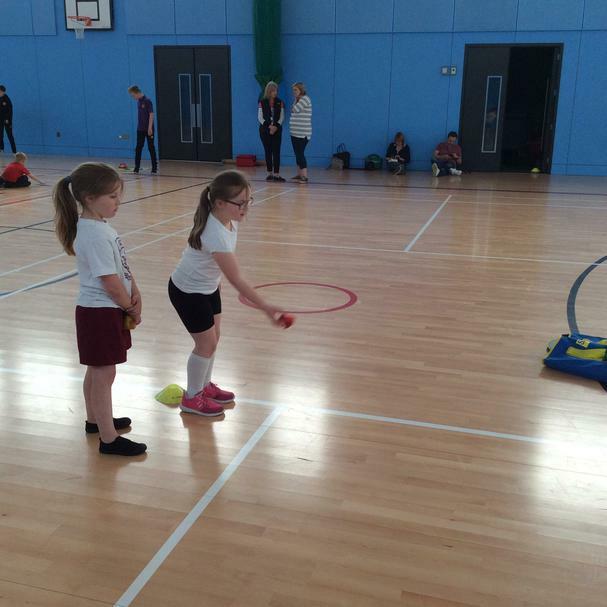 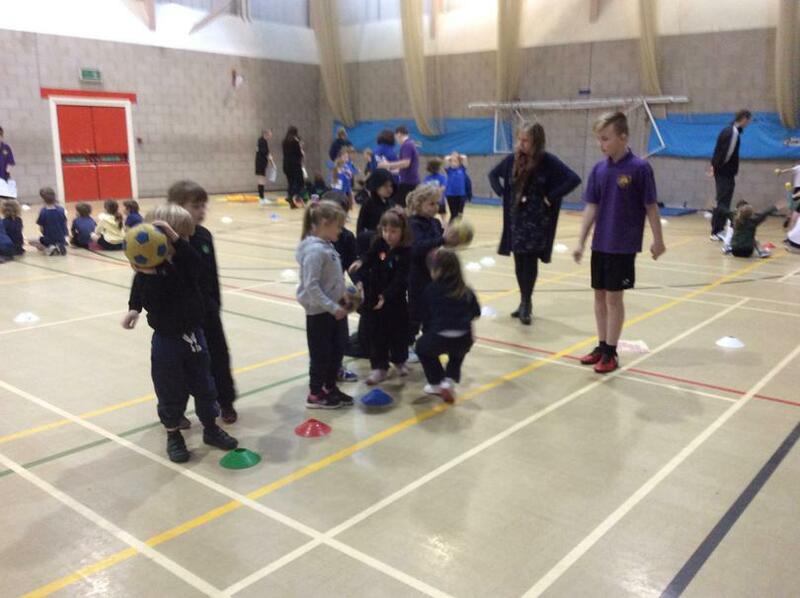 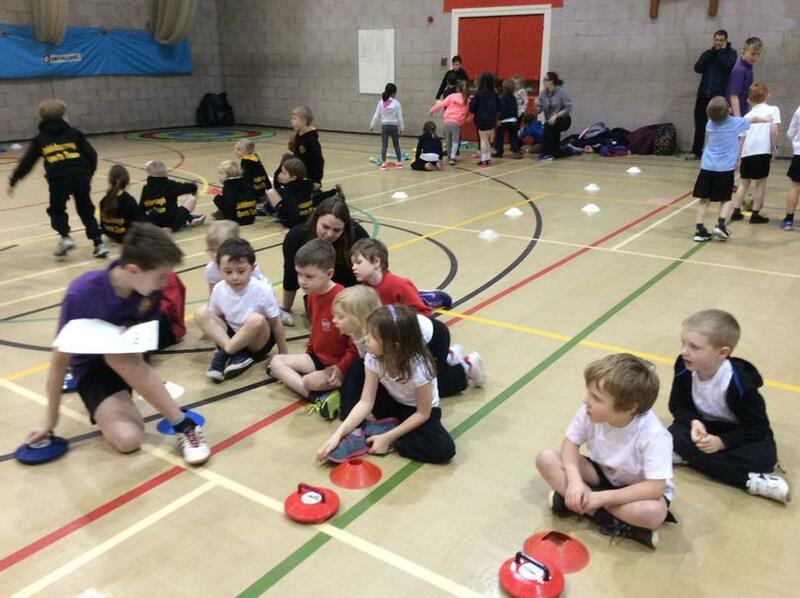 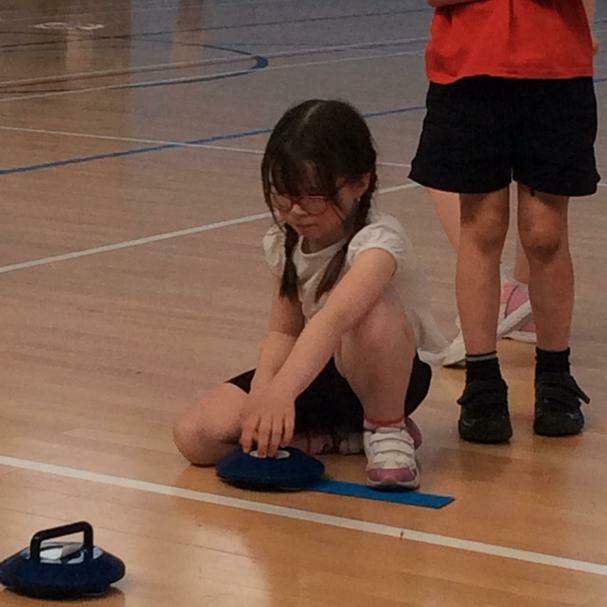 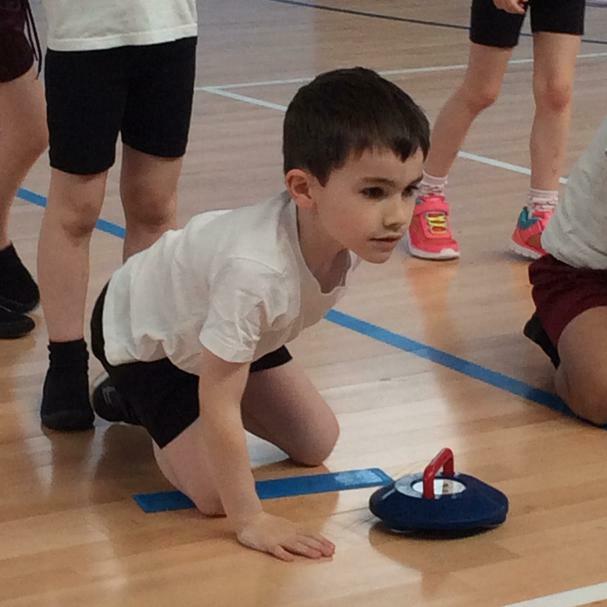 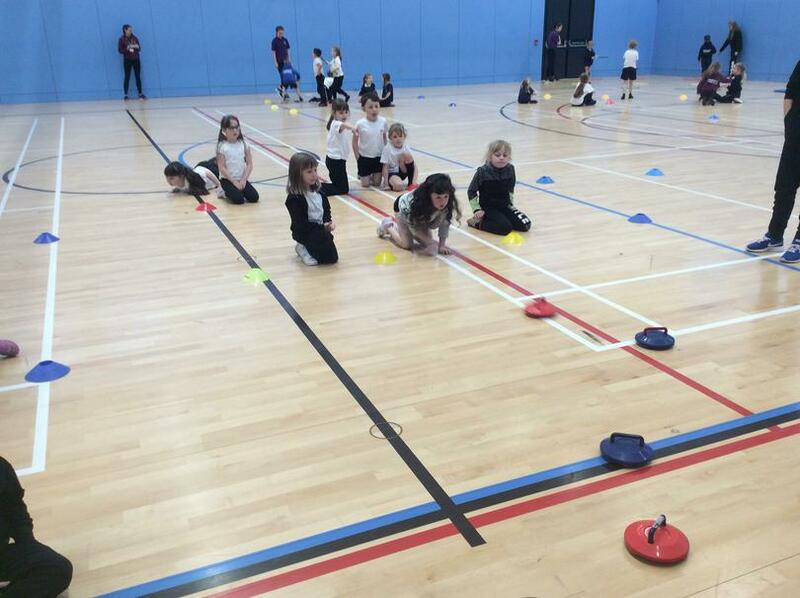 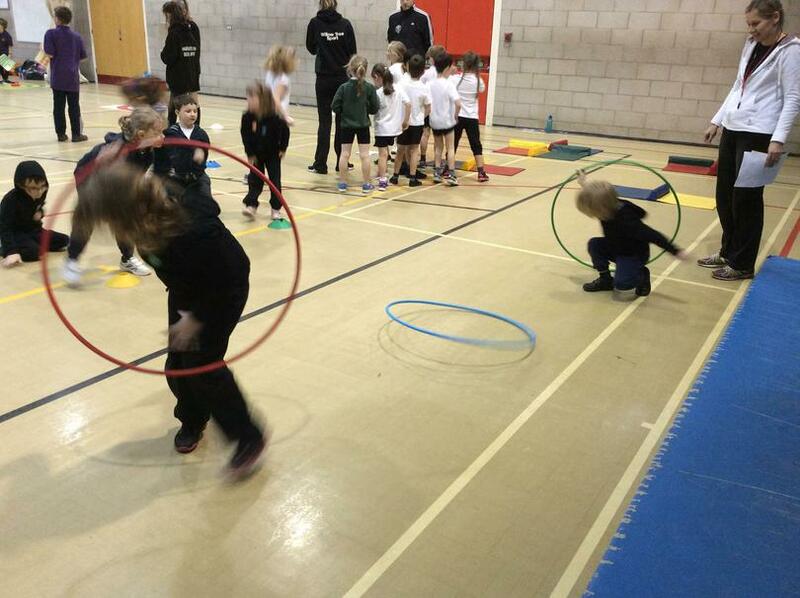 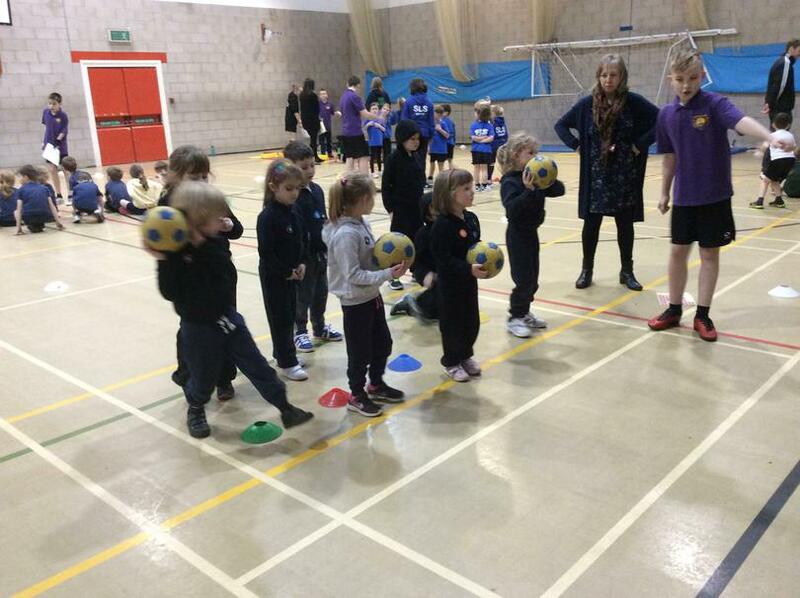 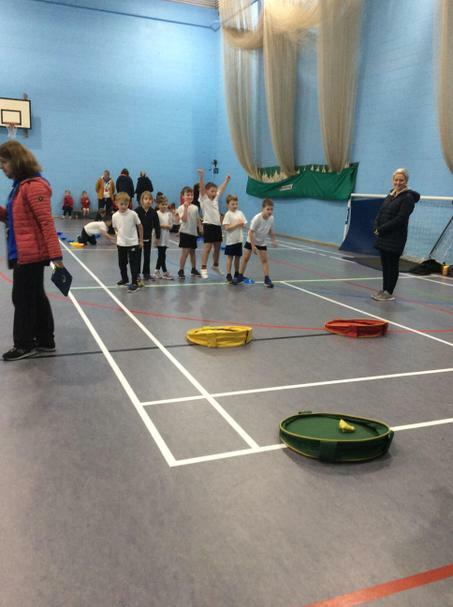 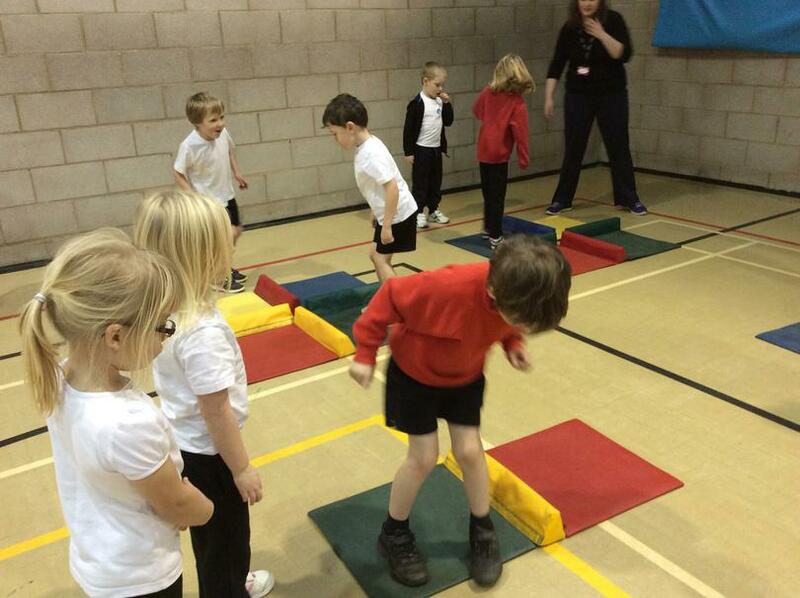 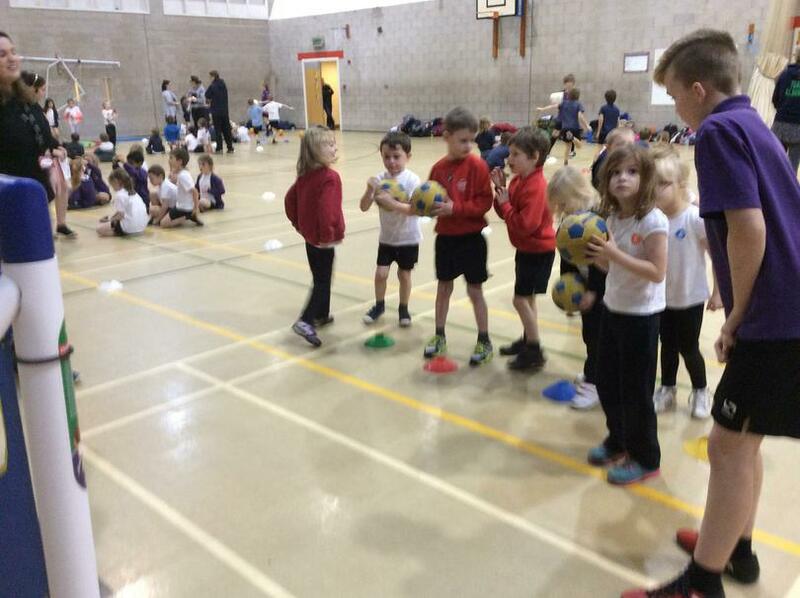 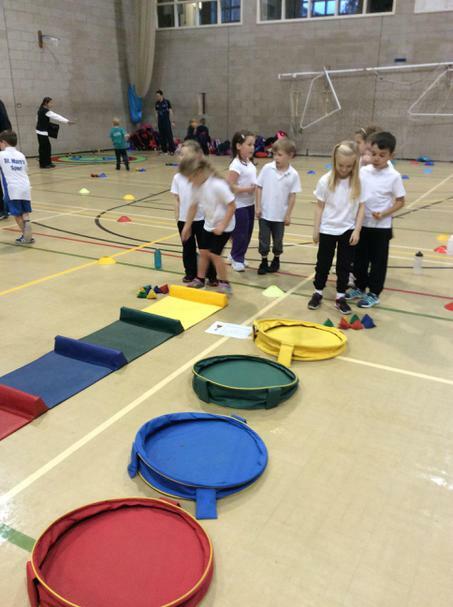 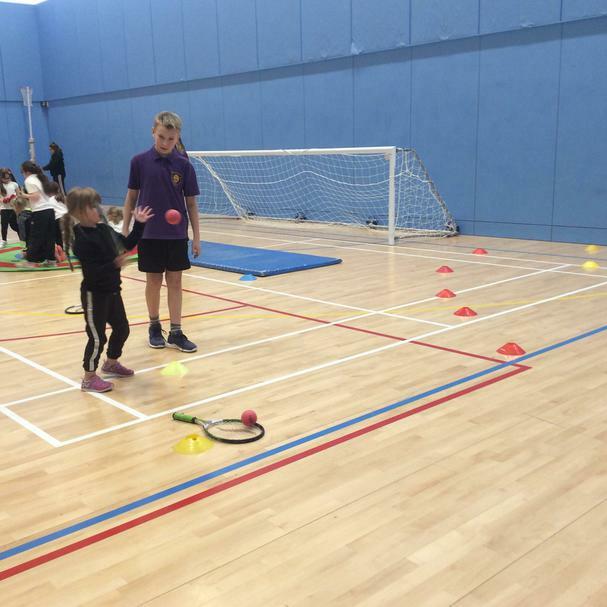 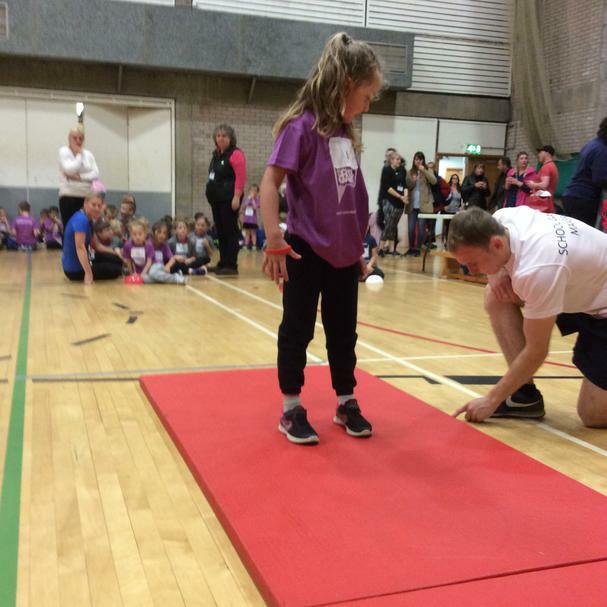 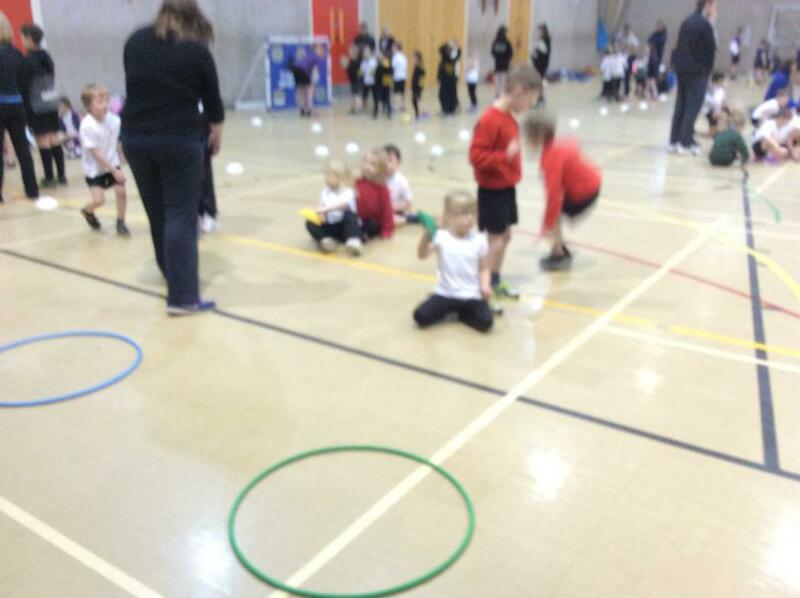 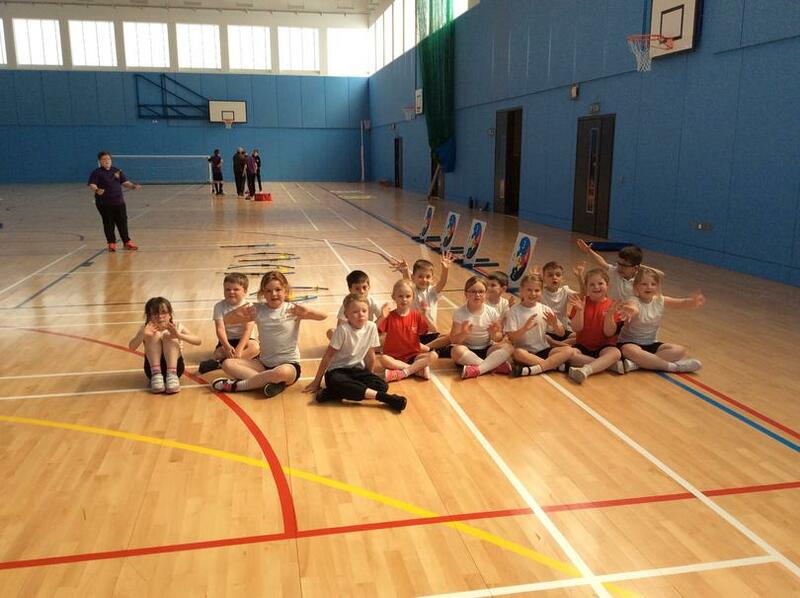 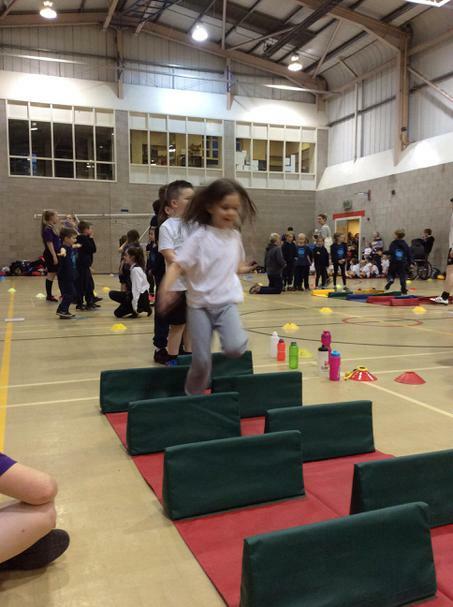 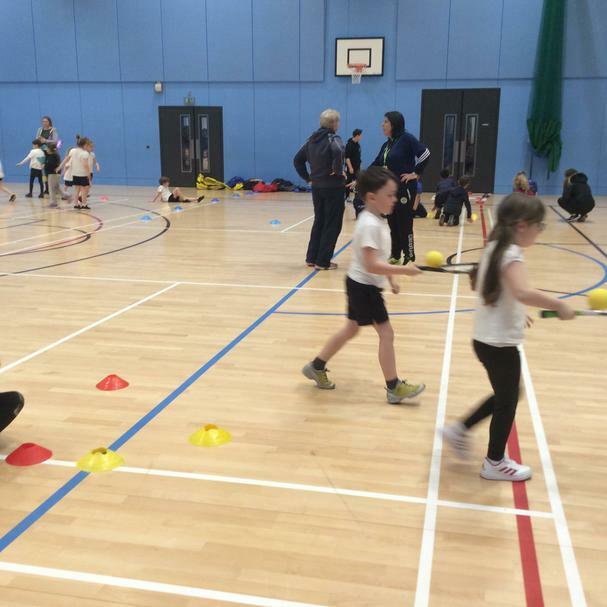 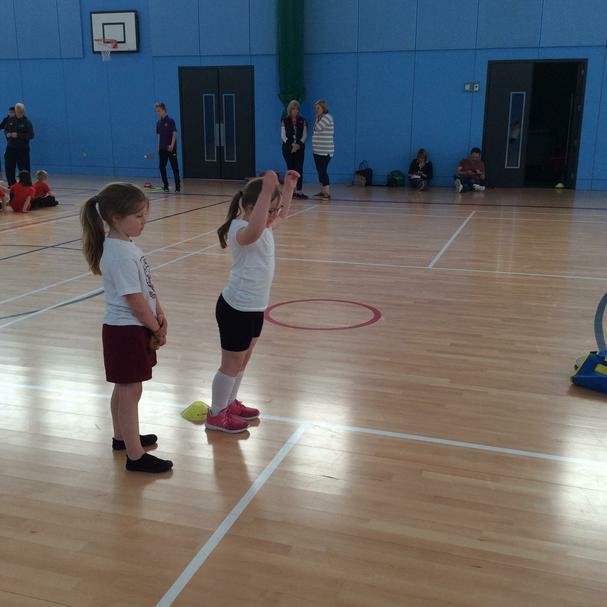 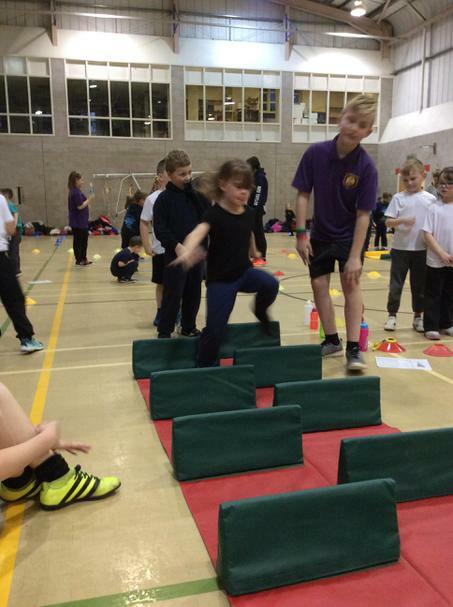 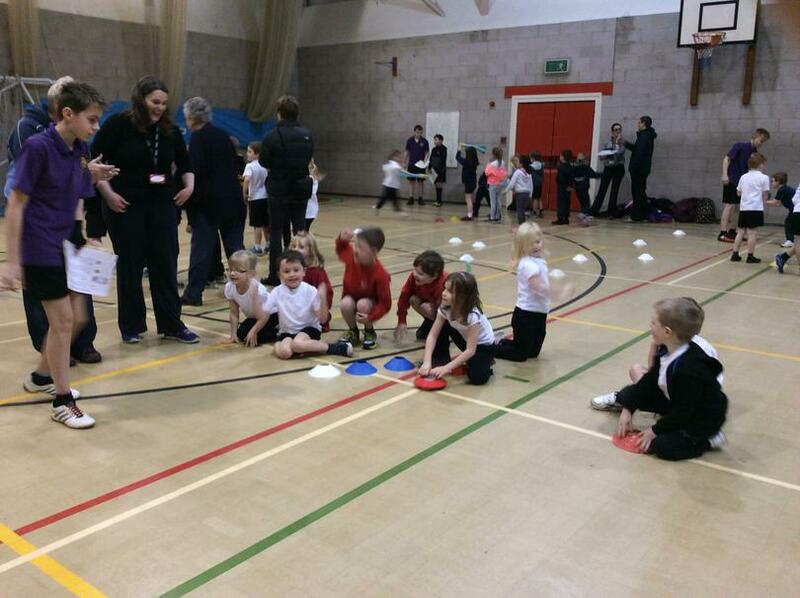 A group of Year 2 children attended the Infant Agility Festival held at Rossett High School as part of the Harrogate Schools Sports Partnership. 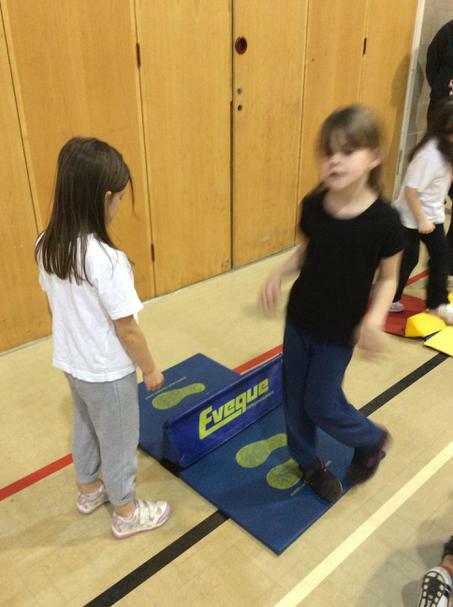 The range of activities included Athletics skill development of jumping, throwing, and running. 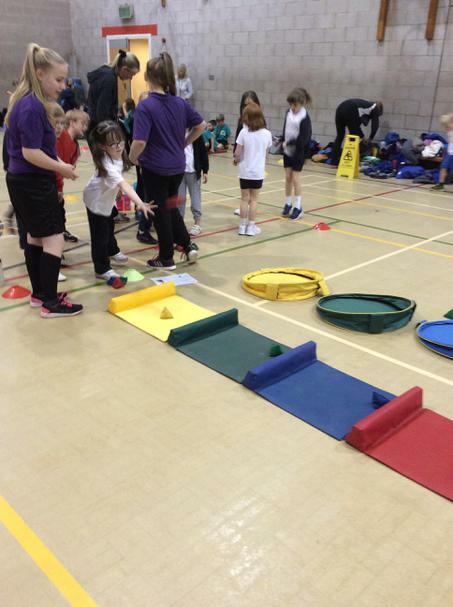 All the children had a wonderful time and made great progress during the event. 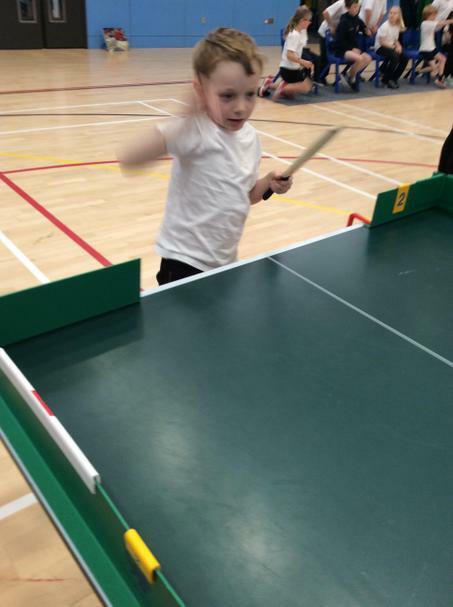 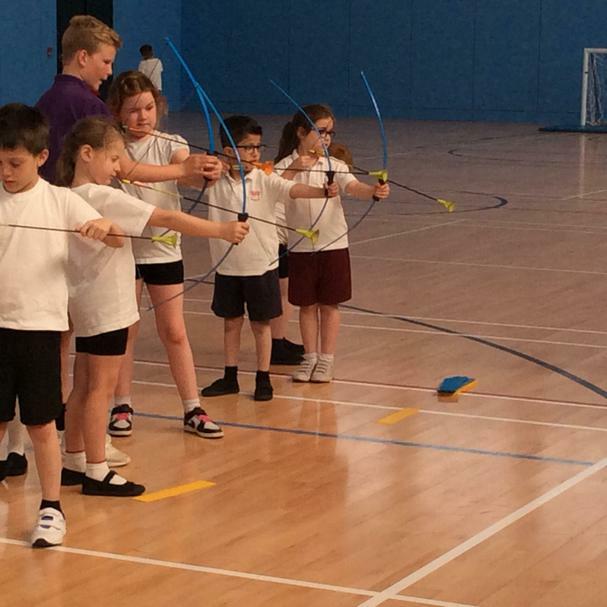 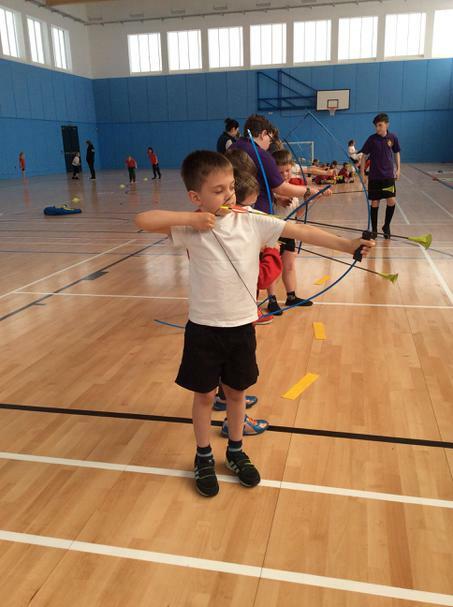 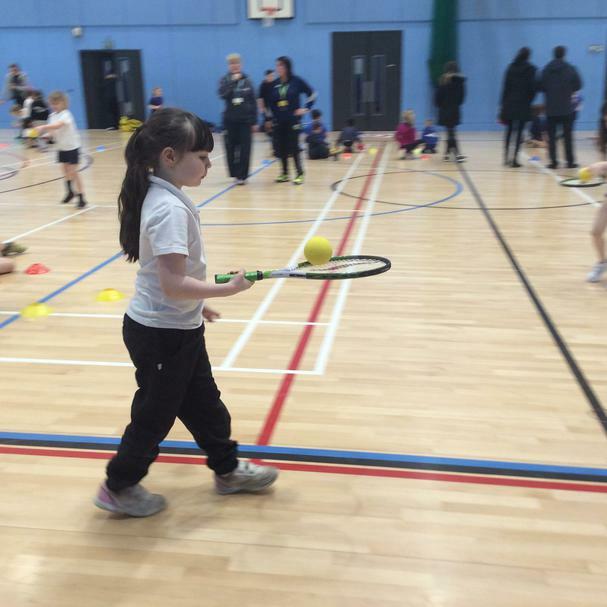 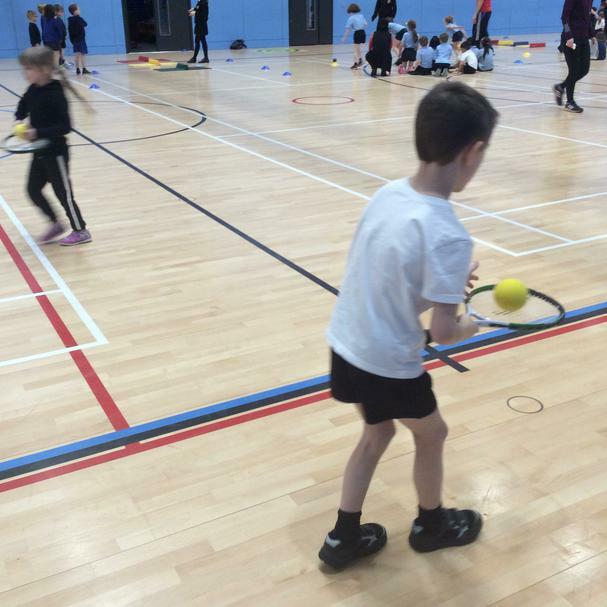 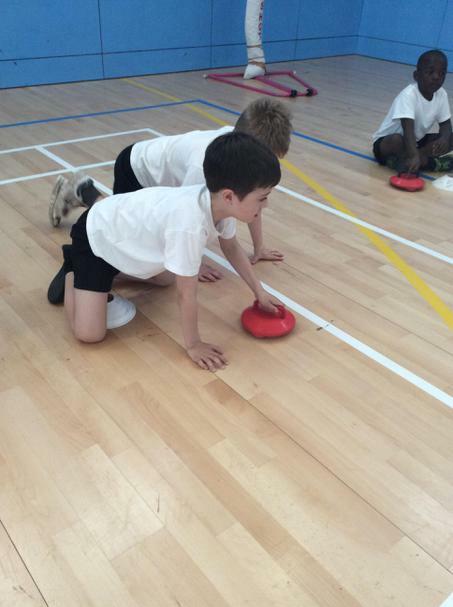 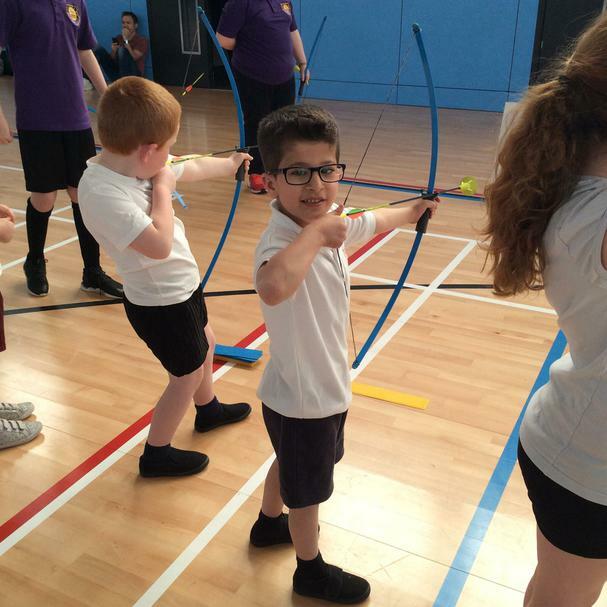 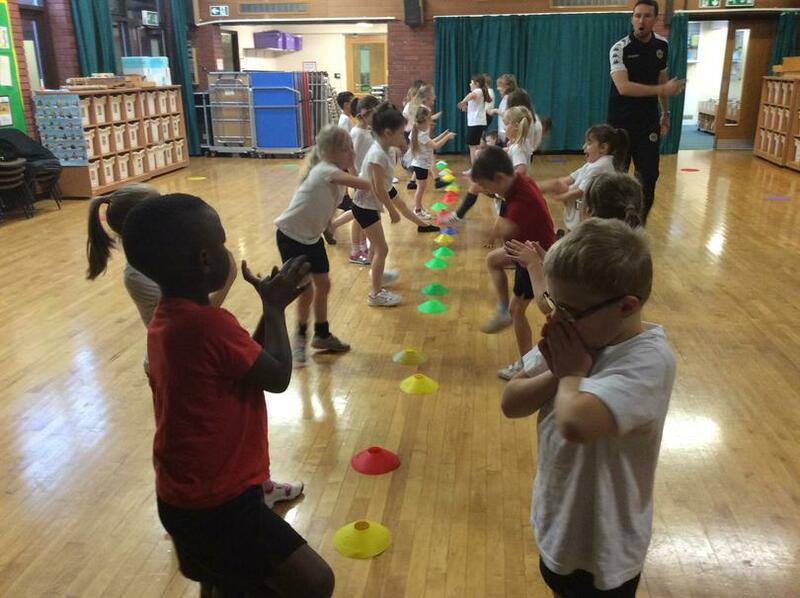 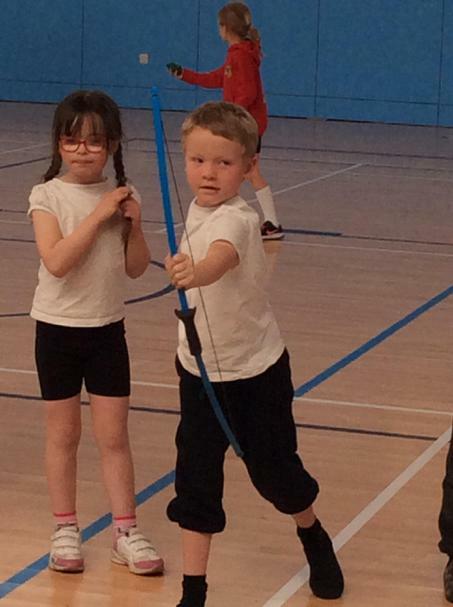 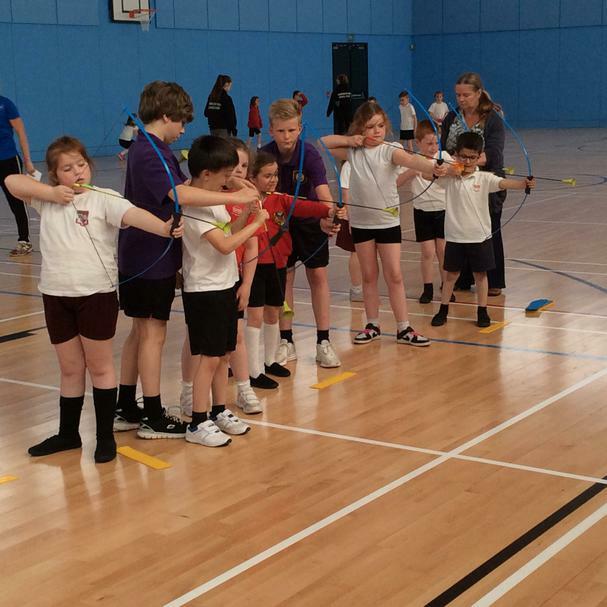 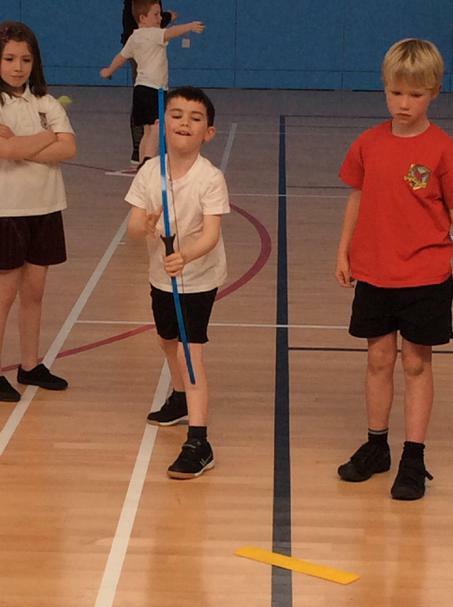 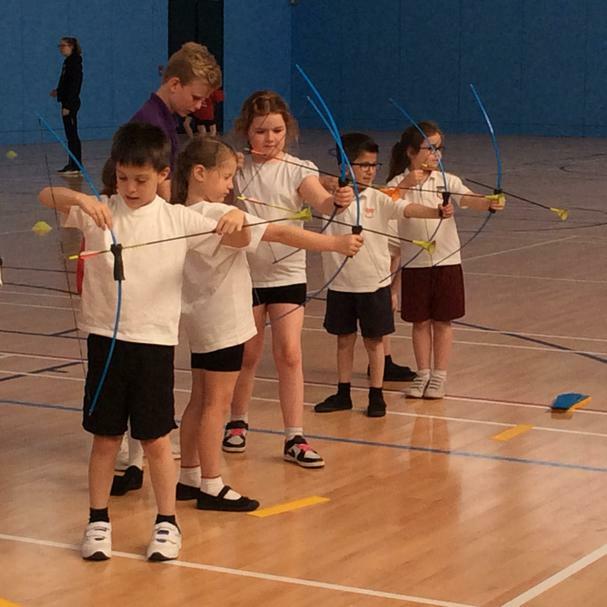 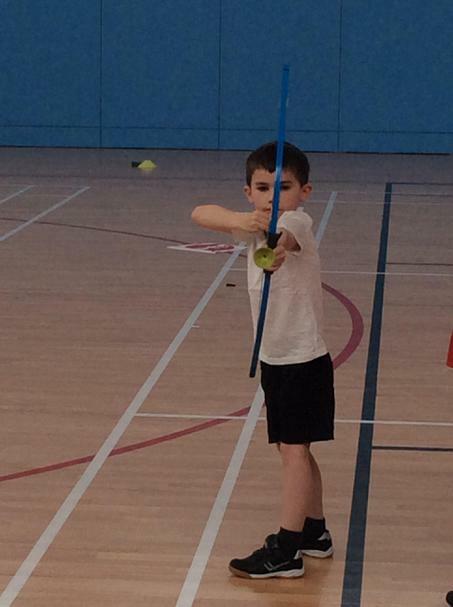 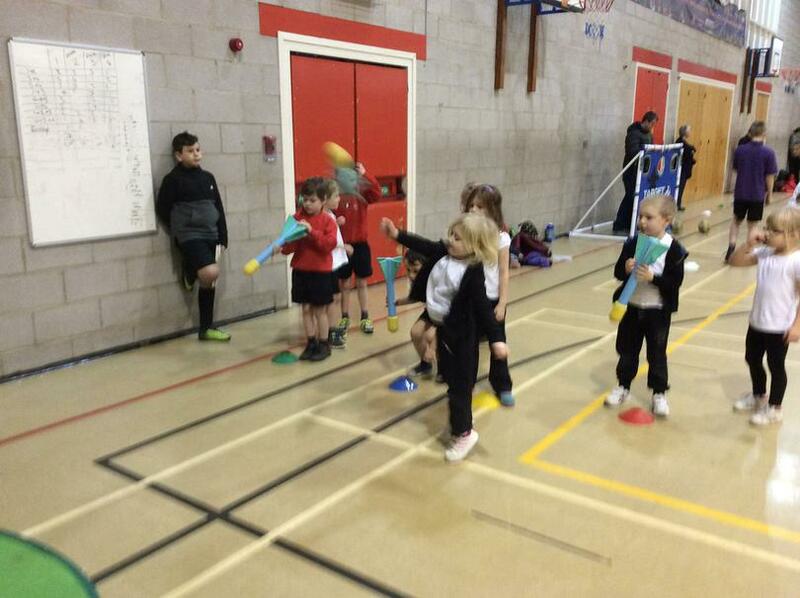 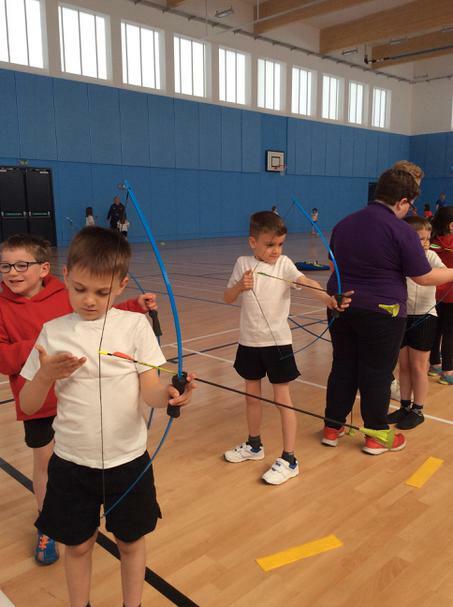 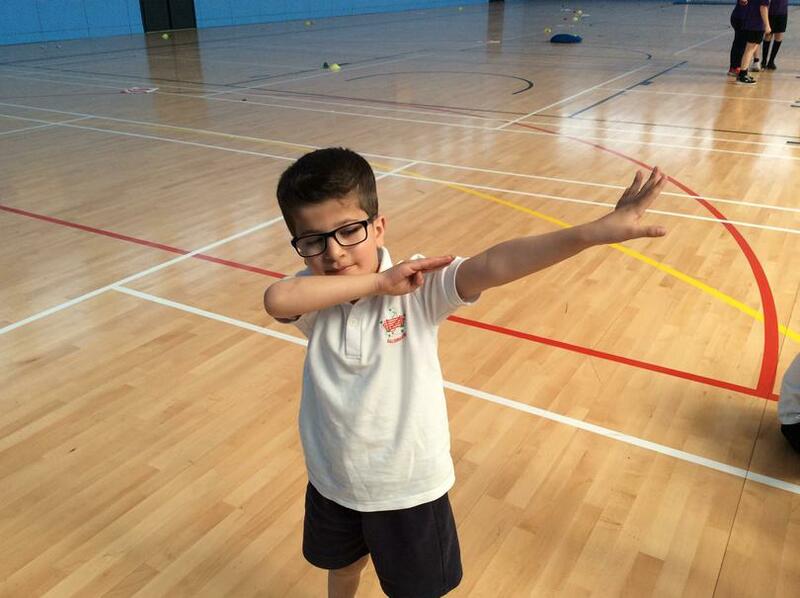 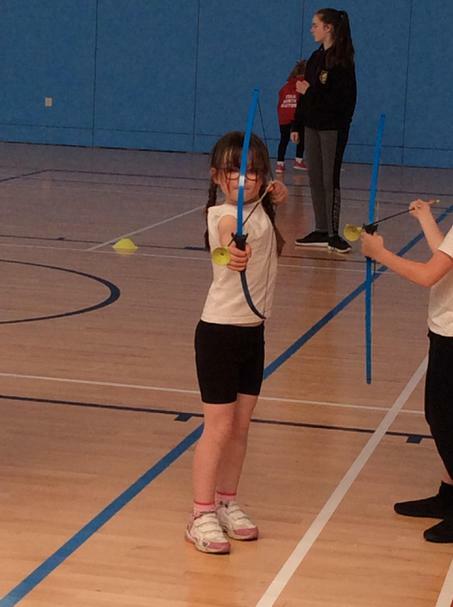 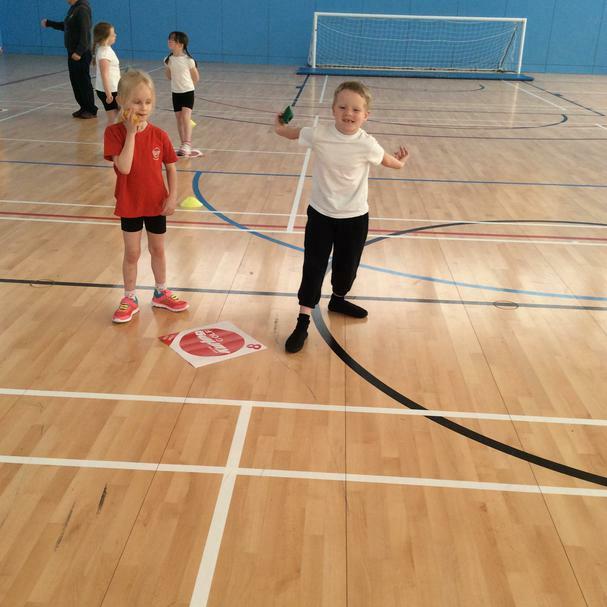 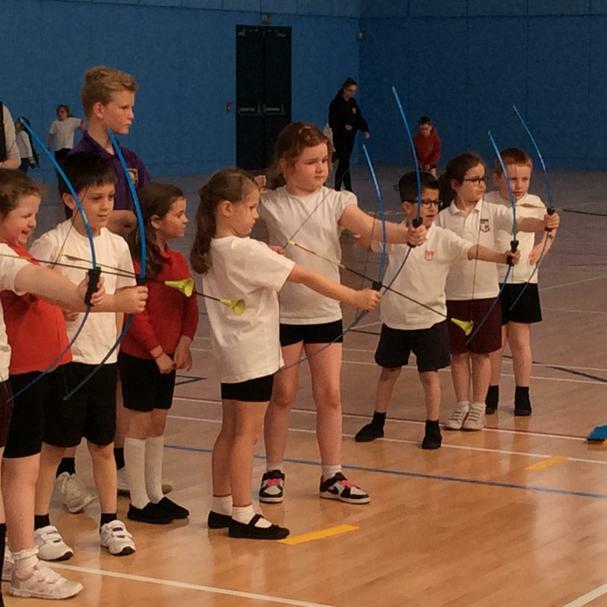 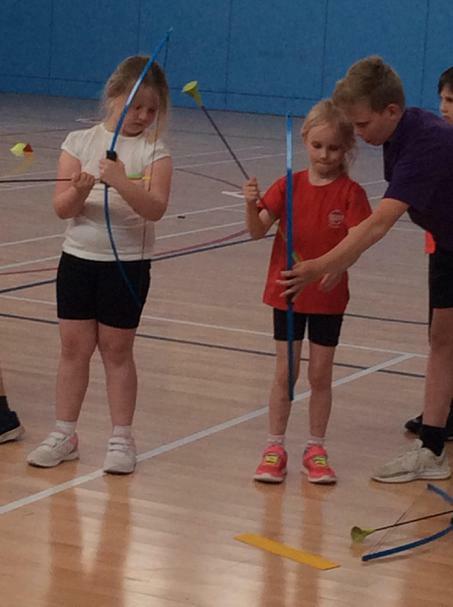 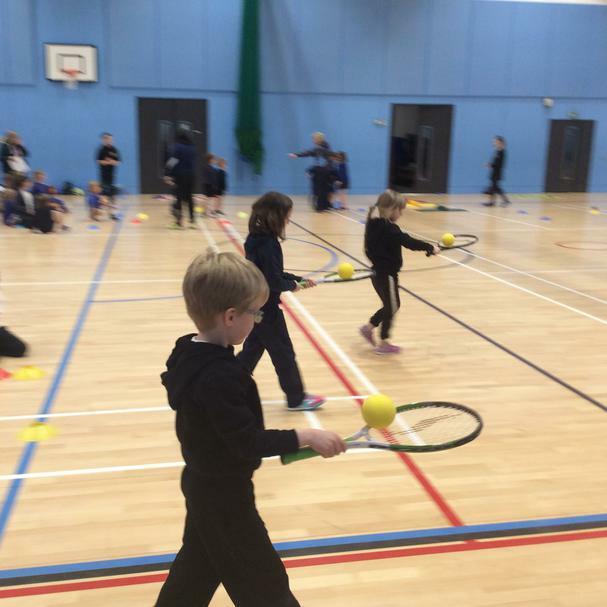 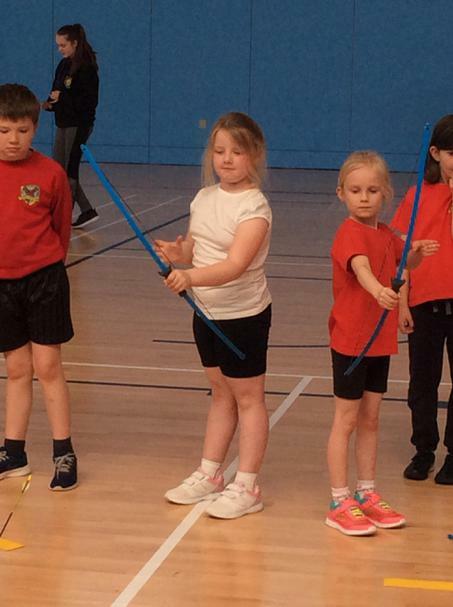 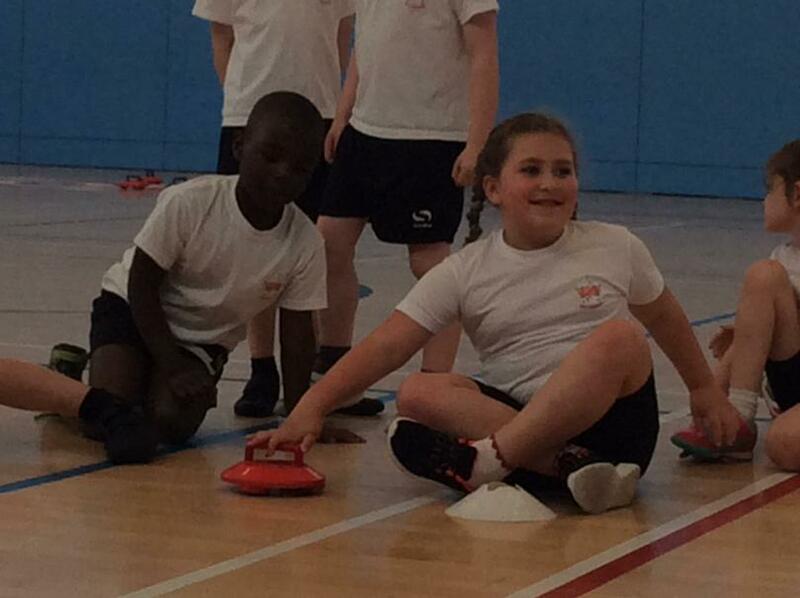 Some children from Year 2 made the most of the opportunity to take part in a range of new sporting activities alongside children from other schools. 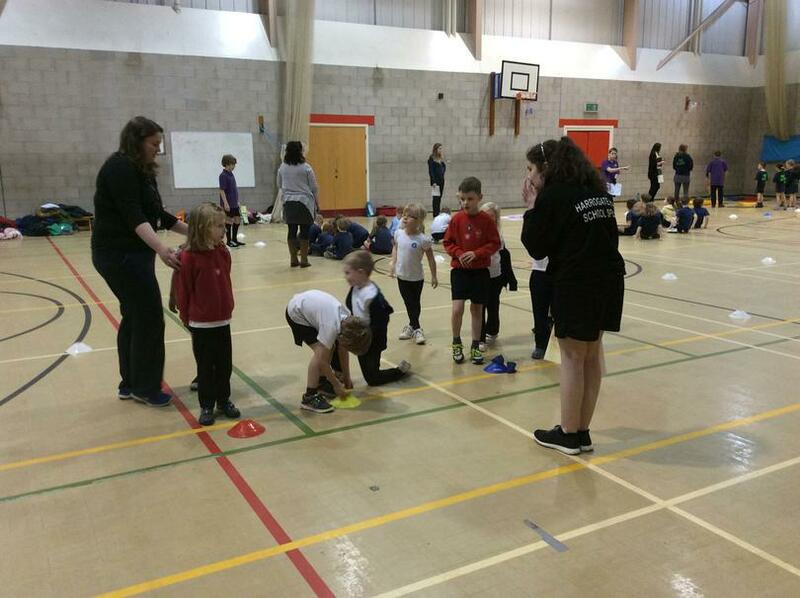 This event was organised by the Harrogate School Sports Partnership and supported by the young Sports leaders from Harrogate High School. 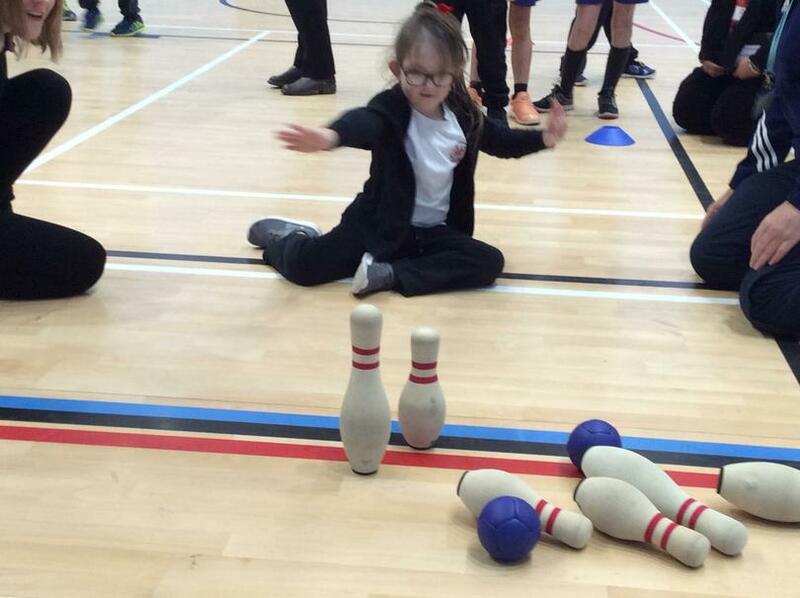 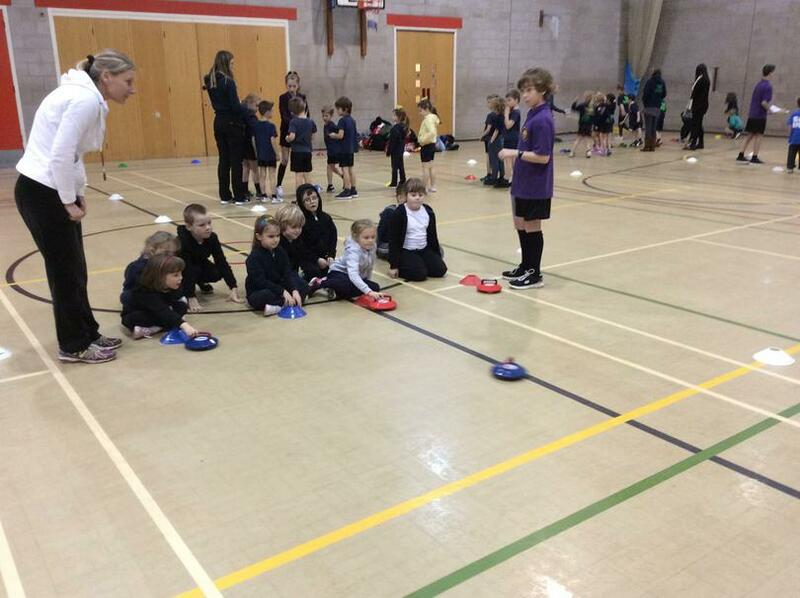 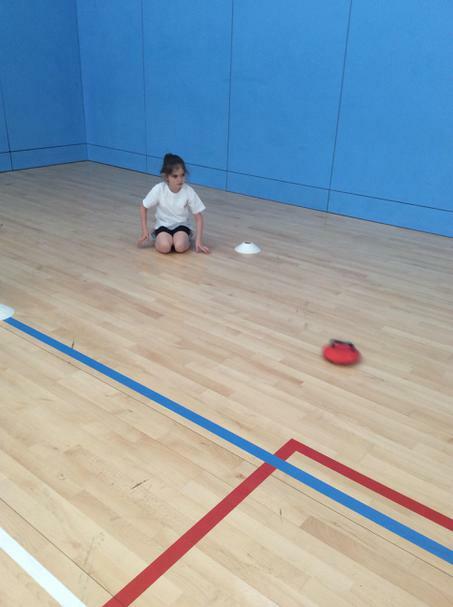 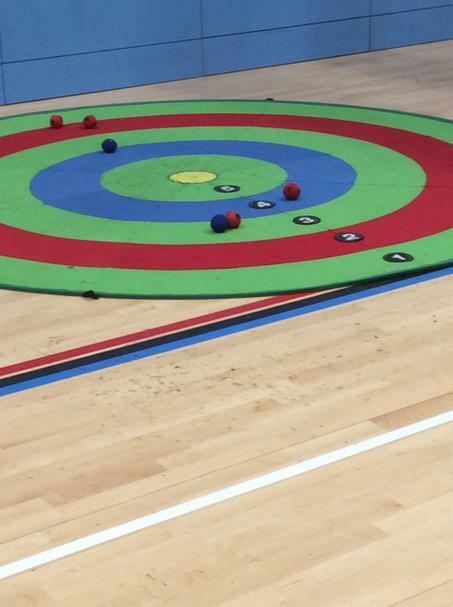 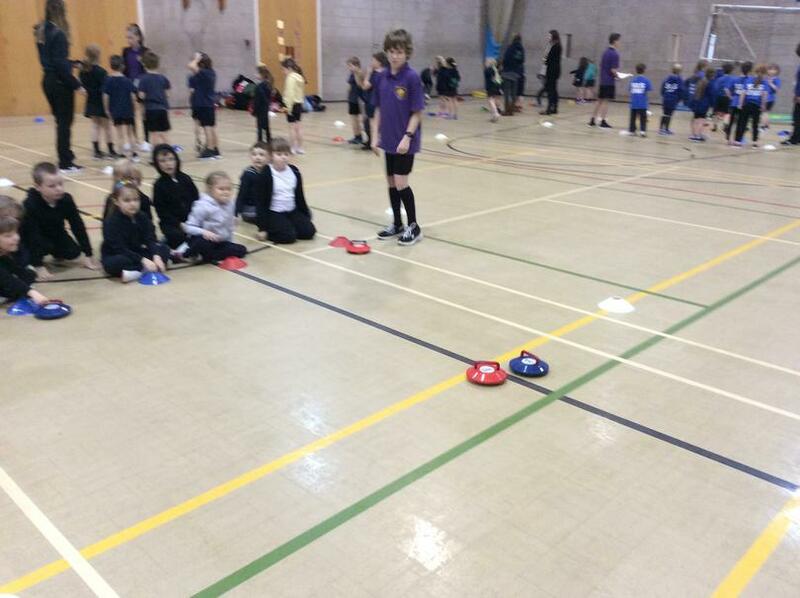 The activities included Boccia, Skittles & Target games, Extreme Rock, Paper, Scissors, Indoor Rounders and Table Football. 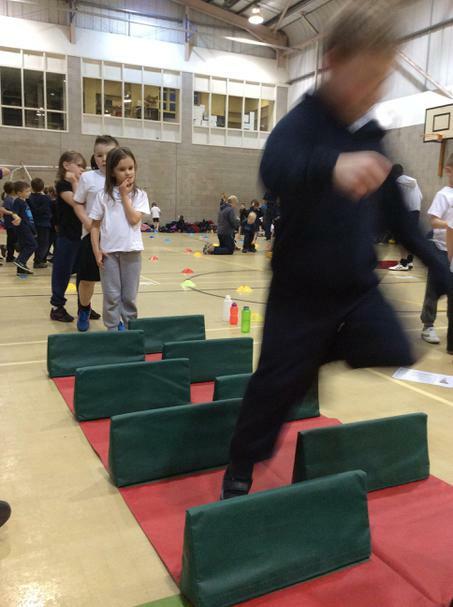 The children had a wonderful time and all asked if they could all go back and do it again. 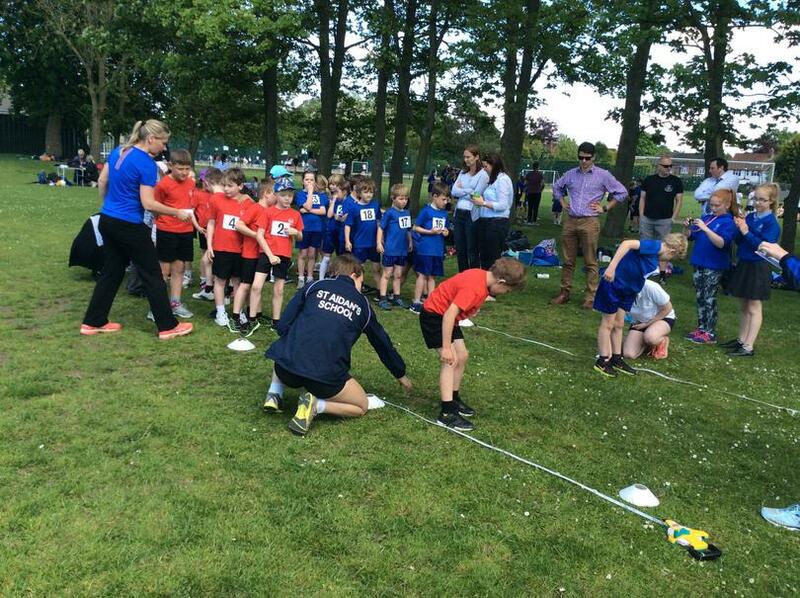 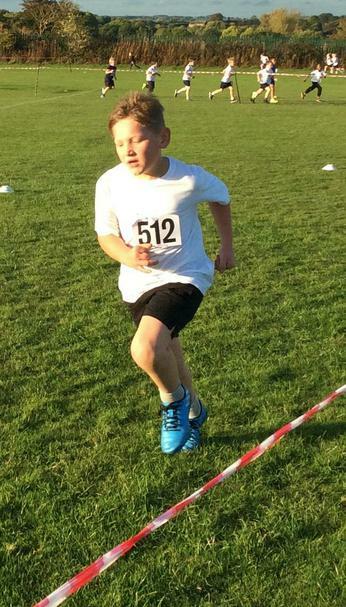 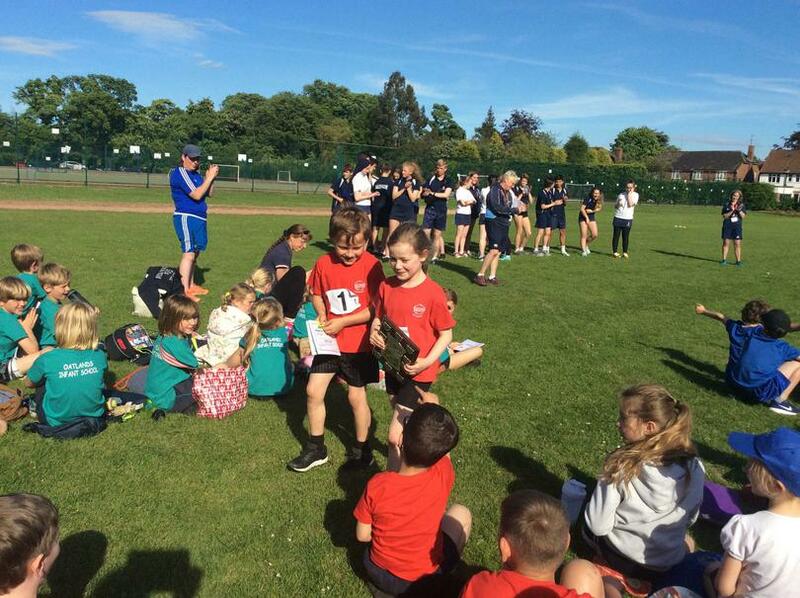 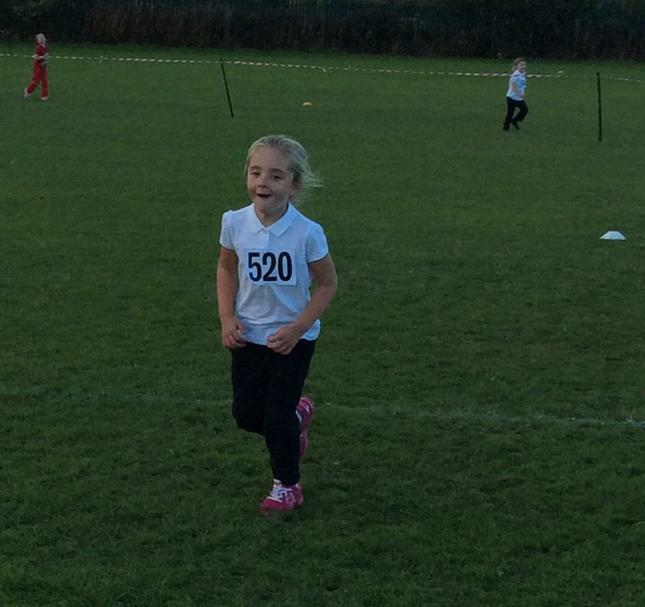 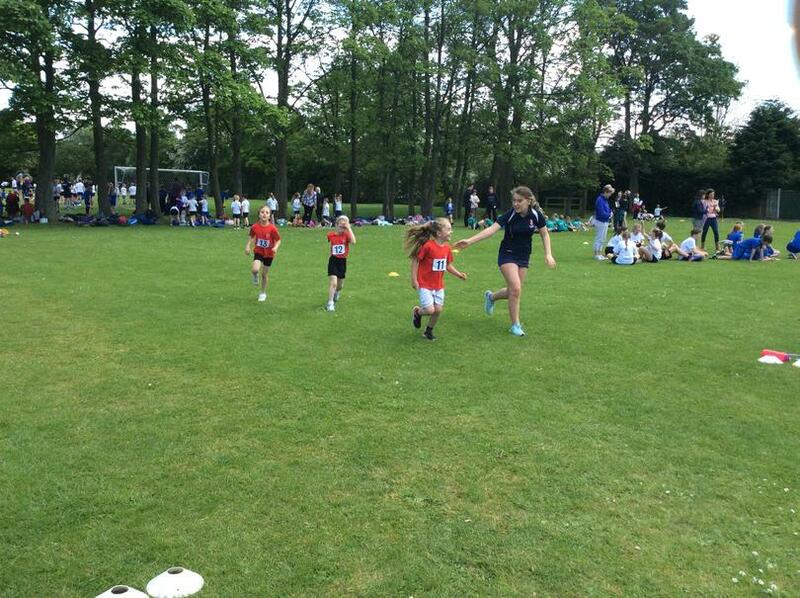 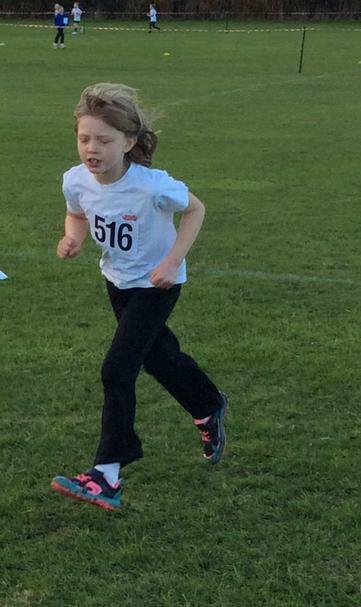 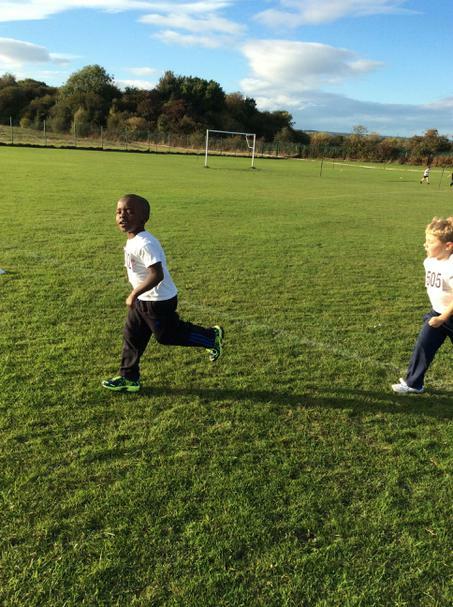 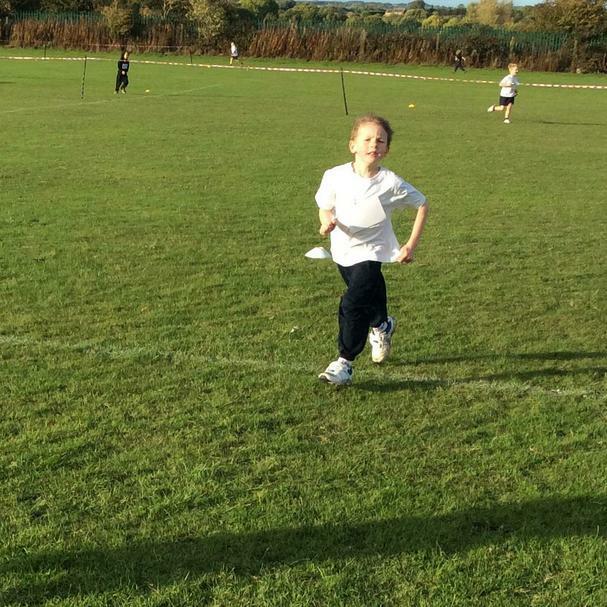 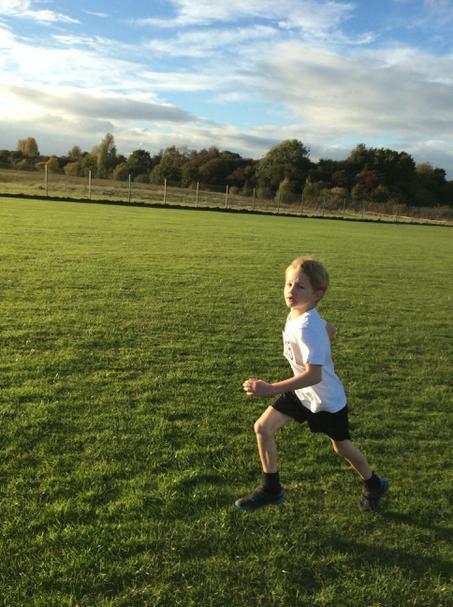 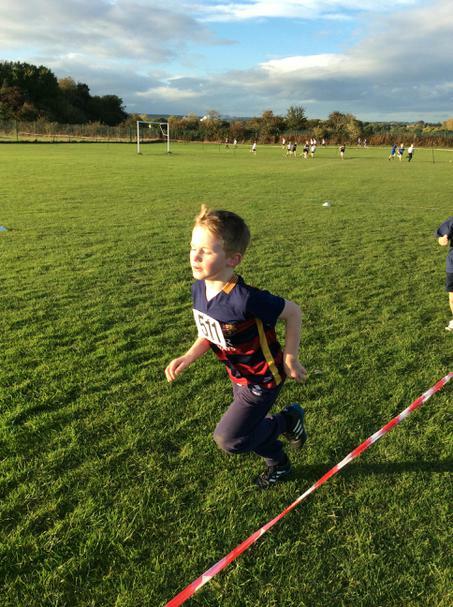 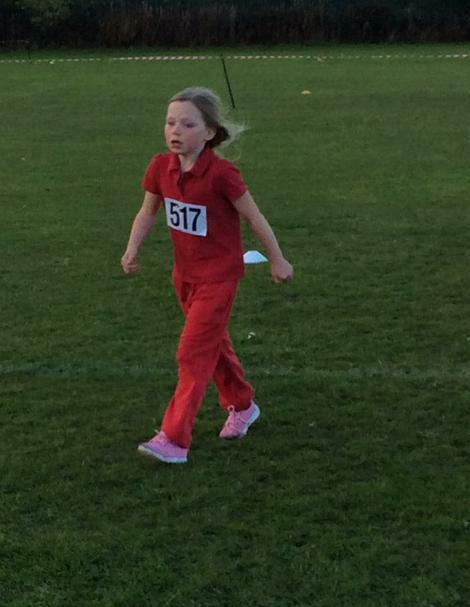 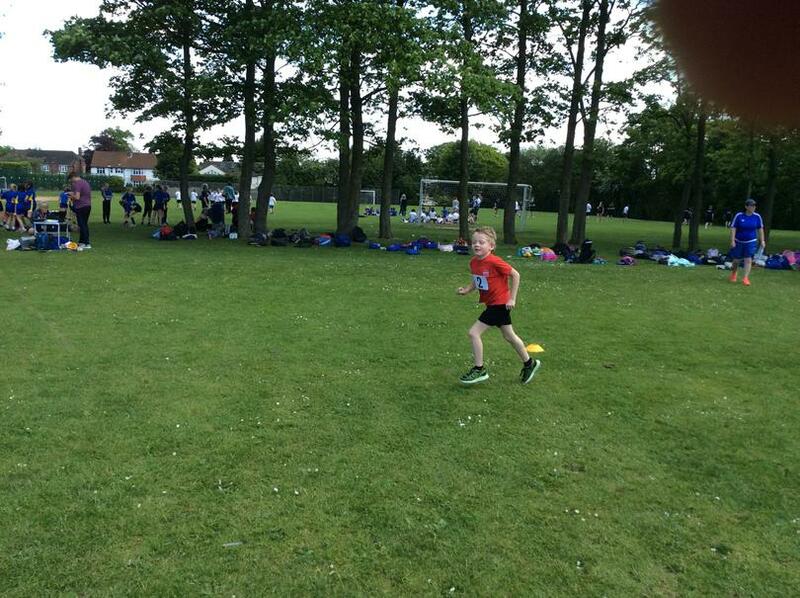 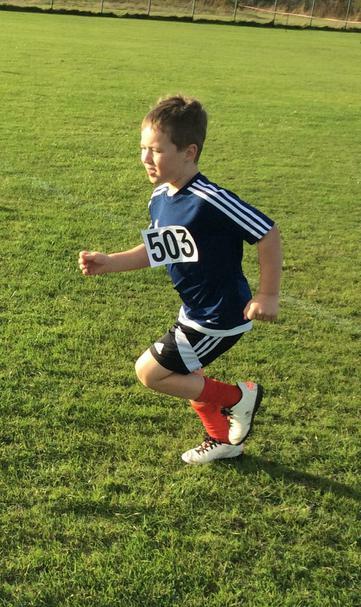 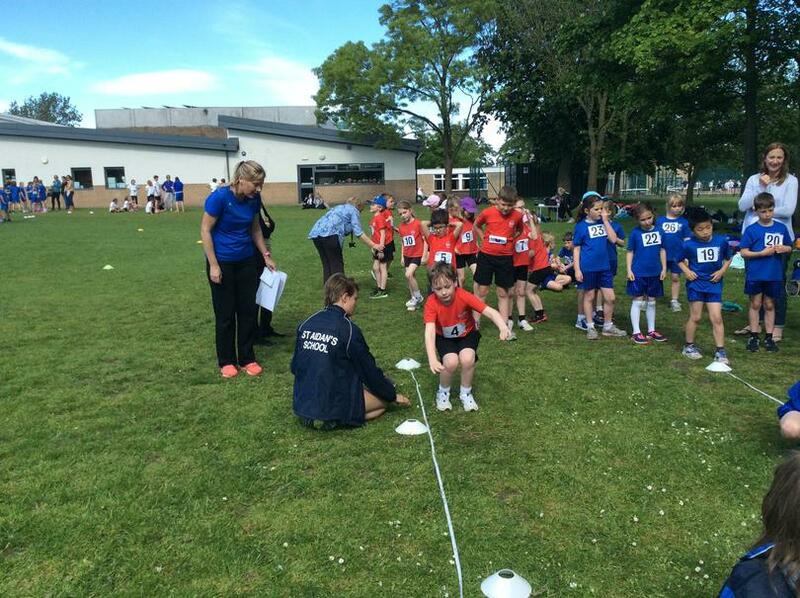 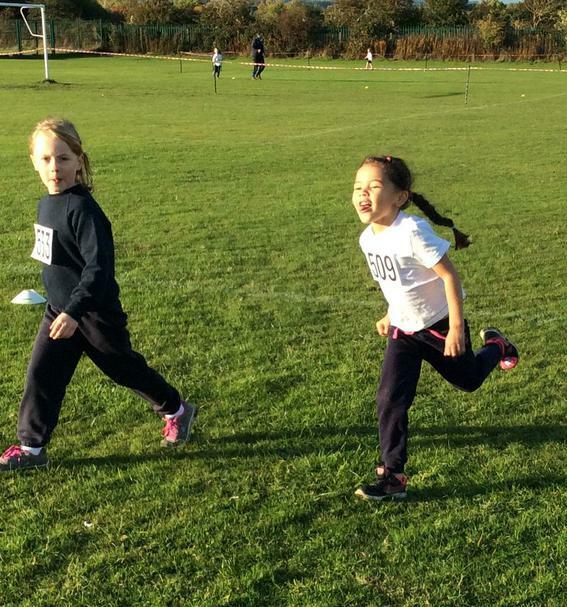 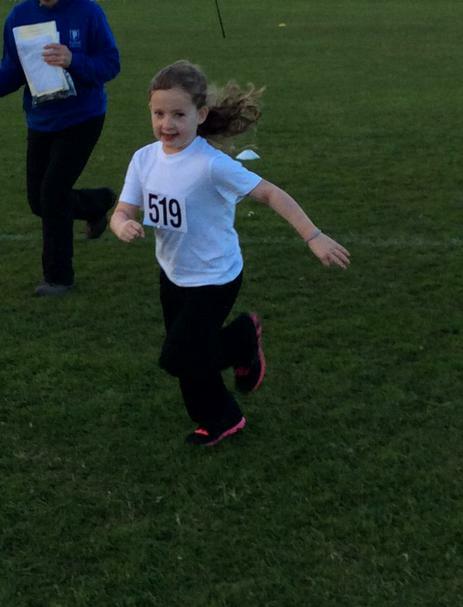 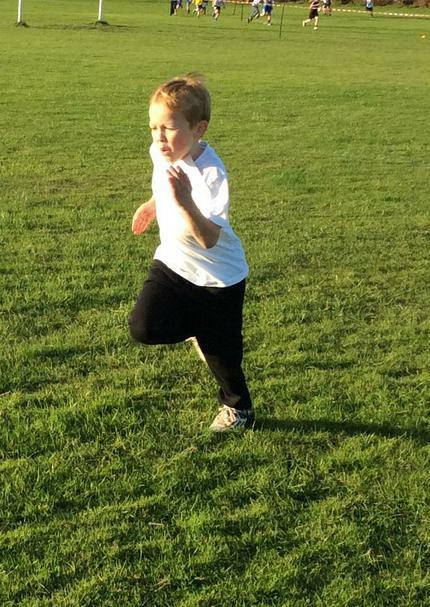 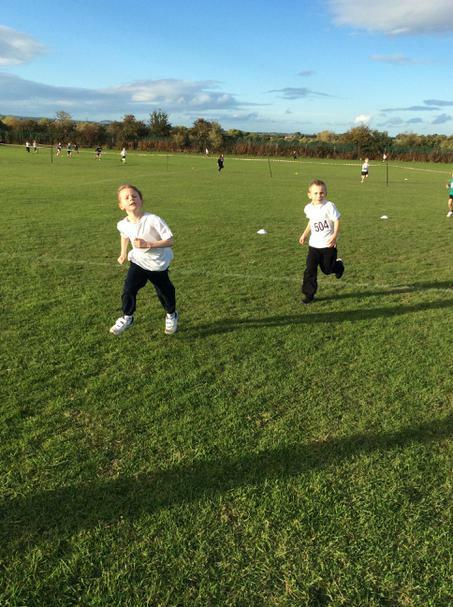 Children from Key Stage 1 attended a Cross Country Competition at Harrogate High School as part of the Harrogate Schools Sports Partnership. 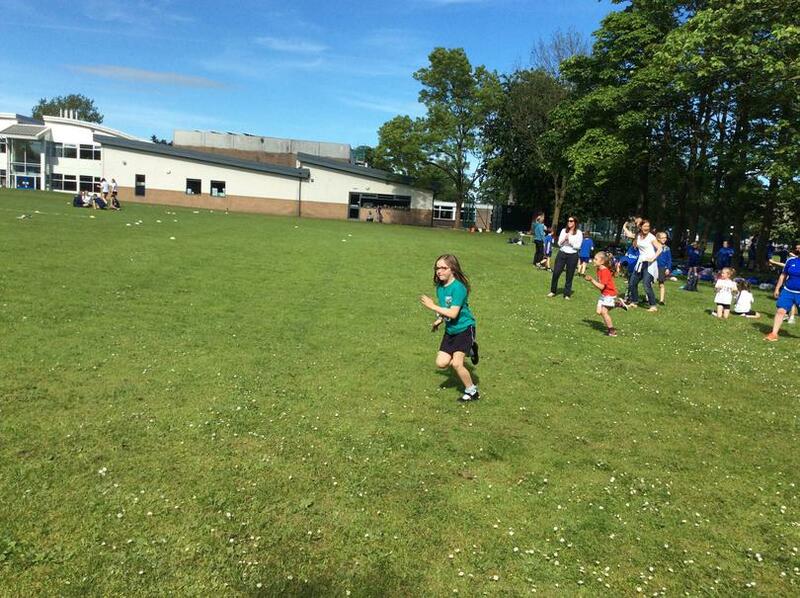 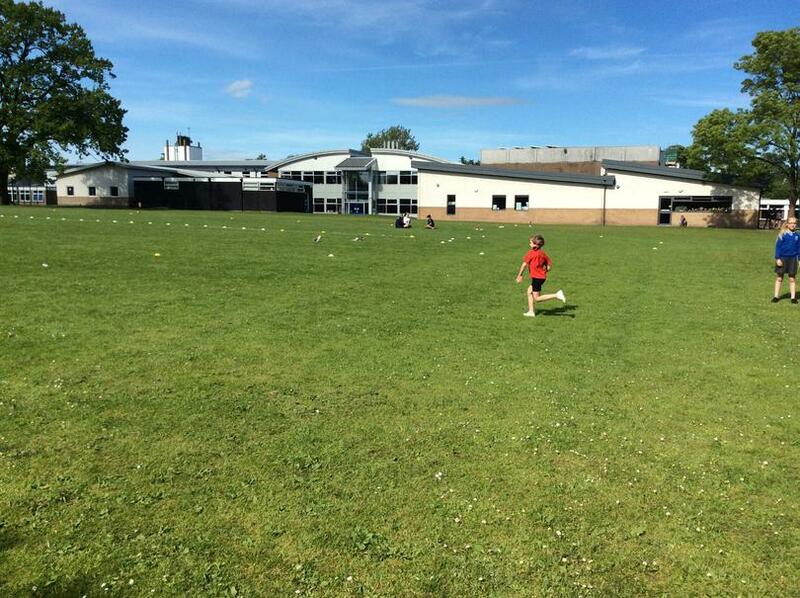 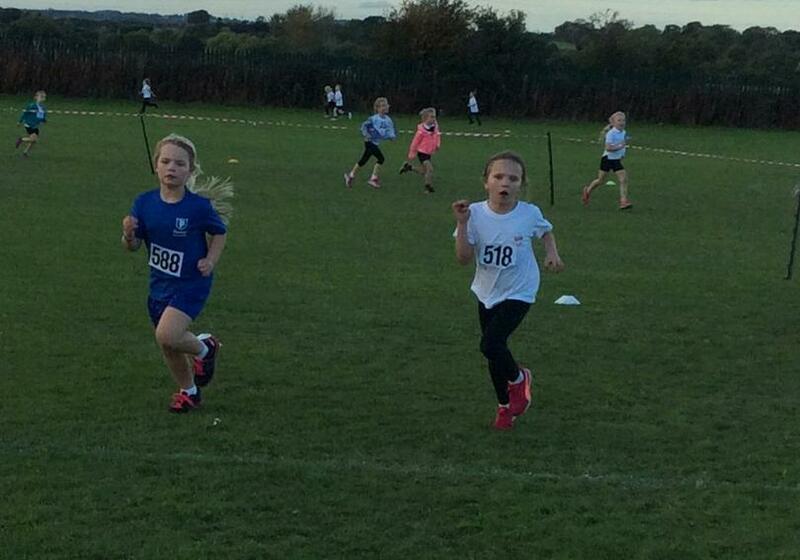 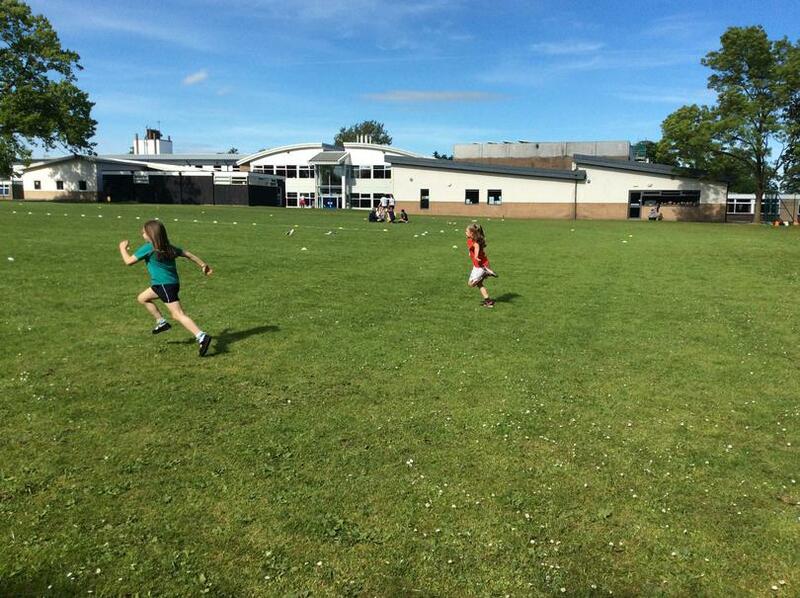 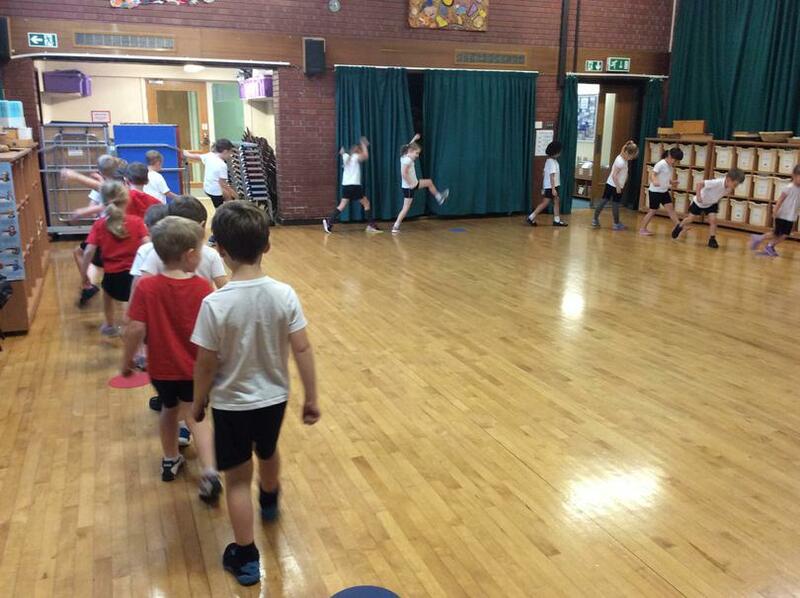 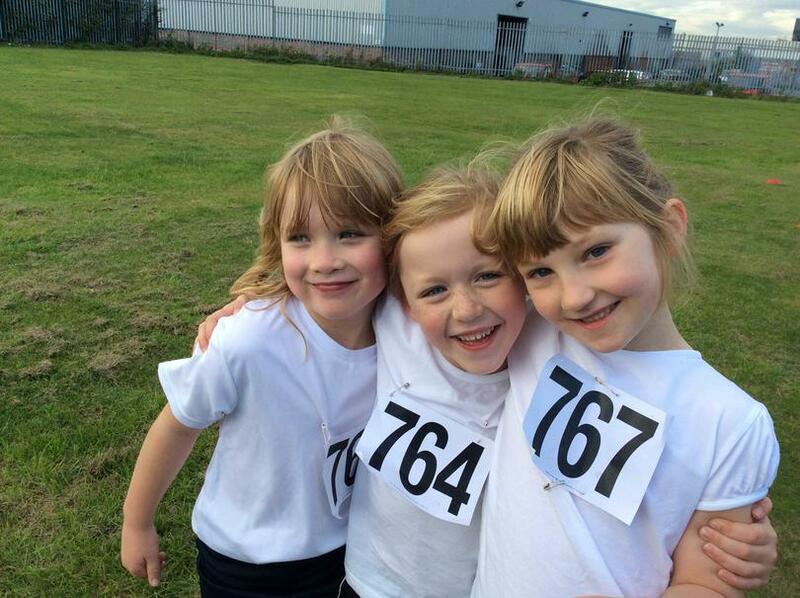 All of the children took on the tricky challenge of a long distance run with great enthusiasm and determination. 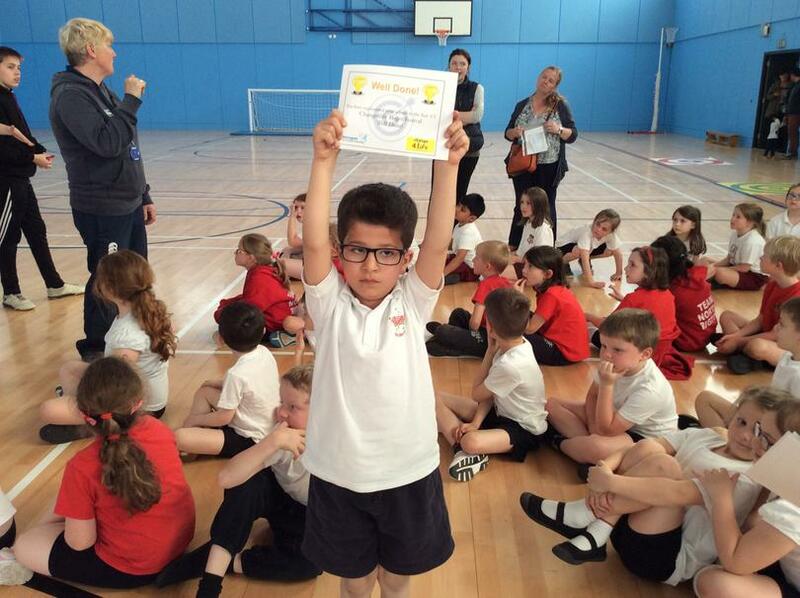 We even had a third place finish from one of the children, well done. 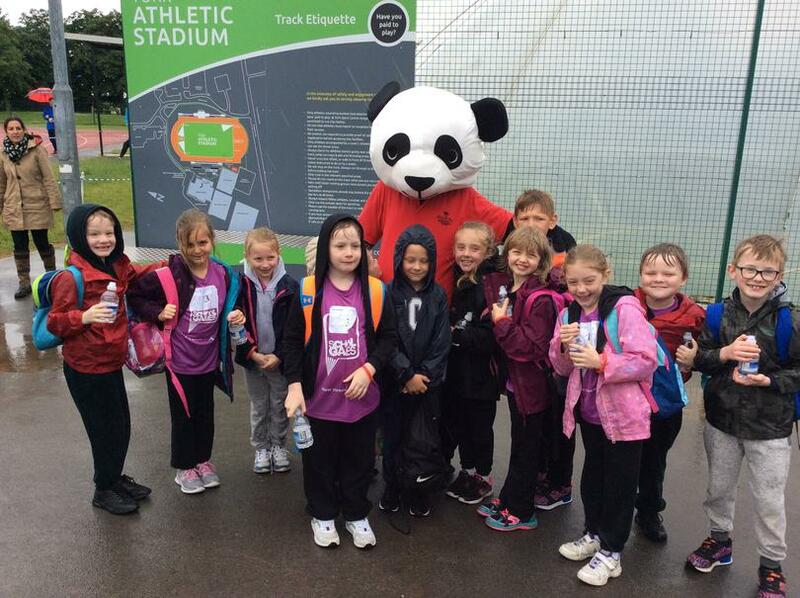 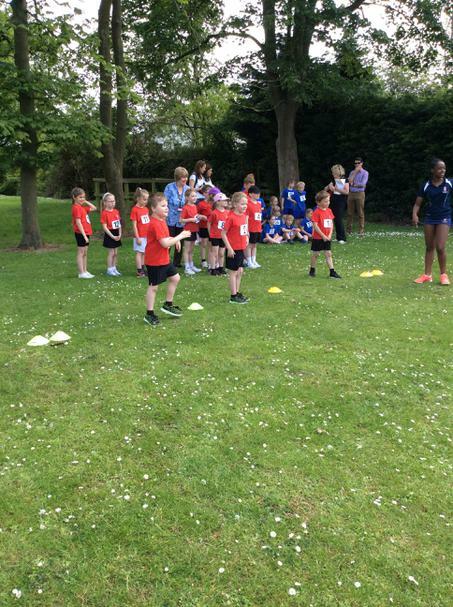 Children from year two represented Saltergate Infant School at the Change for Life Festival held at Harrogate High School as part of the Harrogate Schools Sports Partnership. 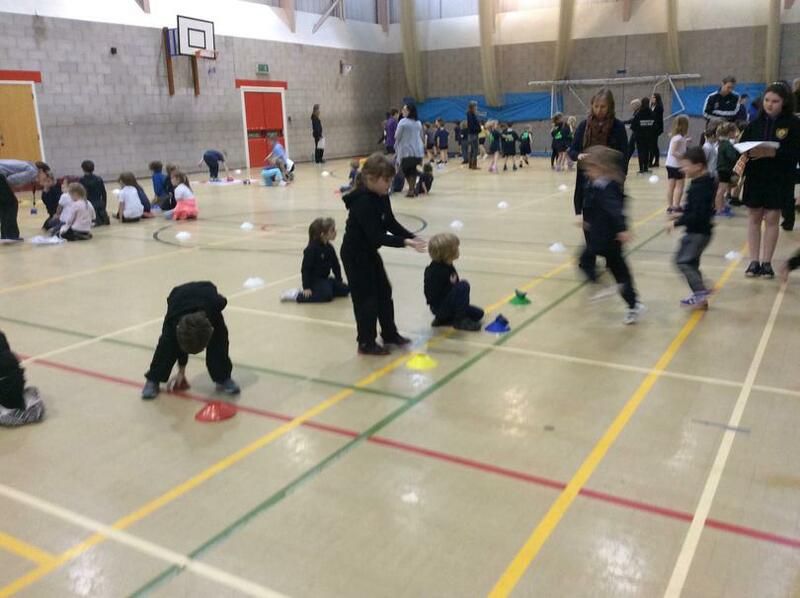 The children got to try various new activities they may never have experienced before such as Curling, Parachute Target, Tag Rugby, Throwing and a running event. 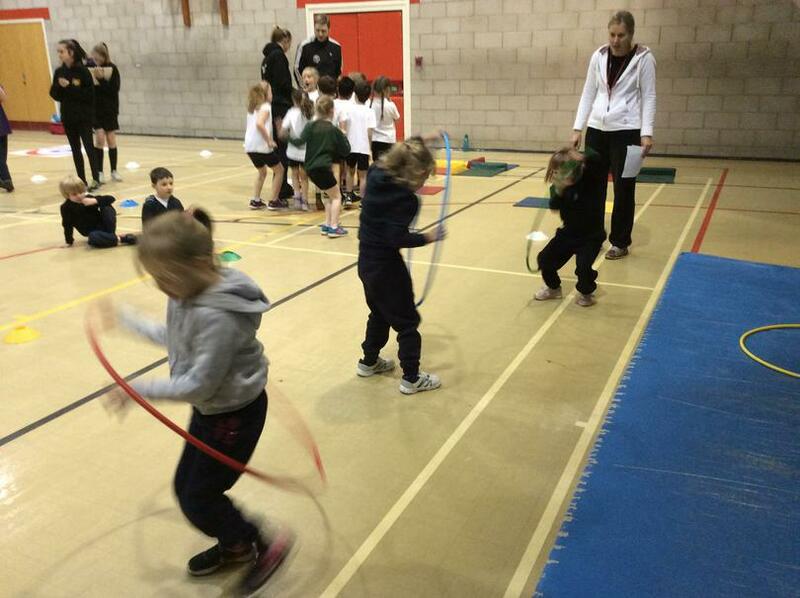 All the children had a wonderful time experiencing these new activities as well as working hard to improve their sporting skills so much so that two of the children won a special band for displaying excellent sporting values. 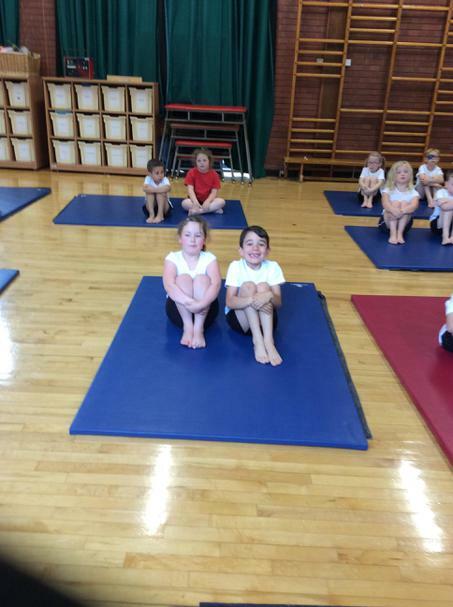 Well done Children. 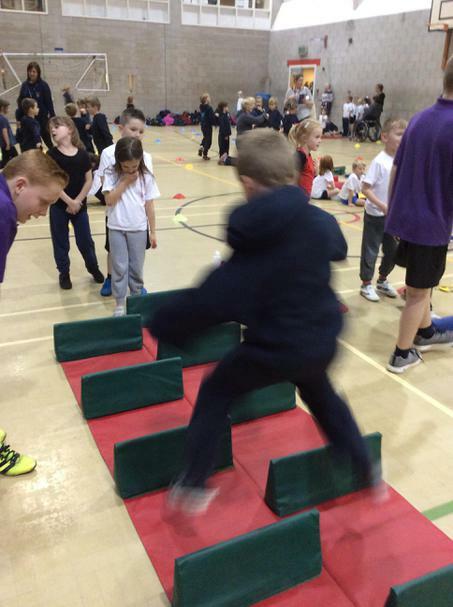 Take a look at some of our pictures from the Change for Life Festival. 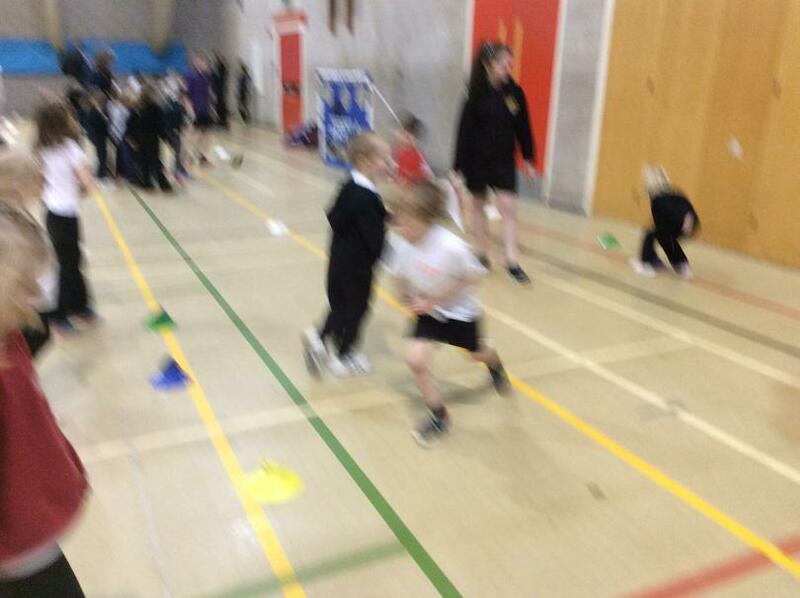 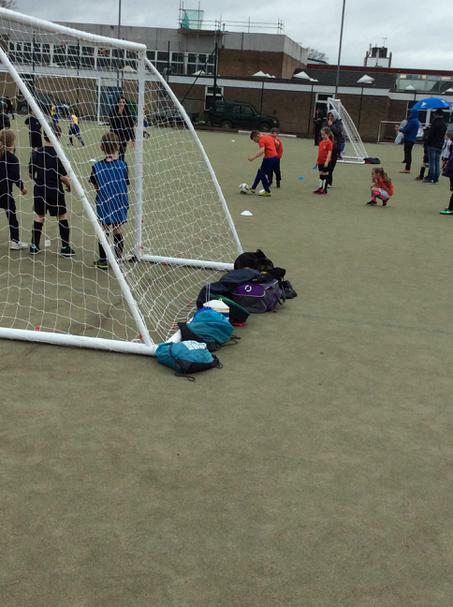 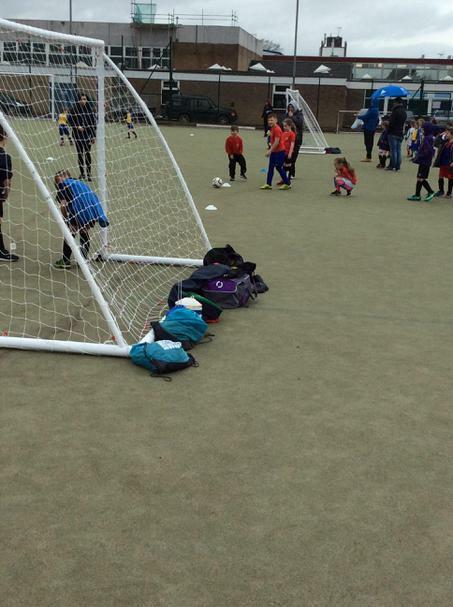 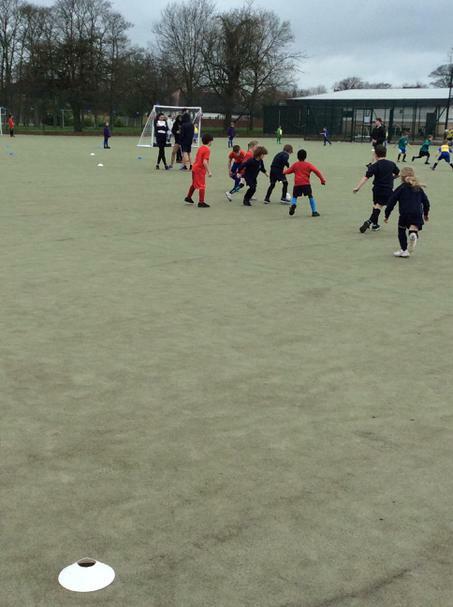 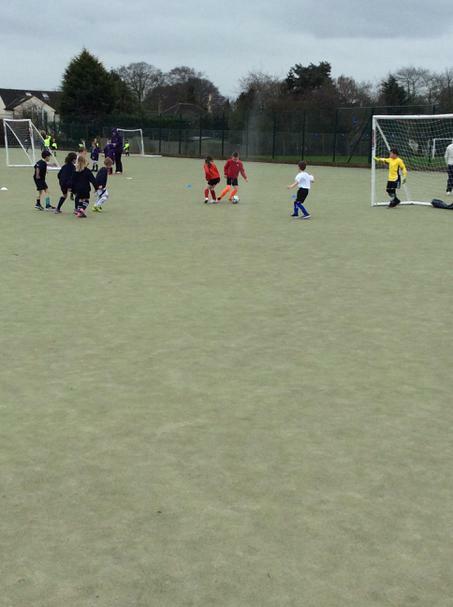 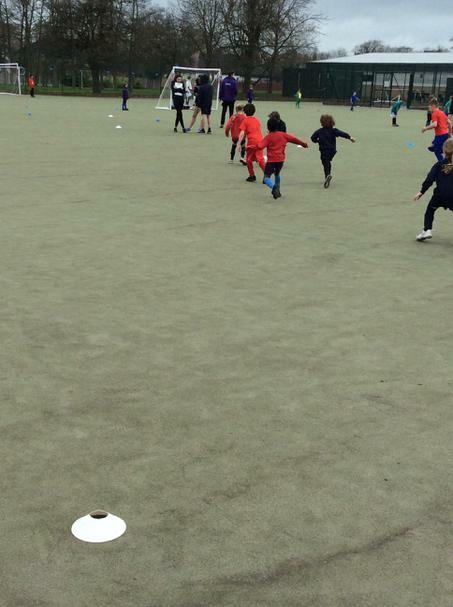 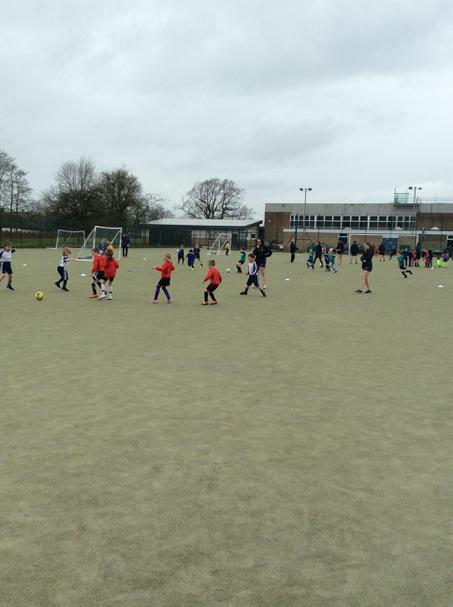 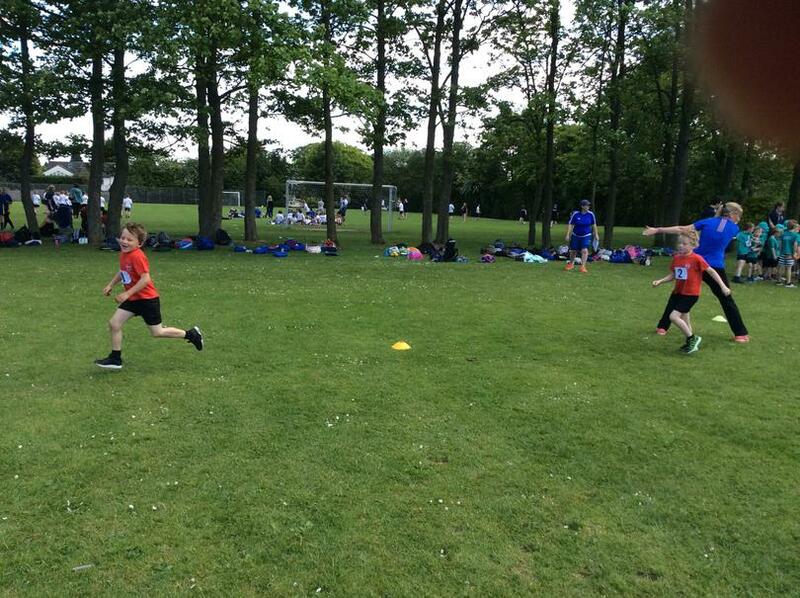 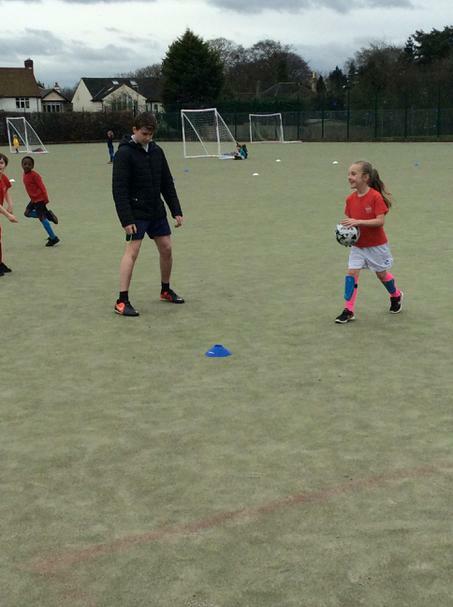 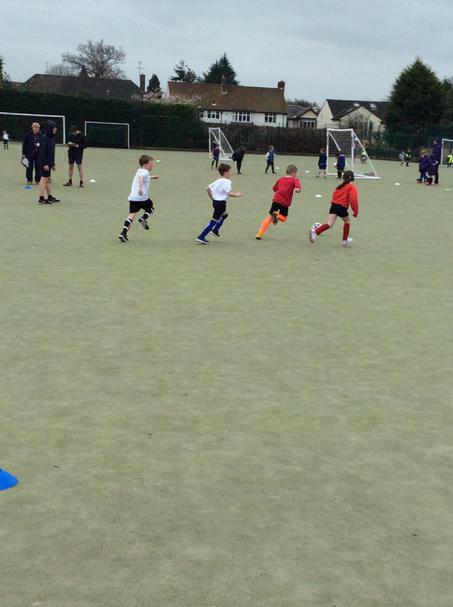 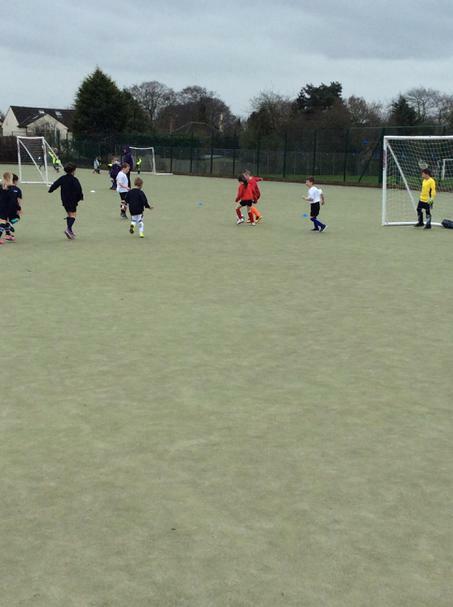 Some children from Year Two took part in a Football Competition held at Harrogate High School as part of The Harrogate Schools Sports Partnership. 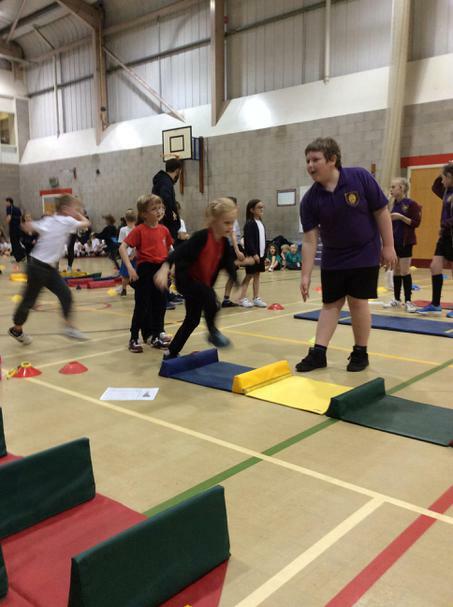 We had two teams entered who showed real determination and dedication to do their best. 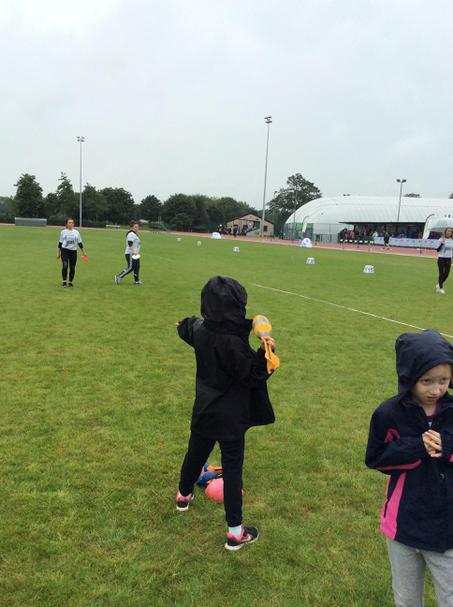 They all had great team spirit and had a wonderful time in spite of the horrible weather. 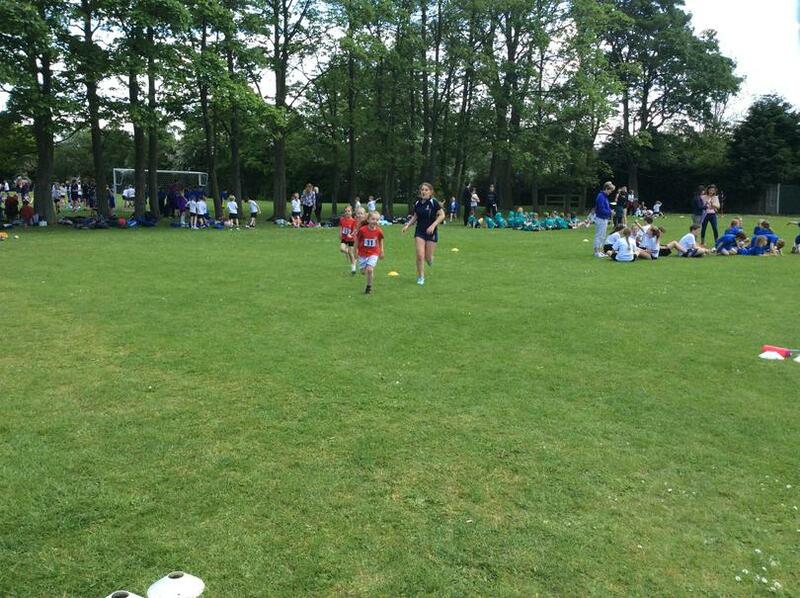 The teams finished 3rd and 6th, well done children. 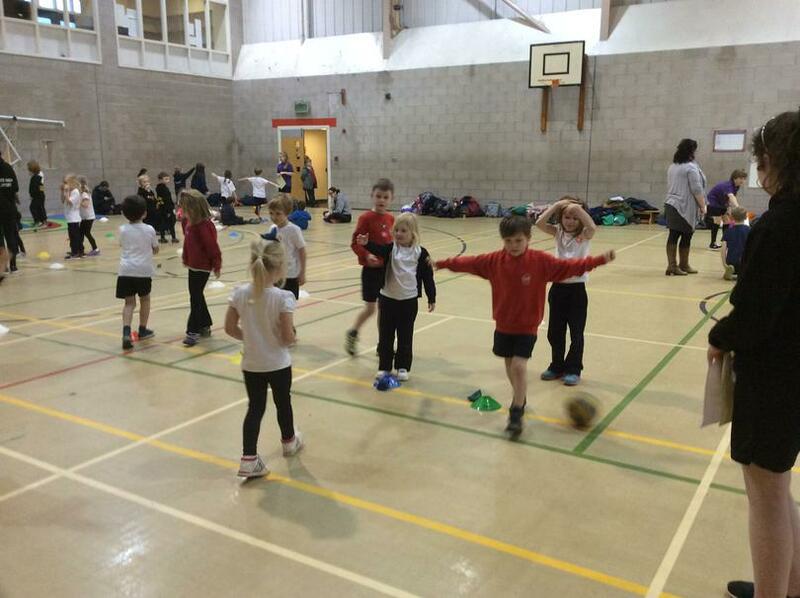 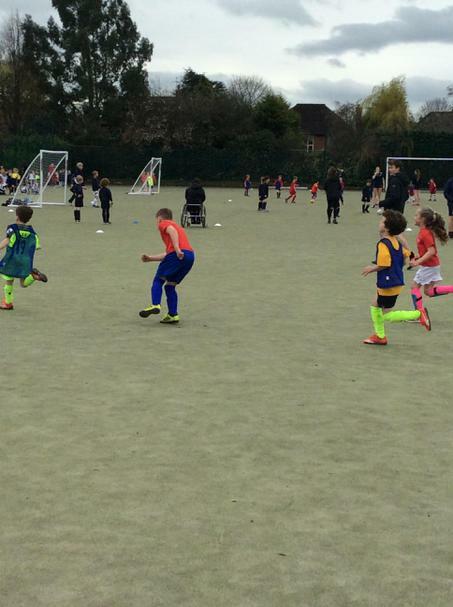 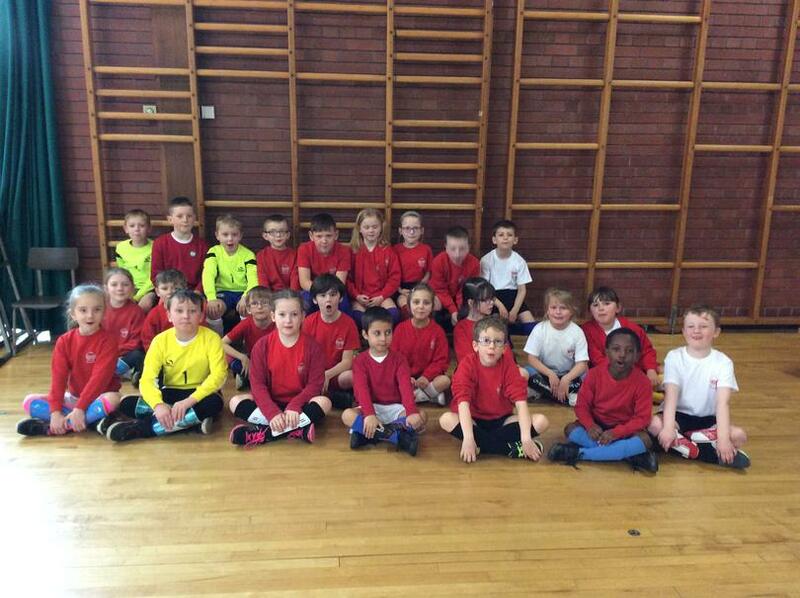 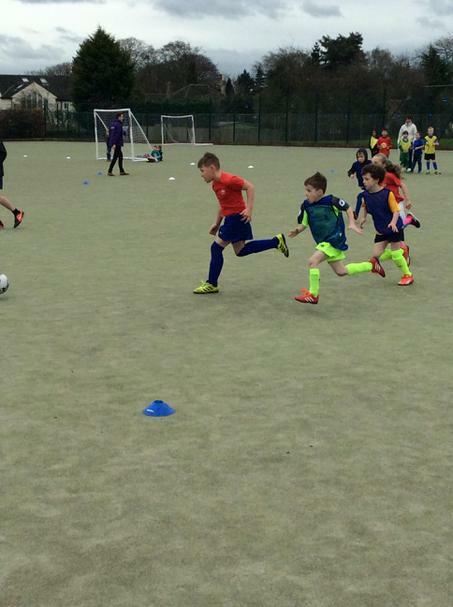 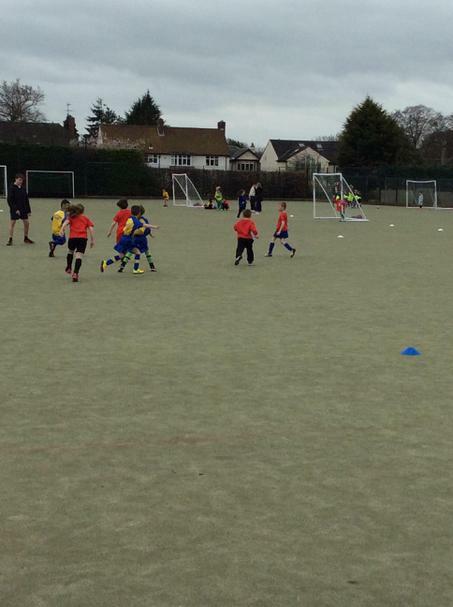 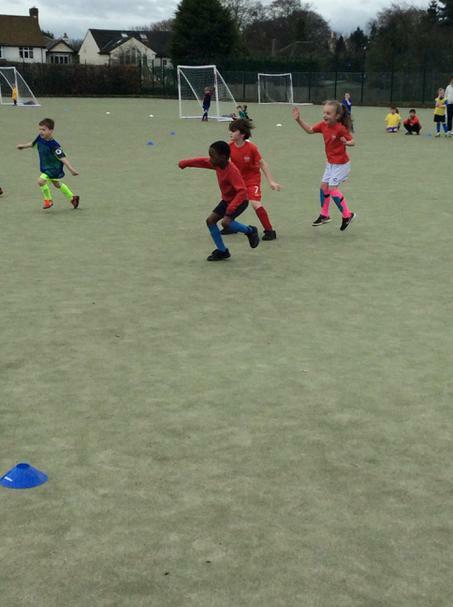 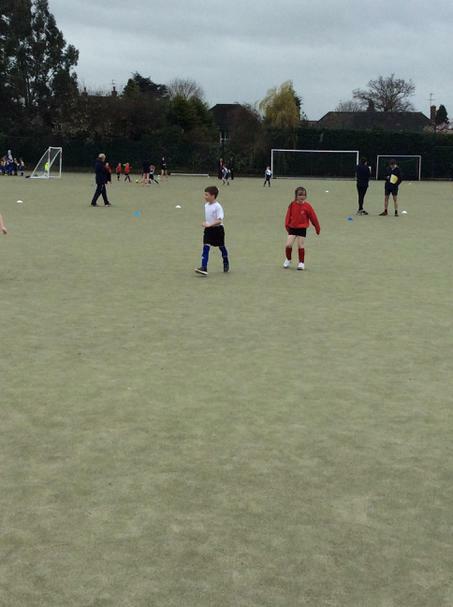 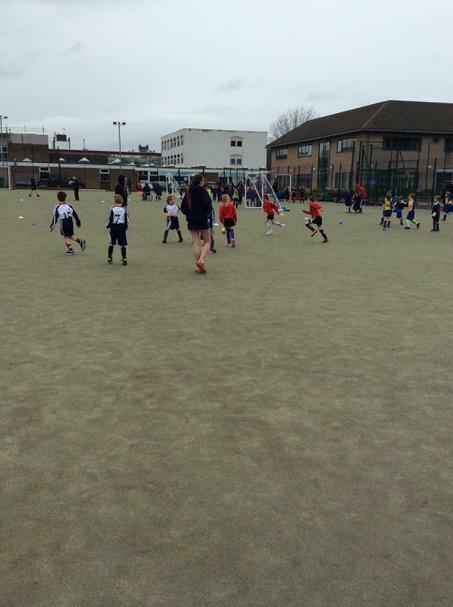 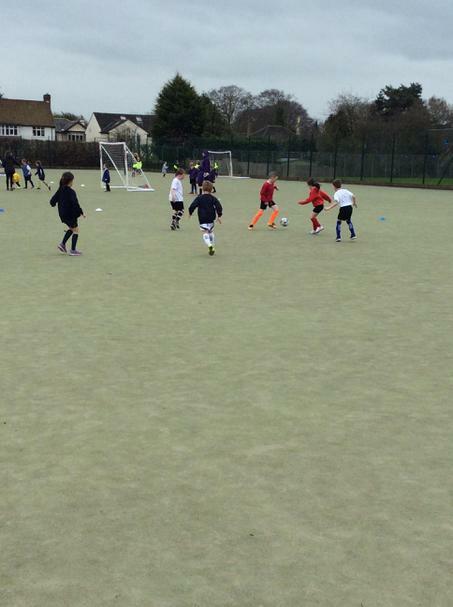 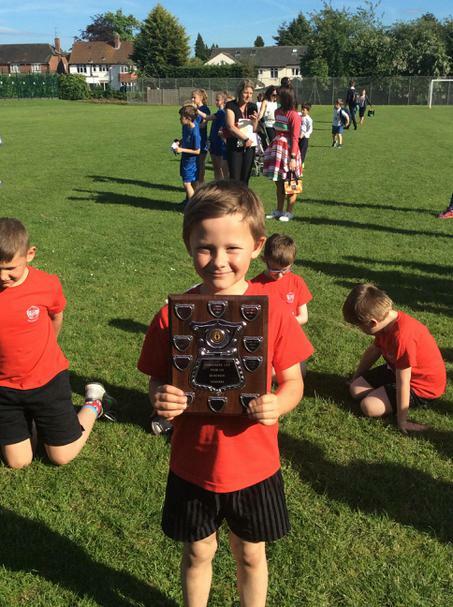 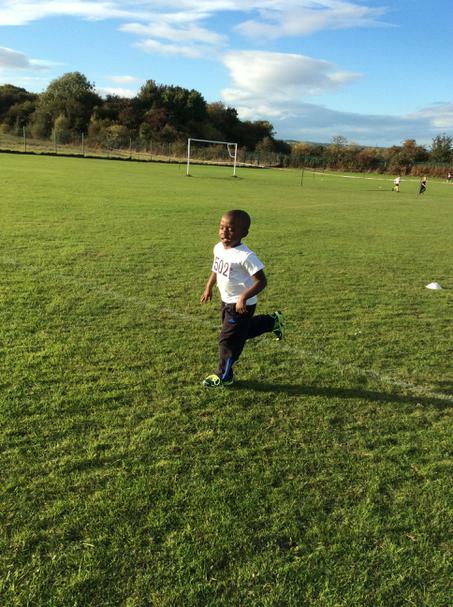 Take a look at some of our pictures from The Football Competition. 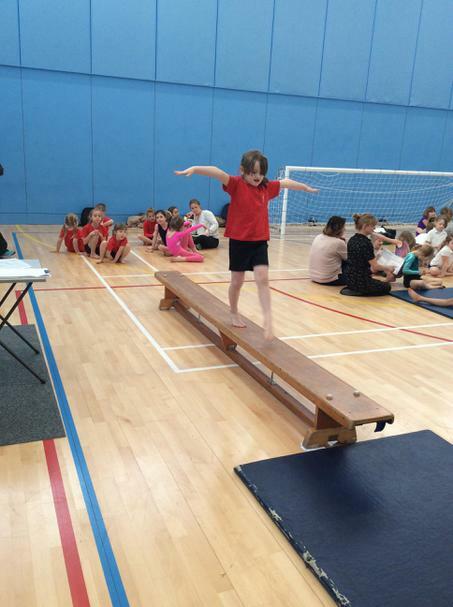 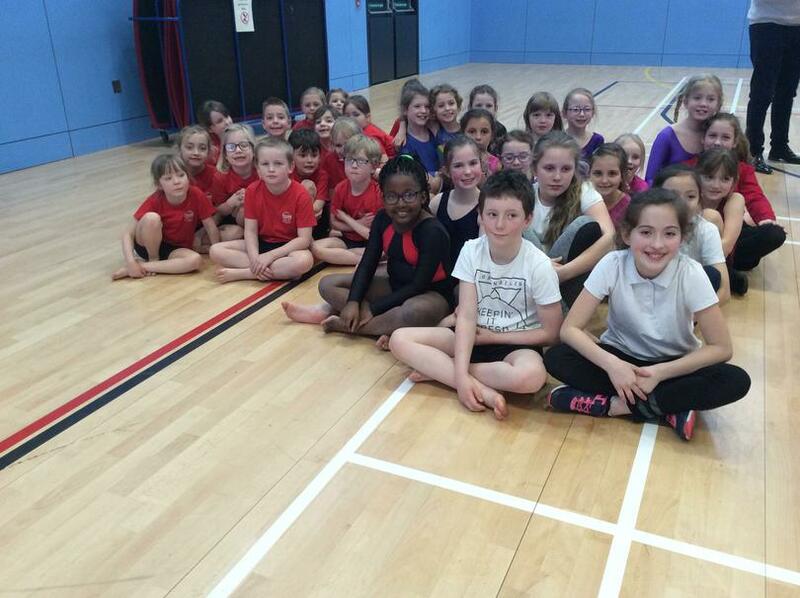 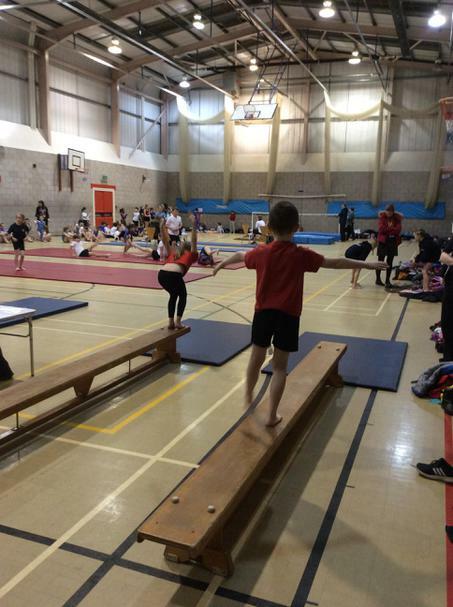 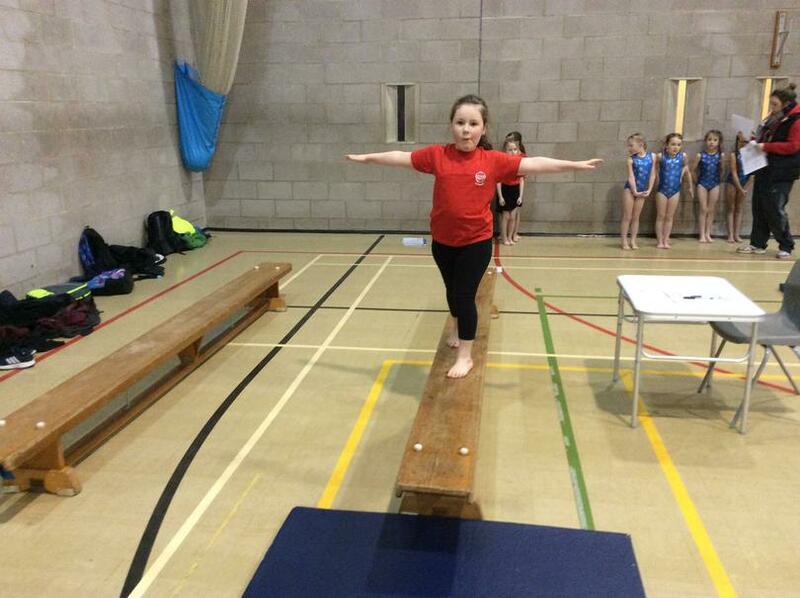 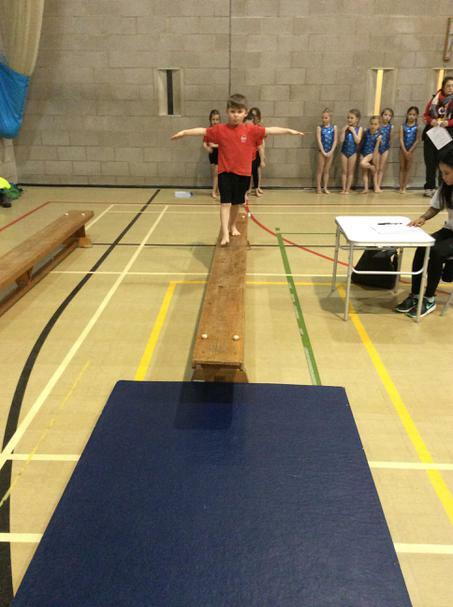 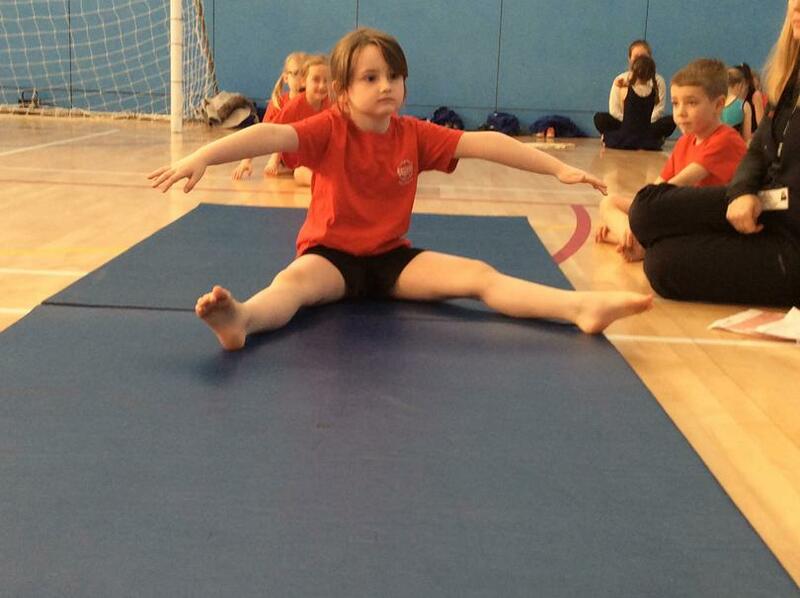 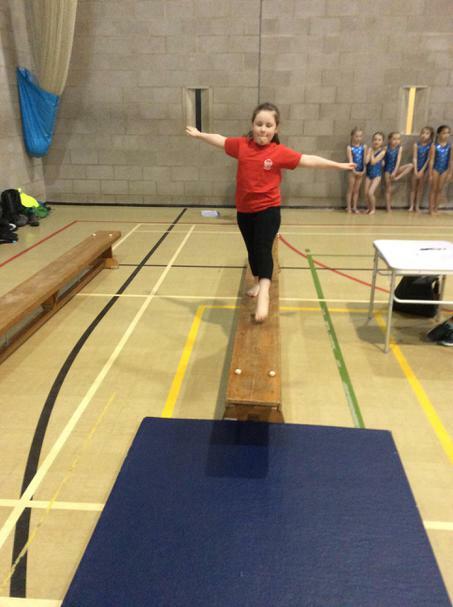 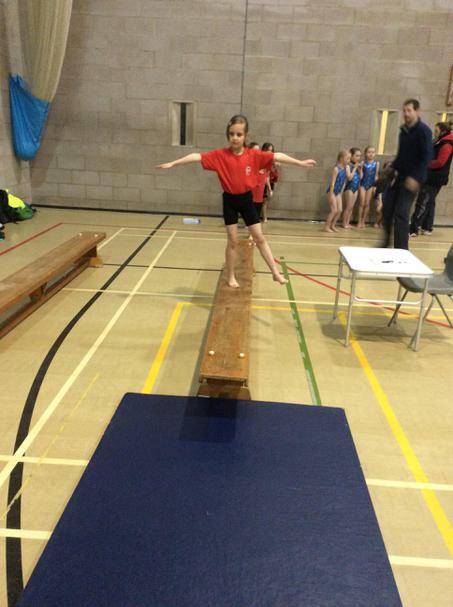 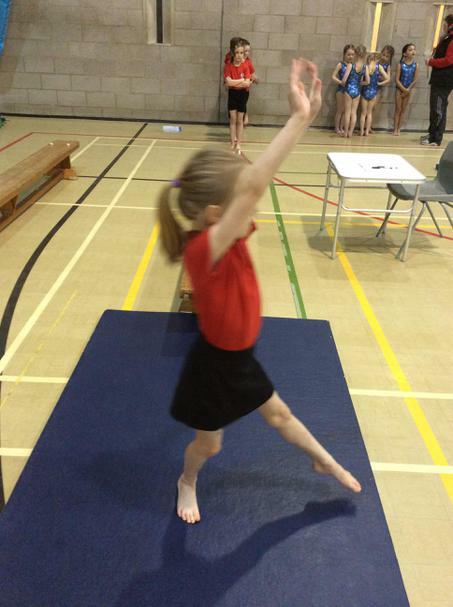 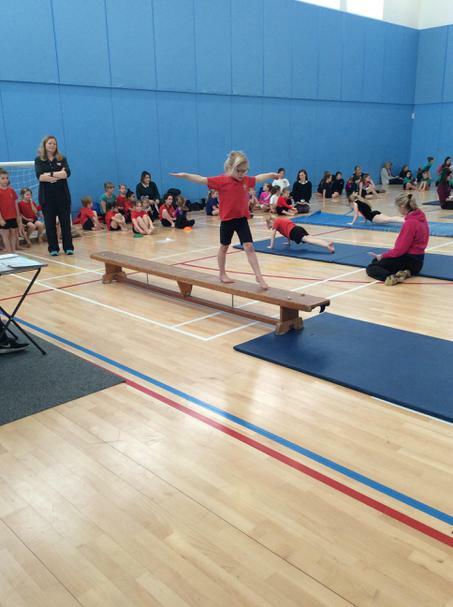 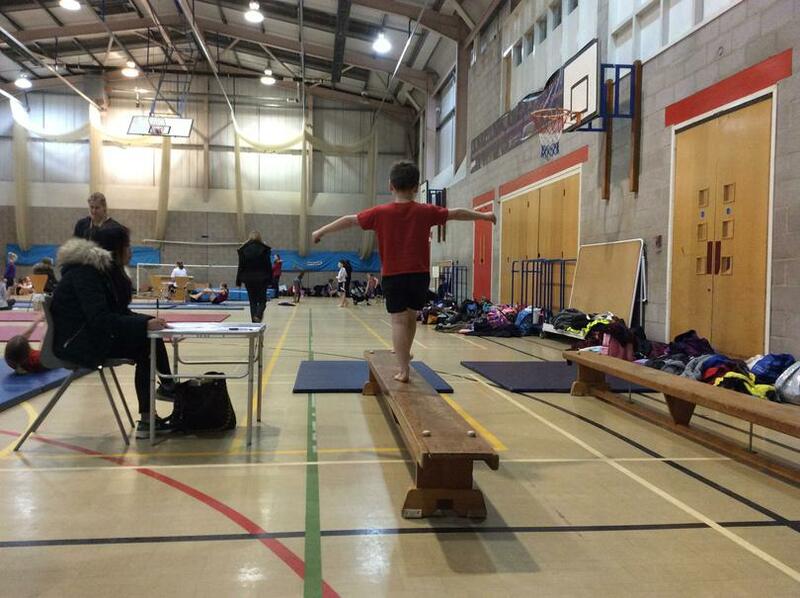 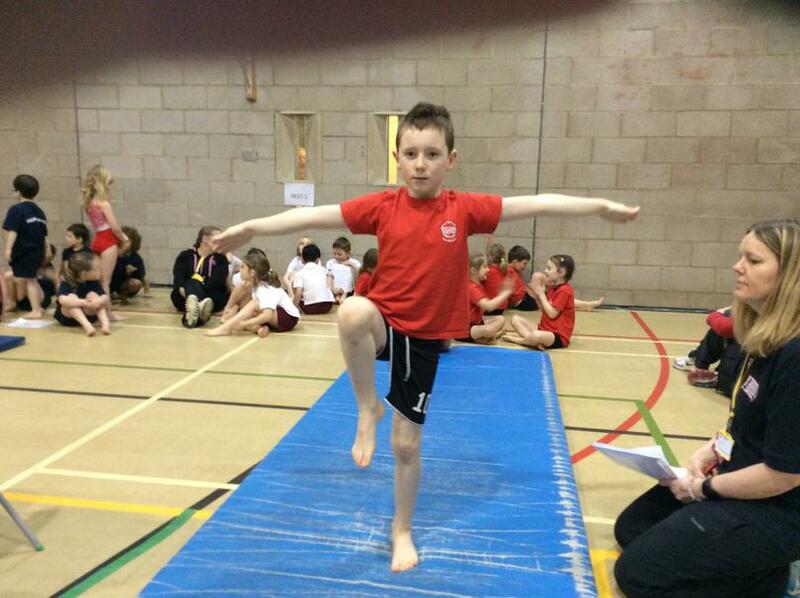 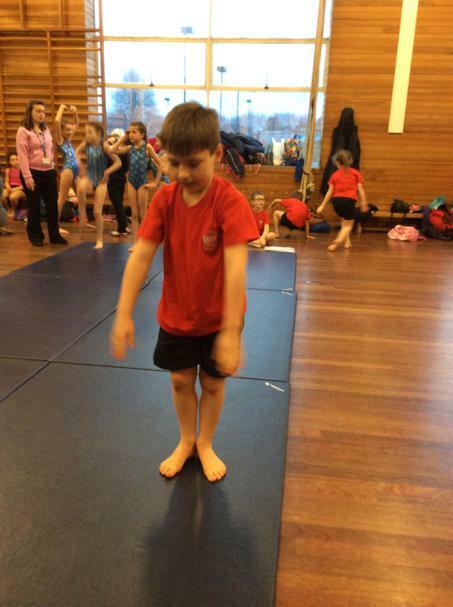 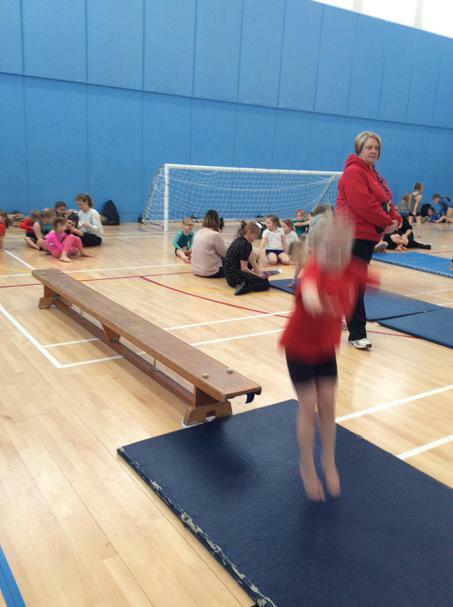 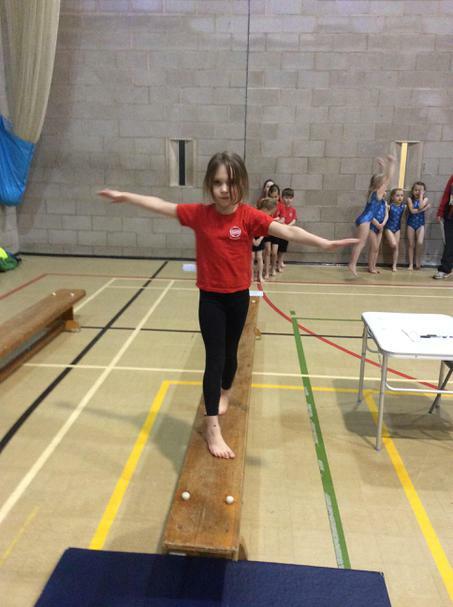 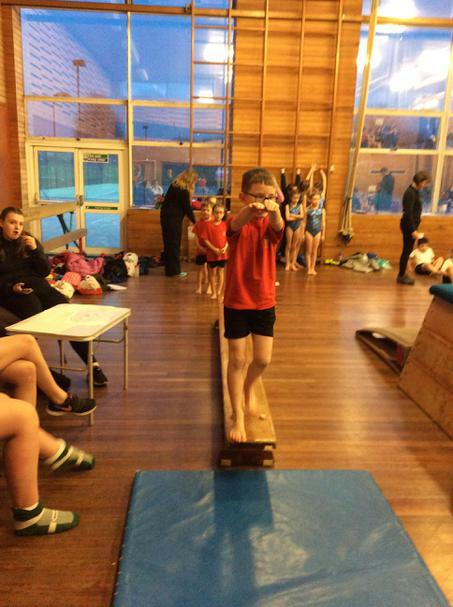 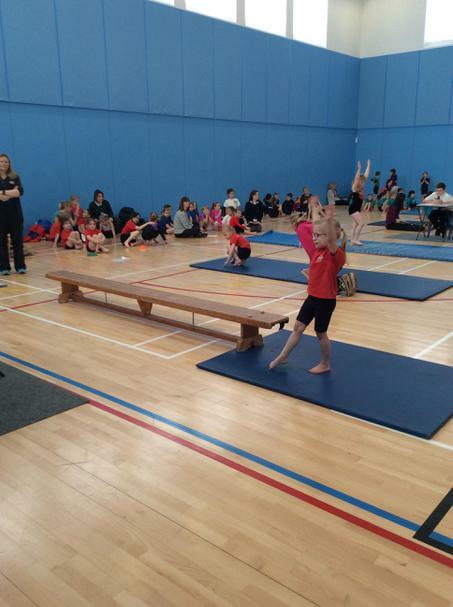 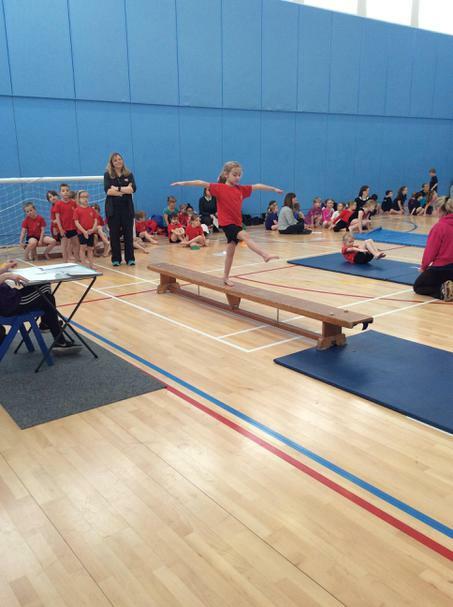 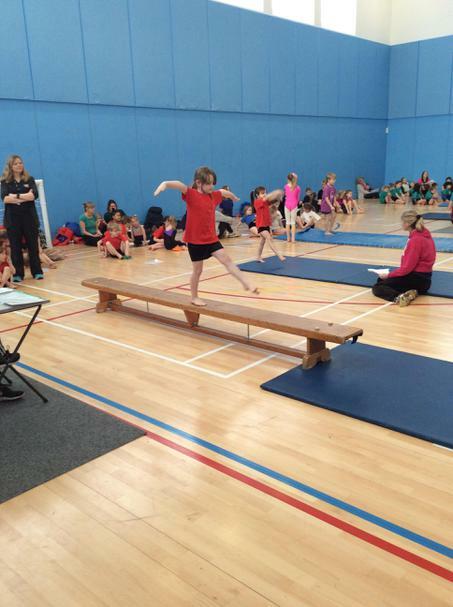 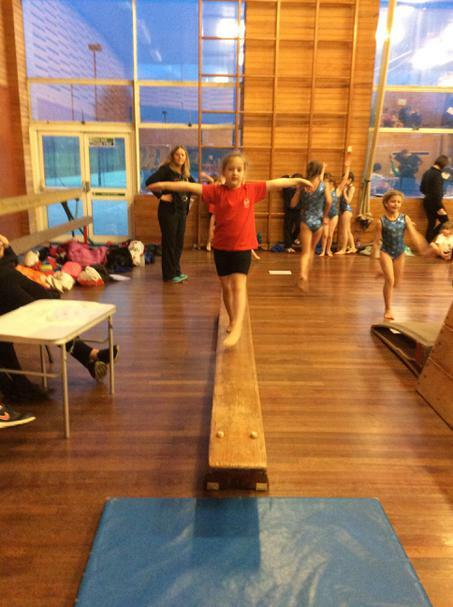 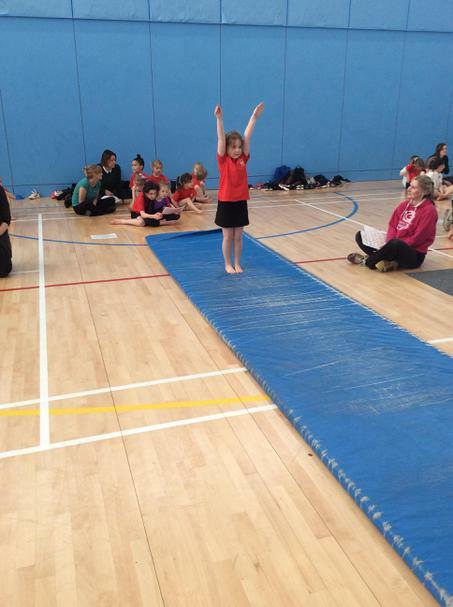 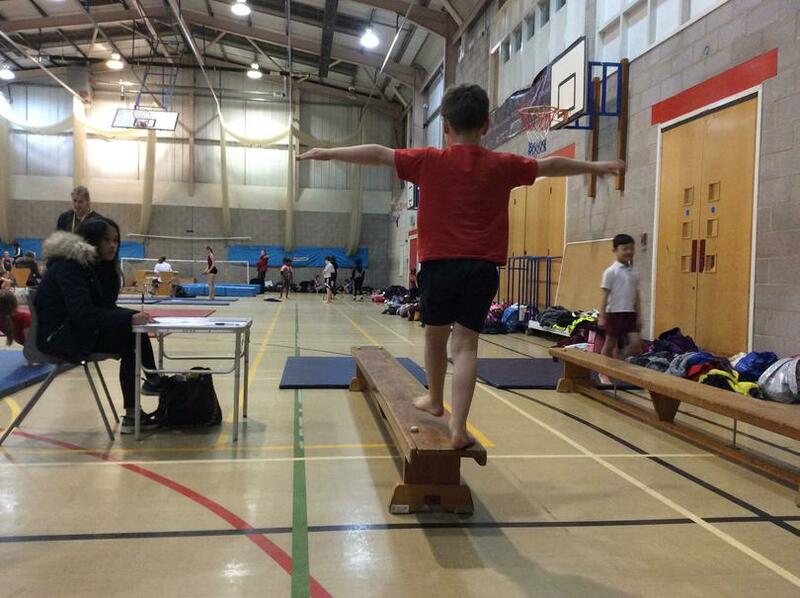 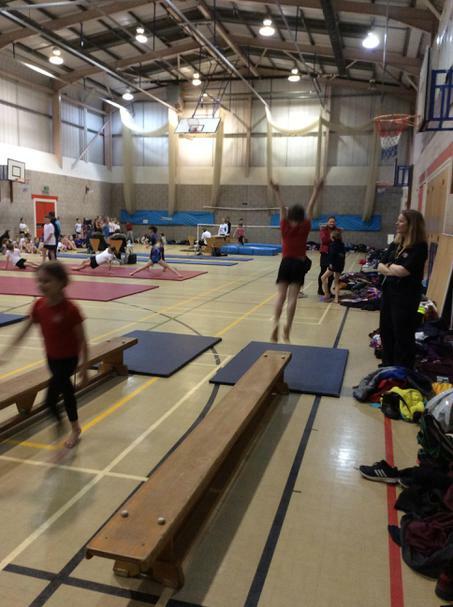 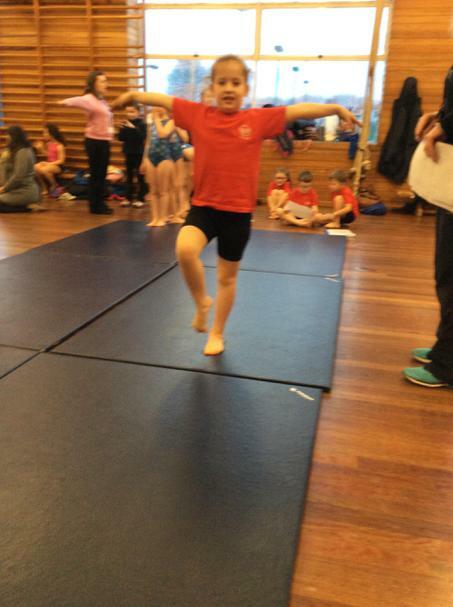 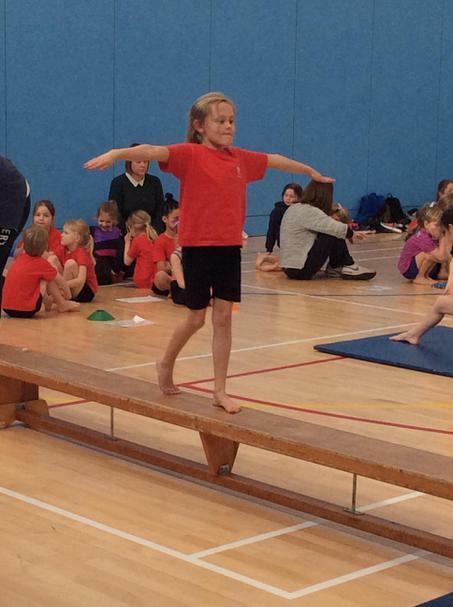 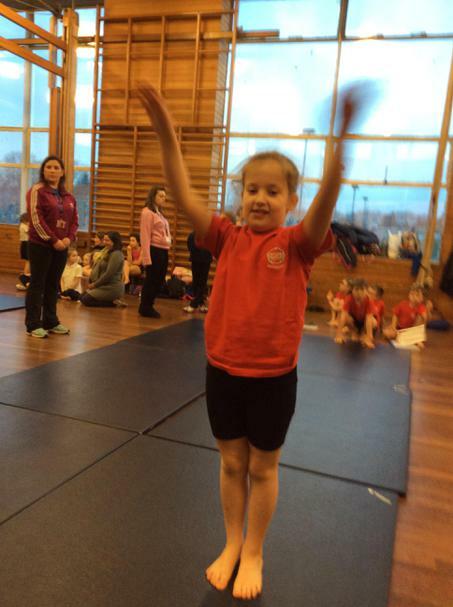 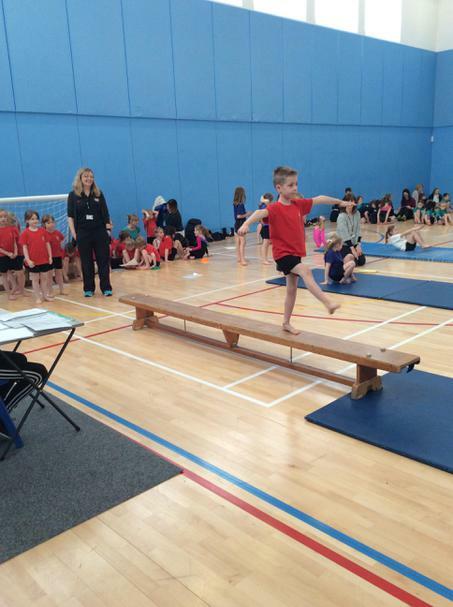 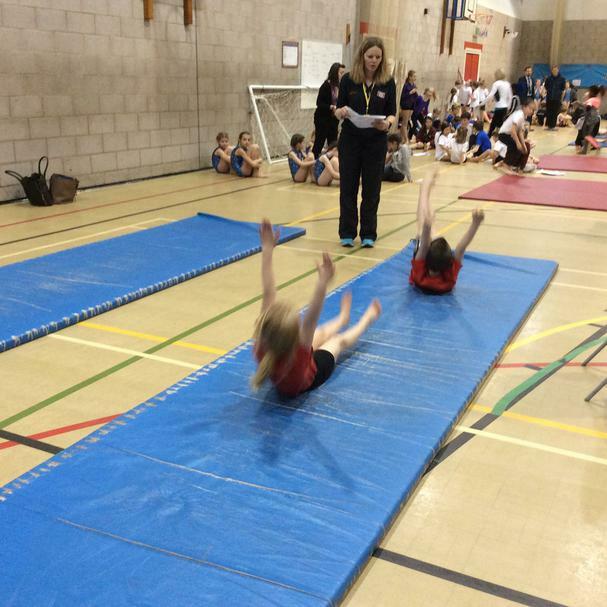 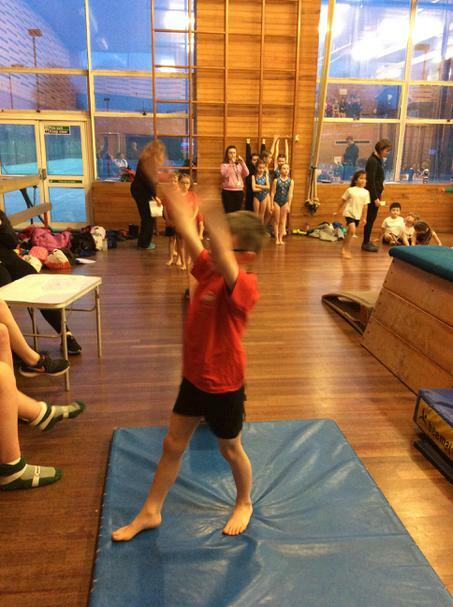 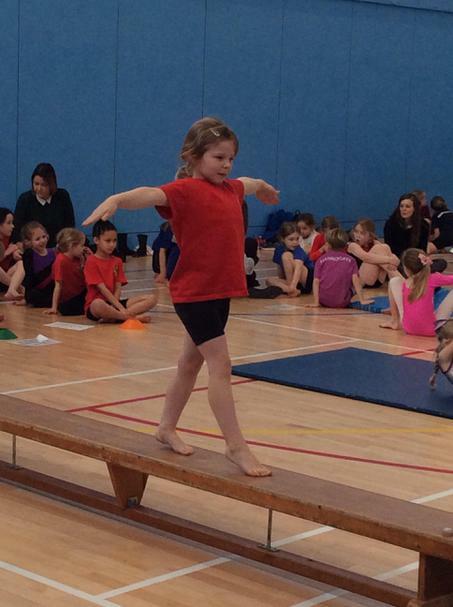 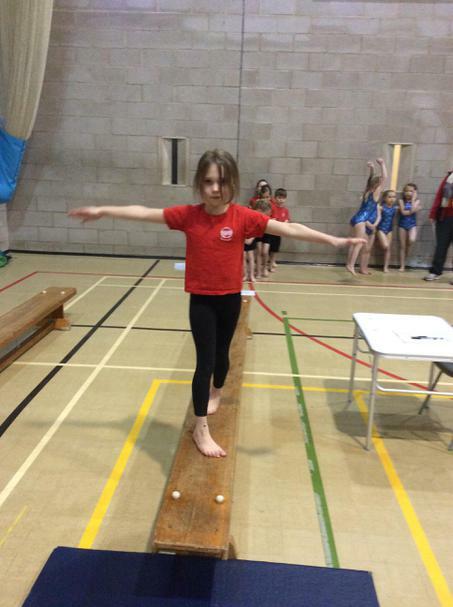 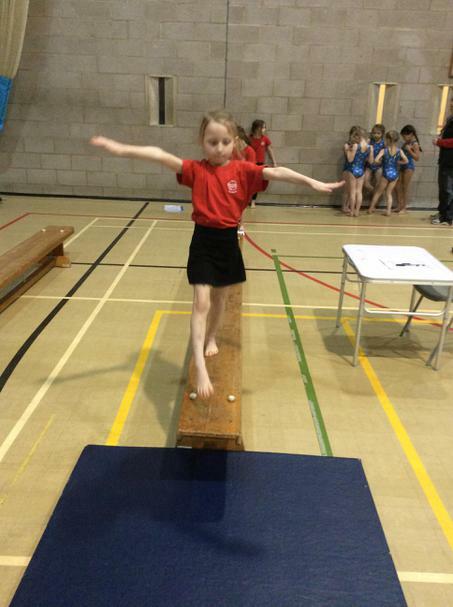 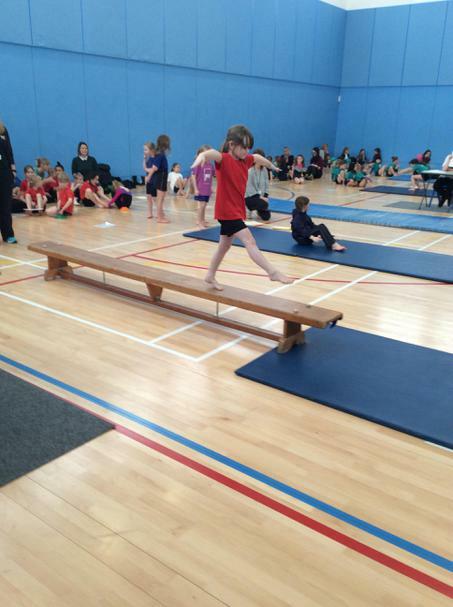 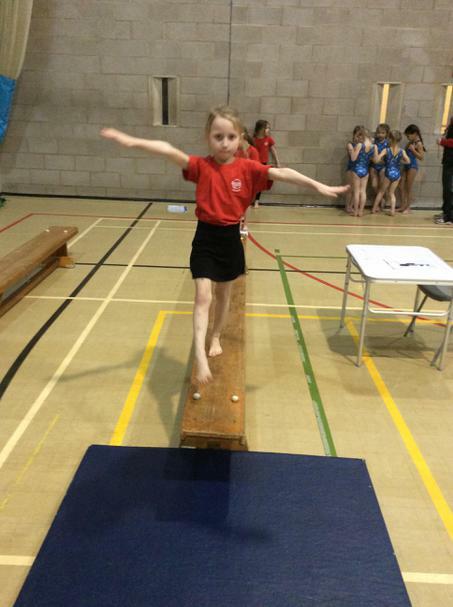 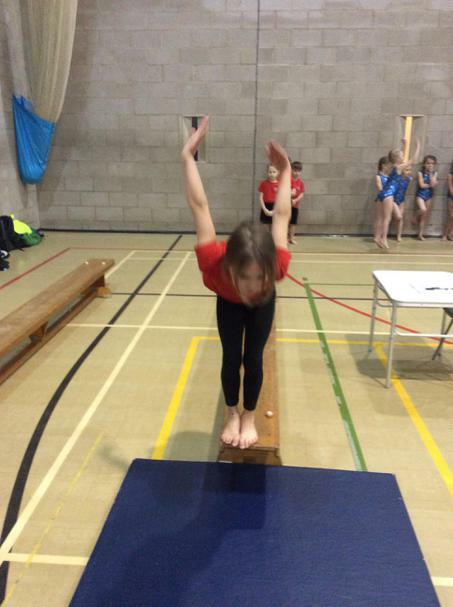 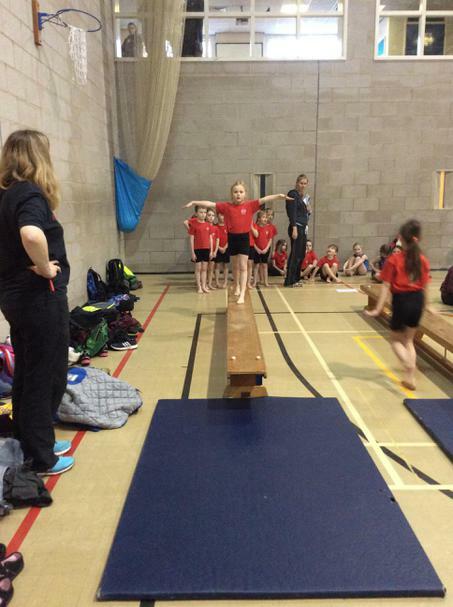 We are extremely proud of the children who attended the Gymnastics final at Harrogate High School. 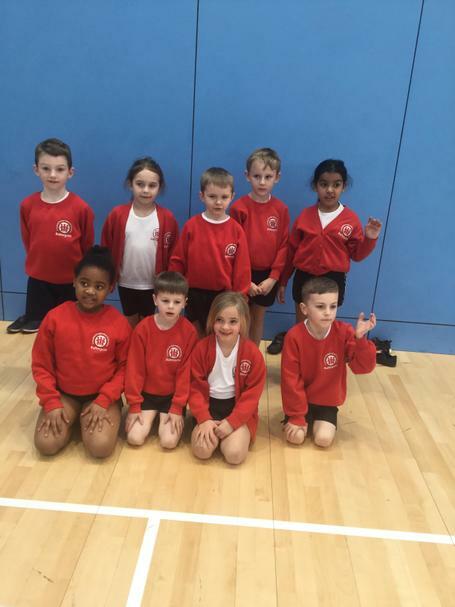 They had all worked extremely hard to improve their performances from the first round competition, all of the children displayed control and poise. 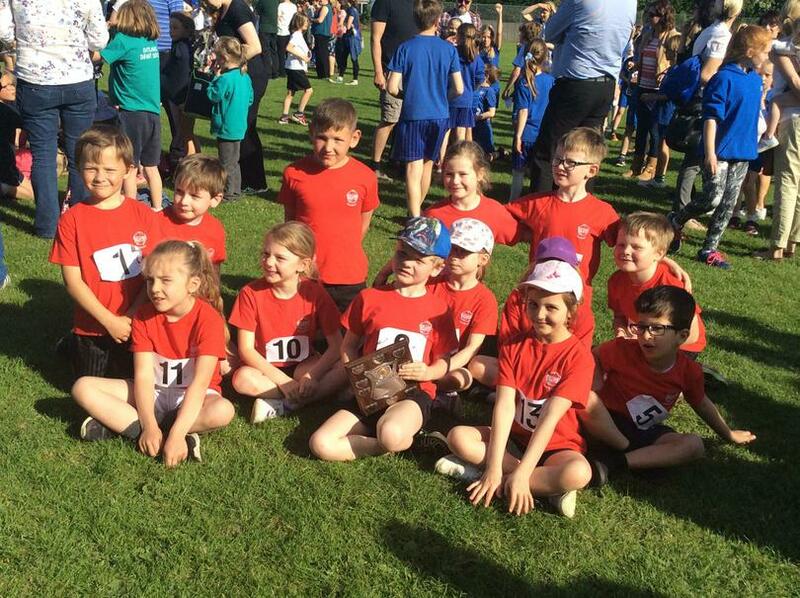 We are pleased to say that they finished third throughout the Harrogate area. 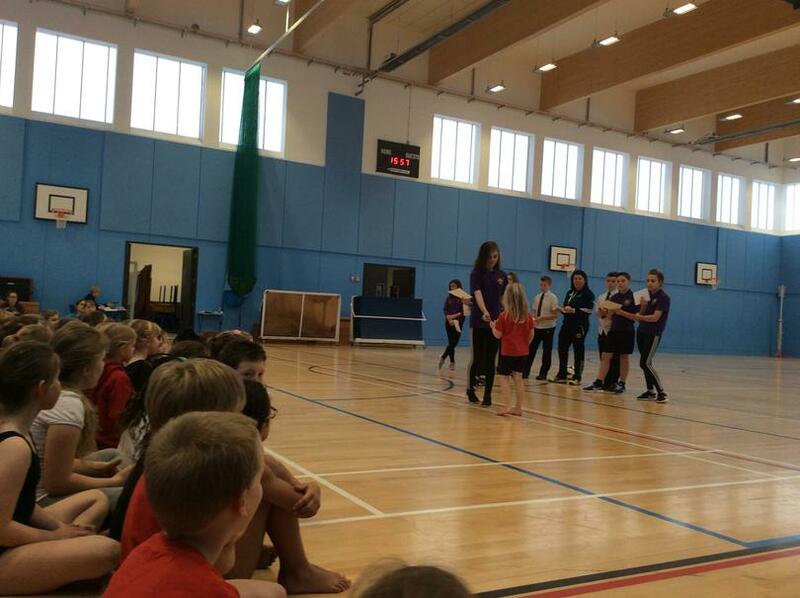 Take a look at our wonderful team performing for the judges. 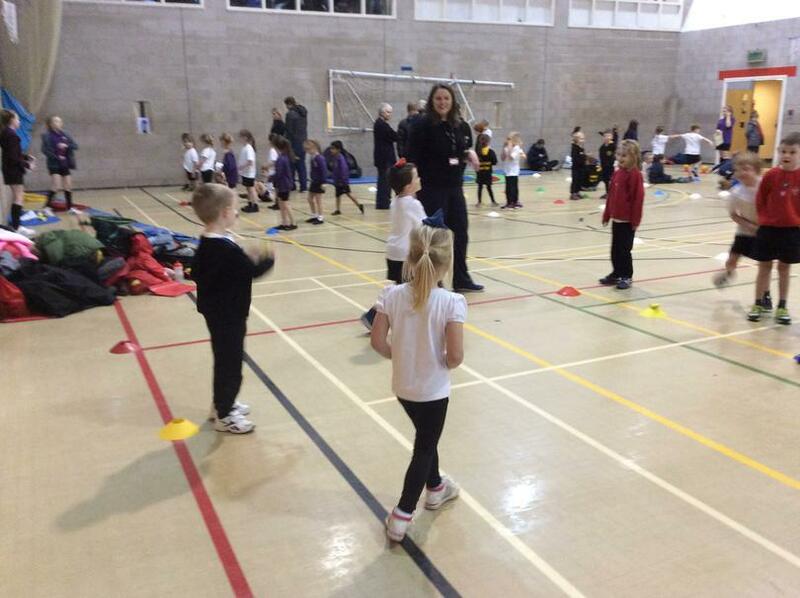 Claire Bassingdale our Schools Sports Specialist comes into support the teaching of Physical Education. 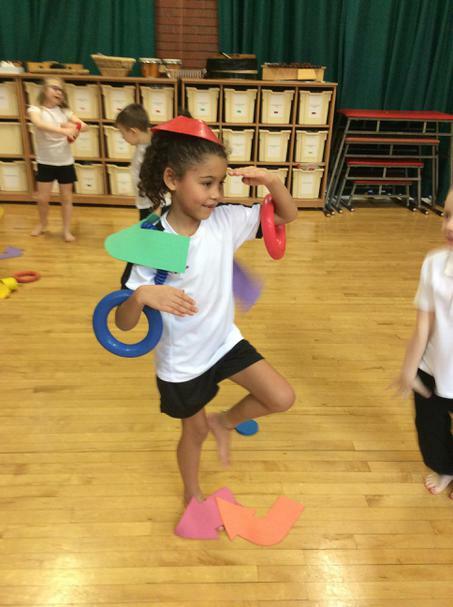 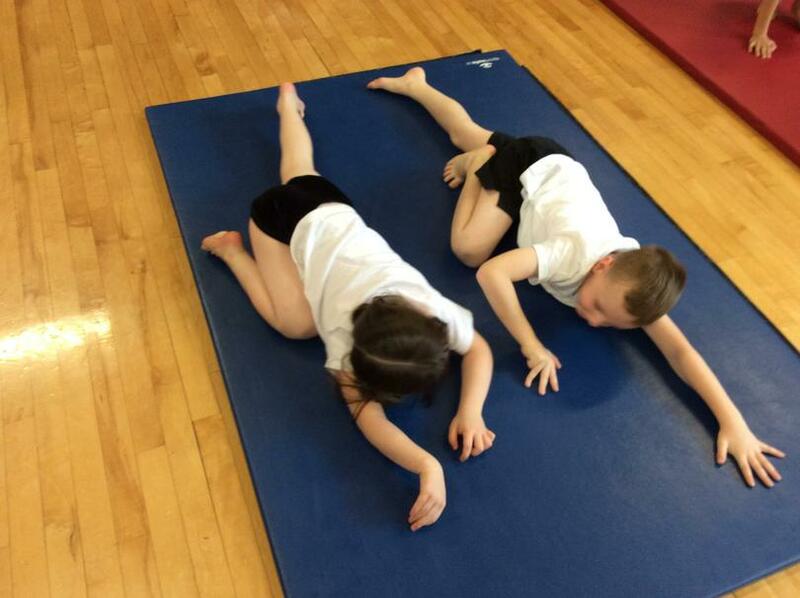 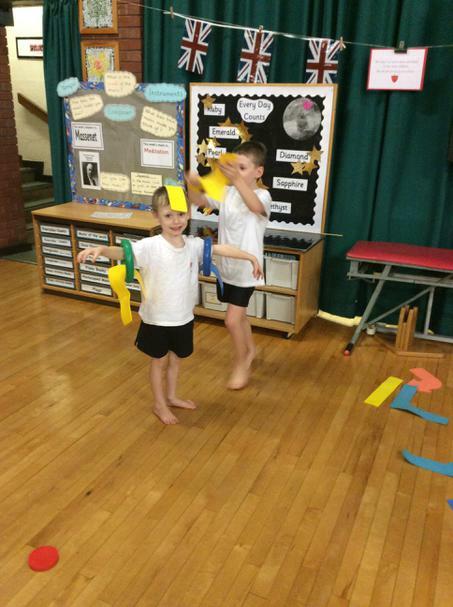 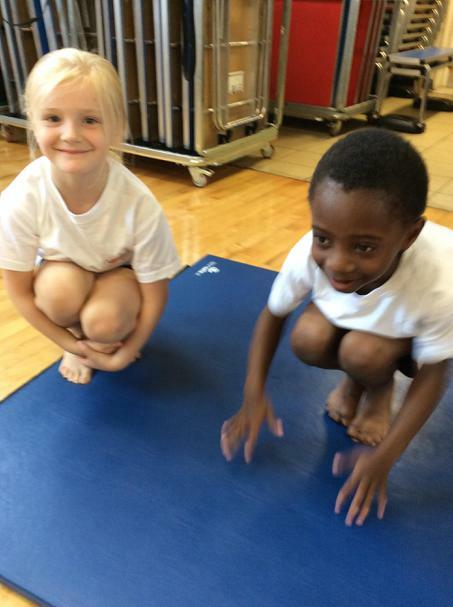 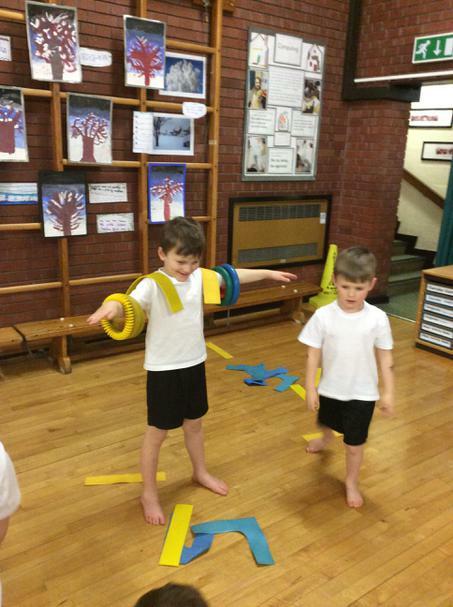 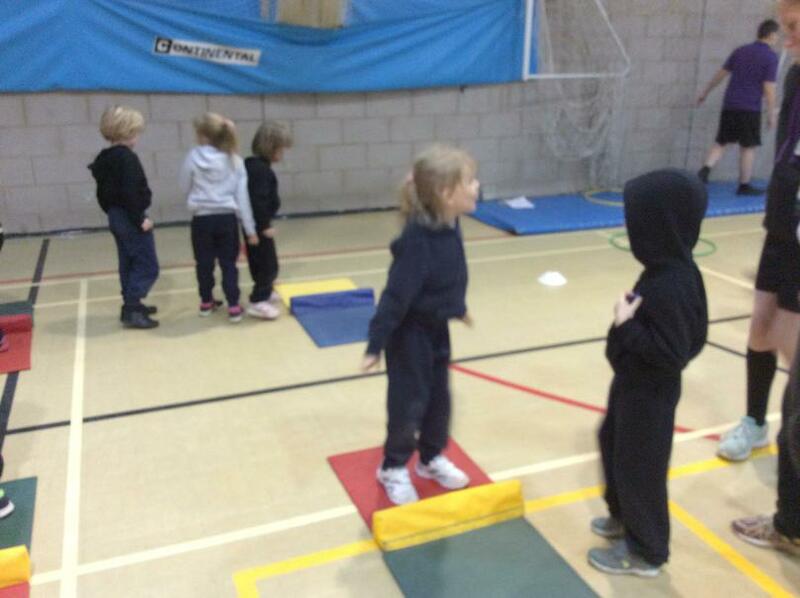 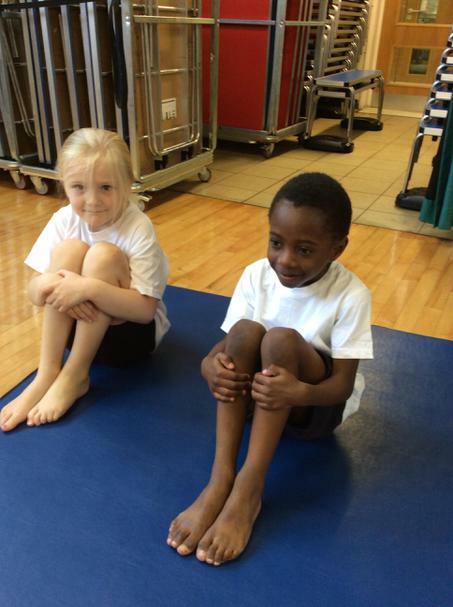 All of the Year 2 children worked on skills needed for Key Steps One Gymnastics. 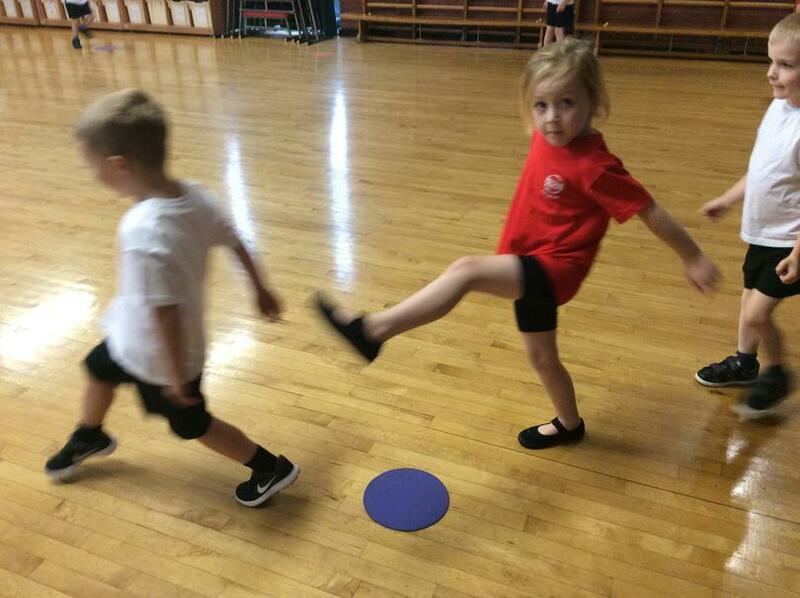 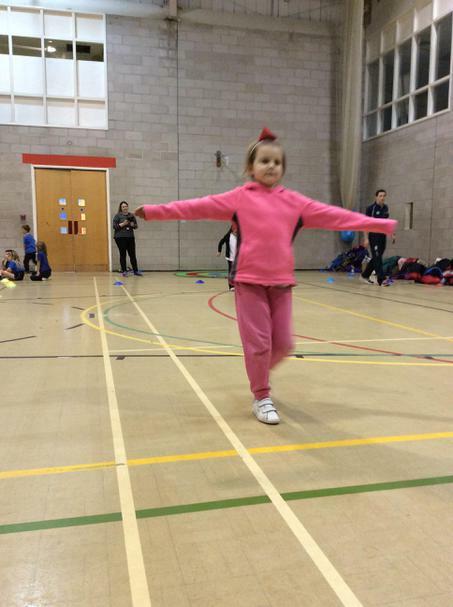 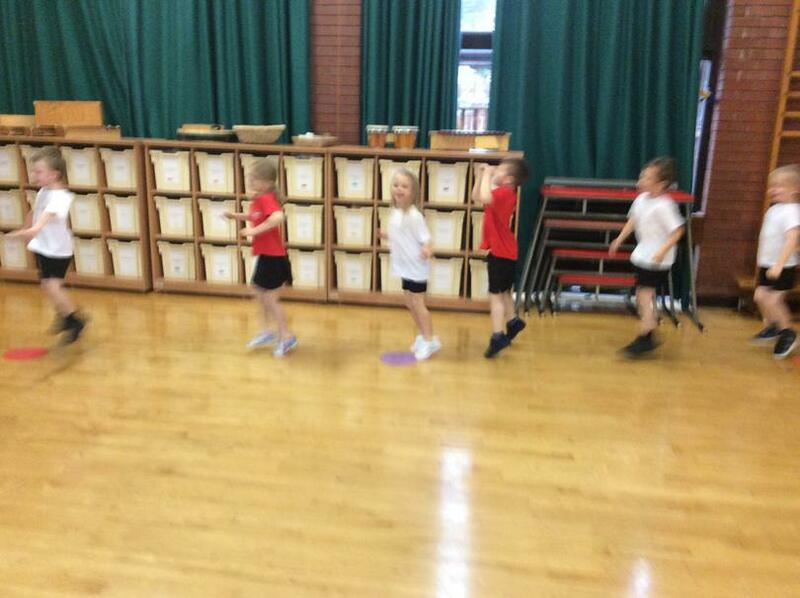 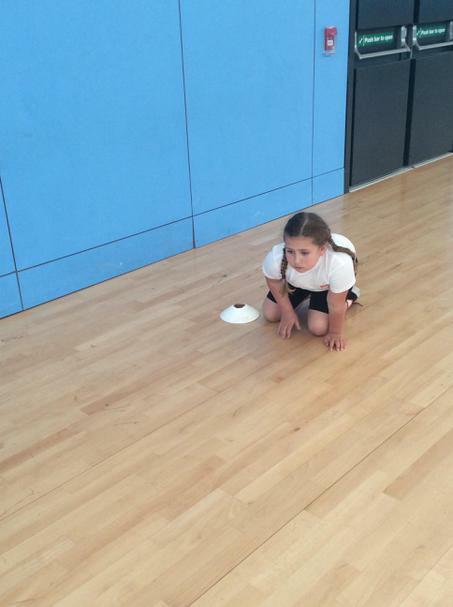 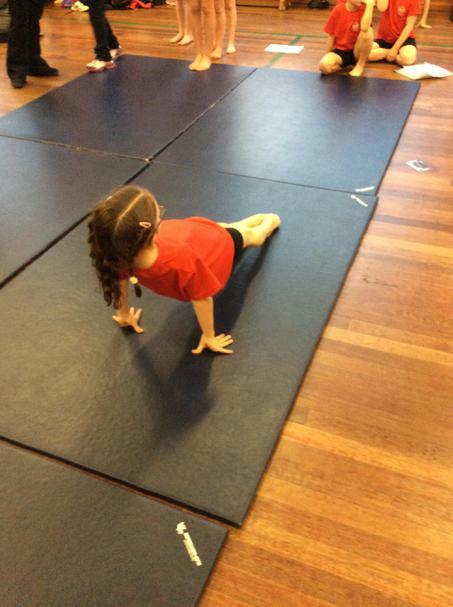 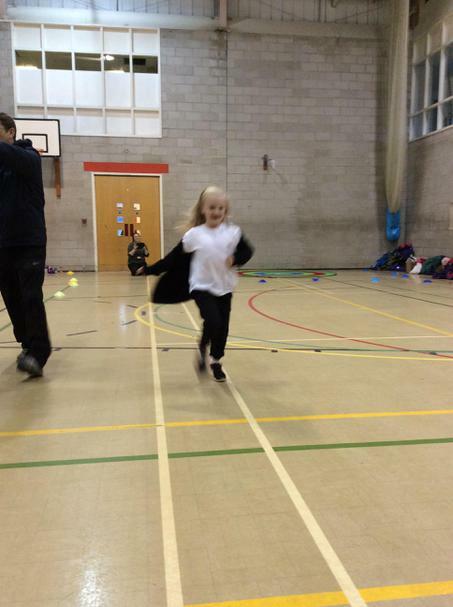 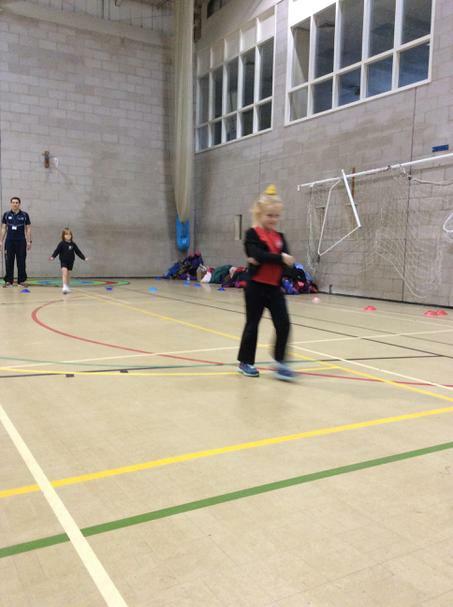 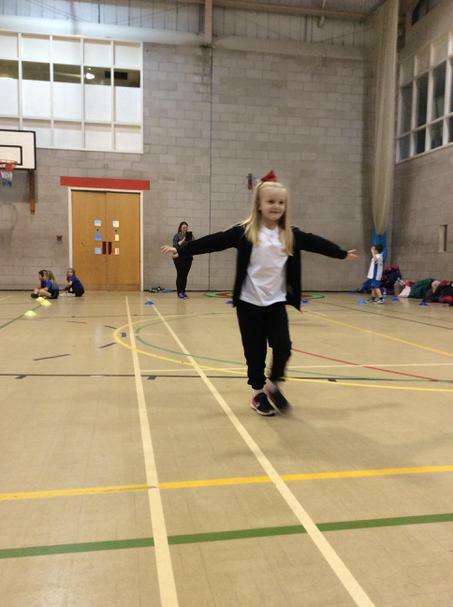 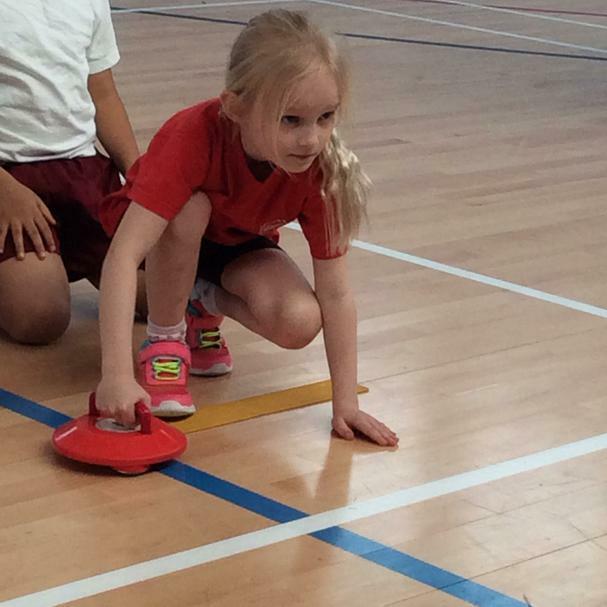 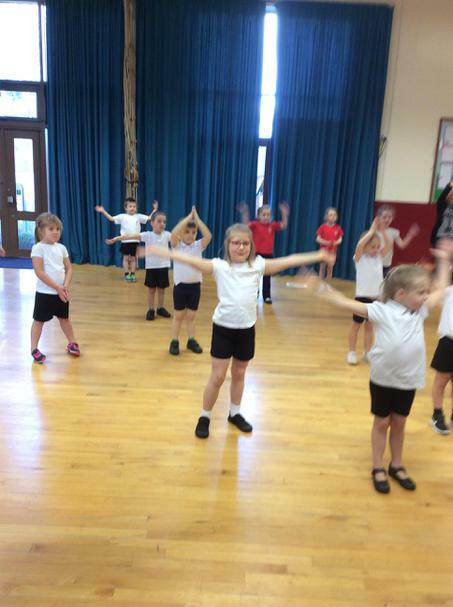 In Year 1 she is currently supporting the teaching of fundamental movement skills. 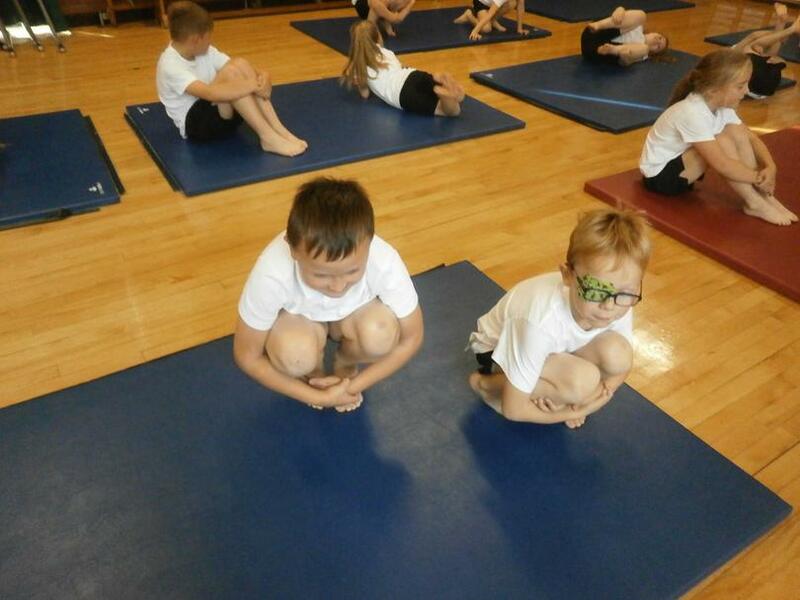 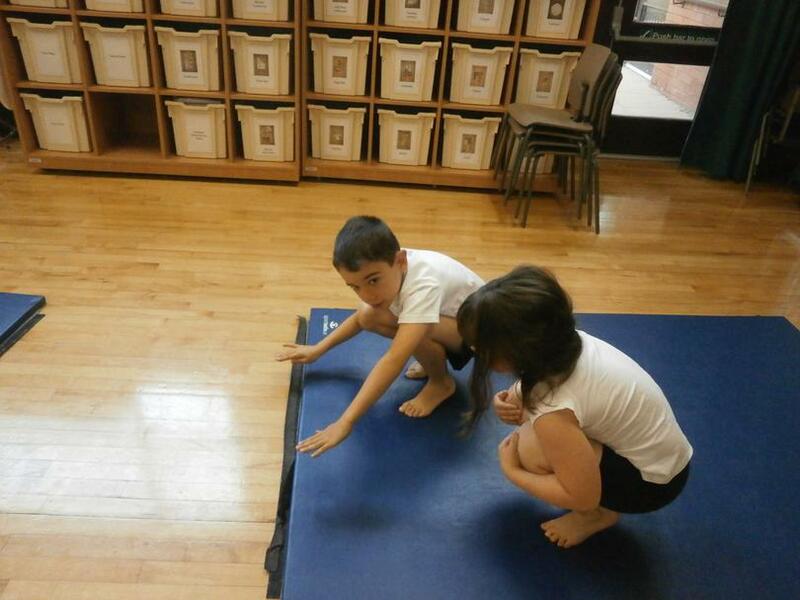 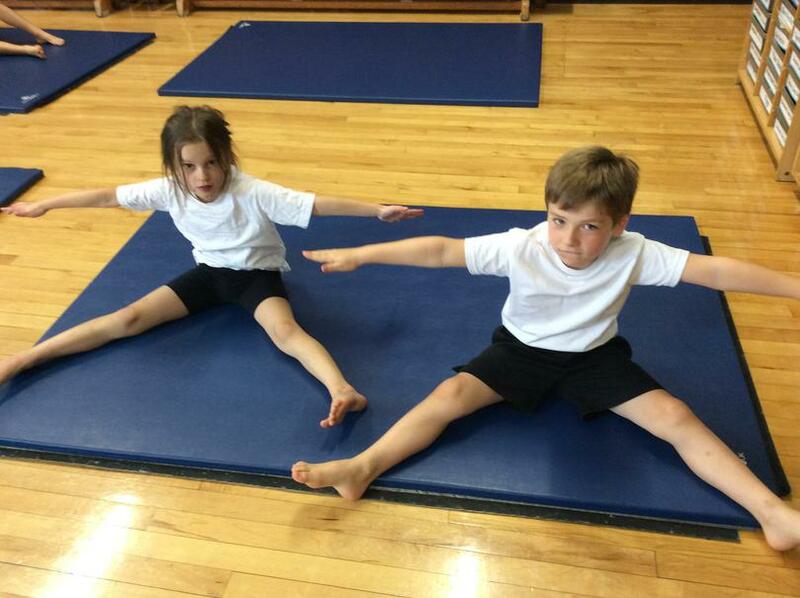 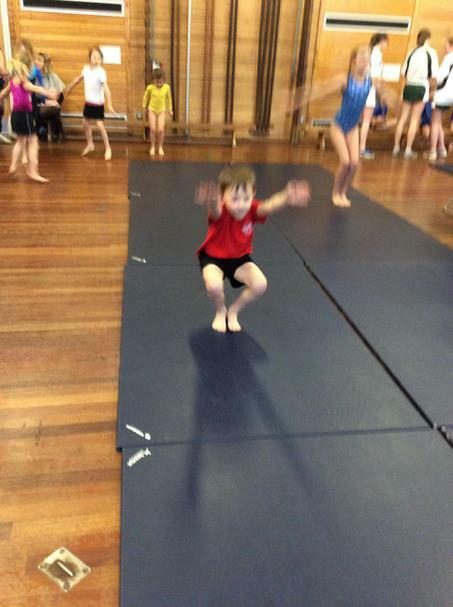 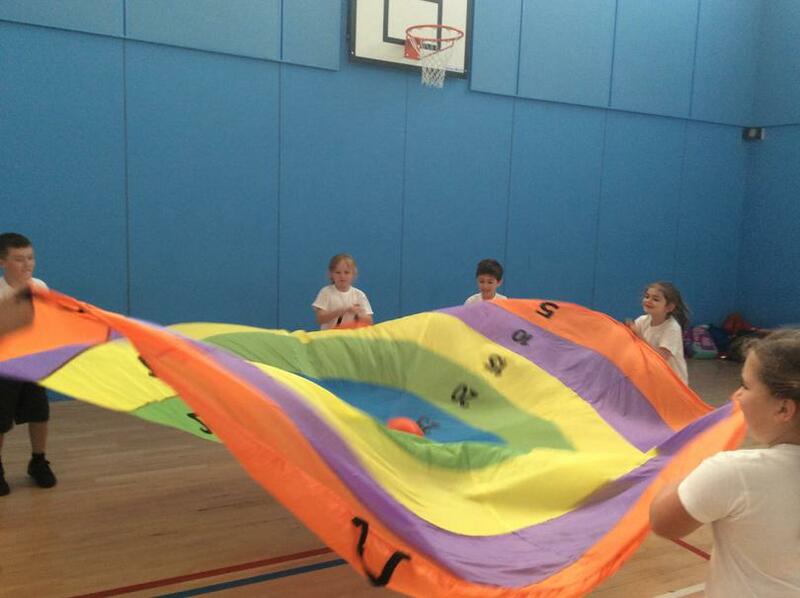 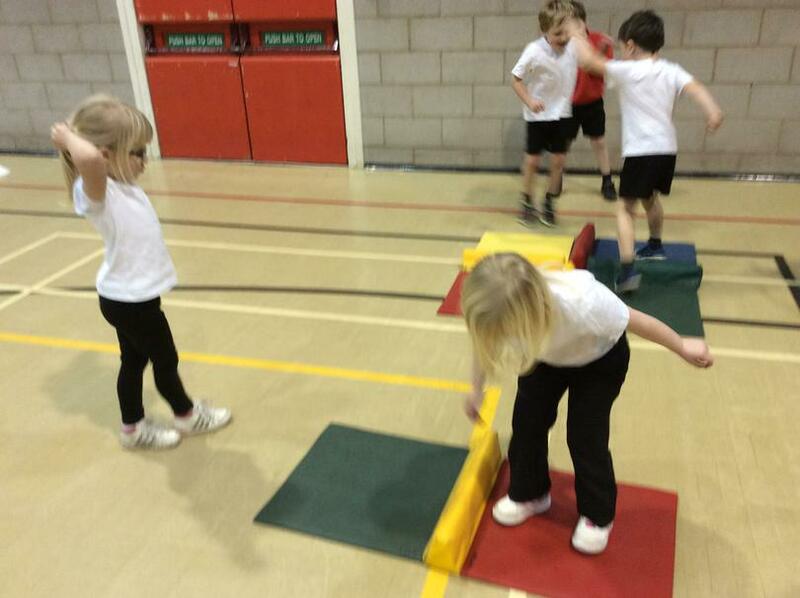 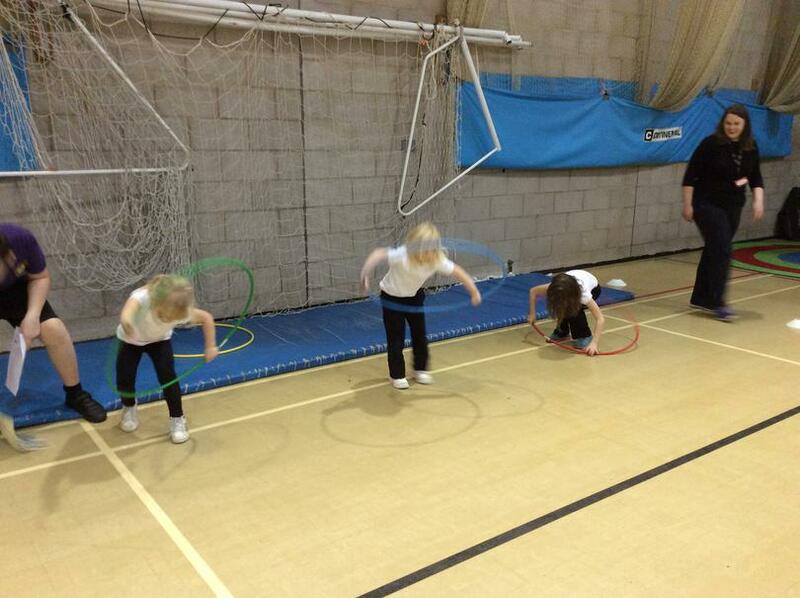 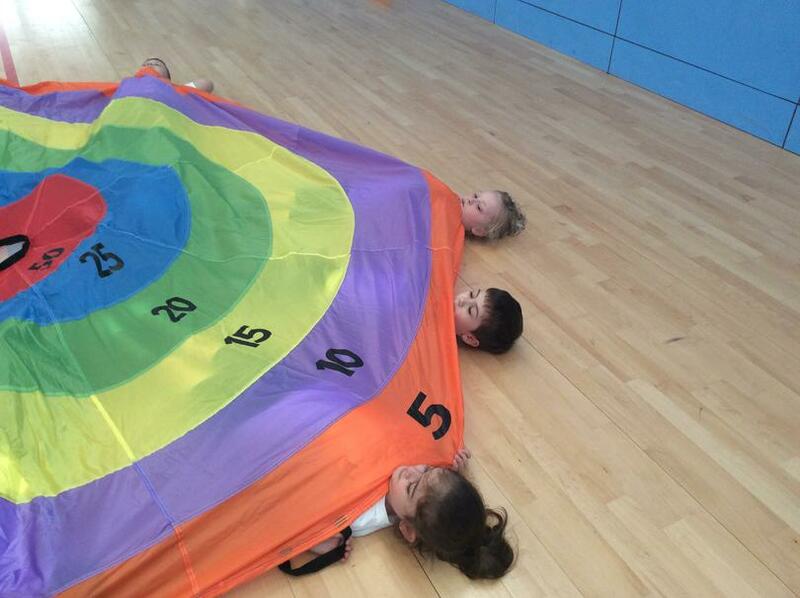 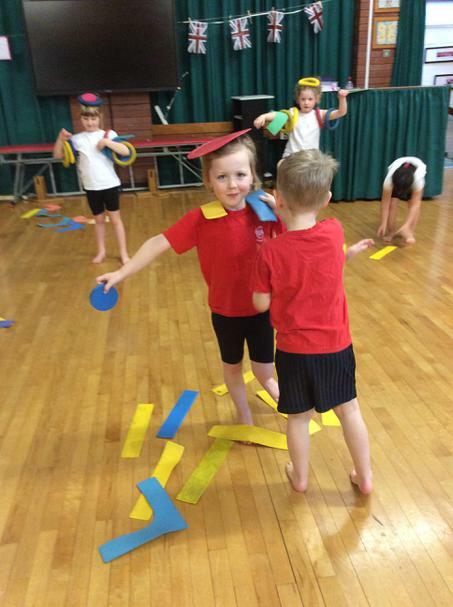 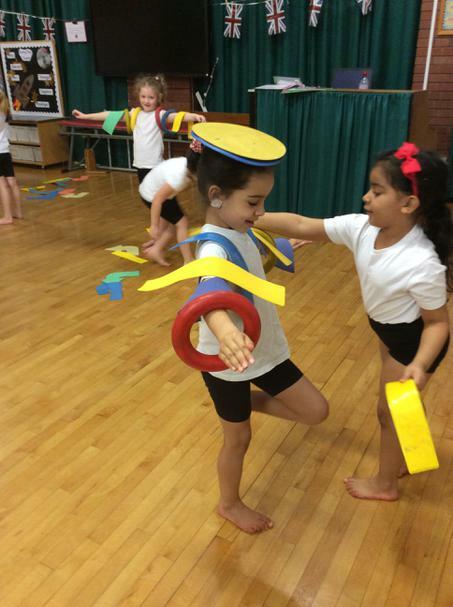 The children focus on Agility, Balance and Co-Ordination in a fun and engaging way. 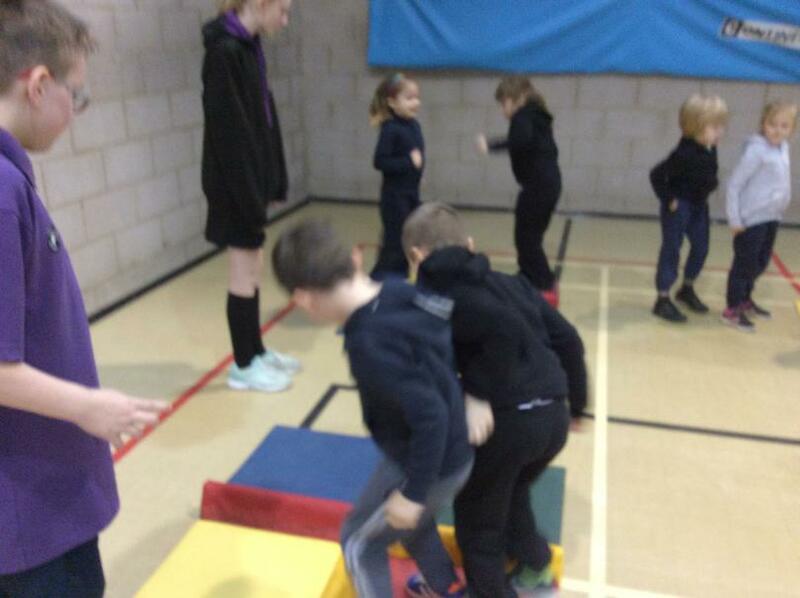 All the children love having Claire into visit as they always learn something new and have a fantastic time. 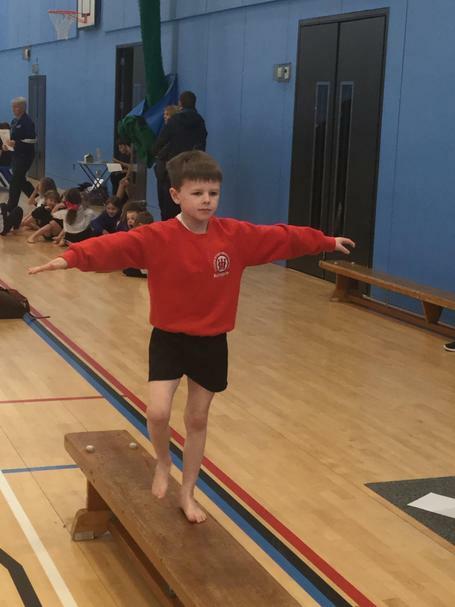 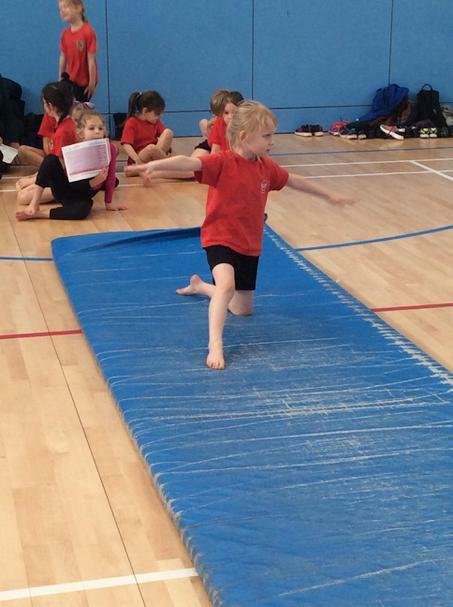 Several children from Year 2 entered the Key Steps 1 Gymnastics competition as part of the Harrogate Schools Sports Partnership. 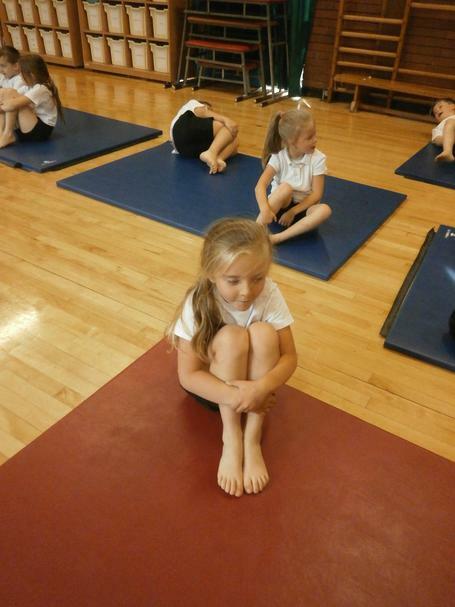 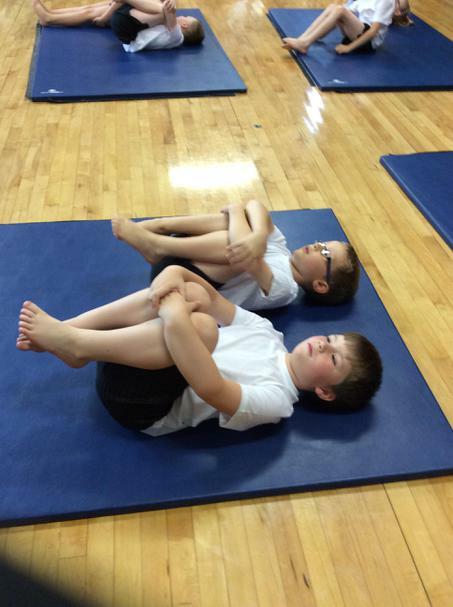 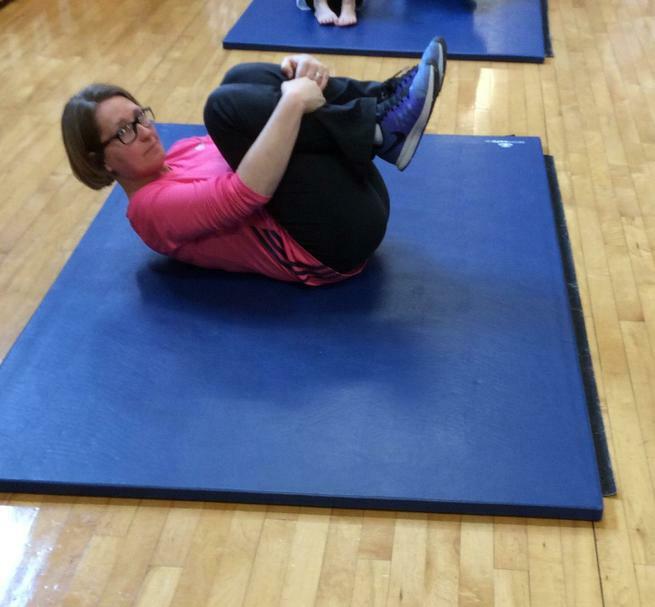 They had worked extremely hard during Gym Club to learn the routines and skills necessary for the competition. 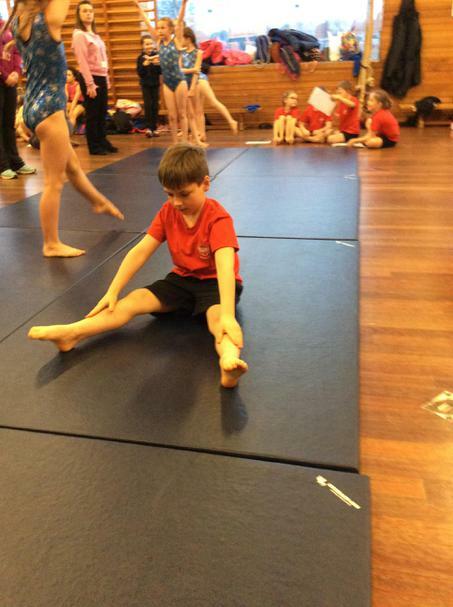 At the competition the children performed two routines and a vault. 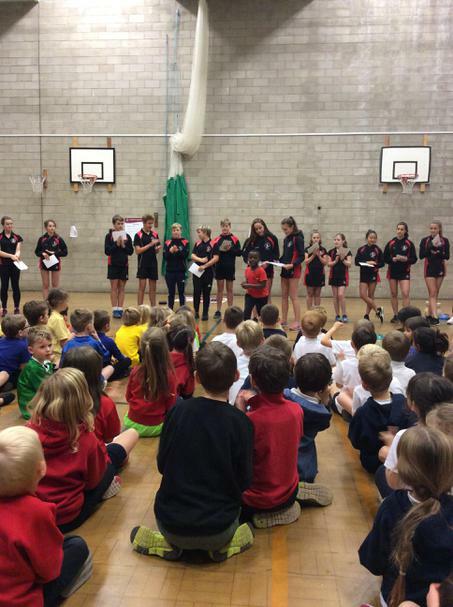 They all did an amazing job and made great role models for the school. 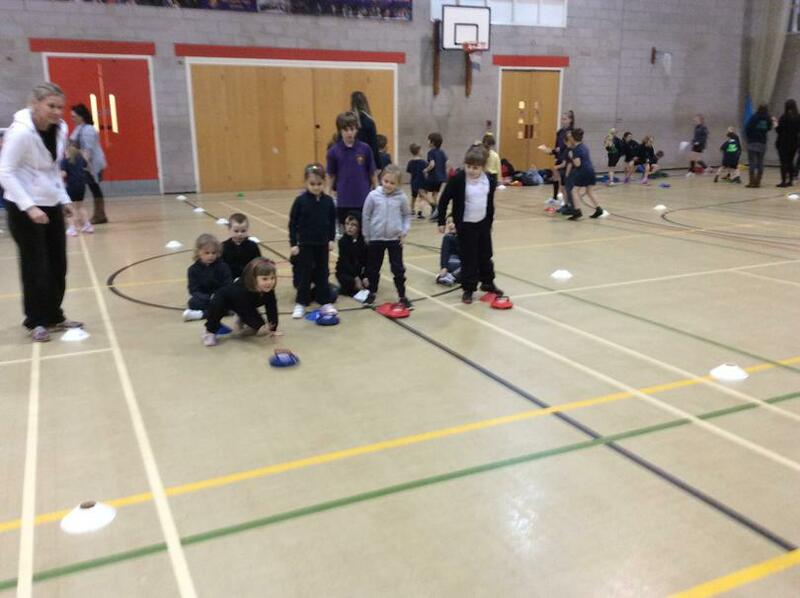 The teams finished in 2nd, 4th and 6th which means one team go forward to the finals. 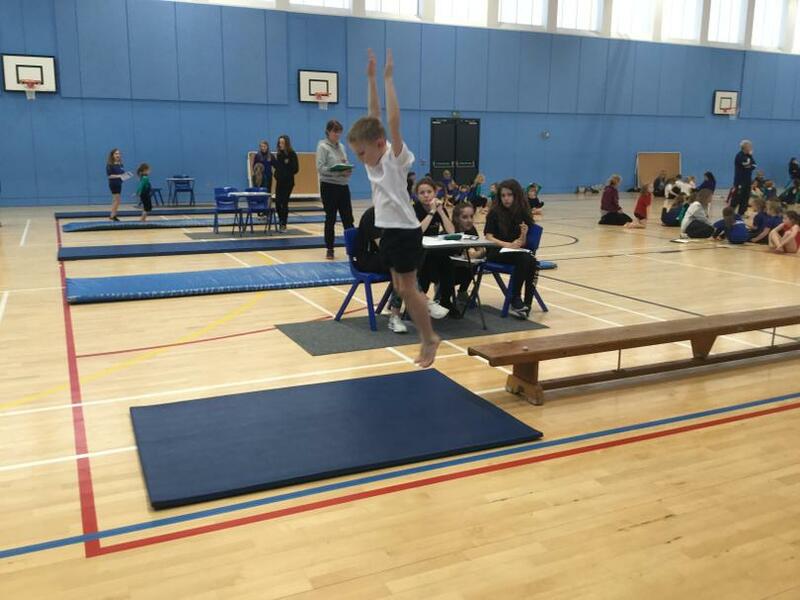 It was great to also have the Junior school competing at the same event who also had a team finish 2nd and as such progressed to the finals too. 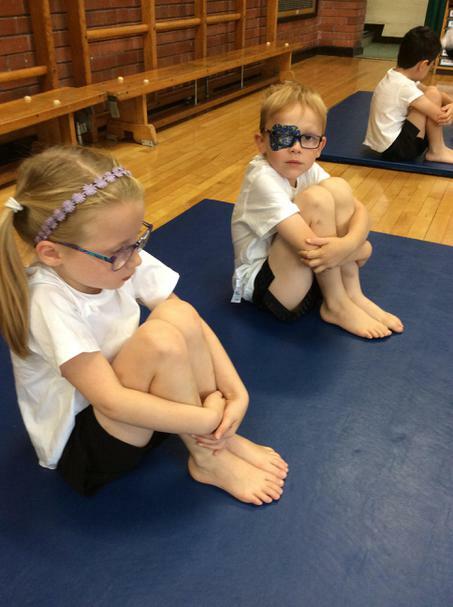 Infant and Junior Gymnastic teams waiting to discover the results. 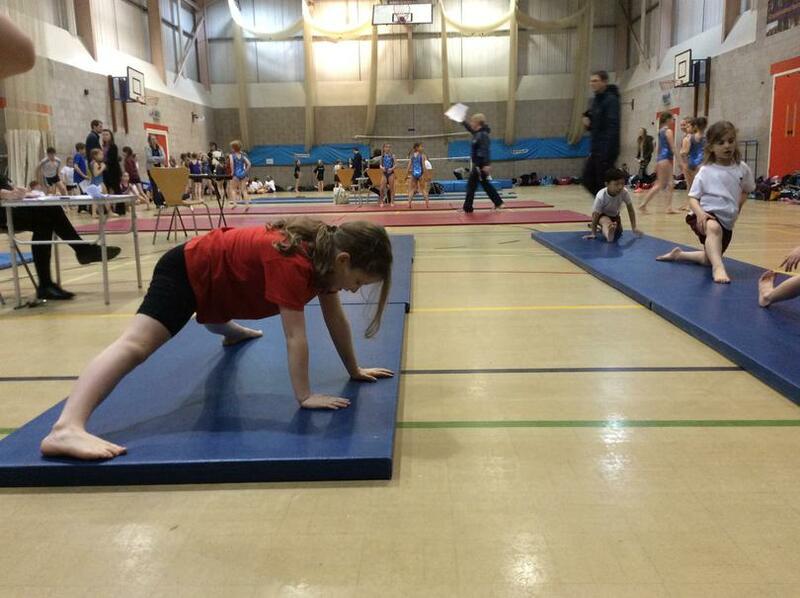 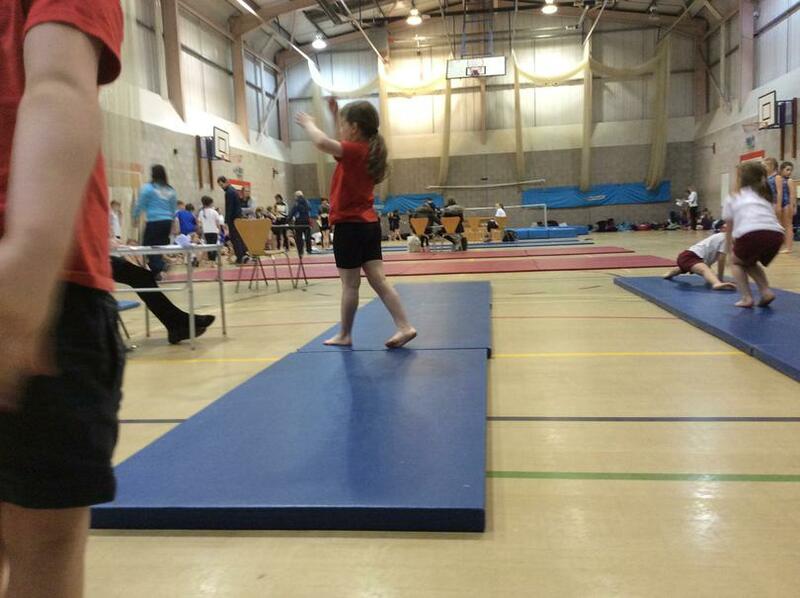 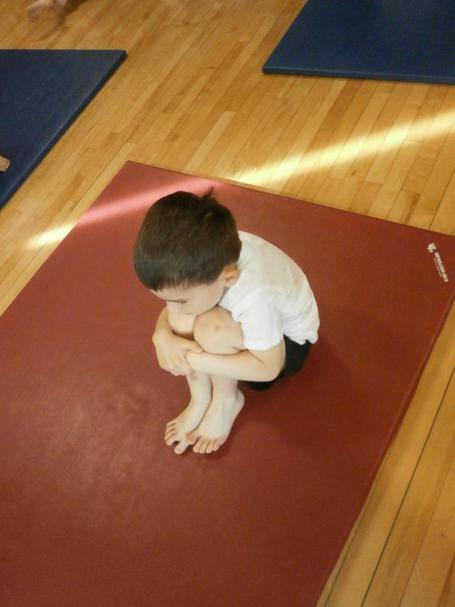 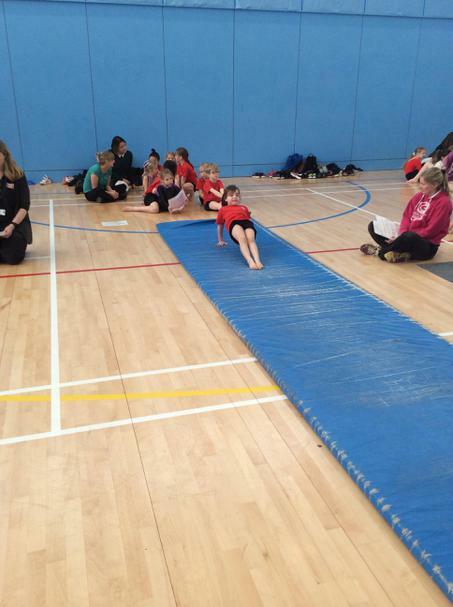 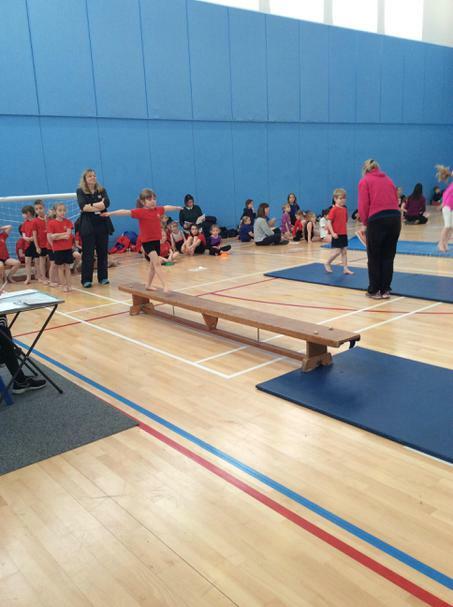 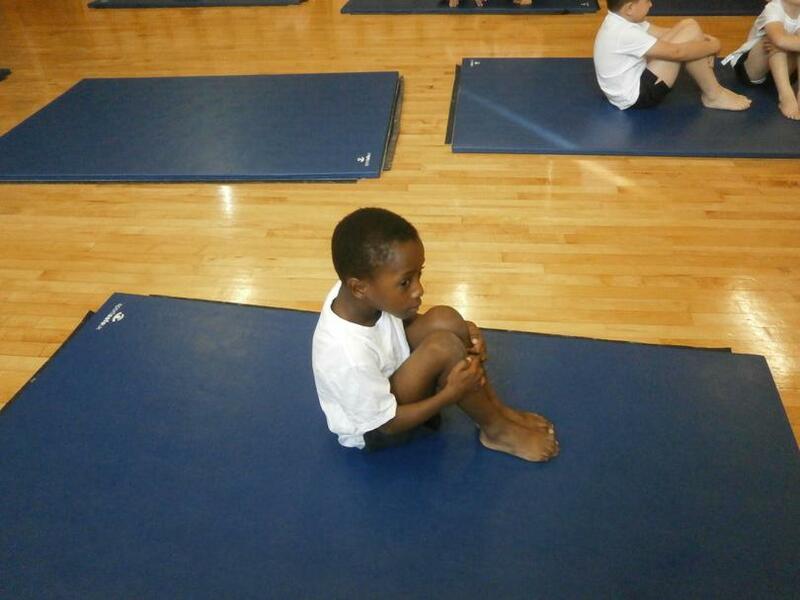 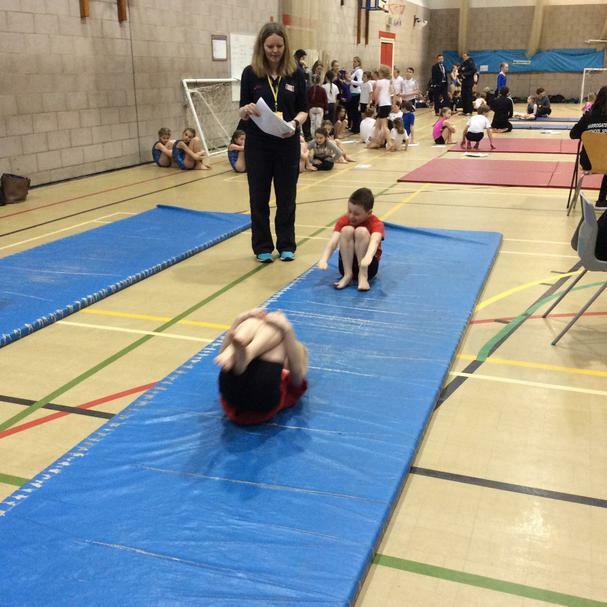 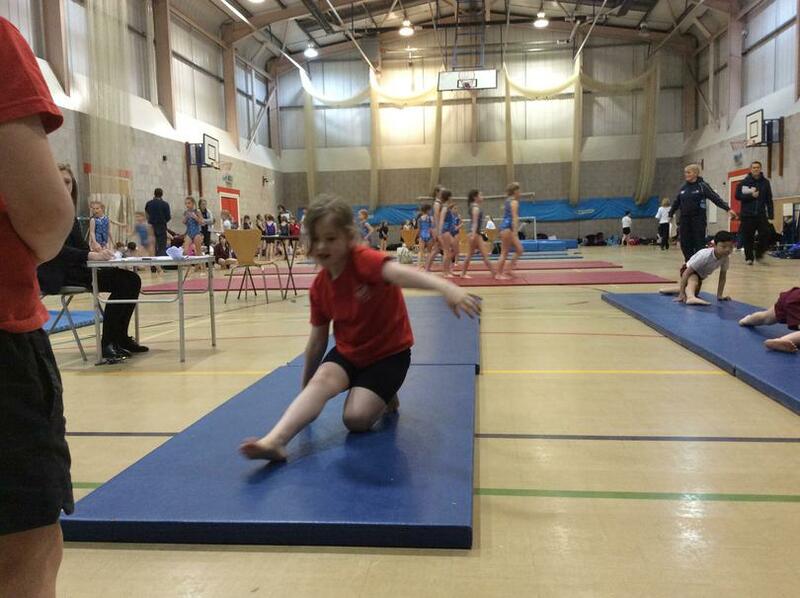 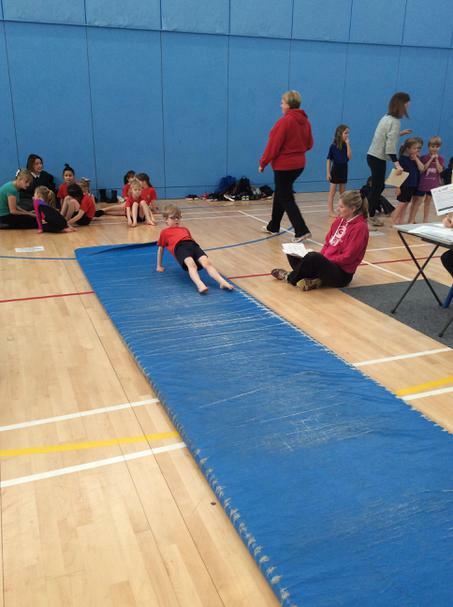 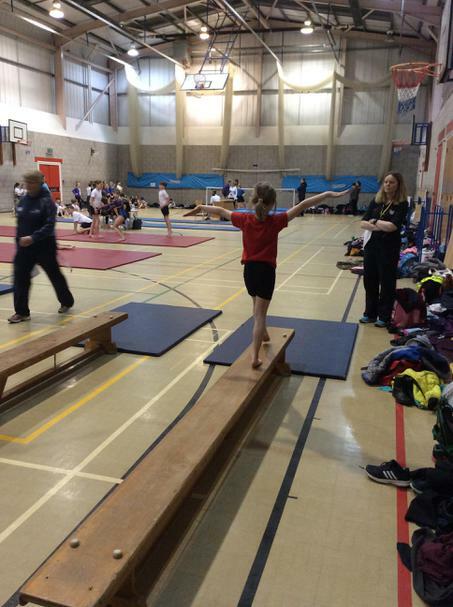 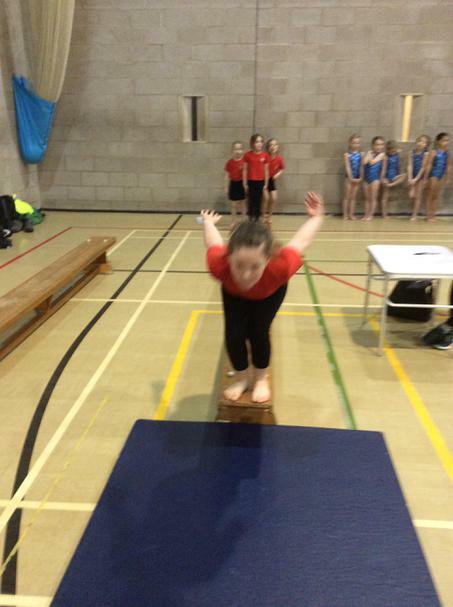 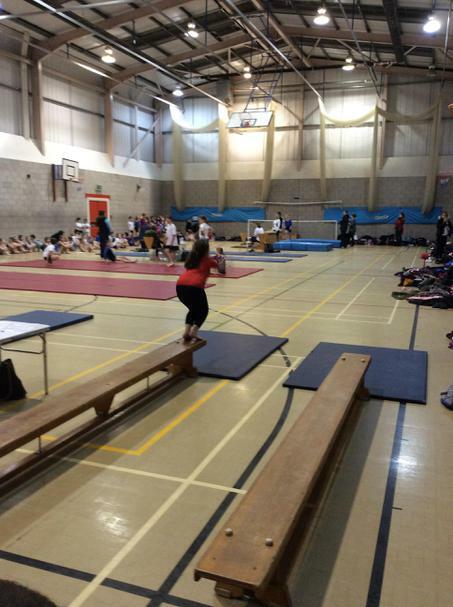 Check out some more pictures from The Gymnastics competition. 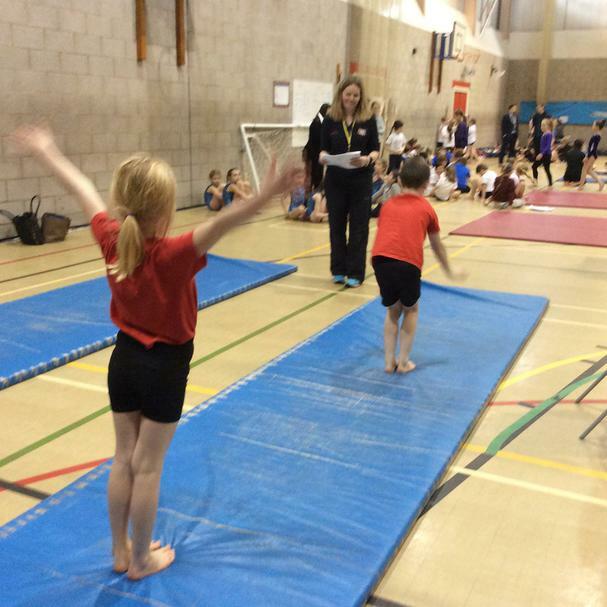 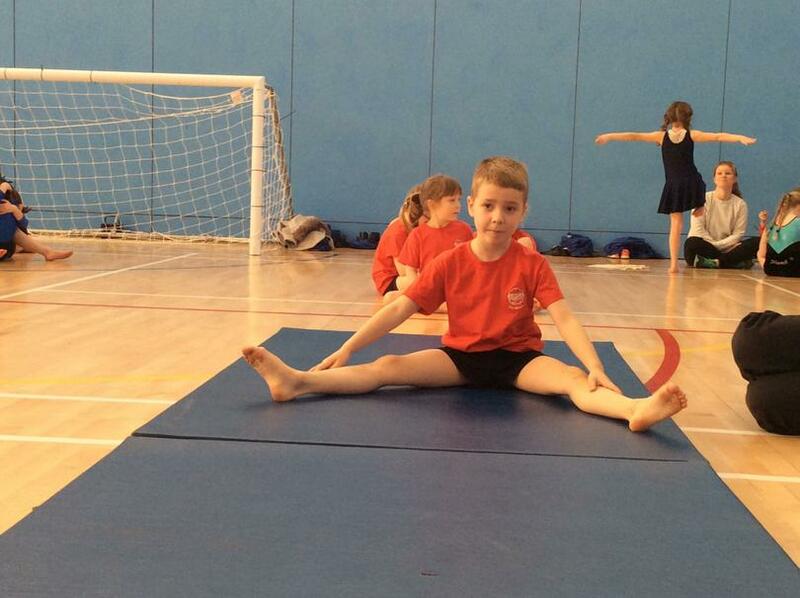 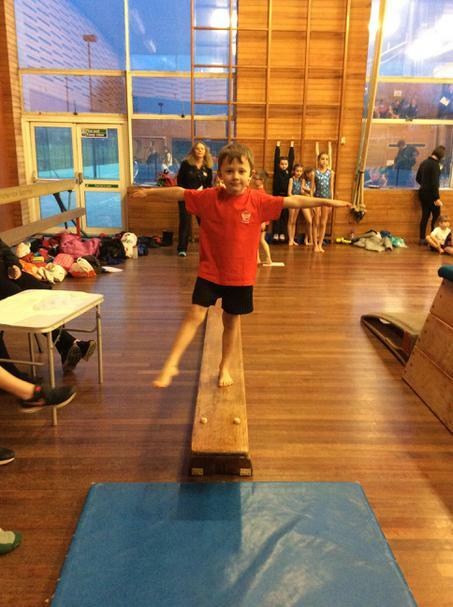 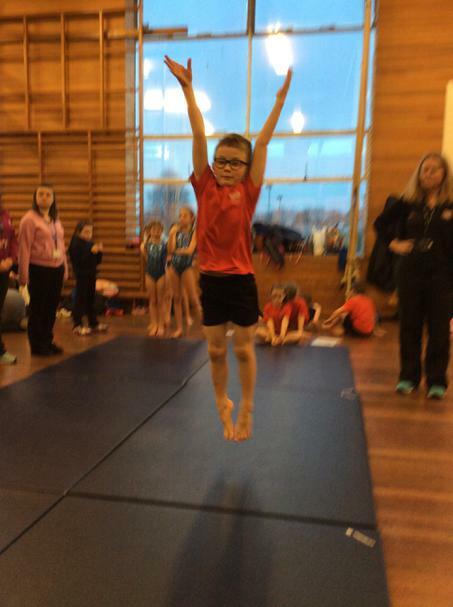 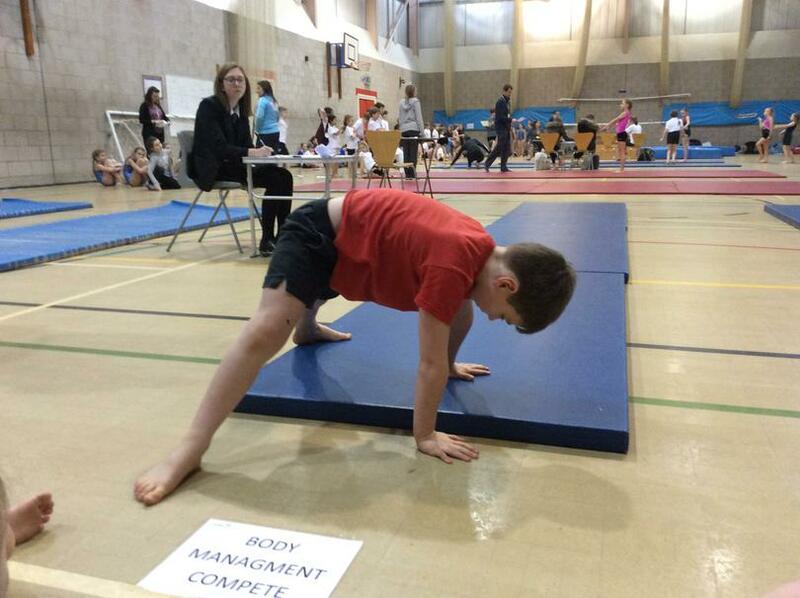 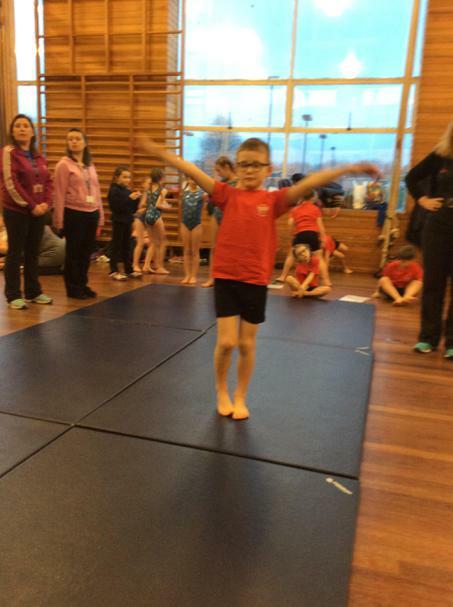 To see some videos from the Gymnastics competition click on the link below. 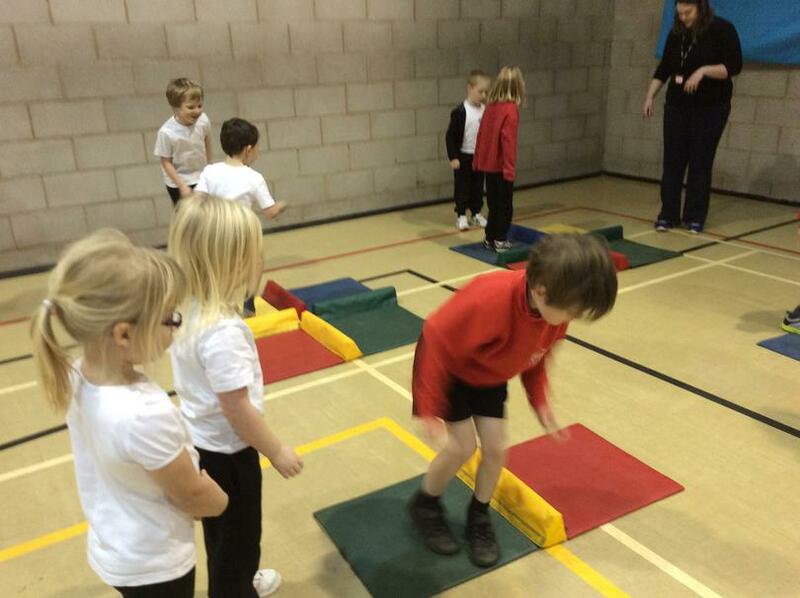 Children and staff are enjoying introducing the new Physical Education initiative of Real P.E. 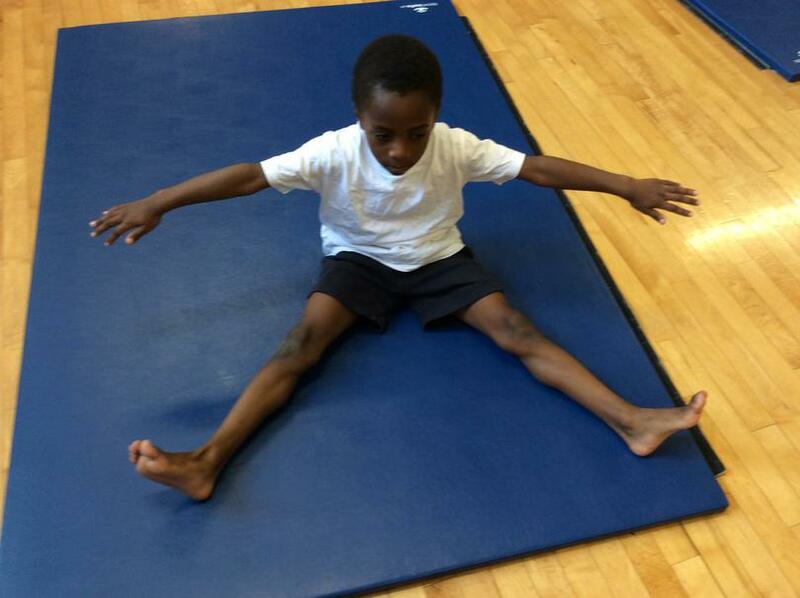 Real P.E. 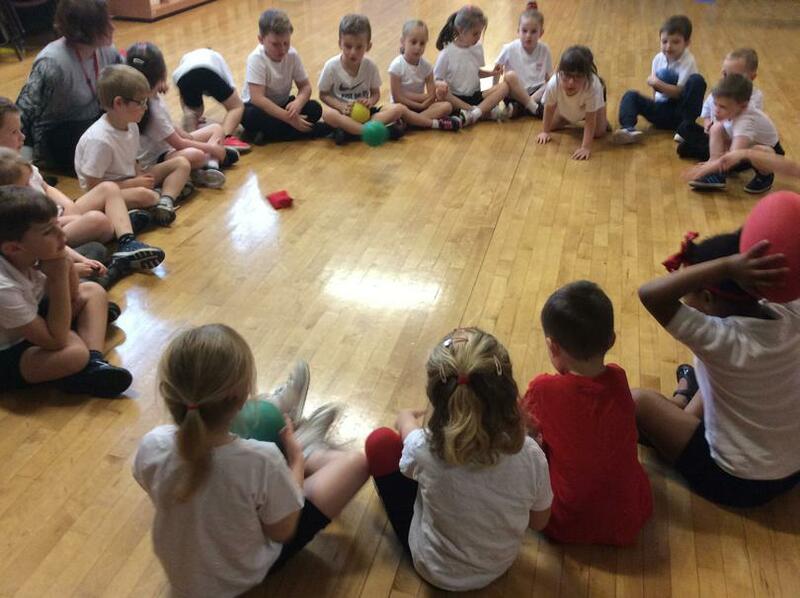 is such fun and the children get to sing, play games, develop skills and set their own targets enabling achievement by all. 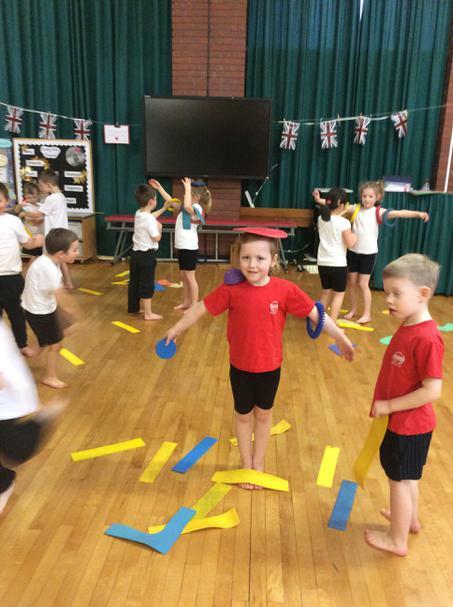 It is a fun and interactive scheme with stories, online resources and task cards used to enhance Physical, Cognitive, Social, Personal, Creative as well as Health and Fitness. 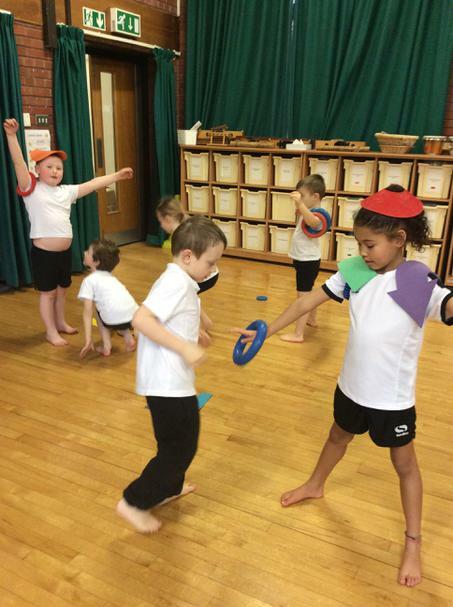 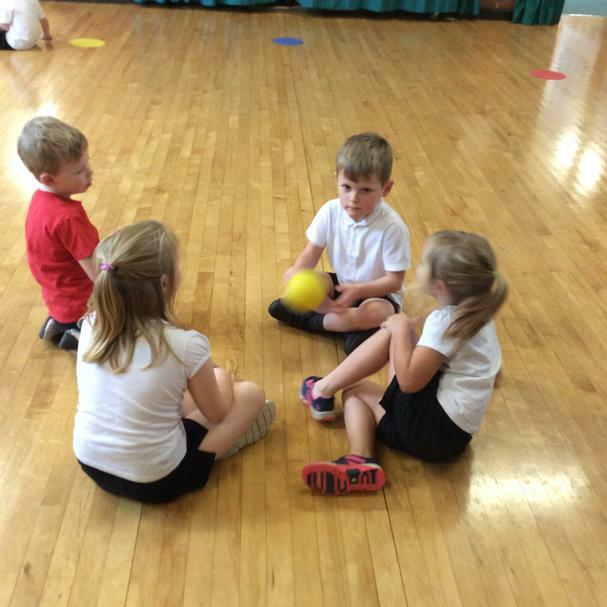 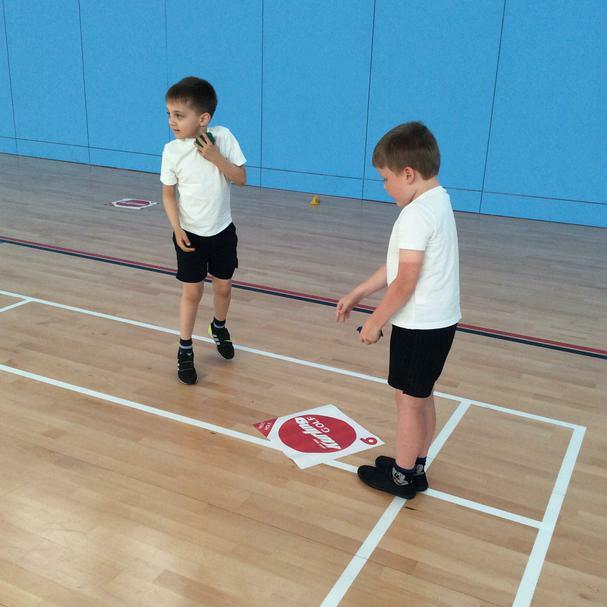 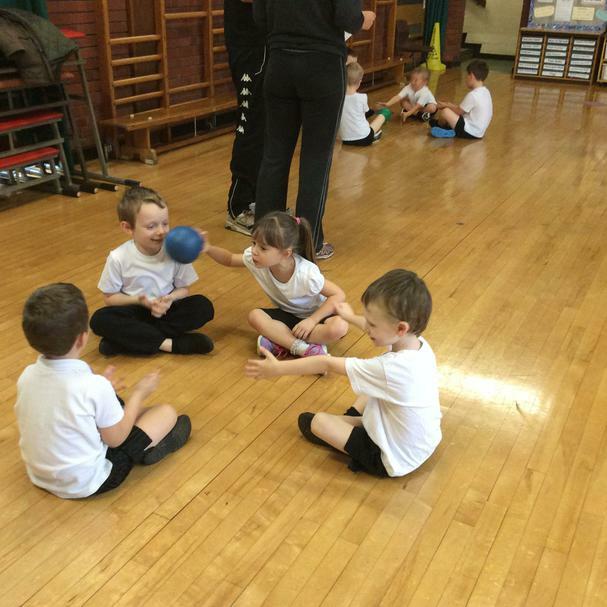 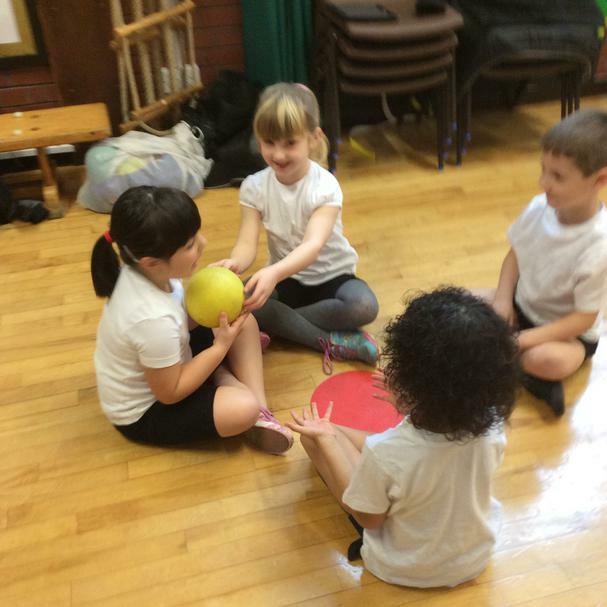 Below is a picture of the children playing 'Popping Pirates' which develops balance, co-ordination and team work in a fun environment. 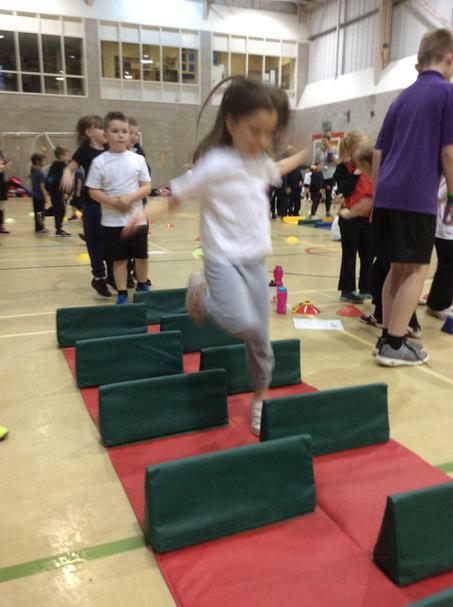 Another selection of children from year two got to take part at another Infant Agility Festival as part of The Harrogate Schools Sports Partnership. 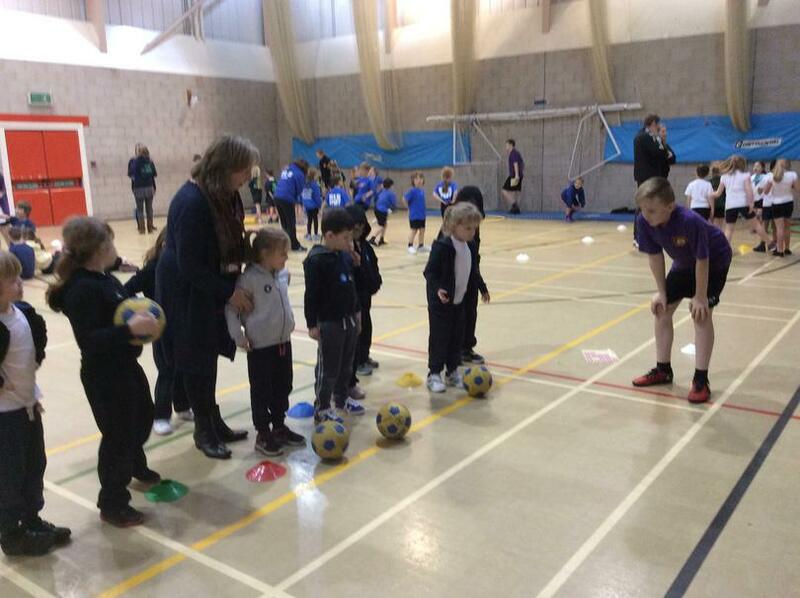 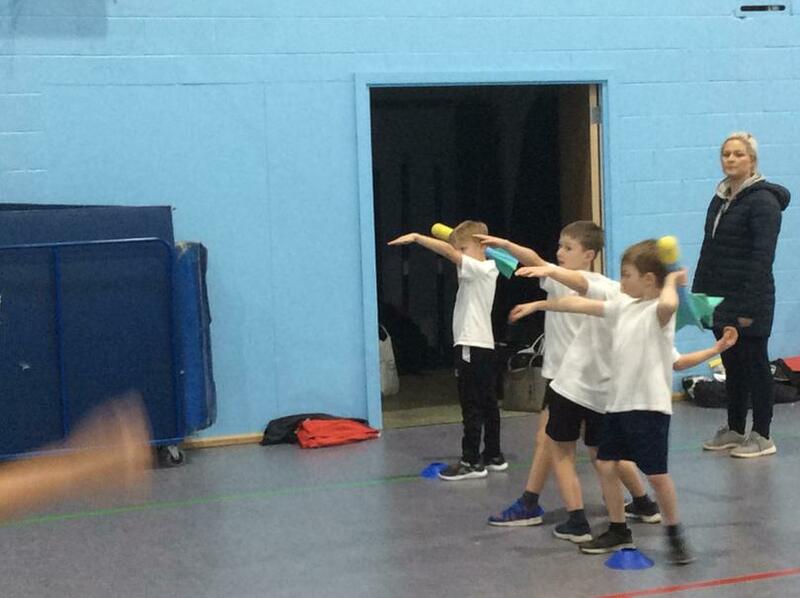 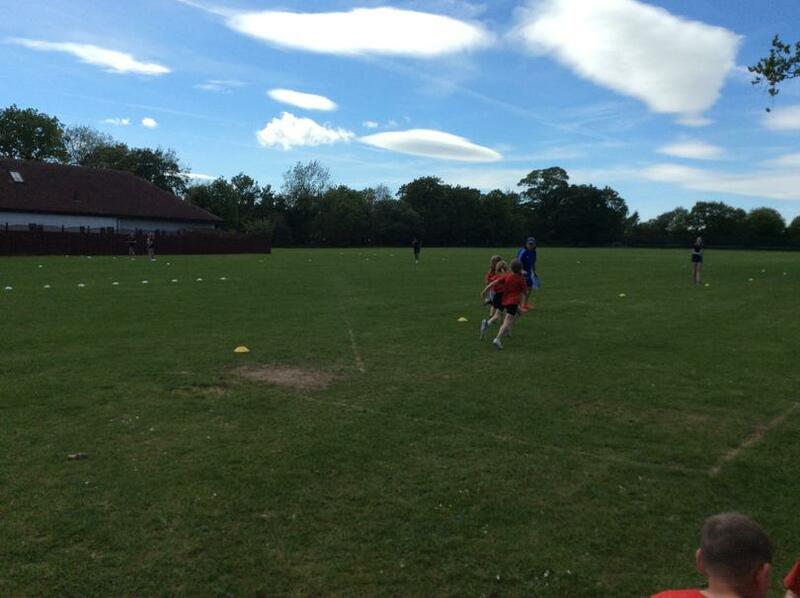 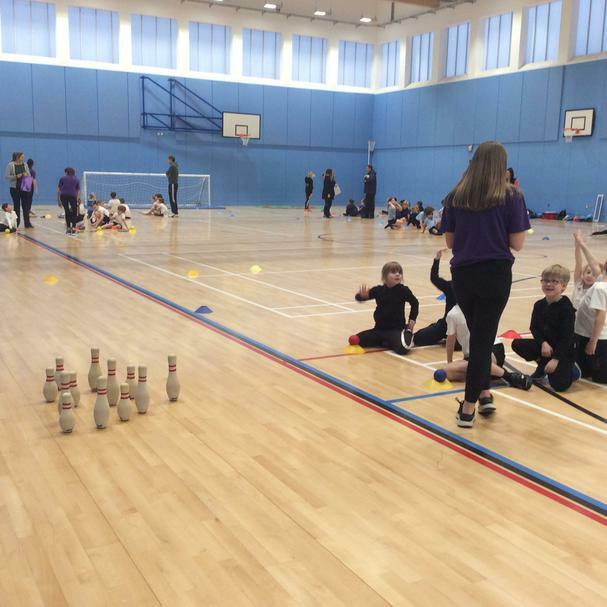 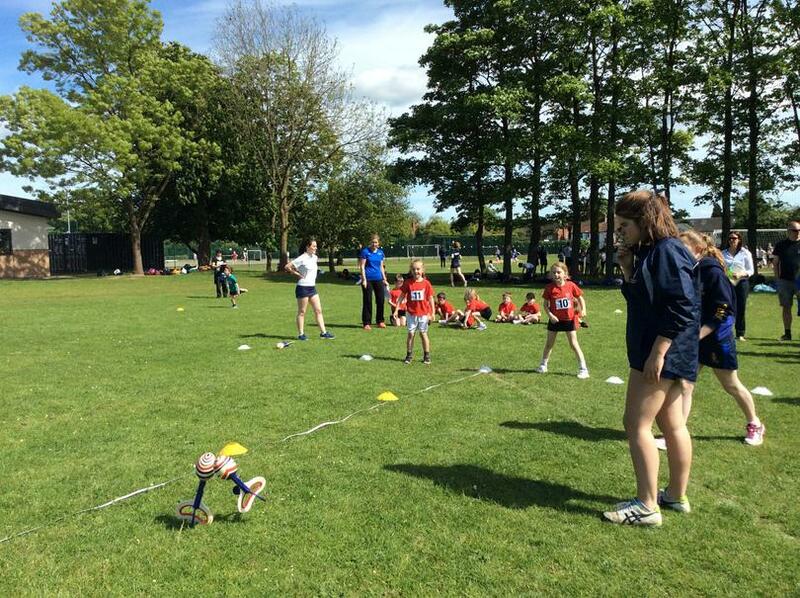 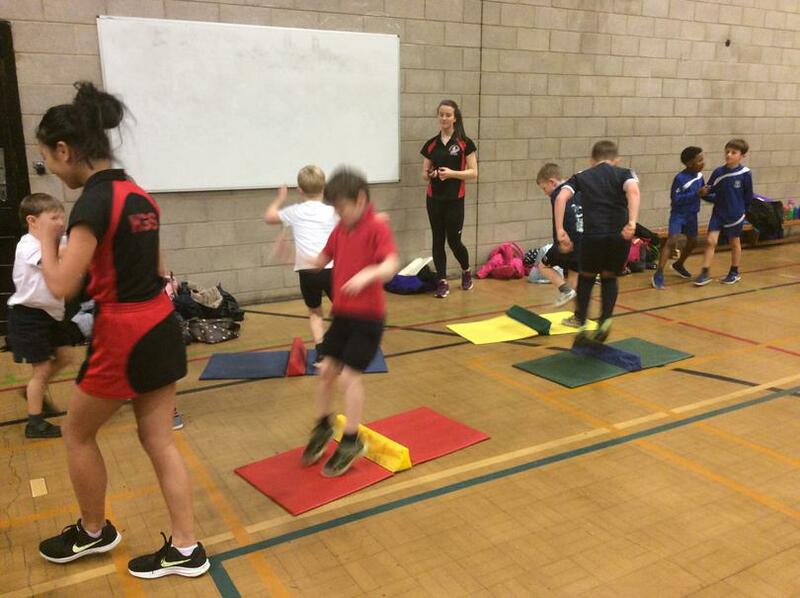 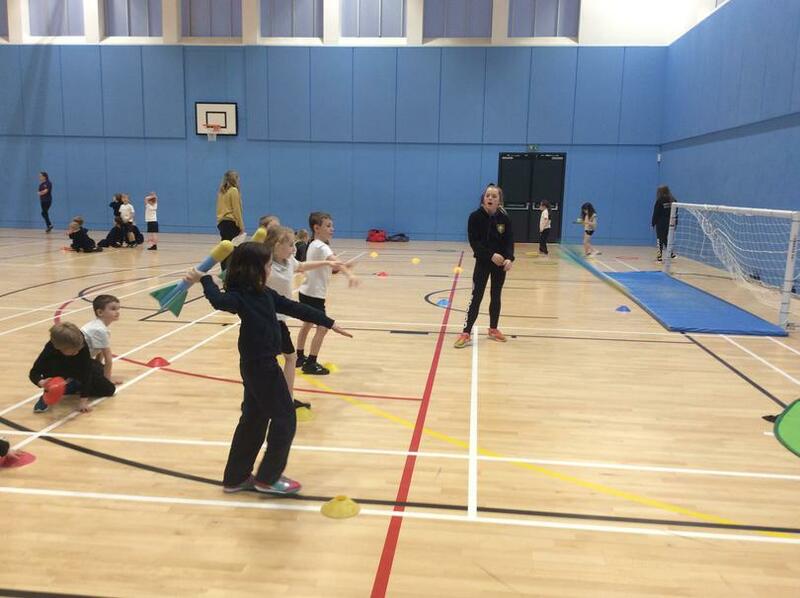 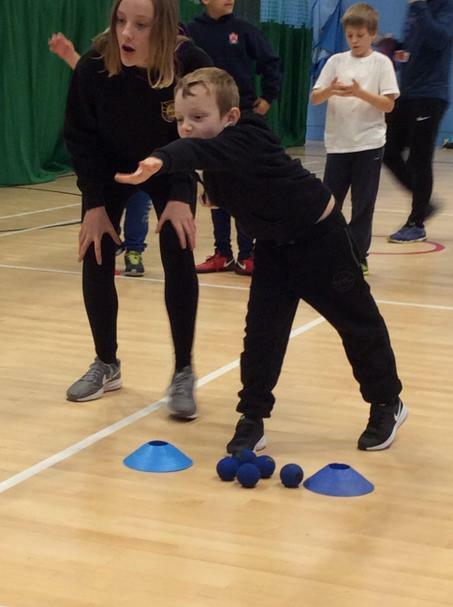 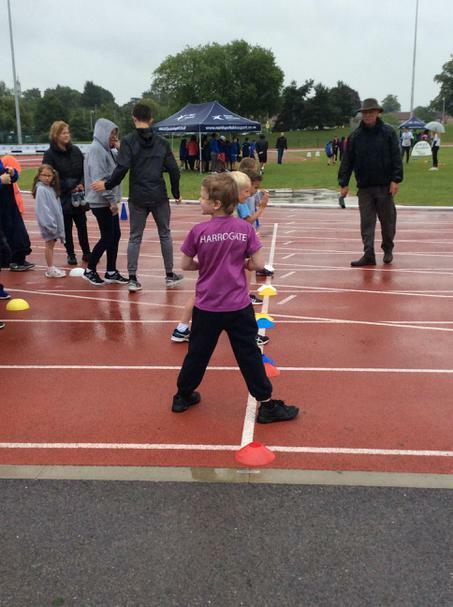 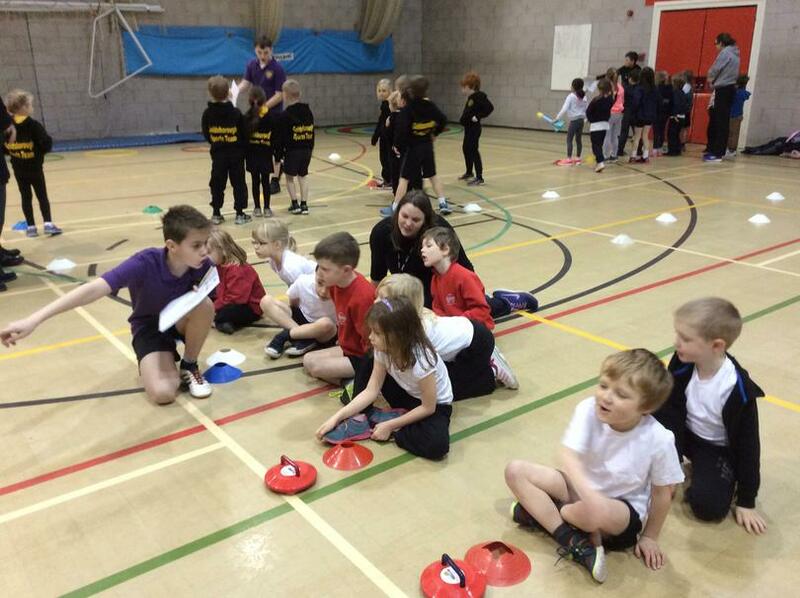 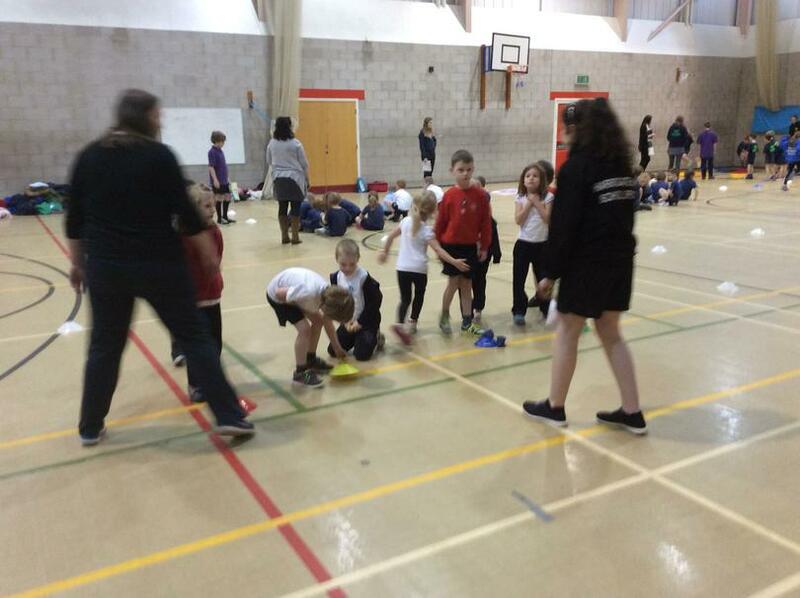 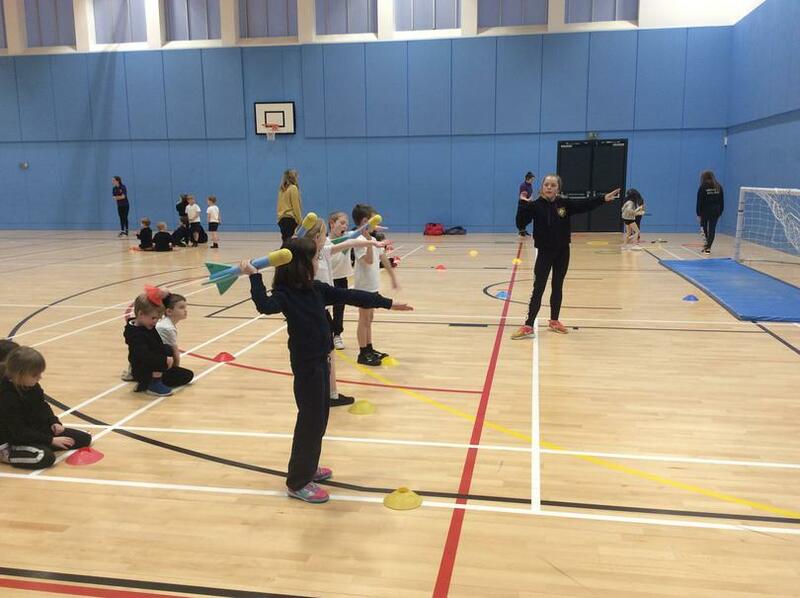 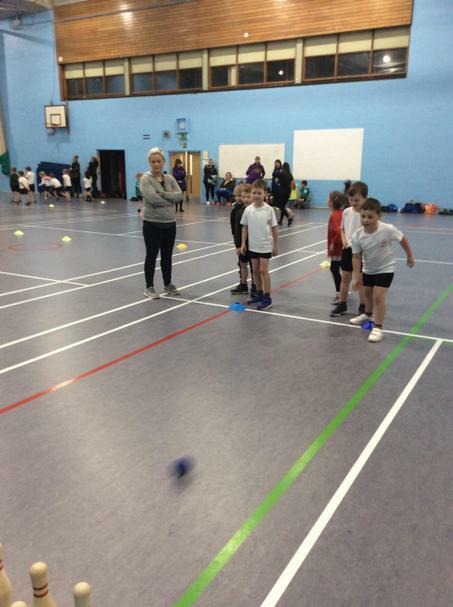 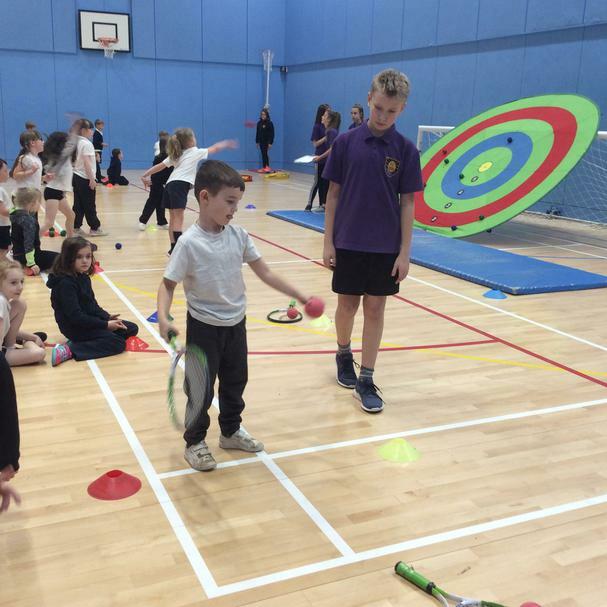 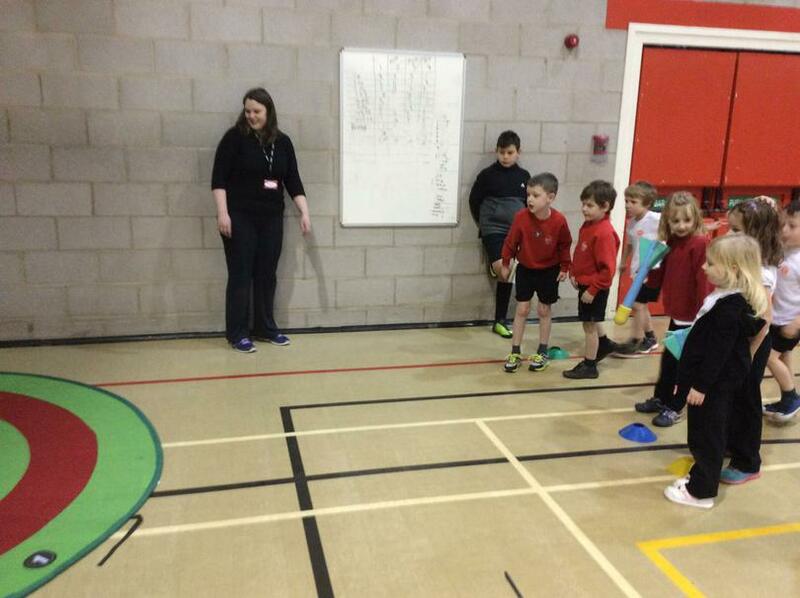 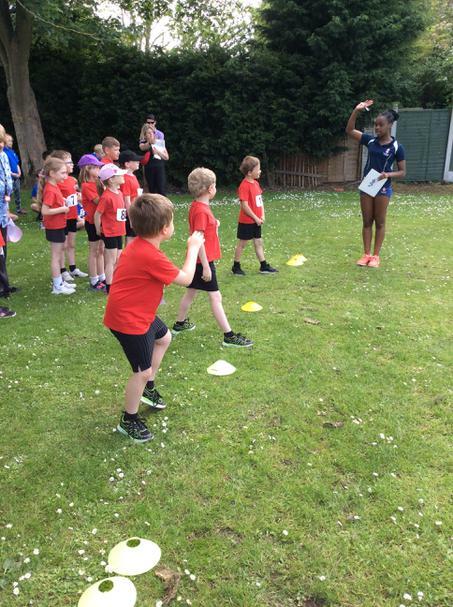 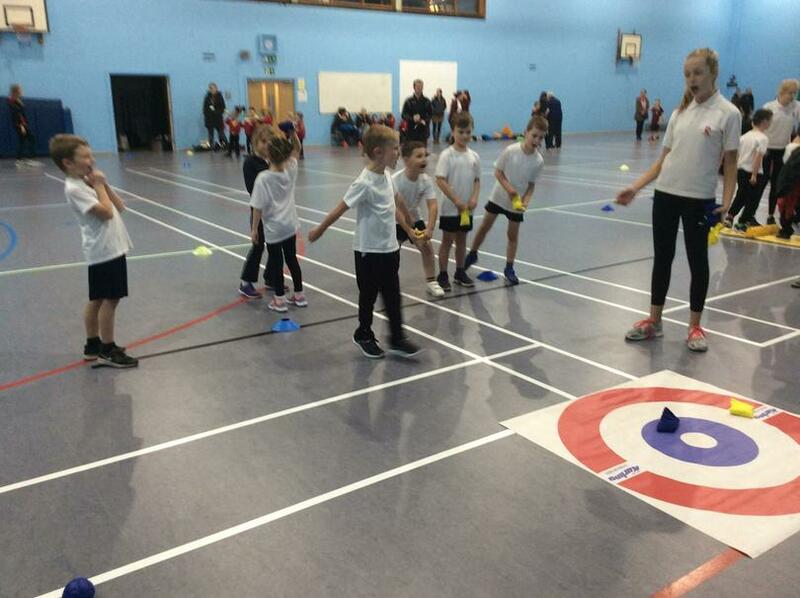 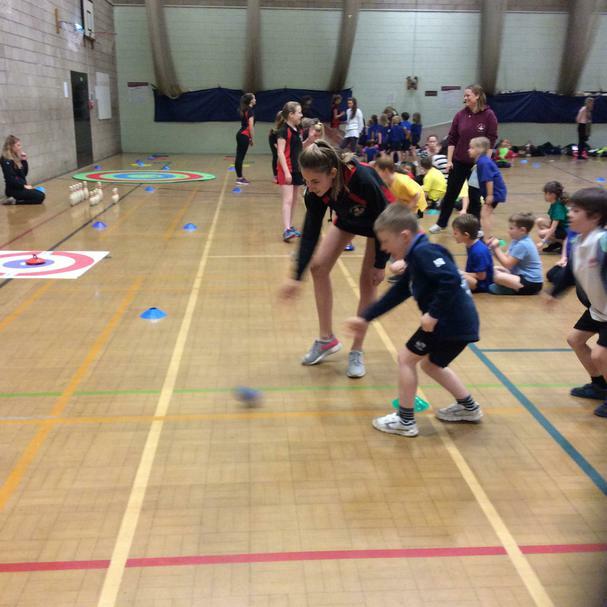 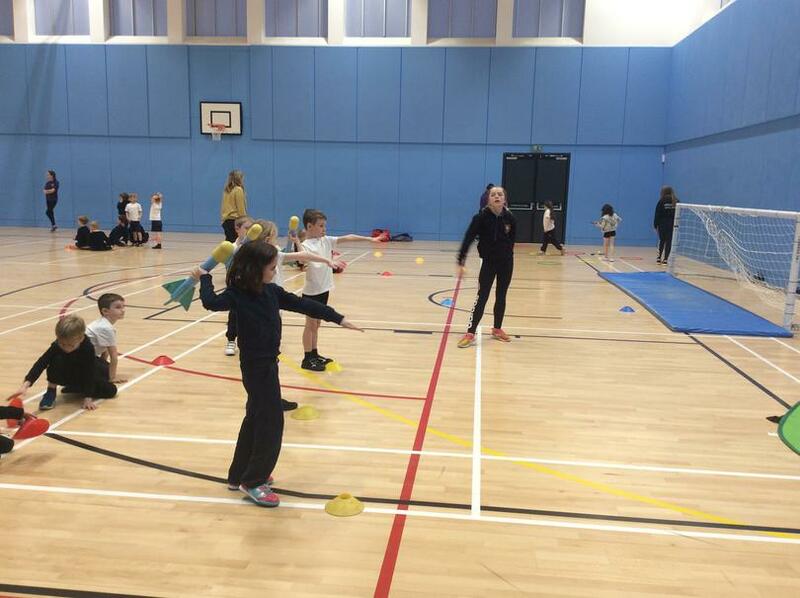 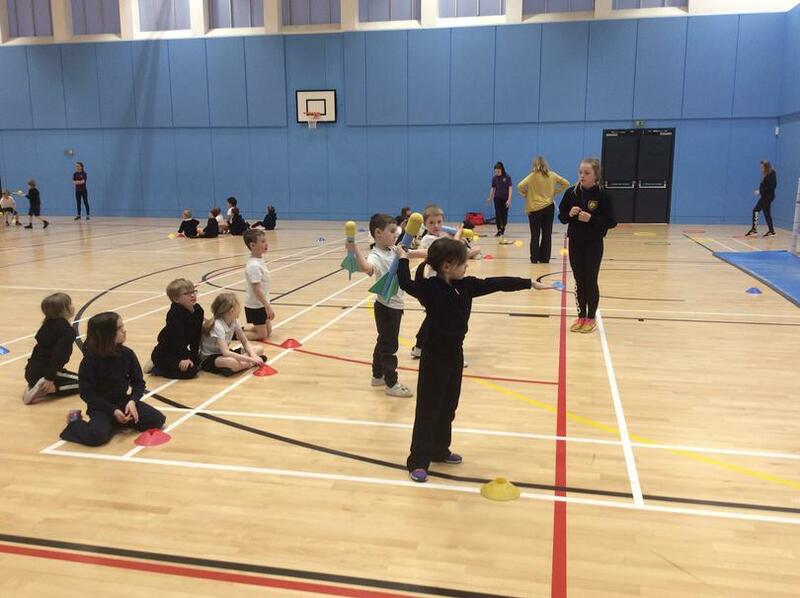 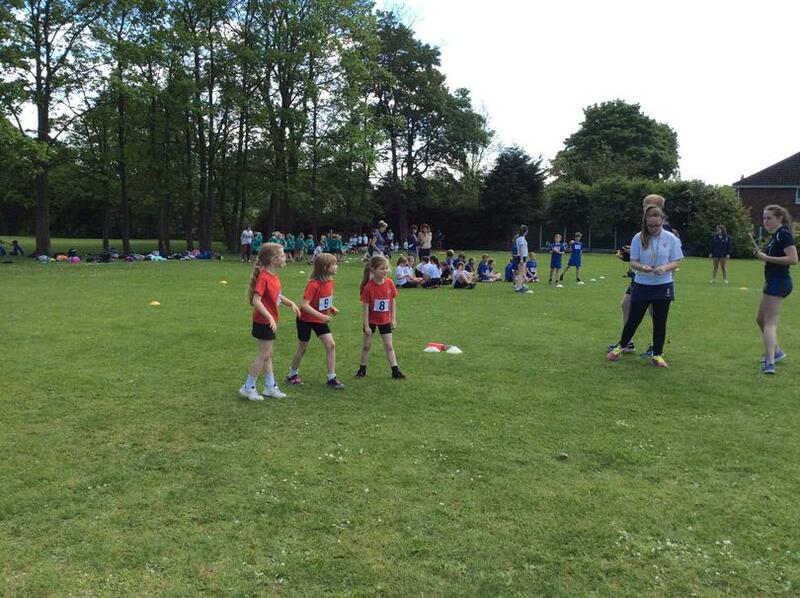 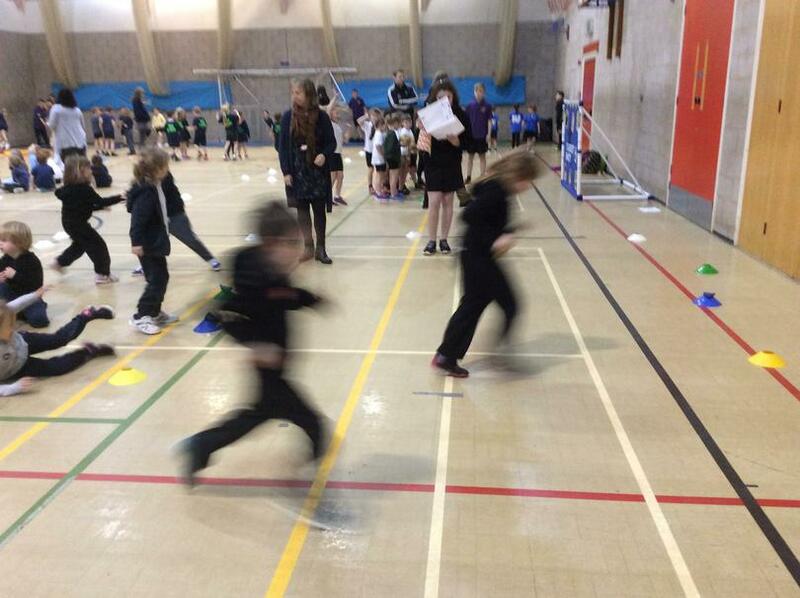 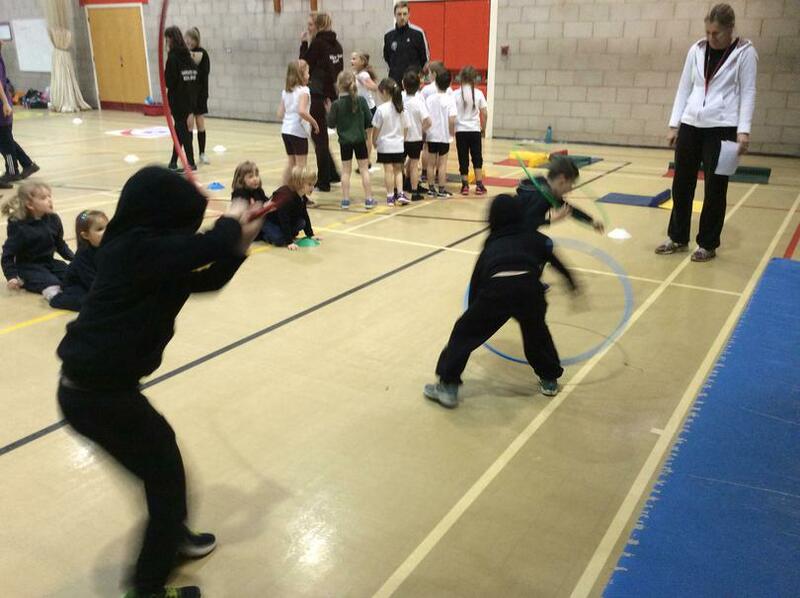 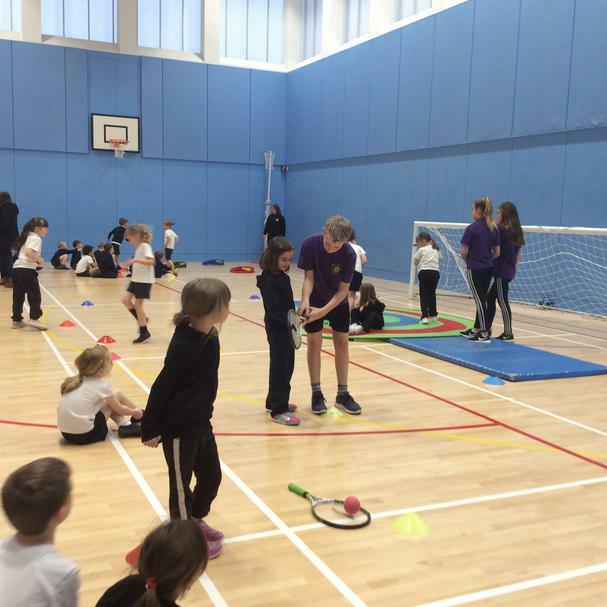 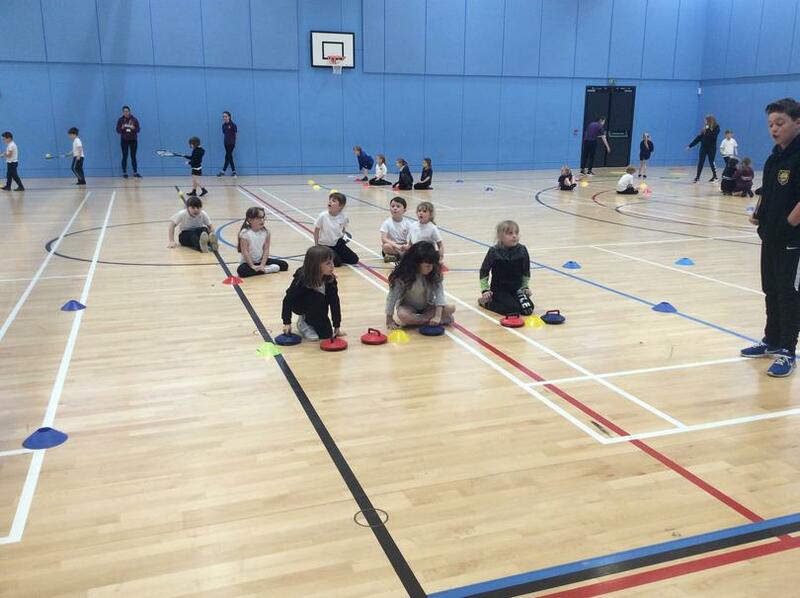 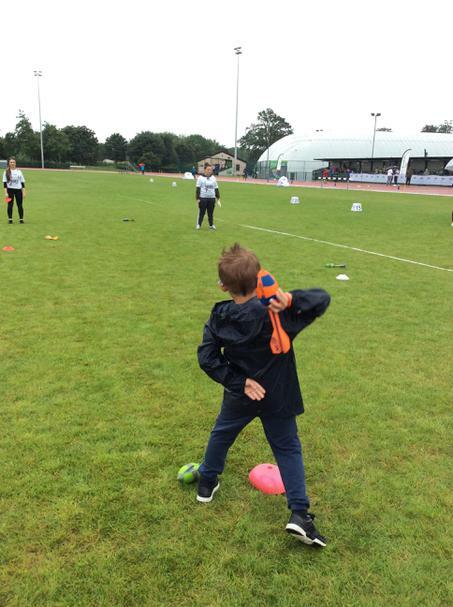 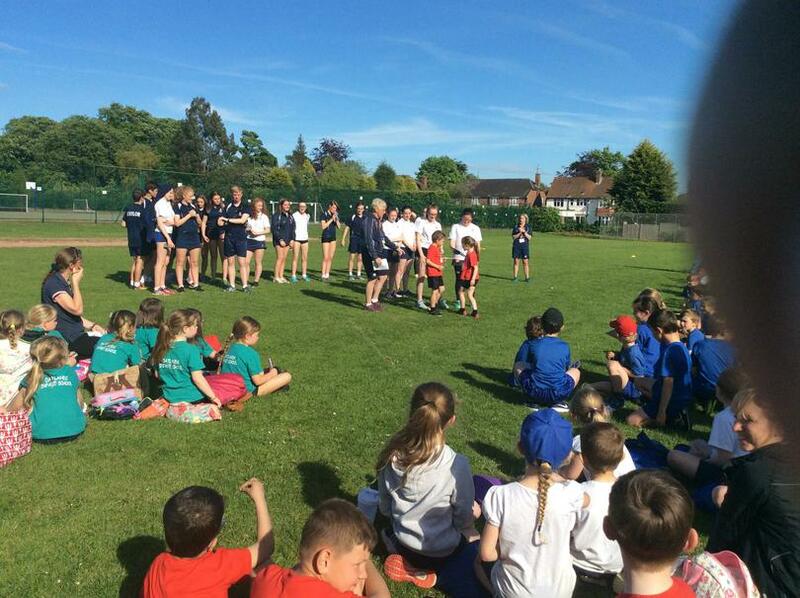 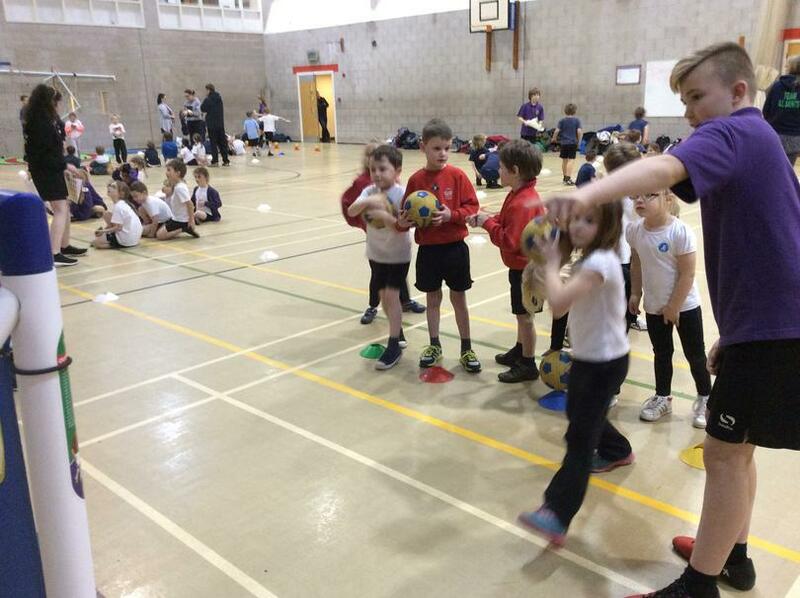 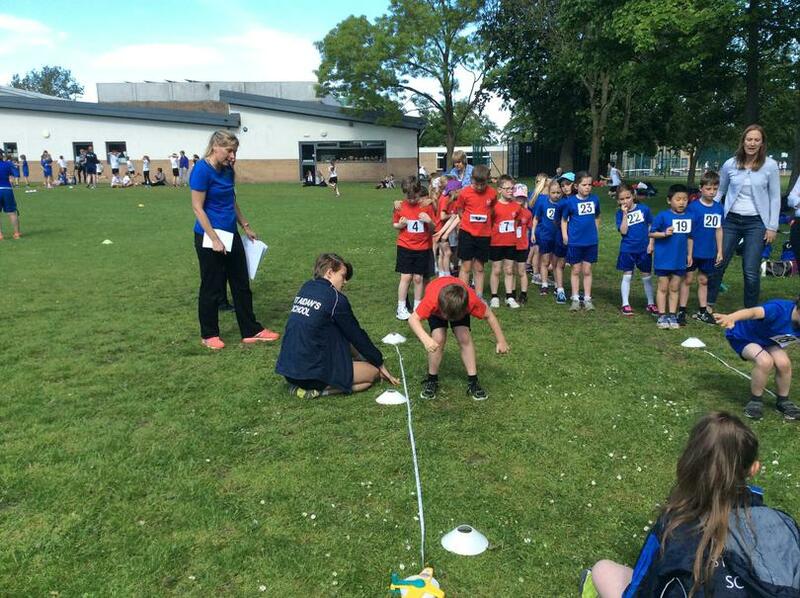 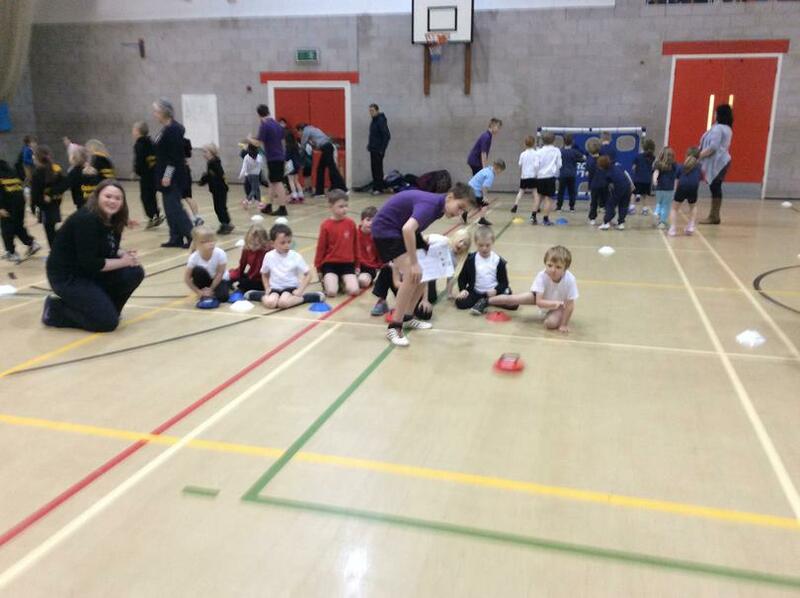 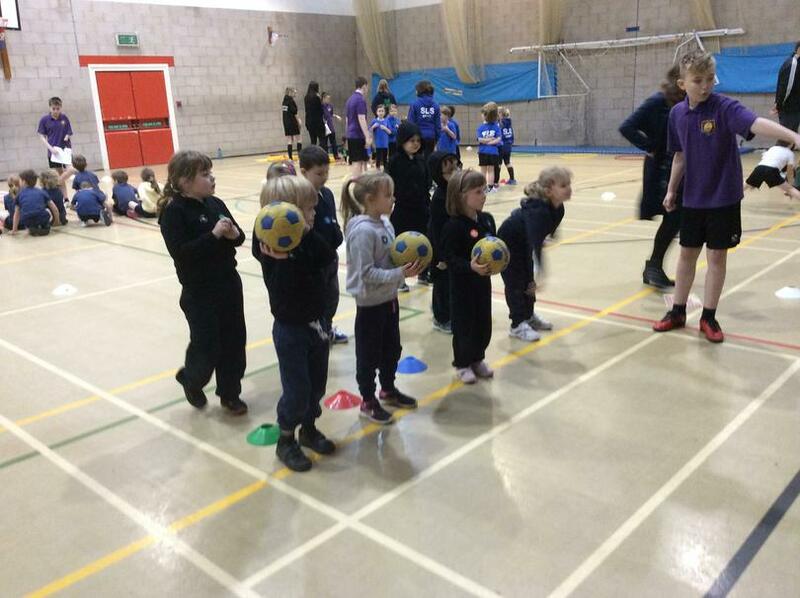 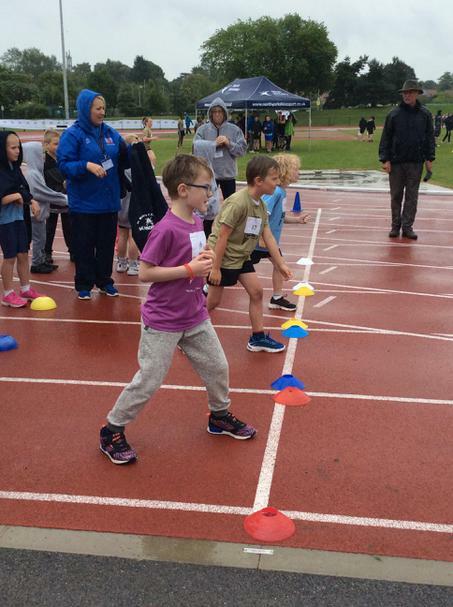 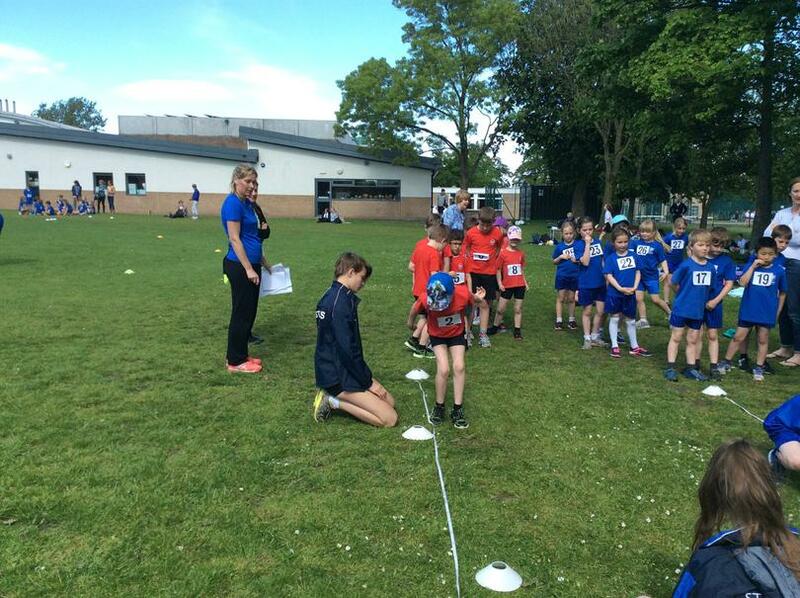 This time the event was held at Harrogate High School where their own Sports Leaders did a great job in showing the children how to take part in some of the exciting sporting activities. 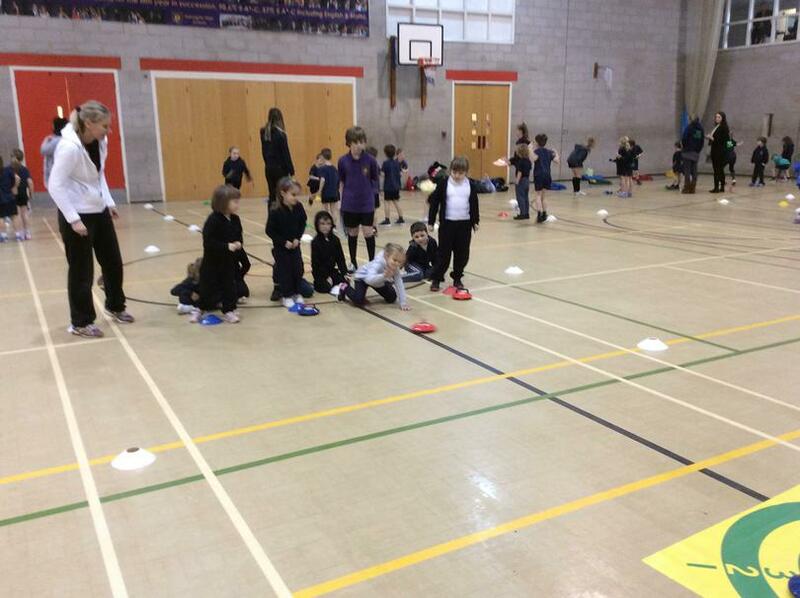 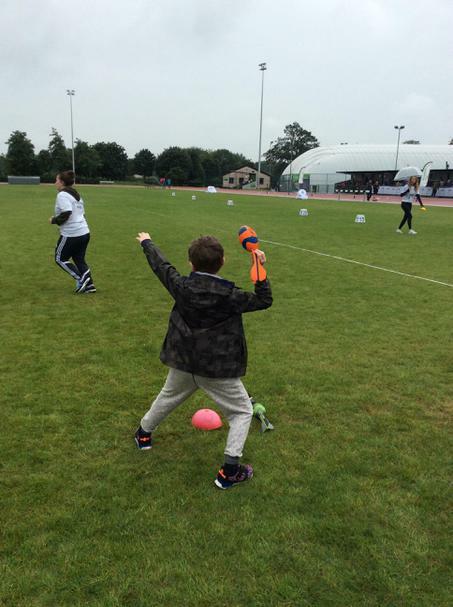 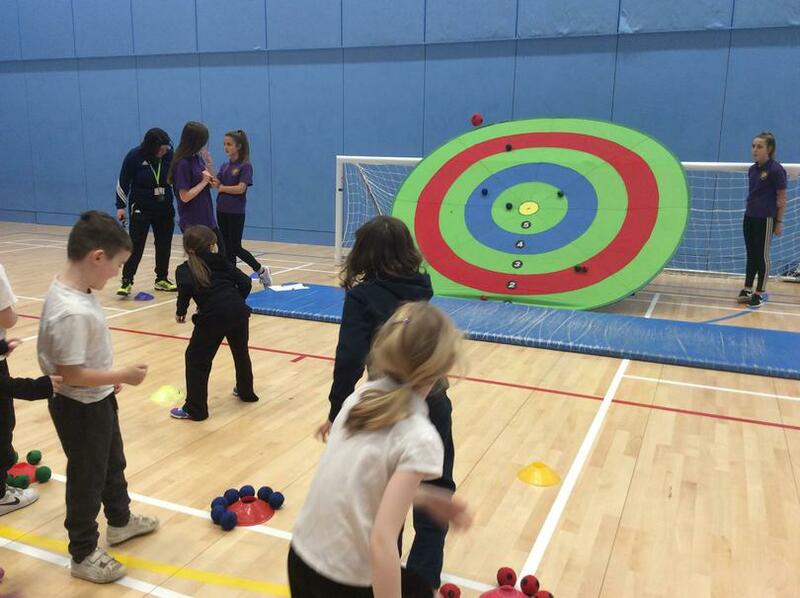 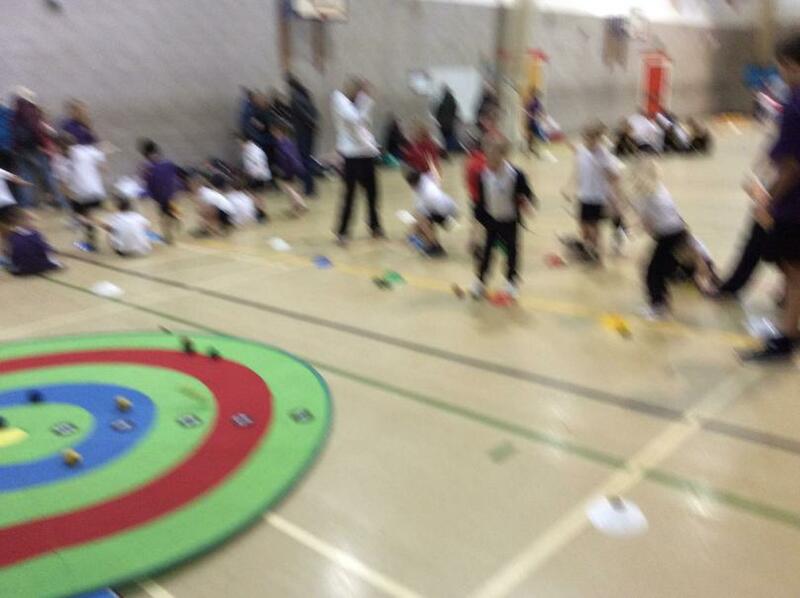 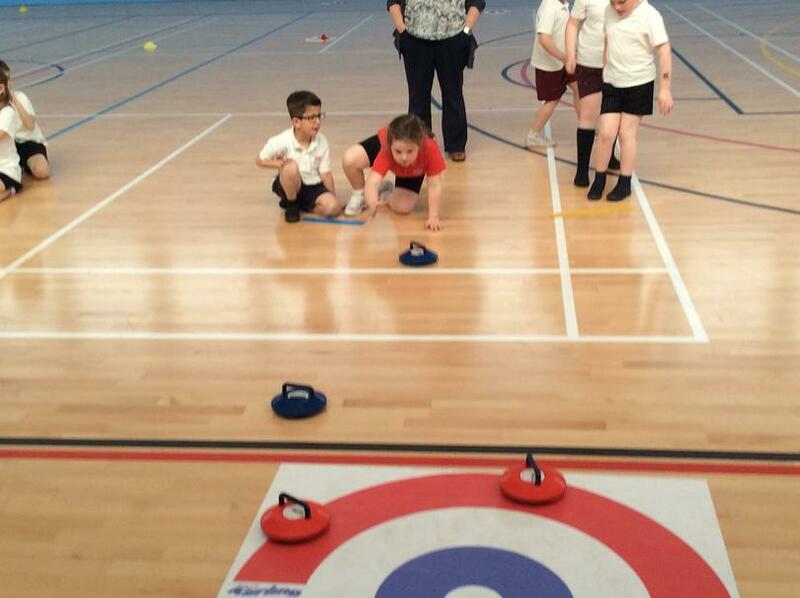 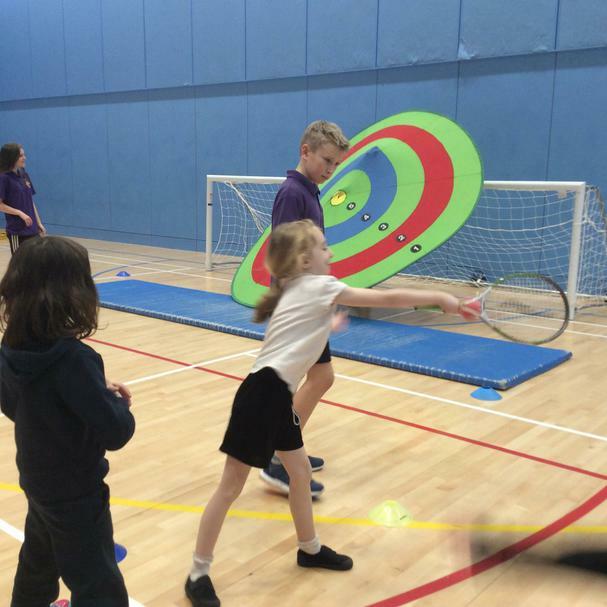 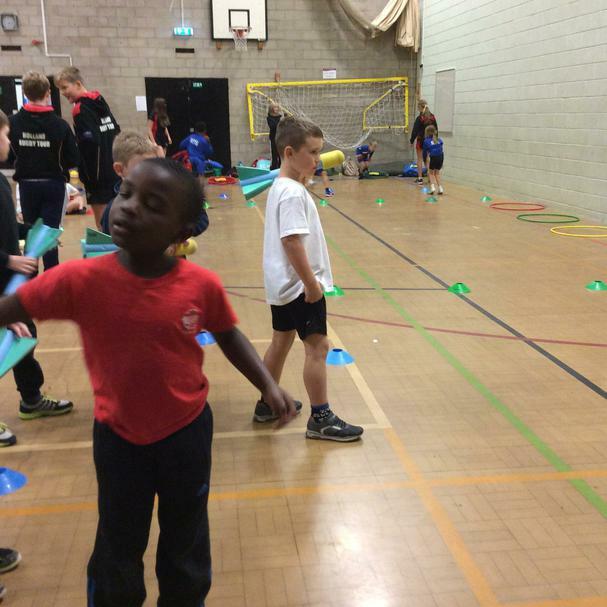 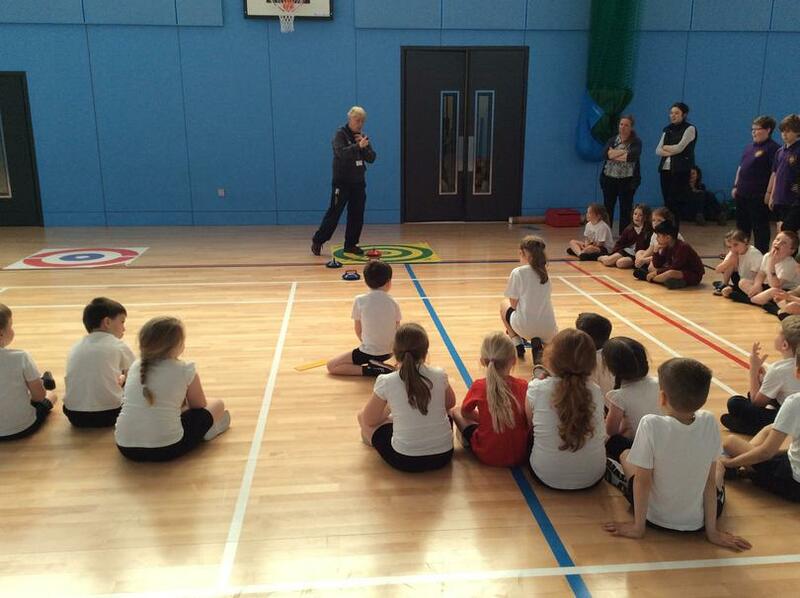 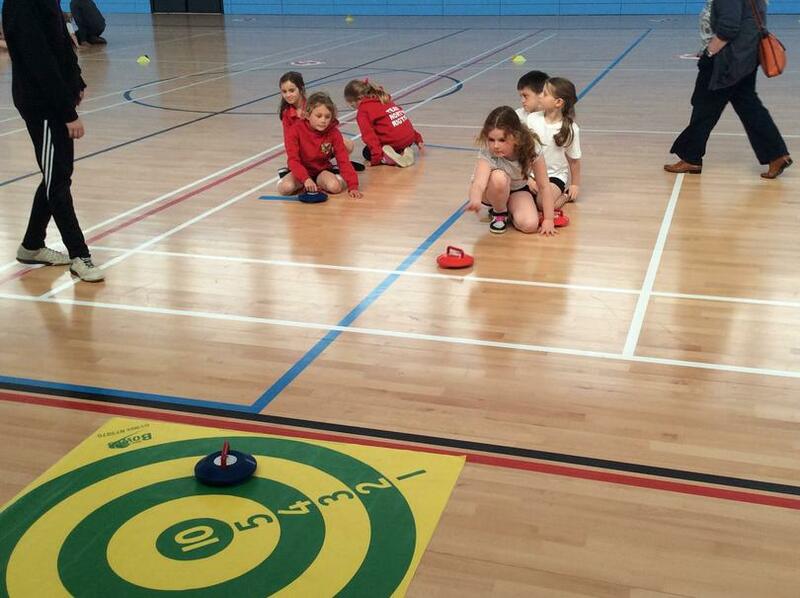 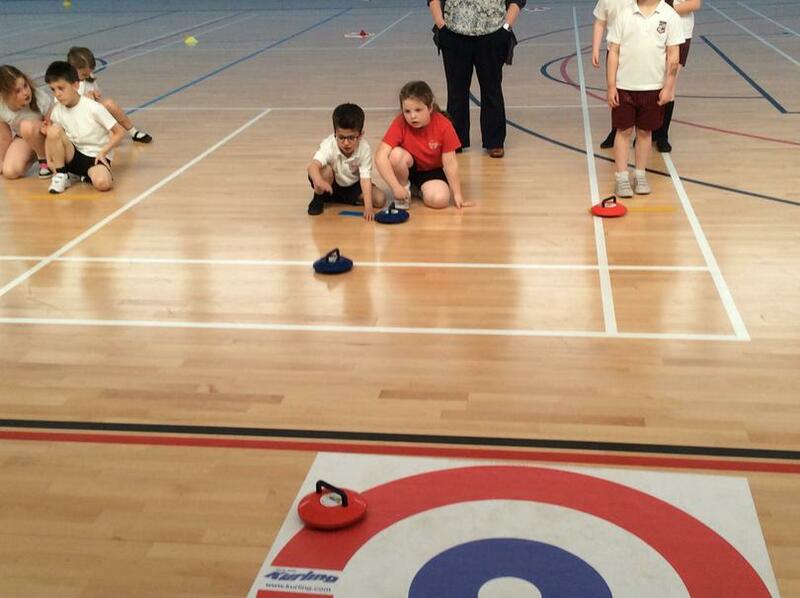 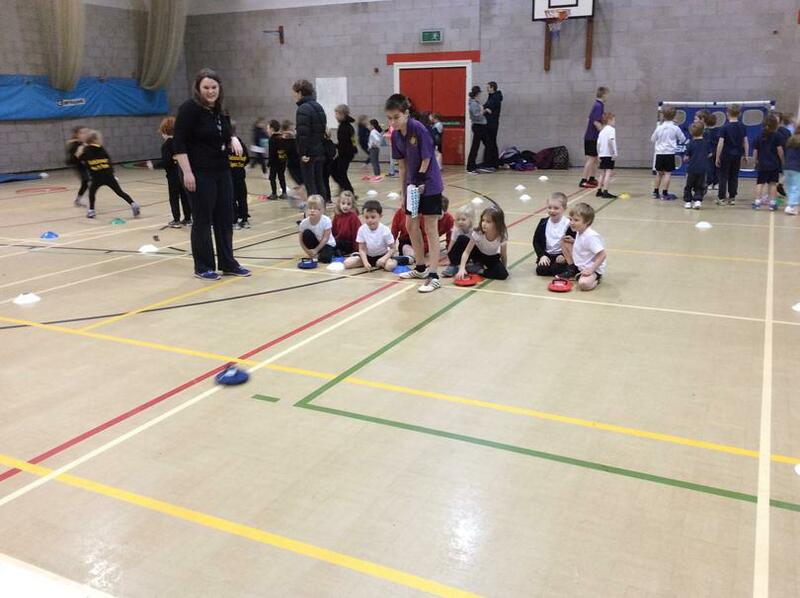 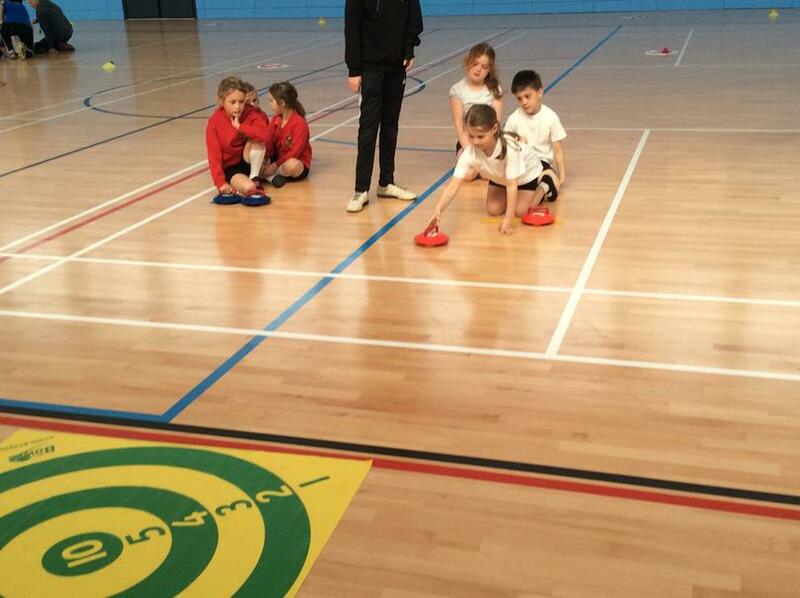 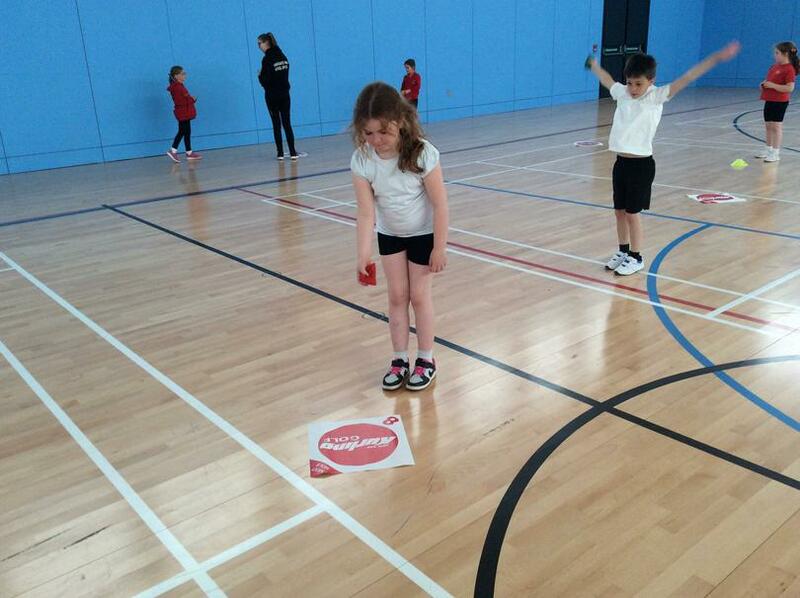 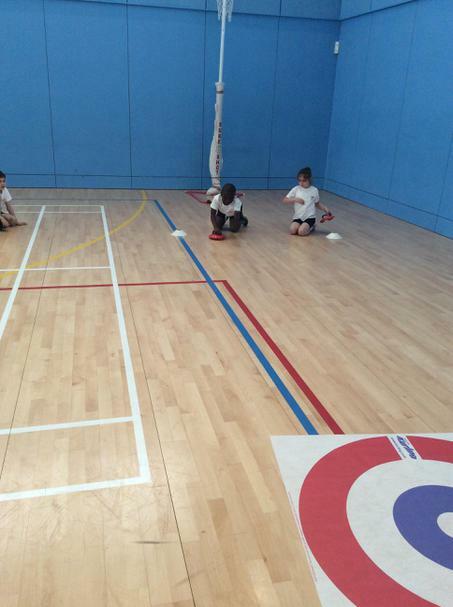 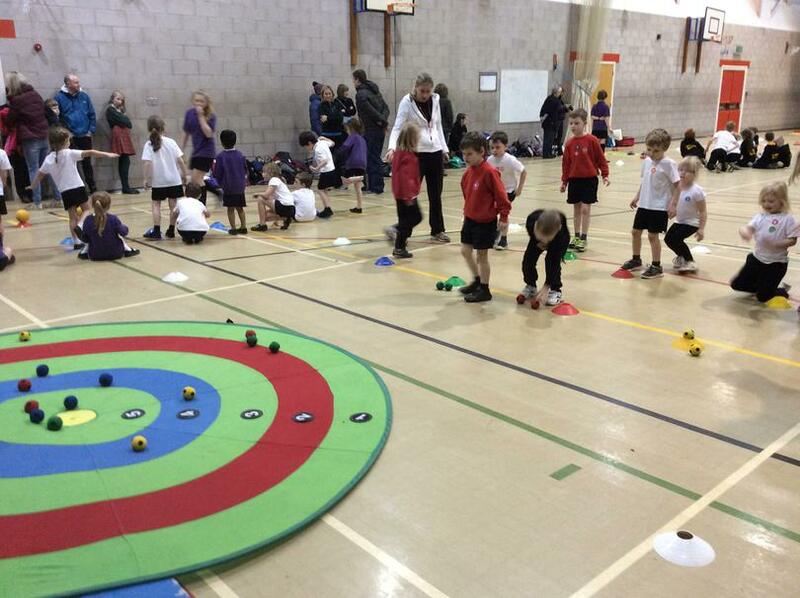 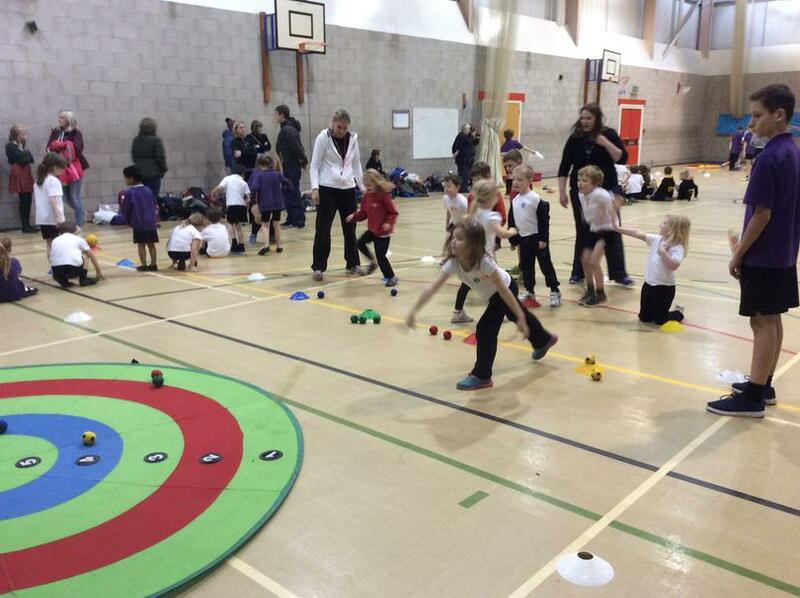 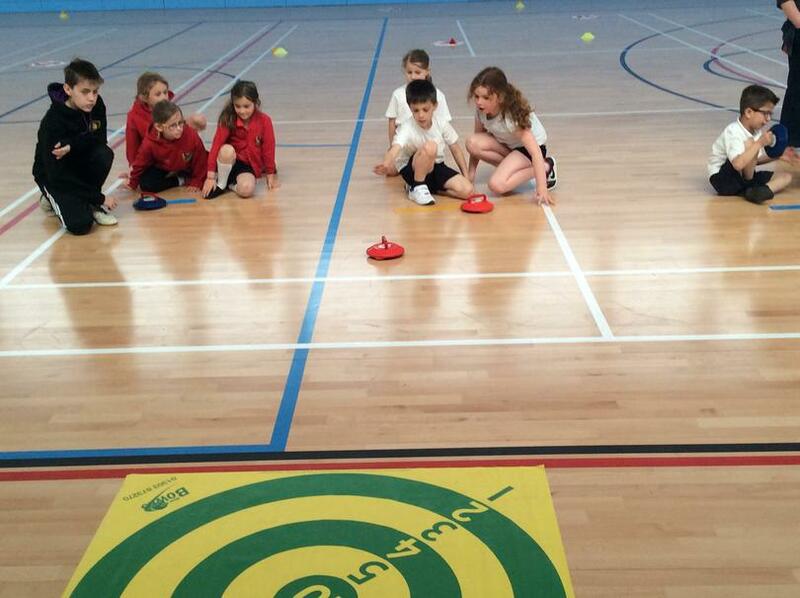 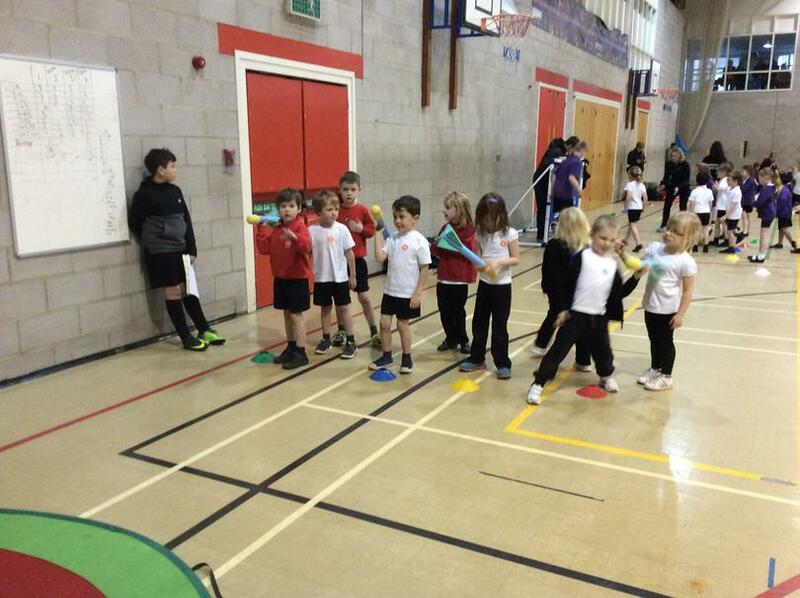 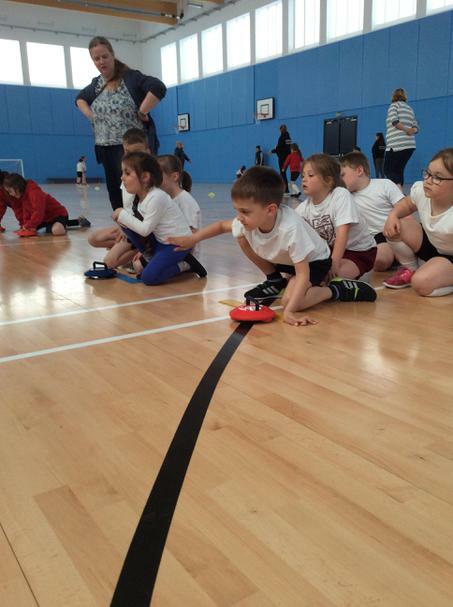 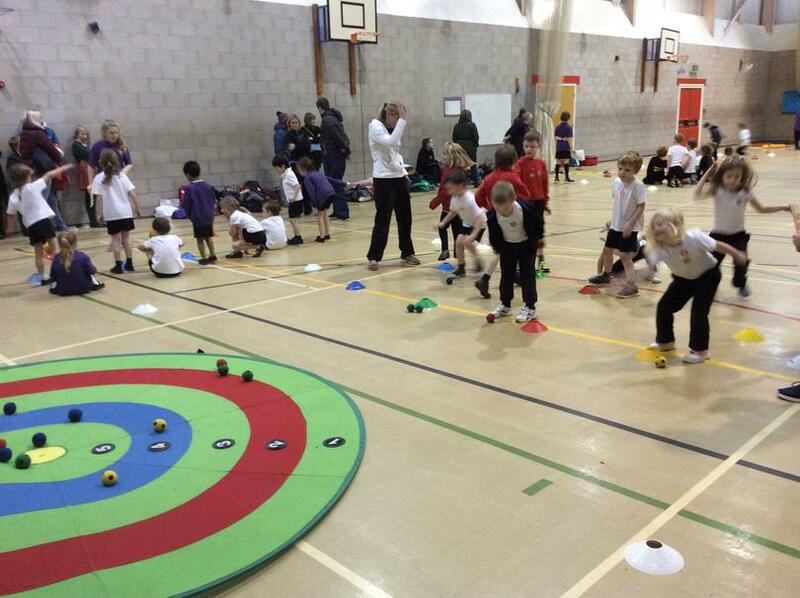 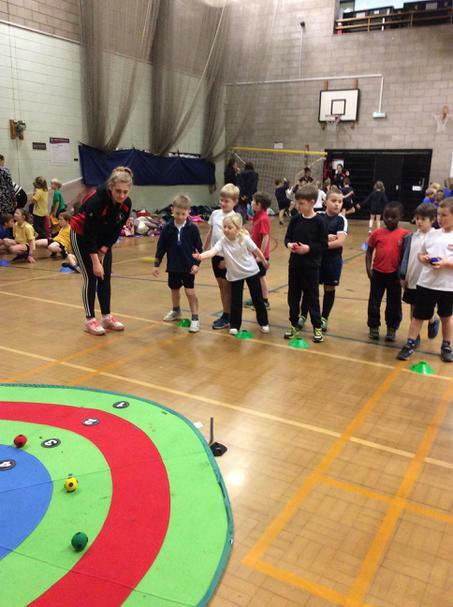 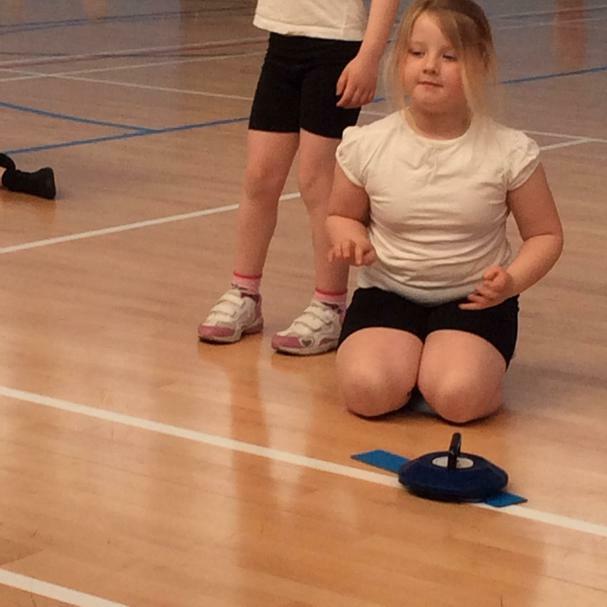 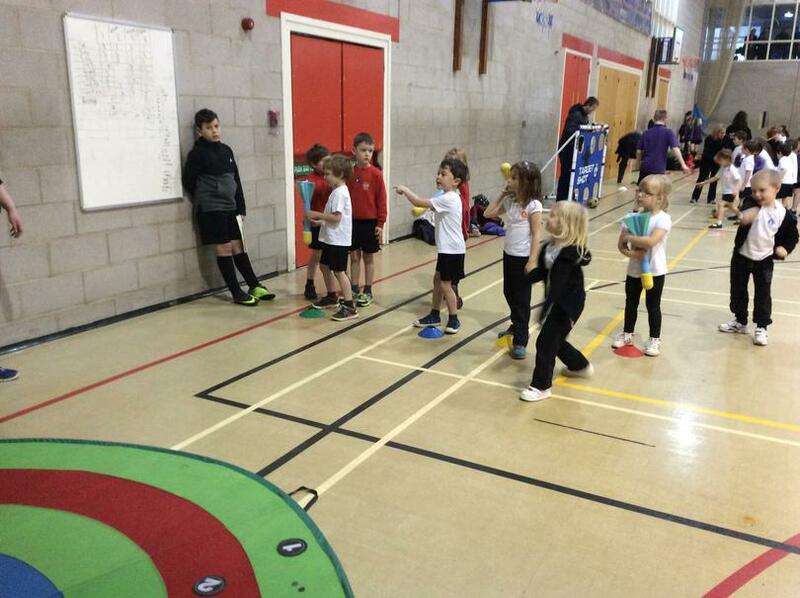 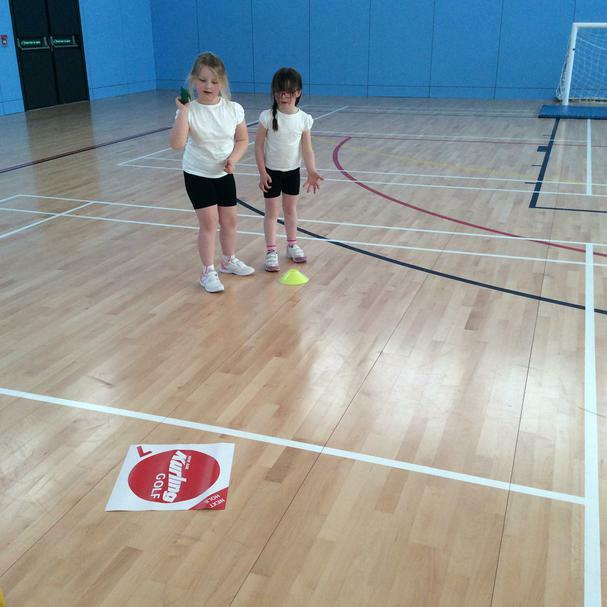 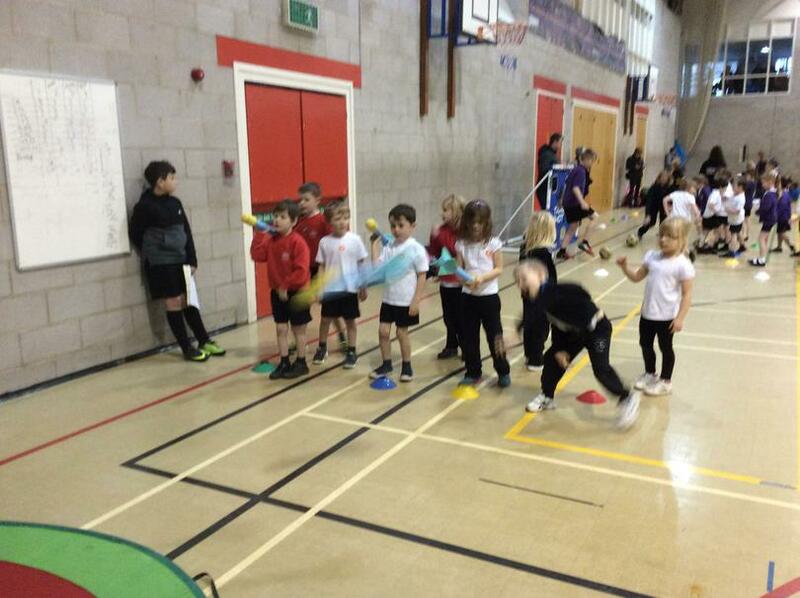 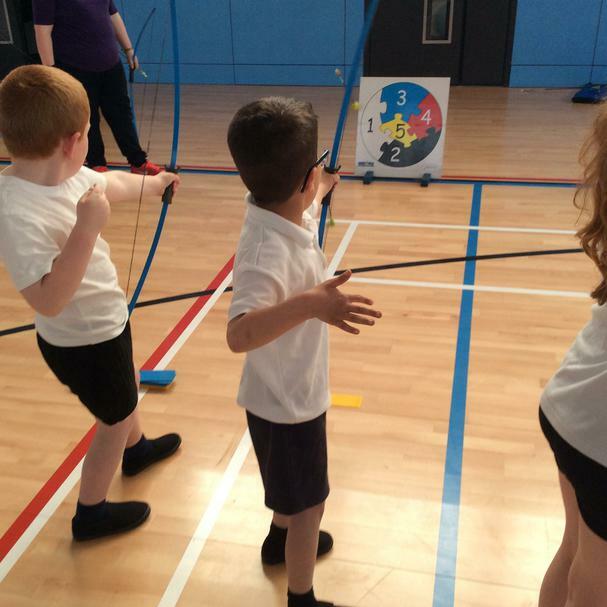 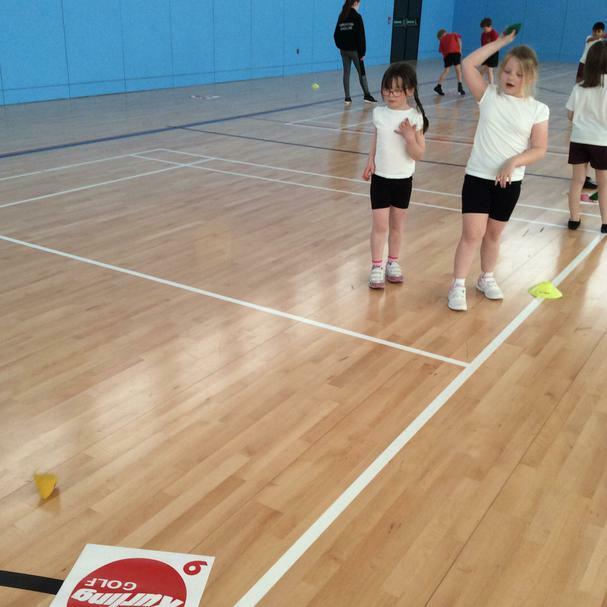 The activities included; Jumping, Bowling, Balancing, Javelin, Curling, Target throwing and Tennis. 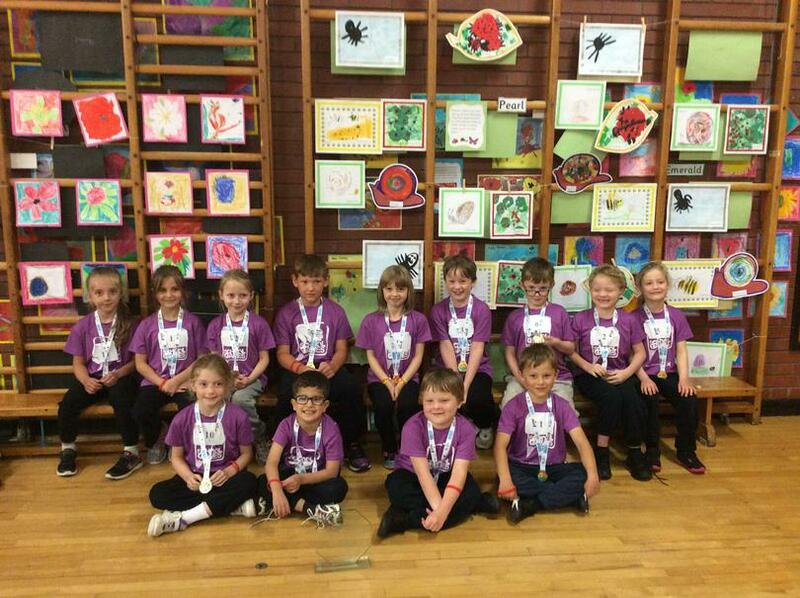 All the children had a fantastic time learning new skills and represented Saltergate Infant School perfectly, we are all so proud of you. 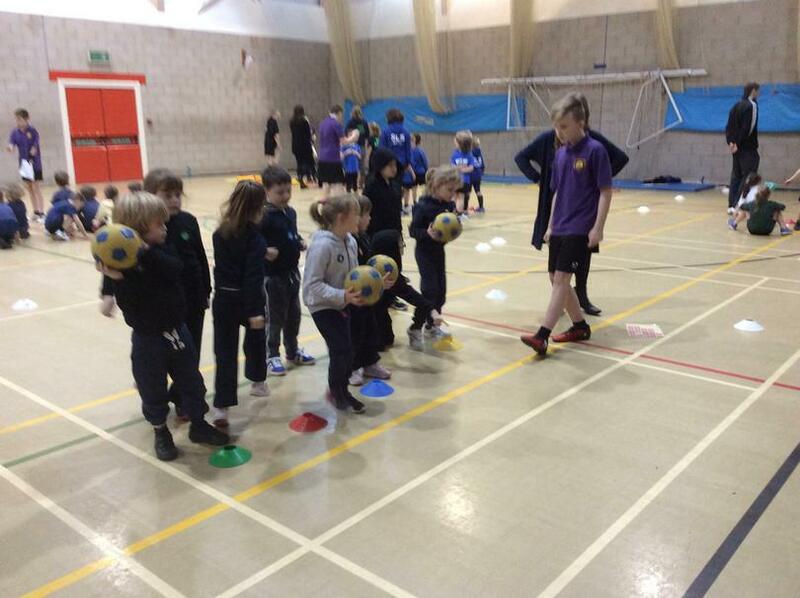 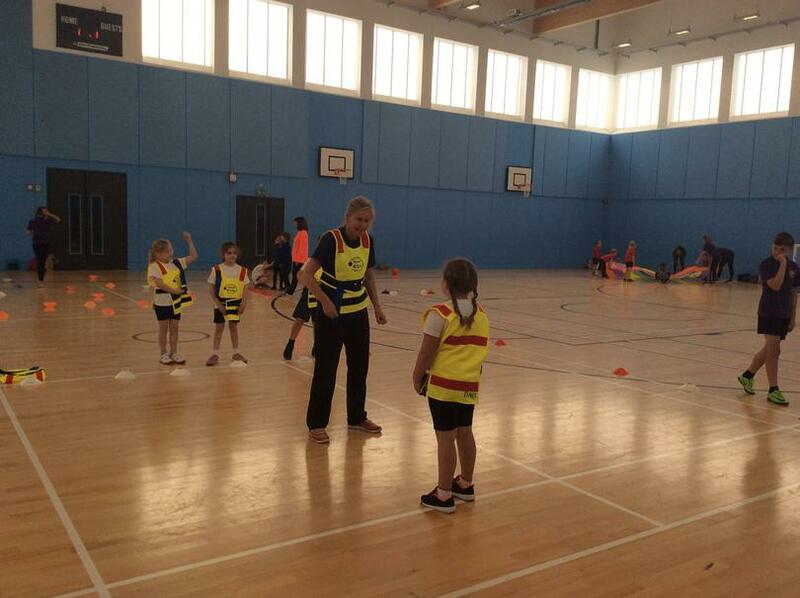 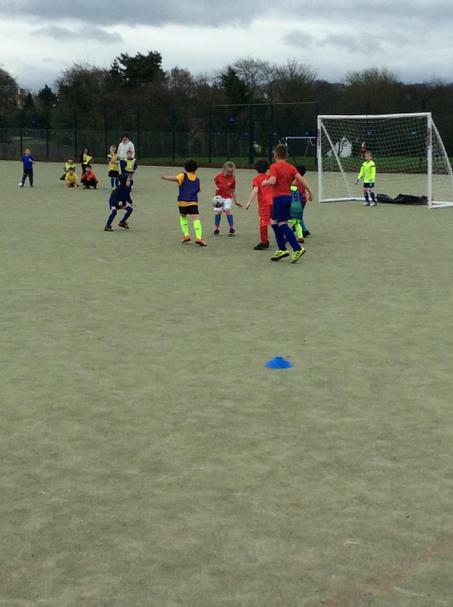 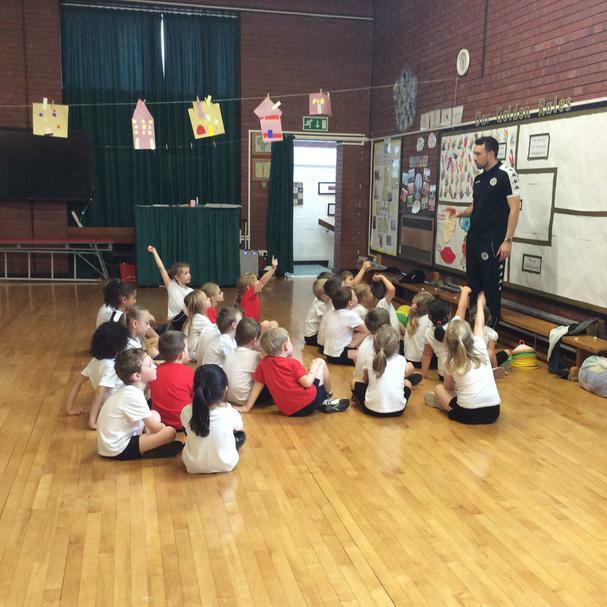 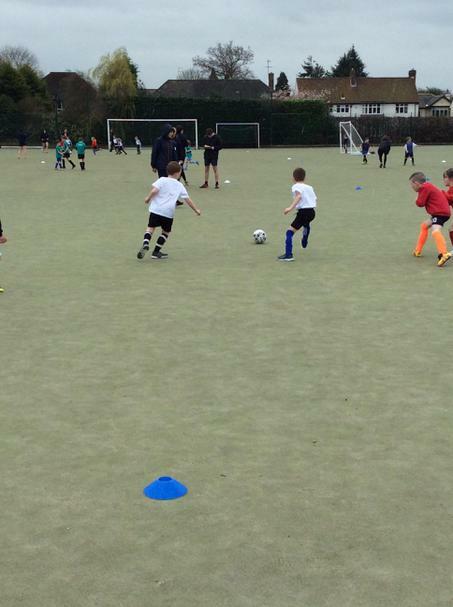 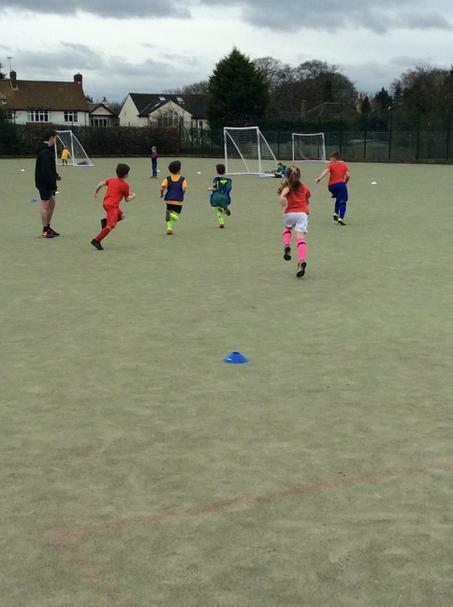 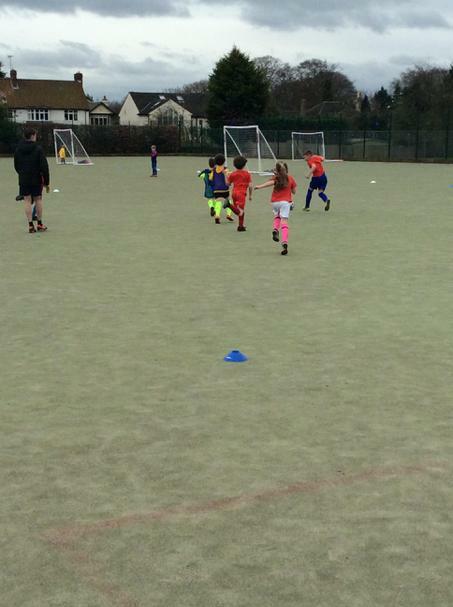 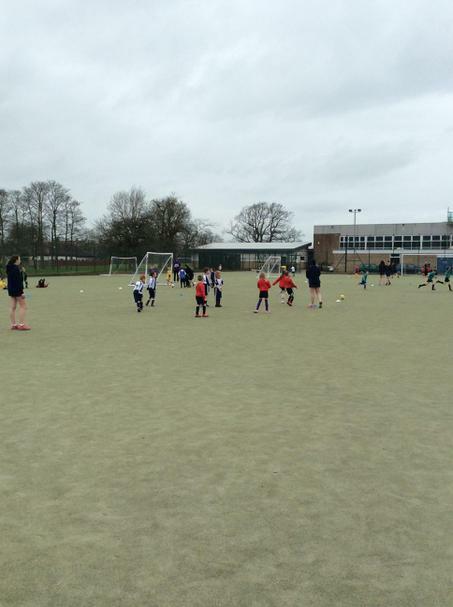 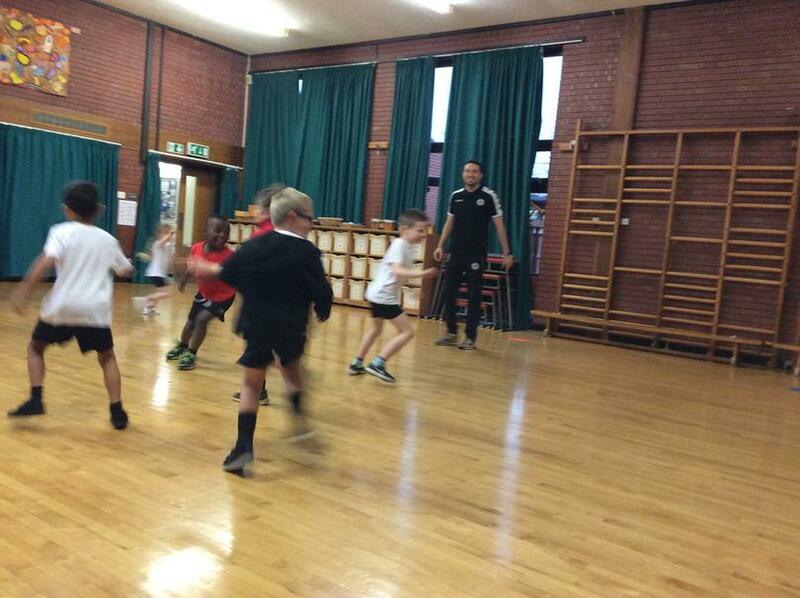 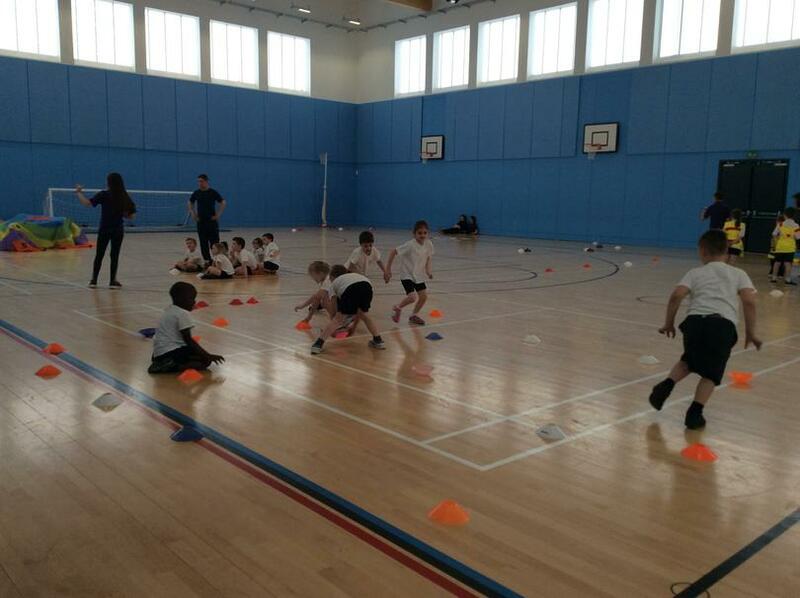 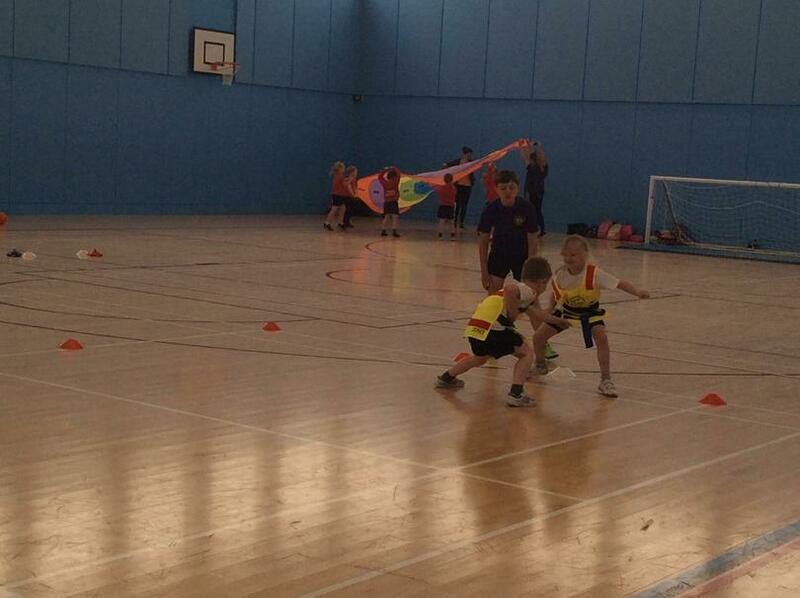 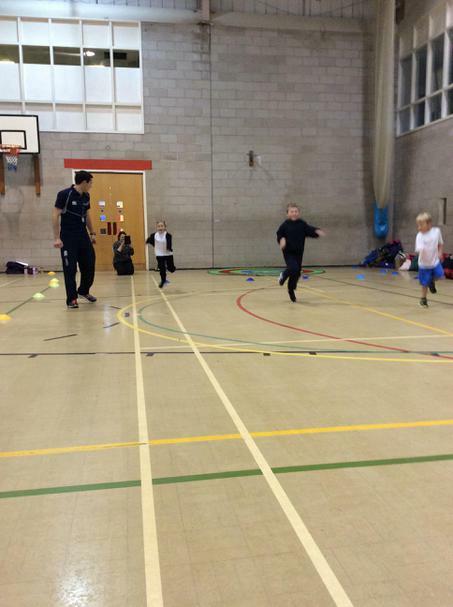 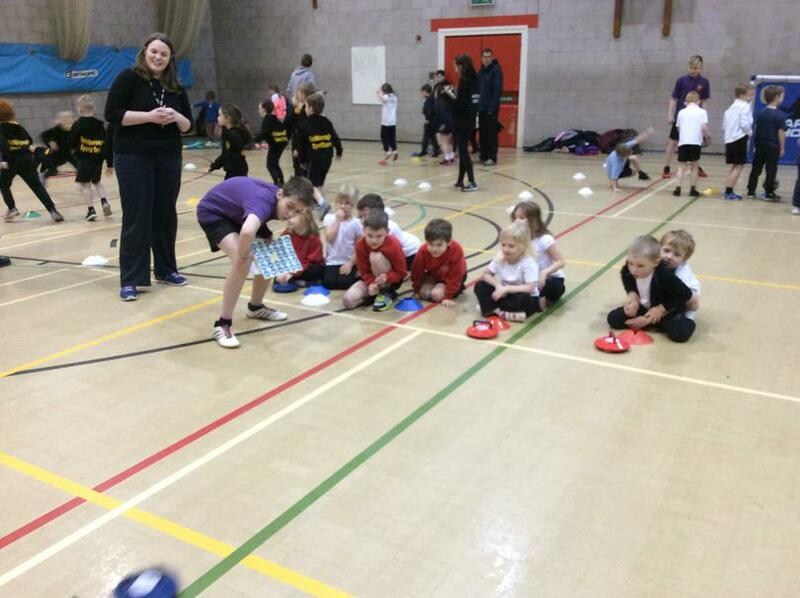 Harrogate town sent in a coach to work with all the Key Stage One children on fundamental movement skills. 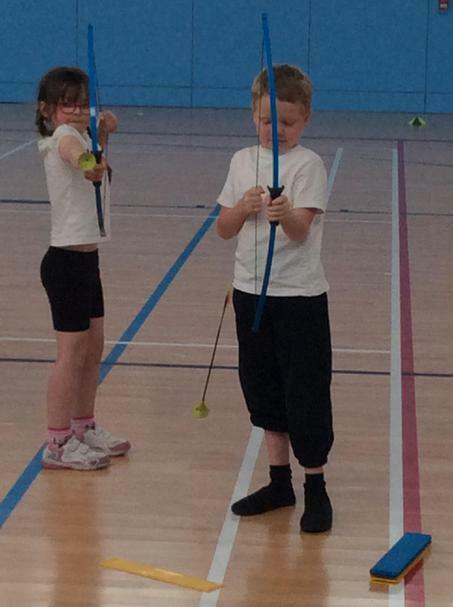 The main aims were to focus and to have control. 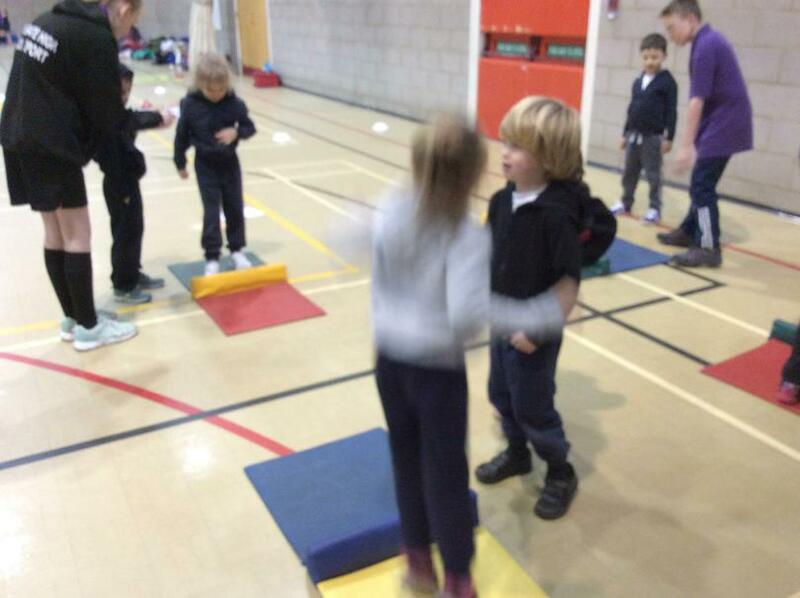 All the children had a wonderful time learning new skills and working well within a team. 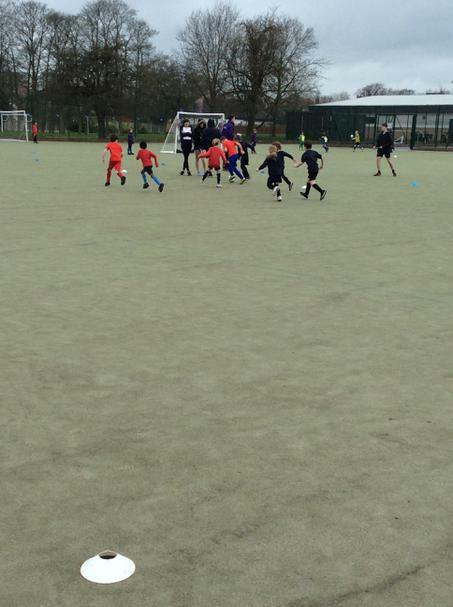 All the children having fun during the visit from the Harrogate Town coach. 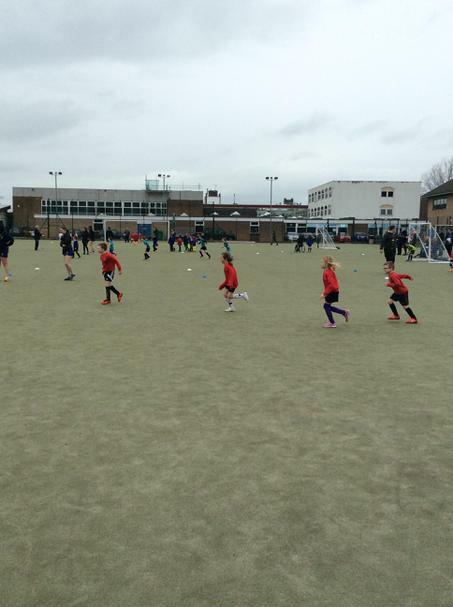 Take a look at some of our wonderful photos from the Harrogate Town visit. 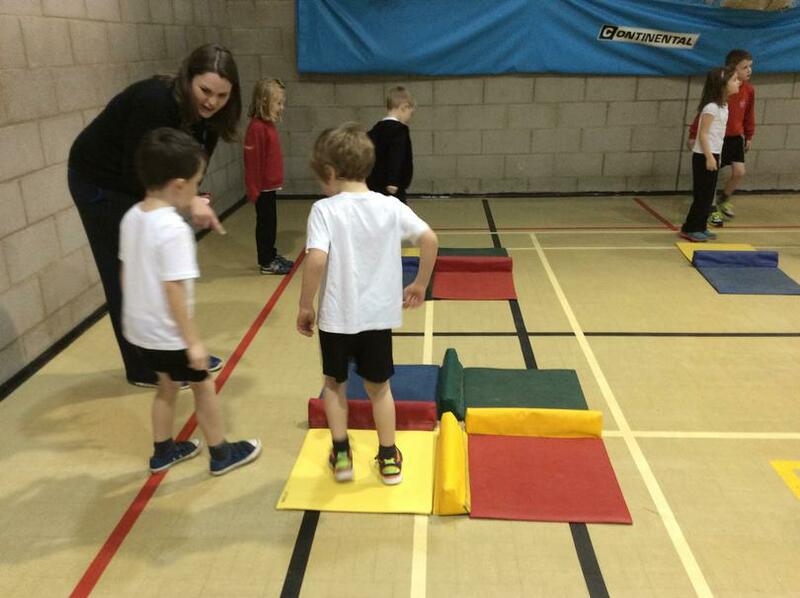 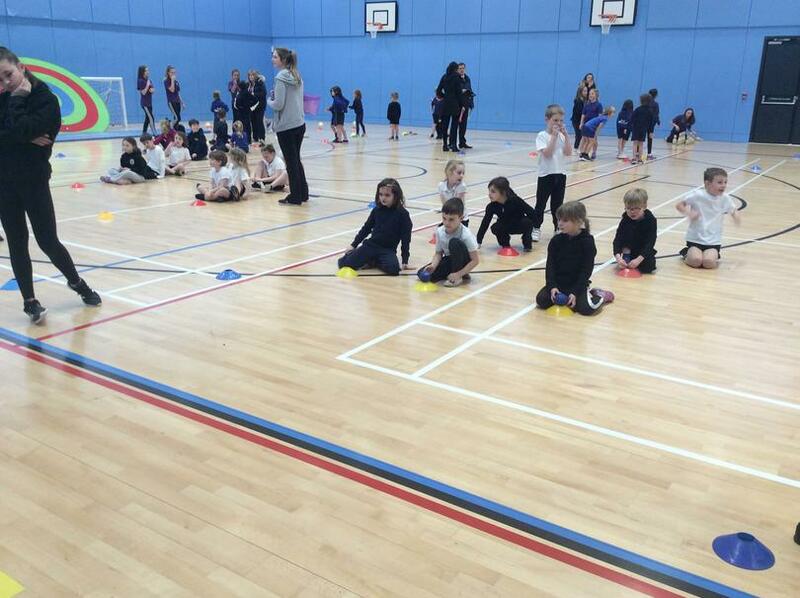 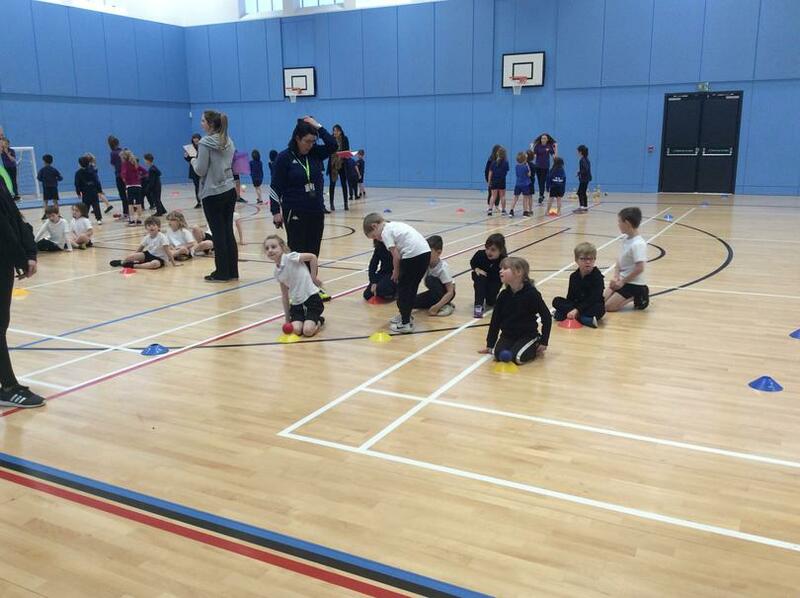 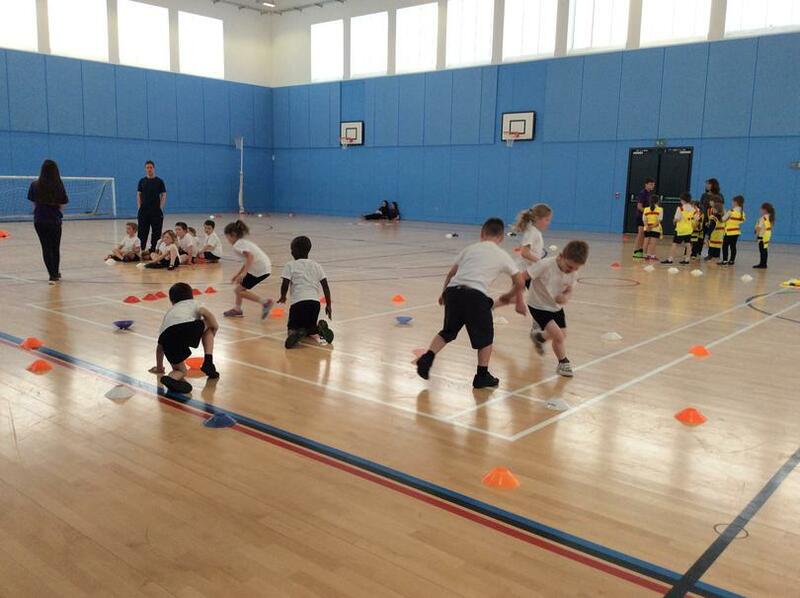 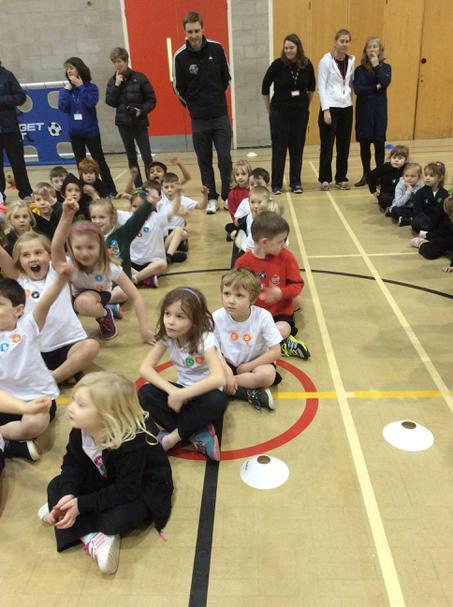 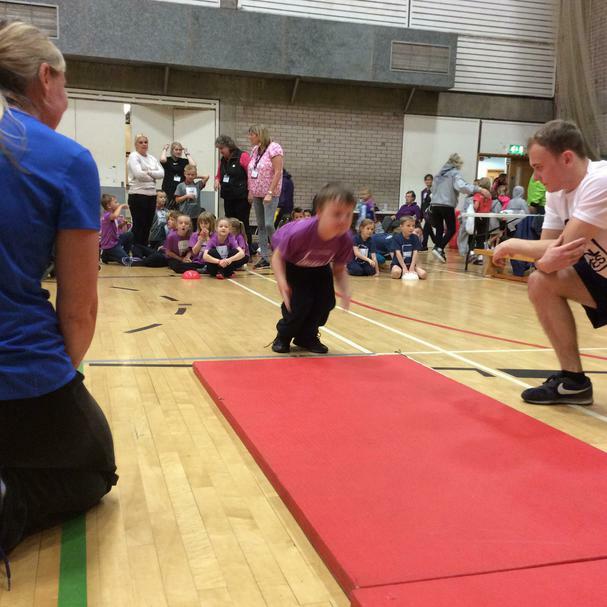 A group of Year two children enjoyed taking part in an Infant Agility Festival hosted by Harrogate Schools Sports Partnership. 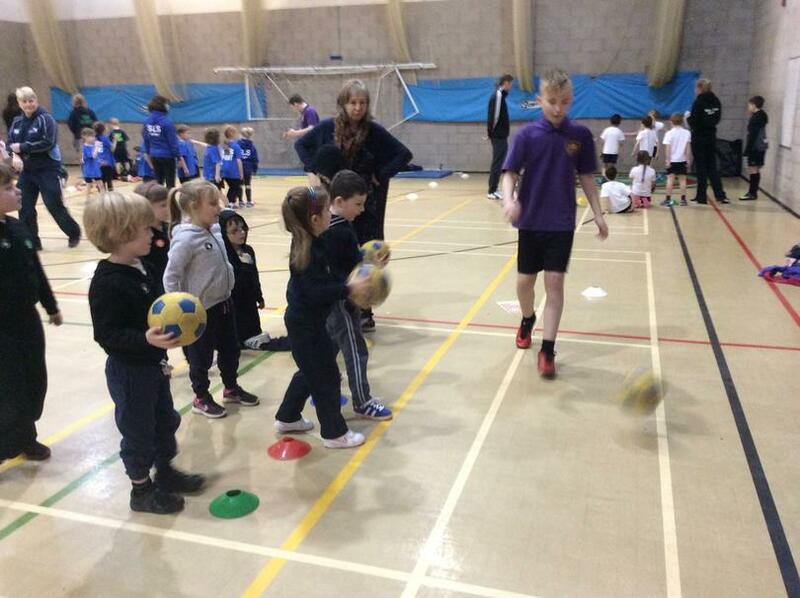 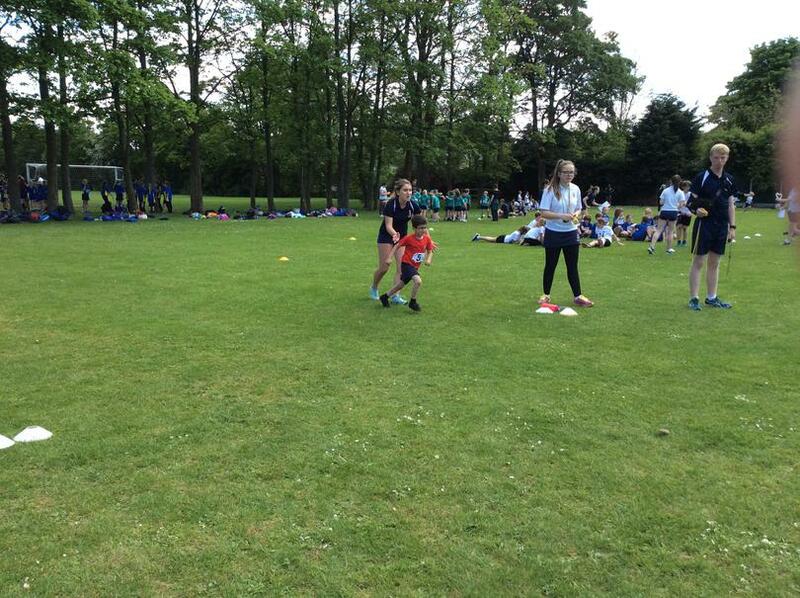 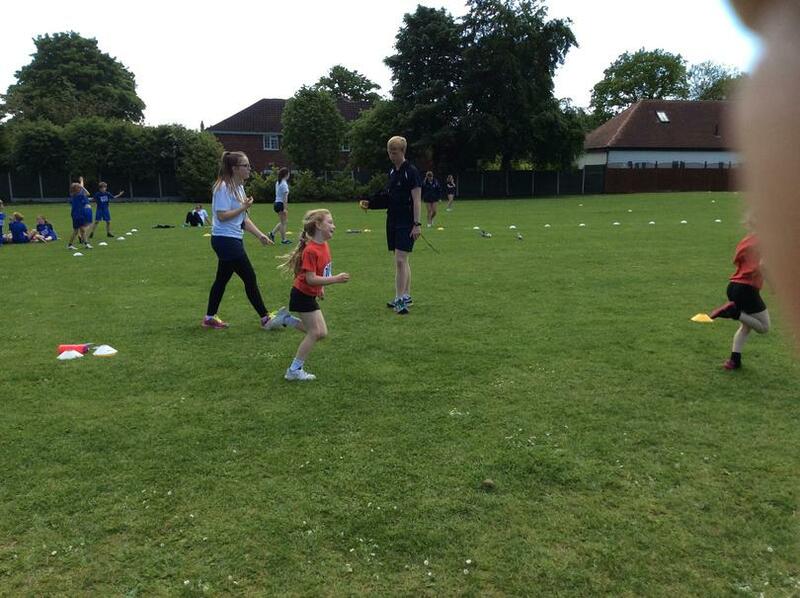 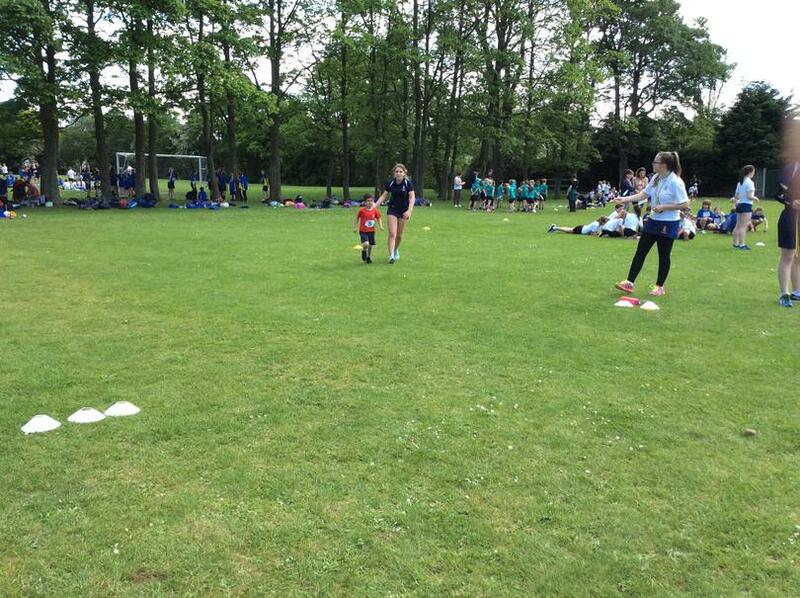 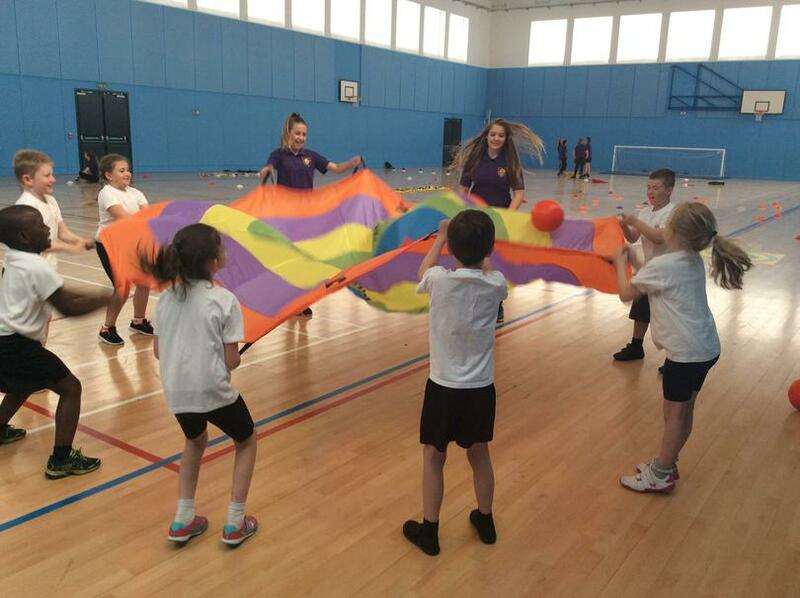 Many sports leaders from Harrogate Grammar School helped support the children with a range of activities. 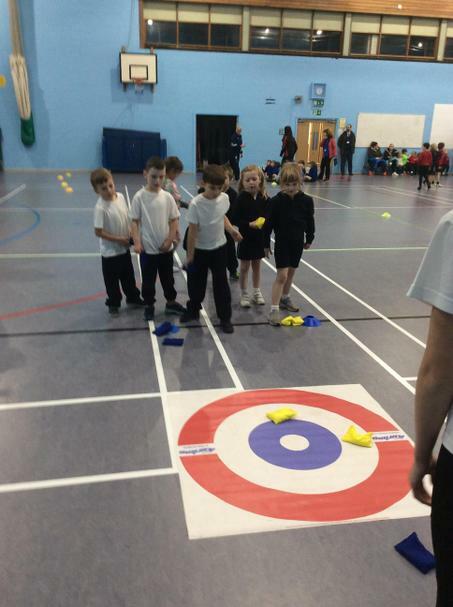 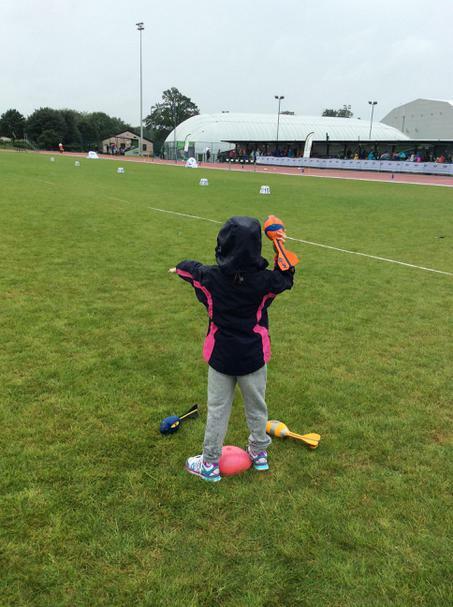 These included curling, target throwing and team relay games. 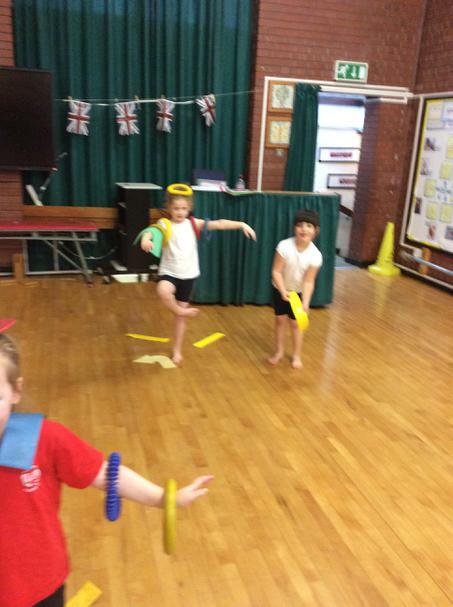 All of the children had a wonderful time. 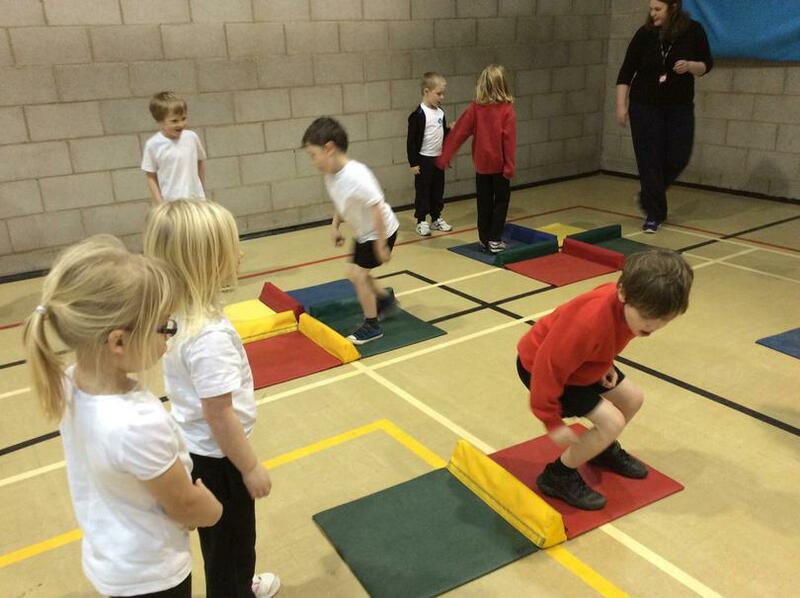 Have a look at some of our wonderful pictures from The Infant Agility Festival. 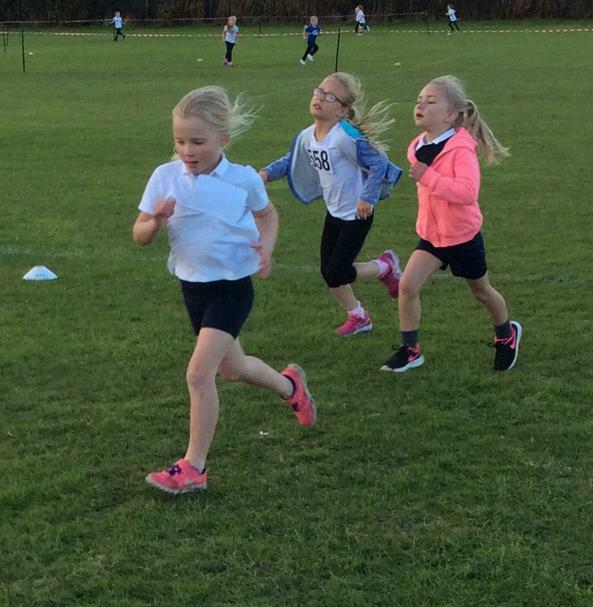 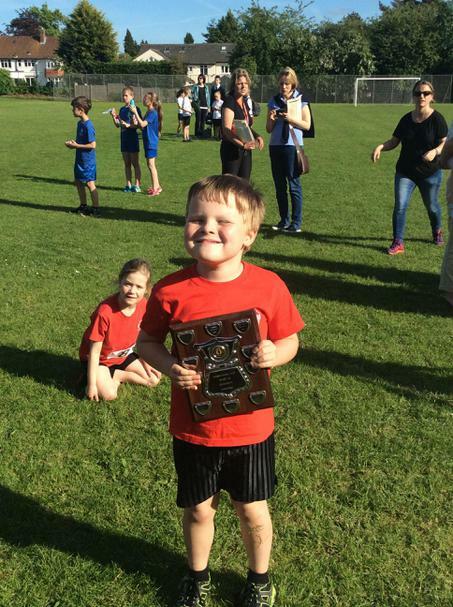 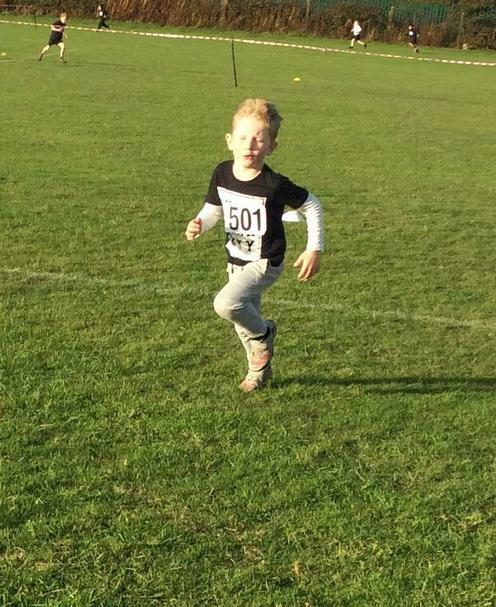 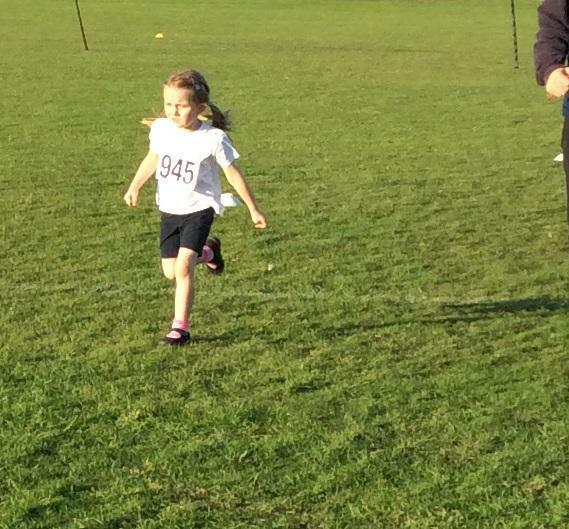 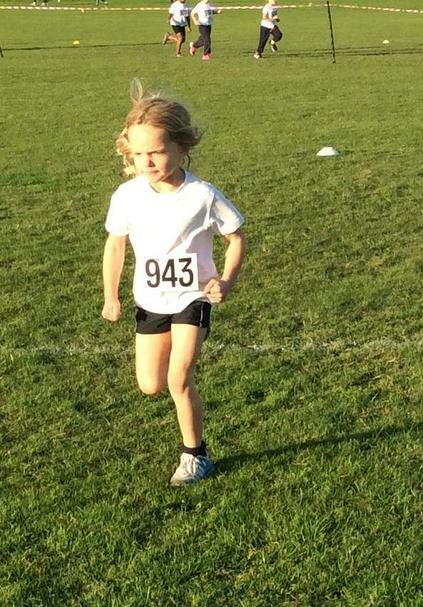 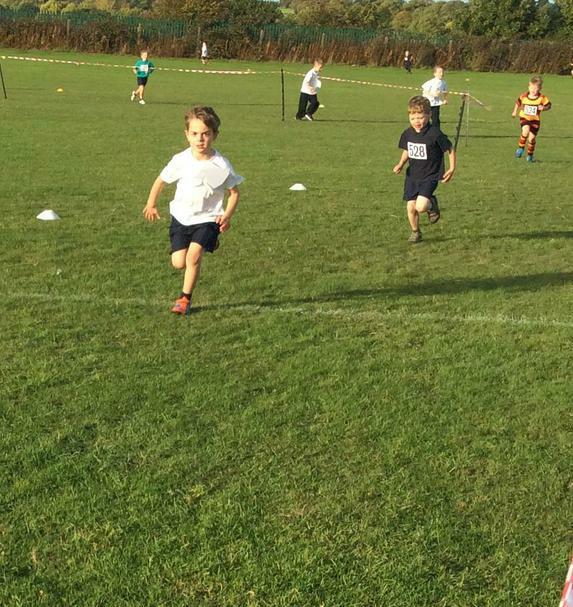 Twenty four children from Saltergate Infant School took part in the annual Harrogate Schools Sports Partnership Cross Country competition. 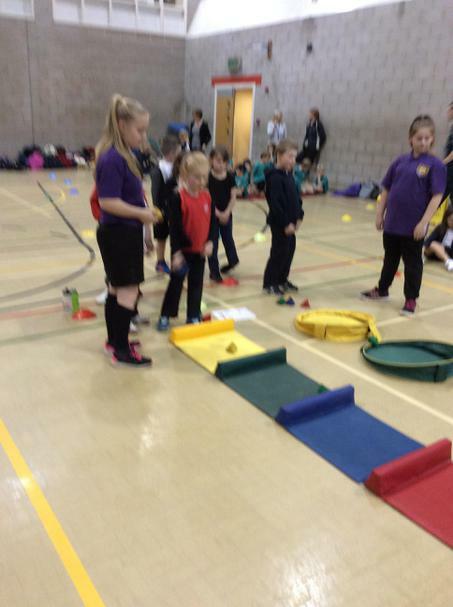 They all had a wonderful time and were fabulous ambassadors for the school. 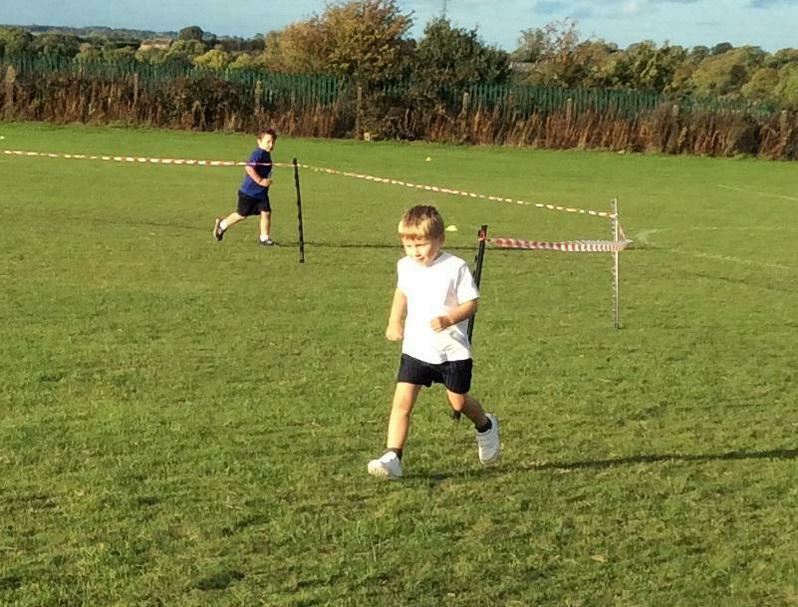 We even had one child who finished second overall in their race. 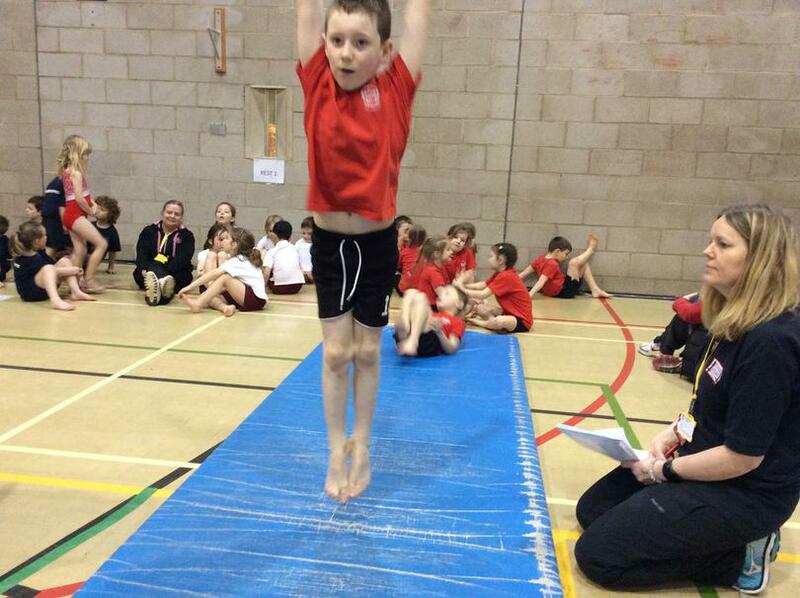 Well done to all of the competitors, we are very proud of you. 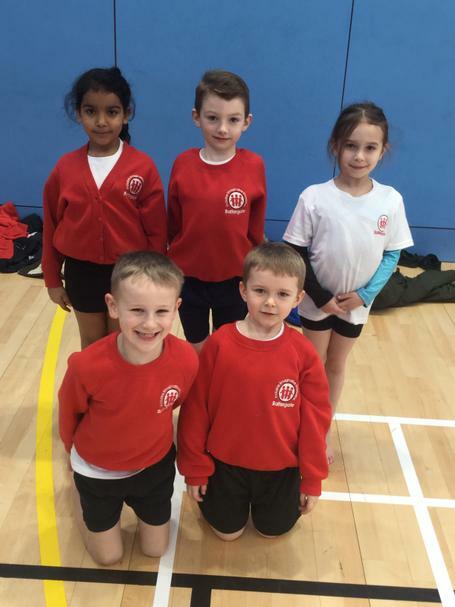 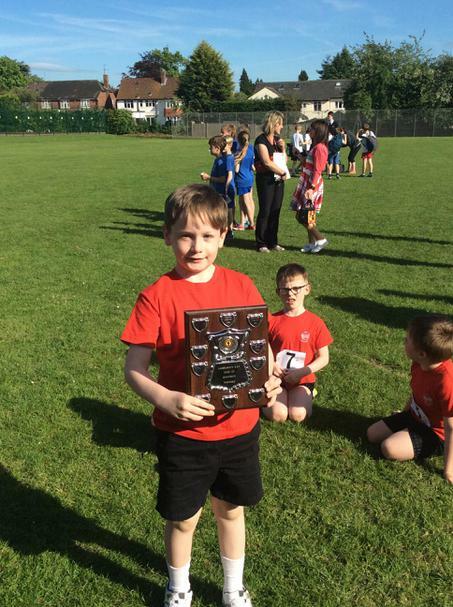 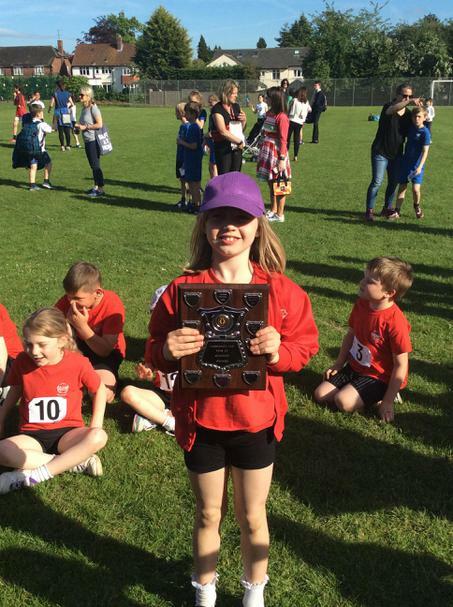 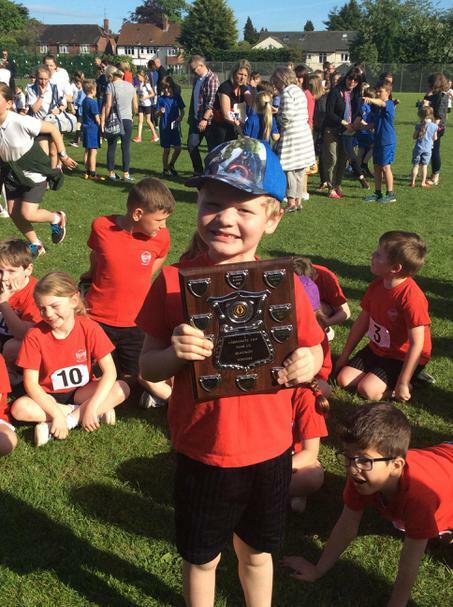 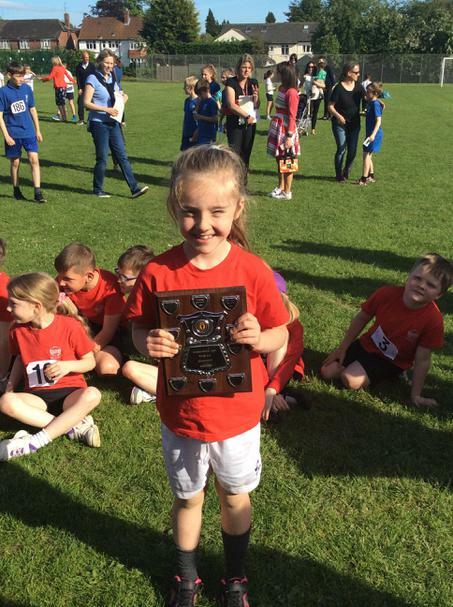 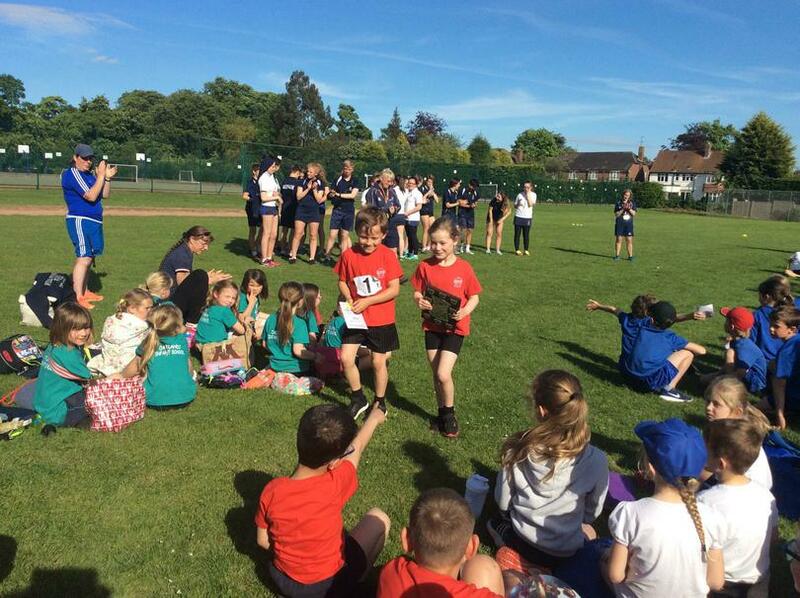 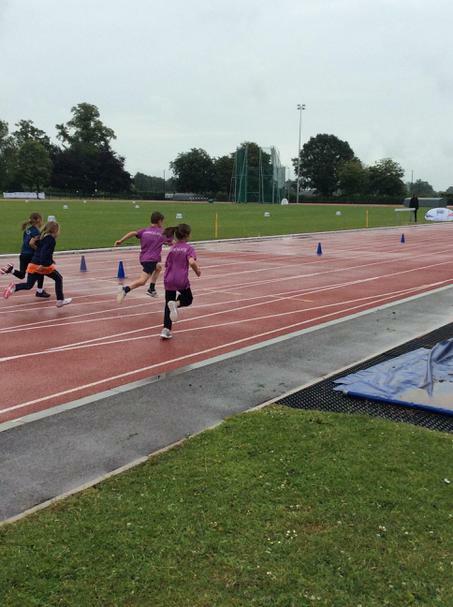 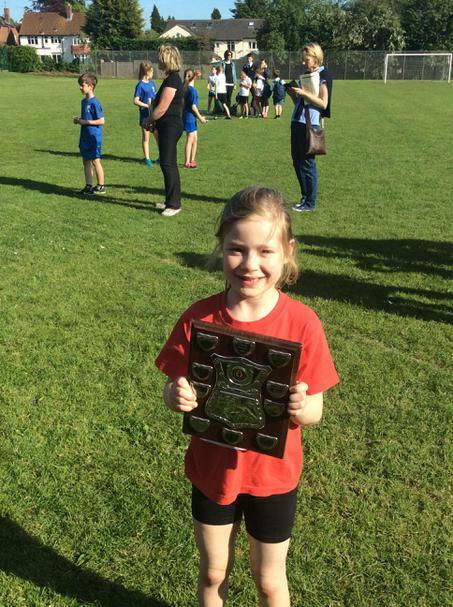 Following on from the great success of the Year Two Quadkids competition in Harrogate the same children were selected to go and represent the school and Harrogate in the North Yorkshire Finals. 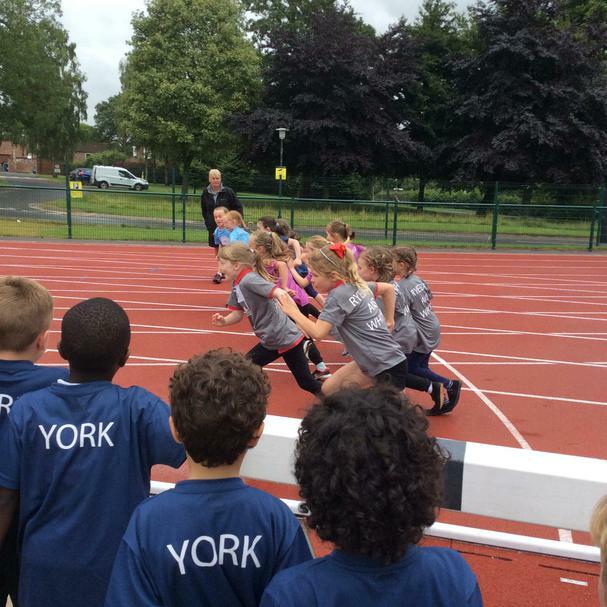 The finals were held at the University of York and each child was provided with a lovely Harrogate T-shirt to wear for the day, they were also allowed to keep the T-shirts too. 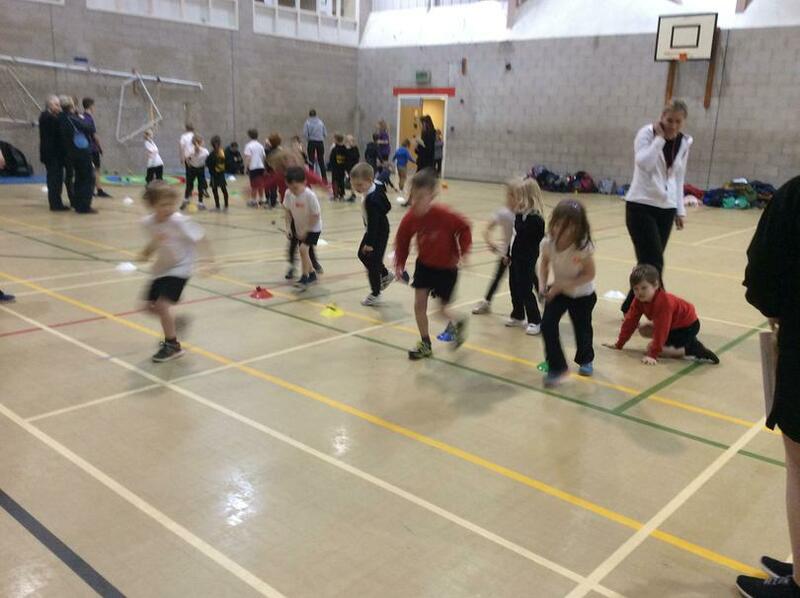 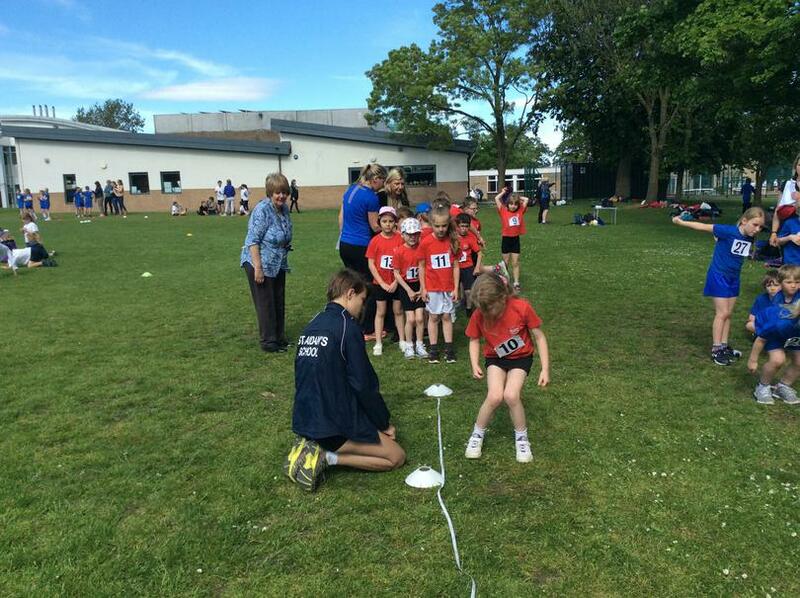 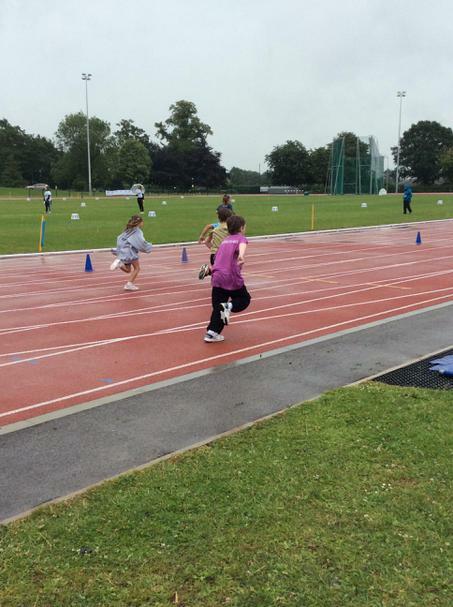 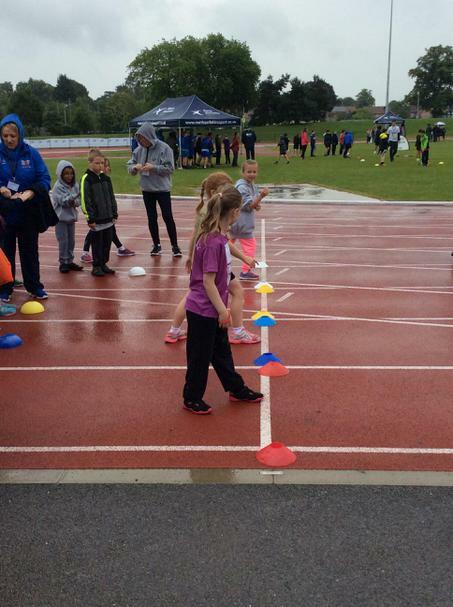 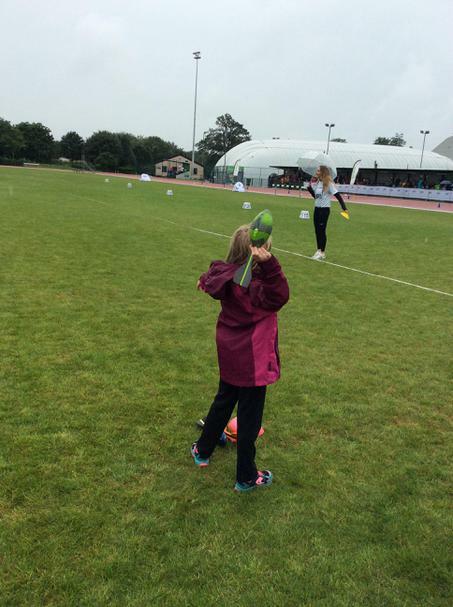 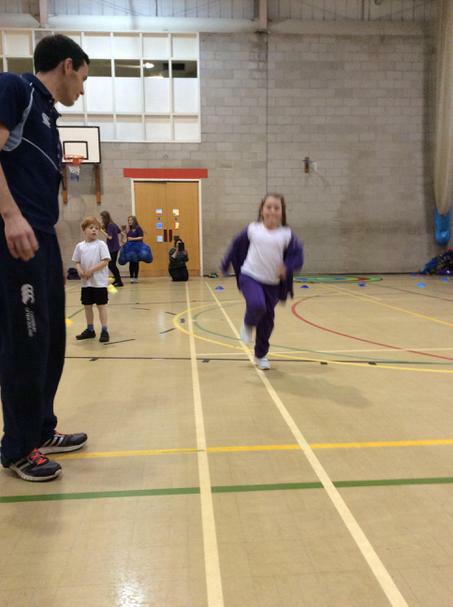 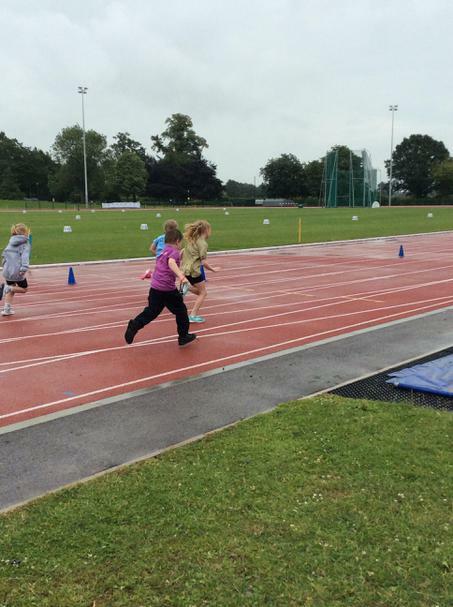 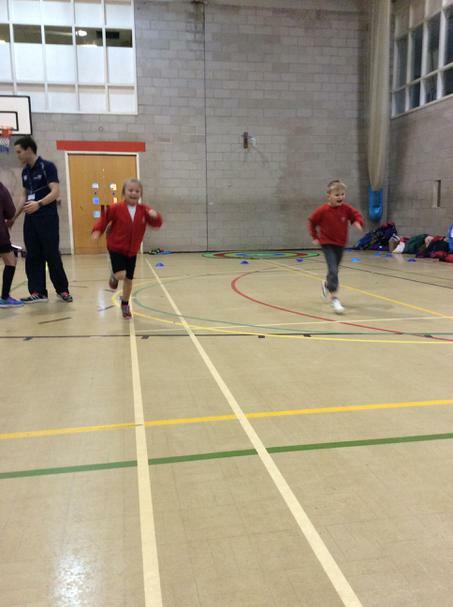 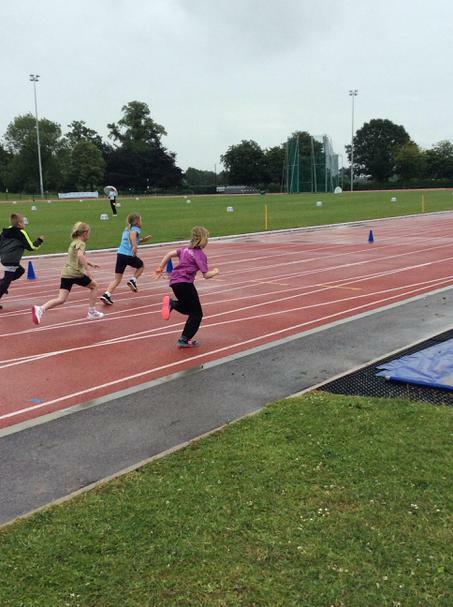 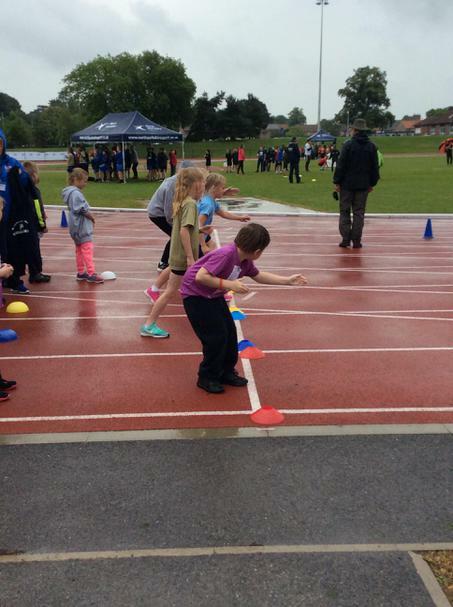 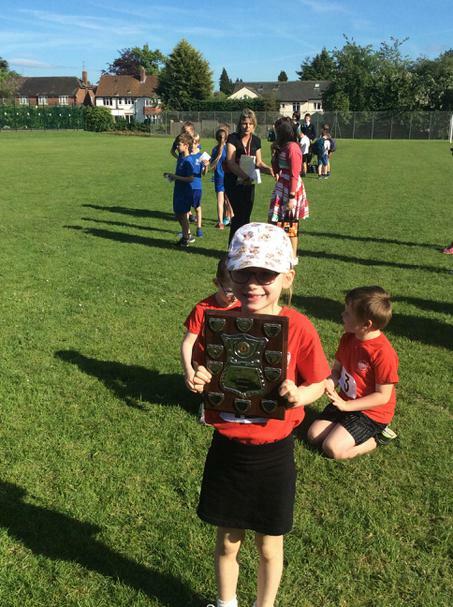 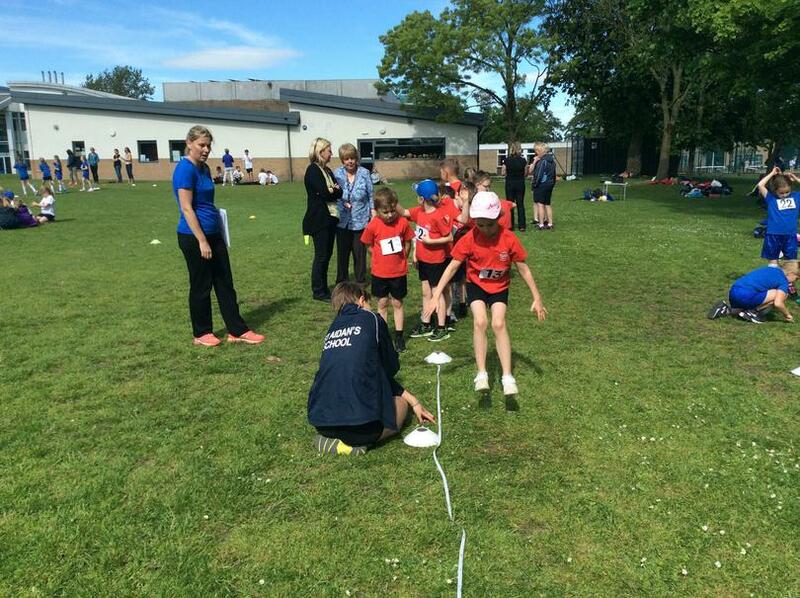 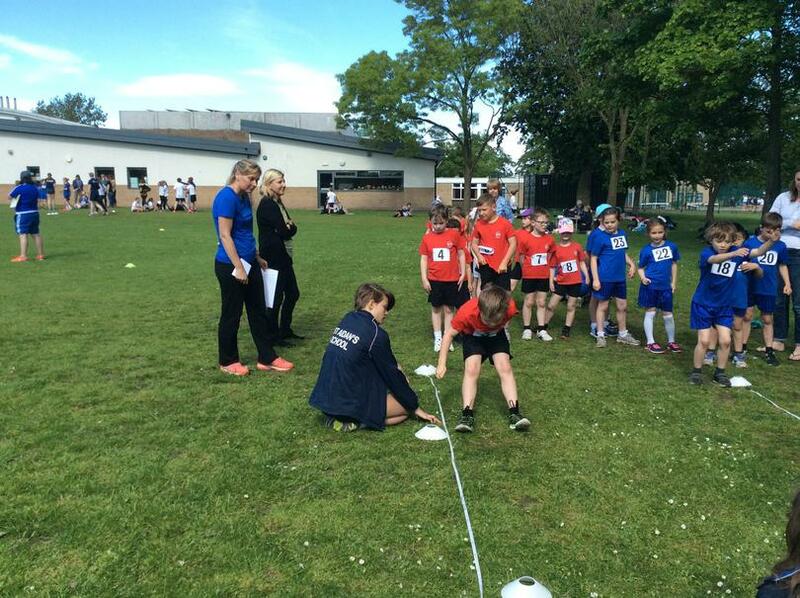 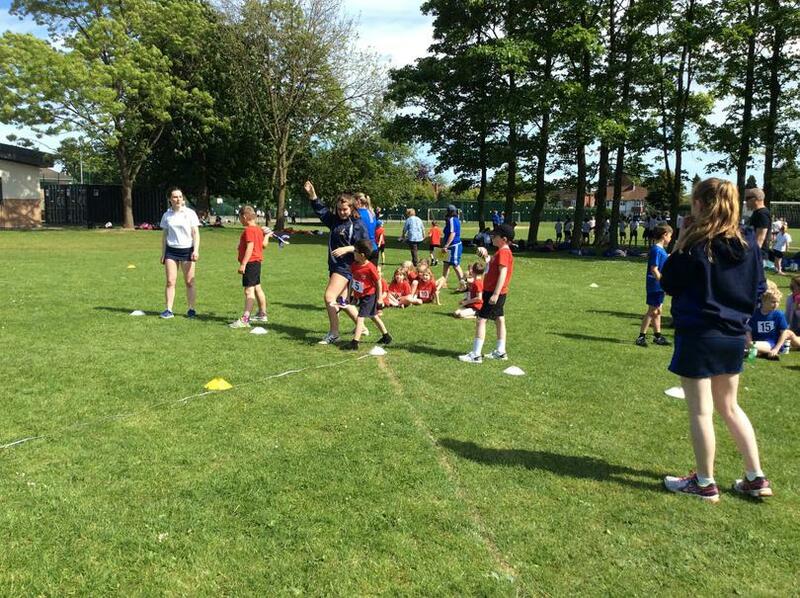 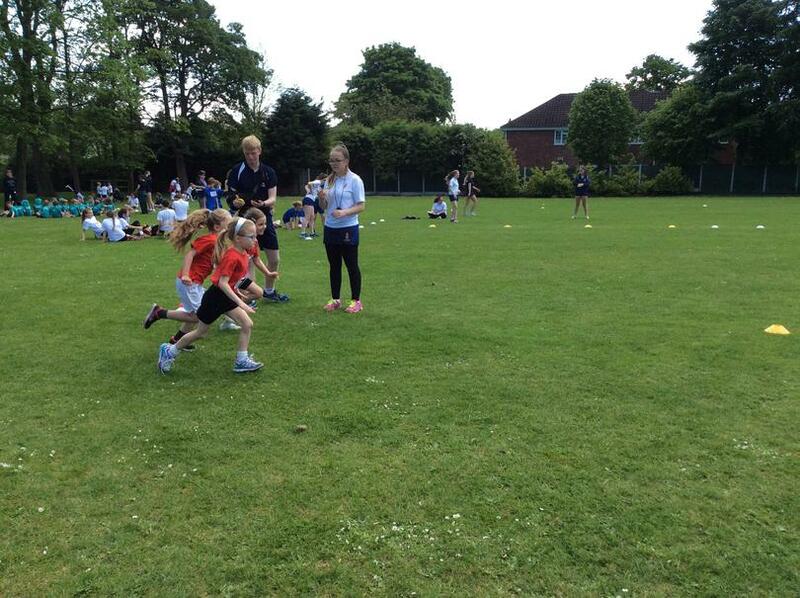 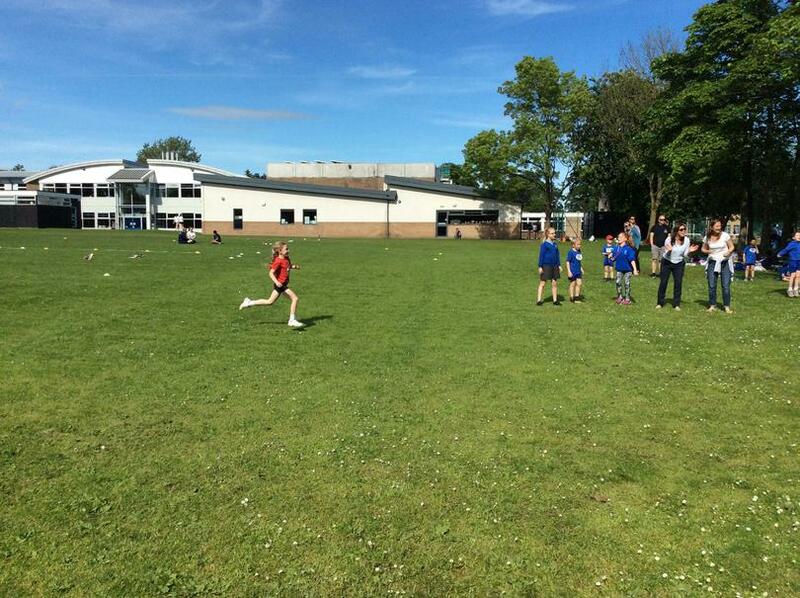 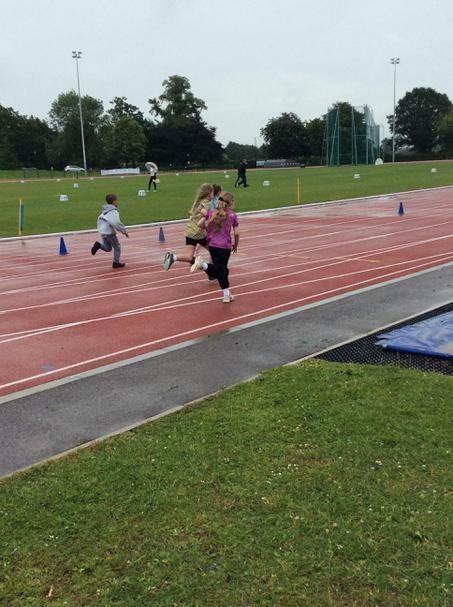 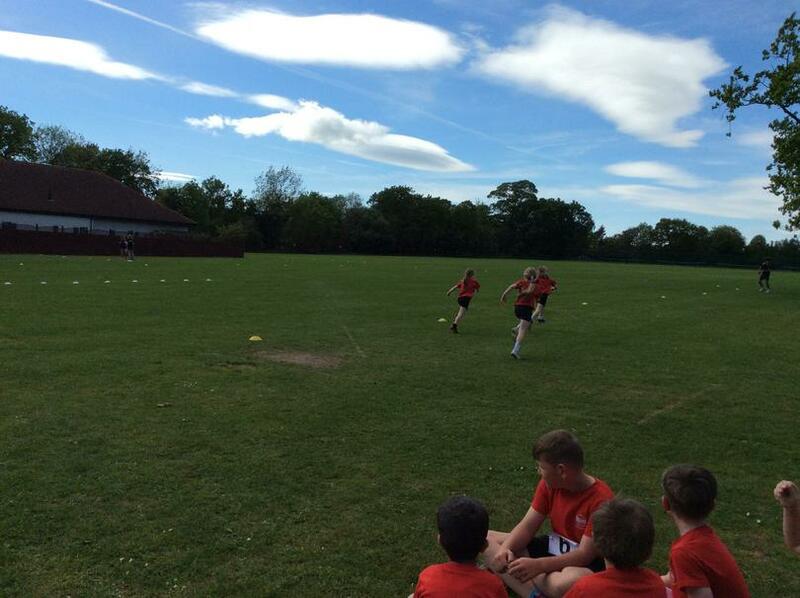 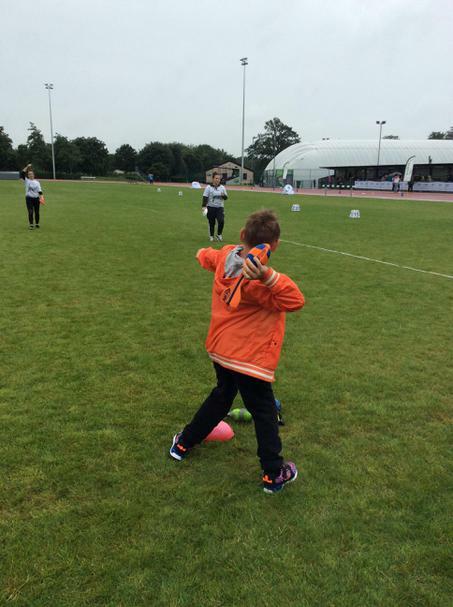 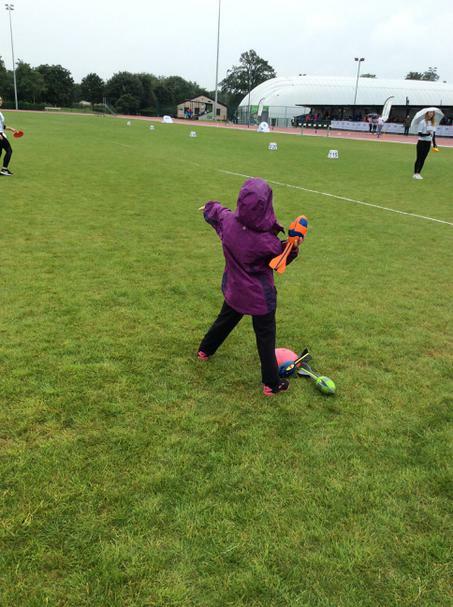 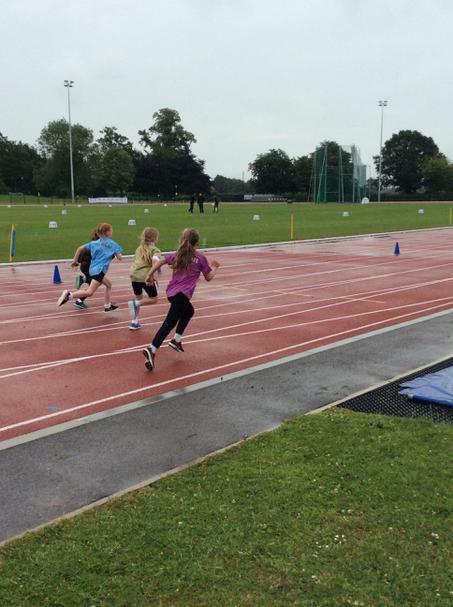 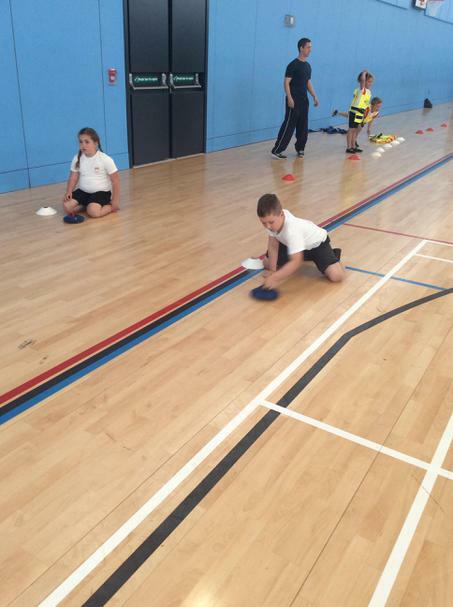 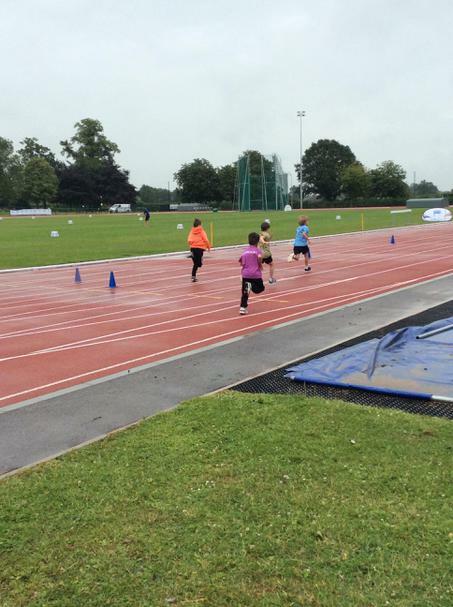 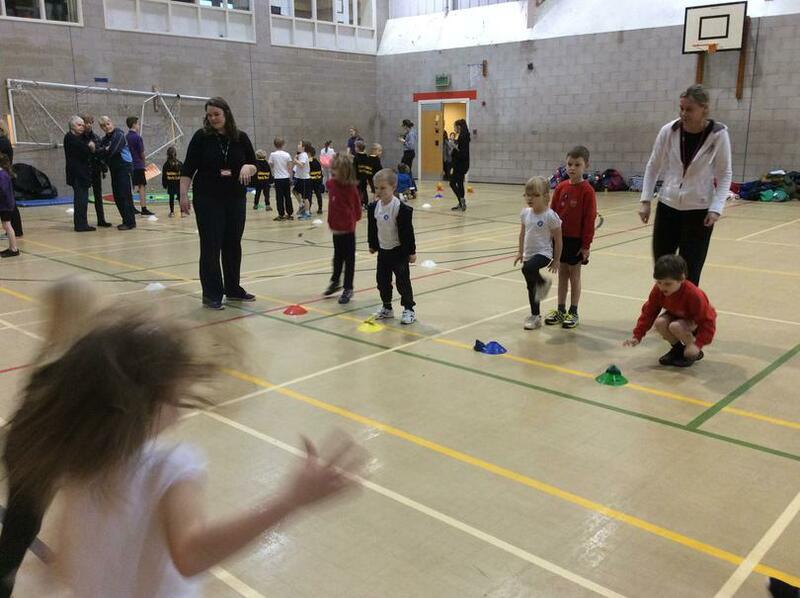 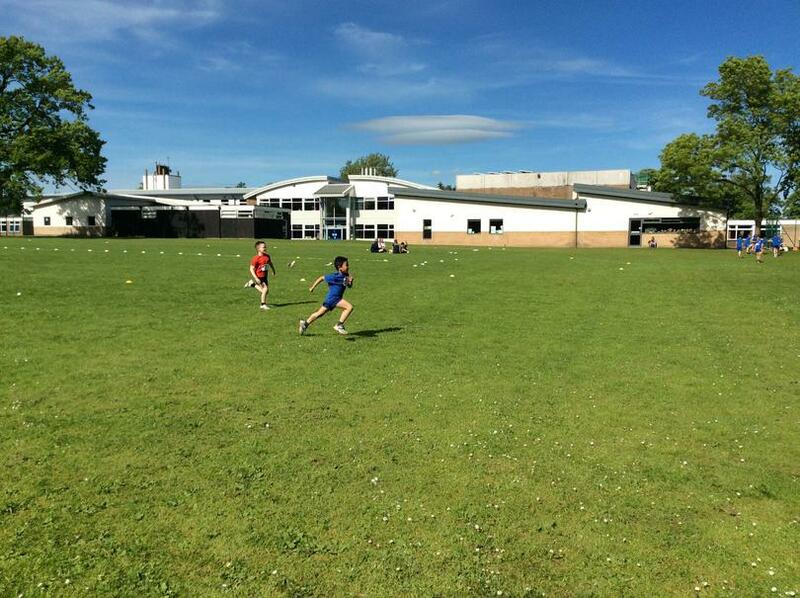 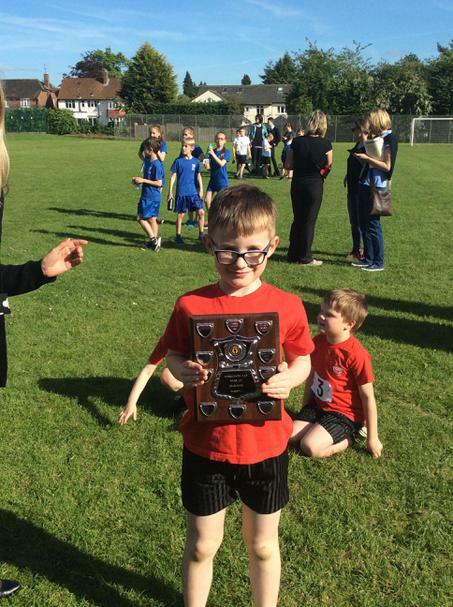 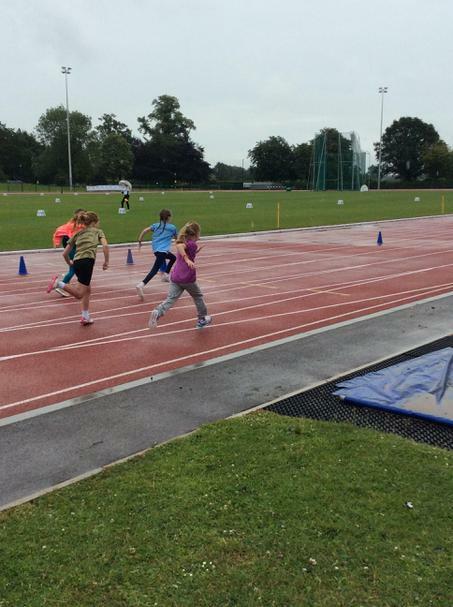 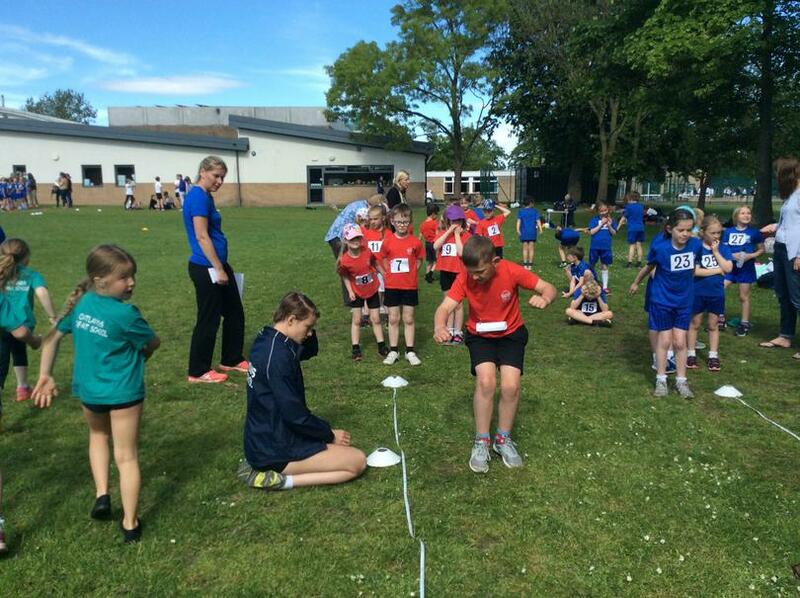 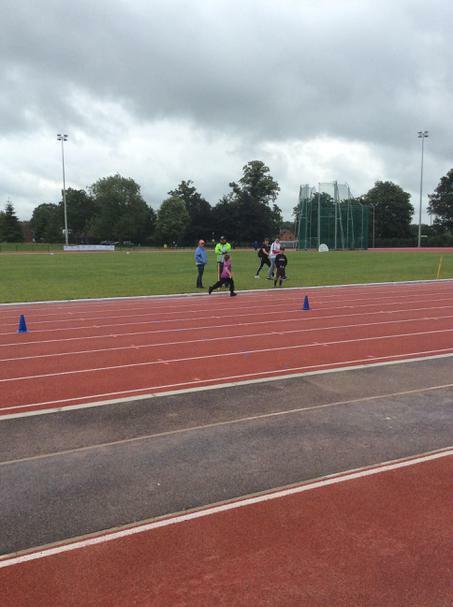 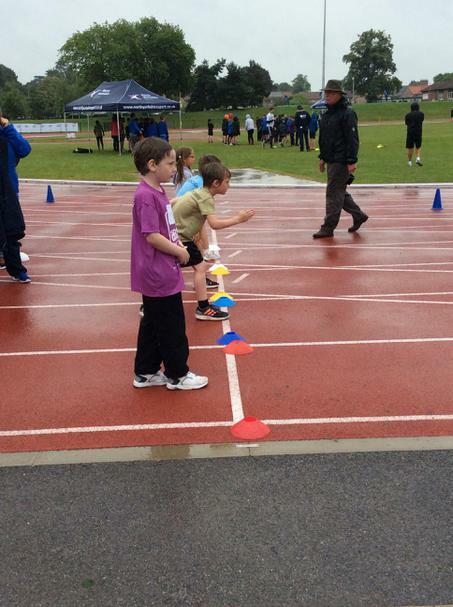 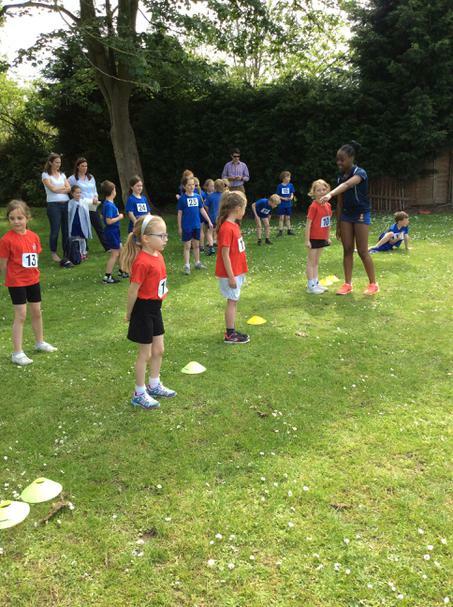 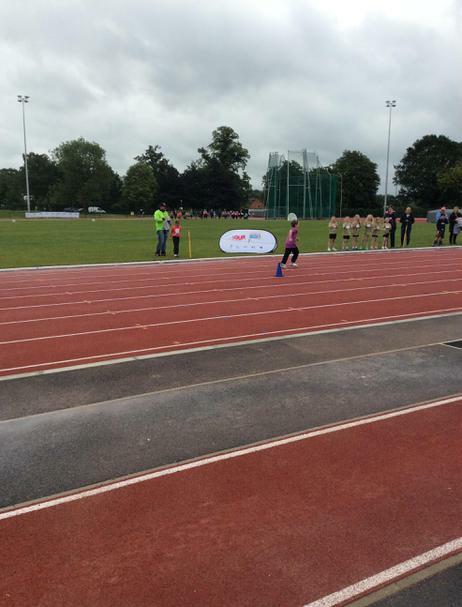 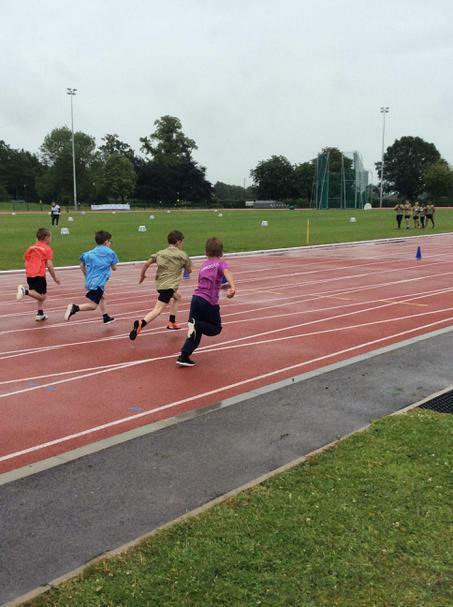 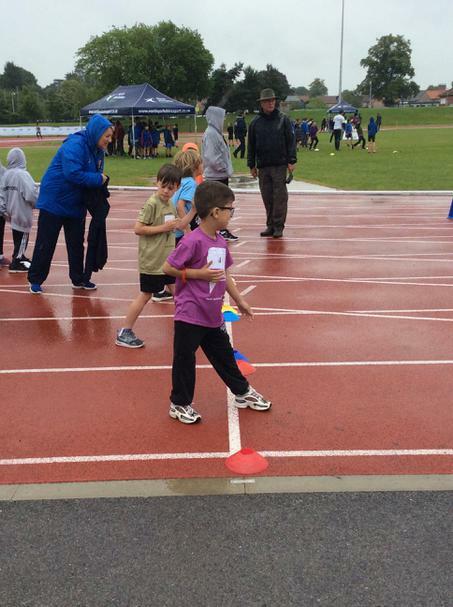 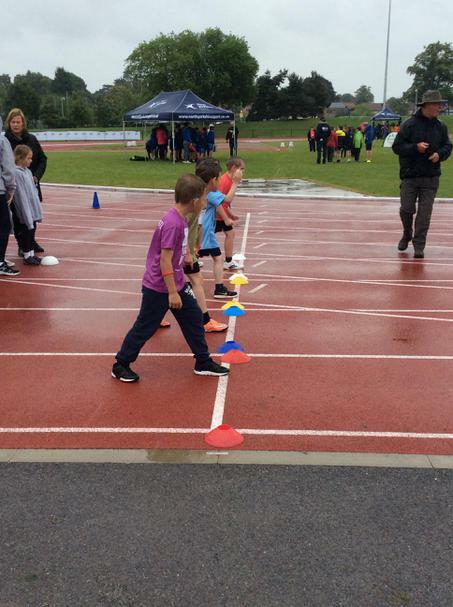 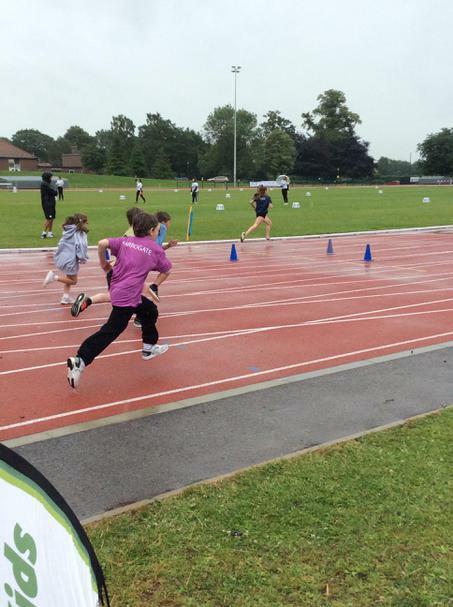 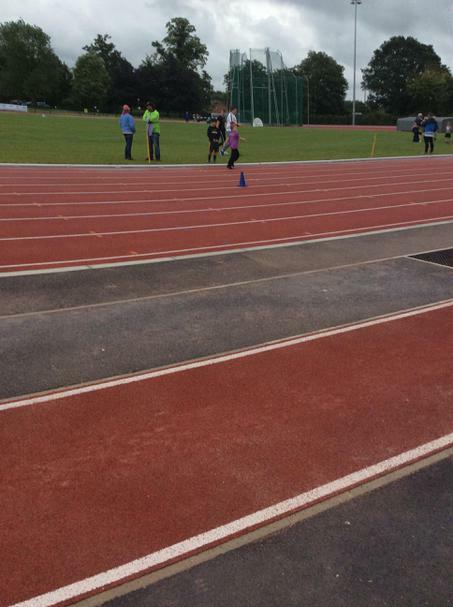 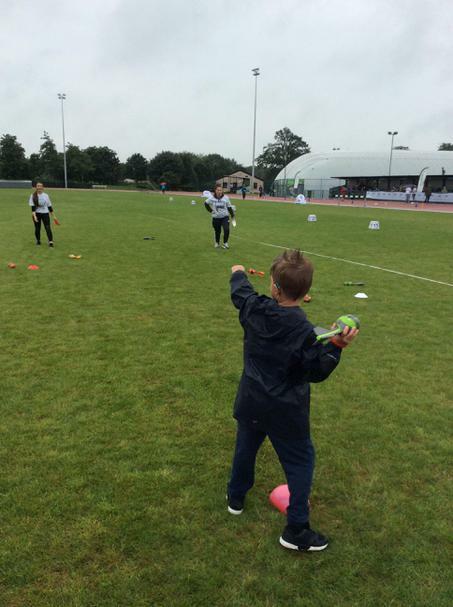 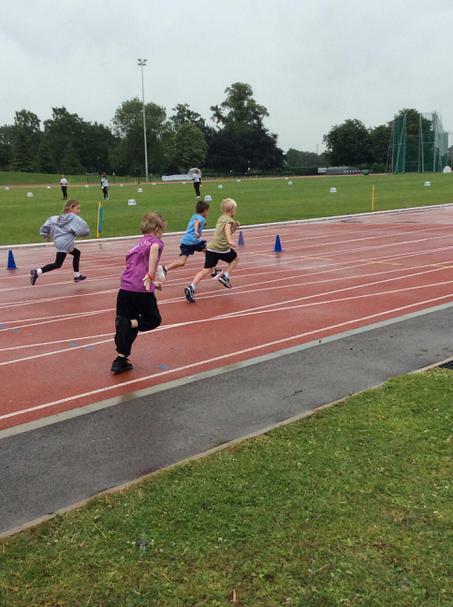 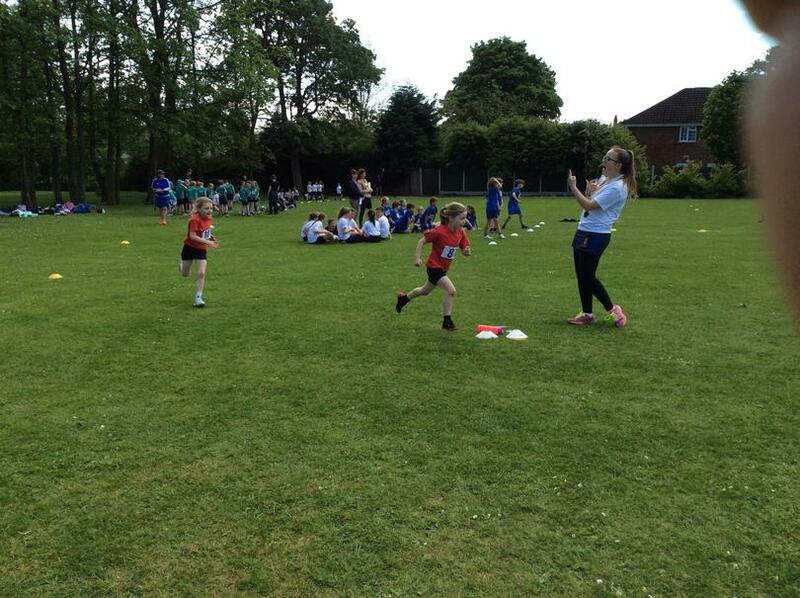 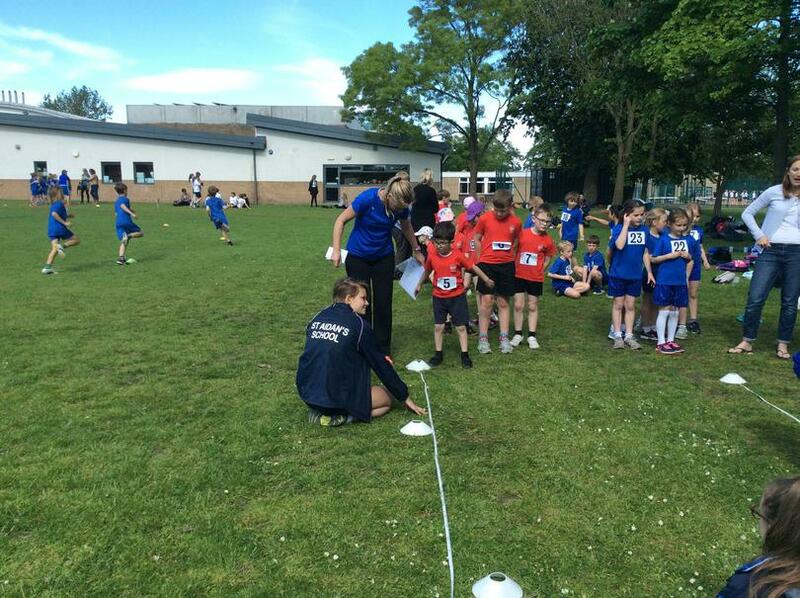 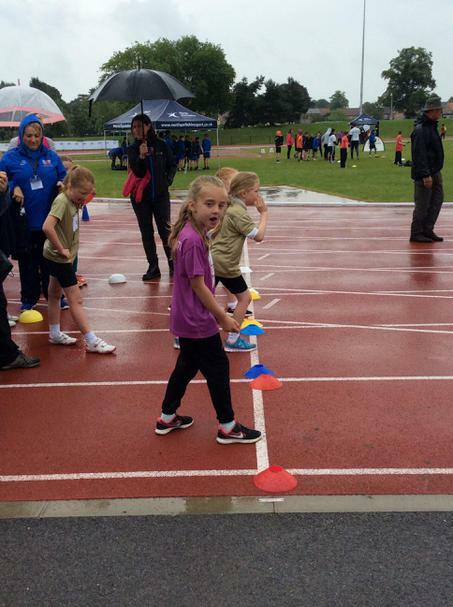 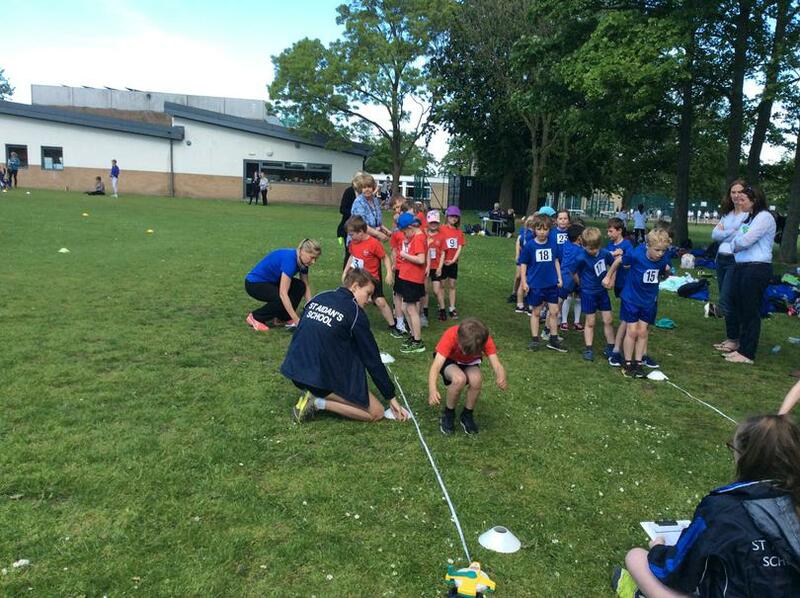 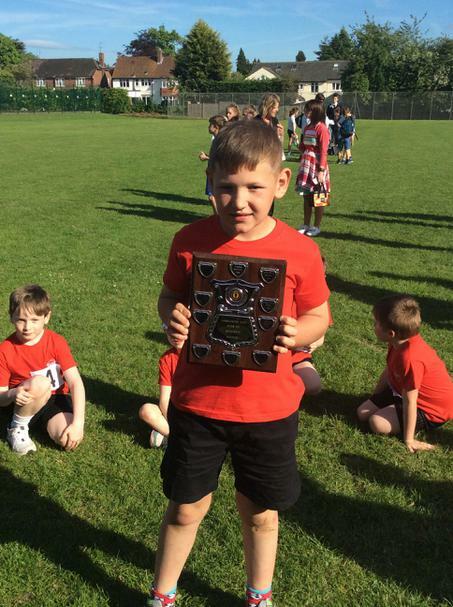 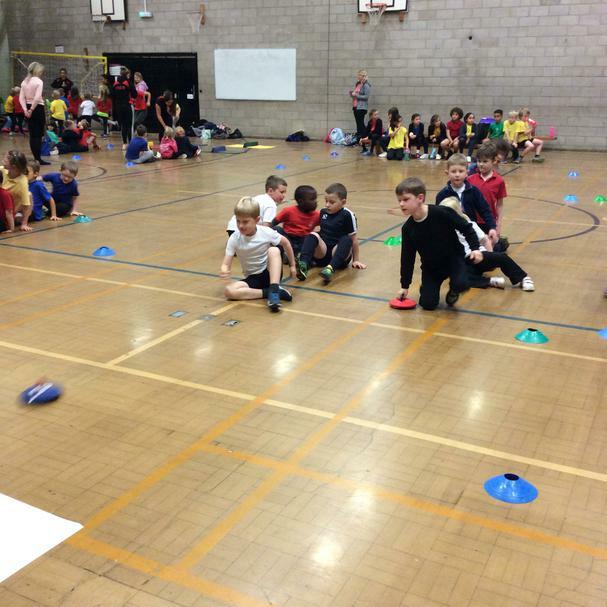 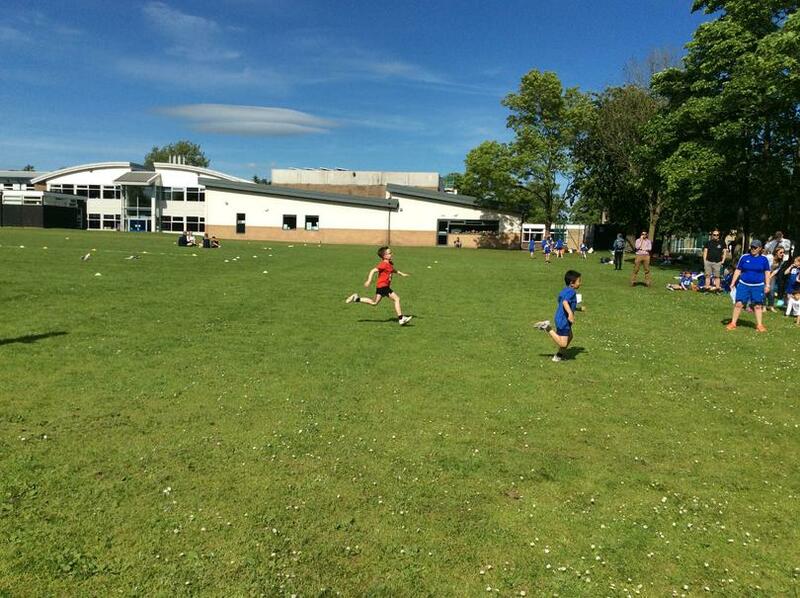 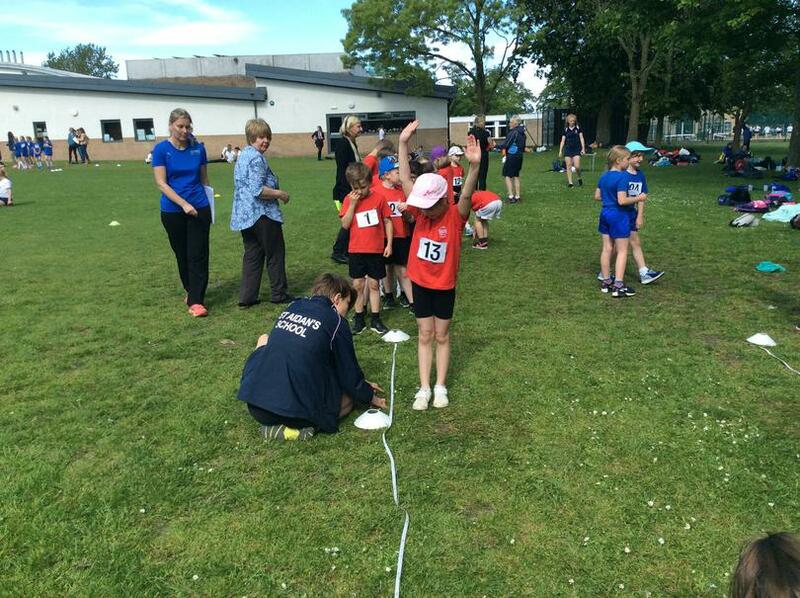 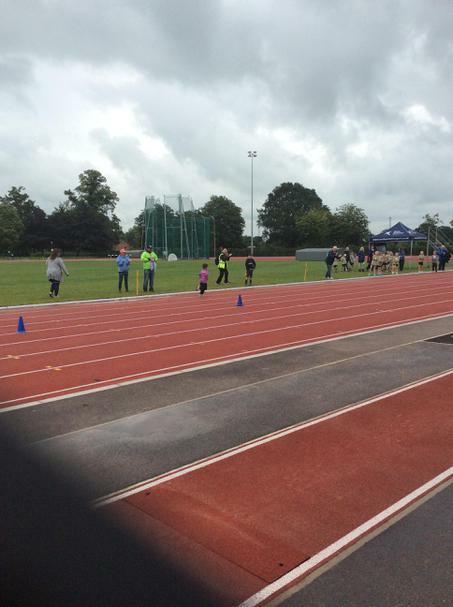 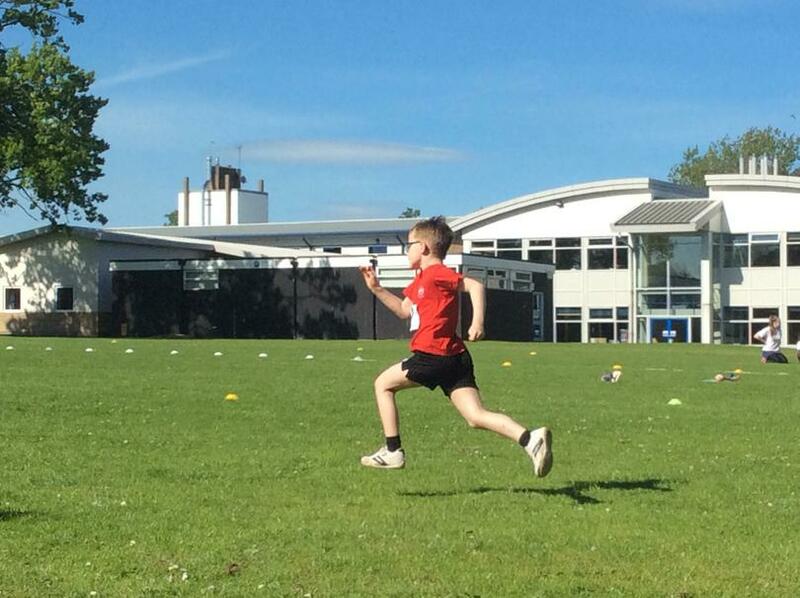 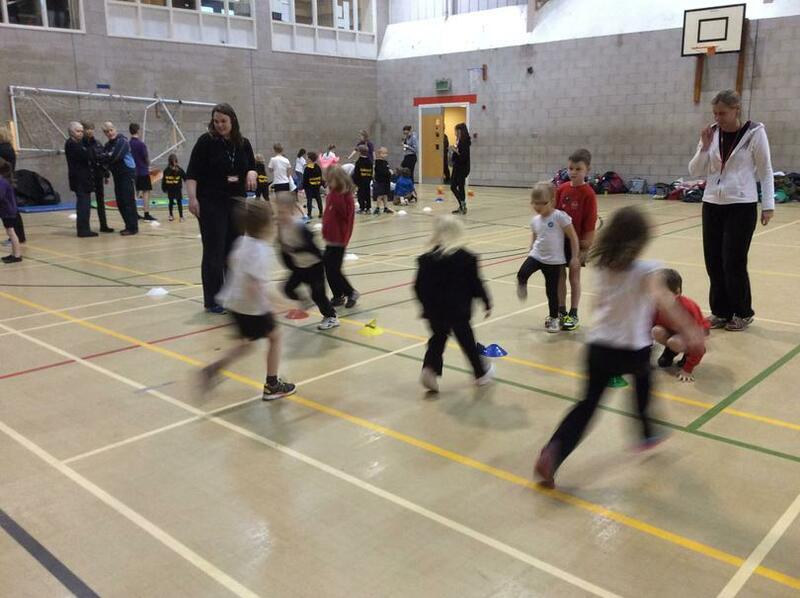 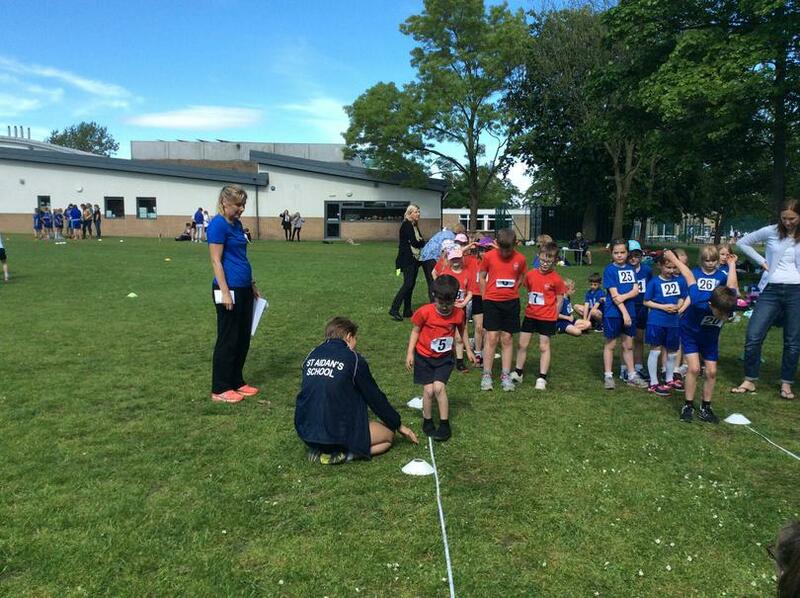 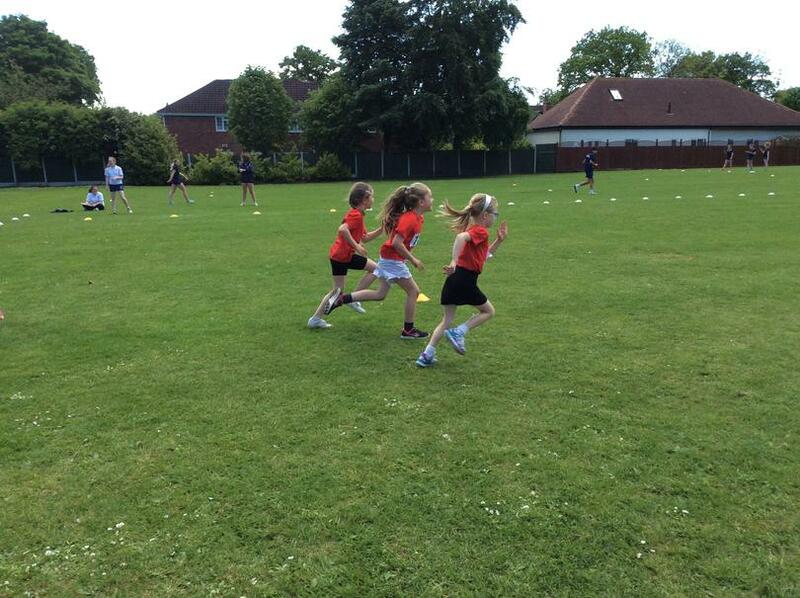 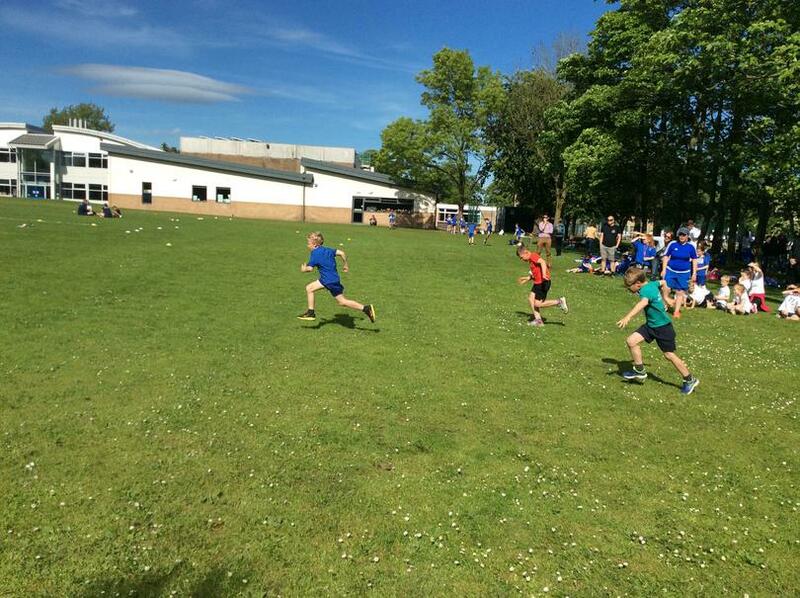 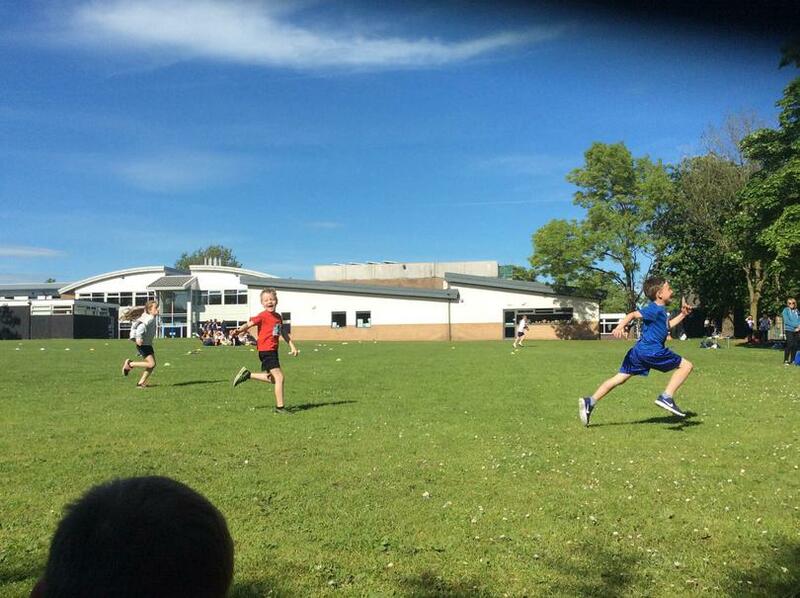 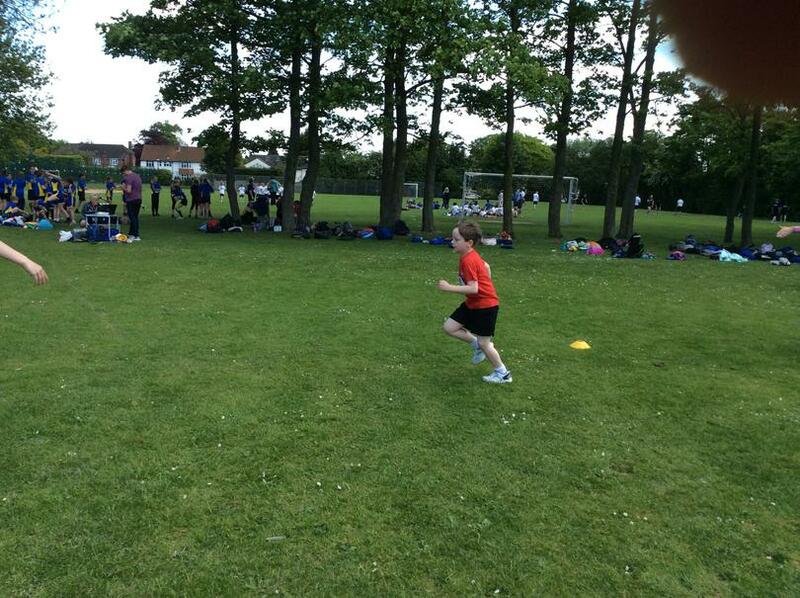 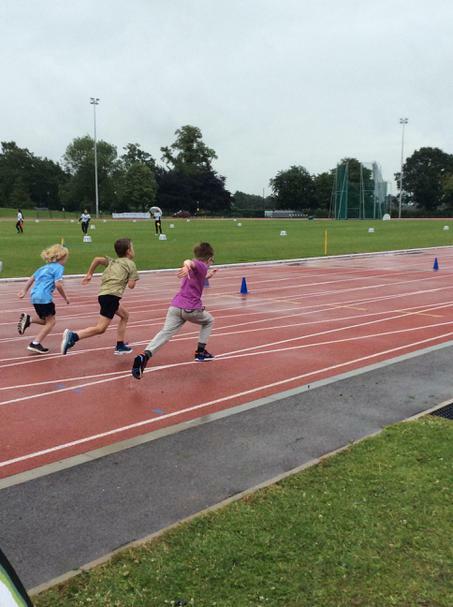 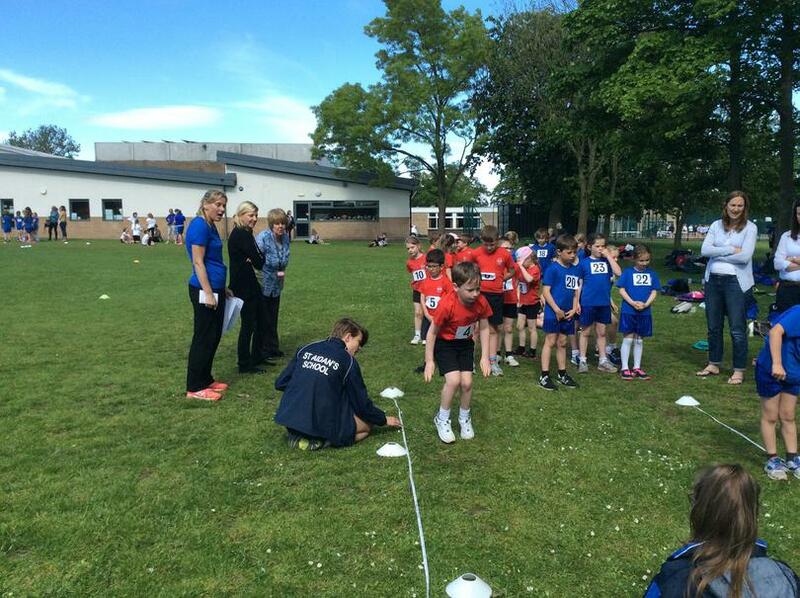 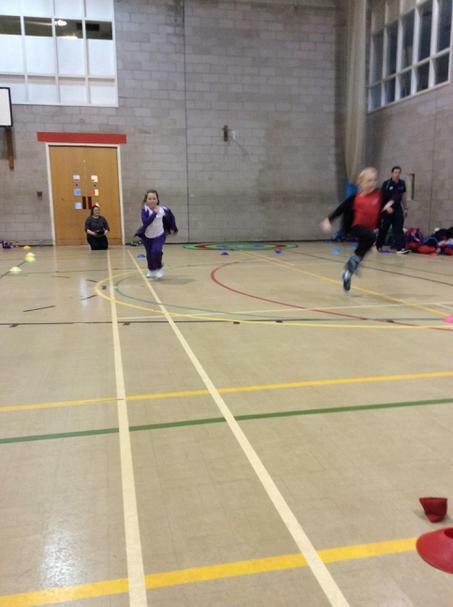 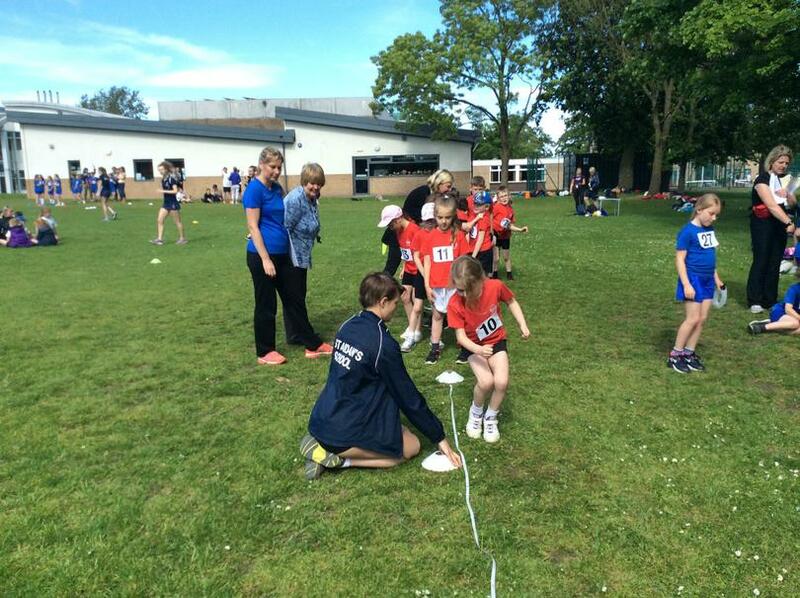 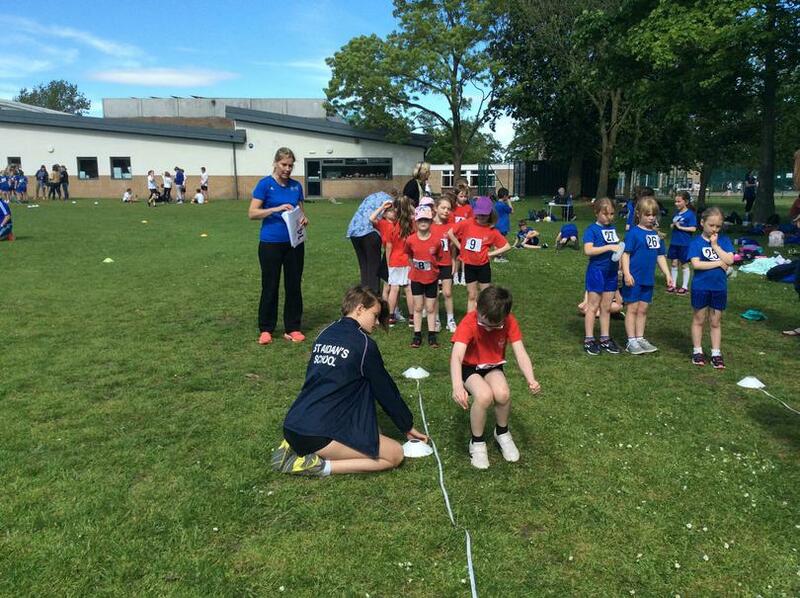 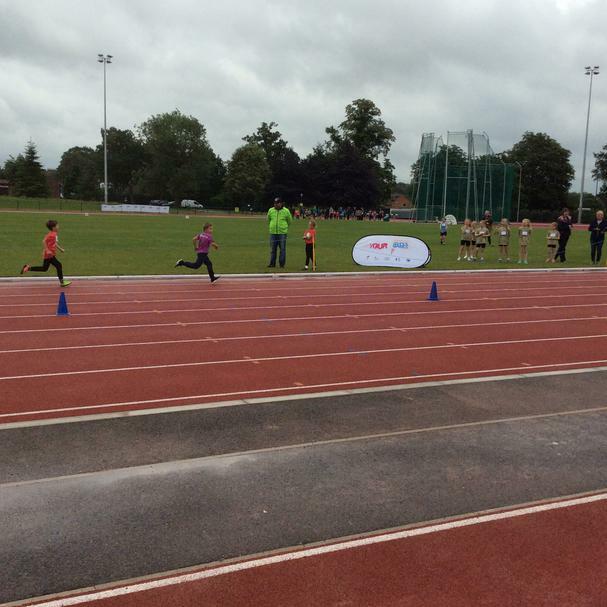 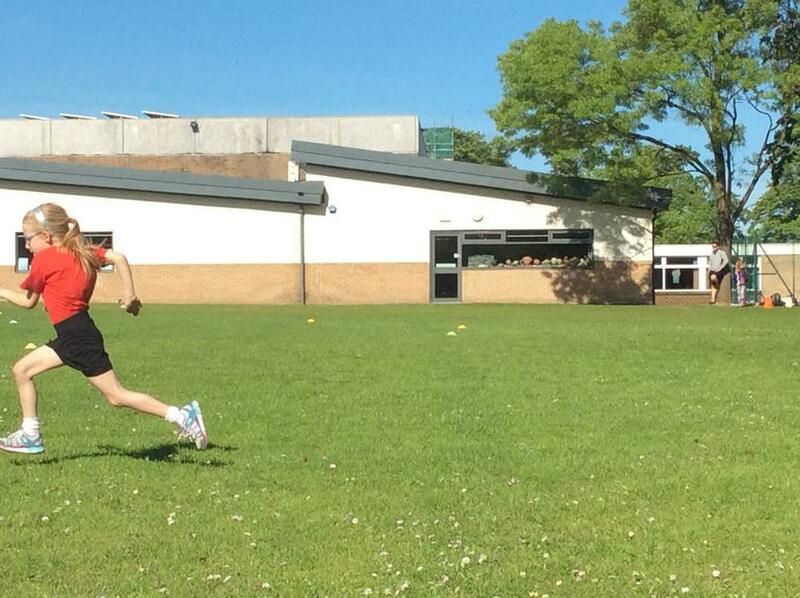 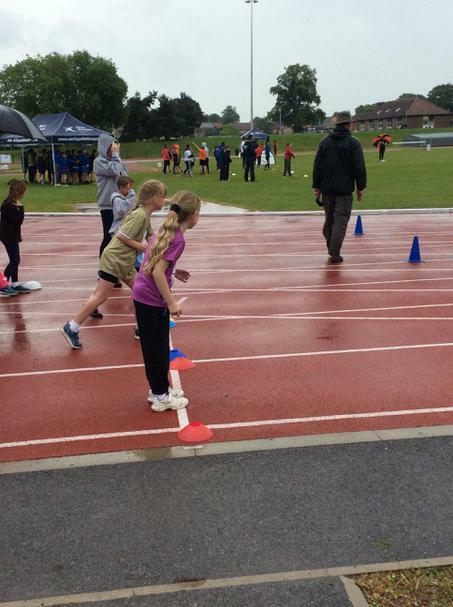 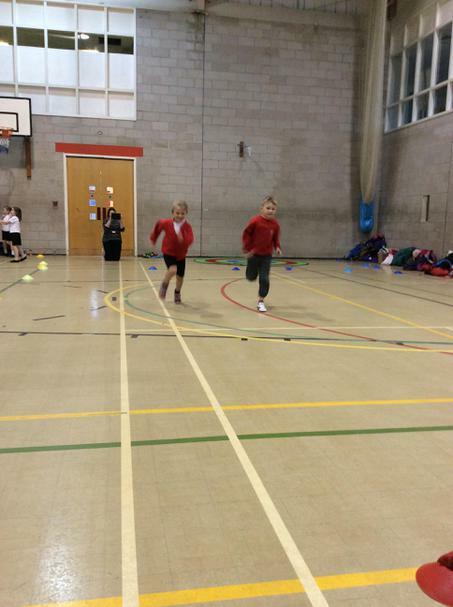 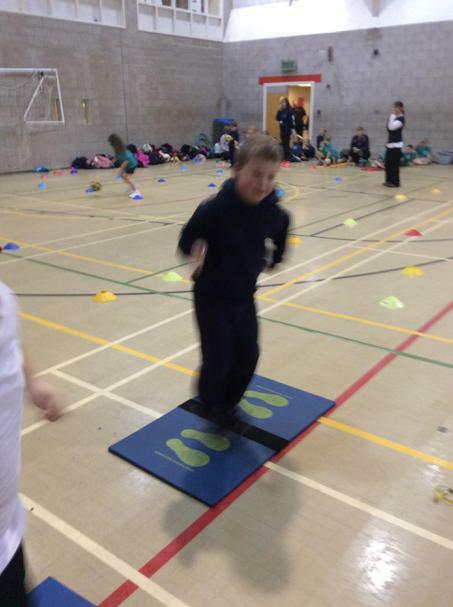 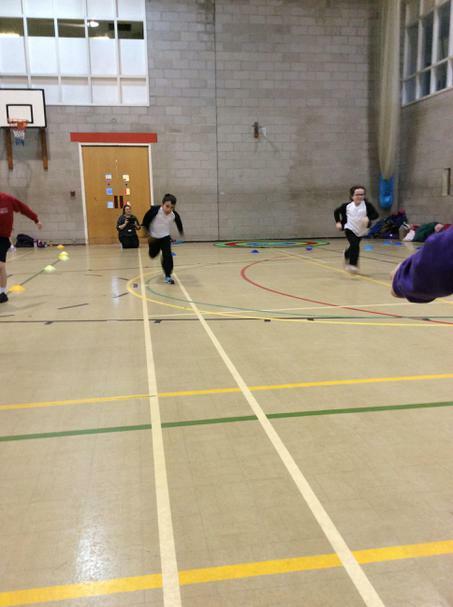 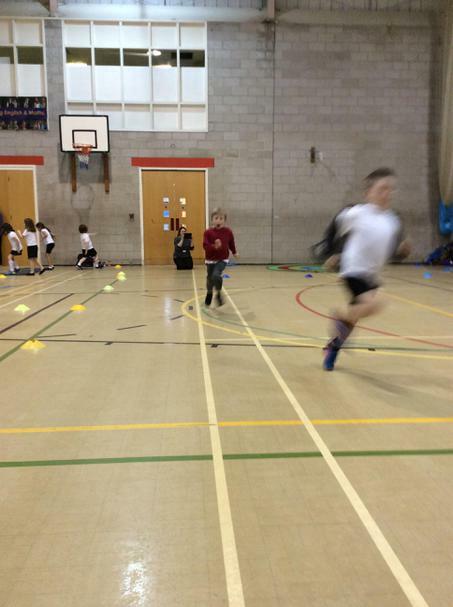 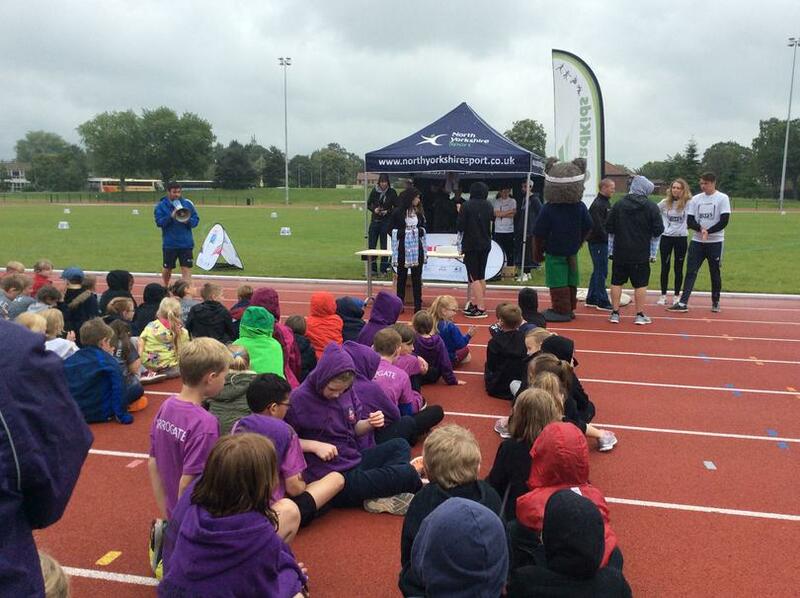 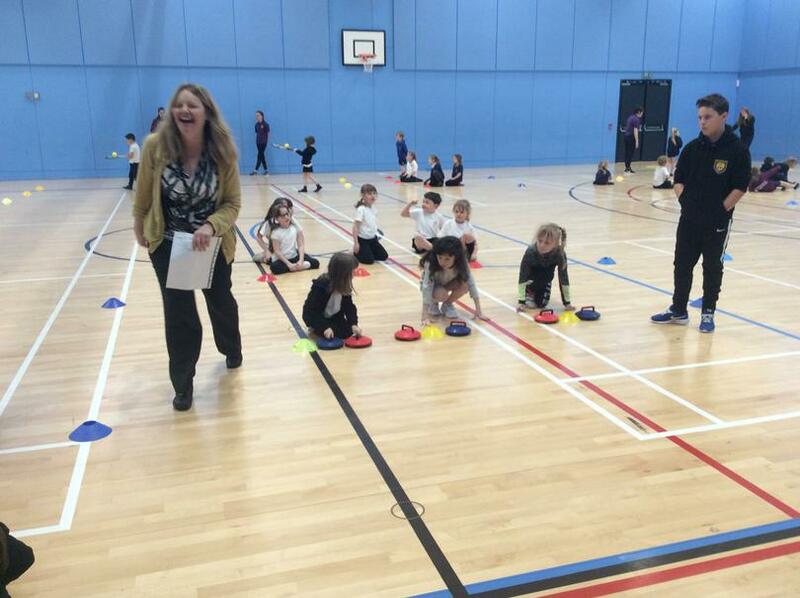 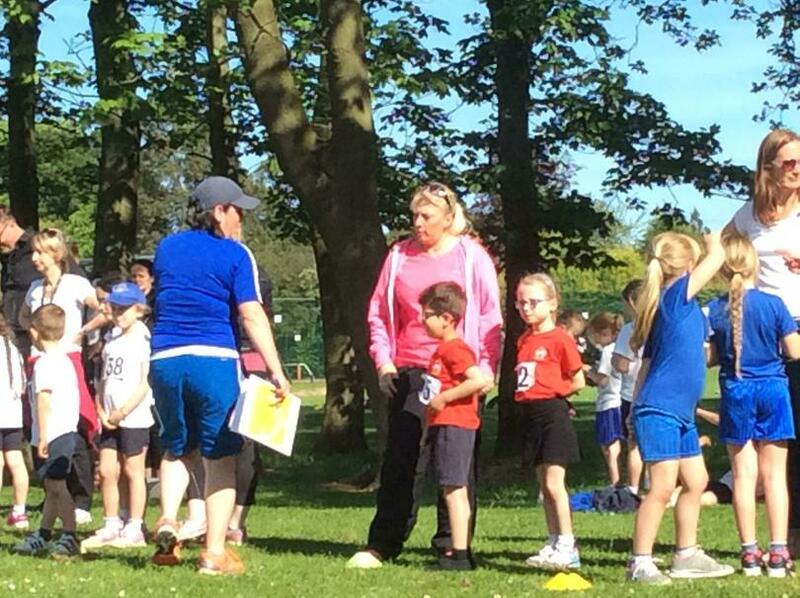 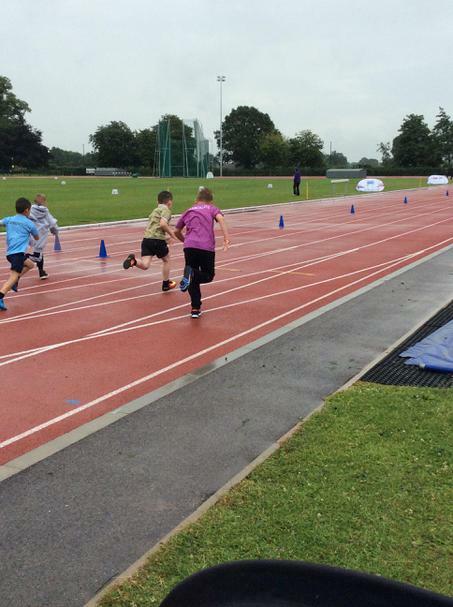 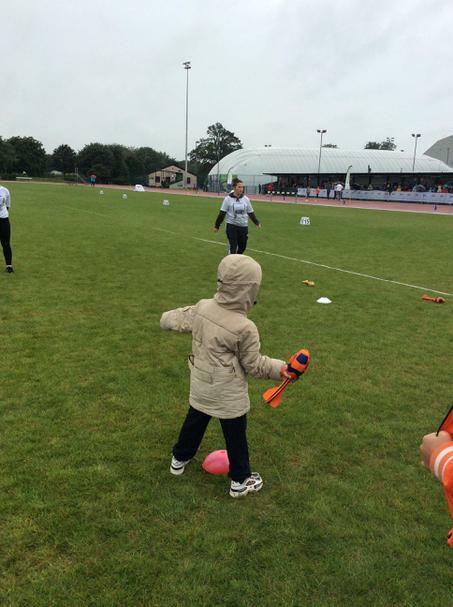 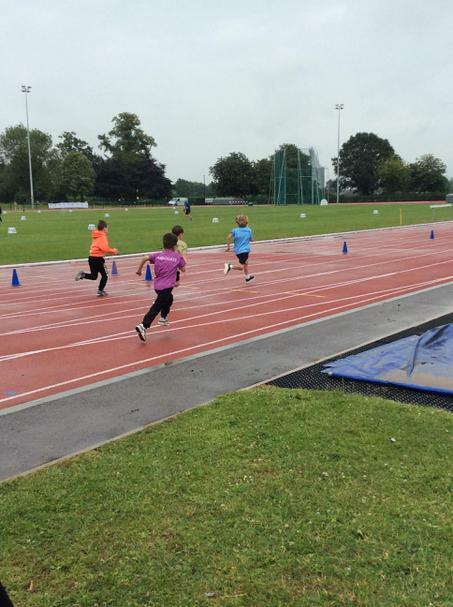 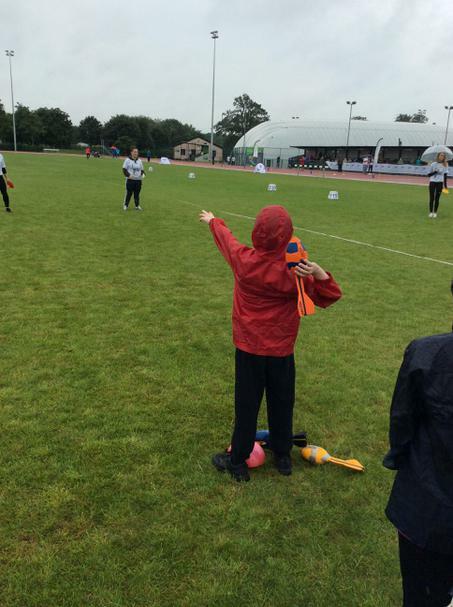 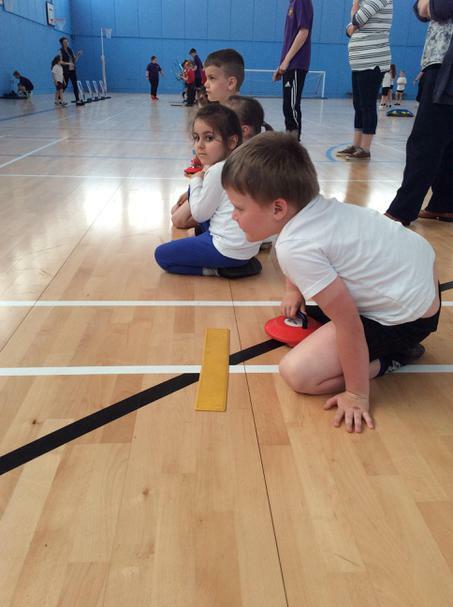 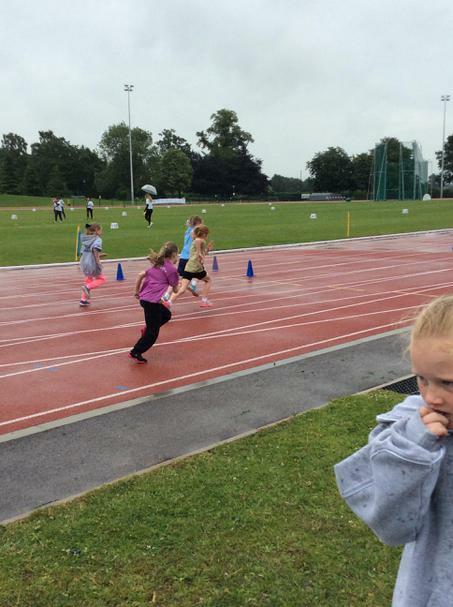 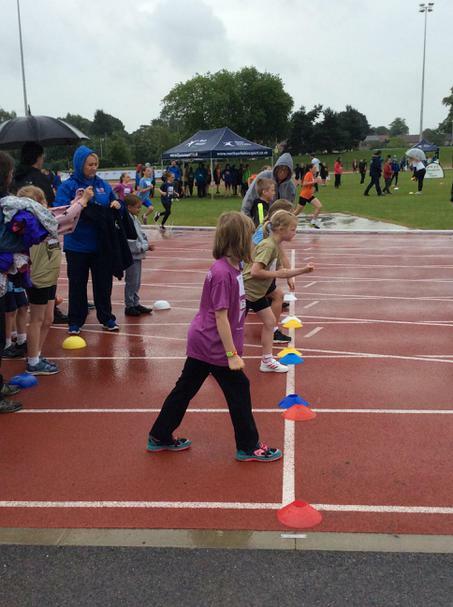 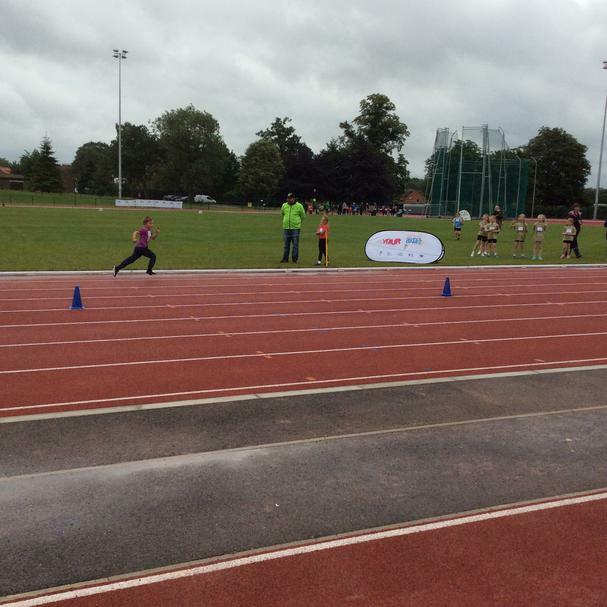 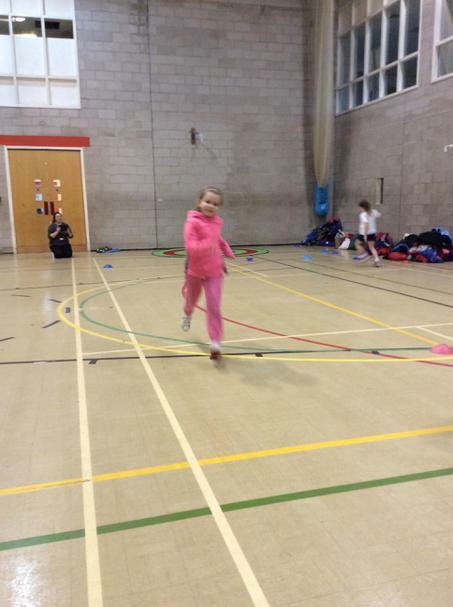 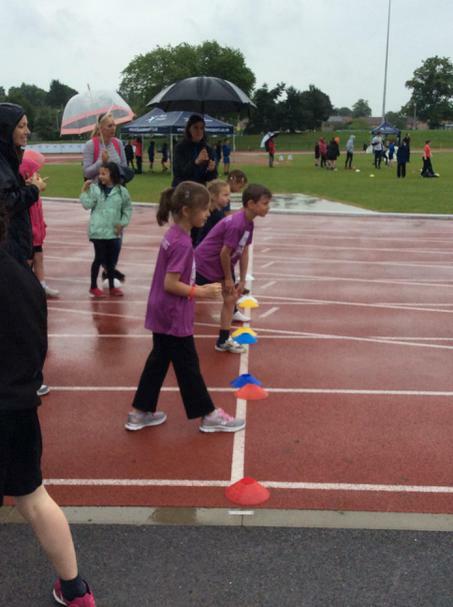 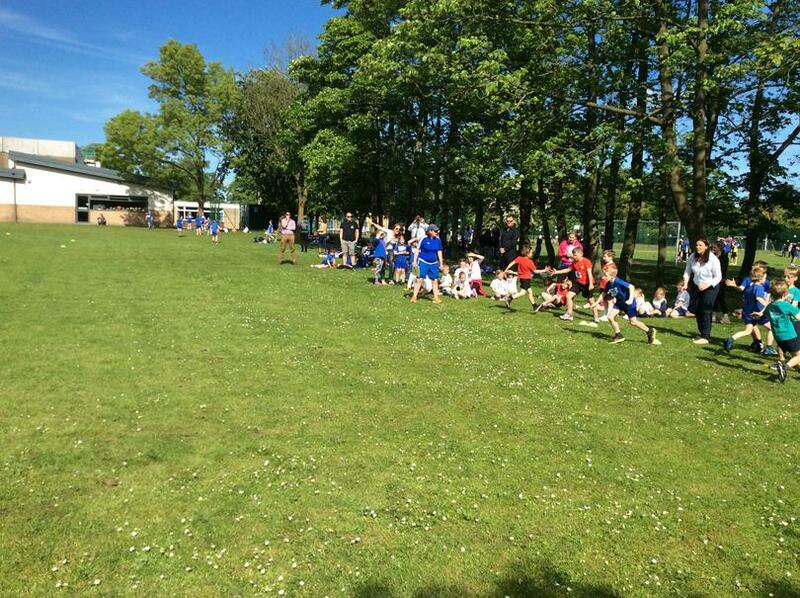 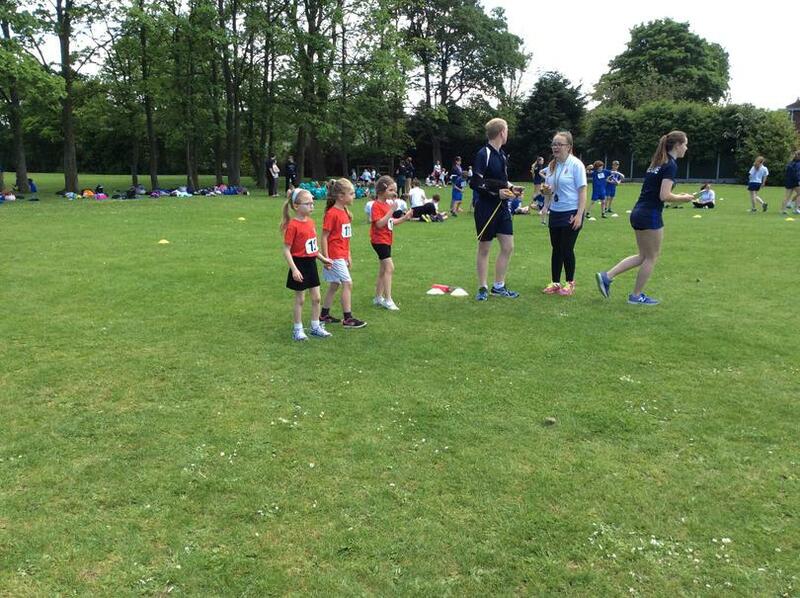 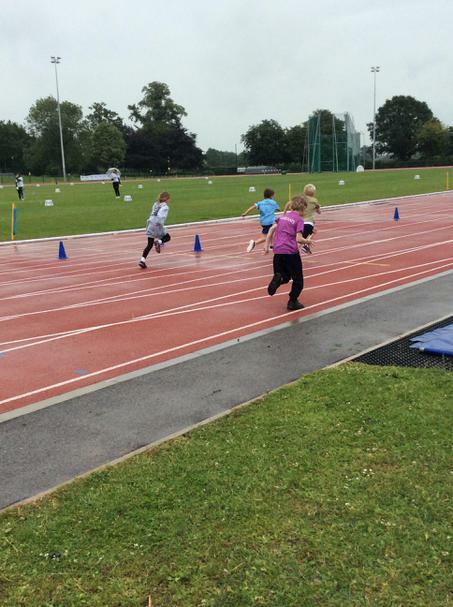 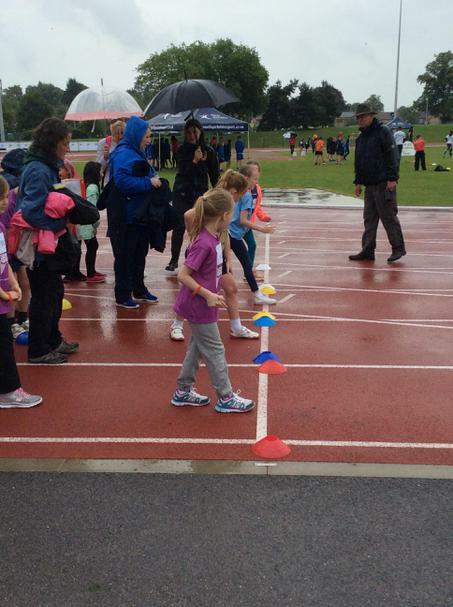 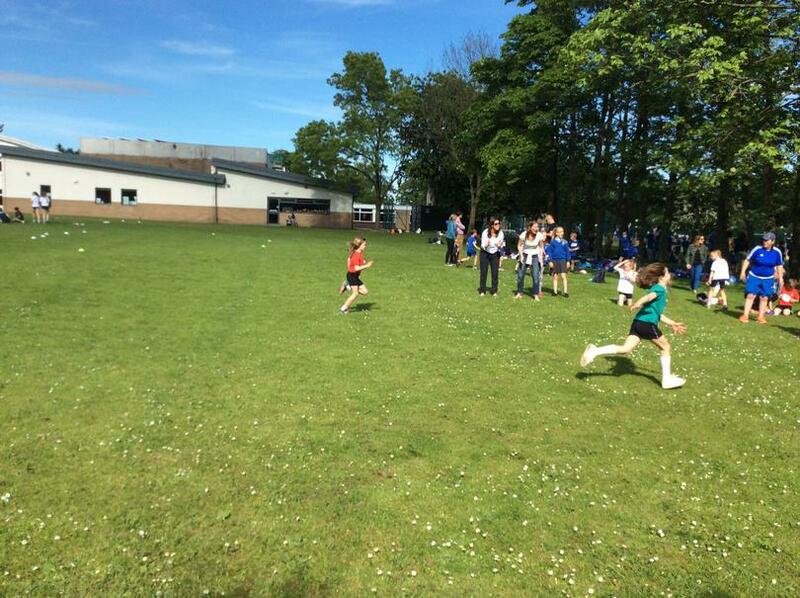 Every child took part in a 50 metre sprint, 300 metre run, howler throw, standing long jump and a relay. 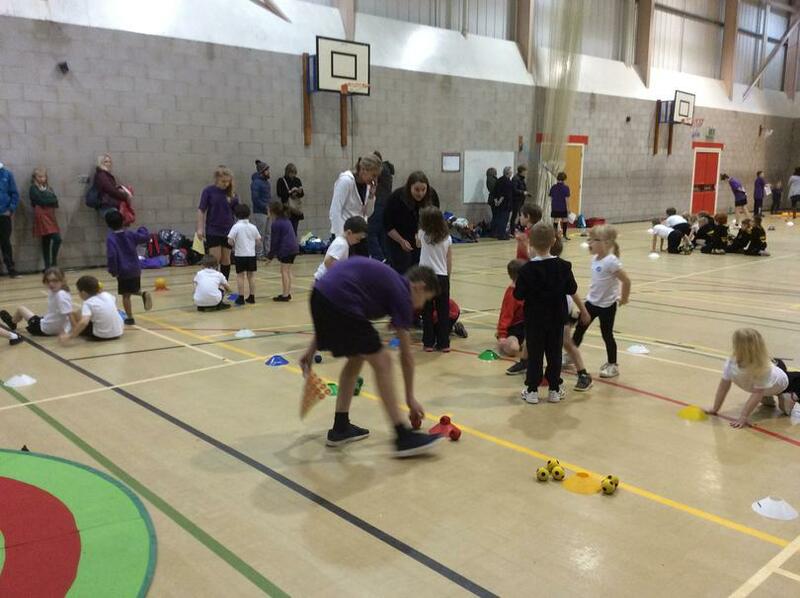 All the children had a wonderful day and worked very hard. 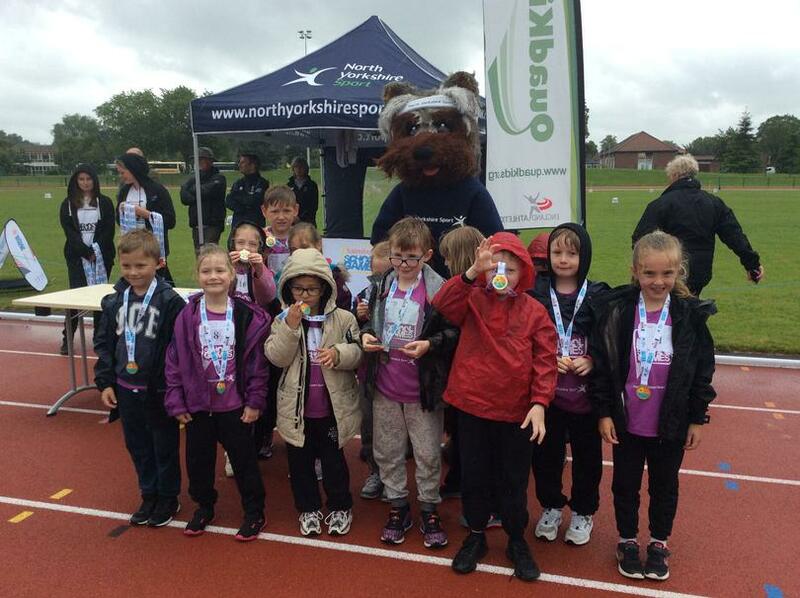 We are delighted to announce that Saltergate finished first overall and were crowned winners of North Yorkshire, each child was given a winners medal and the school has received a gorgeous trophy to put in our display cabinet. 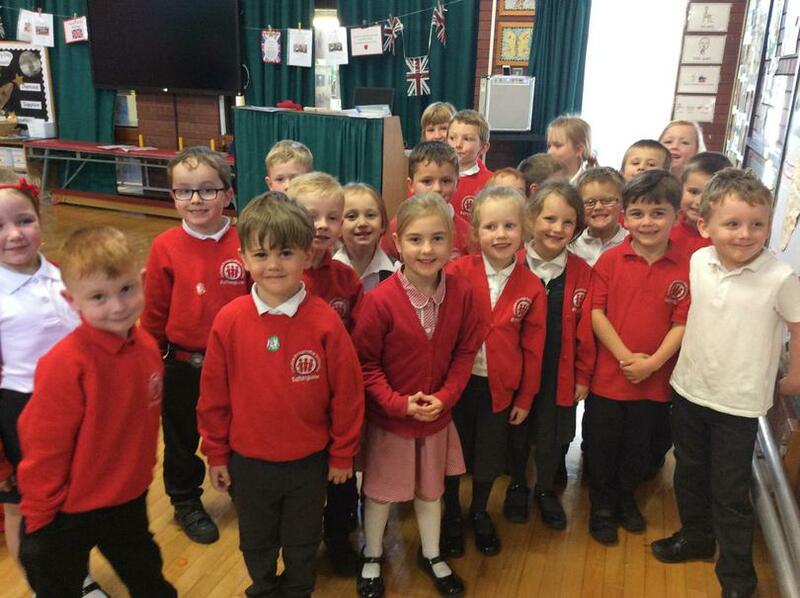 Well done children we are very proud of you. 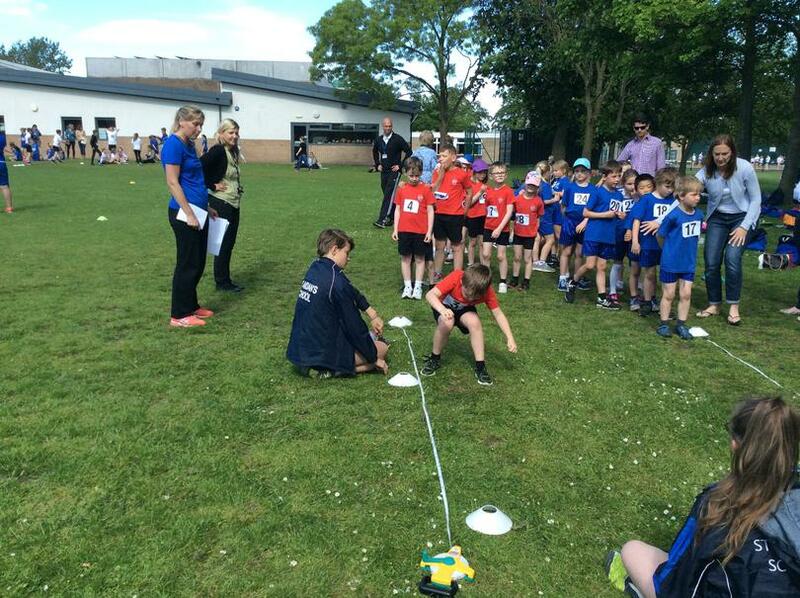 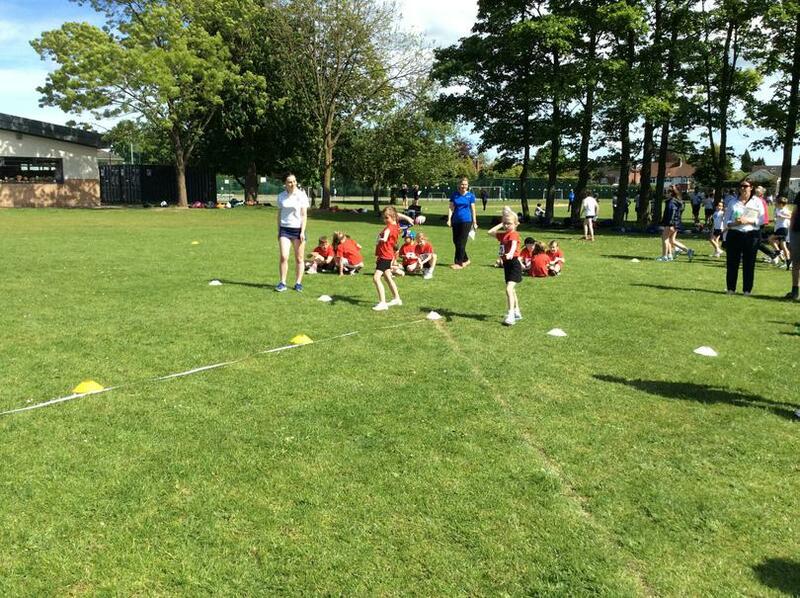 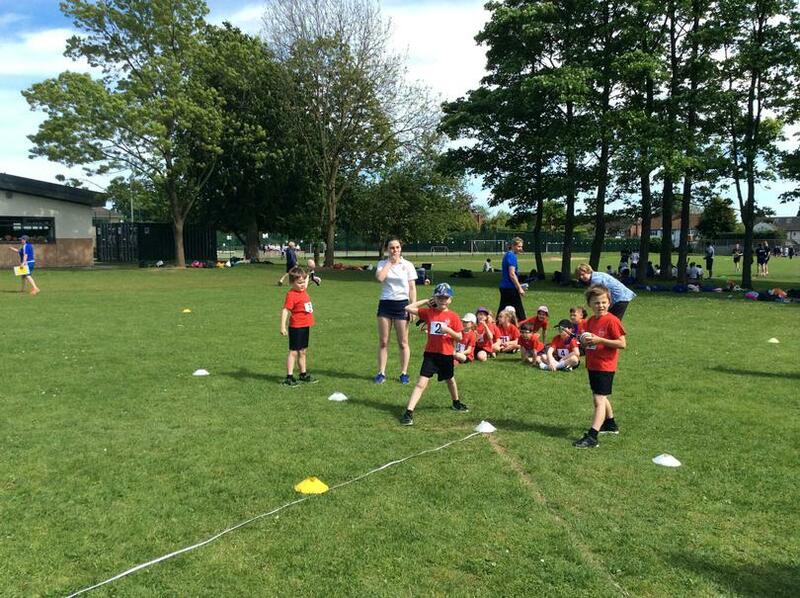 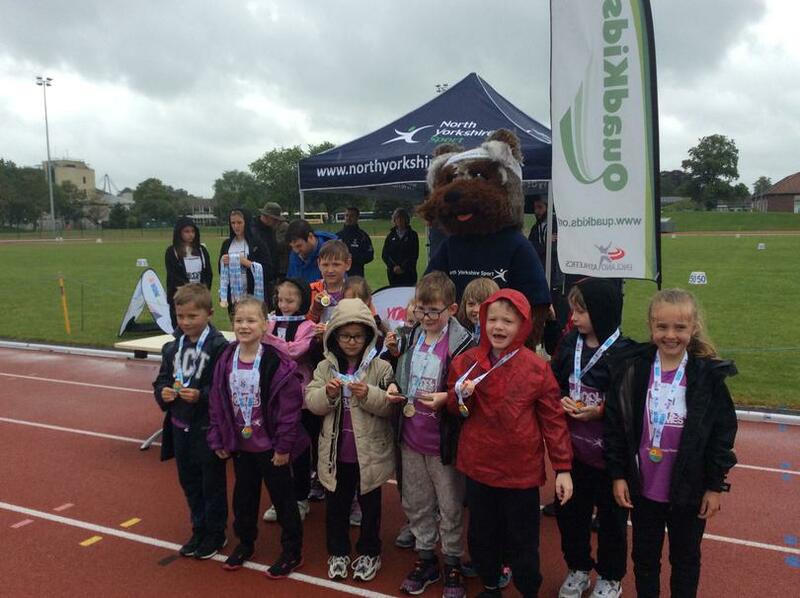 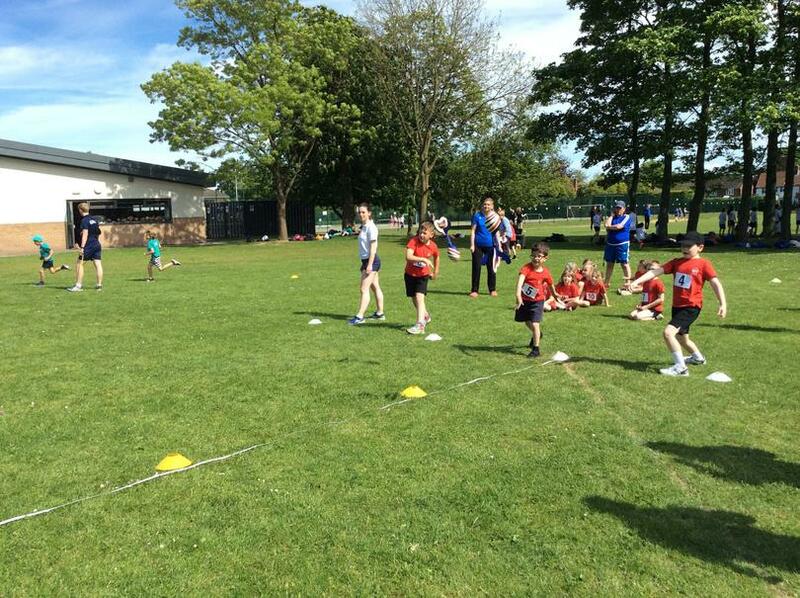 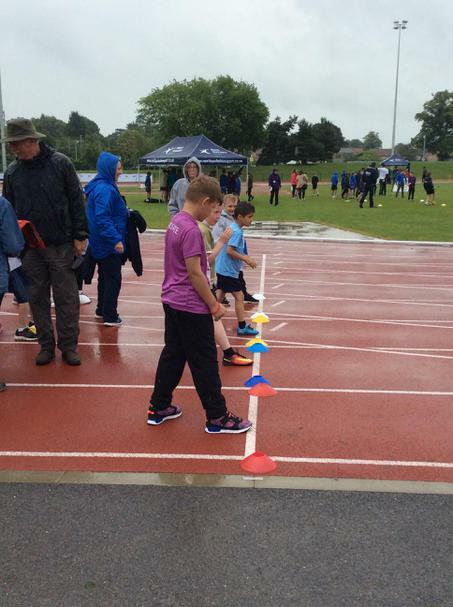 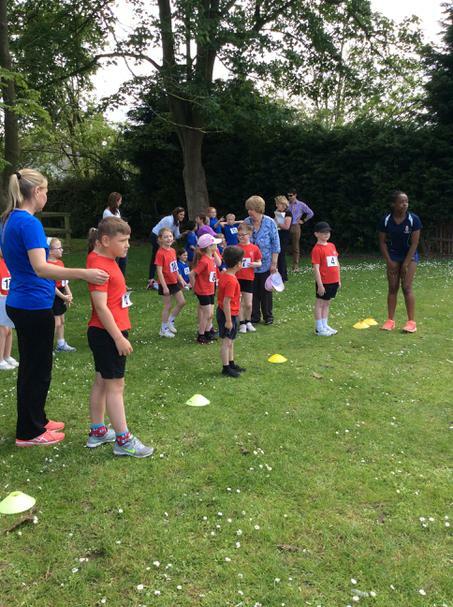 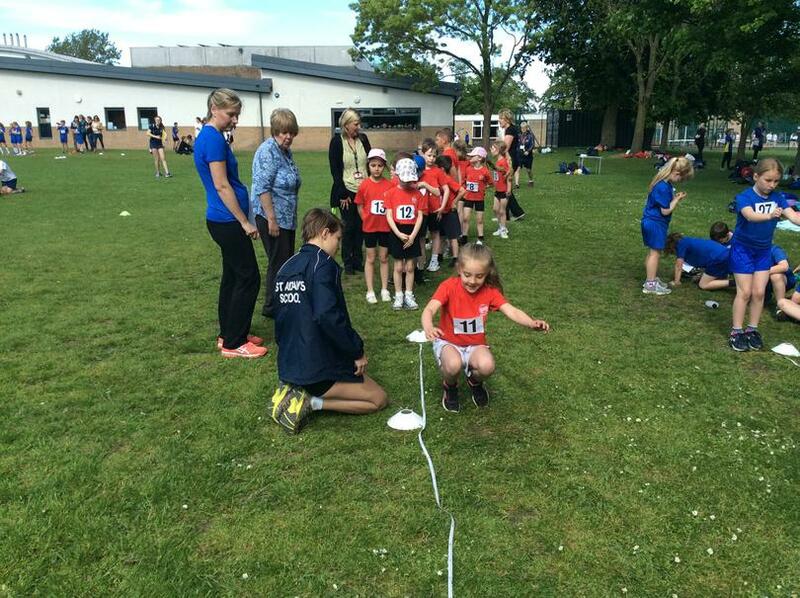 Some of our Year 2 children attended the Harrogate and area Quadkids final at St Aidens School, this Festival is run by the Harrogate Schools Sports Partnership. 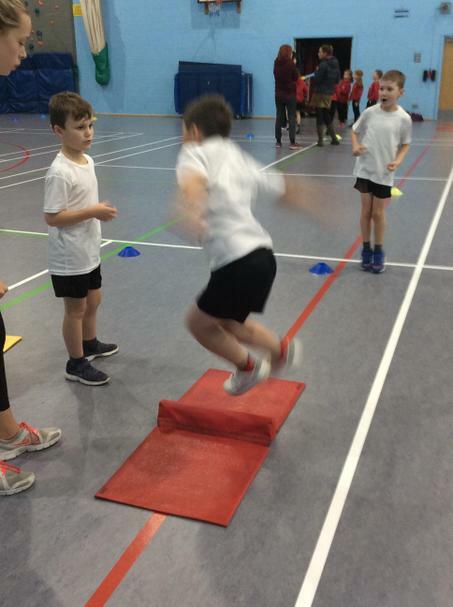 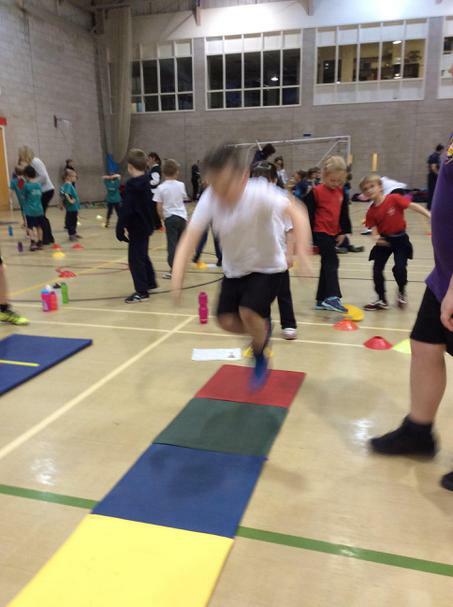 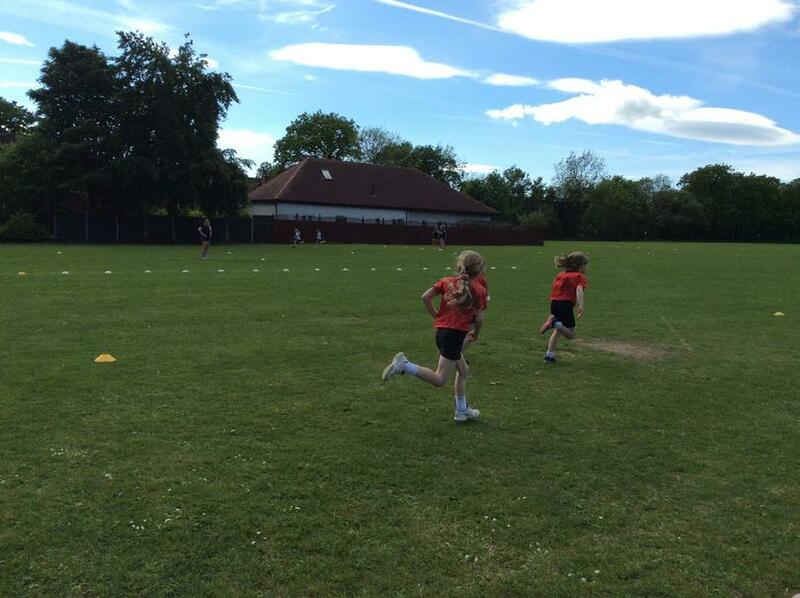 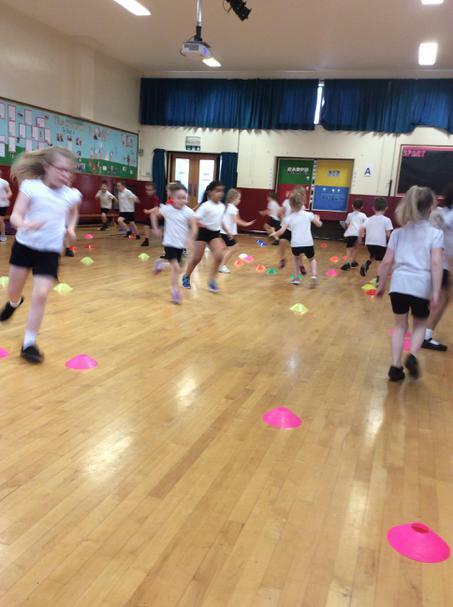 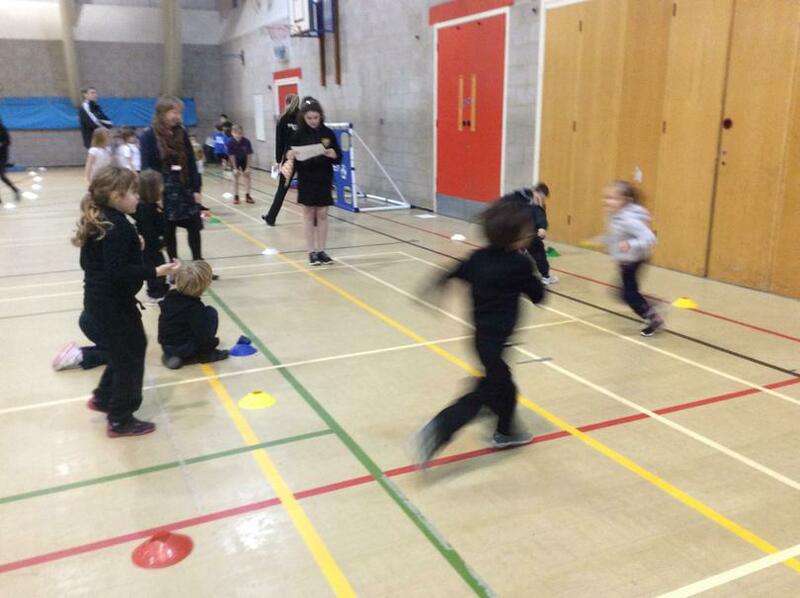 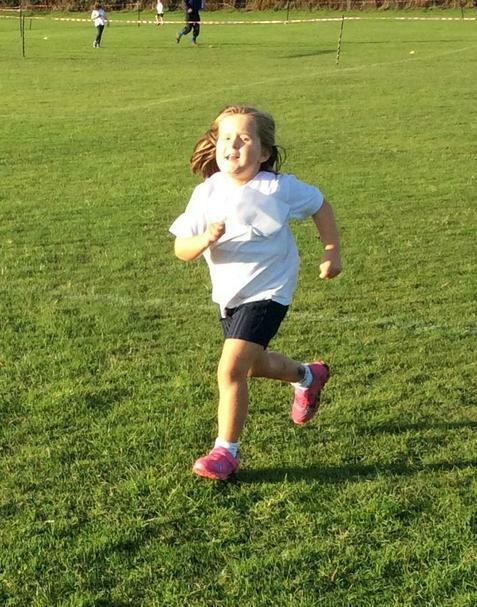 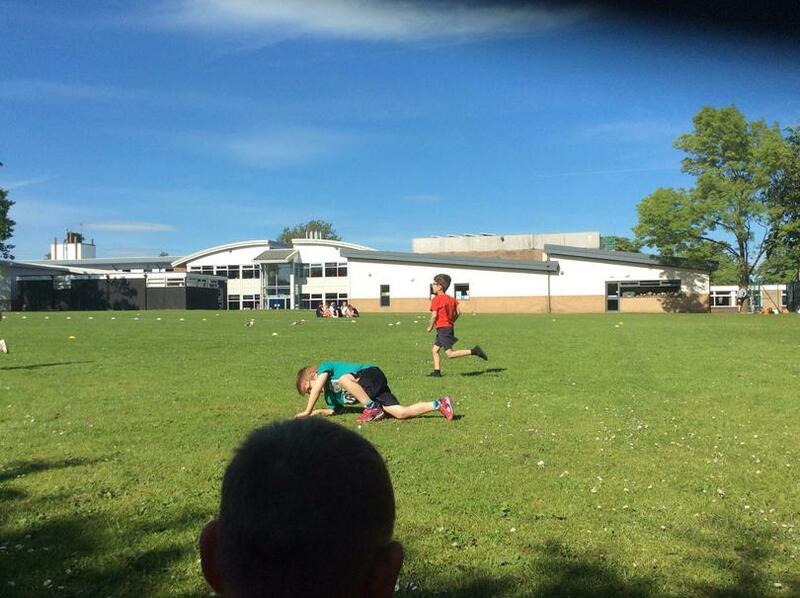 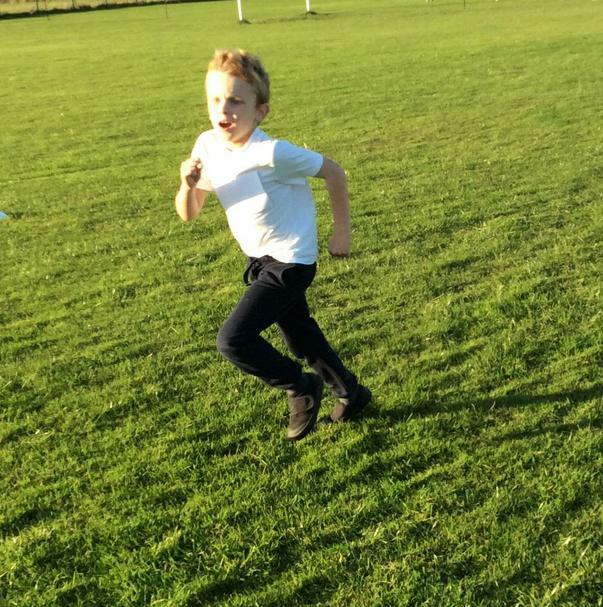 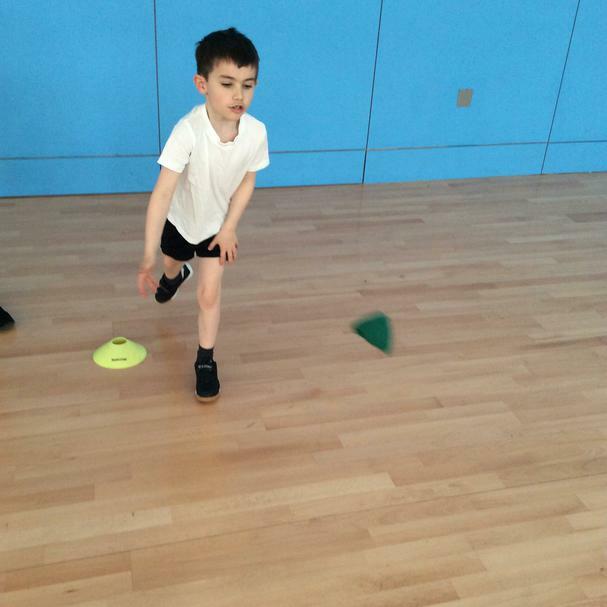 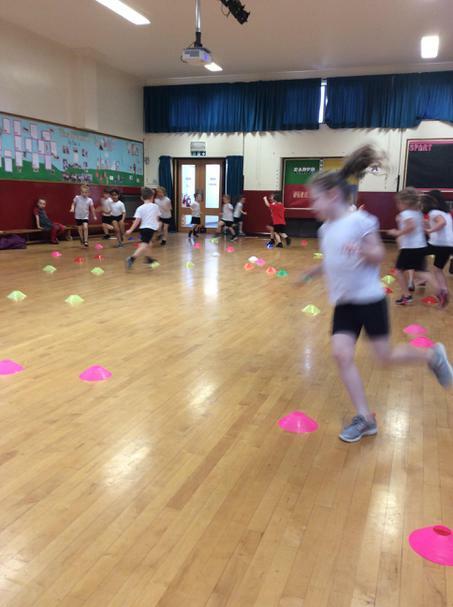 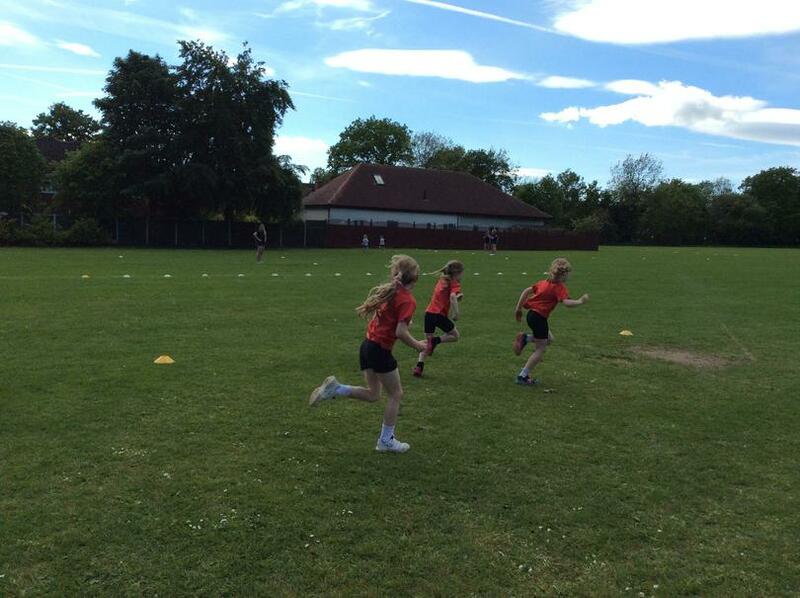 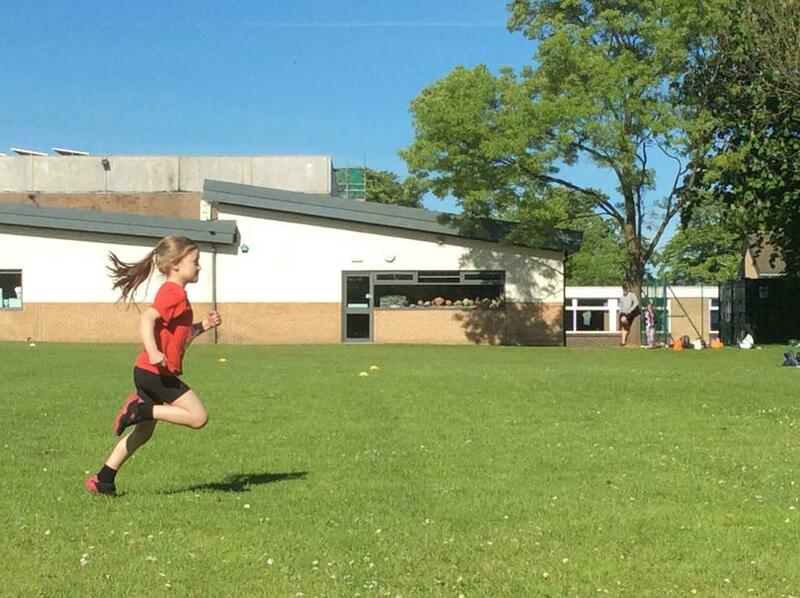 The children got to participate in lots of different athletic sporting activties, these included a jump, a throw, a long distance run and a sprint relay. 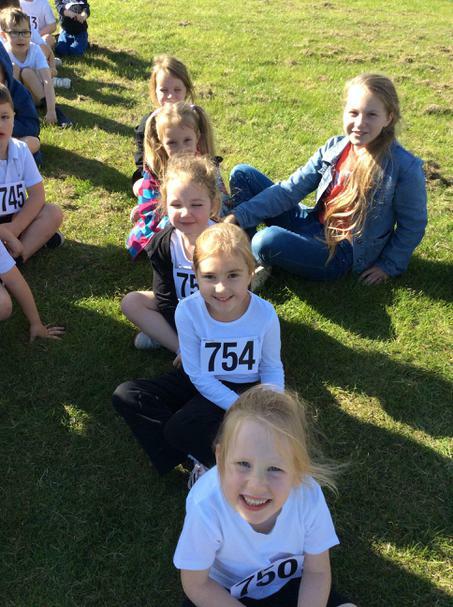 All the children had a wondeful time and we are so proud of them especially as they came first in the competition which means they go on to the national finals in York later on in the month. 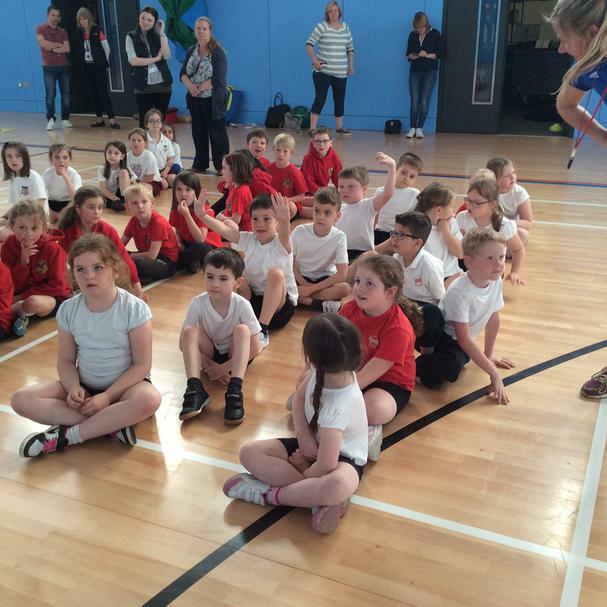 Well done children. 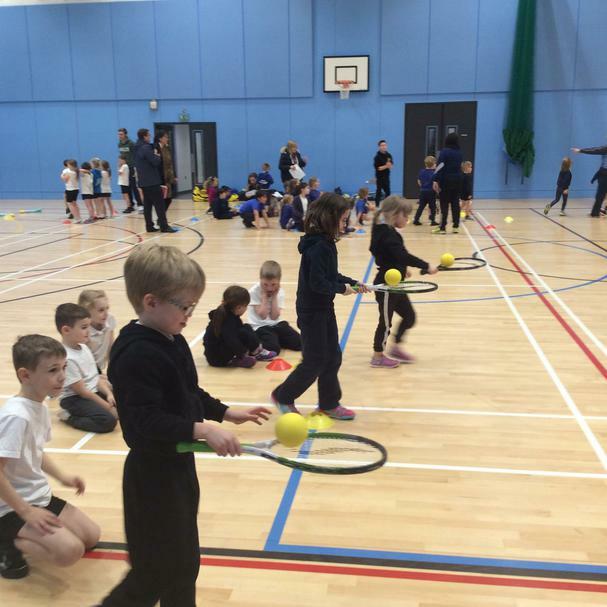 The Harrogate Schools Sports Partnership held a Change for Life Festival at the new sports centre at Harrogate High School. 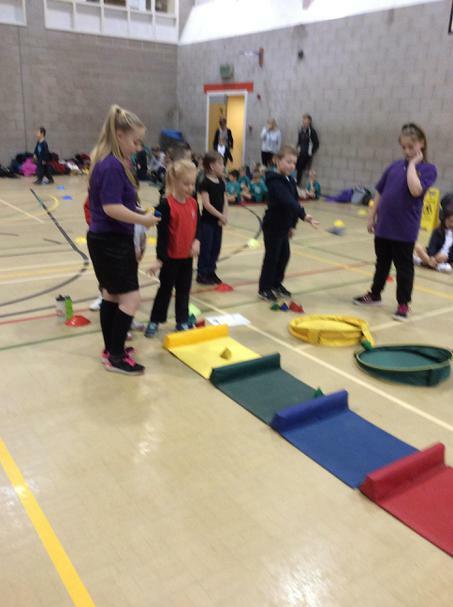 The children enjoyed taking part in new activities and working alongside other children from different schools. 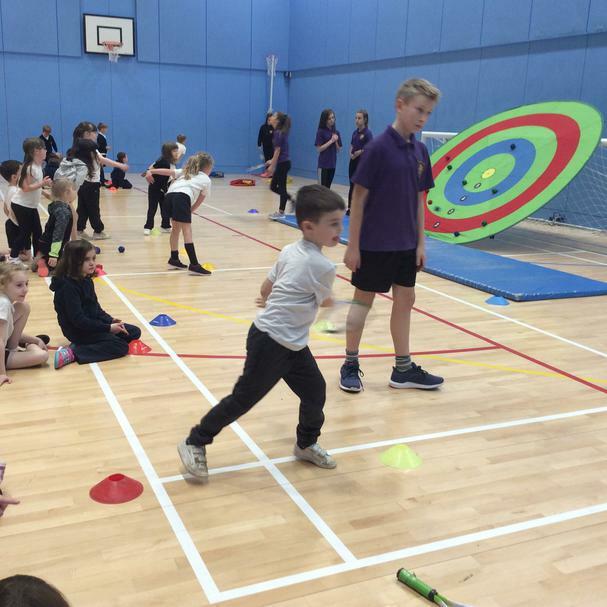 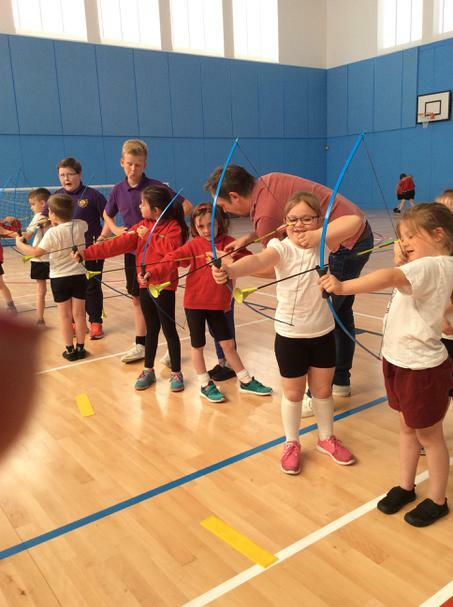 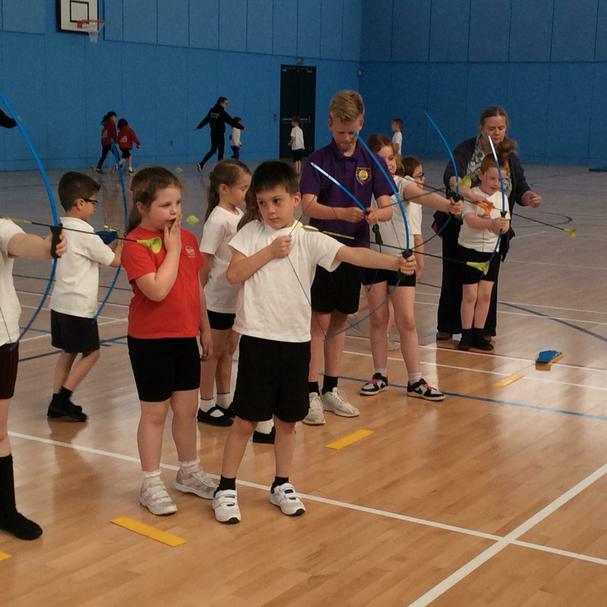 The activities were led by school sports leaders - the children were able to participate in push golf, curling, and archery. 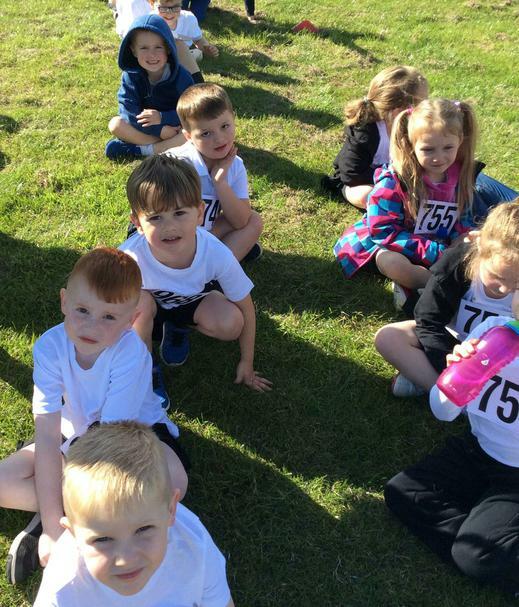 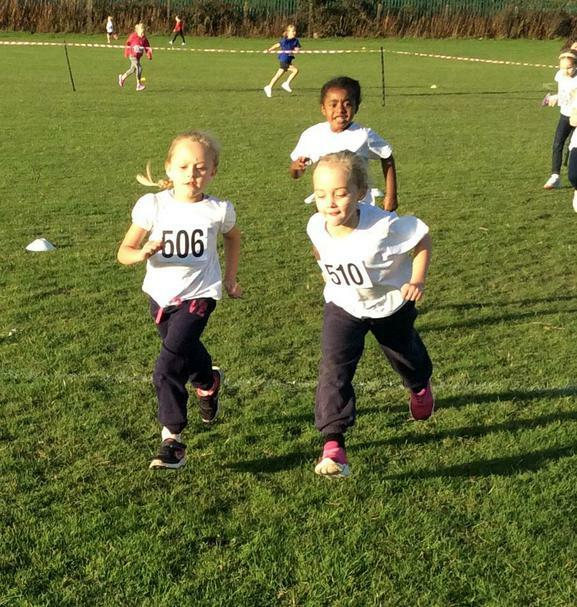 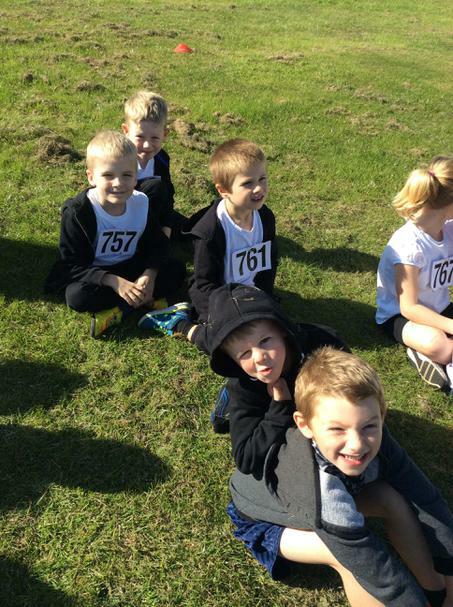 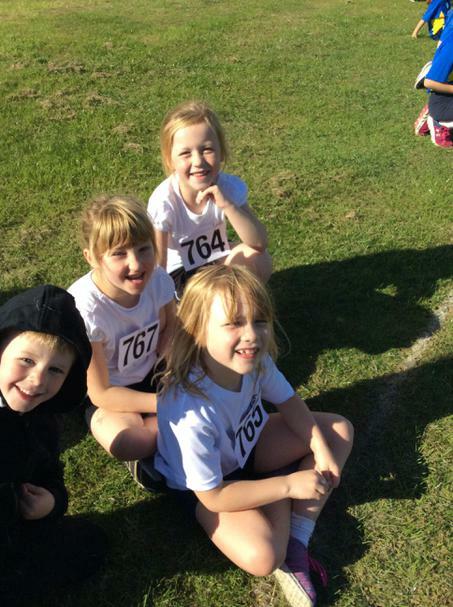 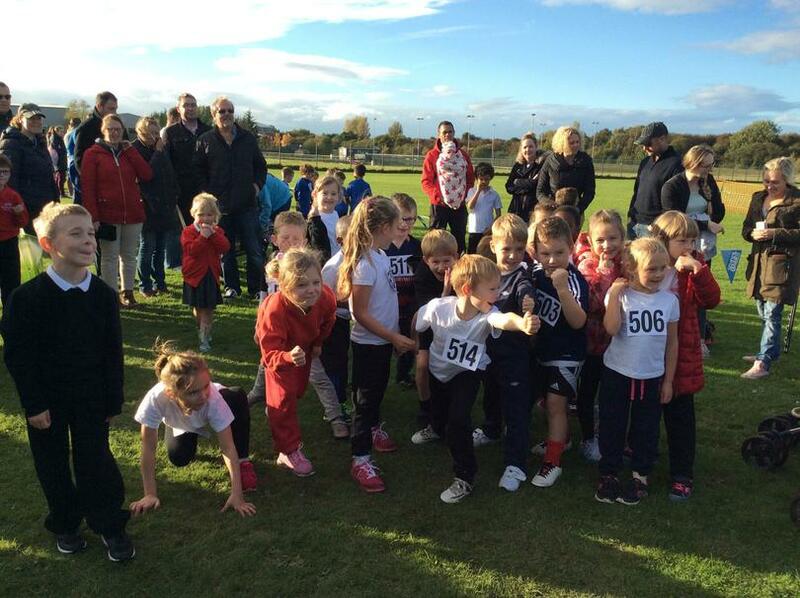 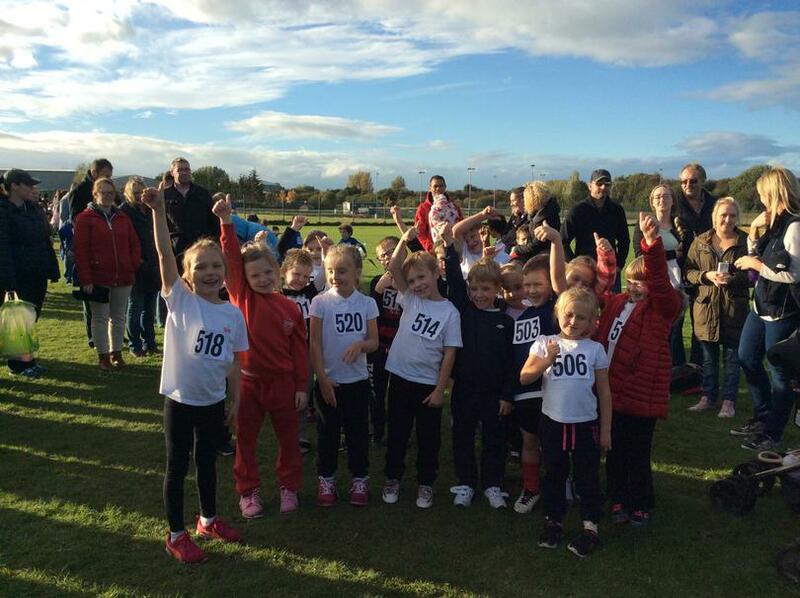 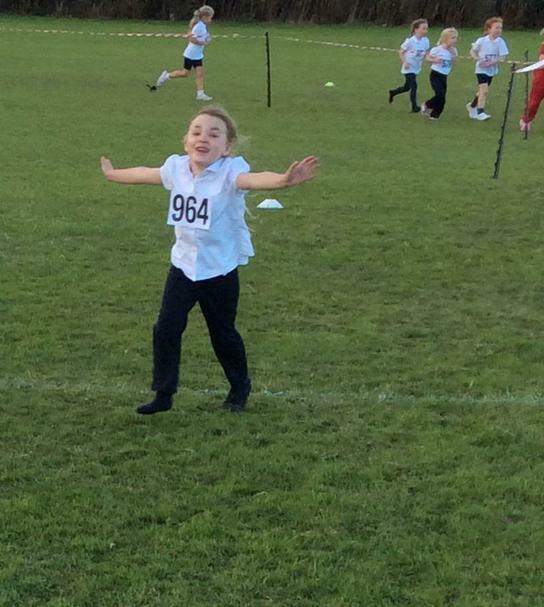 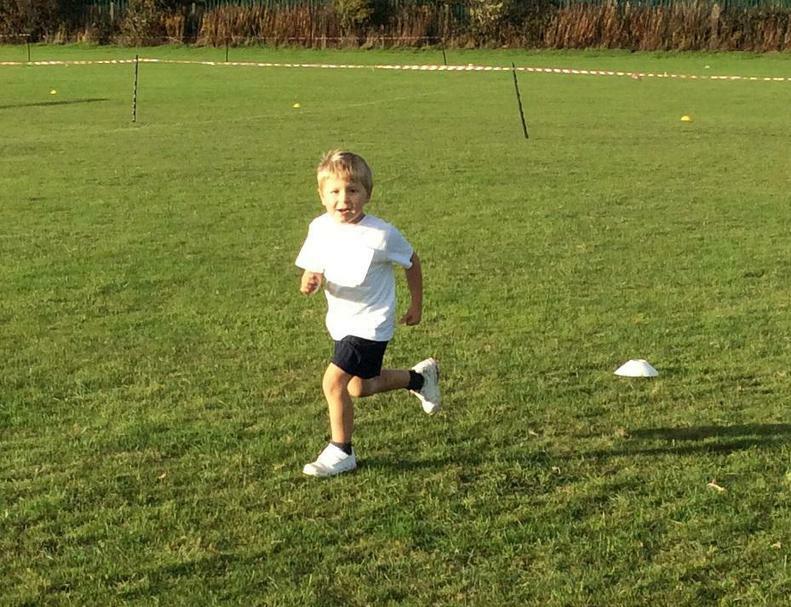 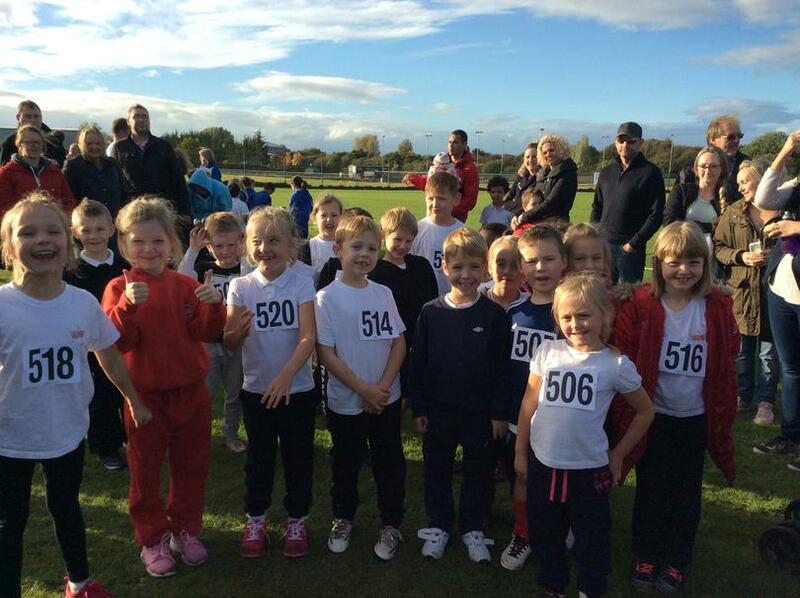 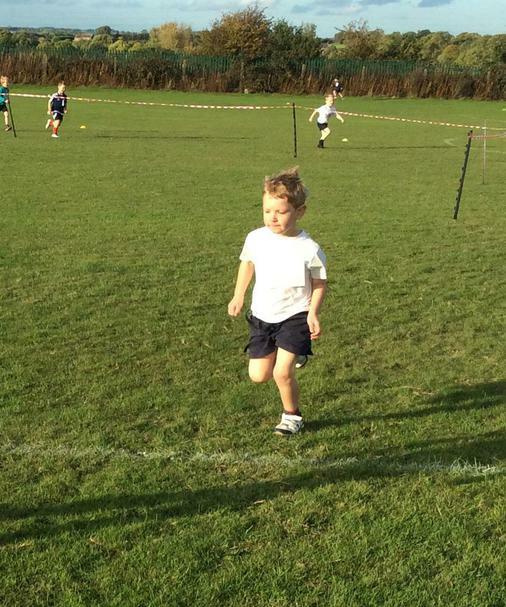 The children from Year 1 and 2 had a great time competing in the Cross Country Competition held at Harrogate High School. 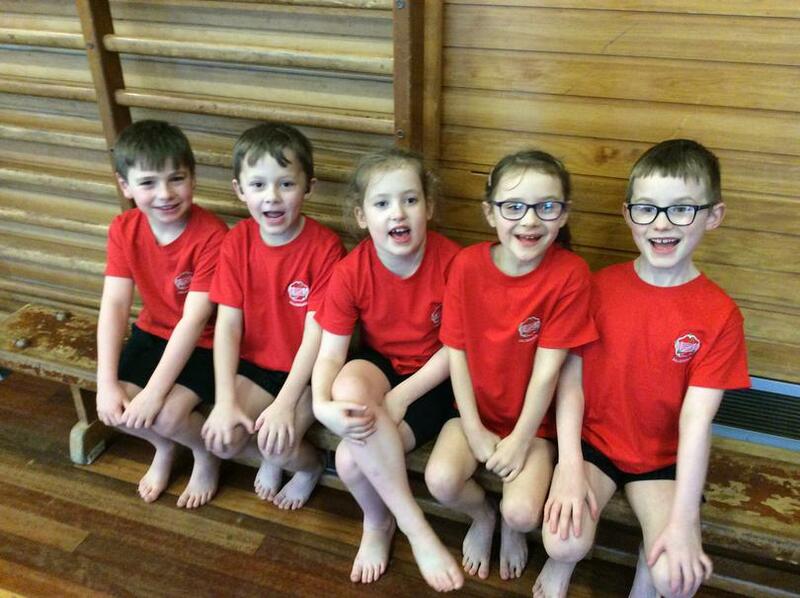 All of the children put on an amazing performance and we even had a 1st and a 3rd winner overall in the competition. 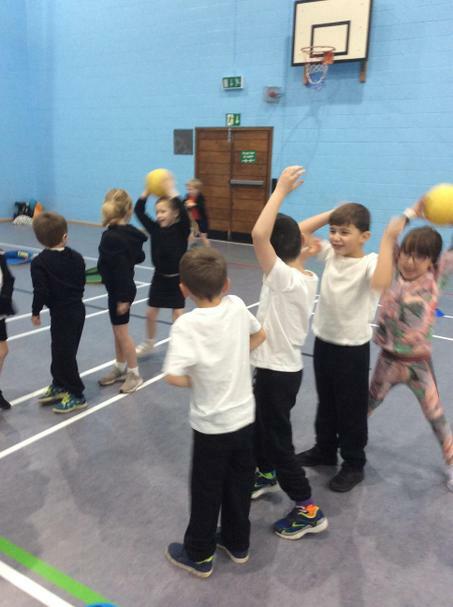 The children had a wonderful time trying out new sporting activities such as curling, target practice, side jumping and target football. 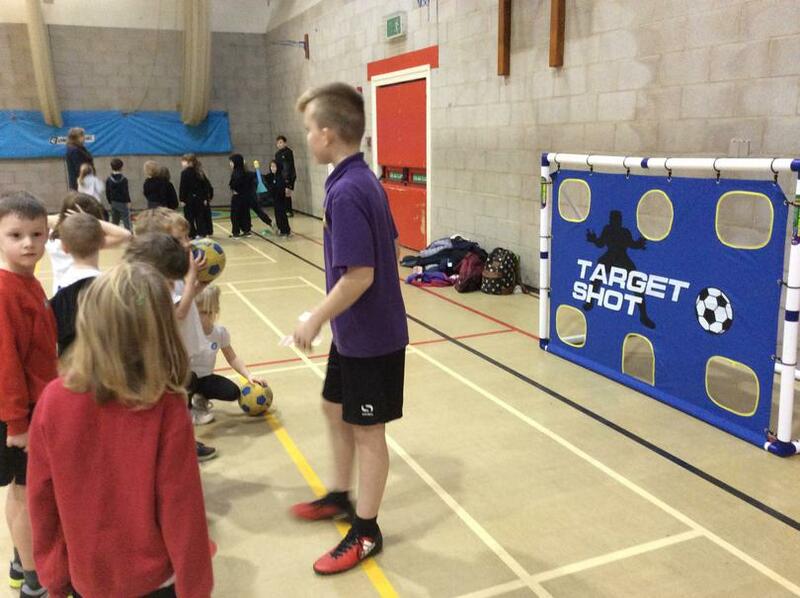 Many thanks to the sports leaders of Harrogate High School who supported the children during the afternoon. 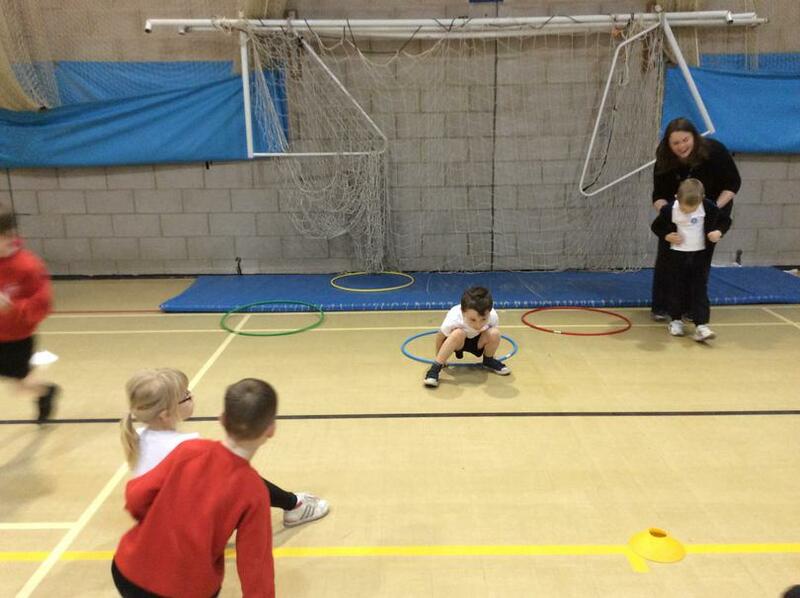 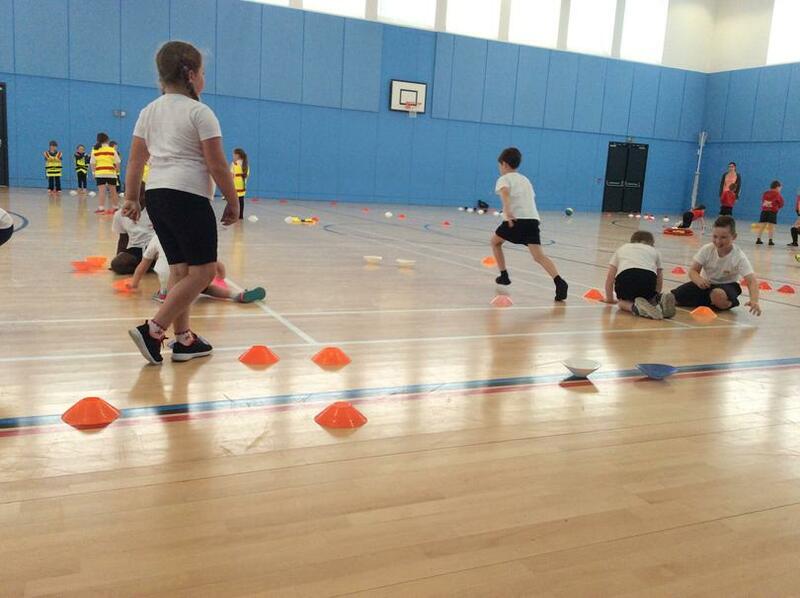 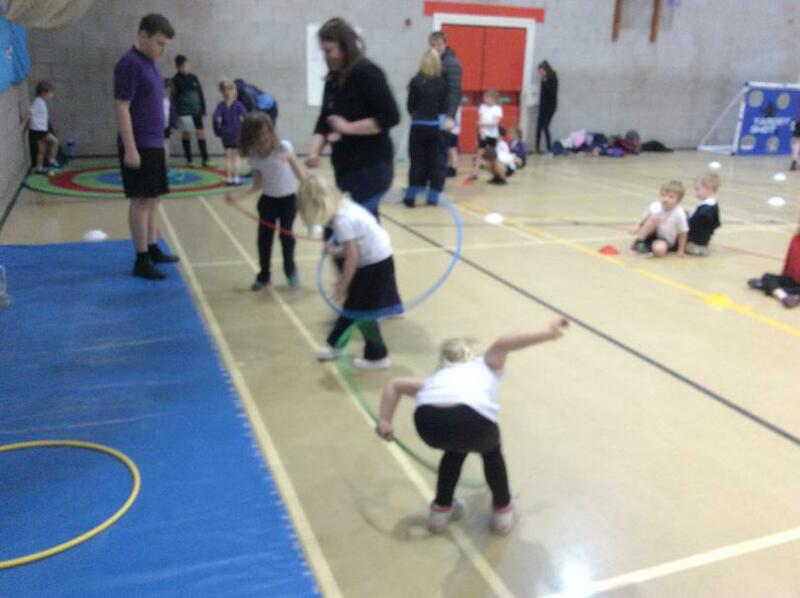 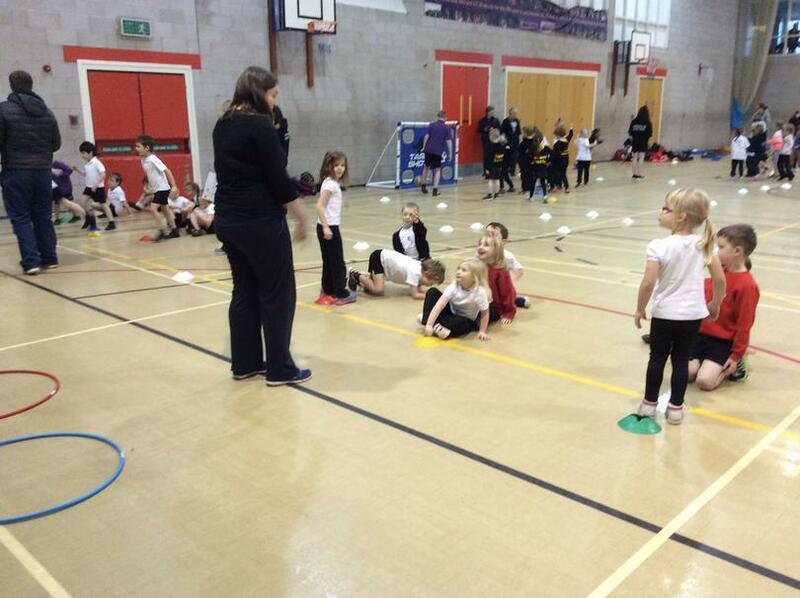 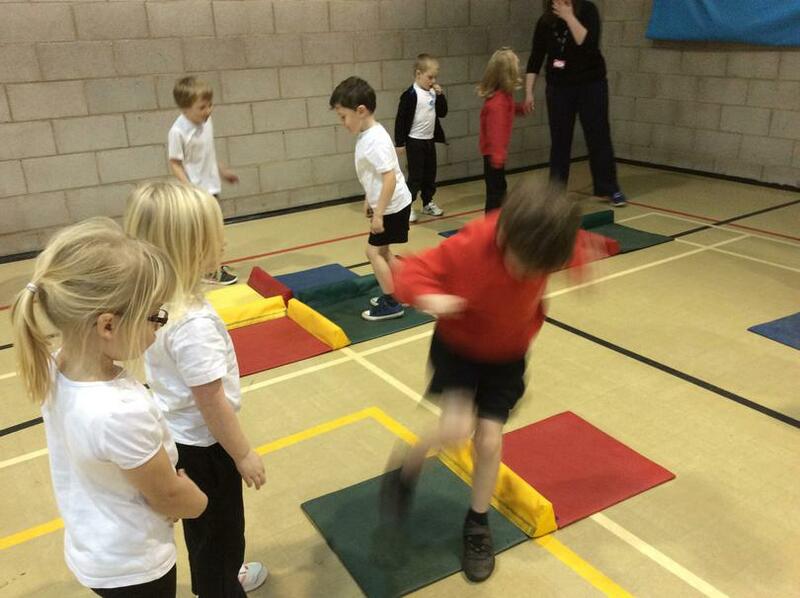 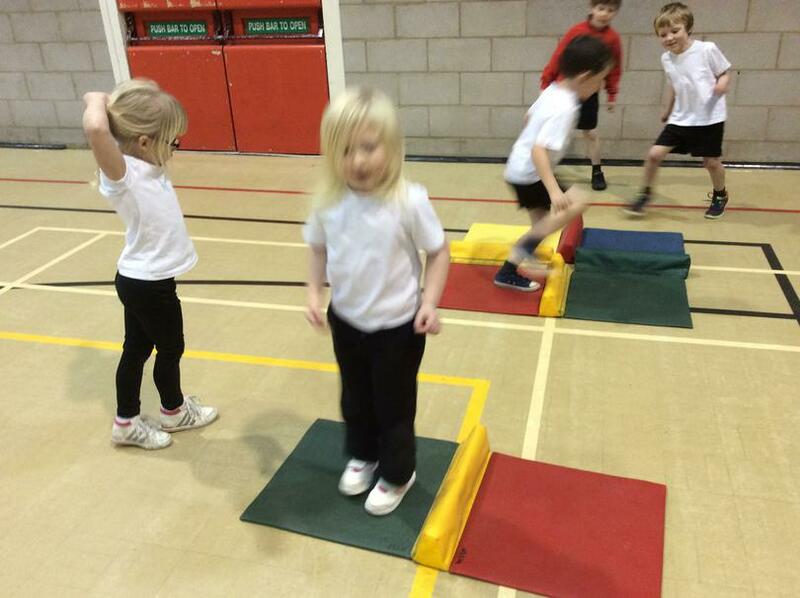 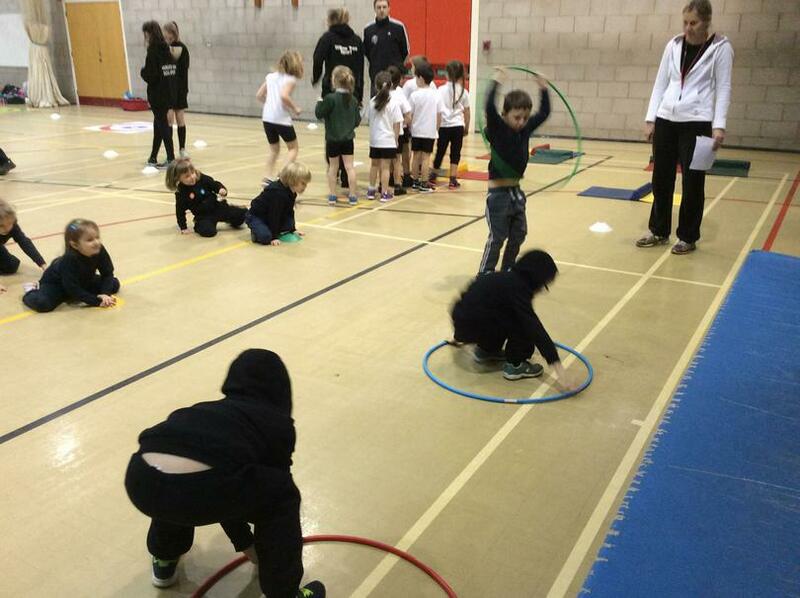 The Year Two children enjoyed taking part in The Infant Agility Festival. 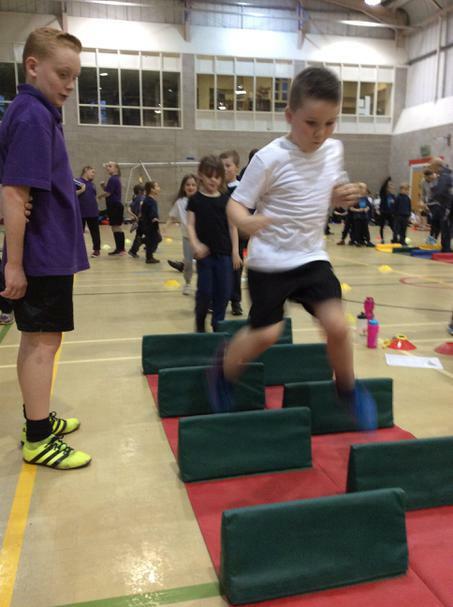 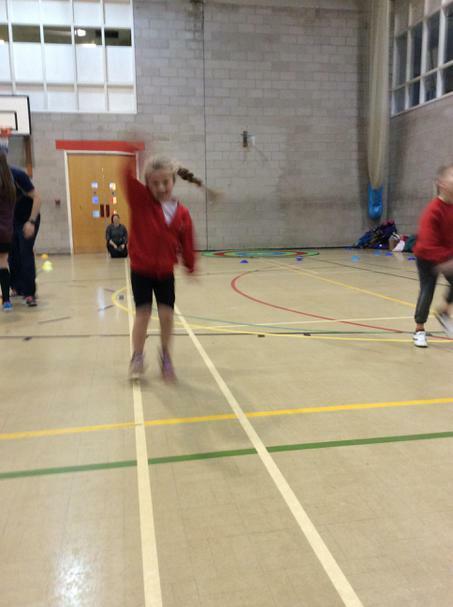 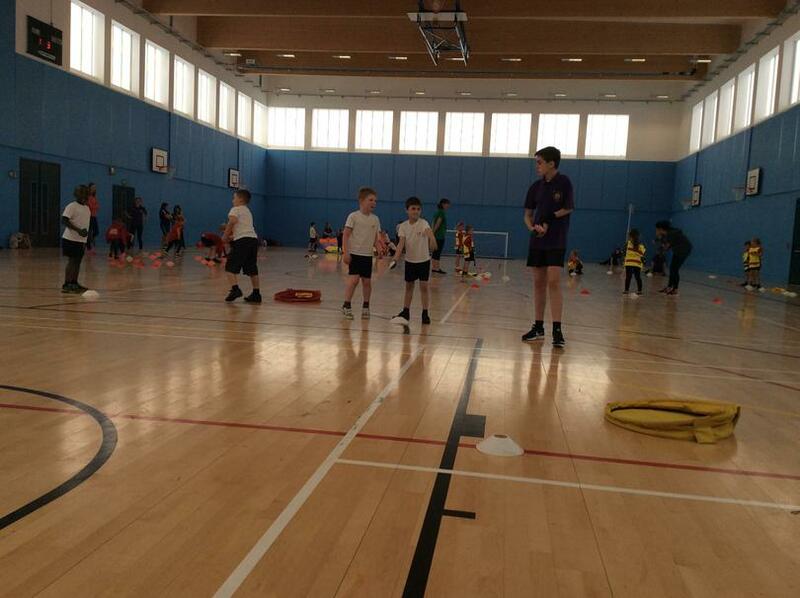 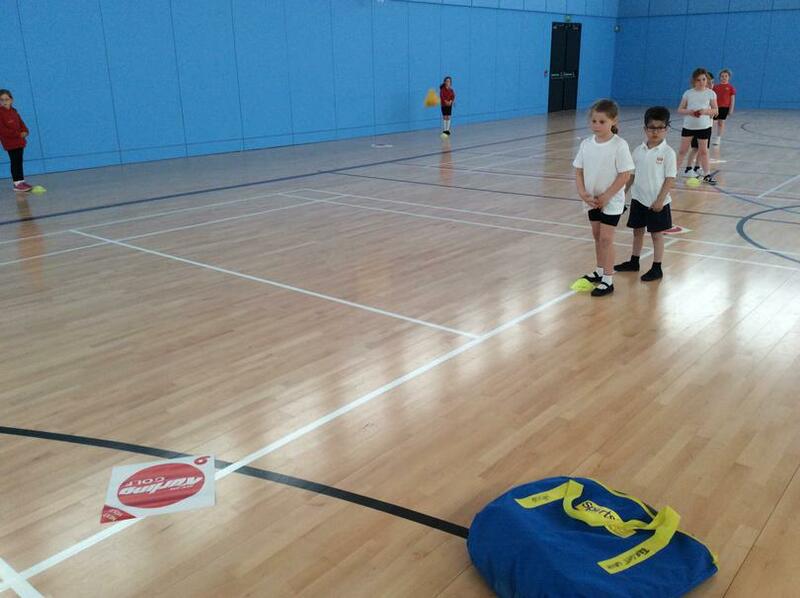 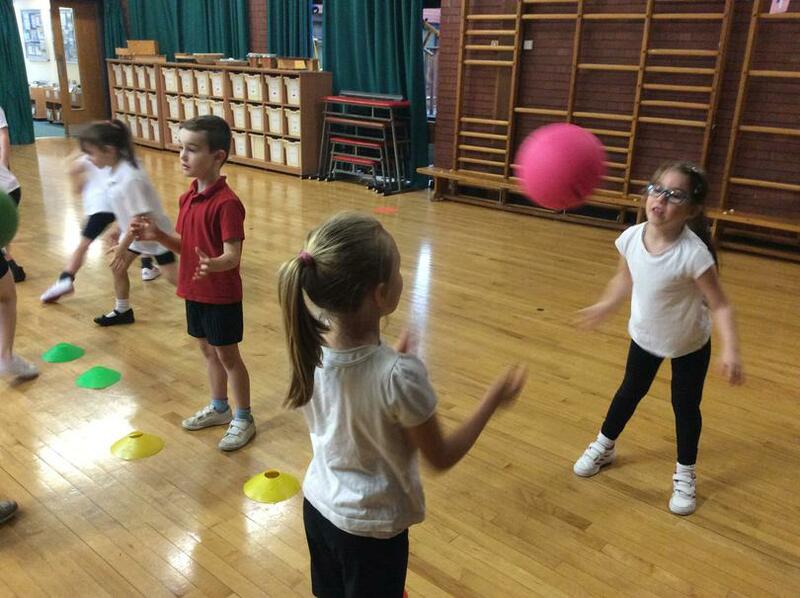 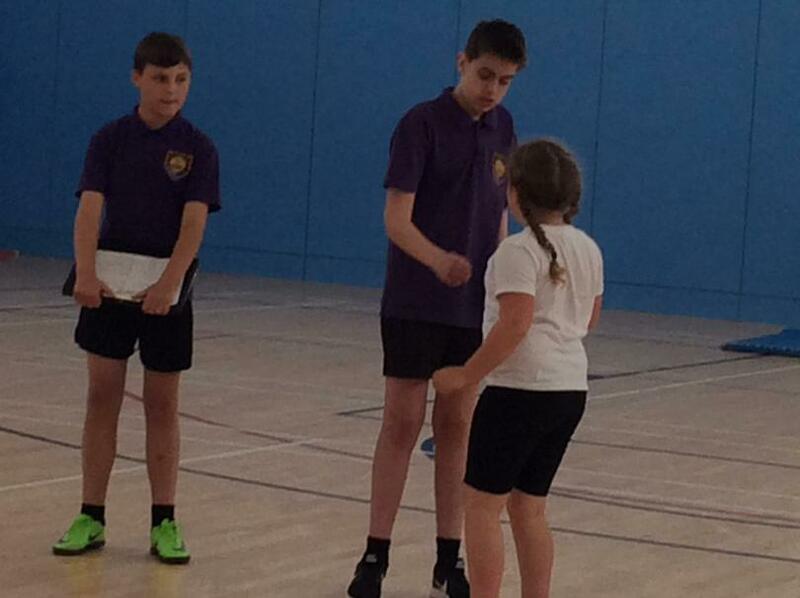 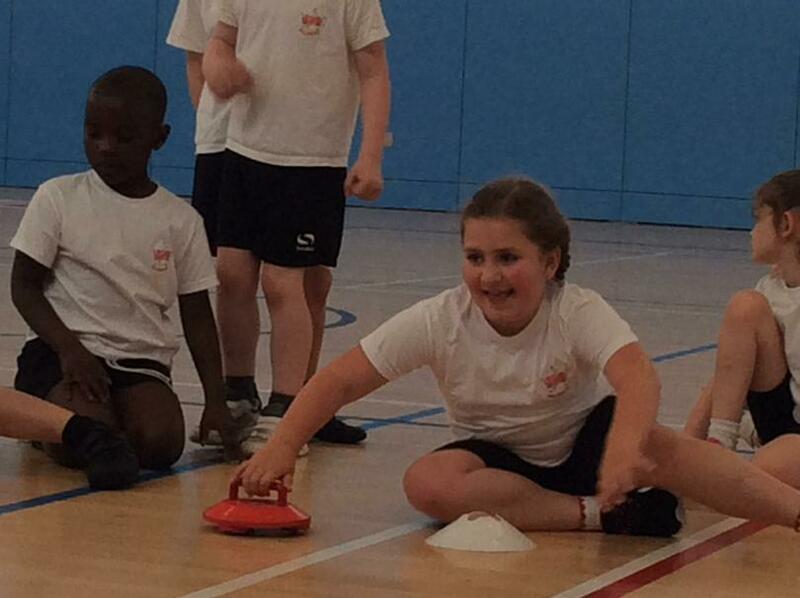 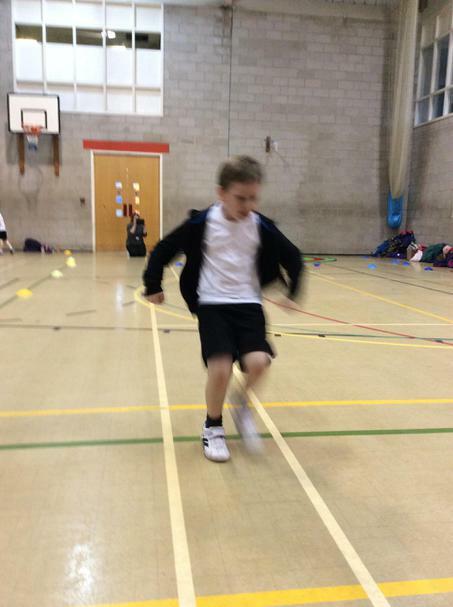 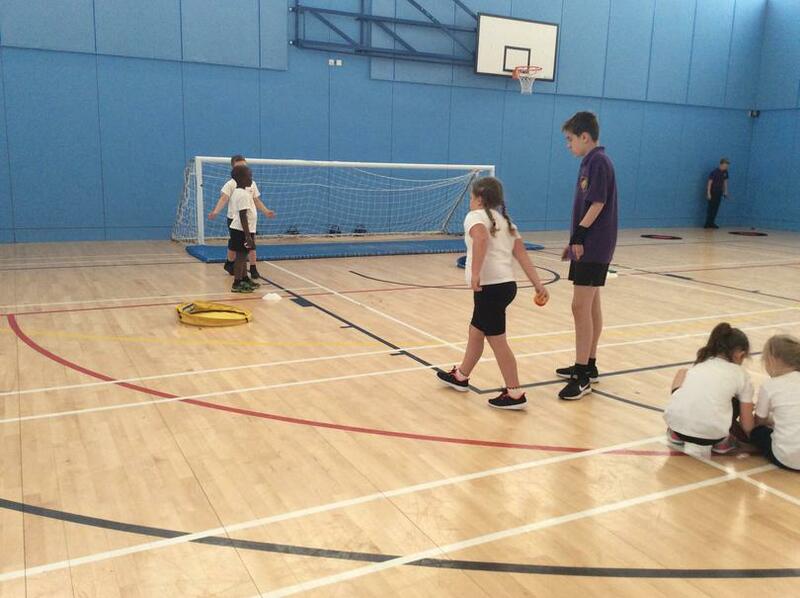 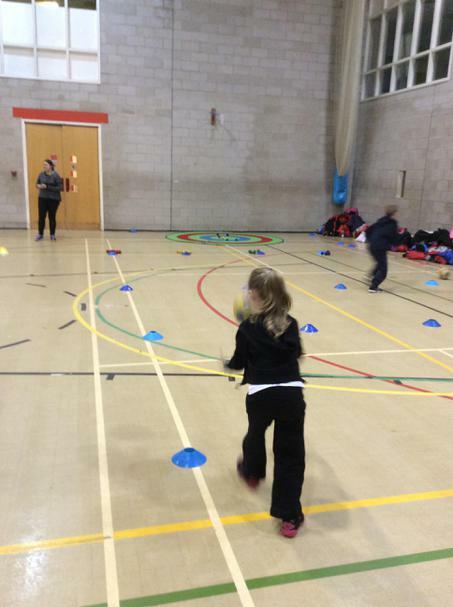 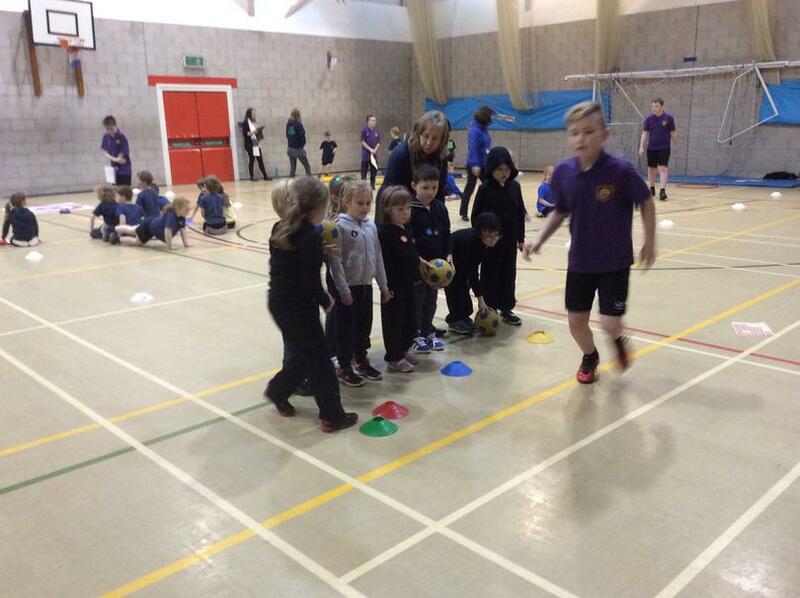 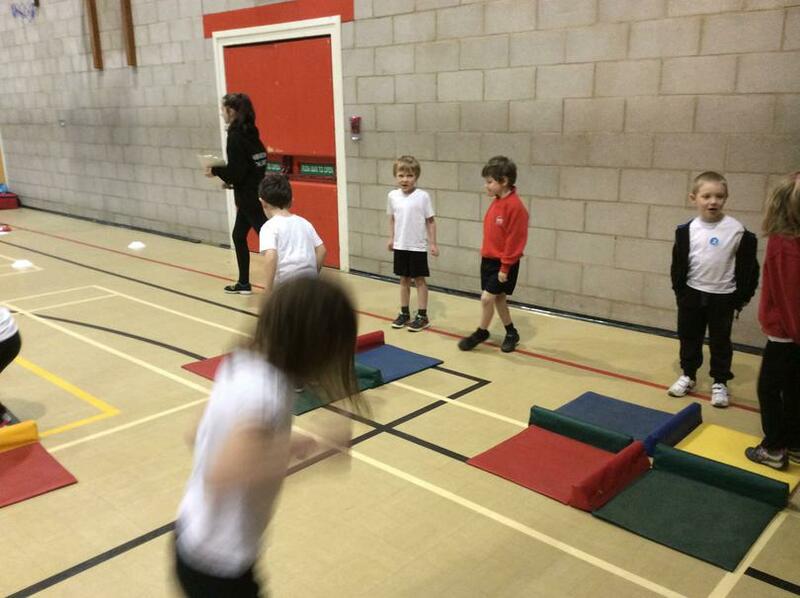 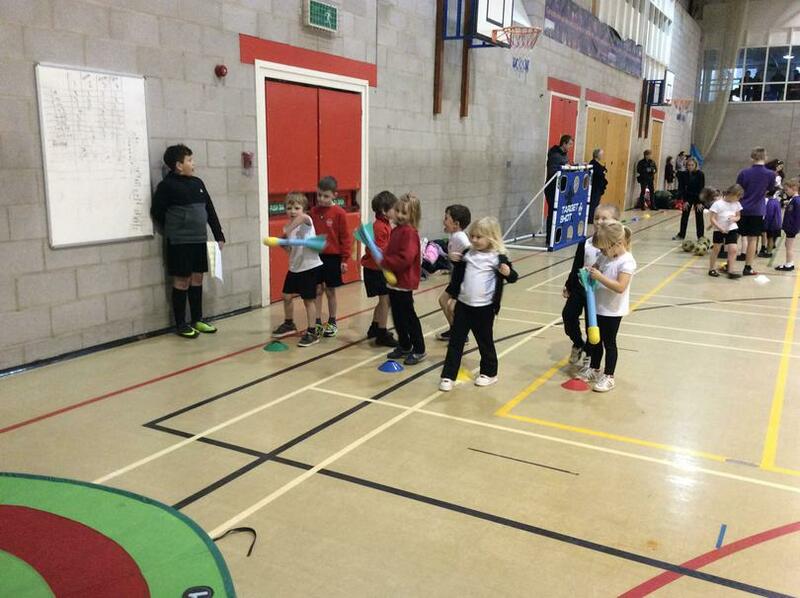 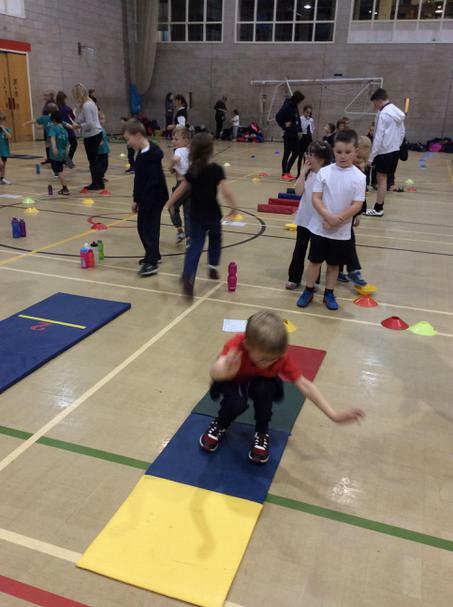 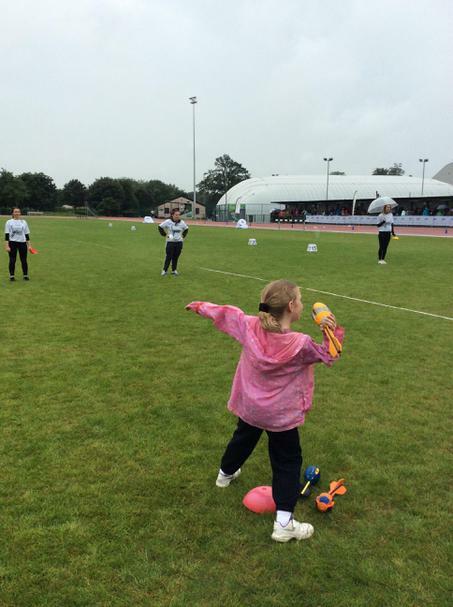 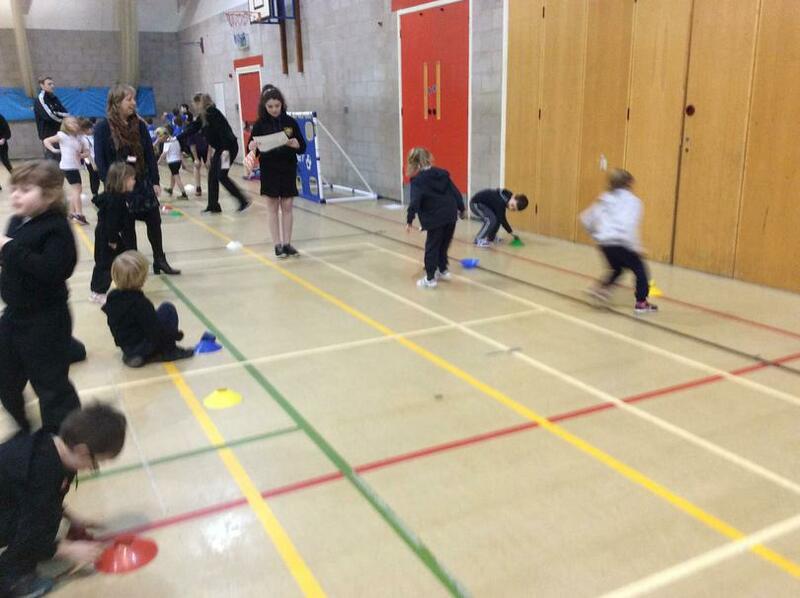 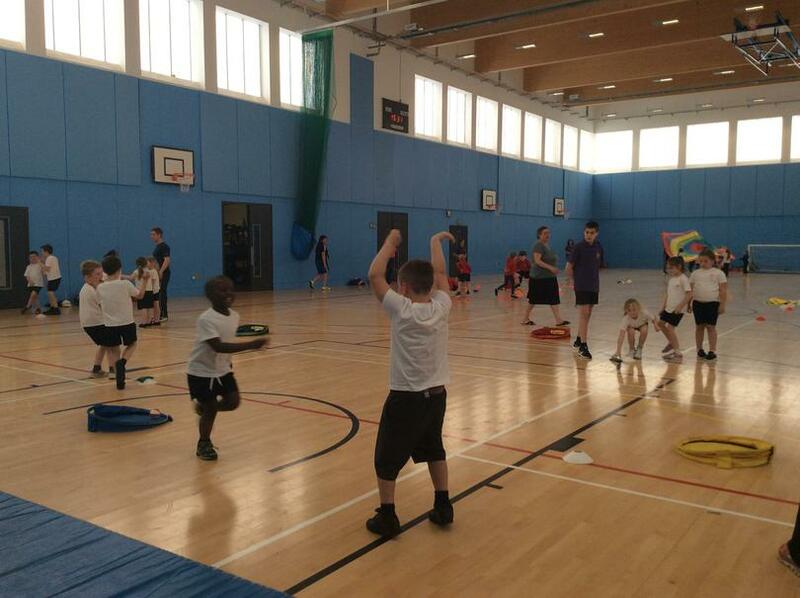 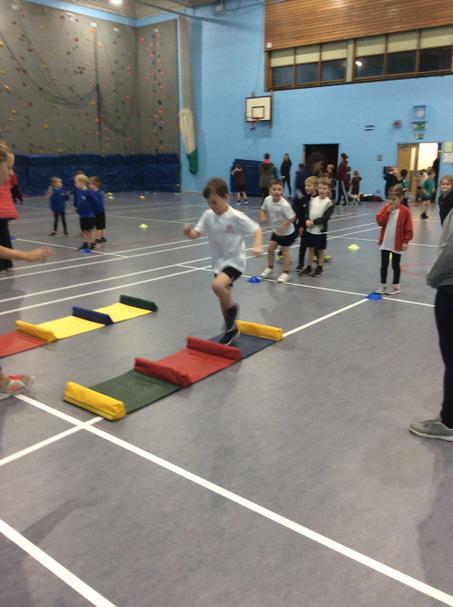 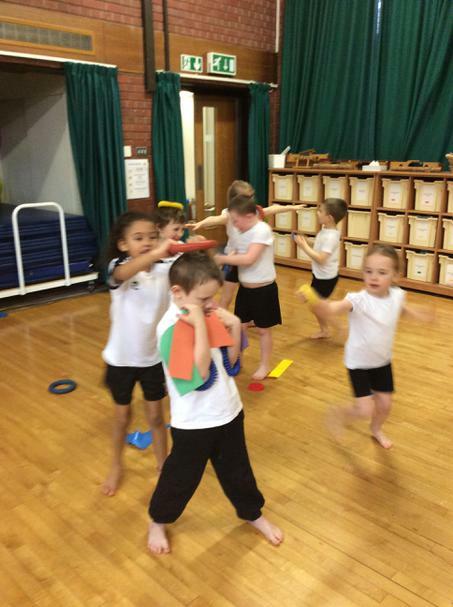 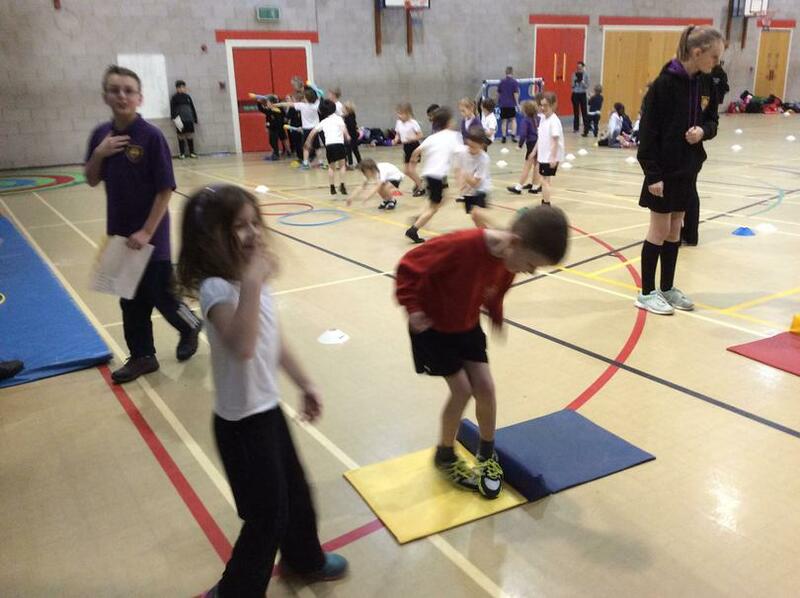 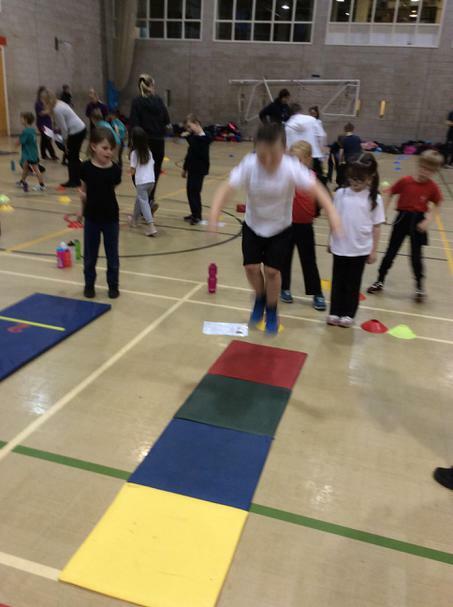 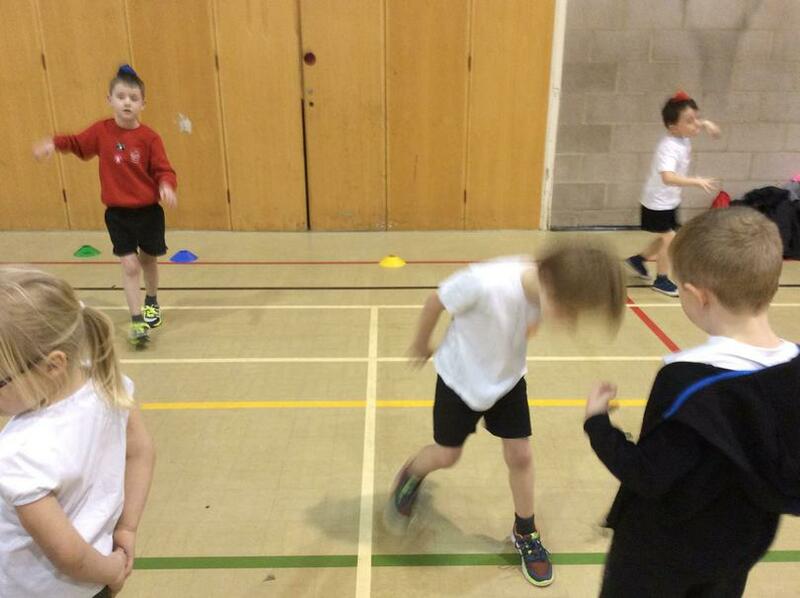 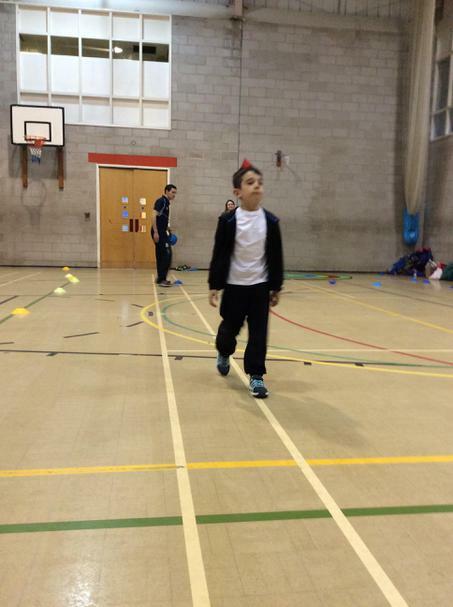 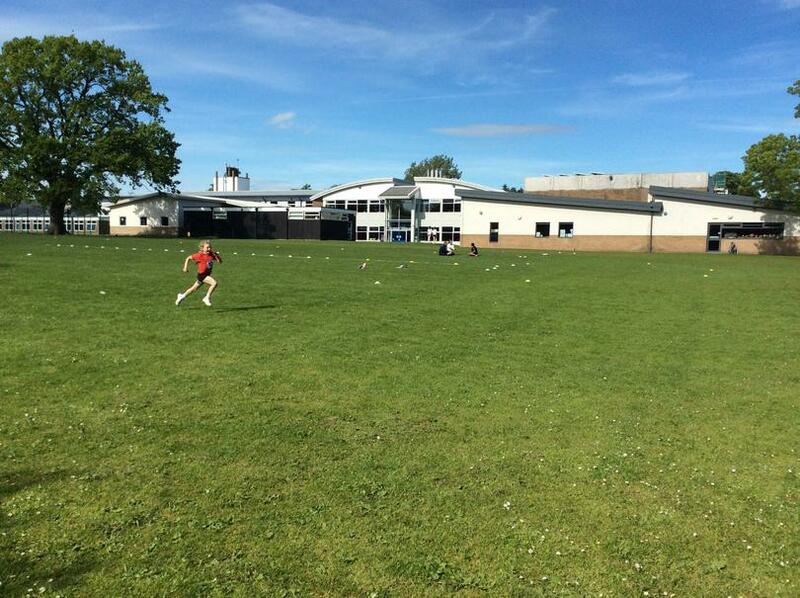 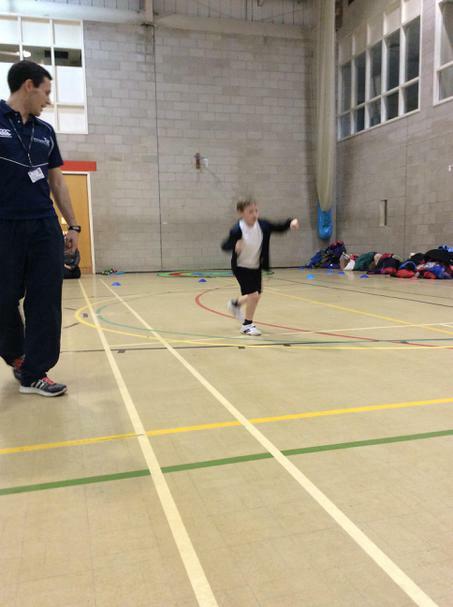 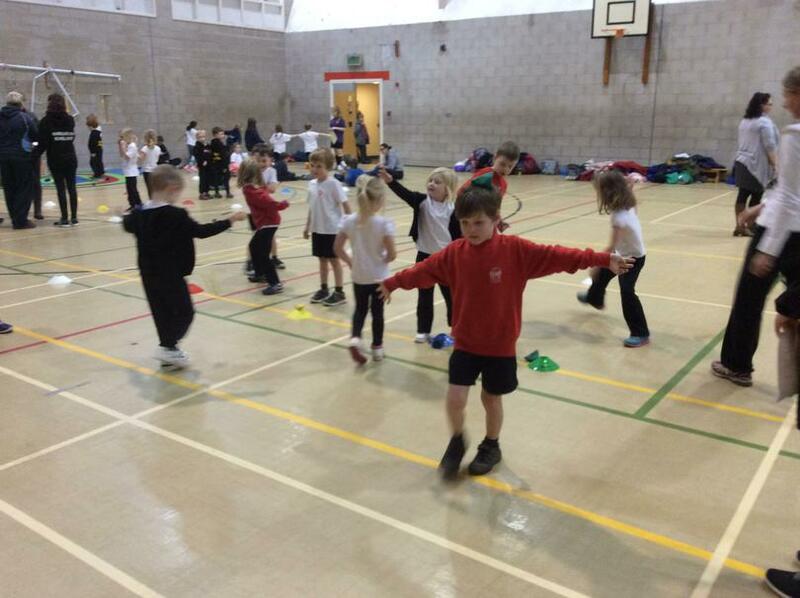 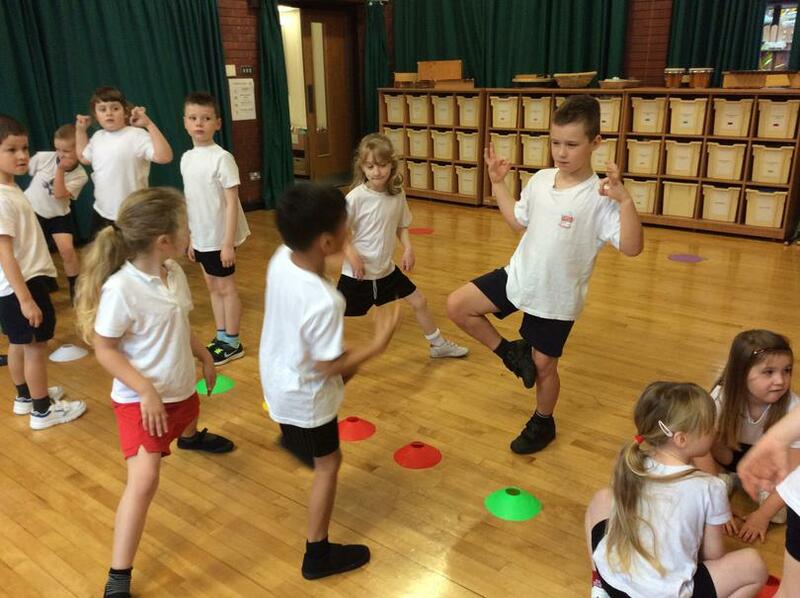 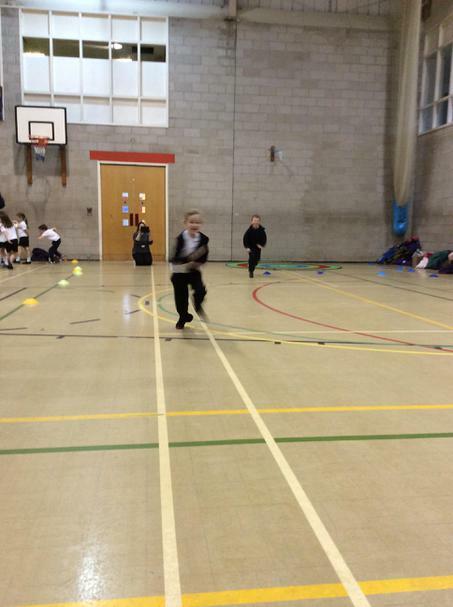 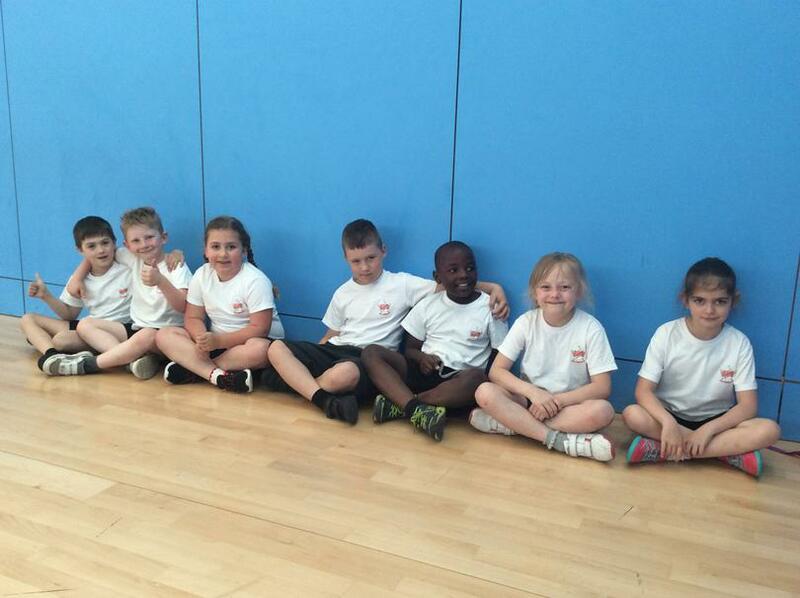 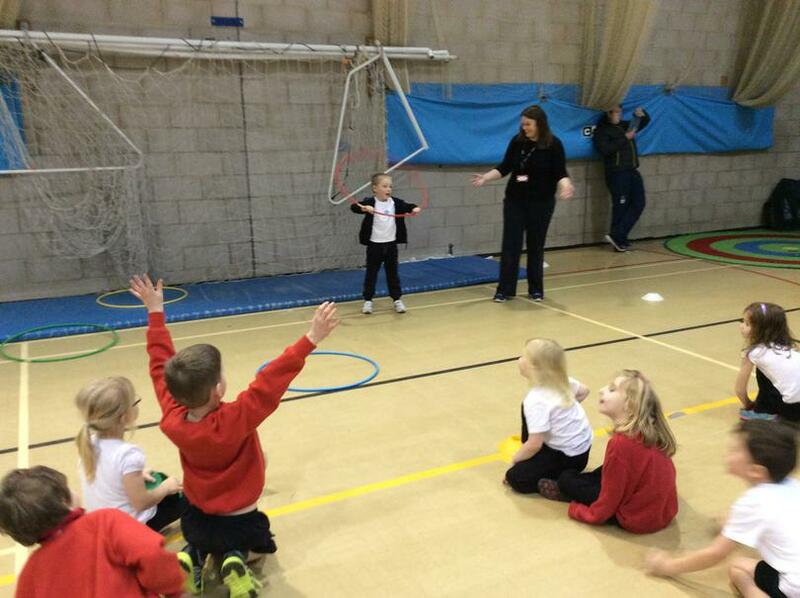 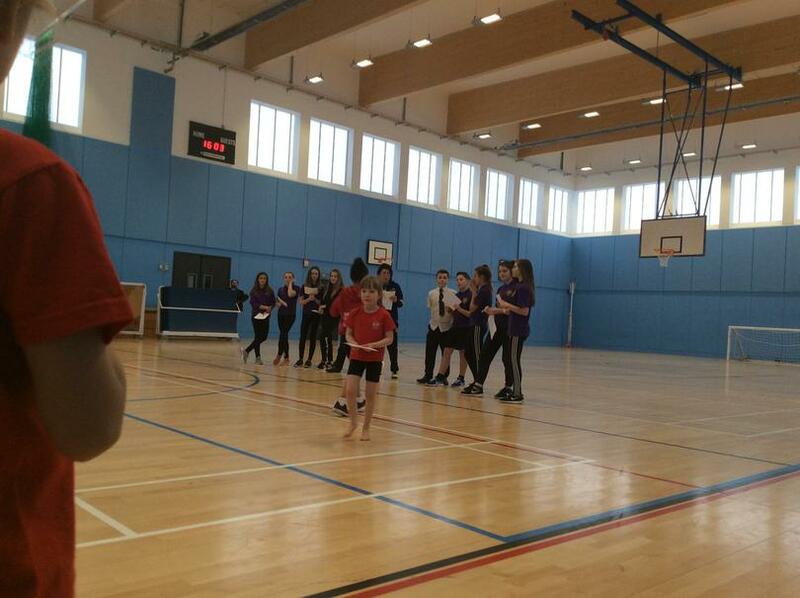 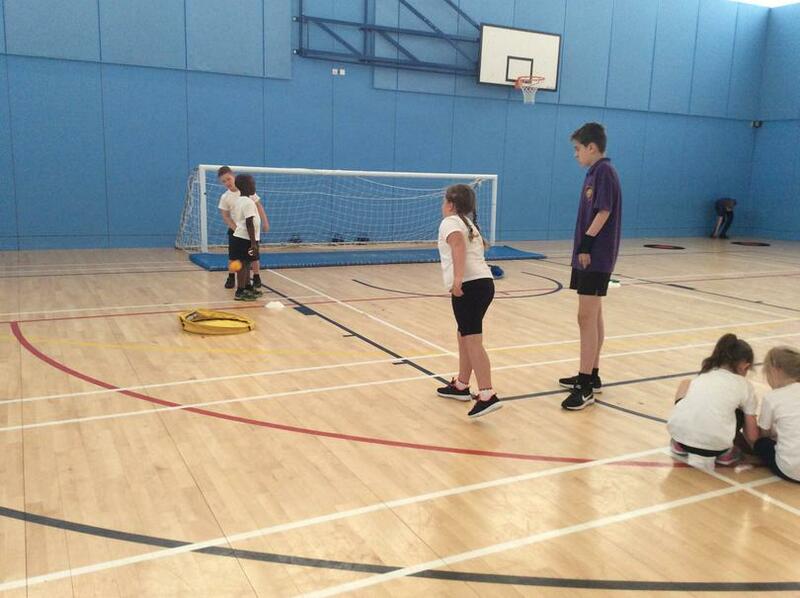 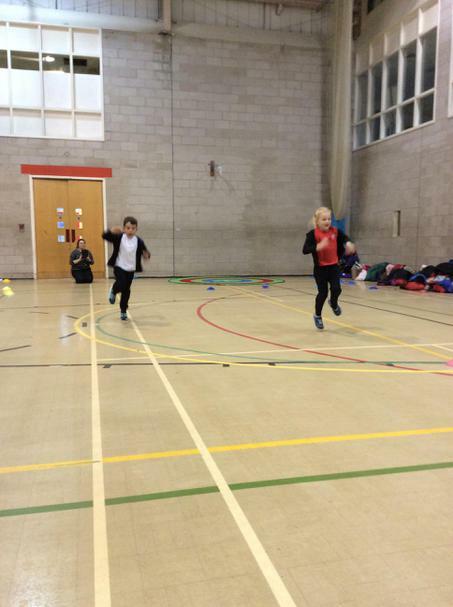 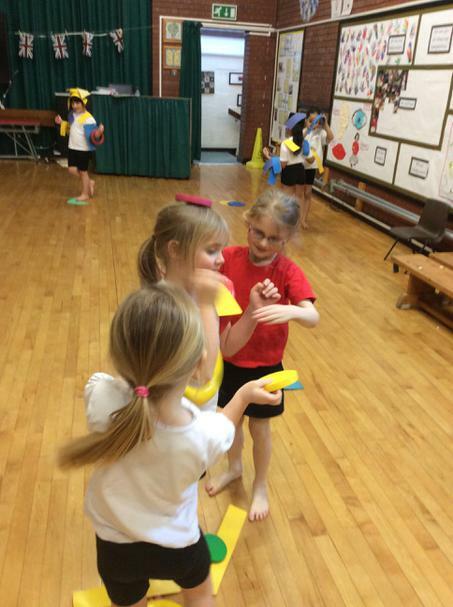 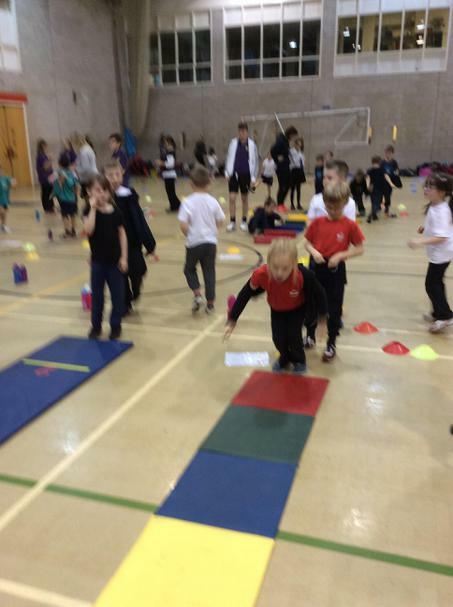 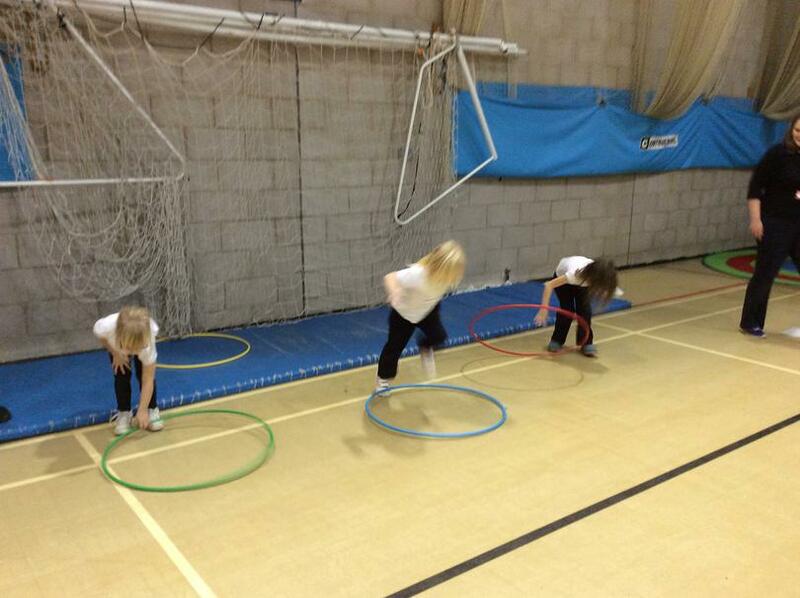 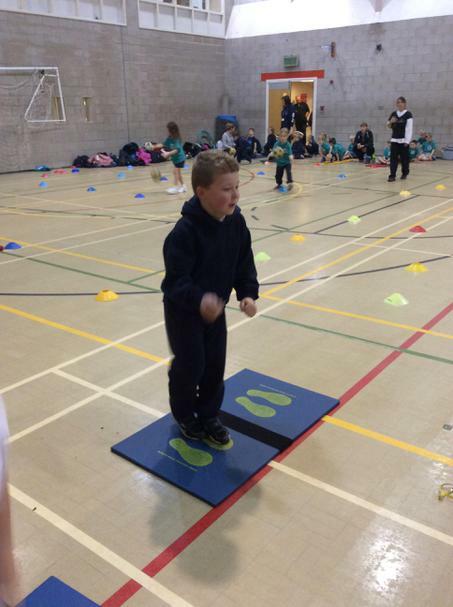 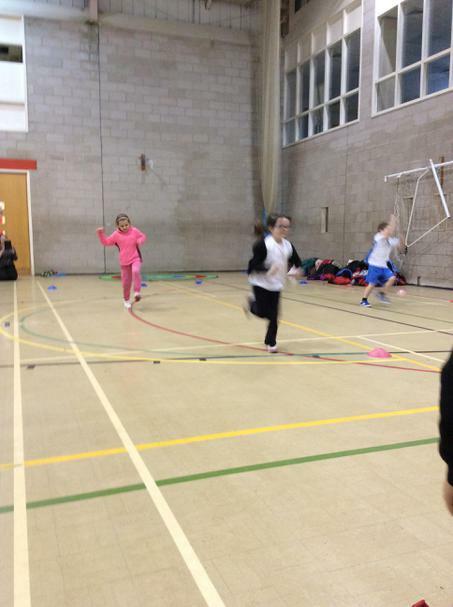 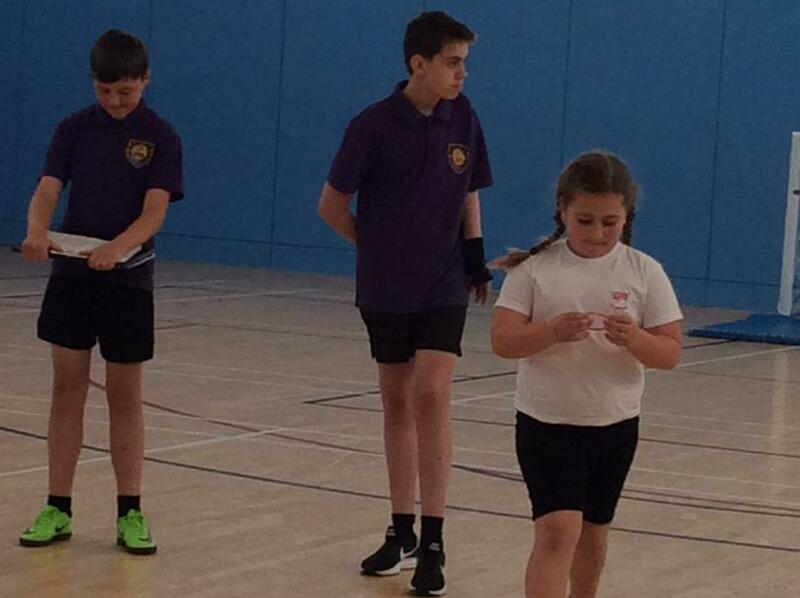 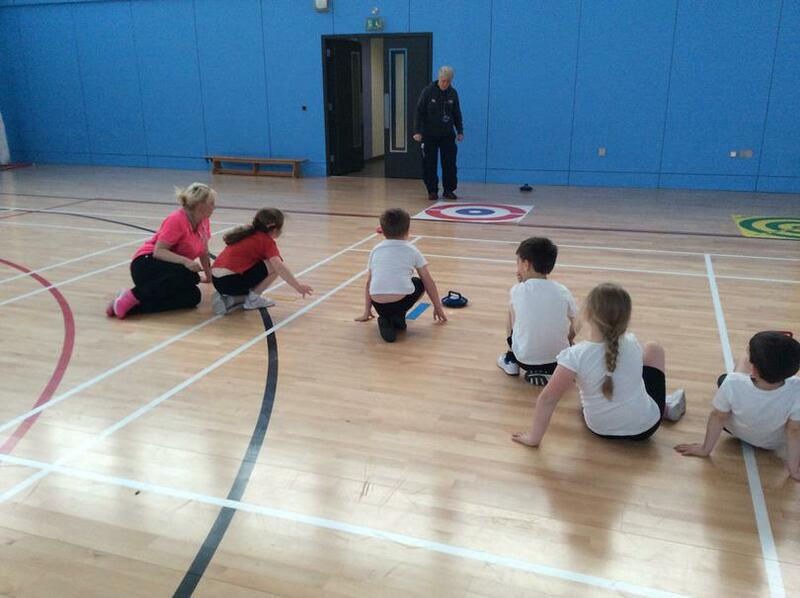 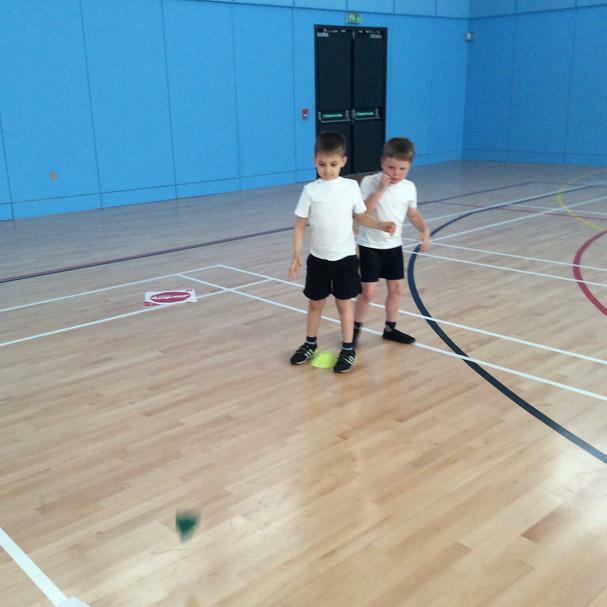 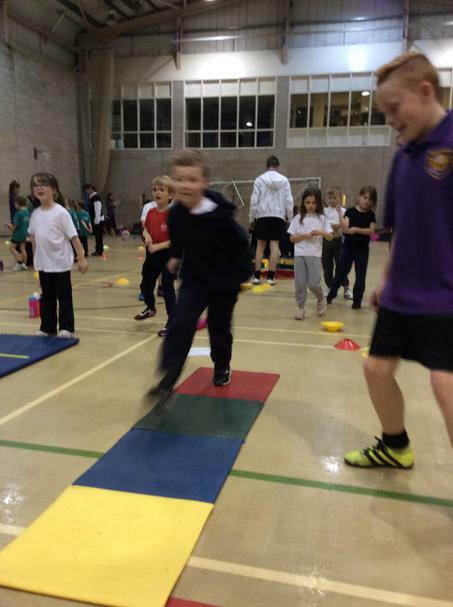 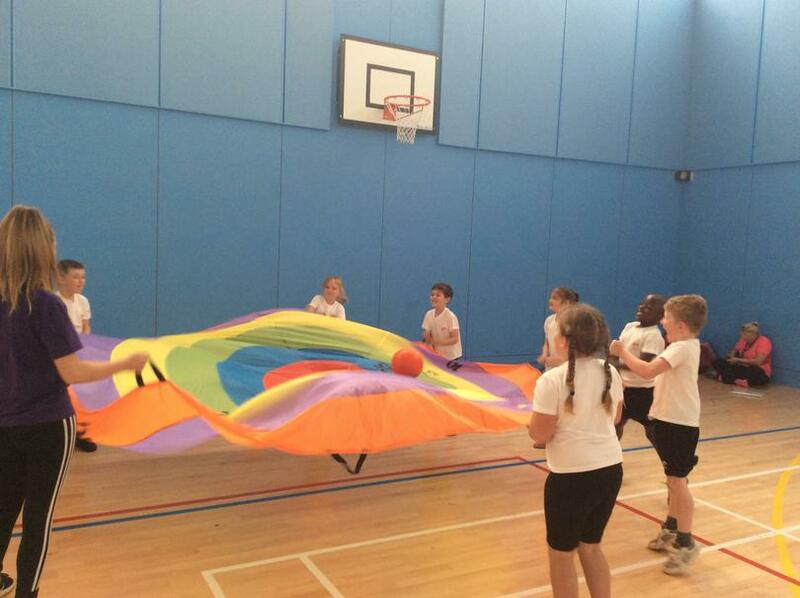 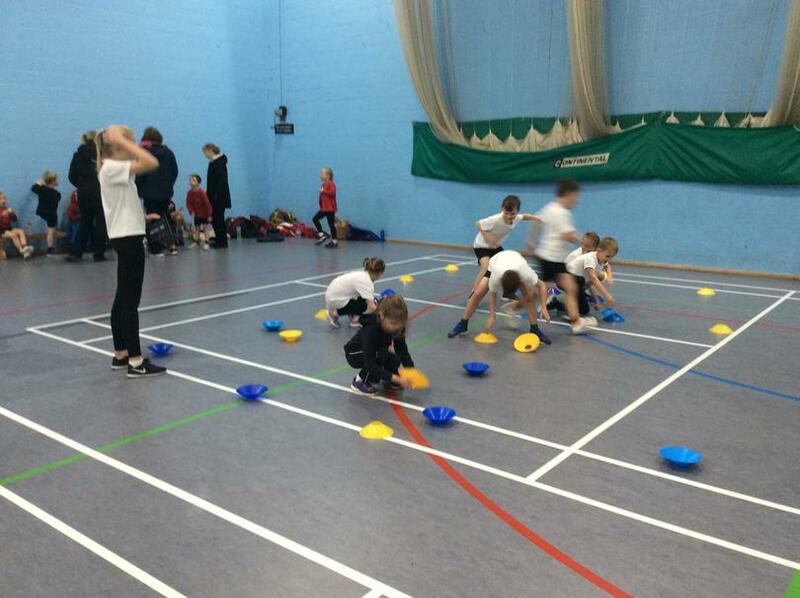 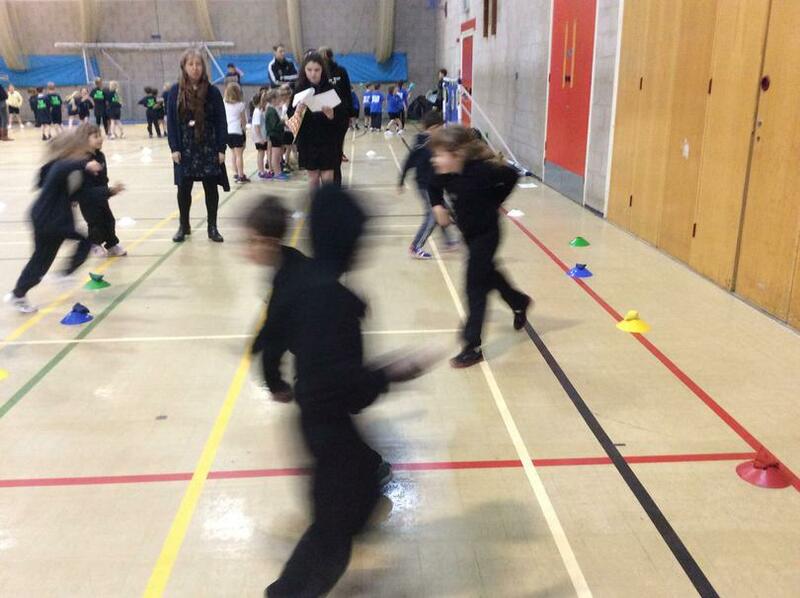 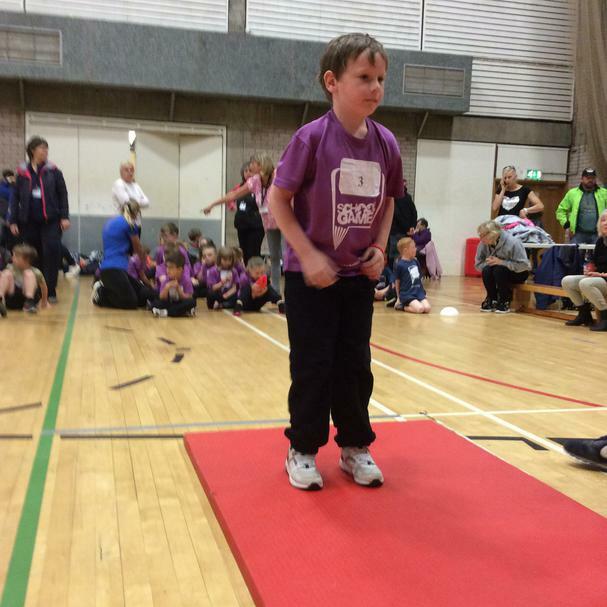 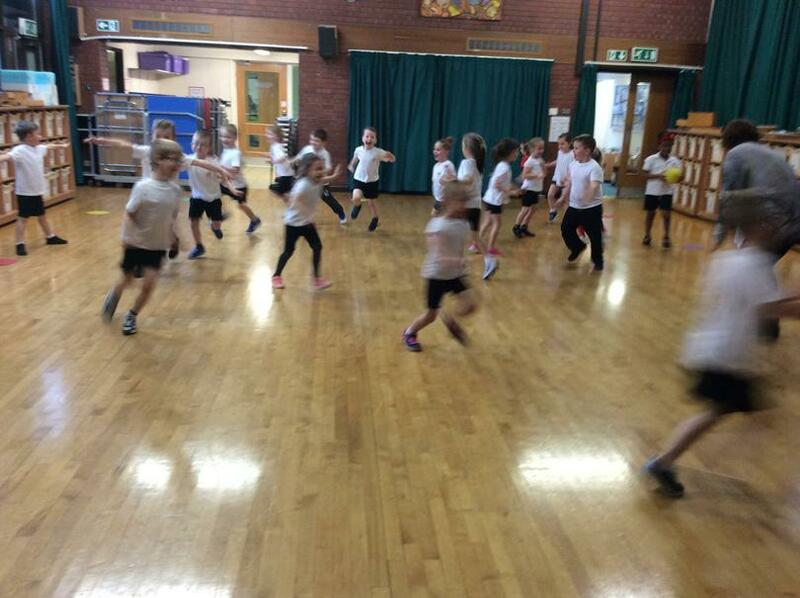 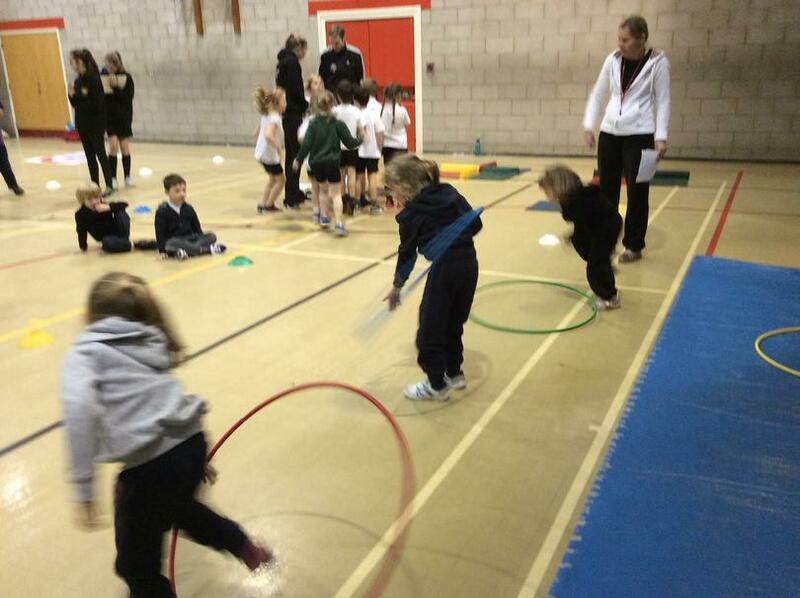 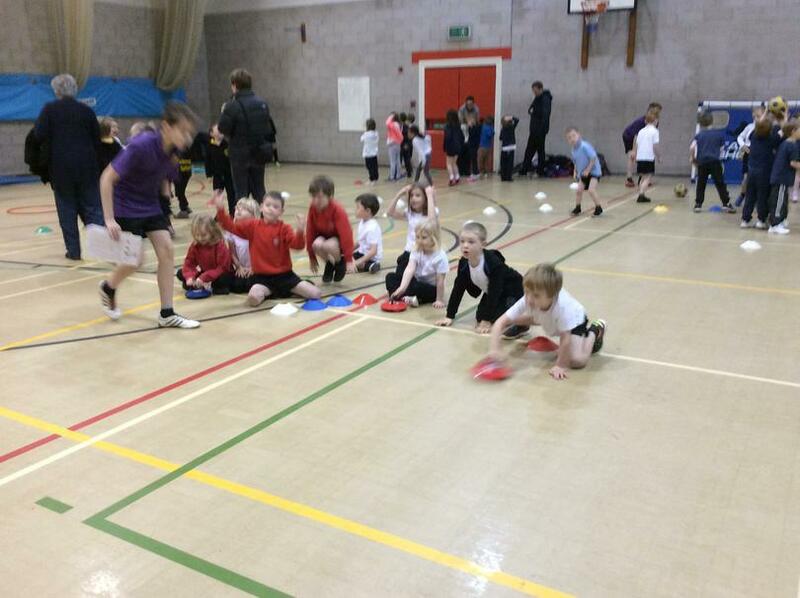 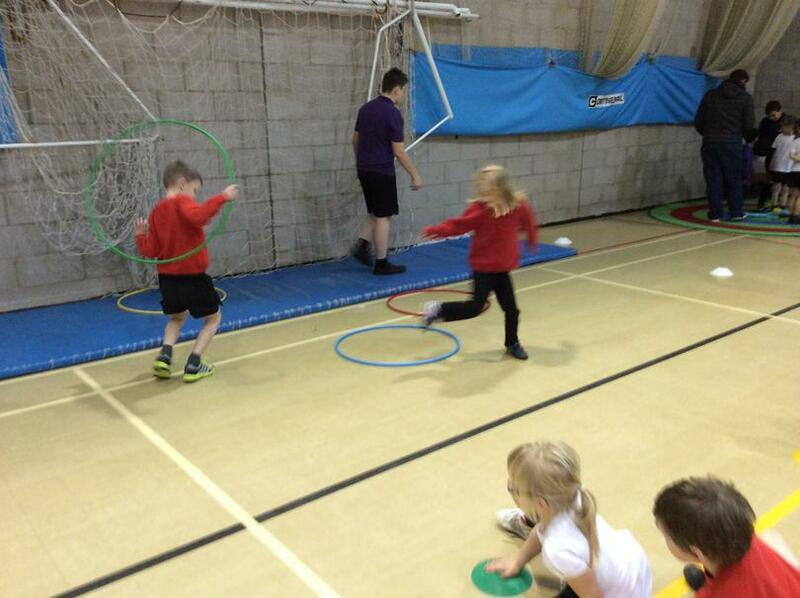 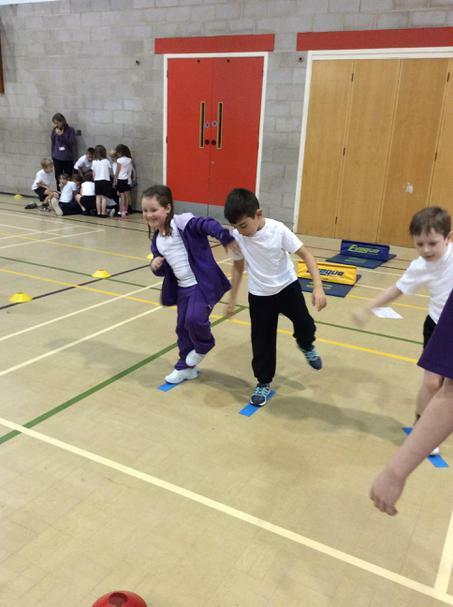 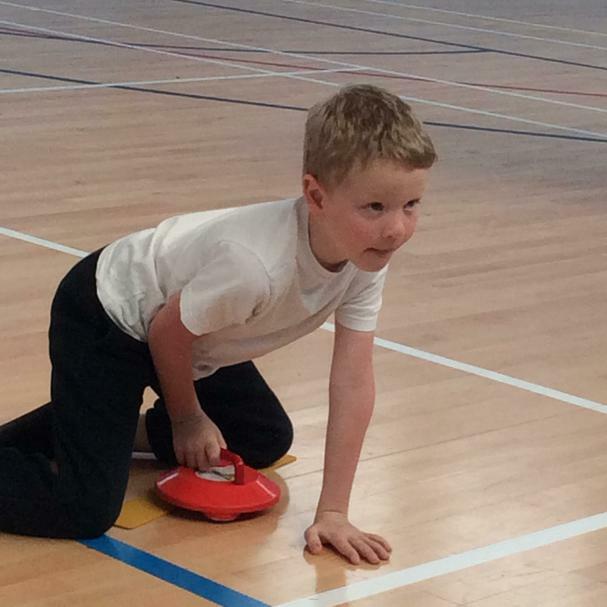 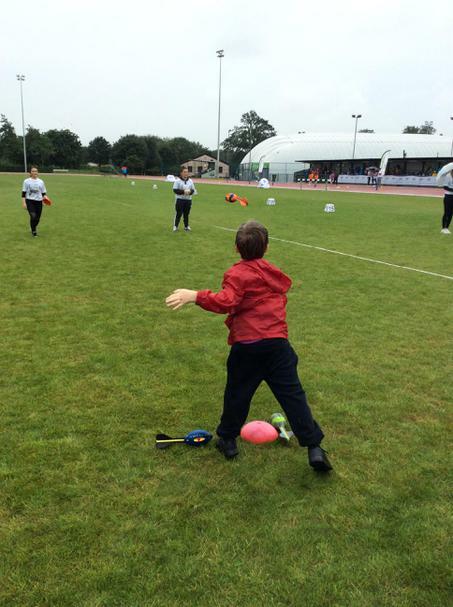 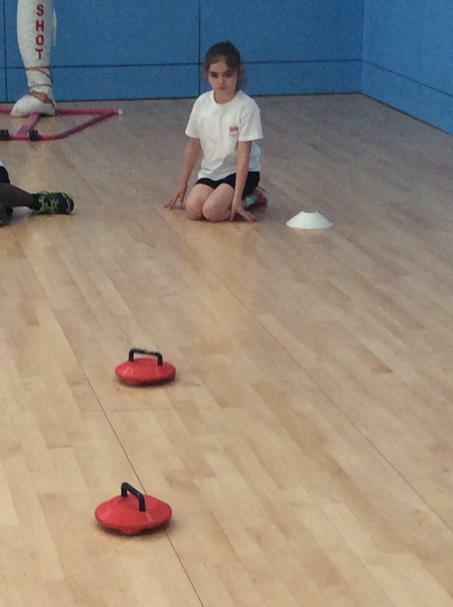 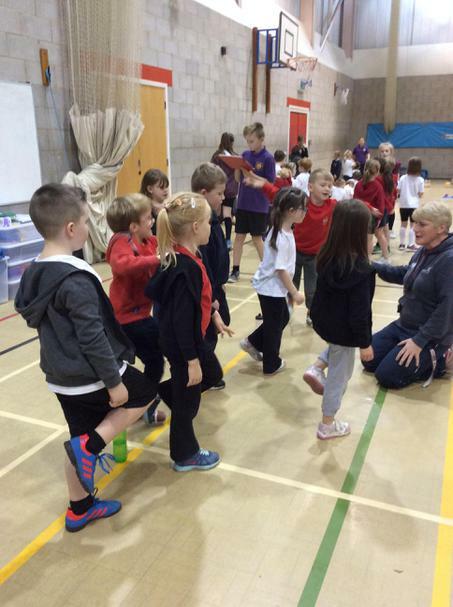 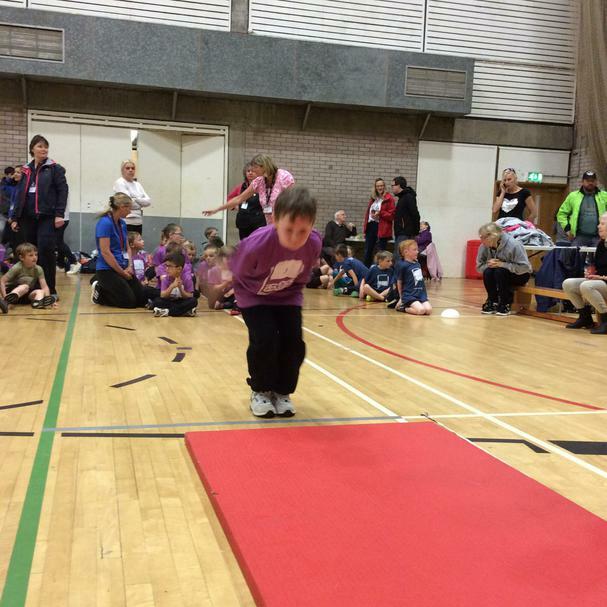 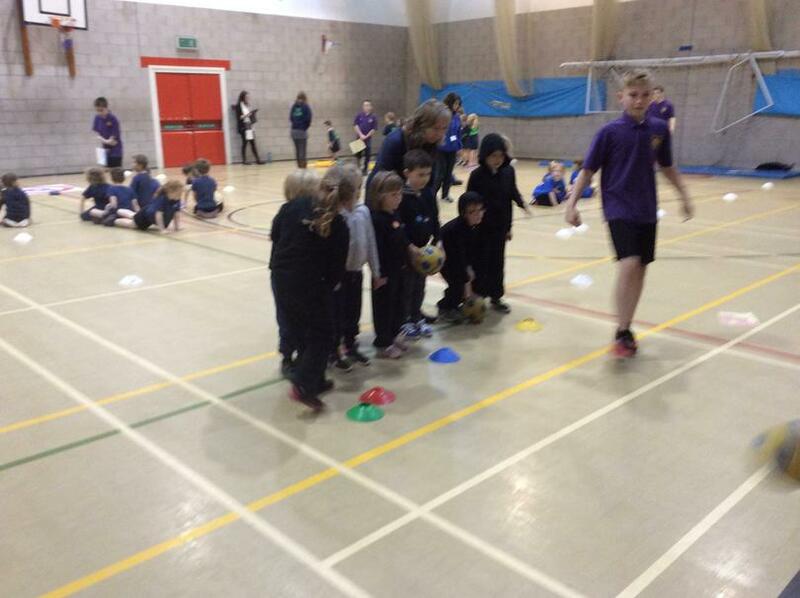 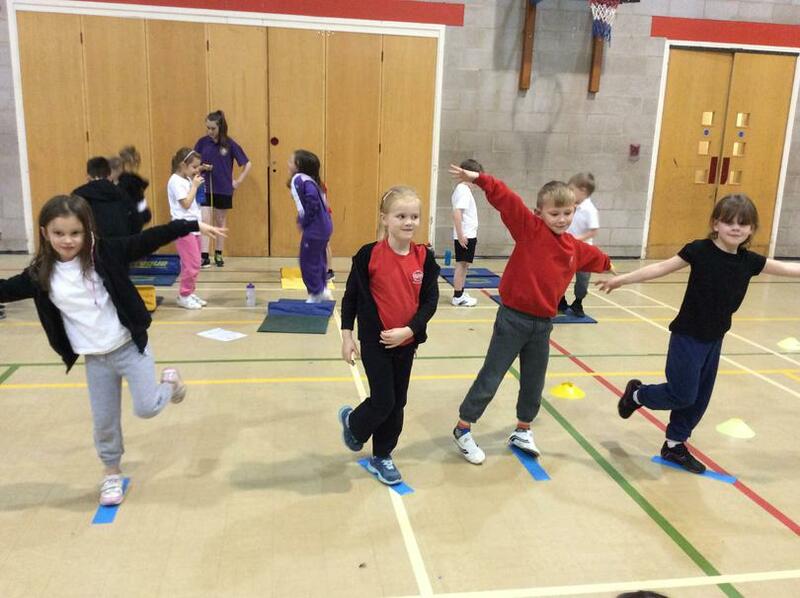 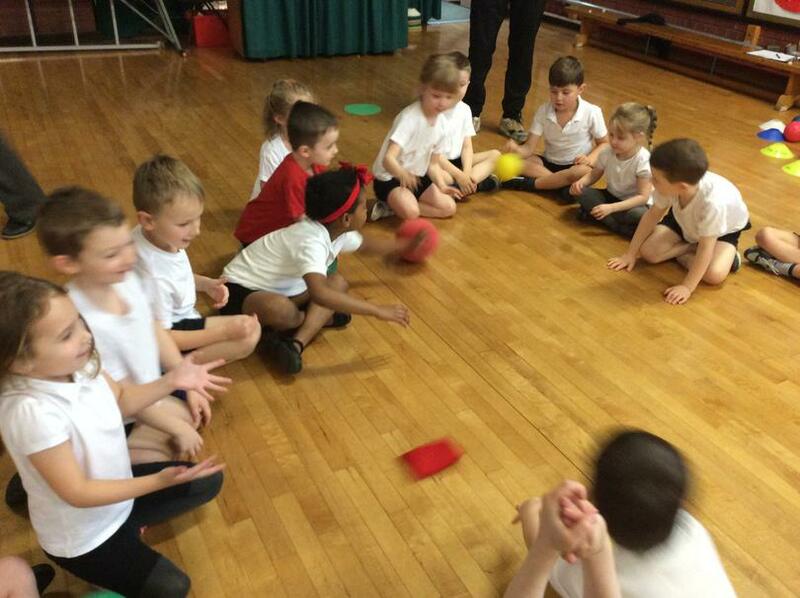 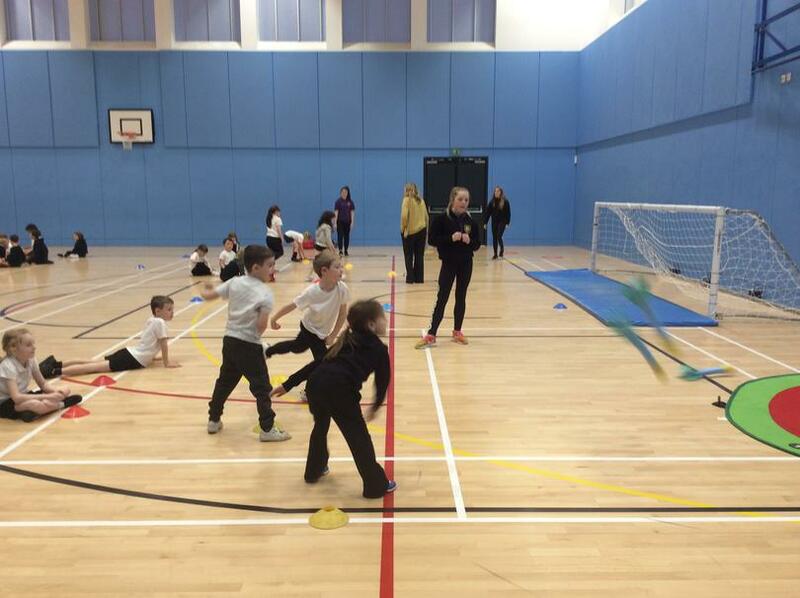 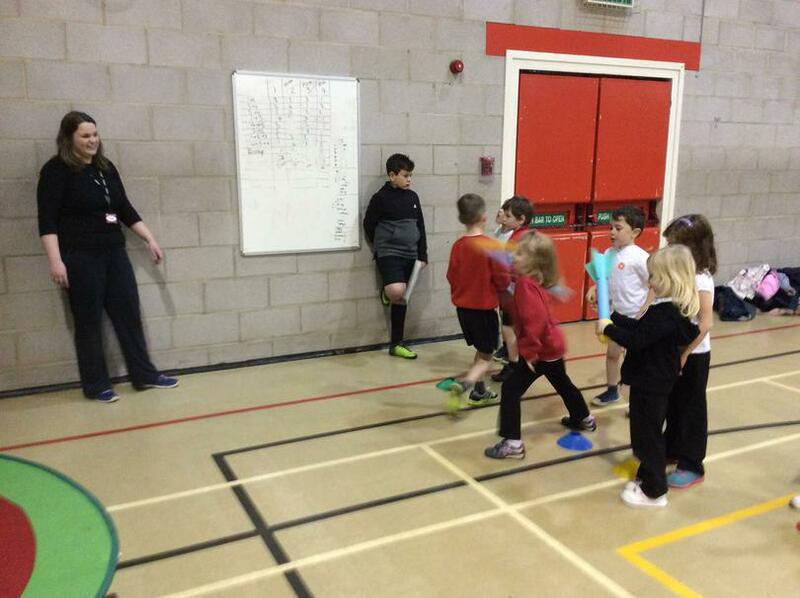 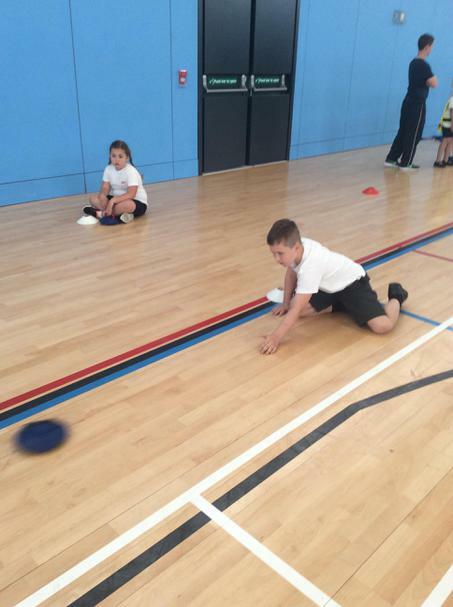 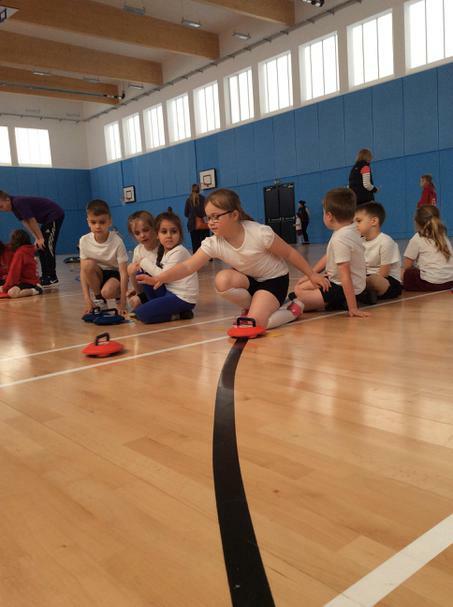 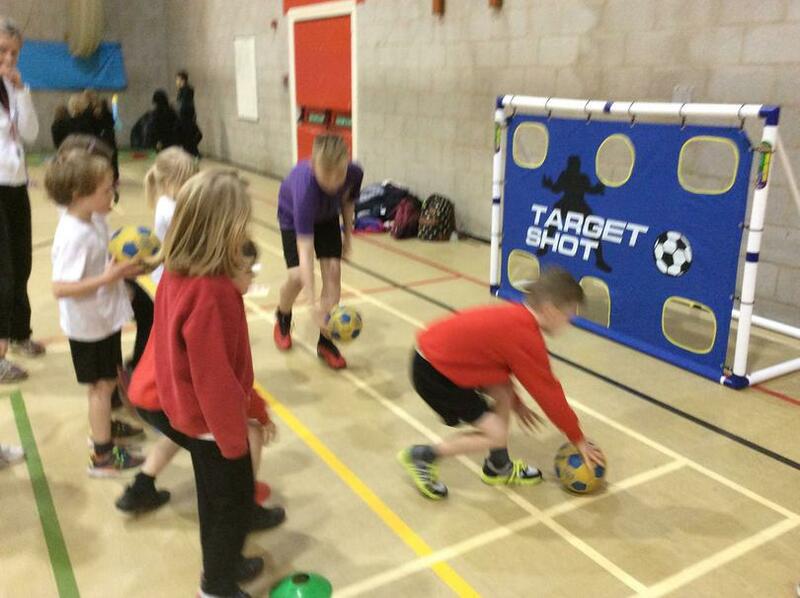 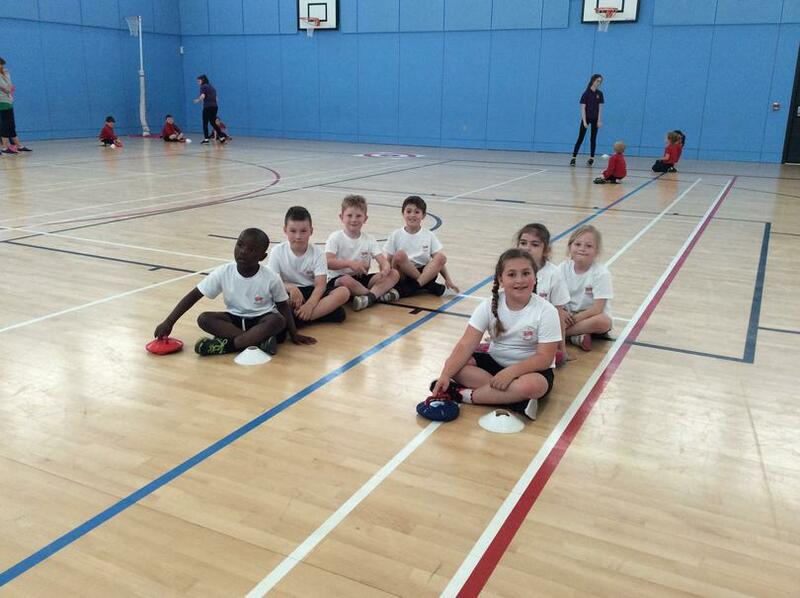 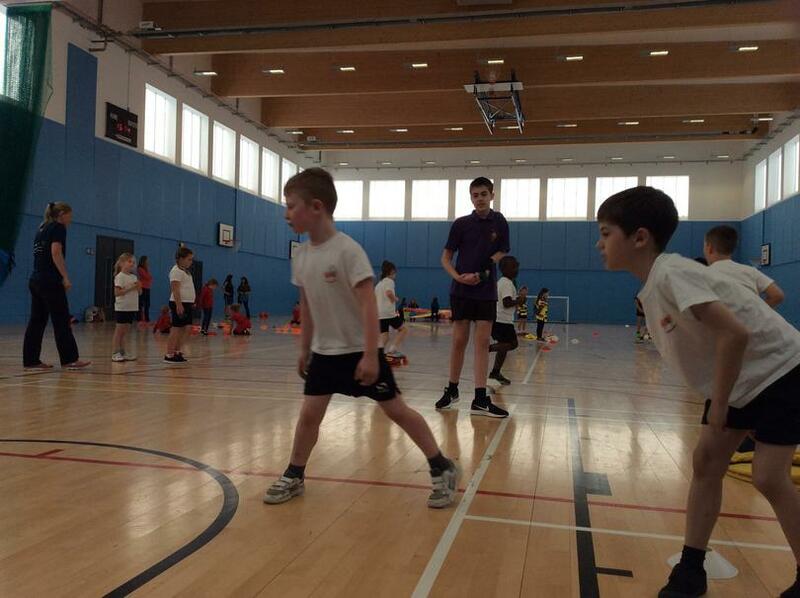 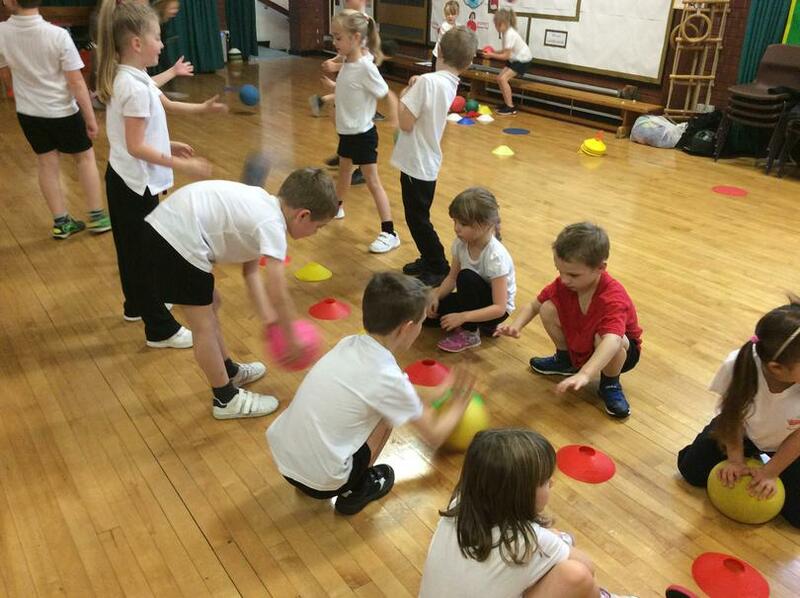 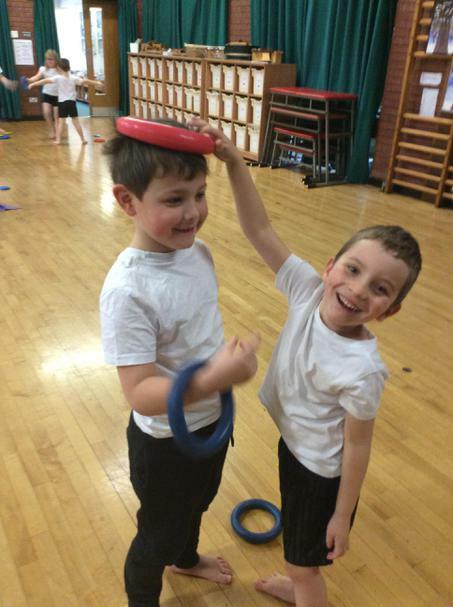 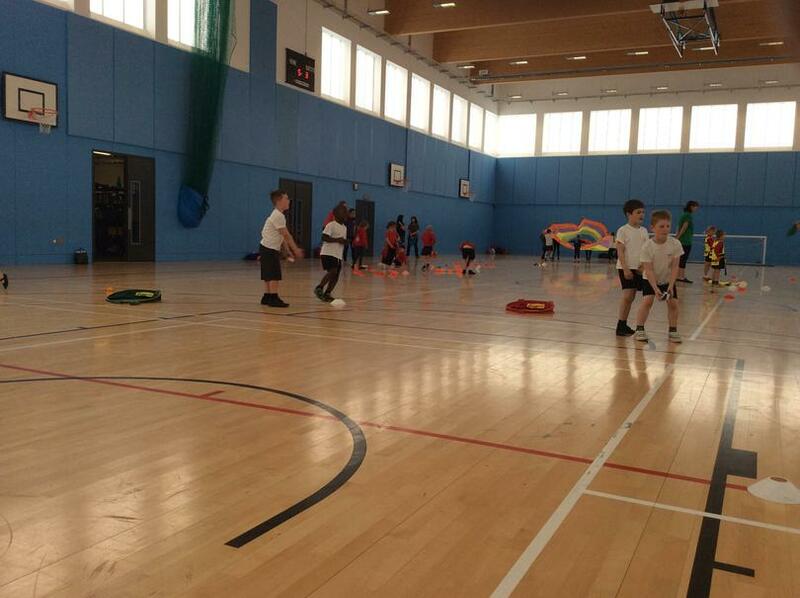 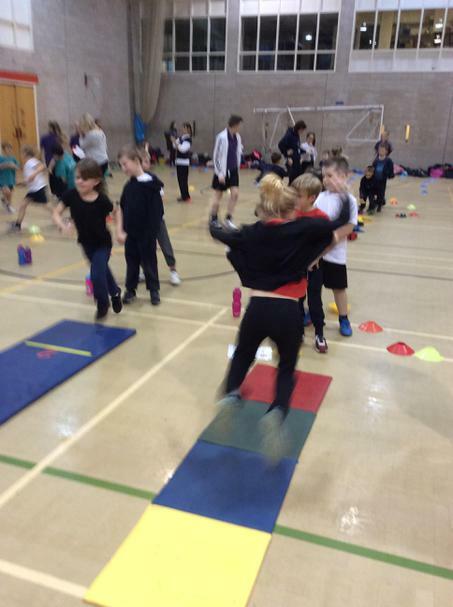 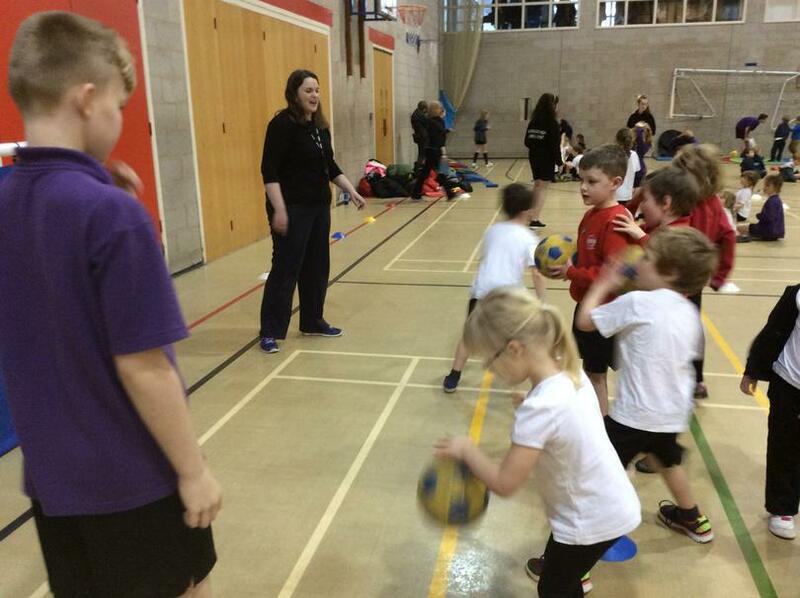 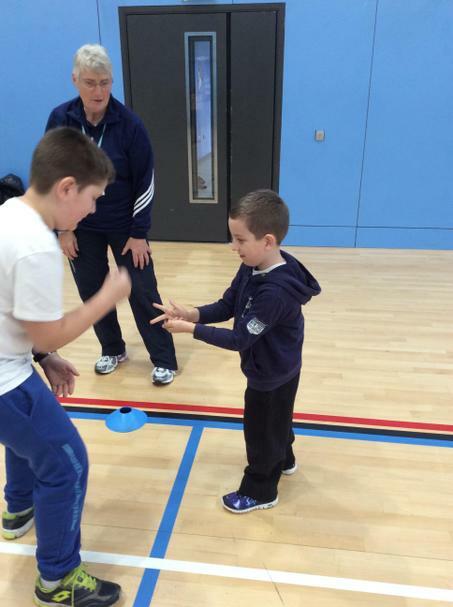 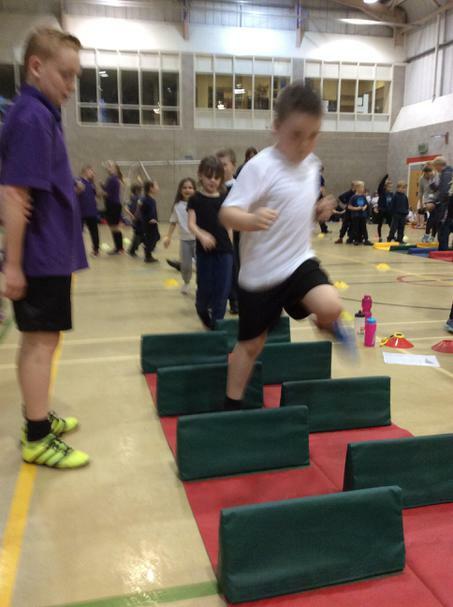 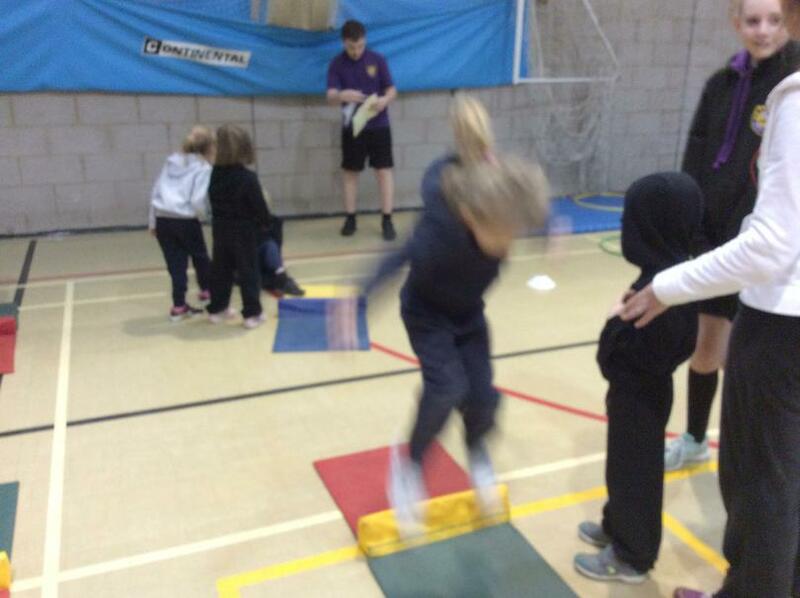 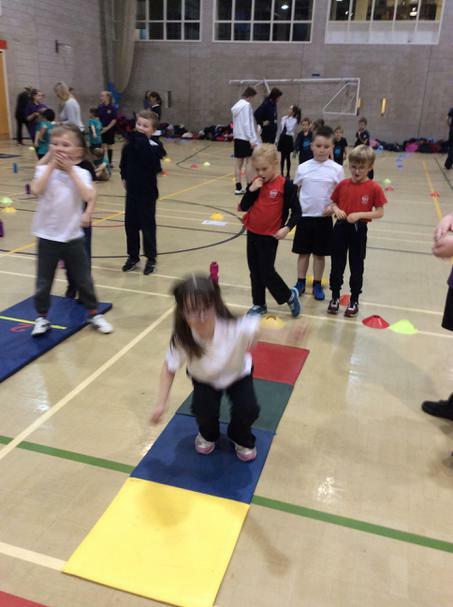 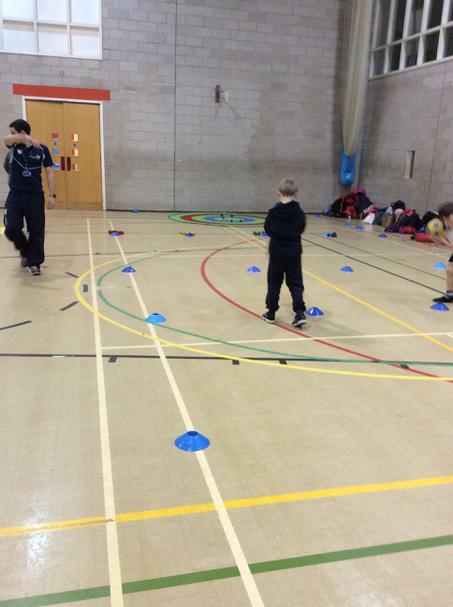 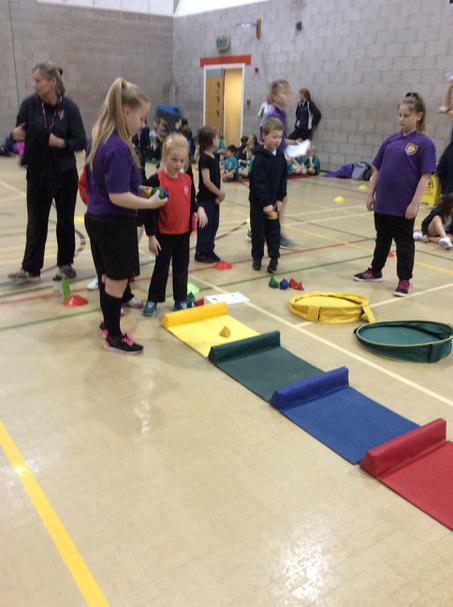 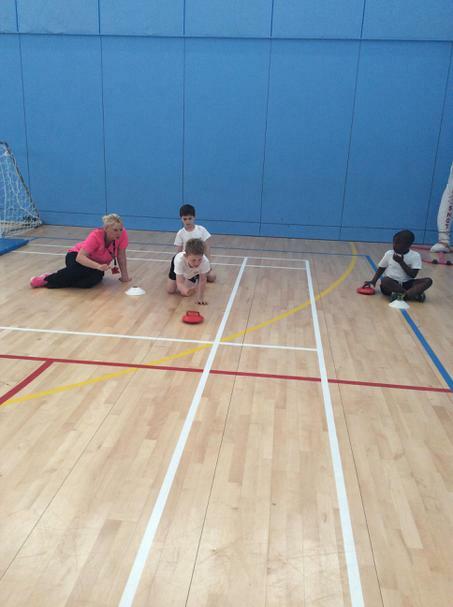 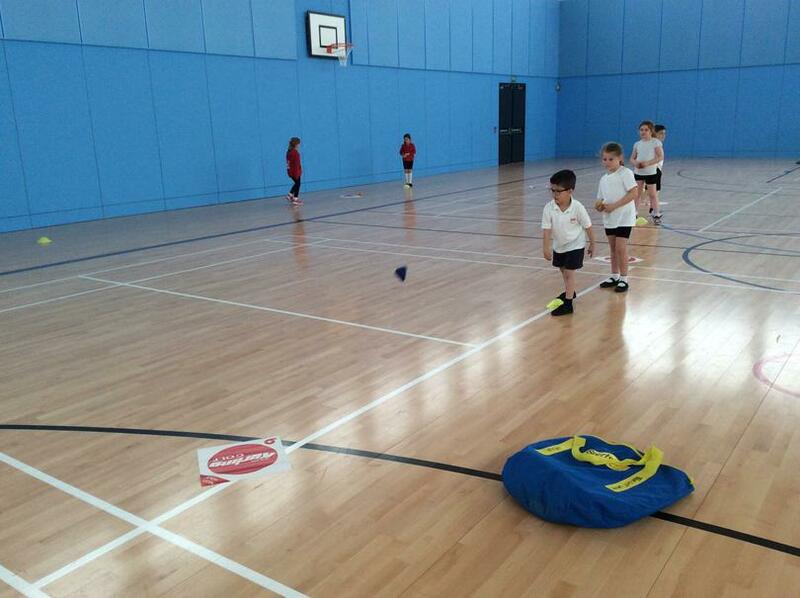 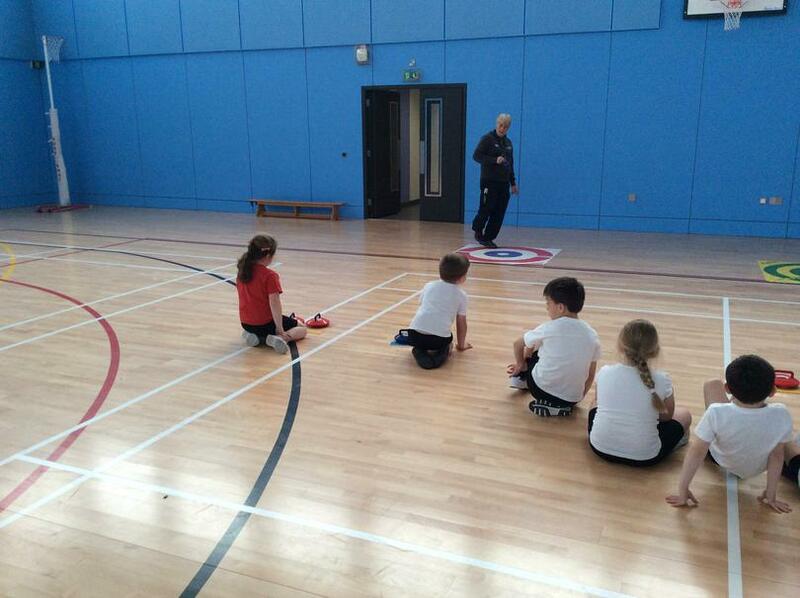 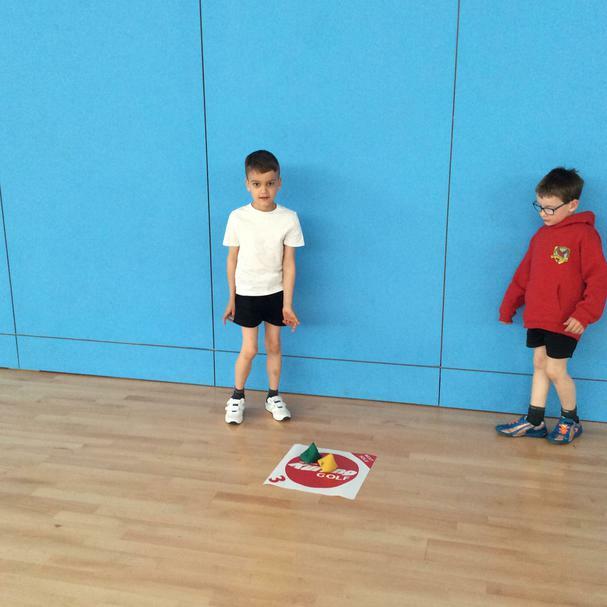 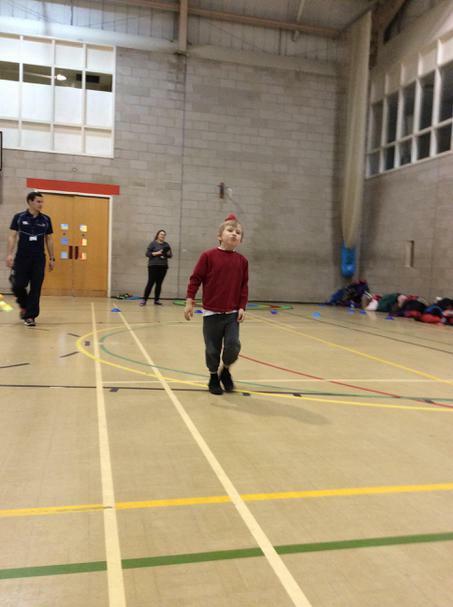 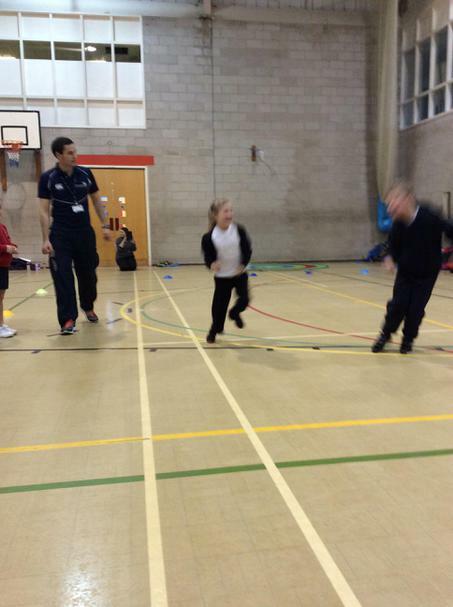 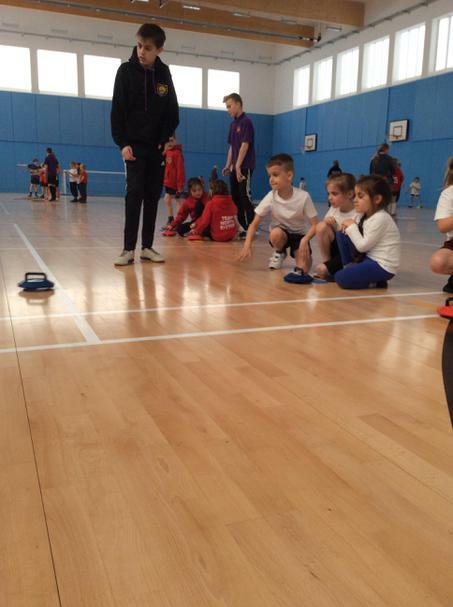 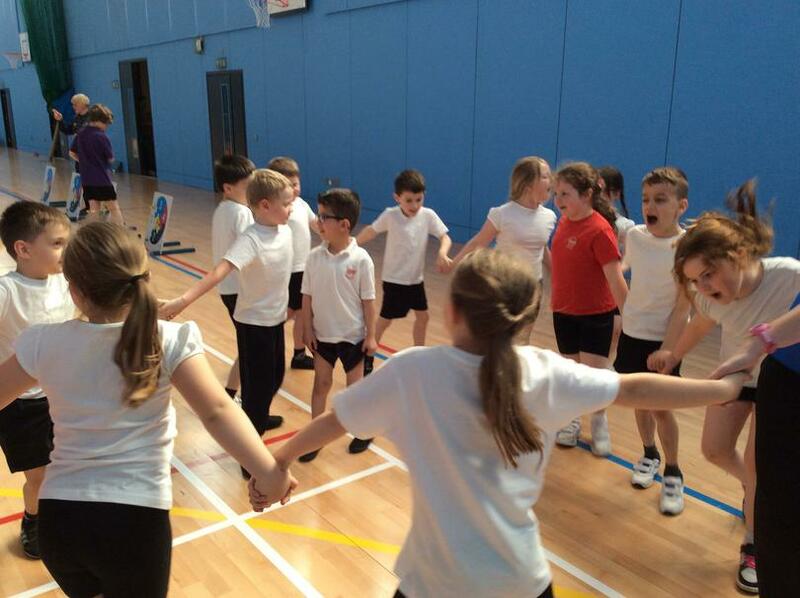 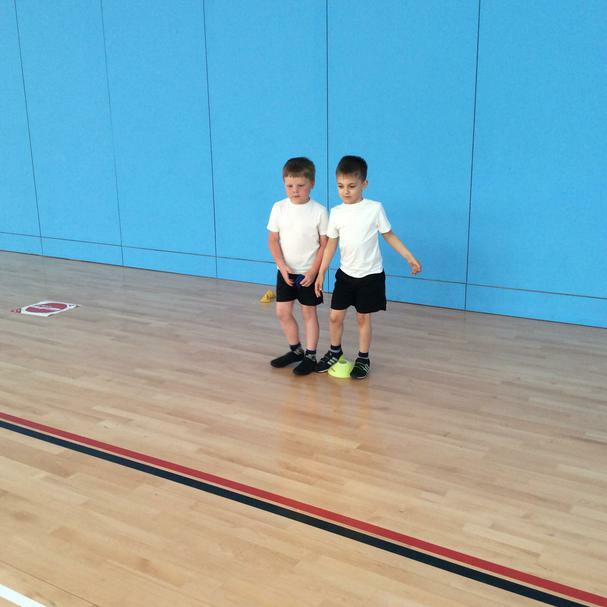 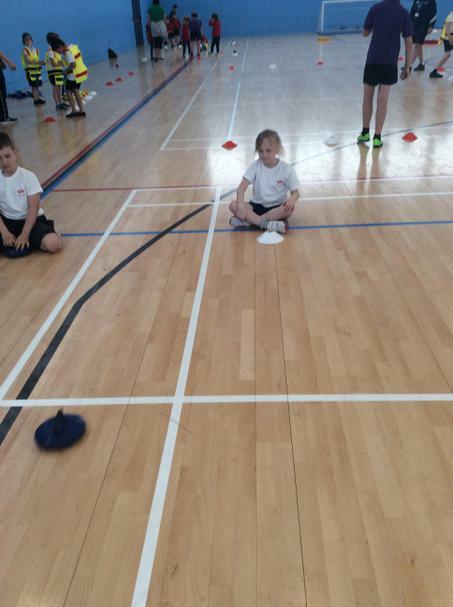 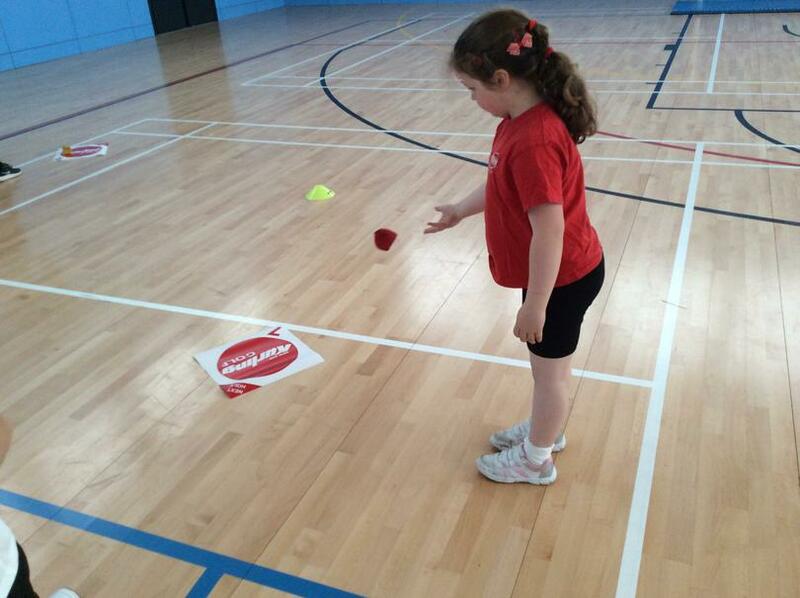 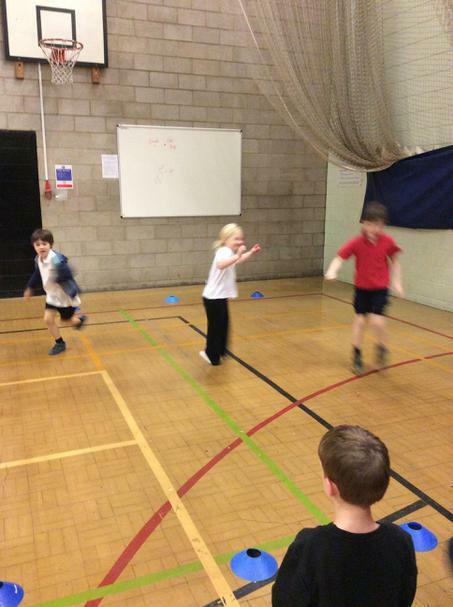 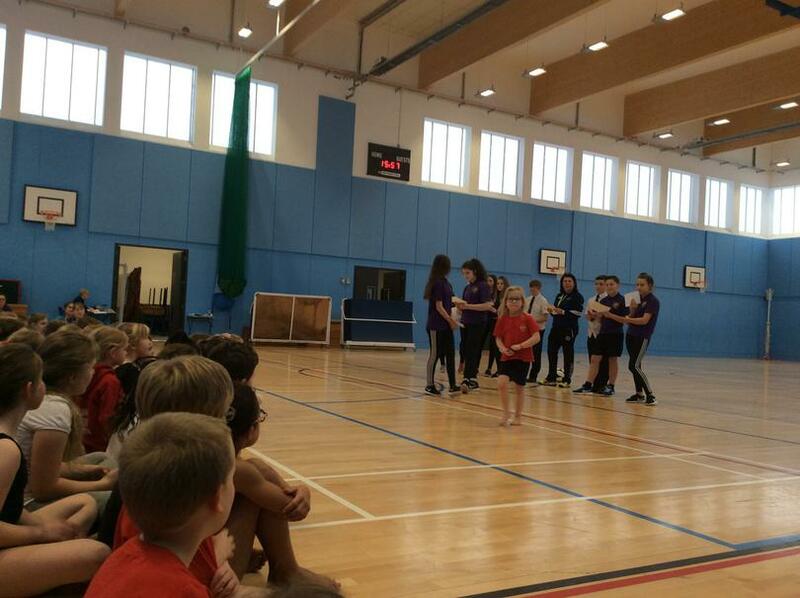 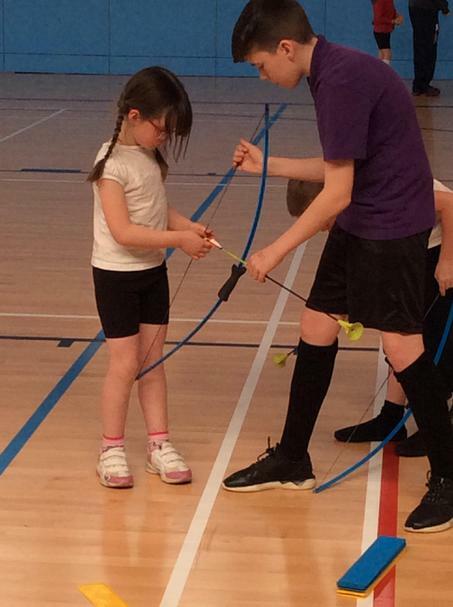 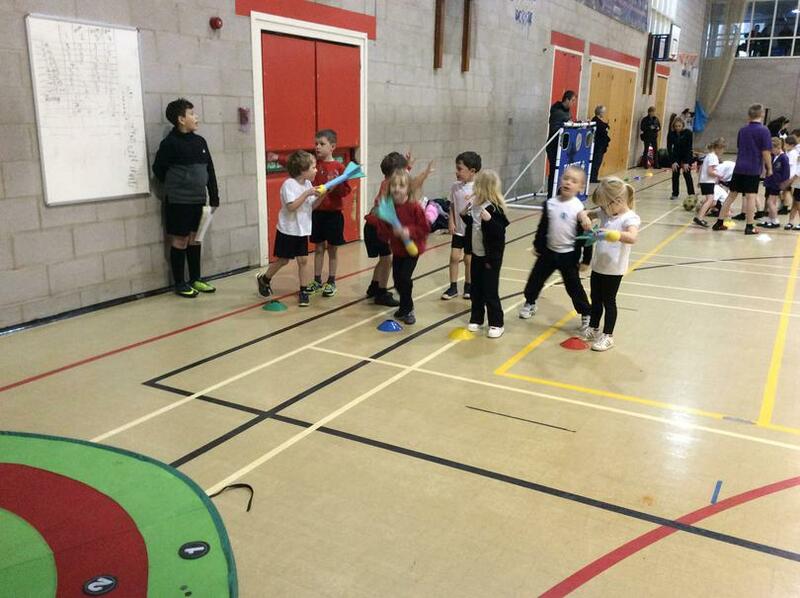 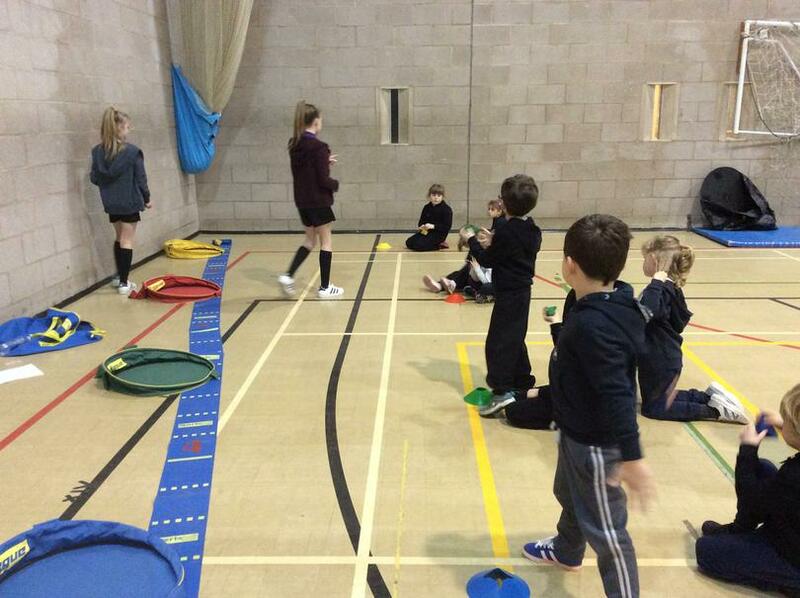 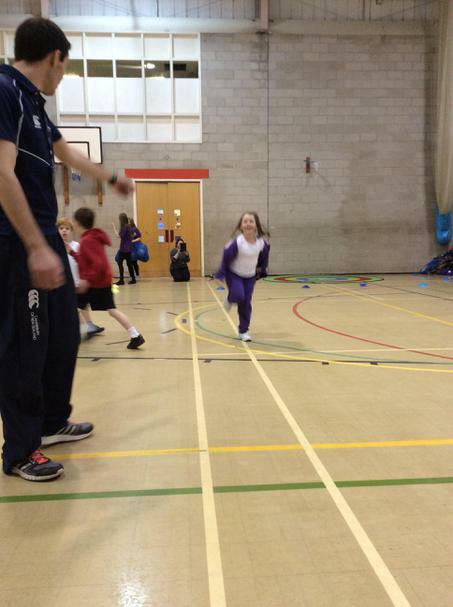 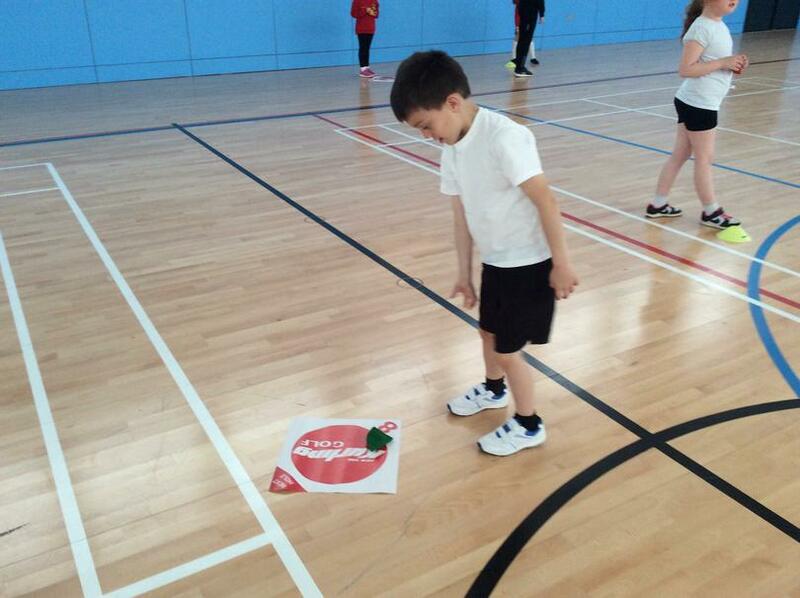 They took part in activities such as relay races, side bouncing, target throwing, stepper and balancing. 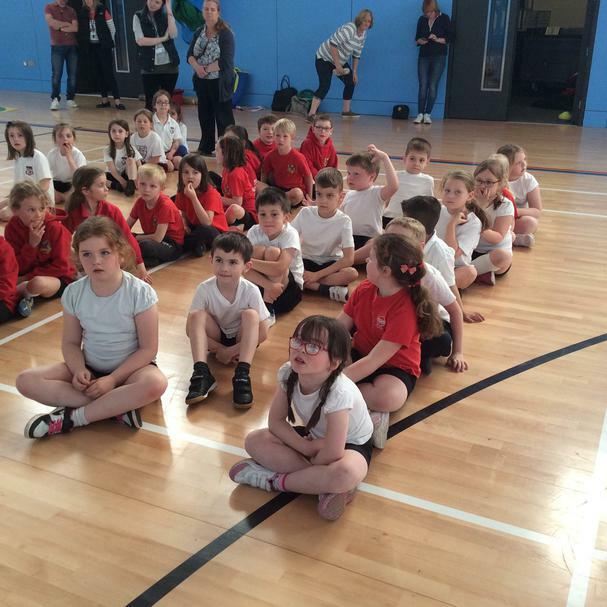 The children did a wonderful job of representing the school. 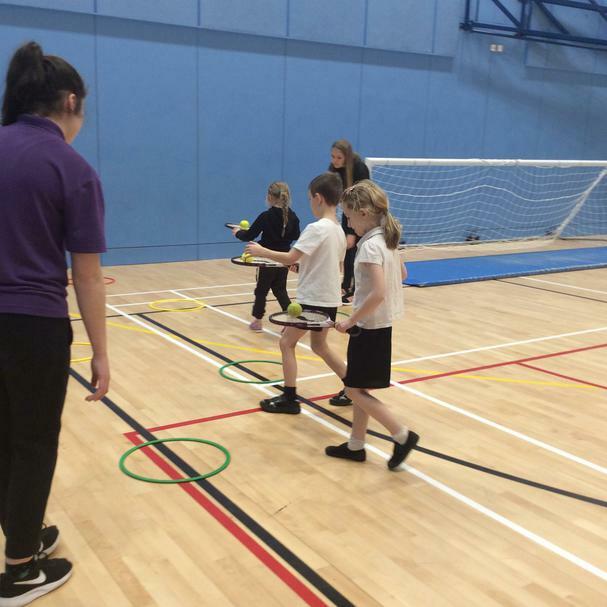 As part of the school sport funding the school invest in the specialist skills of Claire Bassingdale from St Aidans High School. 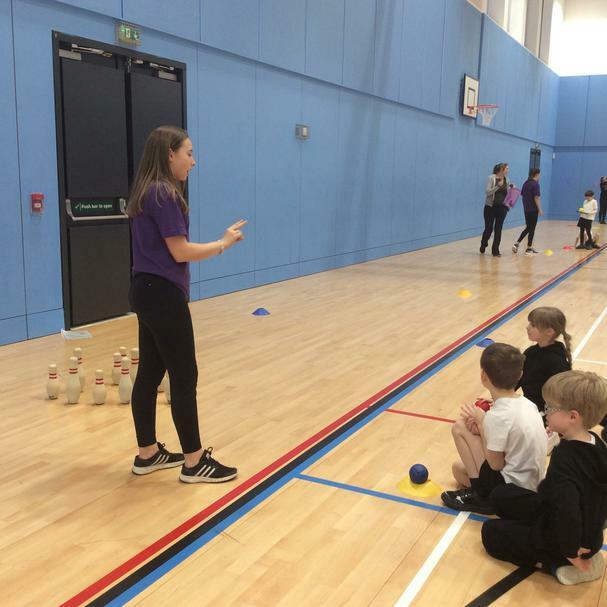 Claire supports the professional development of all the teachers by coming into school to advise on good practice and teach specific P.E lessons. 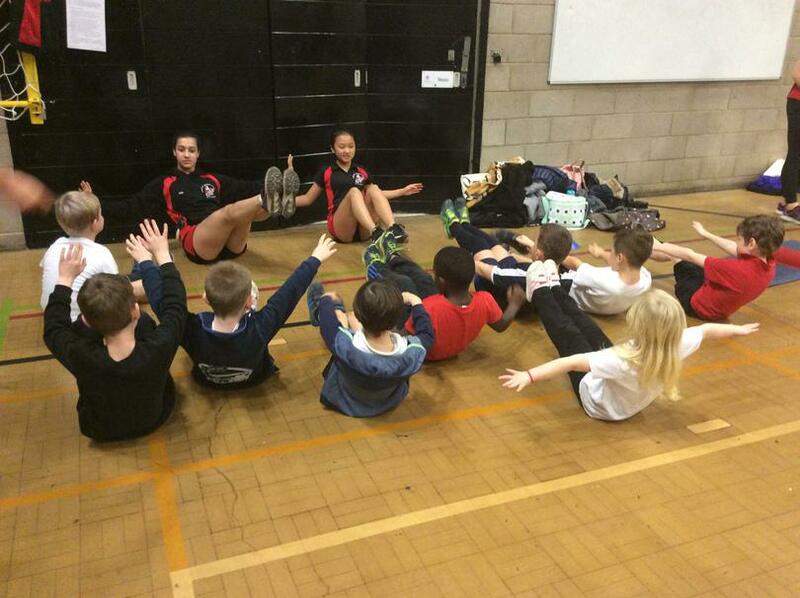 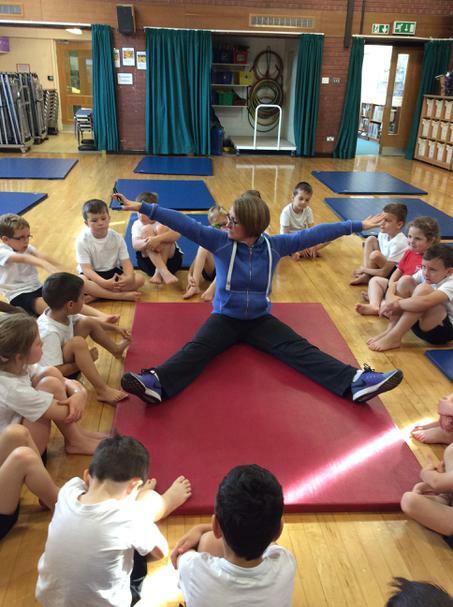 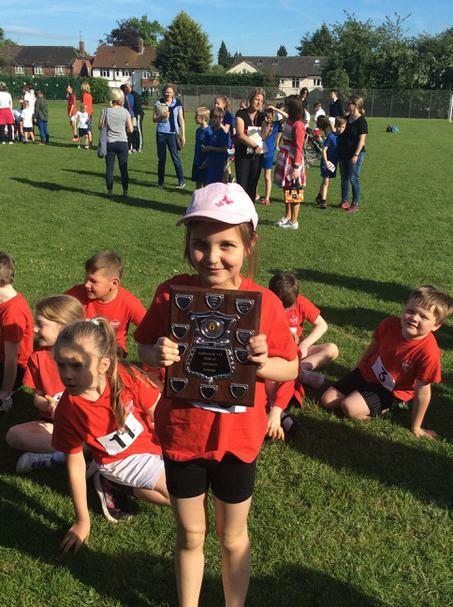 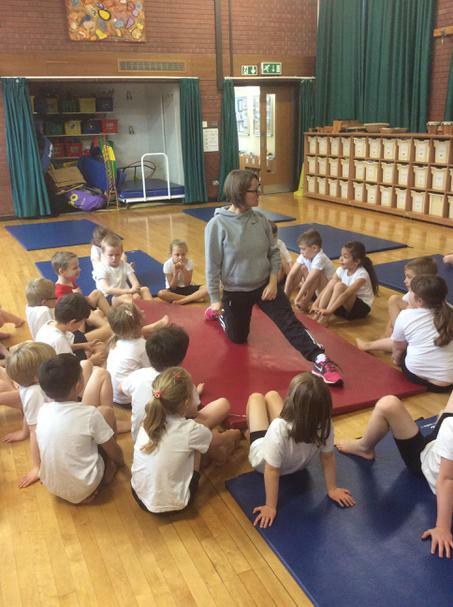 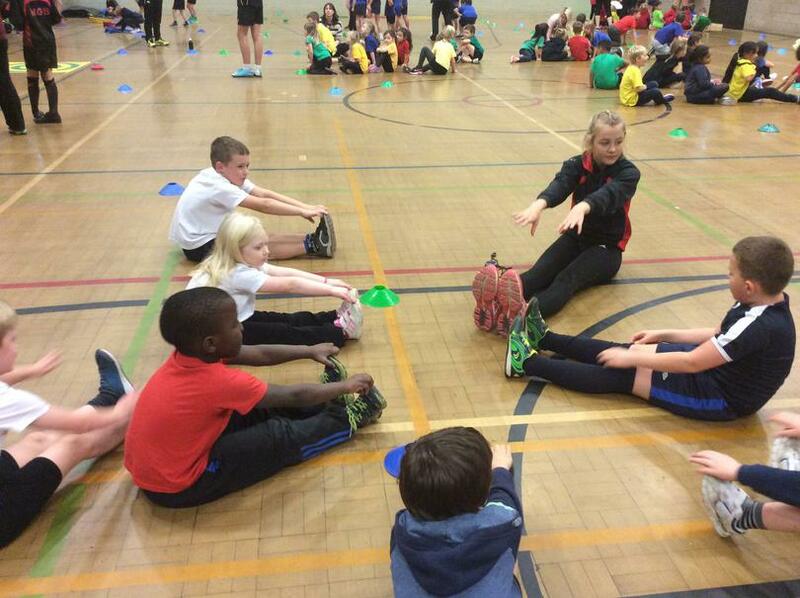 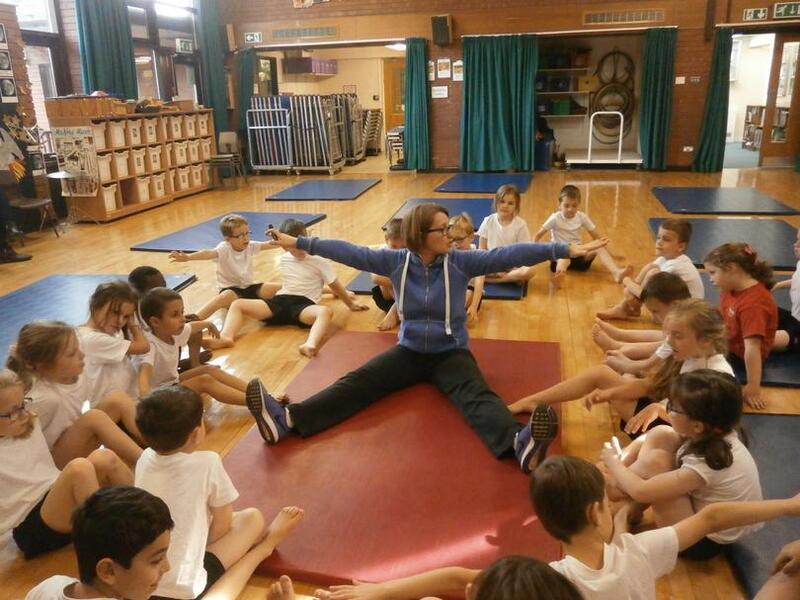 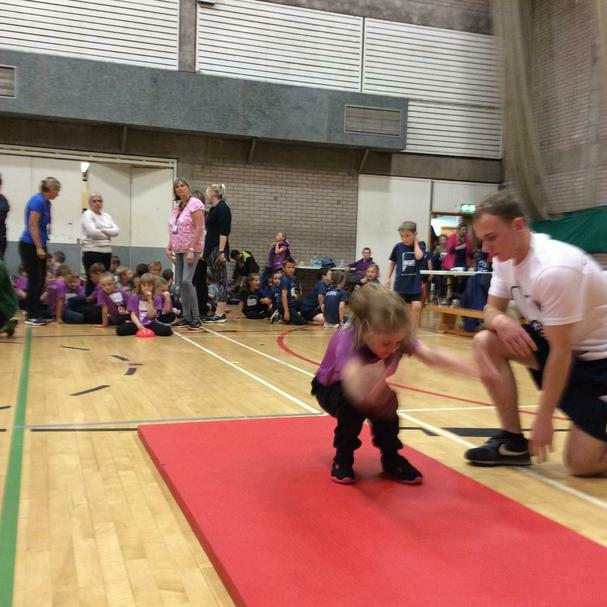 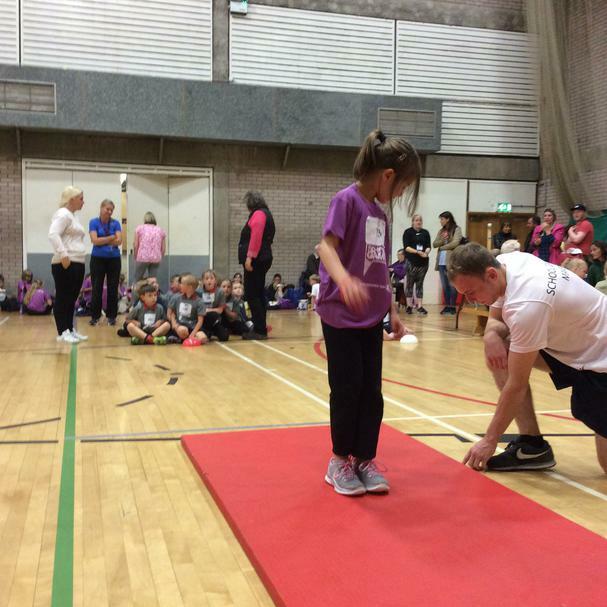 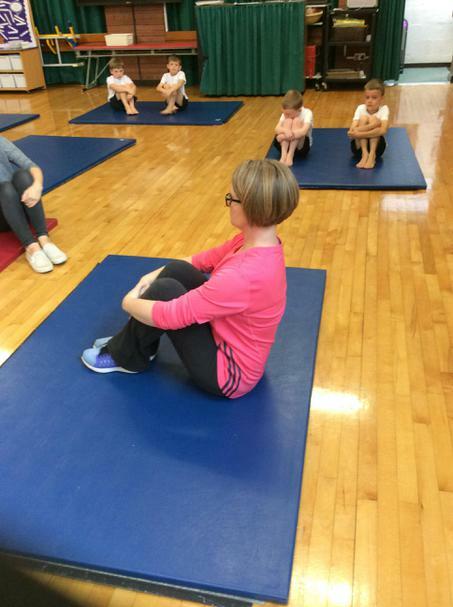 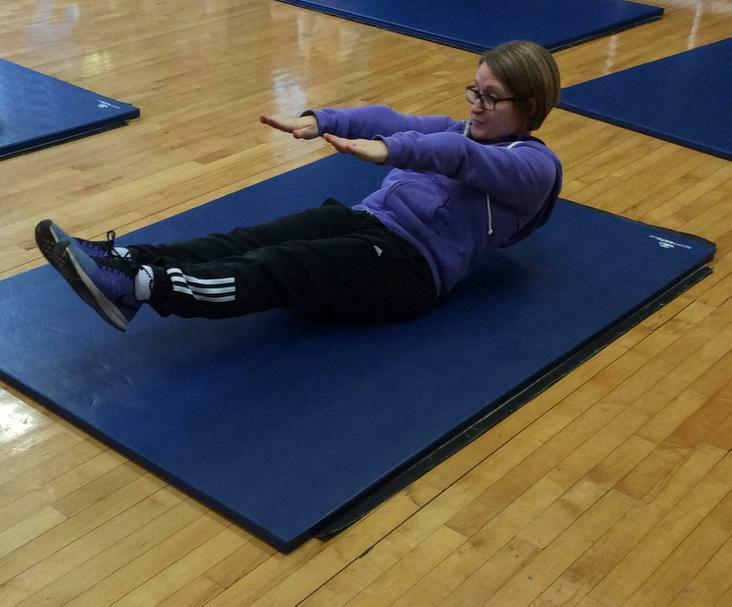 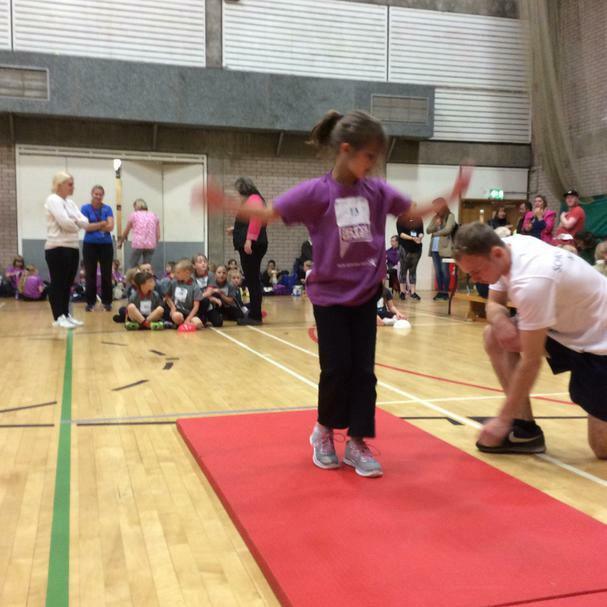 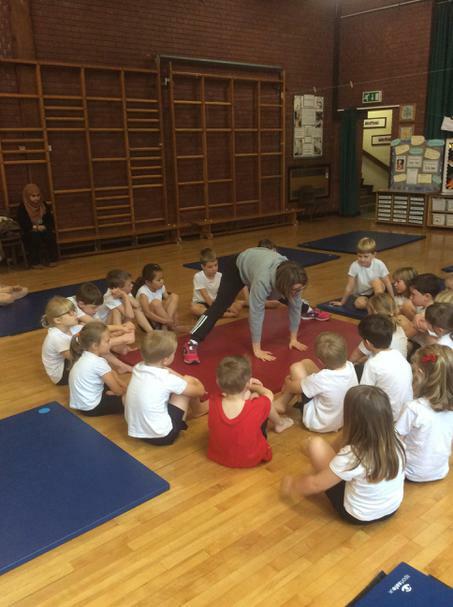 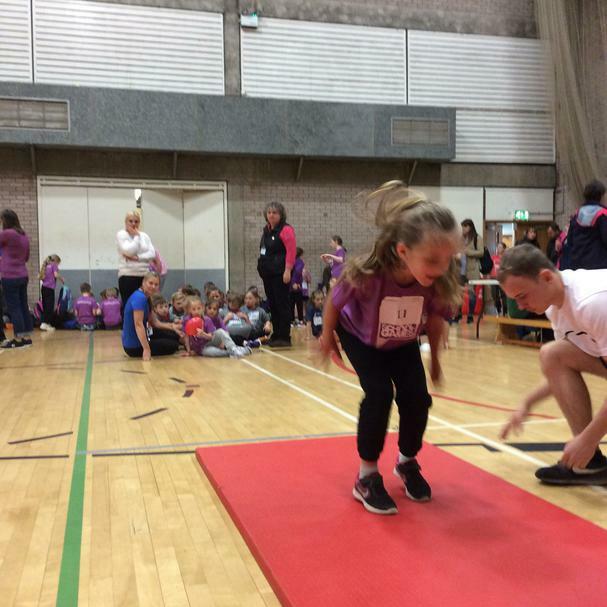 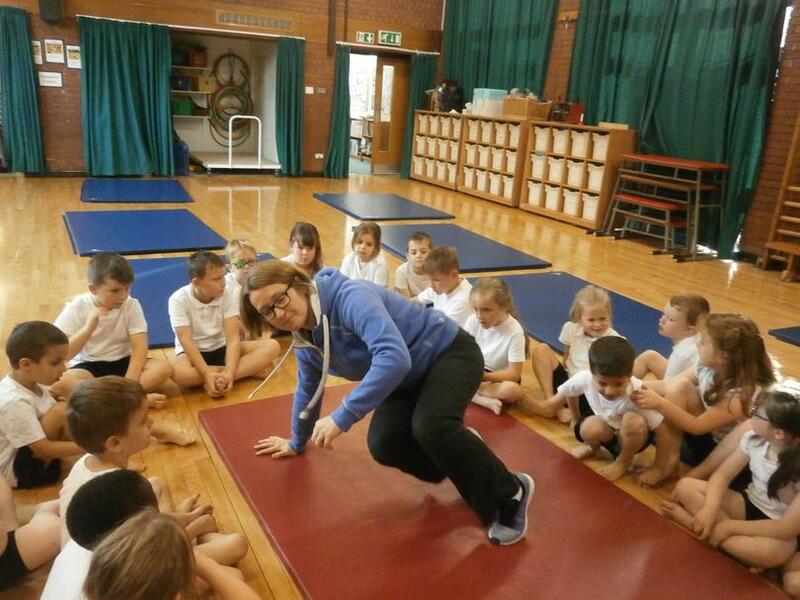 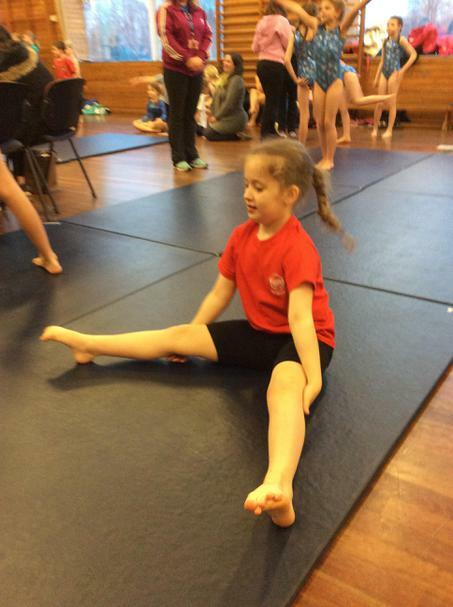 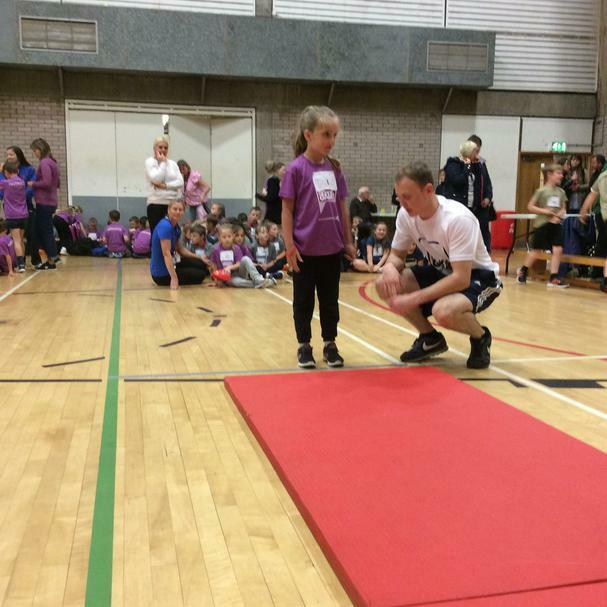 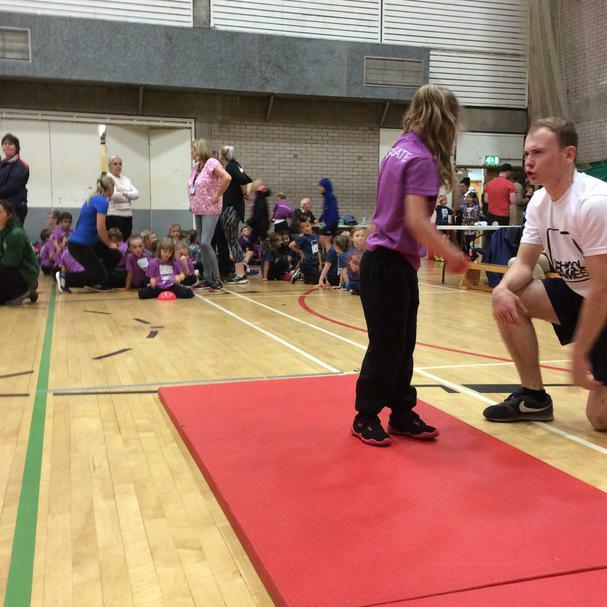 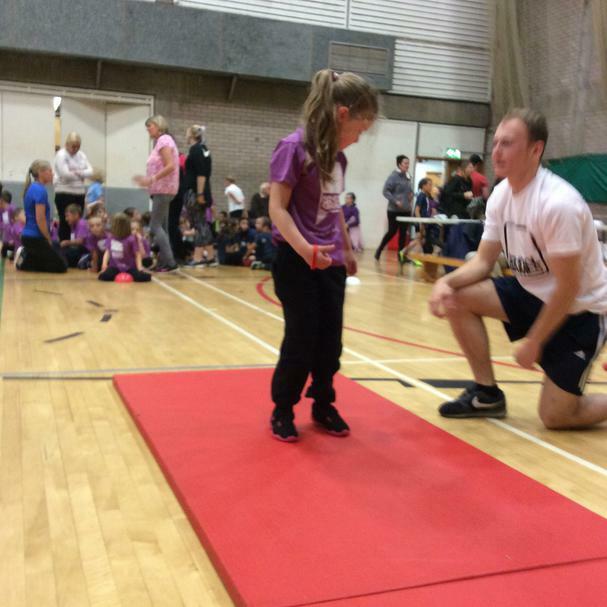 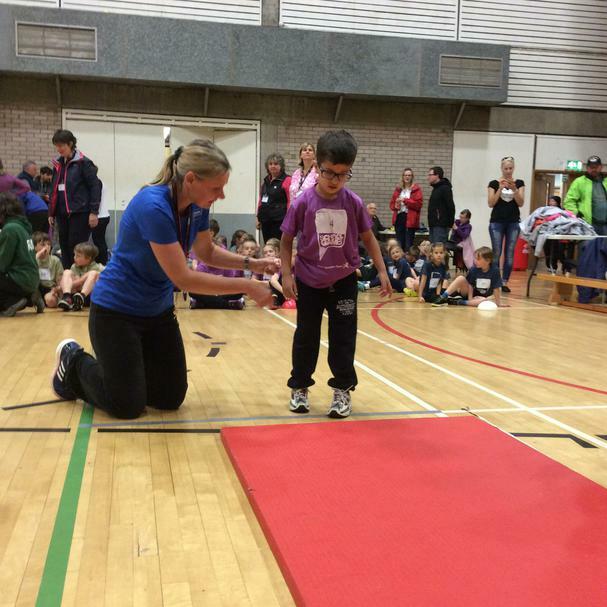 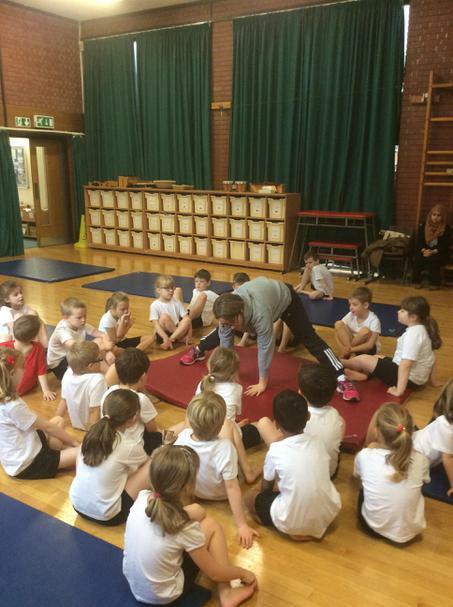 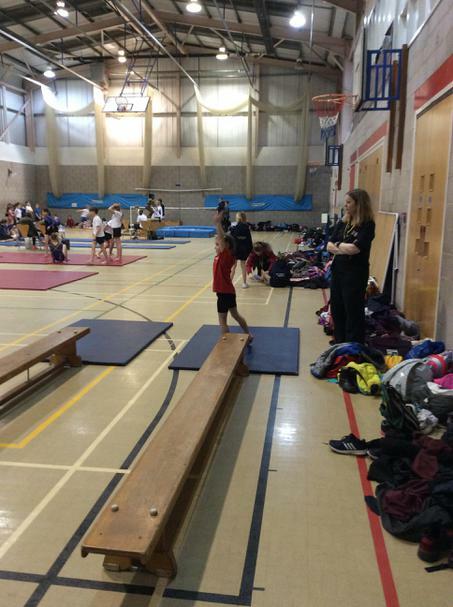 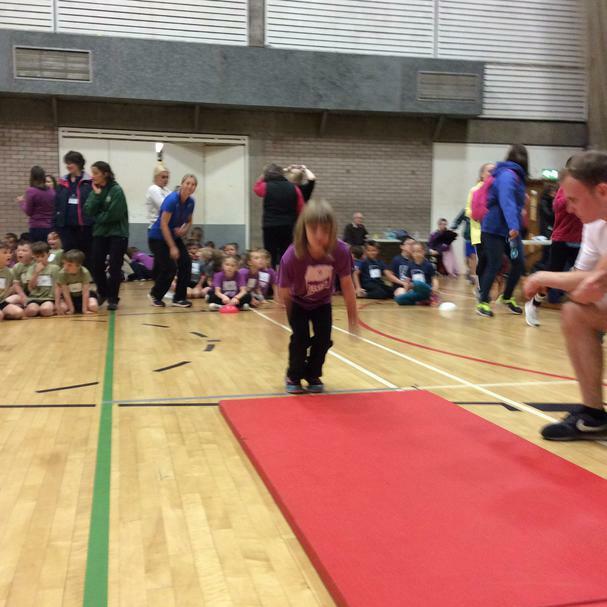 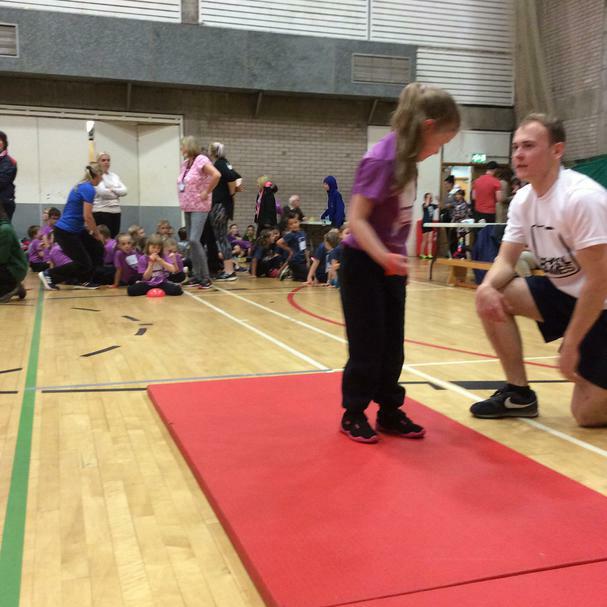 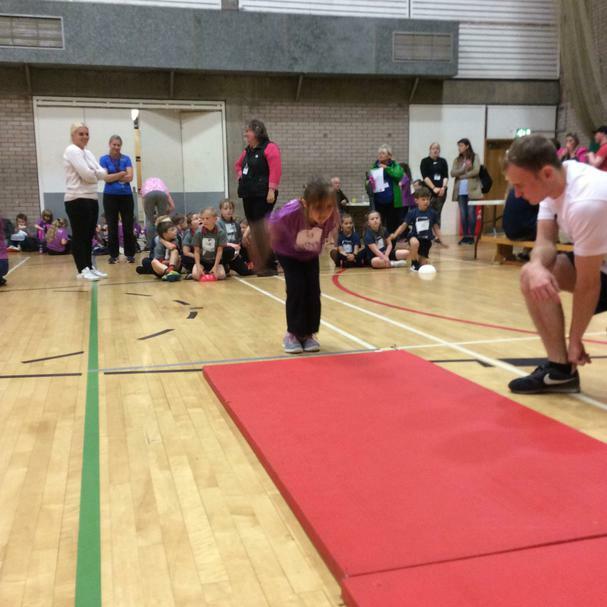 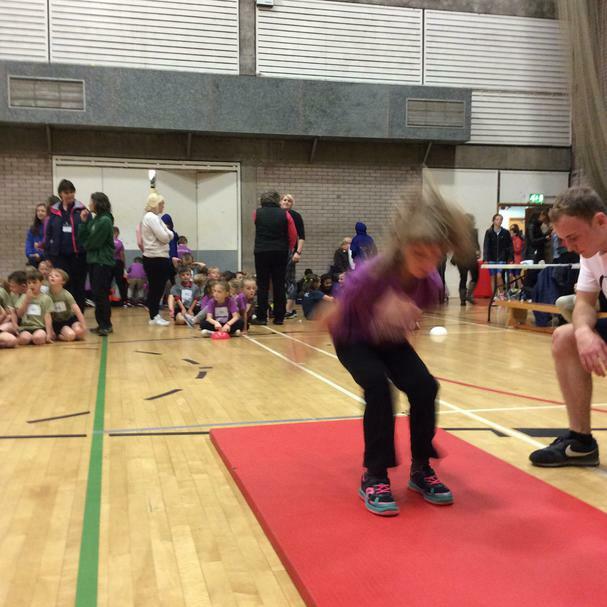 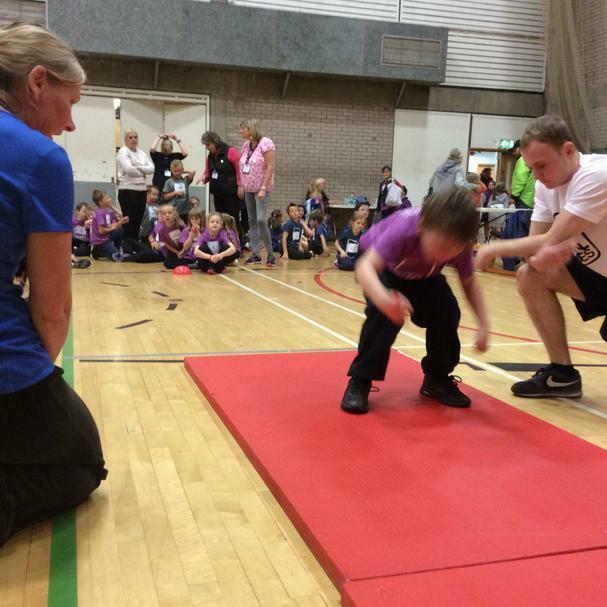 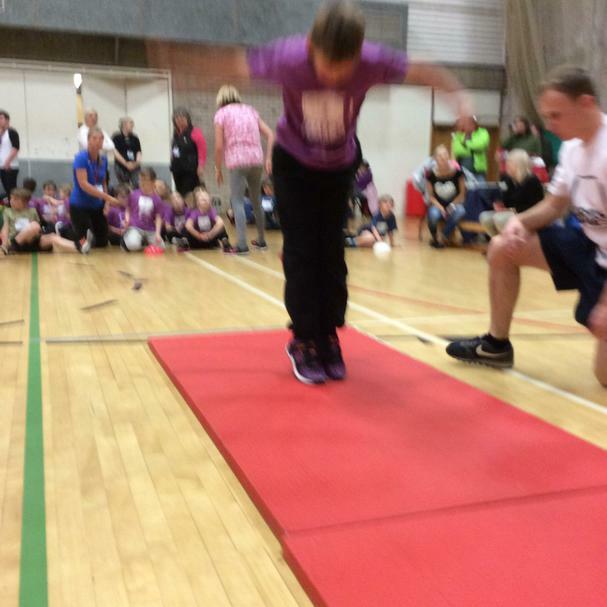 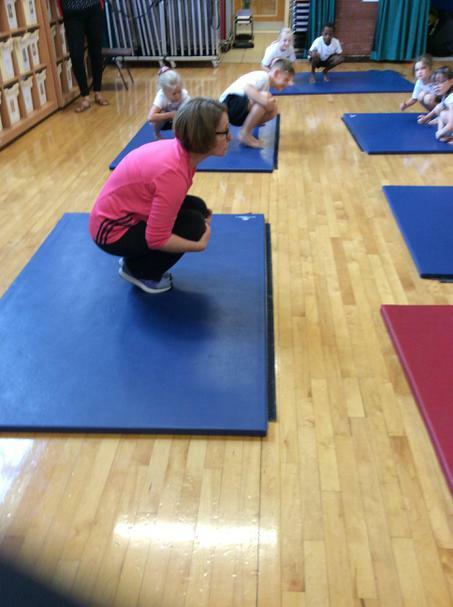 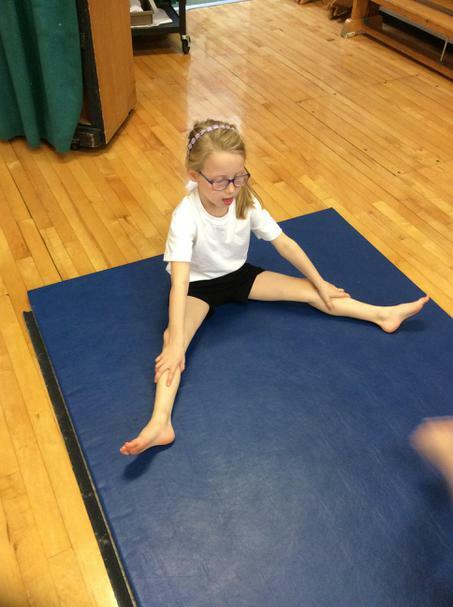 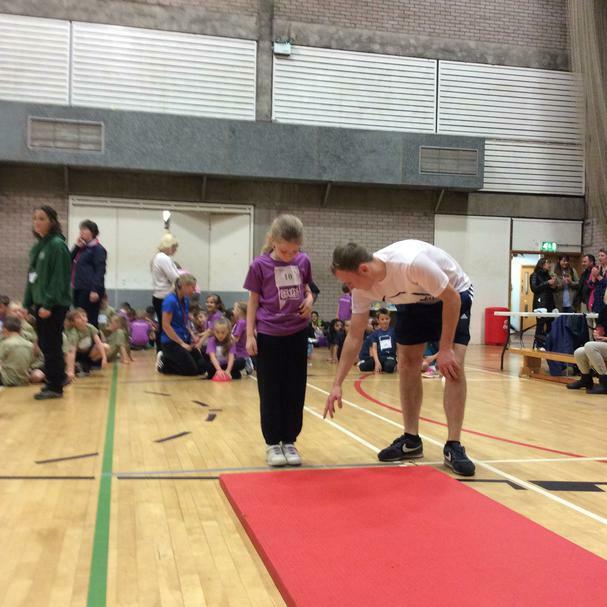 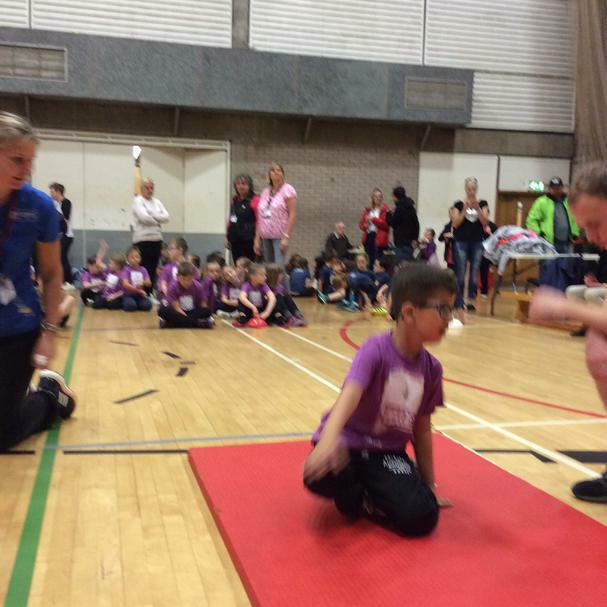 This year she has specifically supported children's gymnastic sessions and helped towards the gym competition. 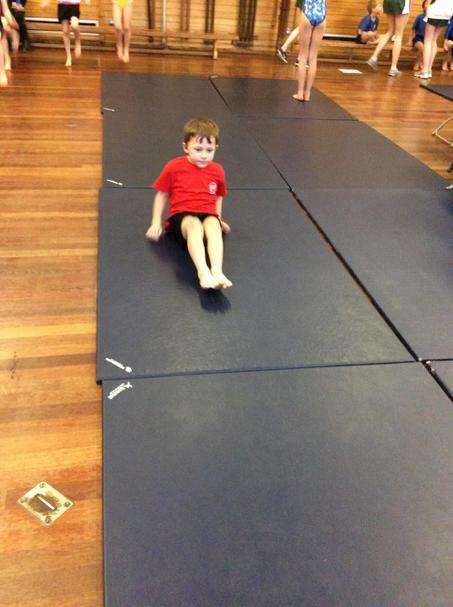 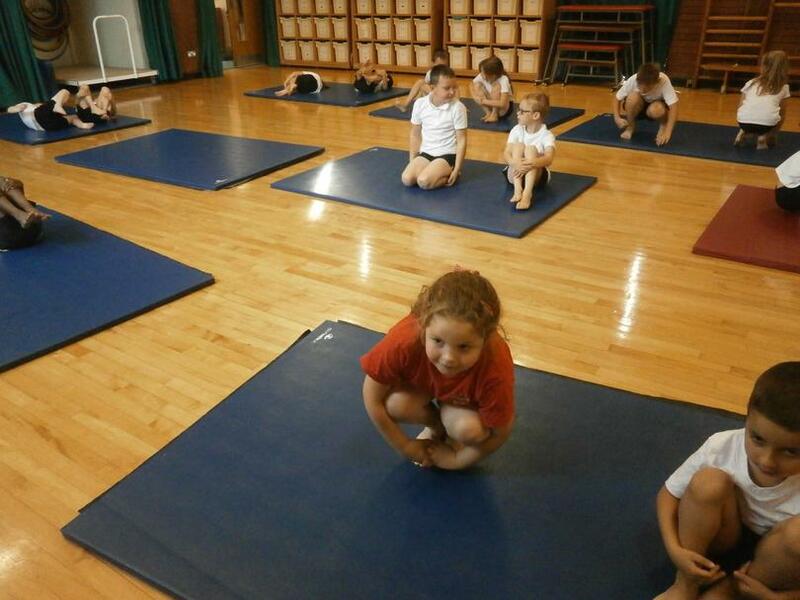 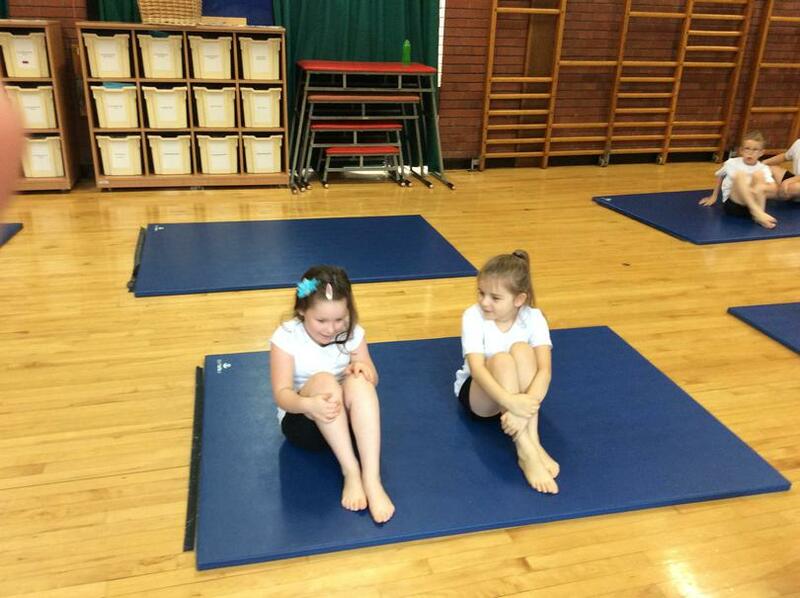 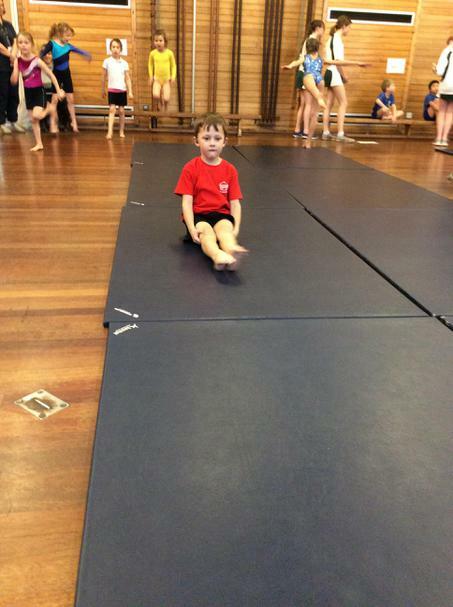 Claire taking a Year 2 class Gymnastics lesson. 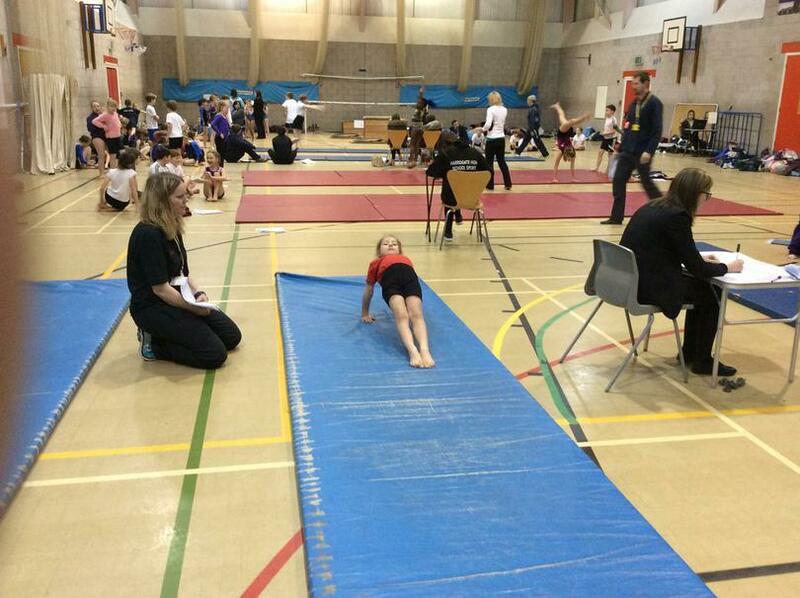 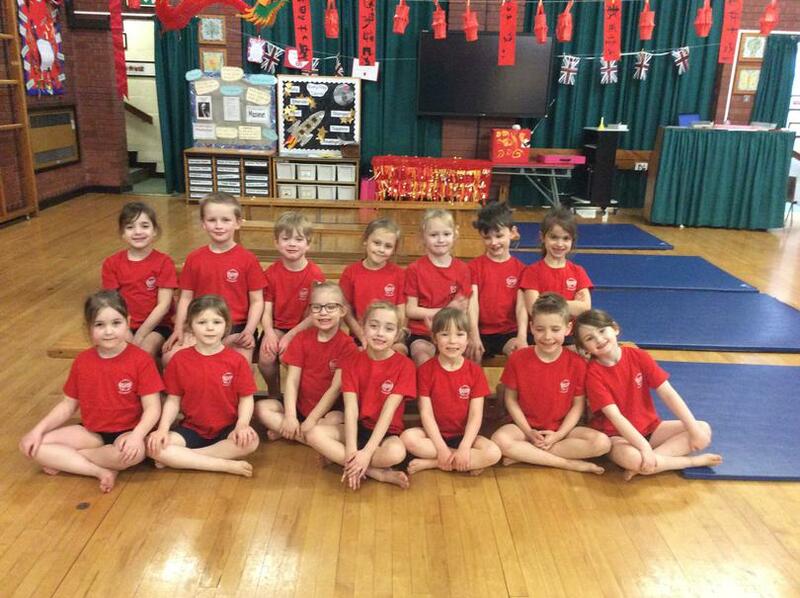 Three teams from the Gymnastics Club took part in an inter-schools Competition at Harrogate High School. 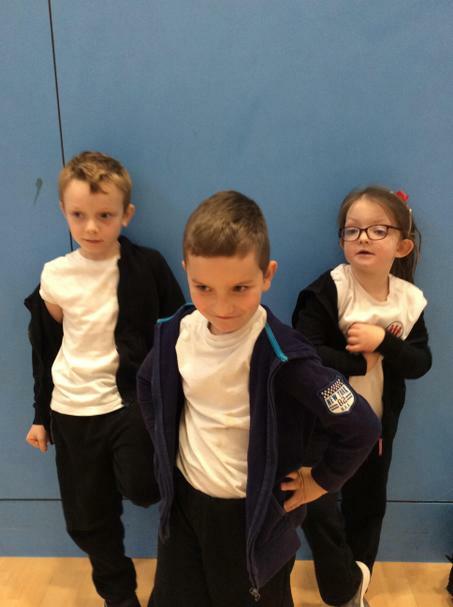 They had to perform three routines in front of a panel of judges. 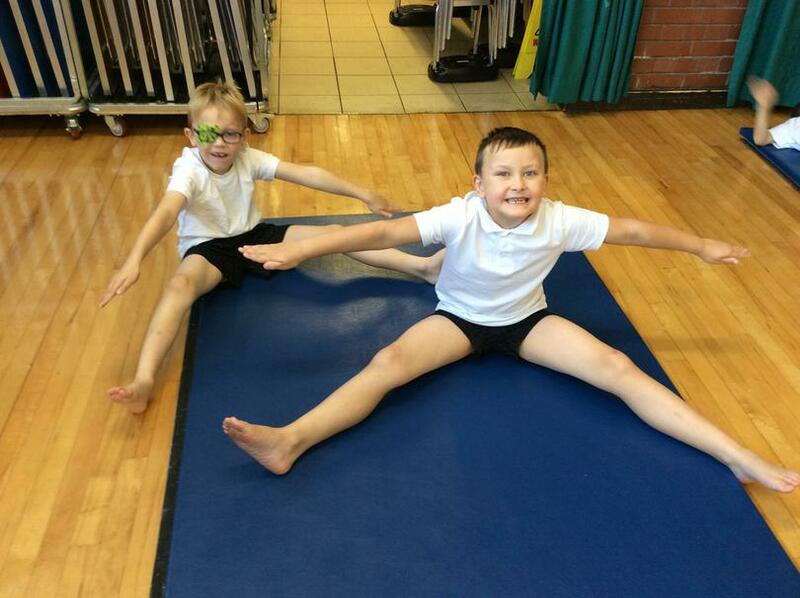 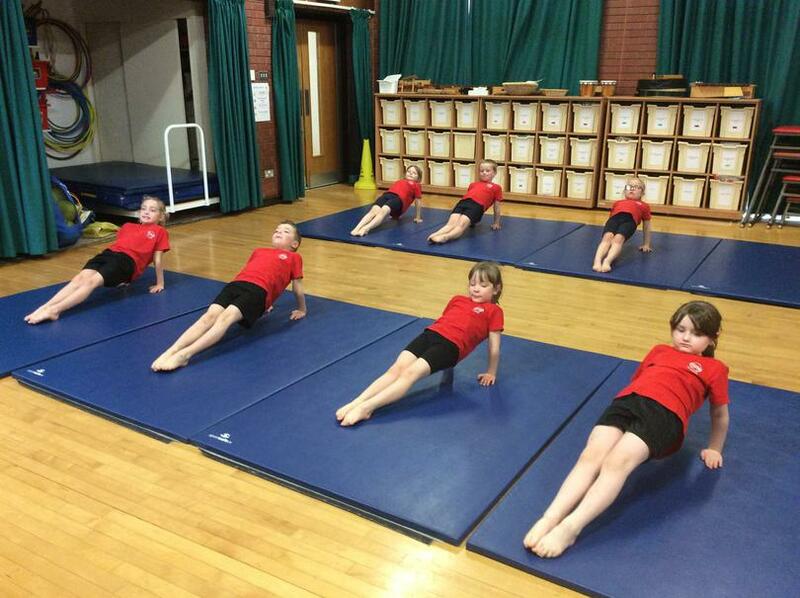 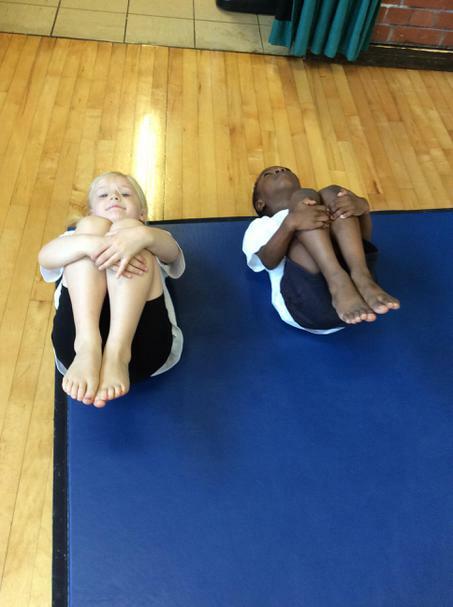 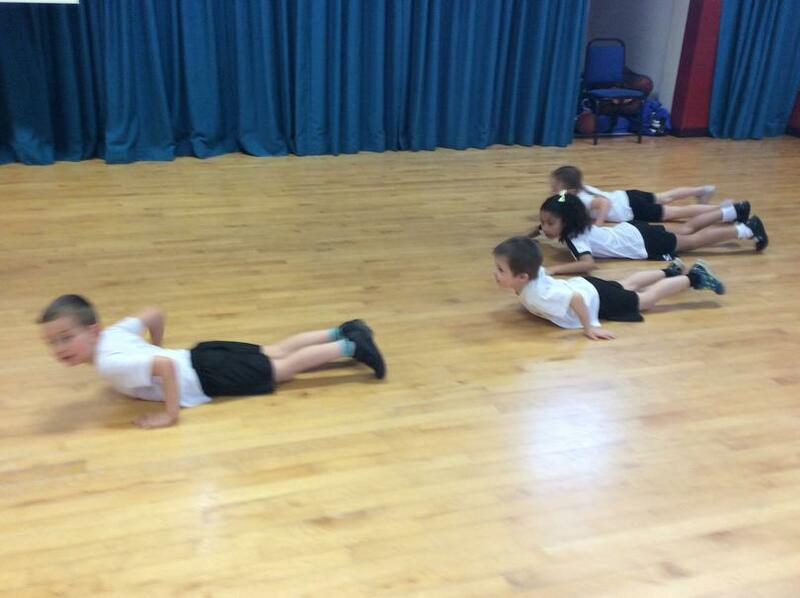 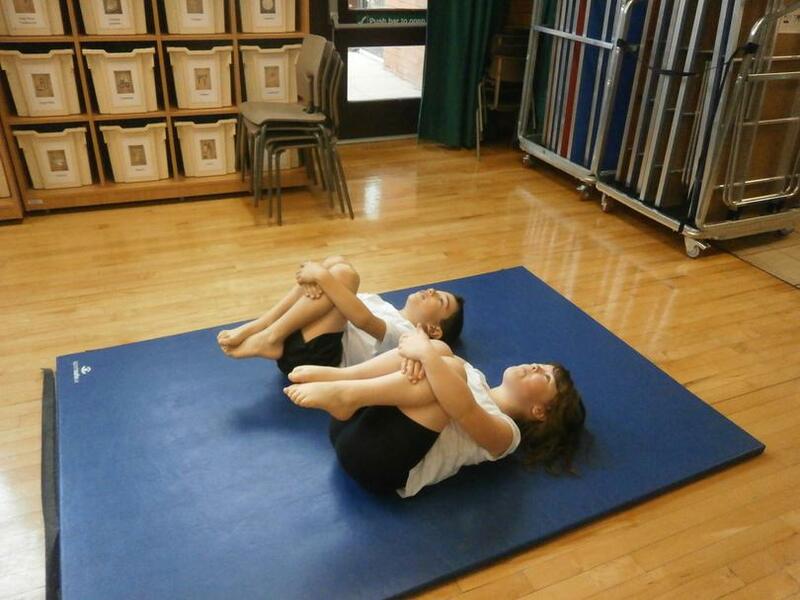 The Gym Club had worked extremely hard to learn each performance off by heart. 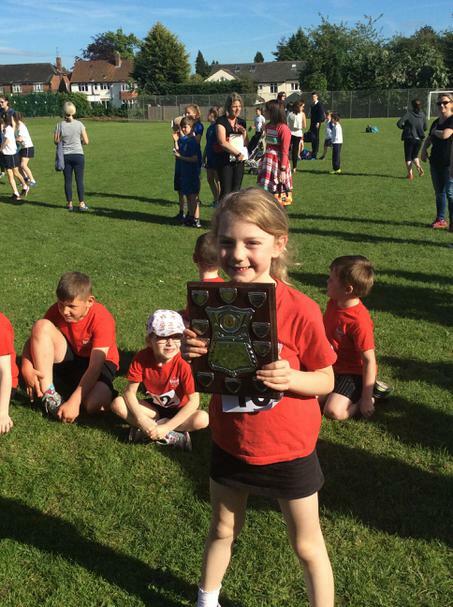 We are extremely proud of all of the children. 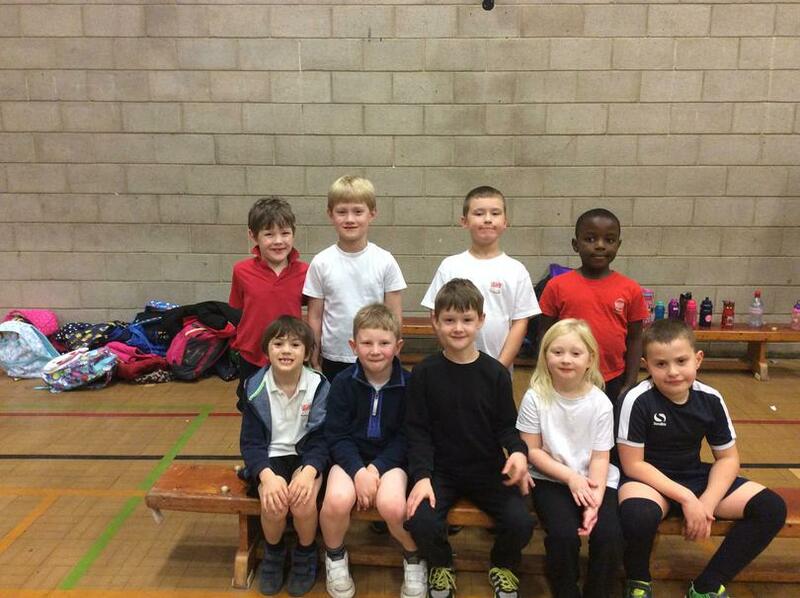 One team even got through to the Harrogate Finals. 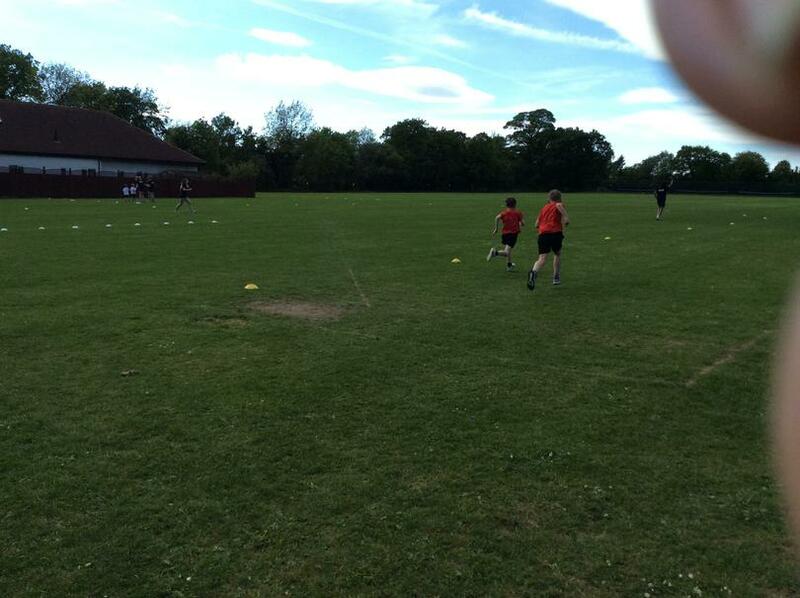 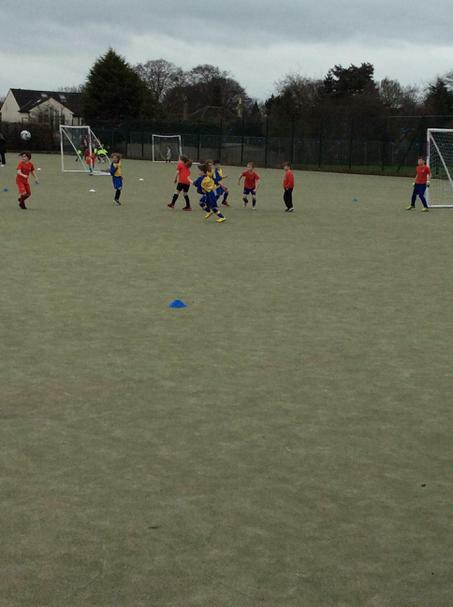 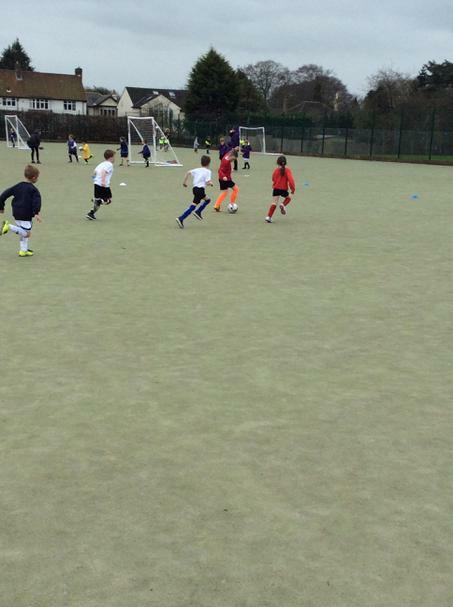 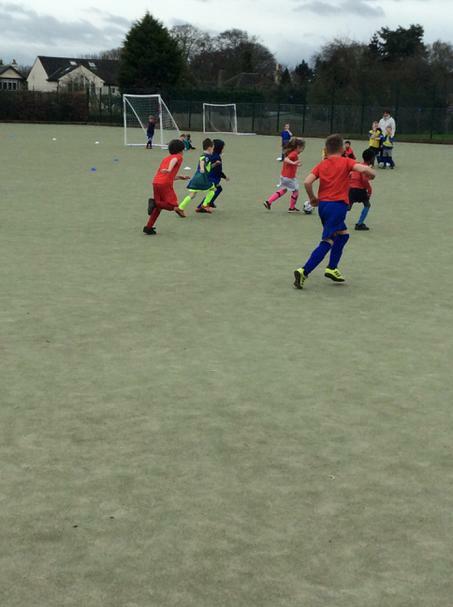 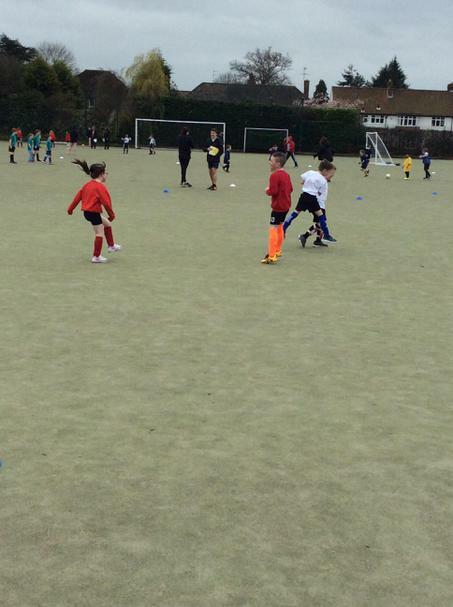 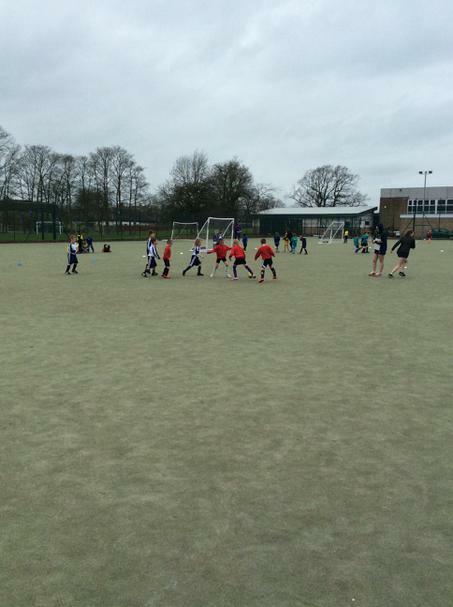 Three teams were entered into the Harrogate Schools Sports Partnership Football Competition held at St Aidans School. 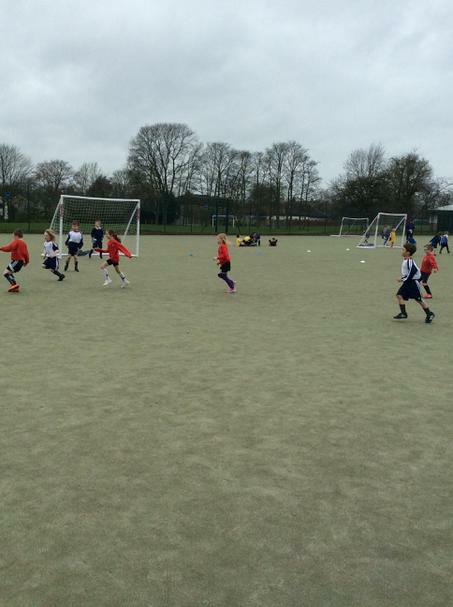 Each team took part in several games against other schools within their pool. 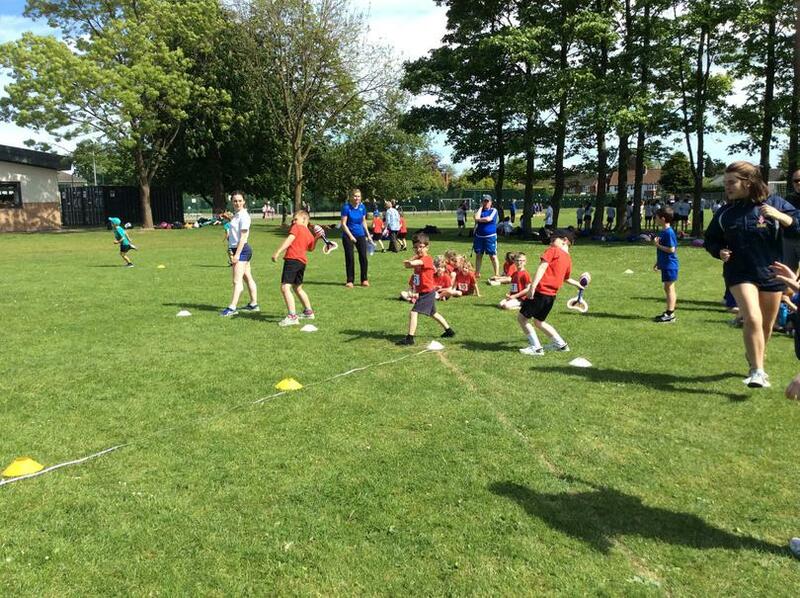 All the children had a wonderful time and worked hard as a team resulting in one of the teams finishing second in their pool. 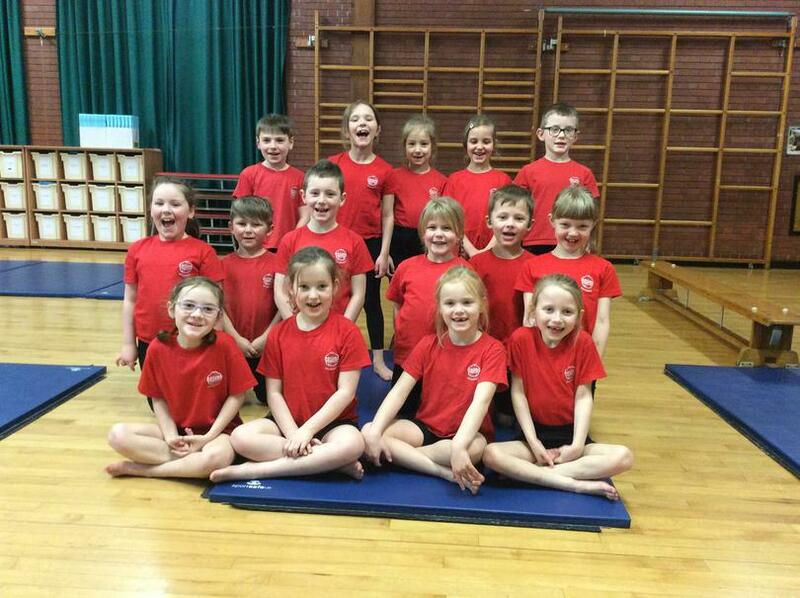 Well done children we are very proud of you all.